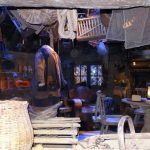 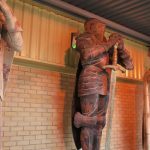 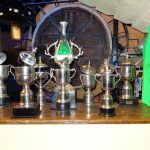 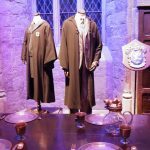 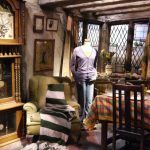 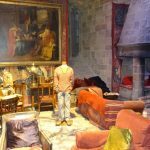 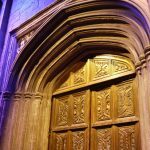 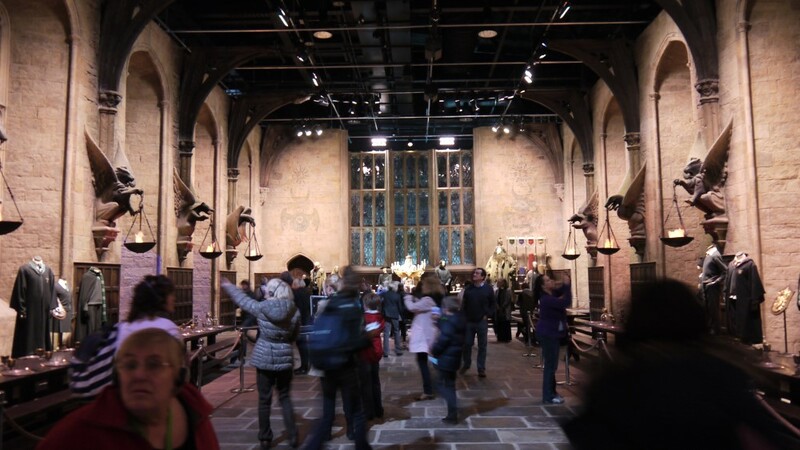 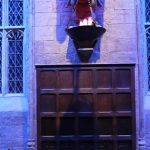 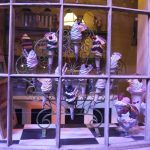 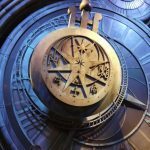 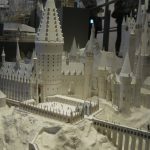 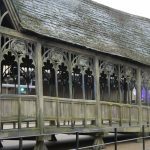 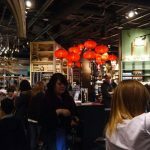 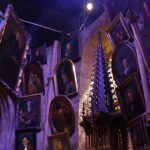 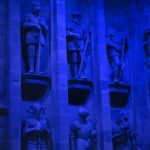 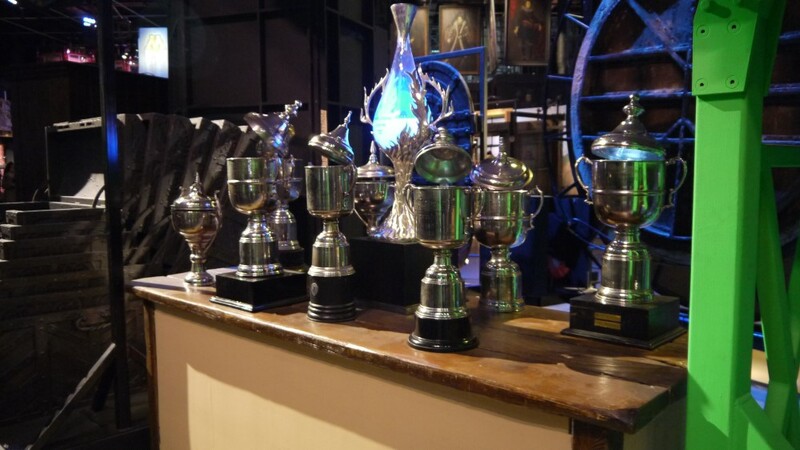 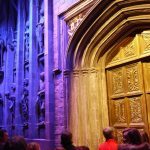 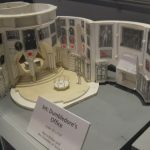 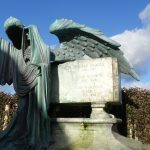 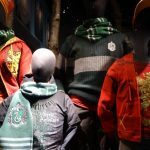 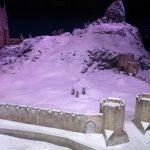 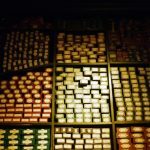 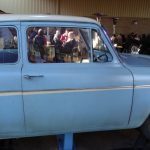 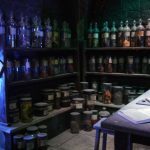 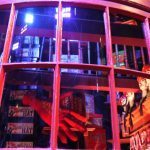 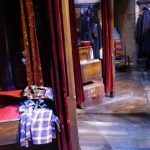 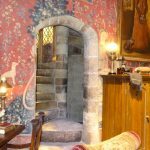 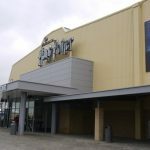 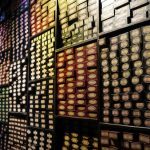 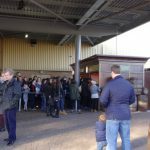 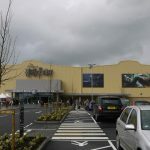 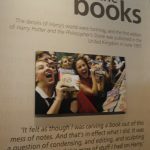 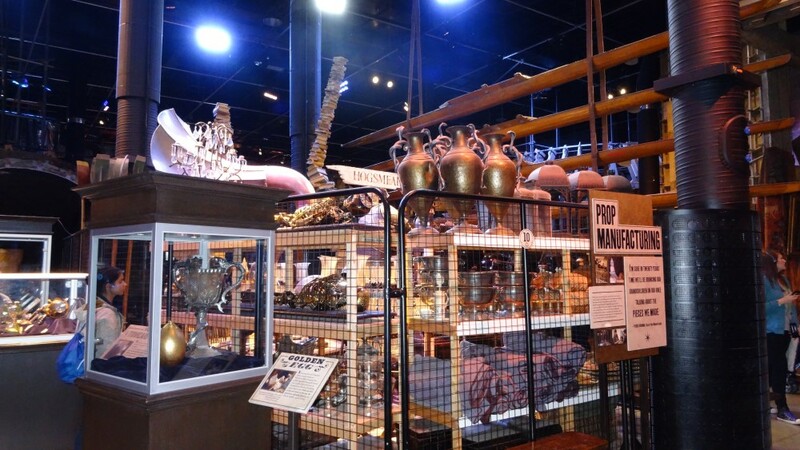 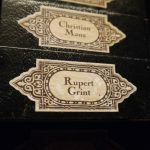 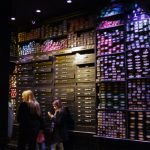 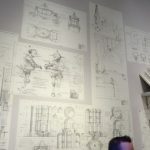 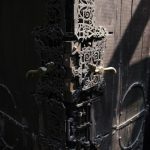 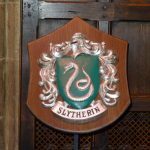 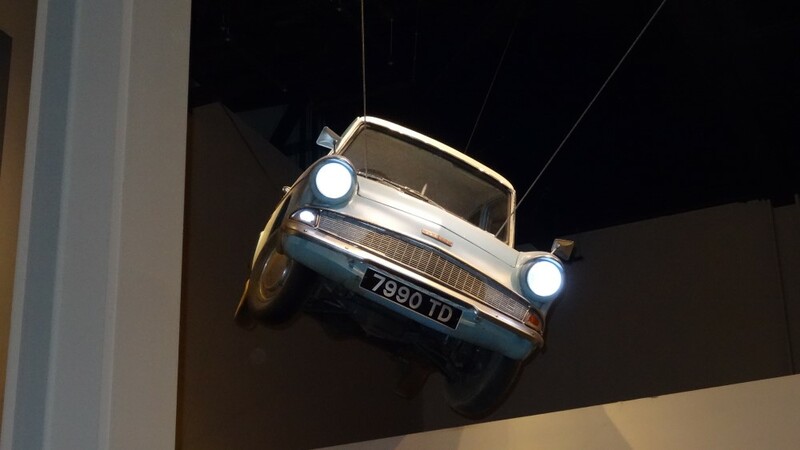 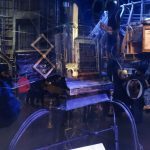 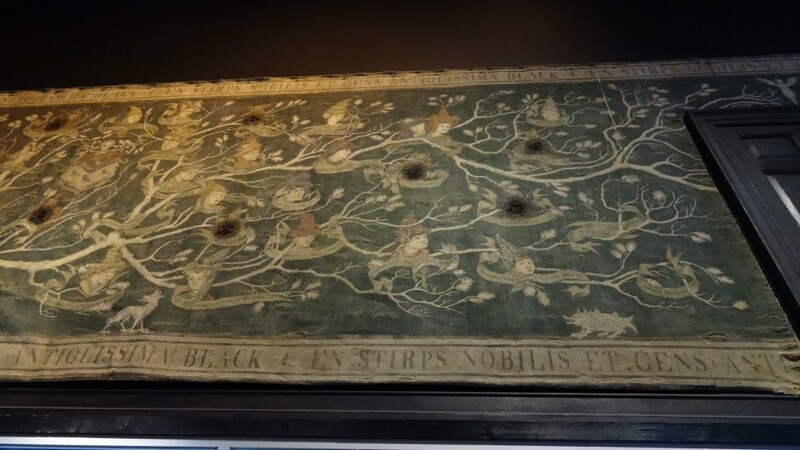 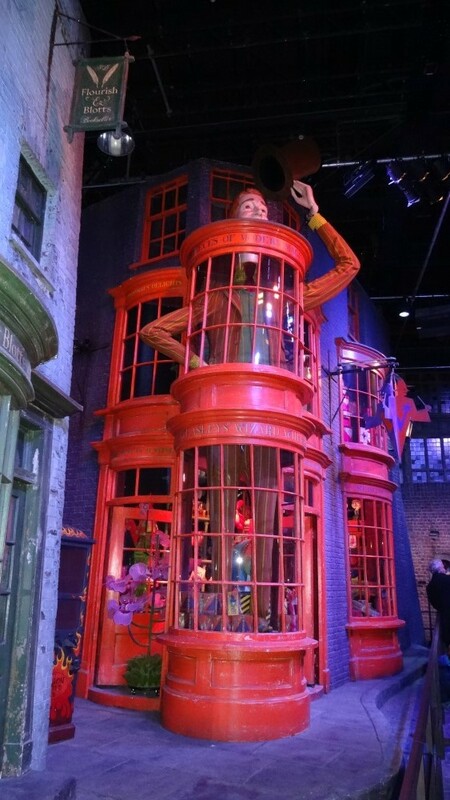 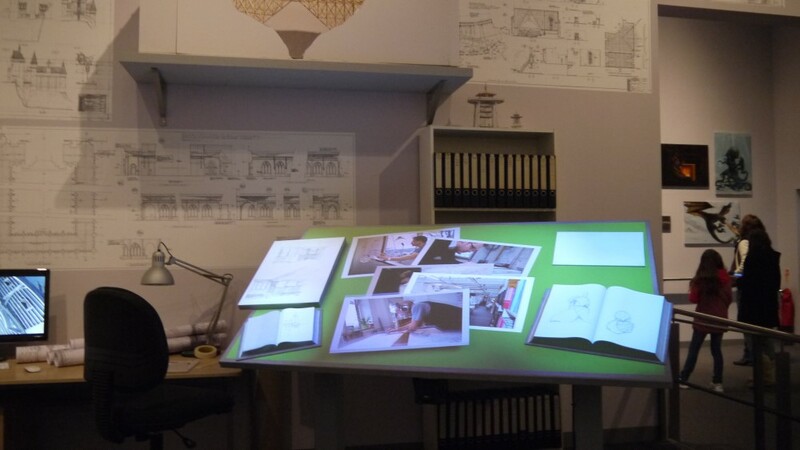 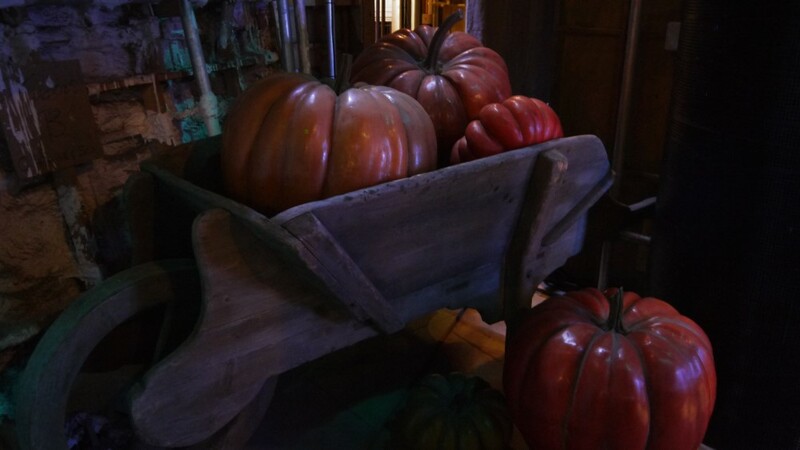 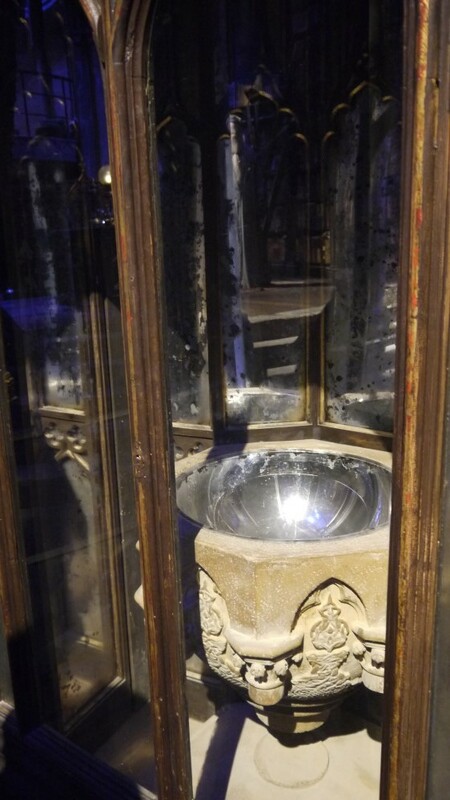 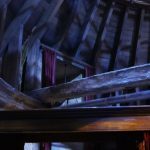 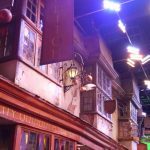 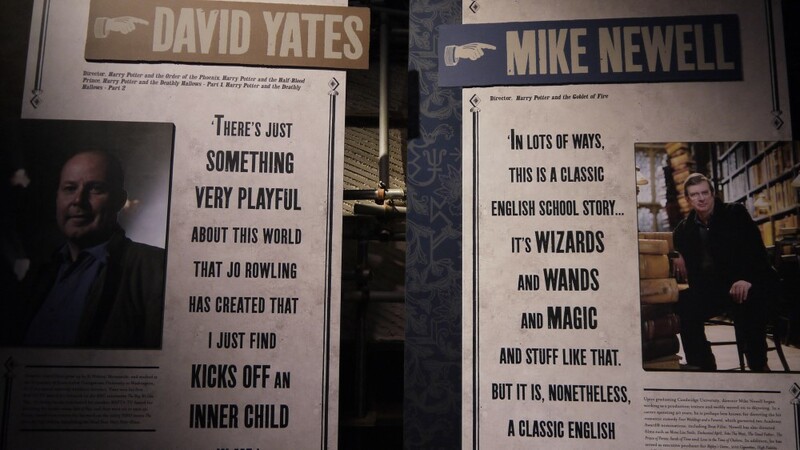 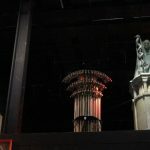 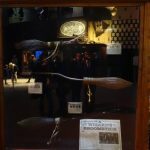 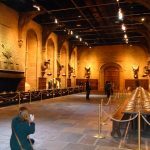 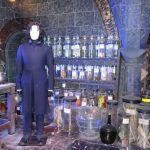 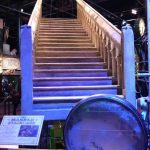 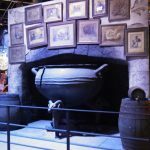 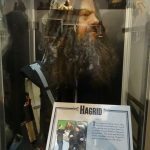 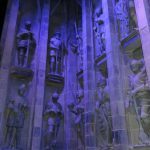 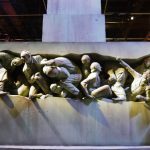 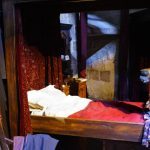 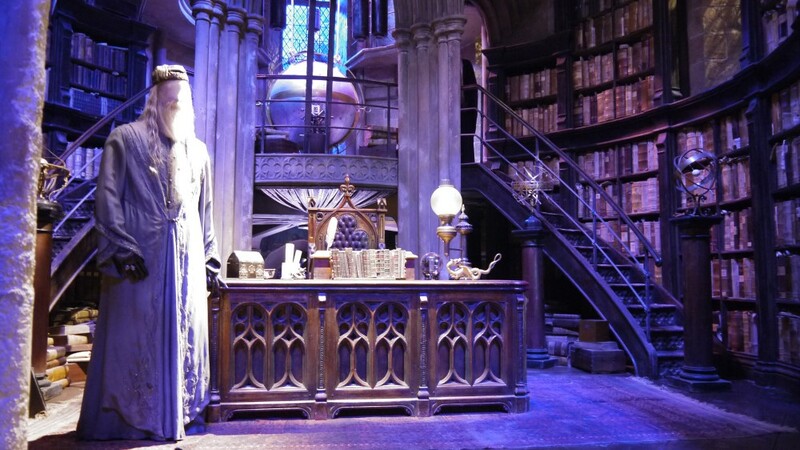 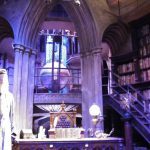 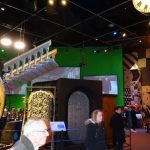 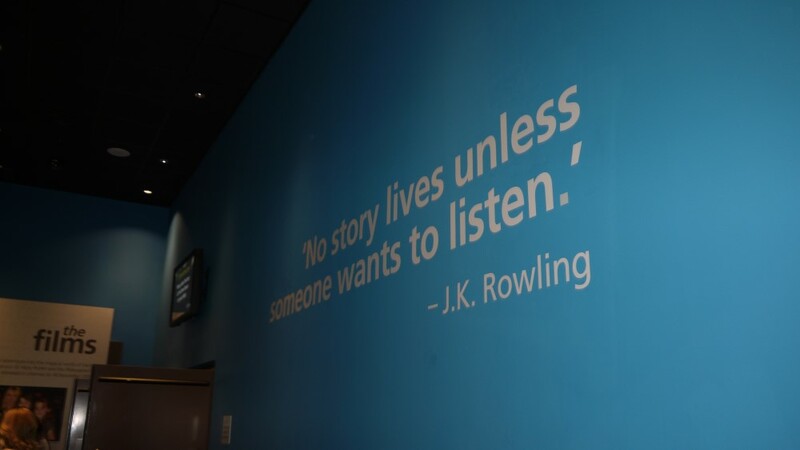 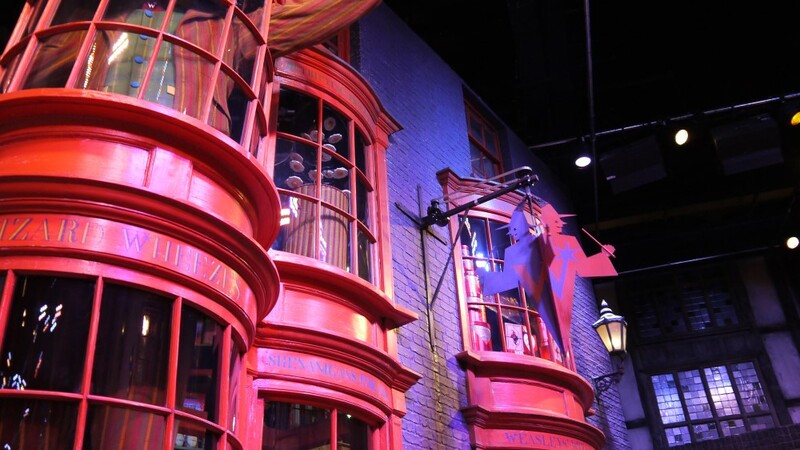 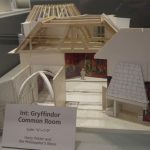 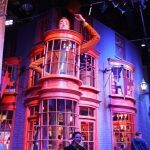 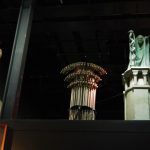 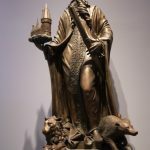 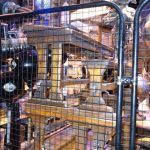 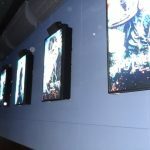 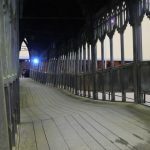 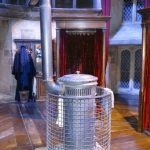 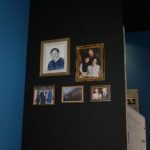 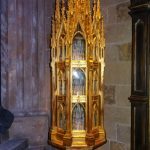 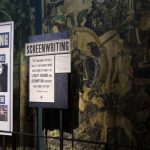 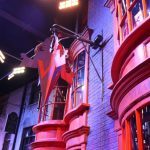 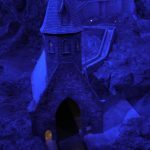 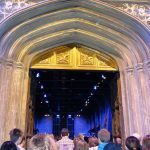 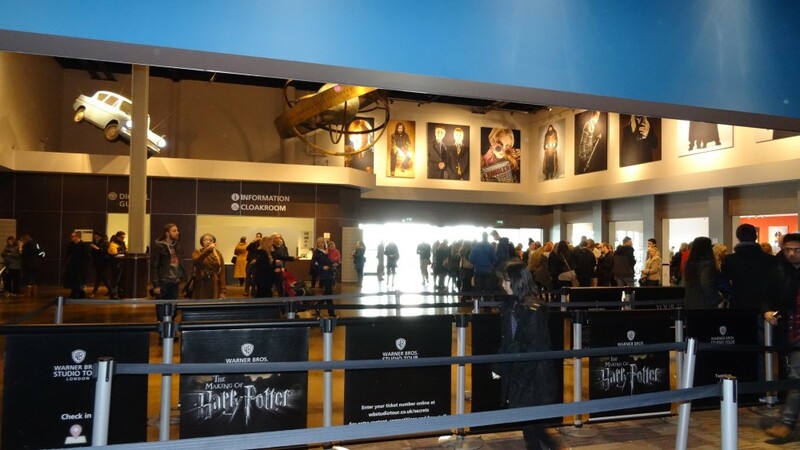 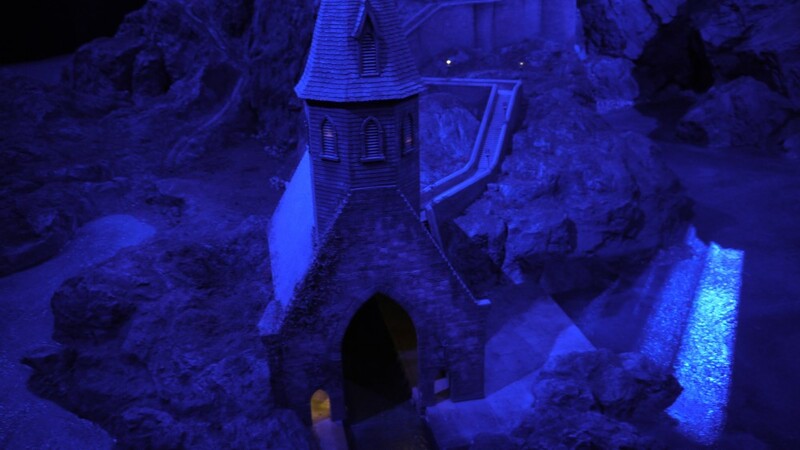 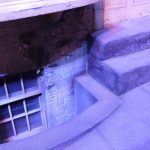 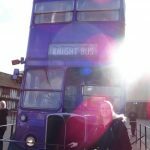 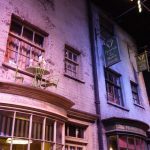 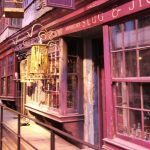 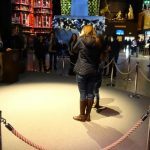 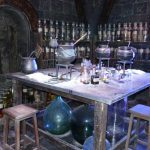 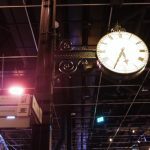 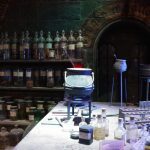 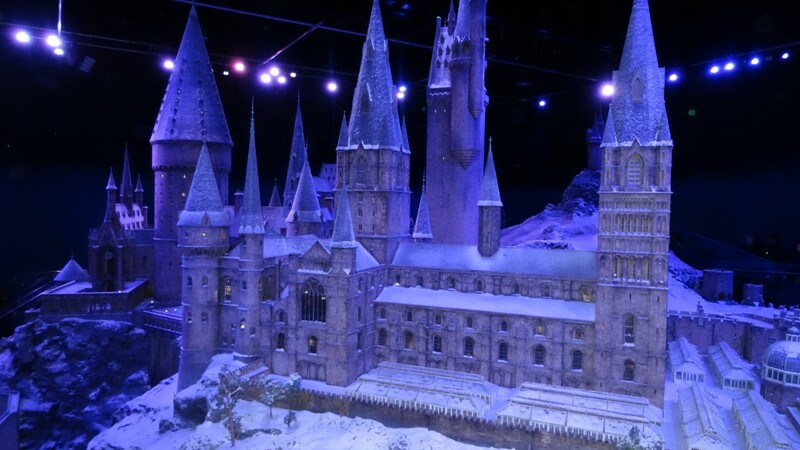 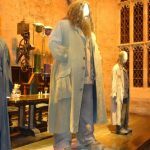 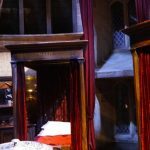 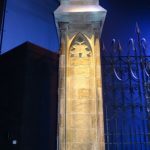 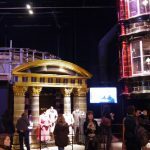 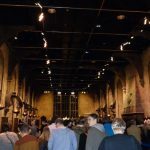 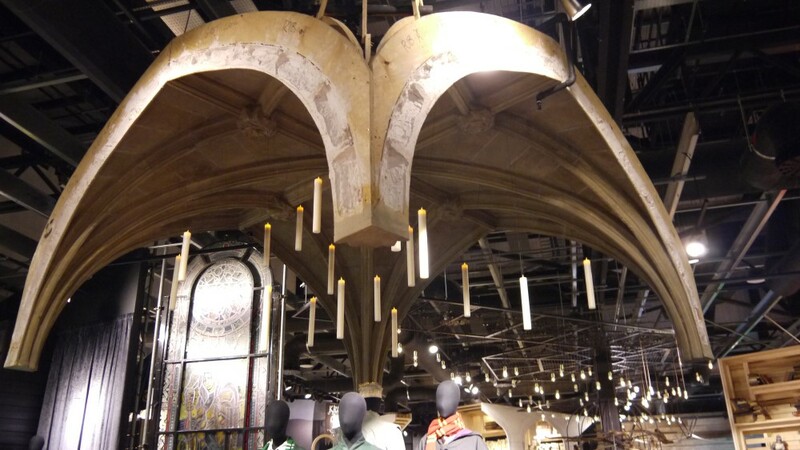 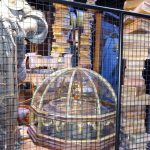 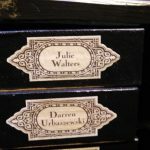 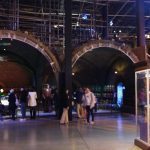 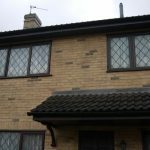 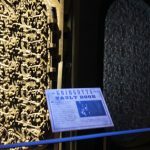 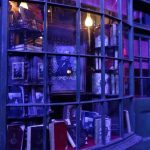 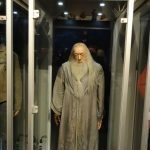 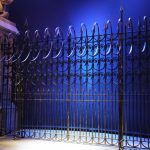 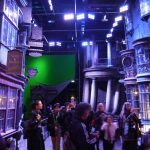 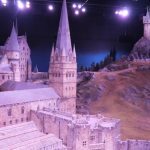 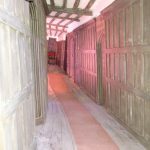 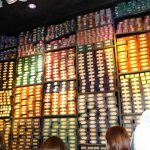 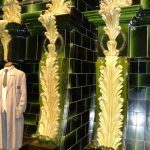 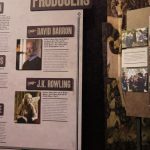 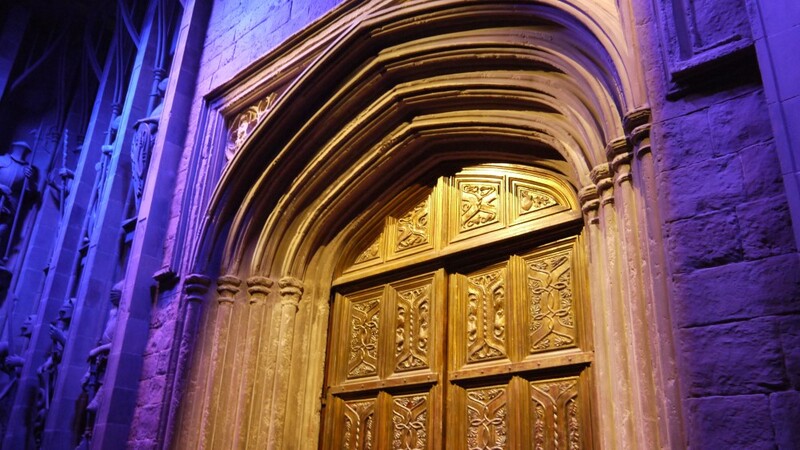 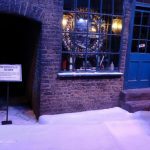 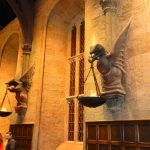 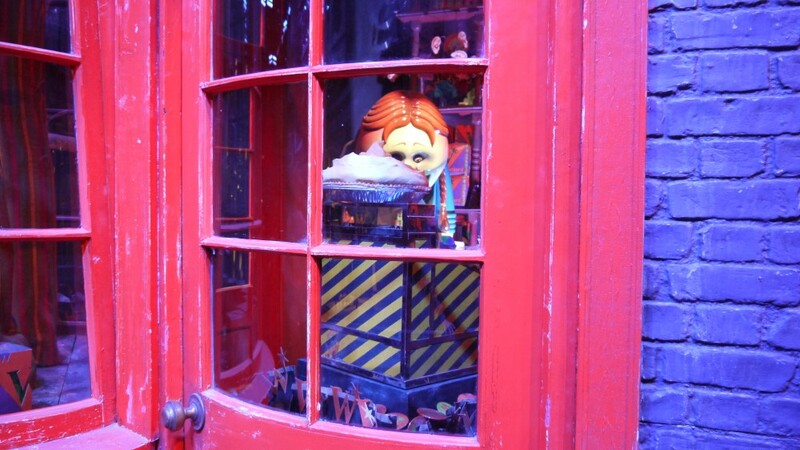 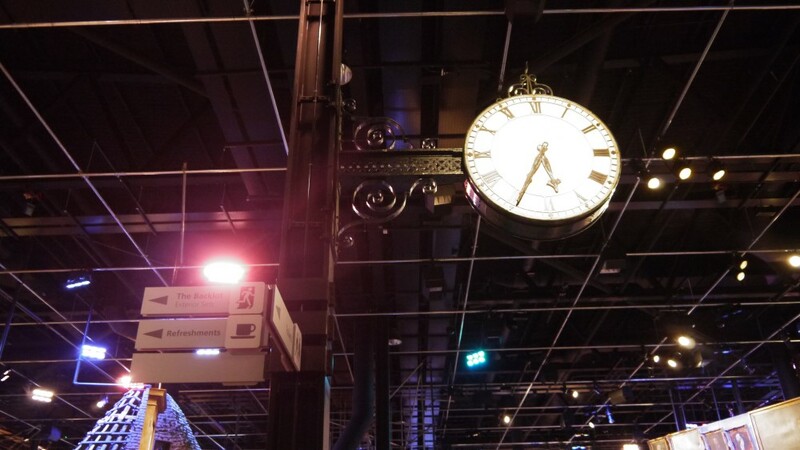 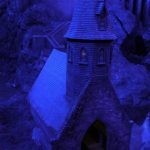 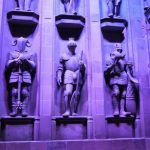 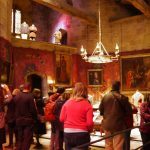 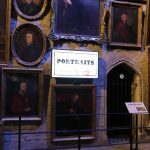 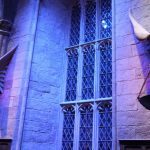 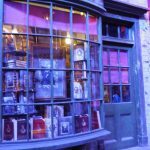 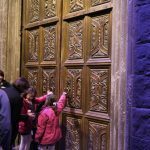 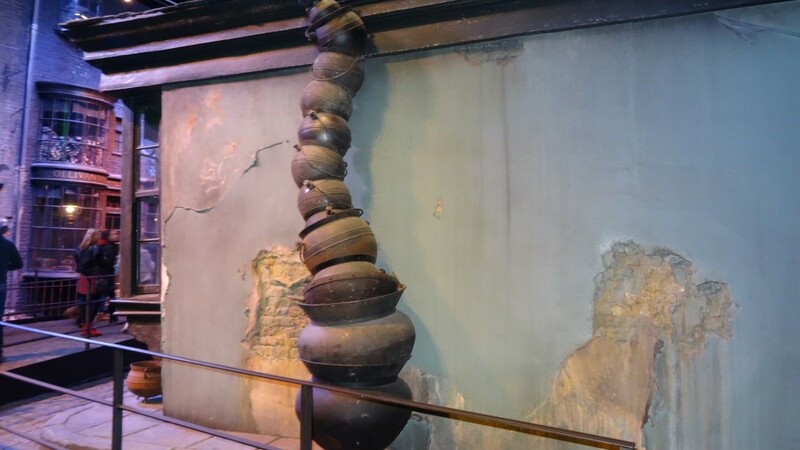 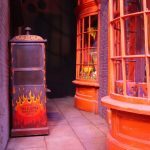 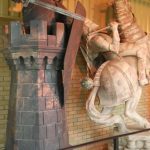 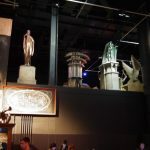 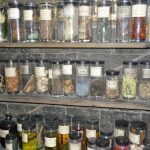 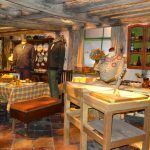 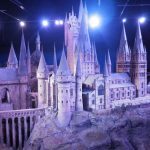 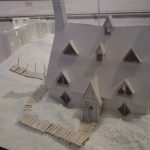 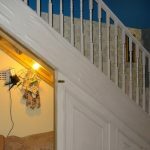 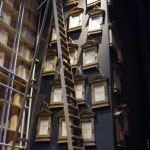 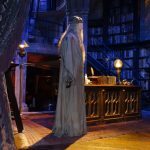 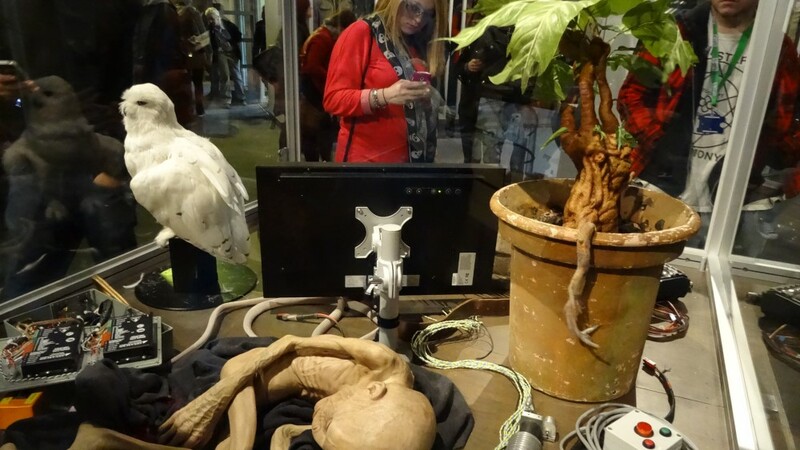 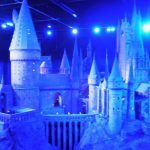 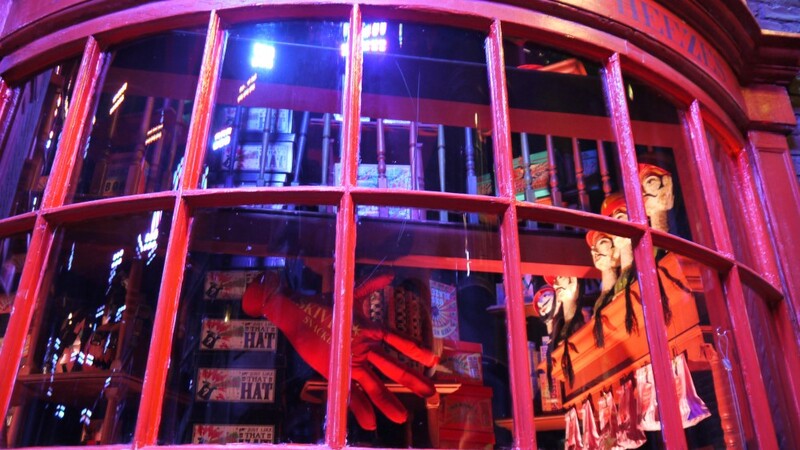 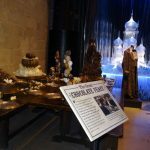 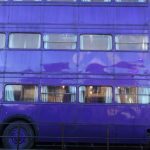 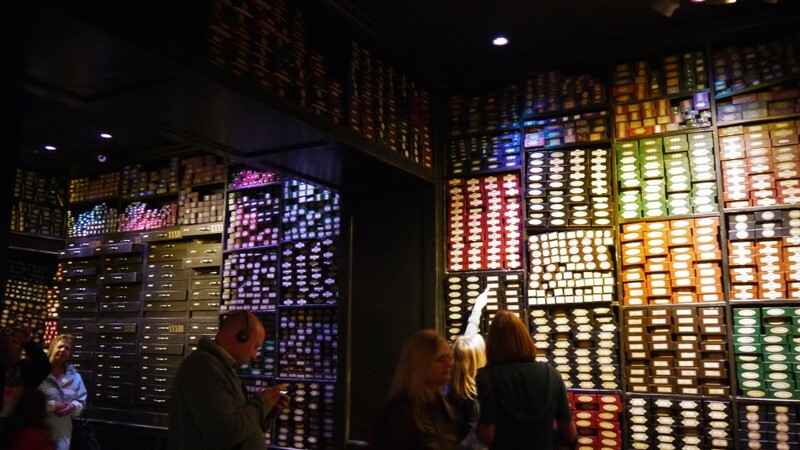 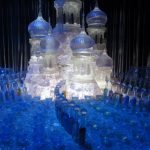 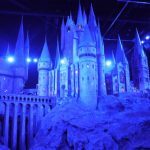 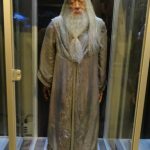 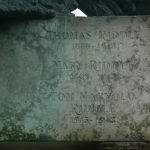 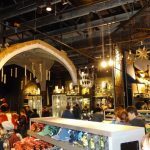 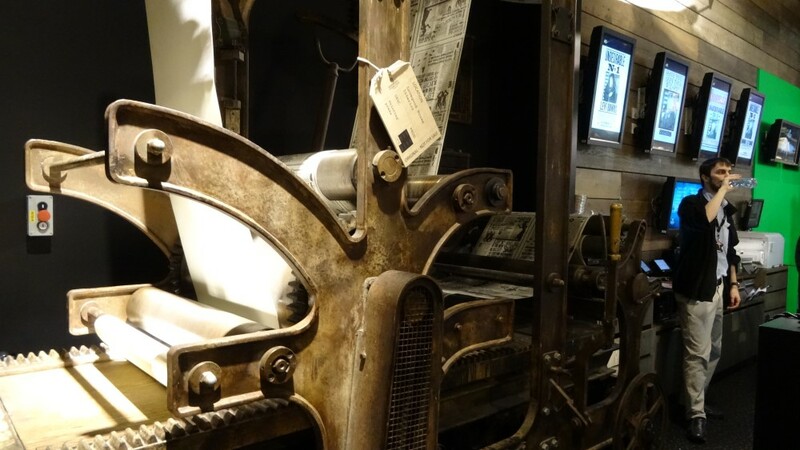 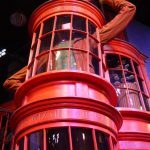 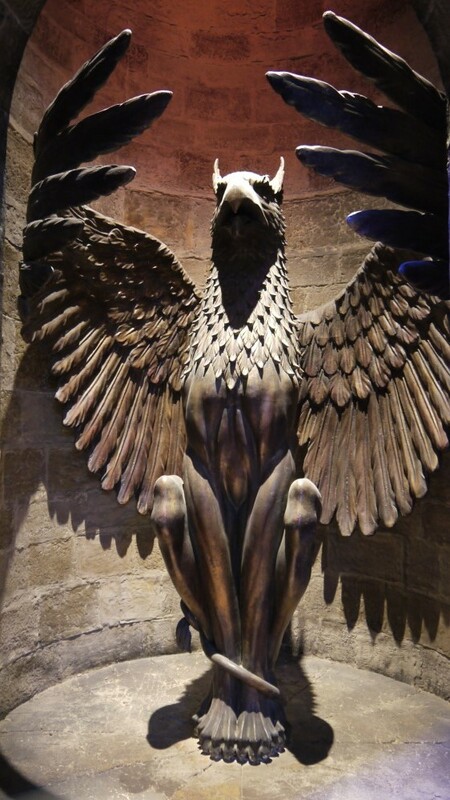 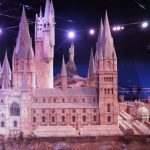 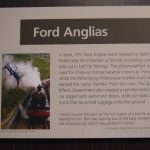 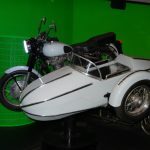 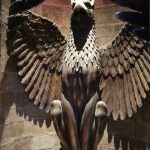 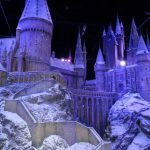 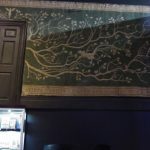 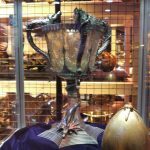 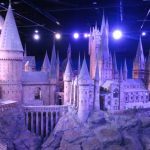 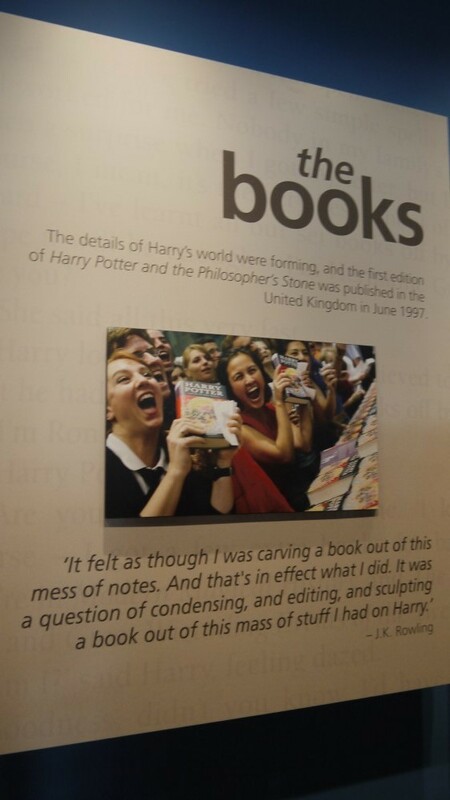 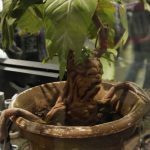 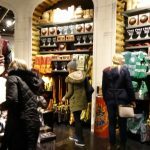 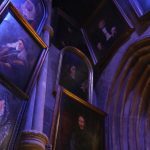 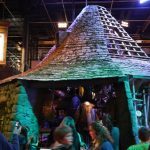 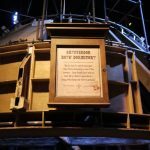 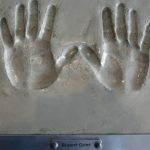 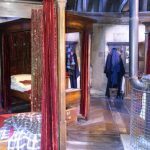 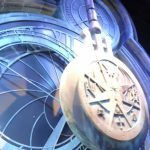 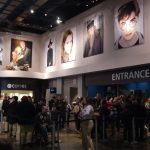 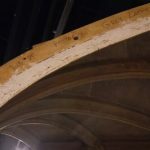 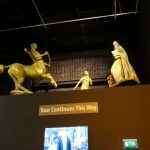 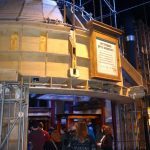 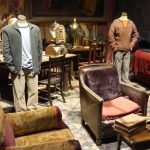 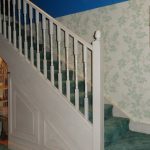 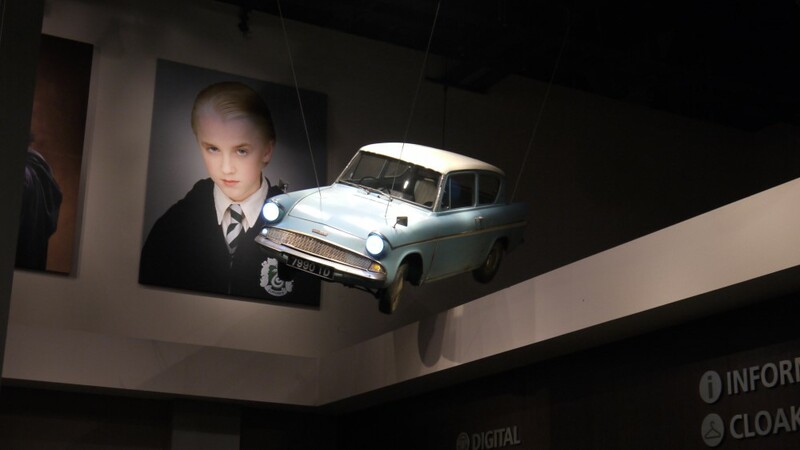 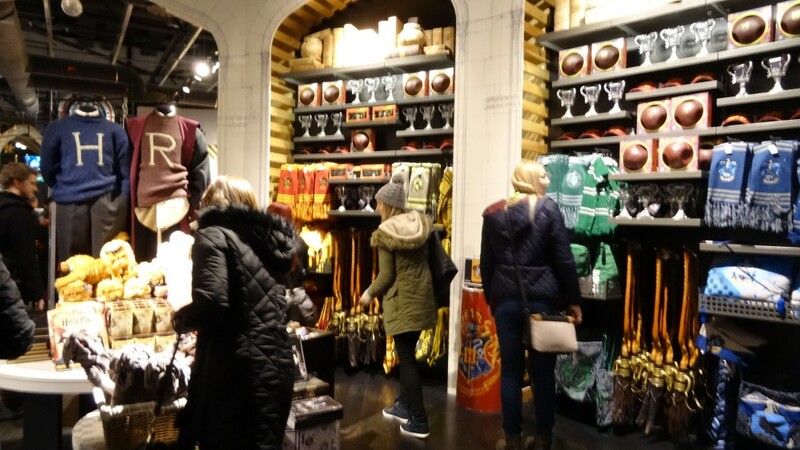 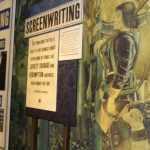 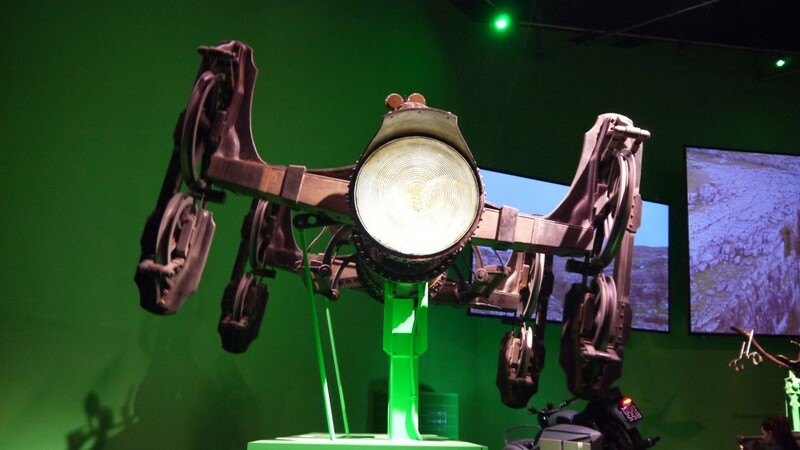 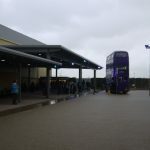 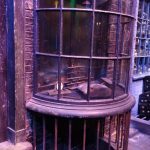 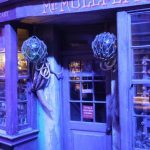 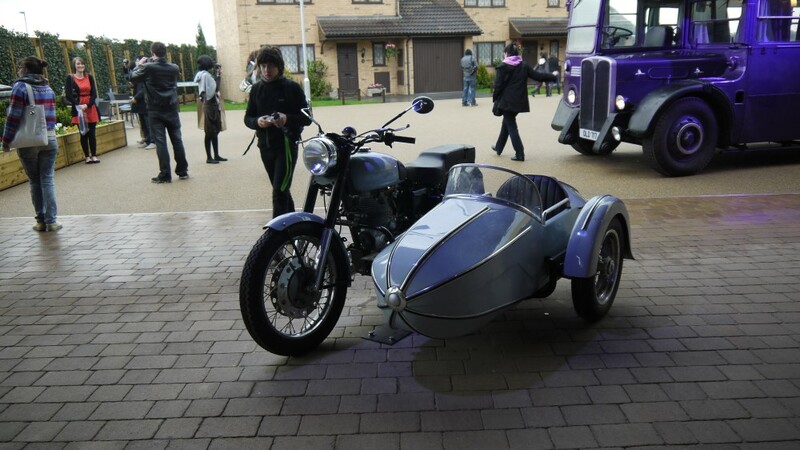 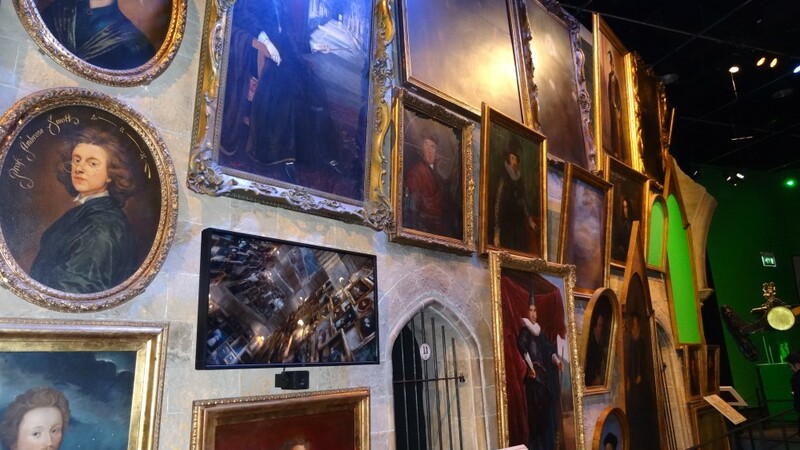 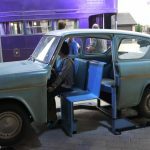 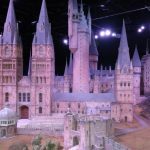 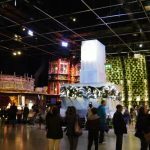 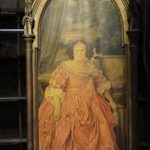 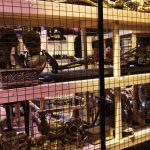 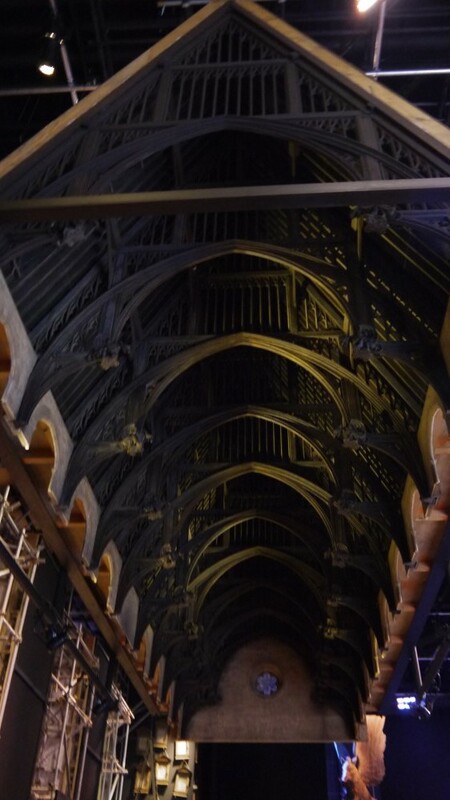 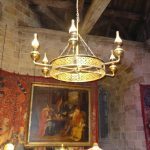 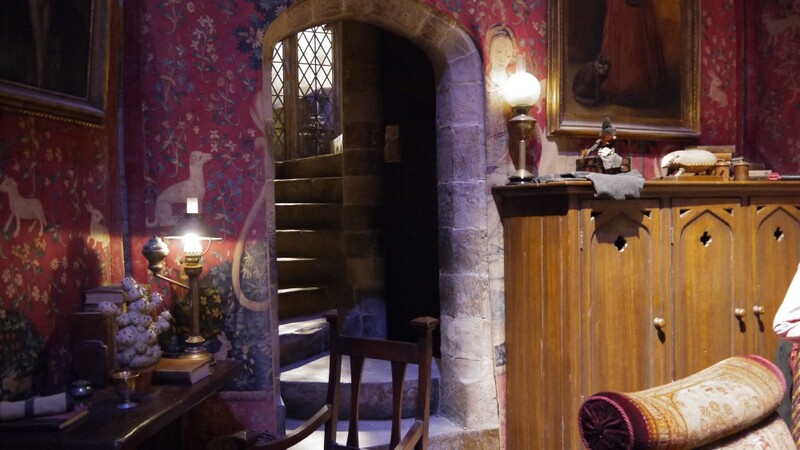 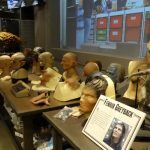 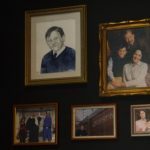 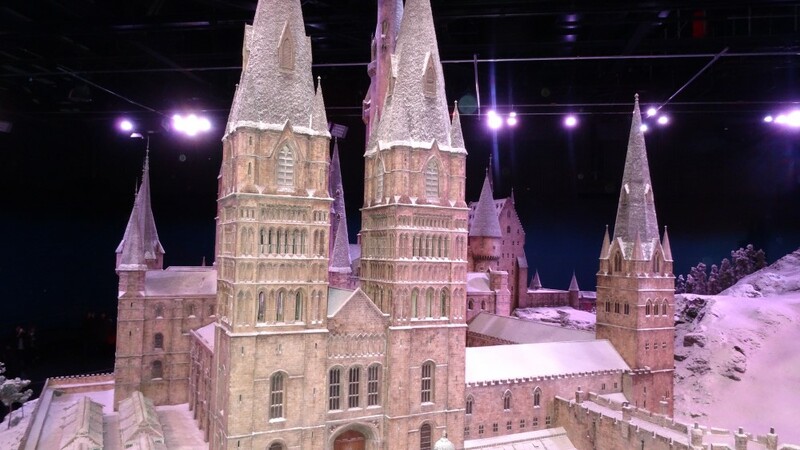 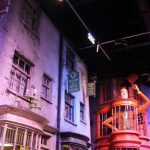 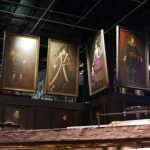 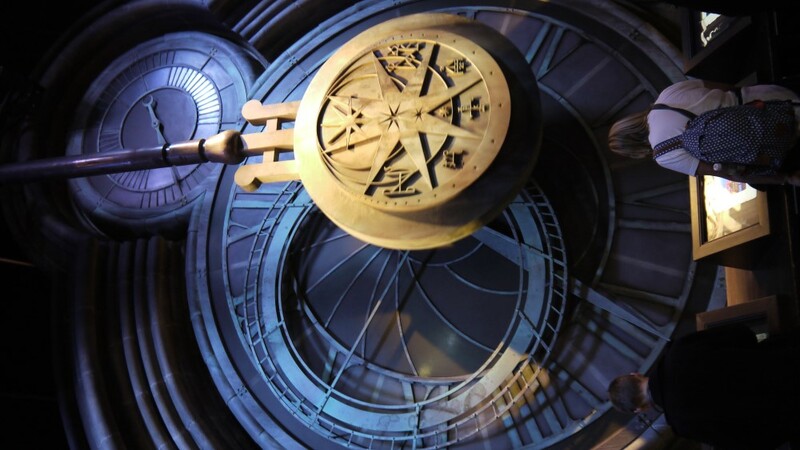 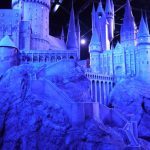 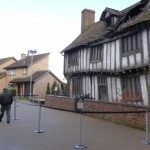 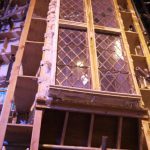 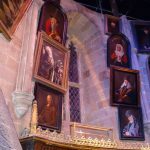 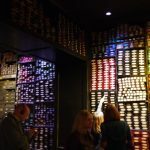 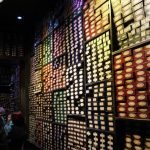 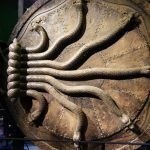 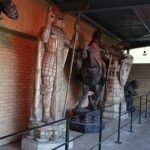 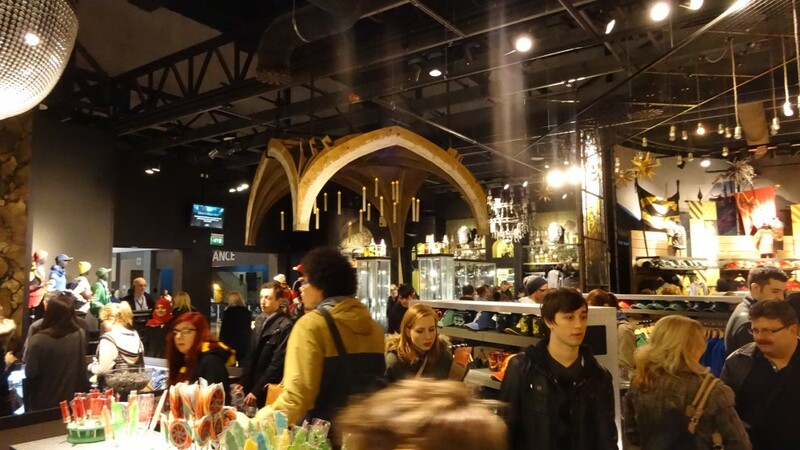 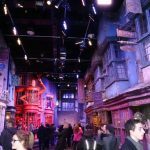 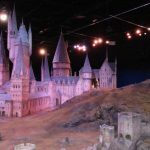 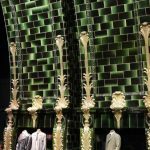 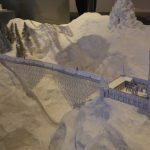 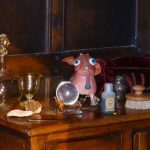 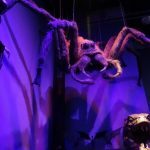 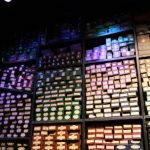 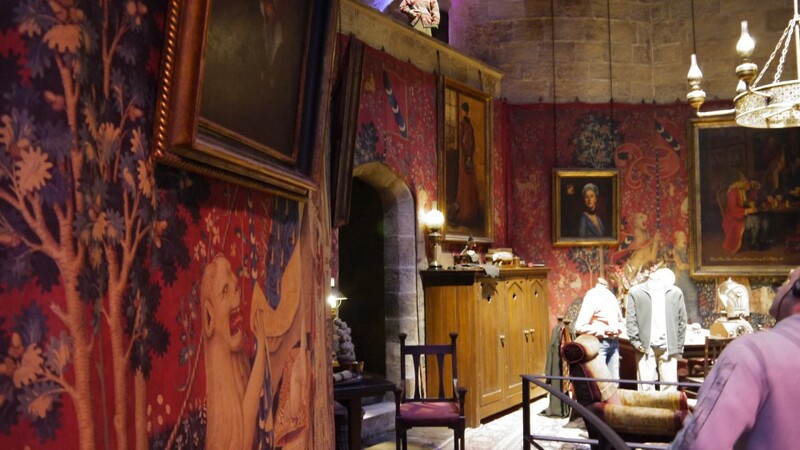 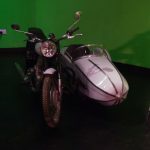 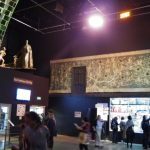 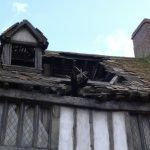 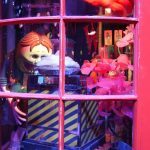 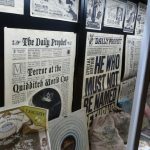 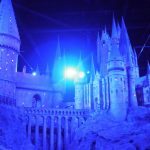 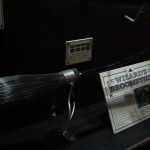 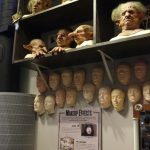 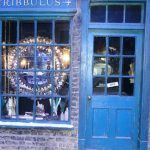 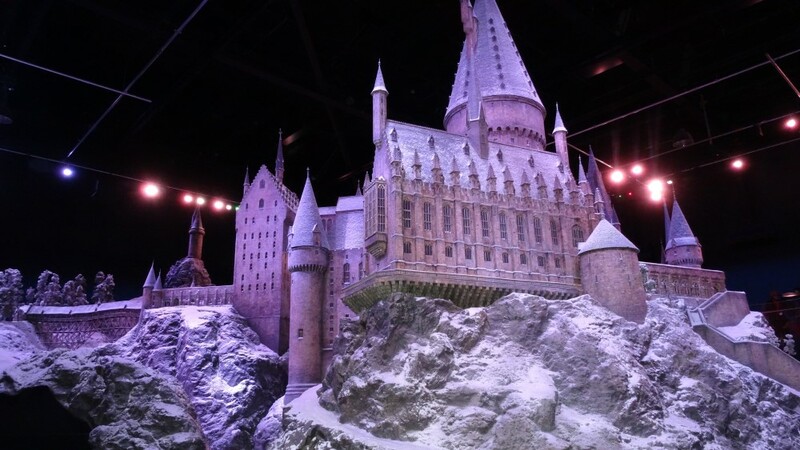 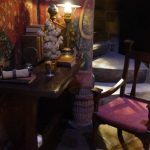 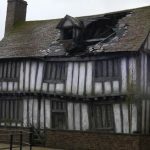 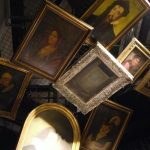 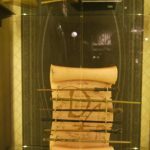 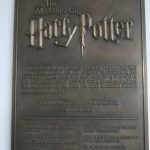 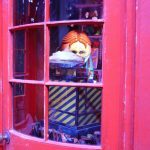 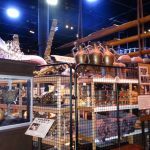 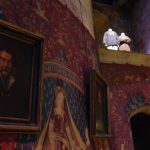 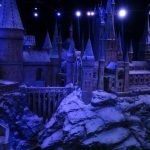 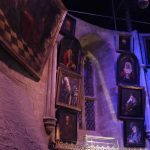 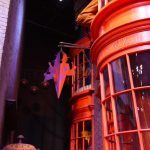 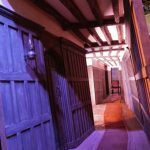 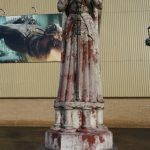 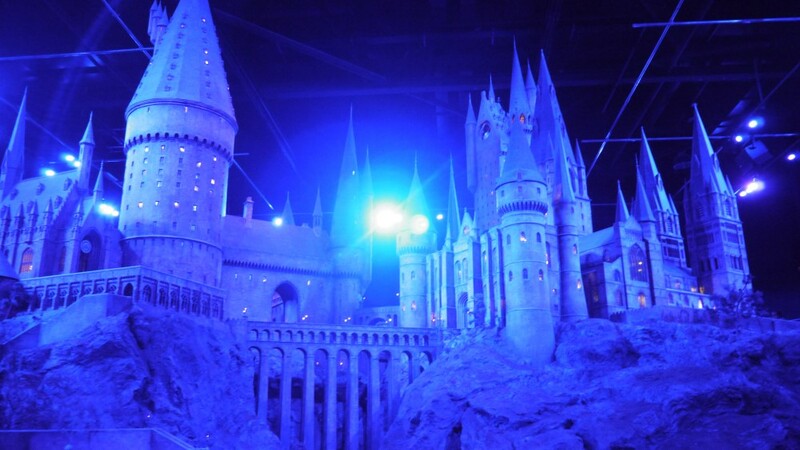 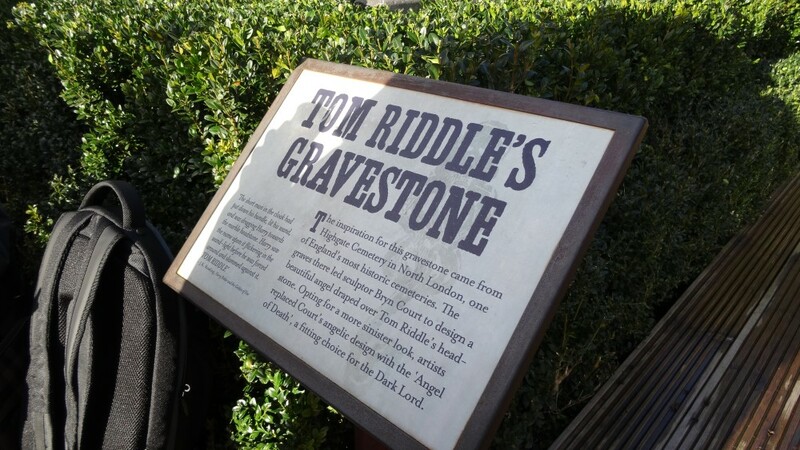 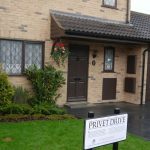 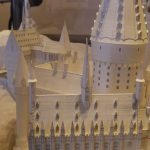 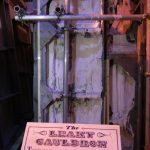 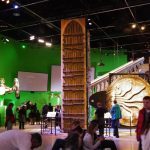 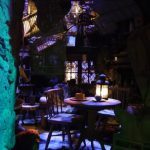 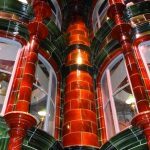 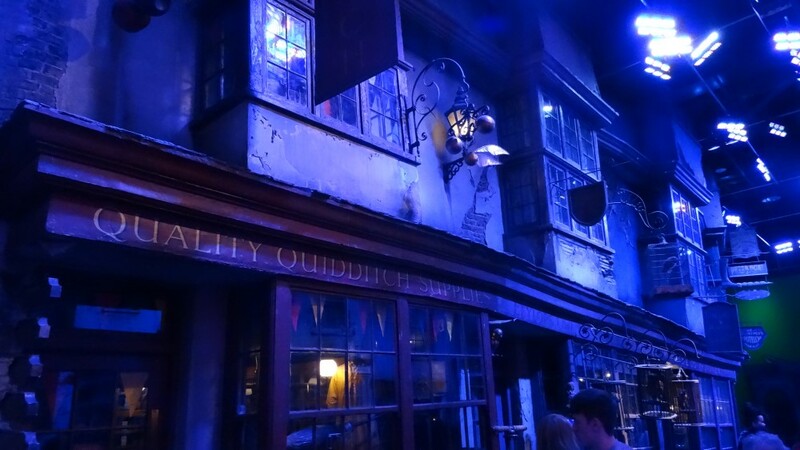 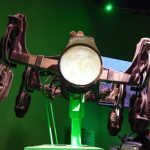 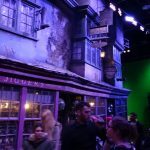 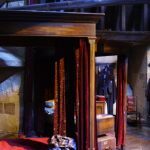 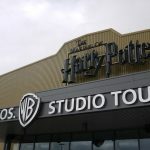 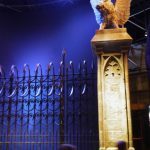 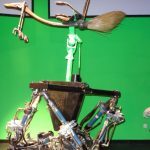 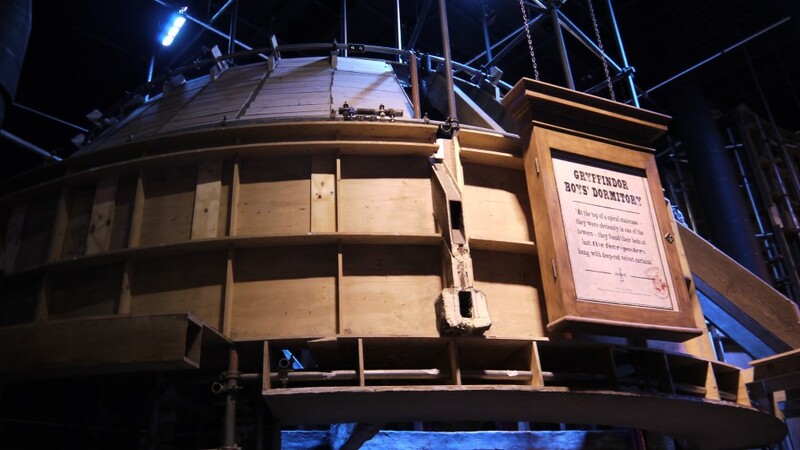 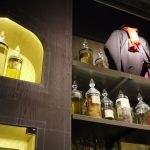 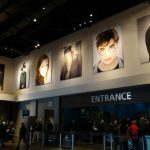 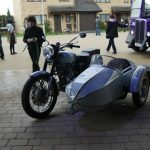 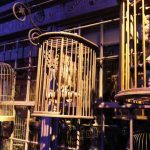 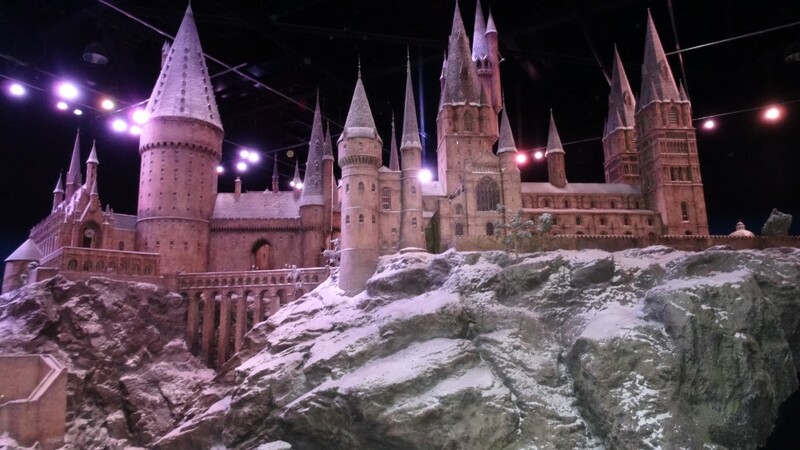 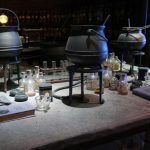 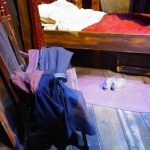 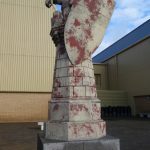 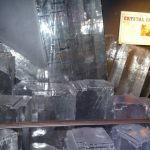 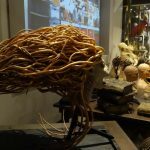 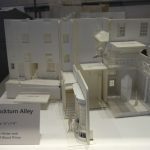 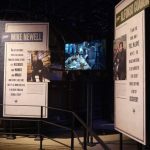 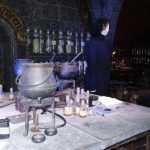 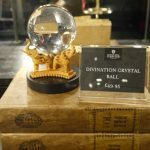 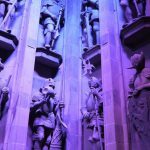 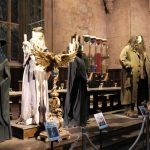 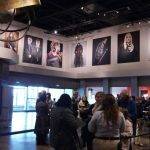 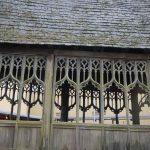 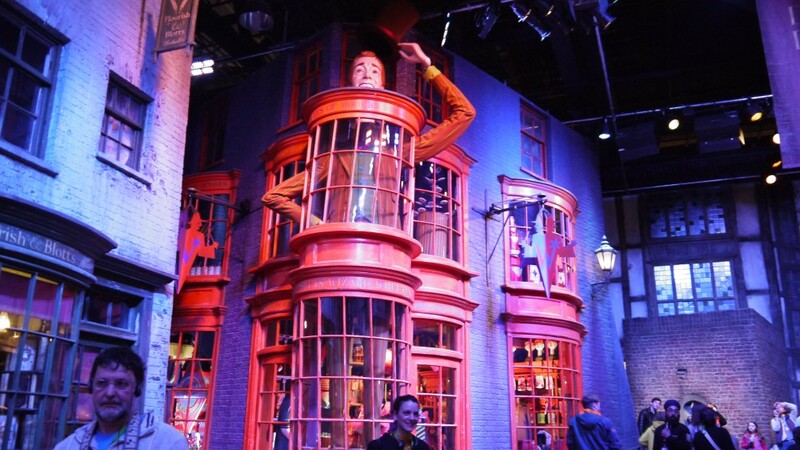 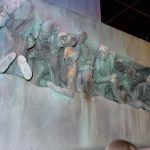 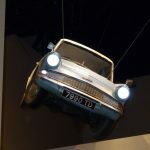 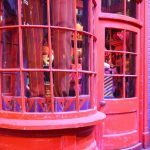 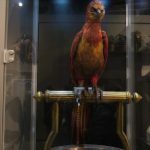 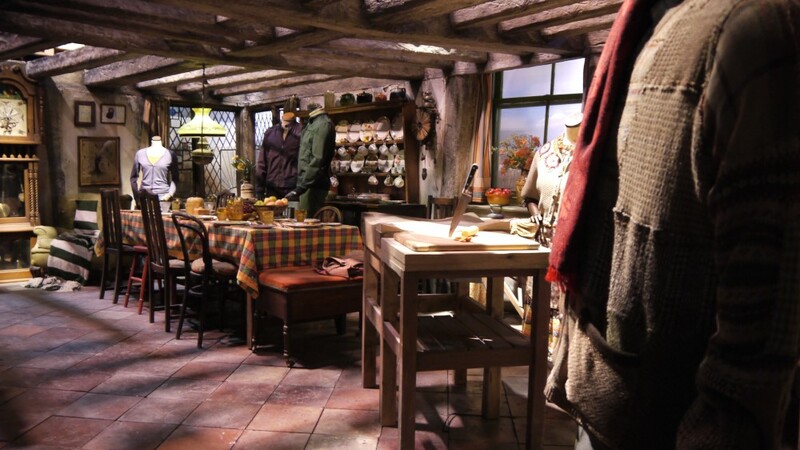 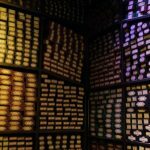 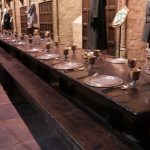 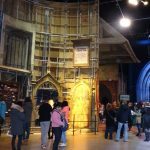 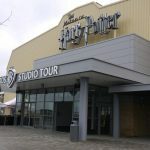 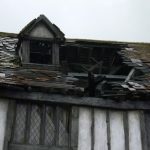 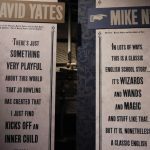 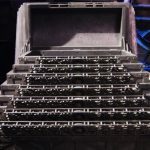 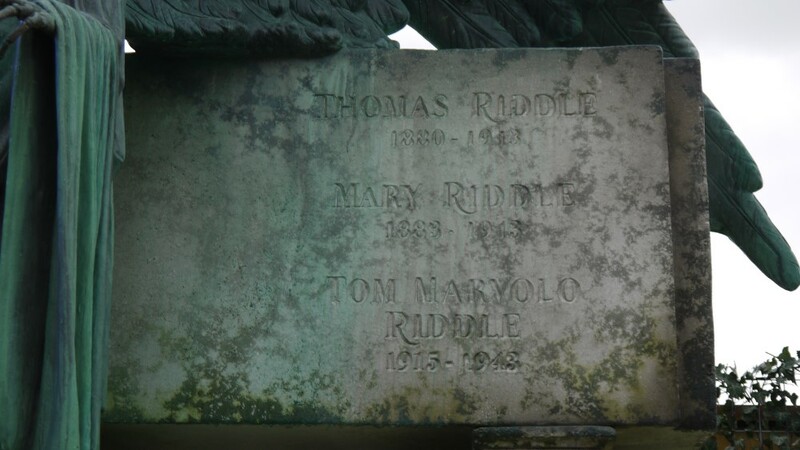 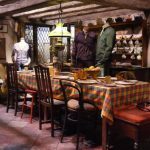 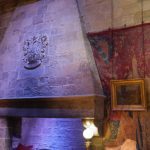 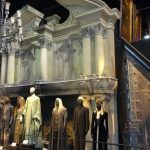 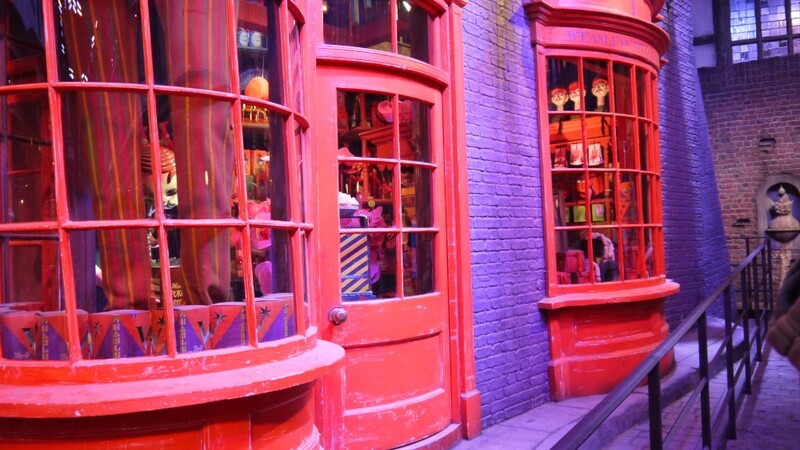 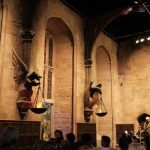 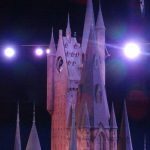 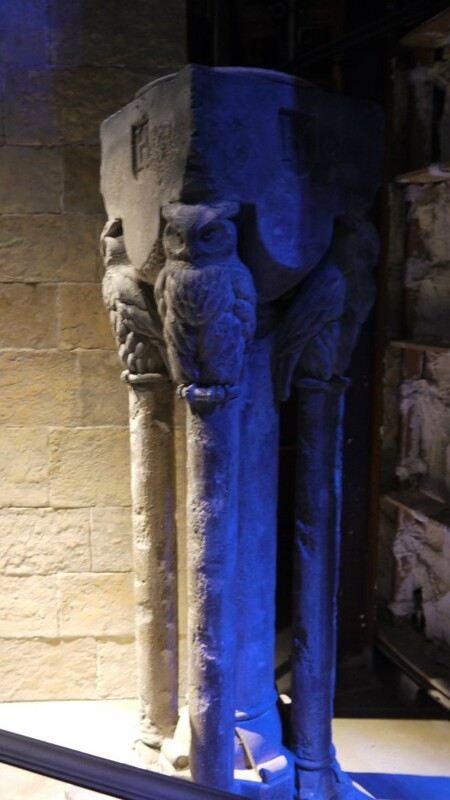 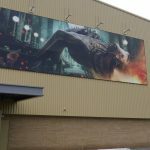 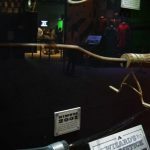 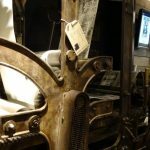 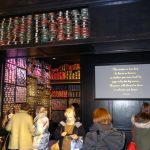 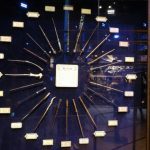 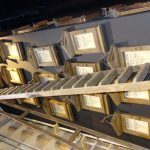 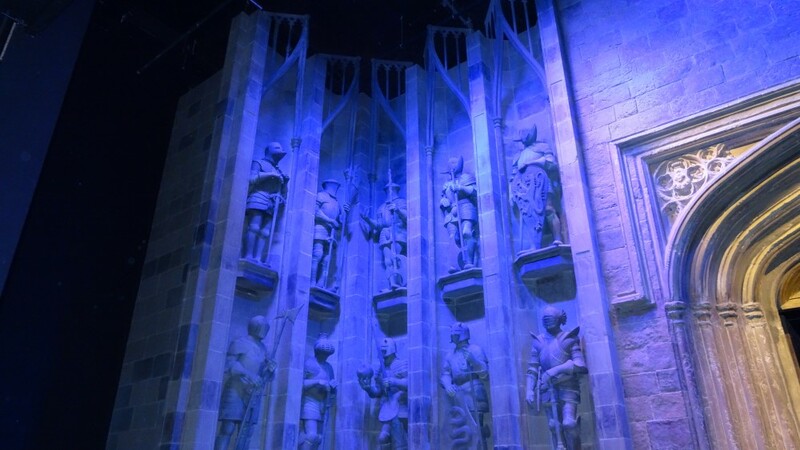 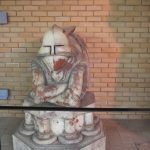 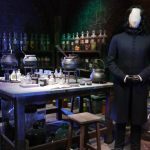 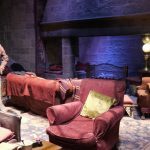 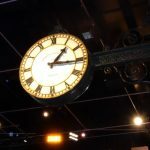 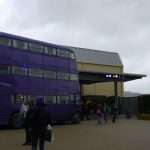 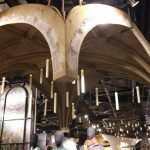 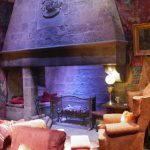 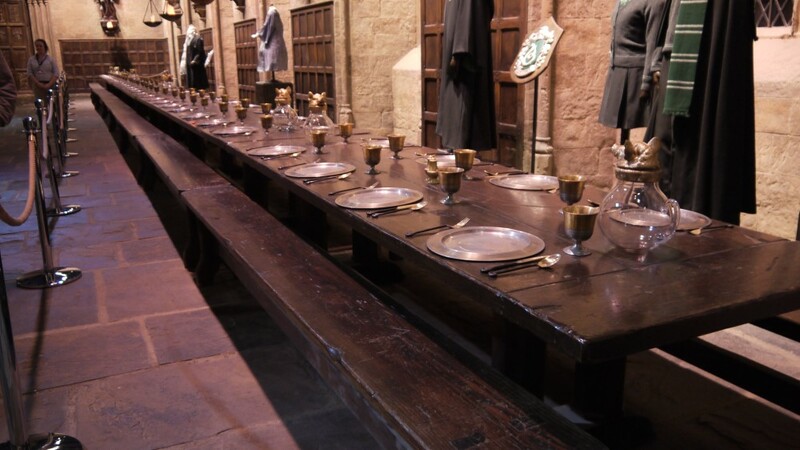 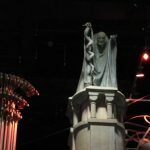 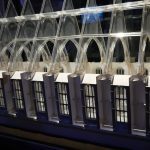 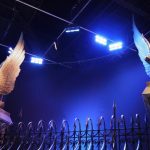 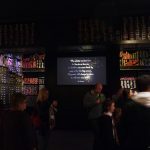 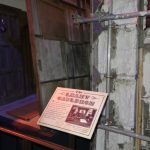 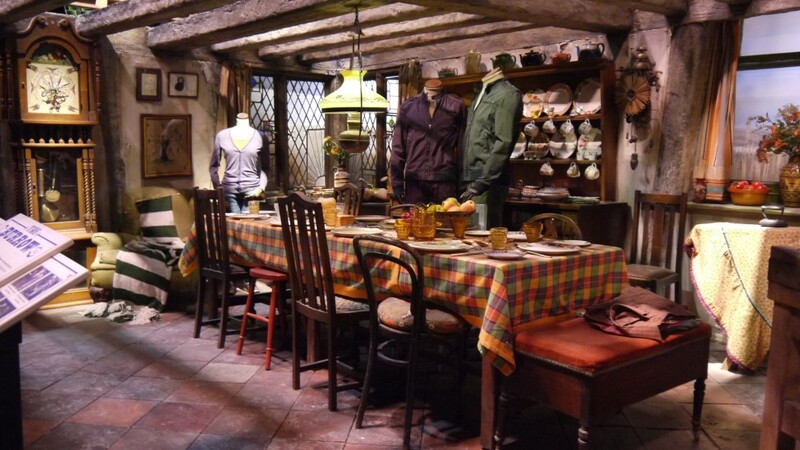 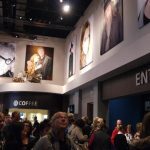 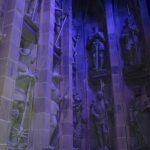 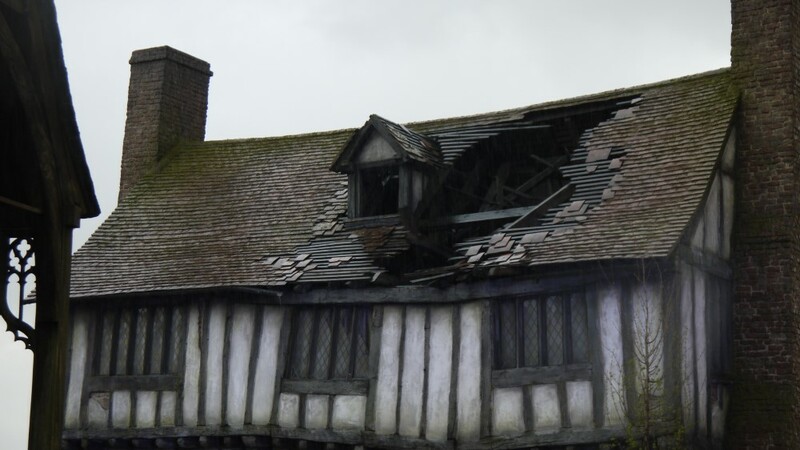 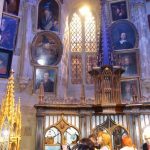 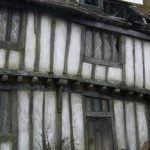 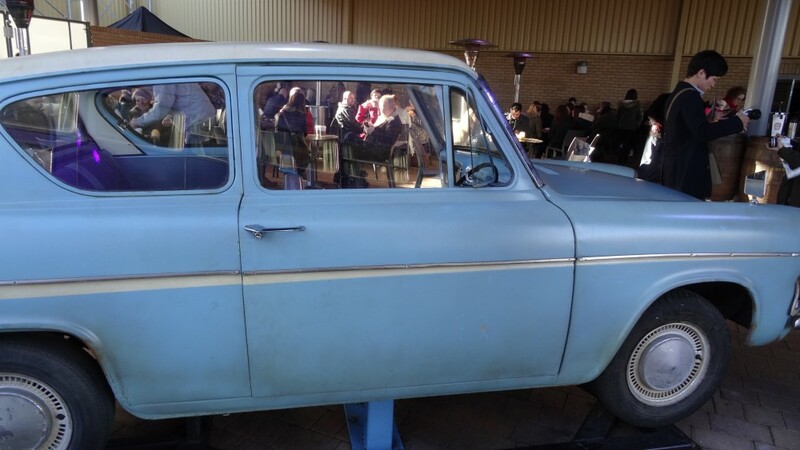 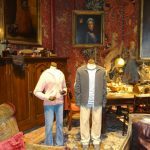 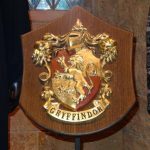 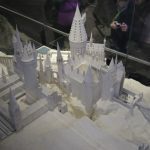 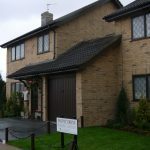 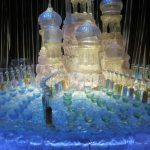 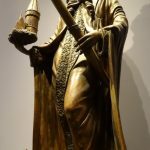 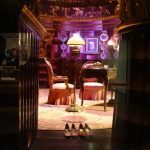 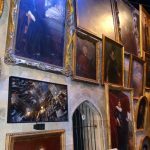 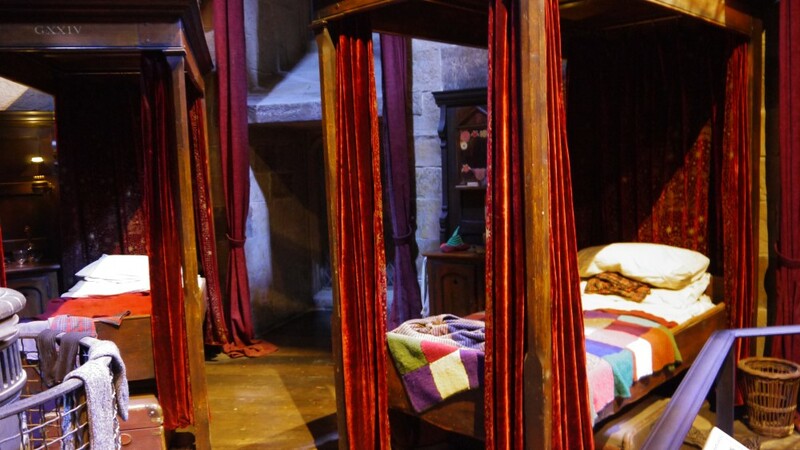 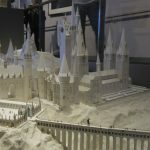 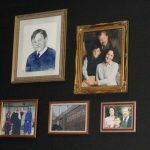 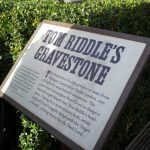 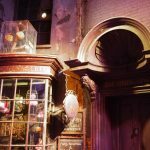 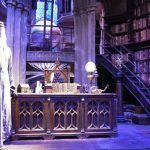 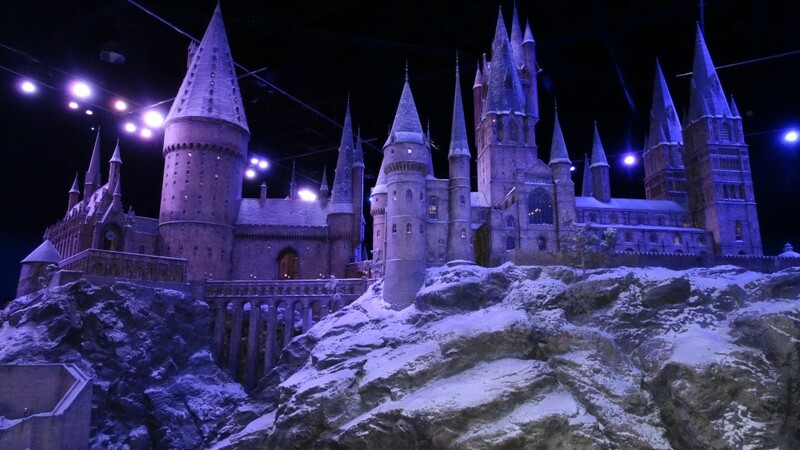 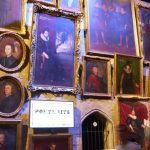 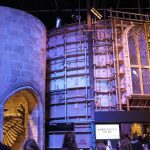 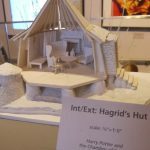 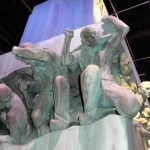 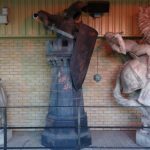 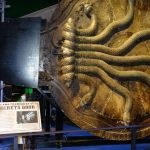 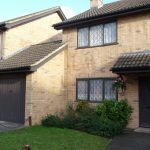 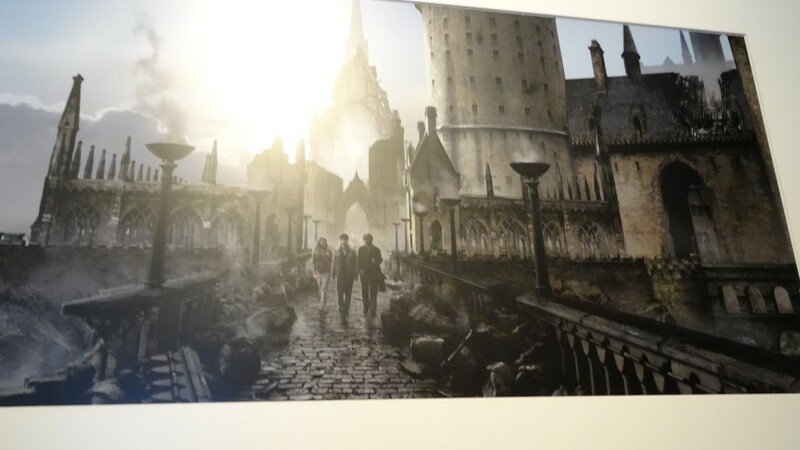 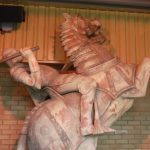 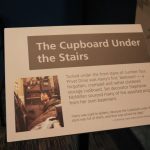 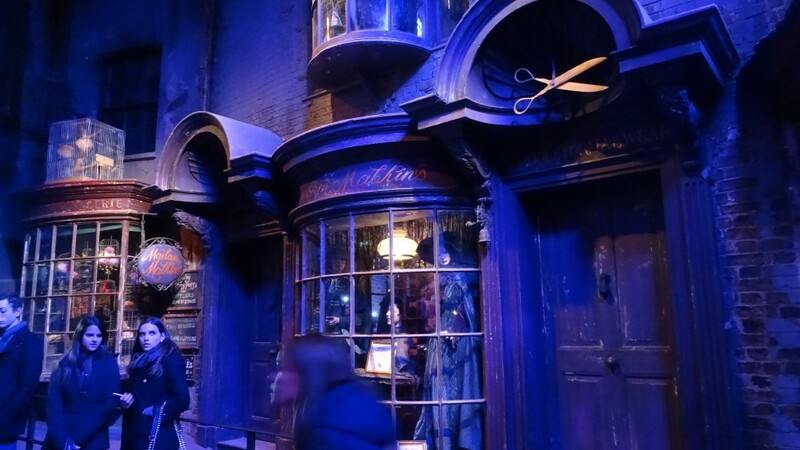 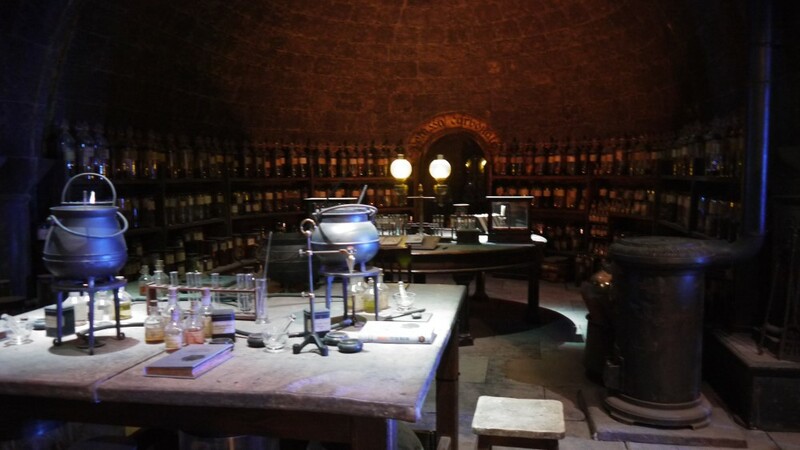 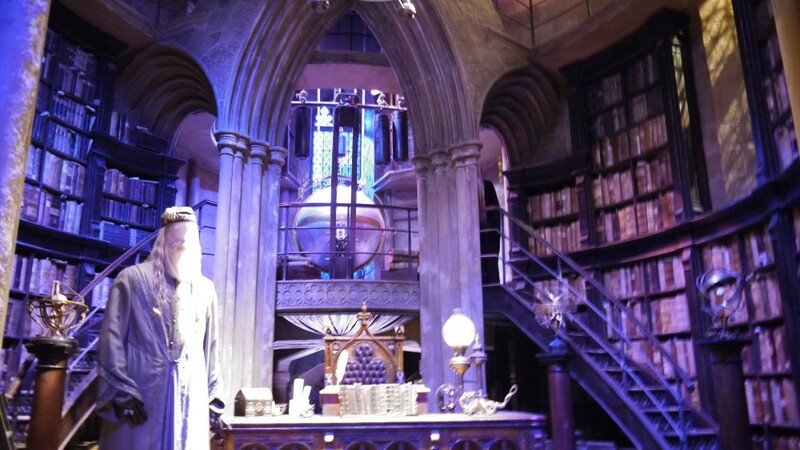 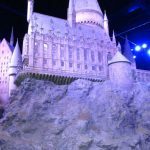 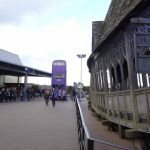 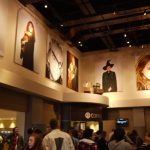 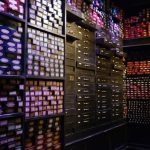 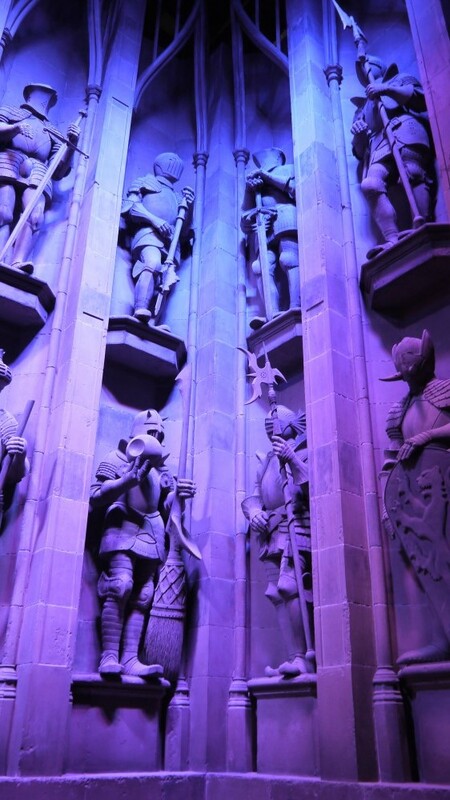 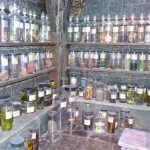 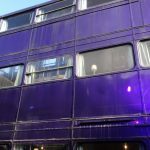 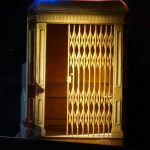 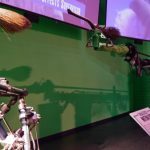 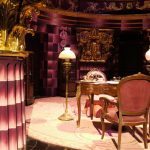 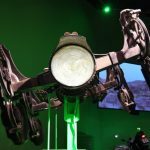 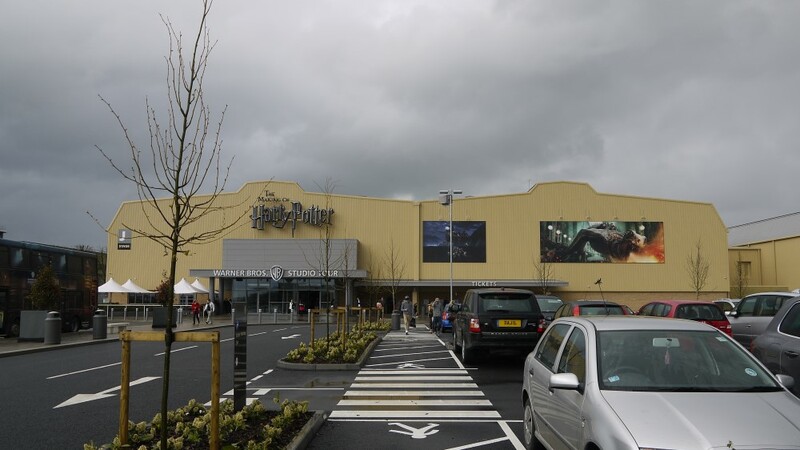 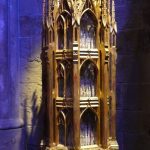 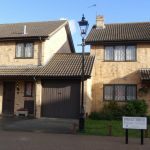 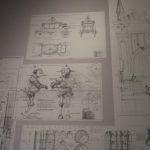 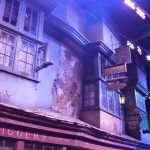 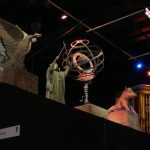 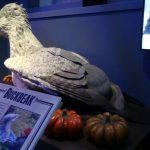 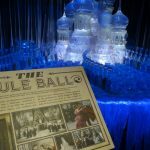 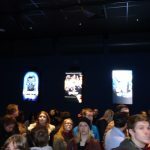 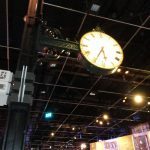 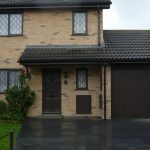 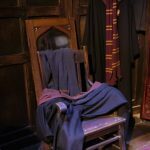 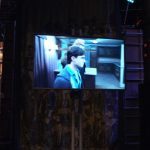 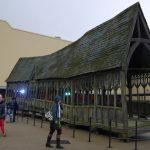 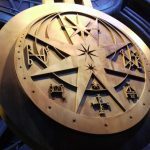 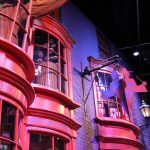 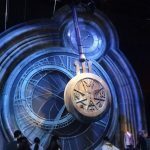 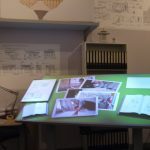 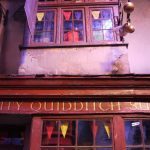 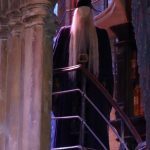 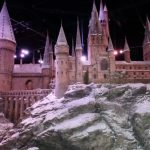 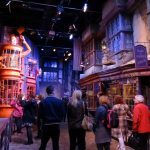 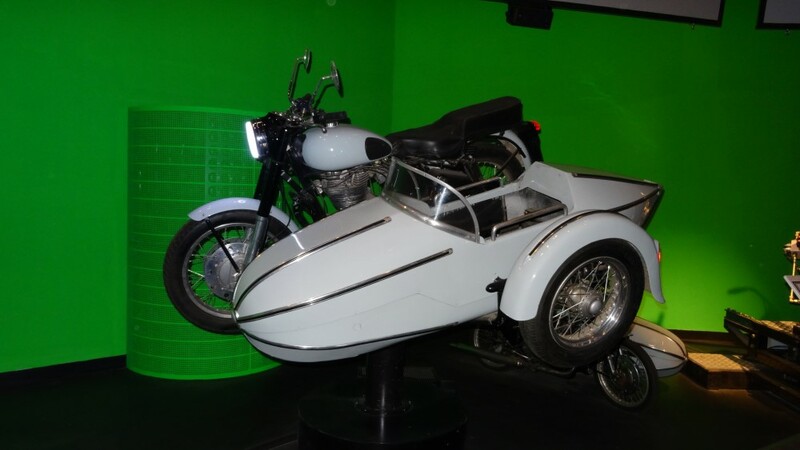 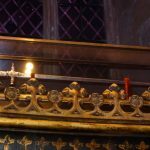 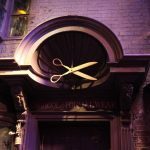 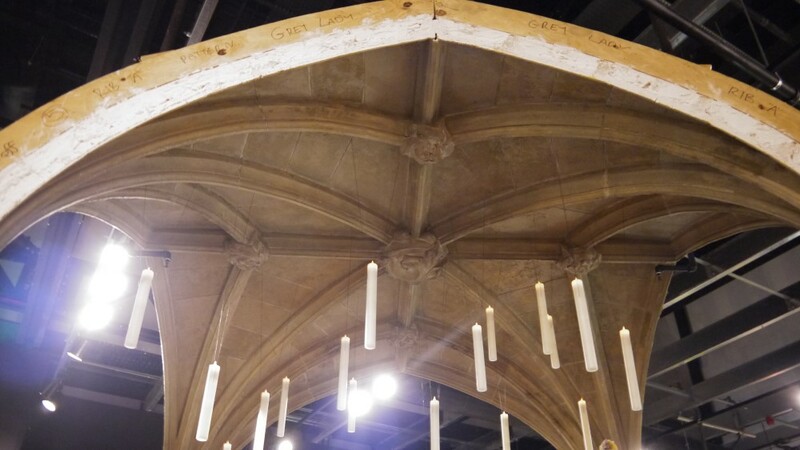 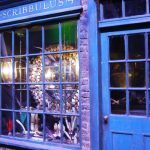 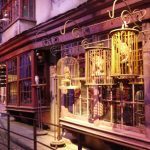 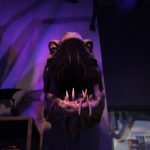 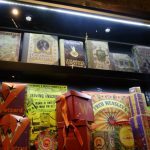 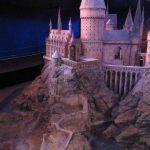 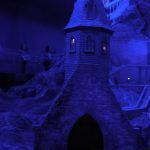 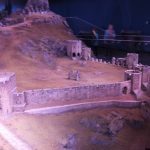 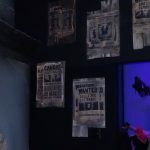 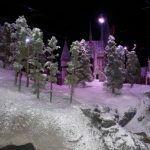 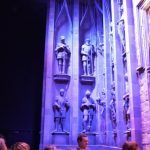 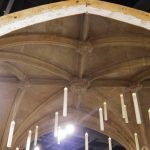 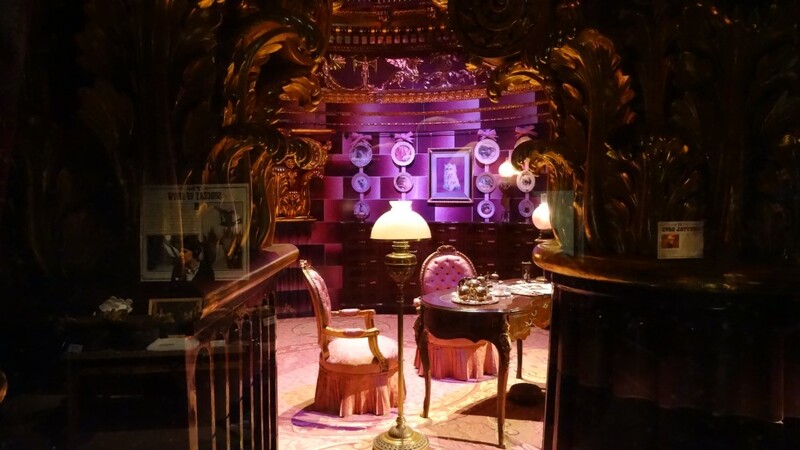 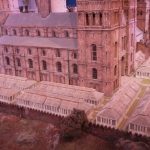 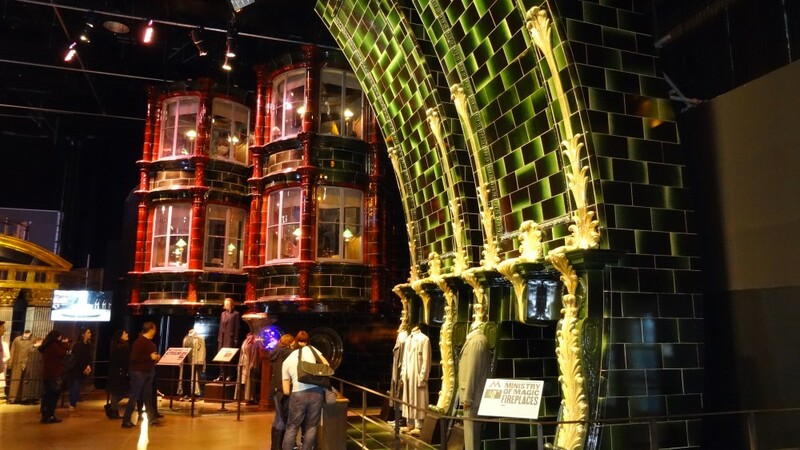 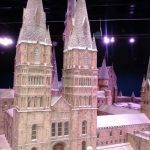 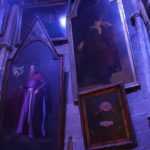 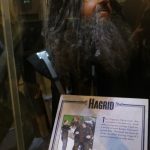 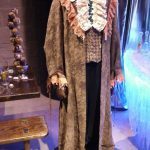 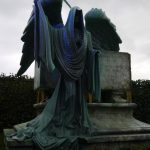 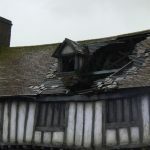 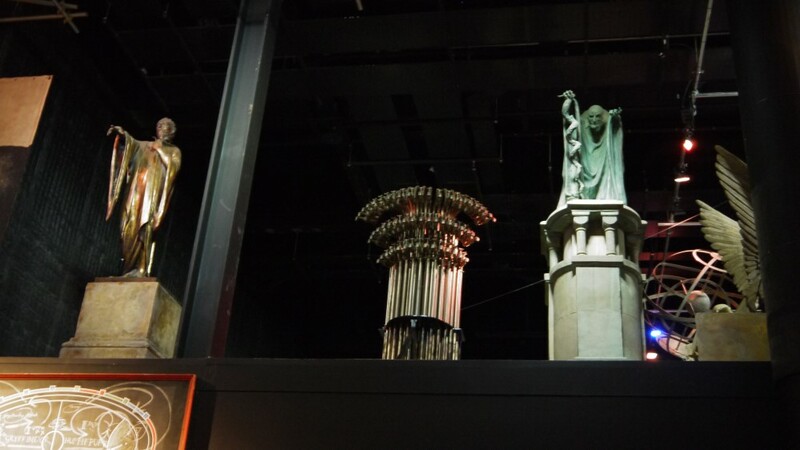 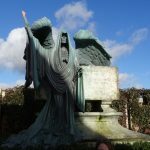 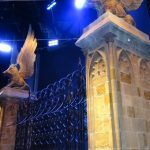 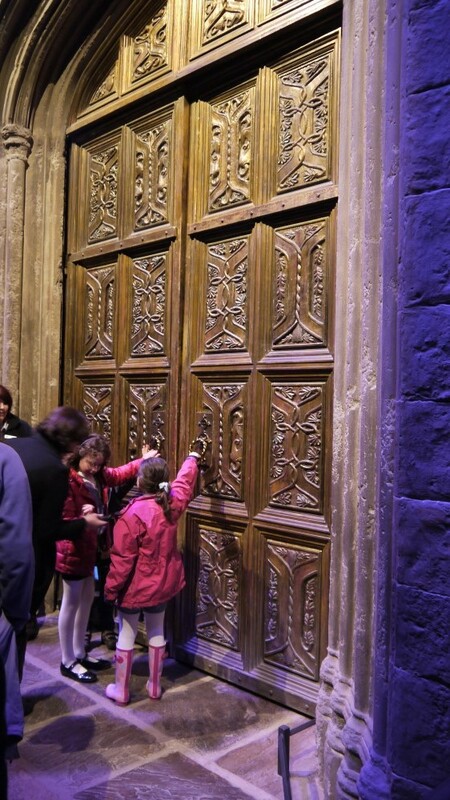 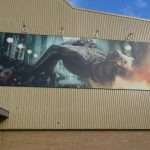 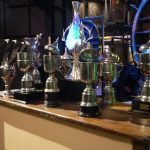 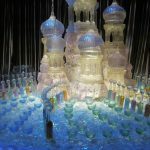 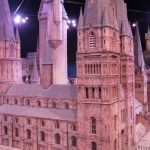 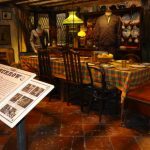 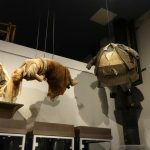 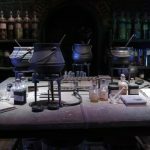 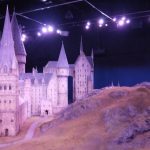 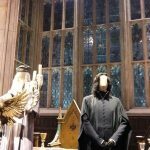 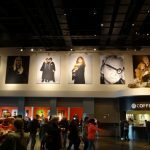 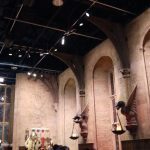 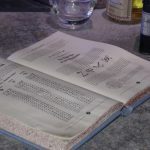 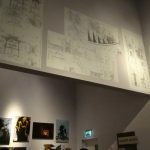 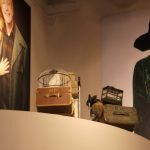 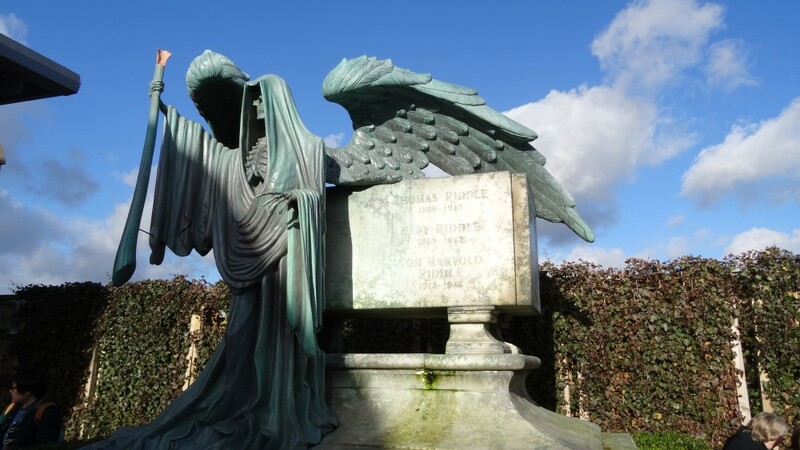 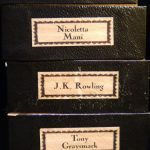 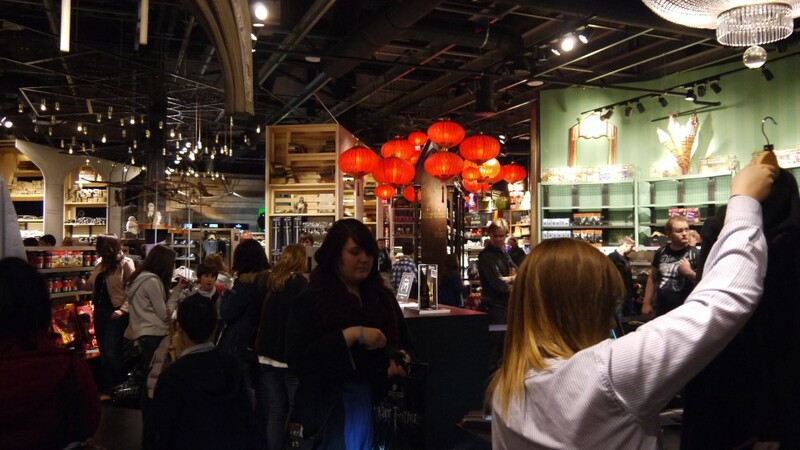 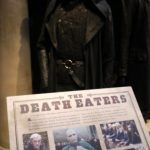 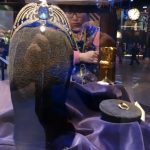 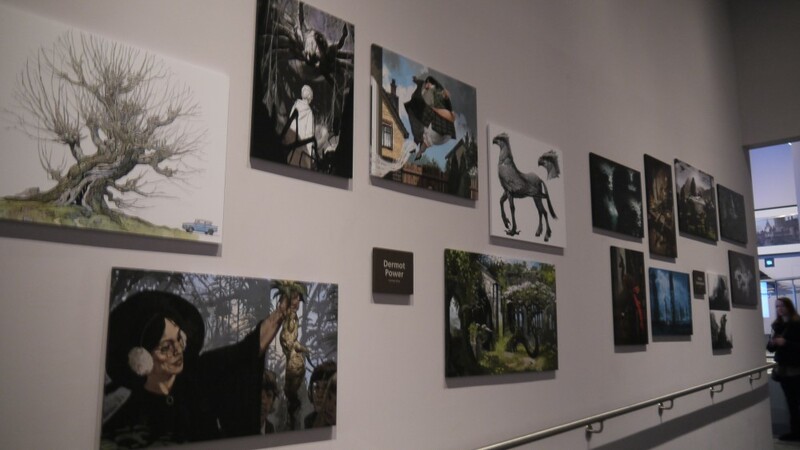 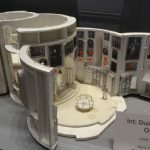 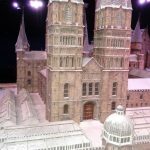 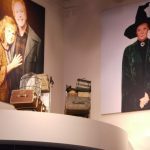 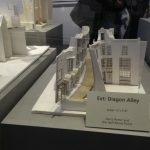 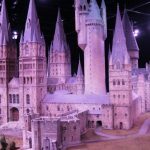 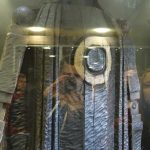 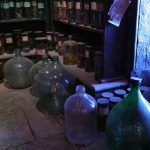 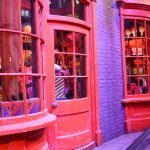 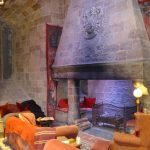 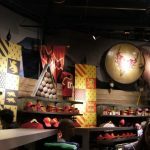 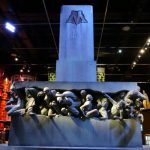 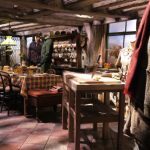 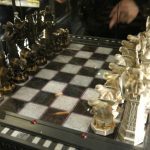 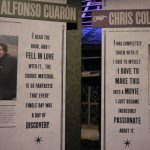 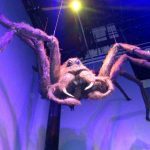 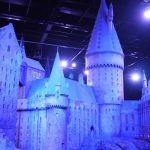 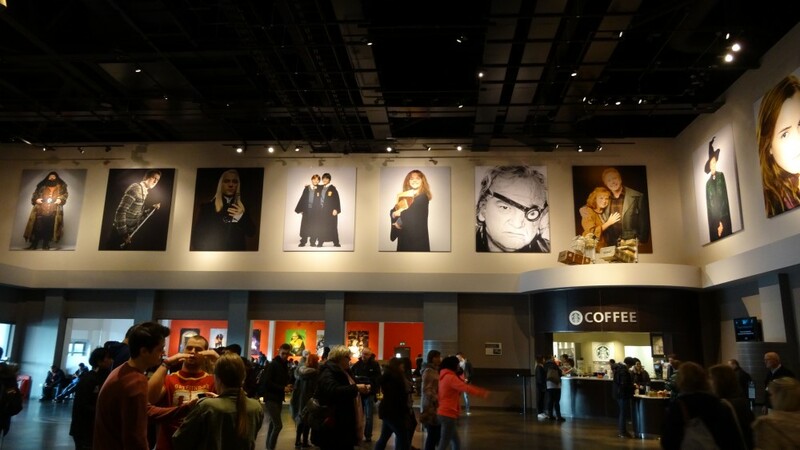 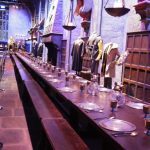 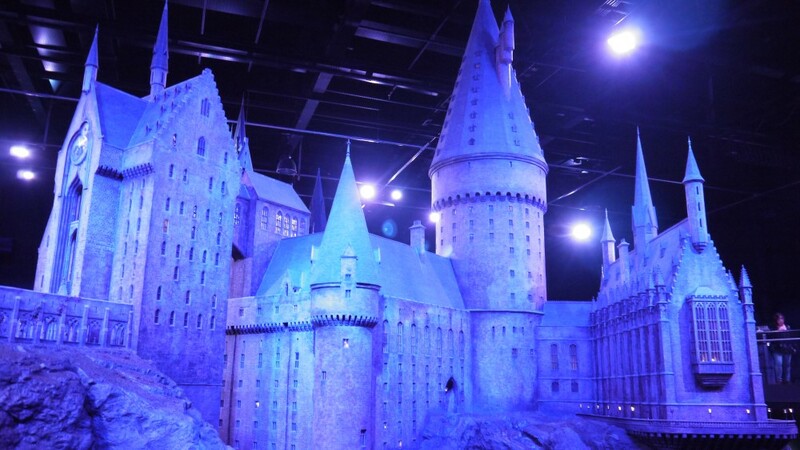 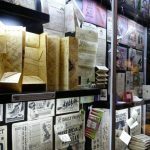 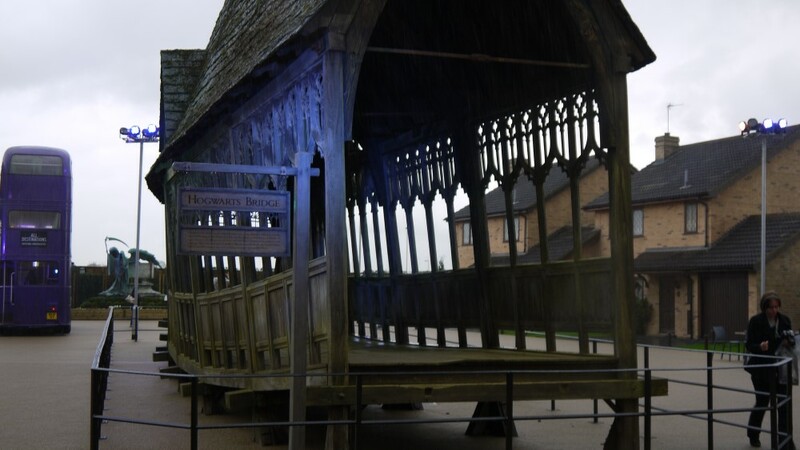 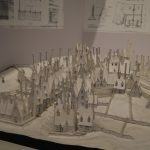 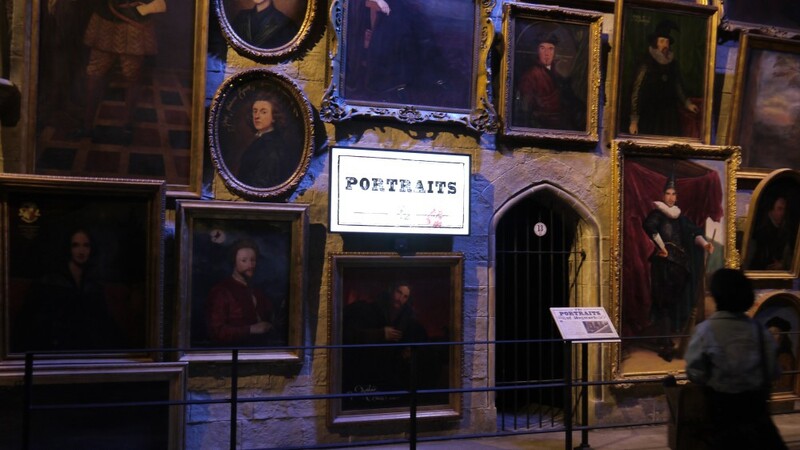 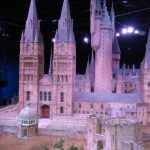 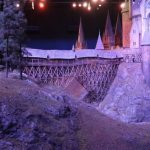 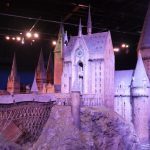 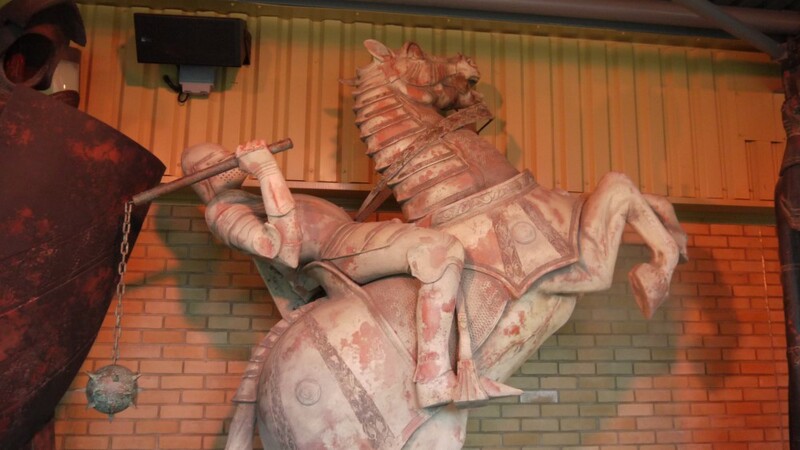 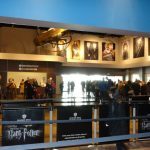 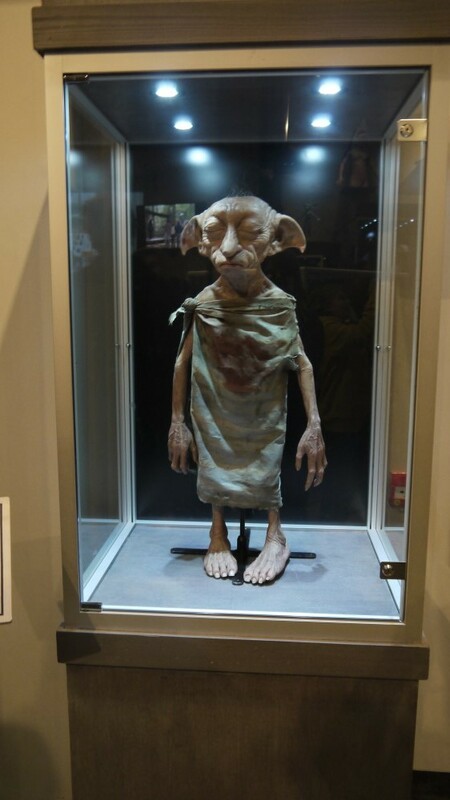 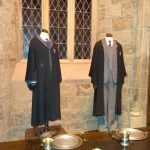 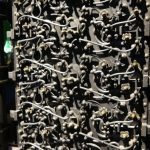 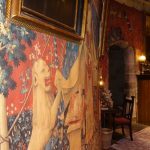 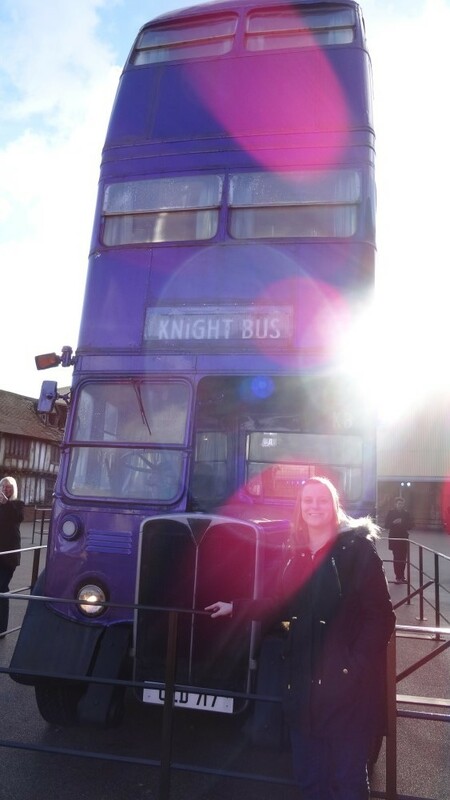 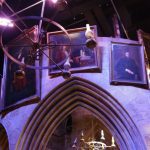 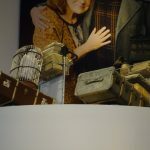 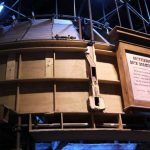 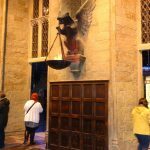 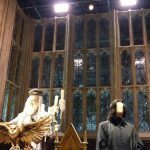 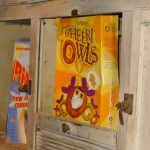 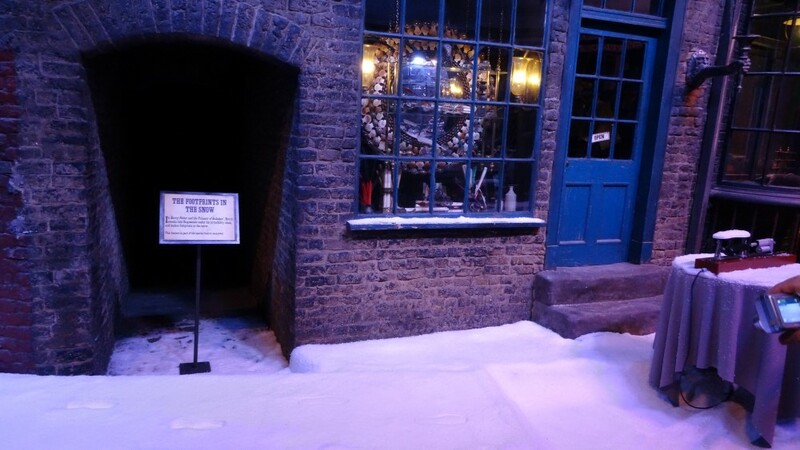 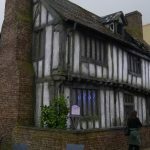 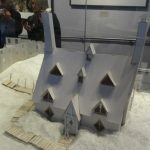 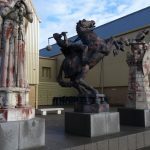 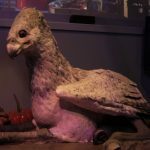 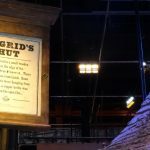 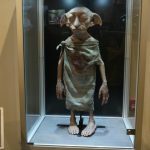 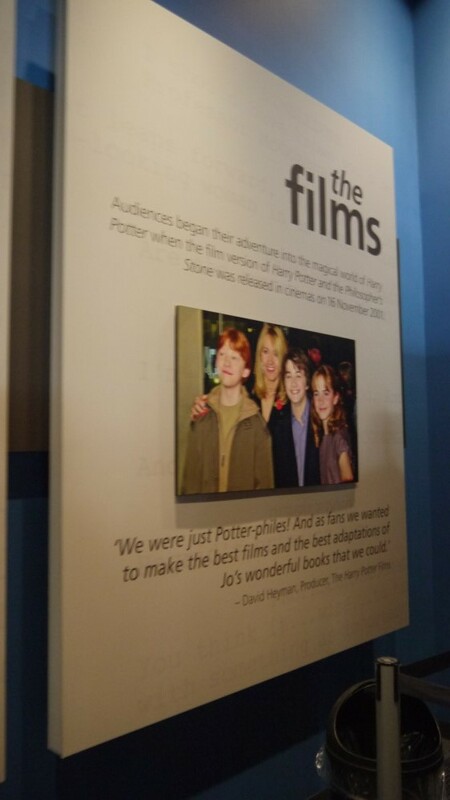 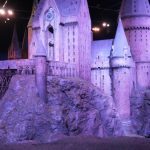 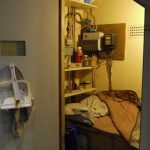 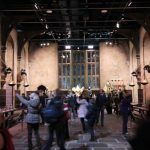 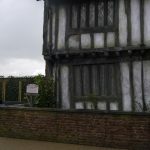 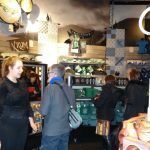 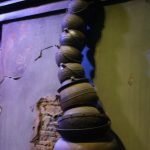 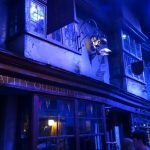 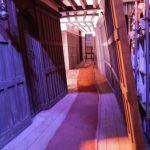 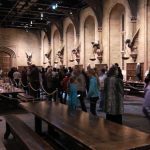 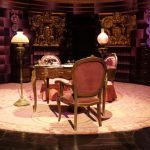 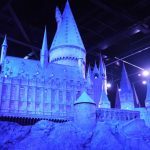 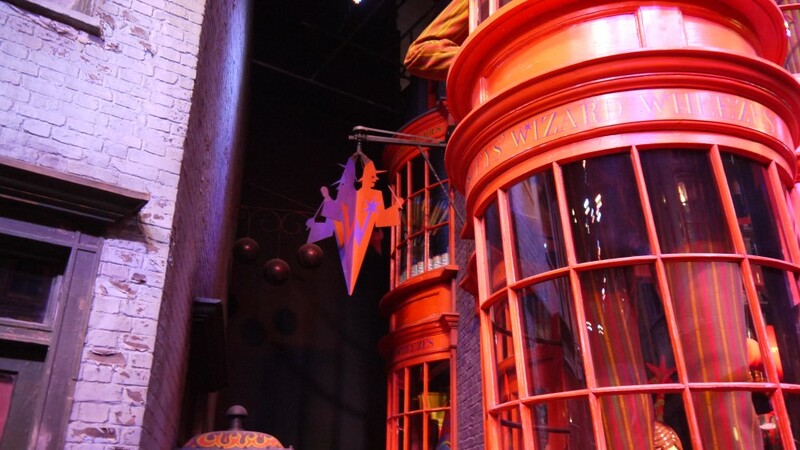 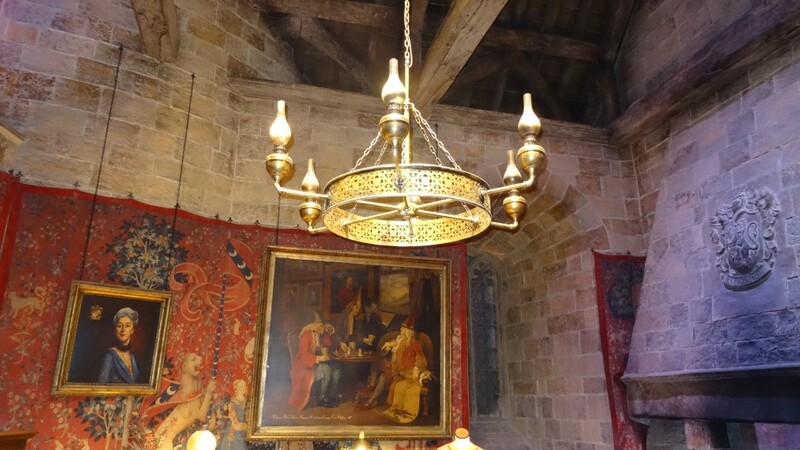 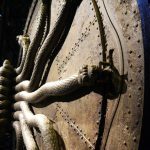 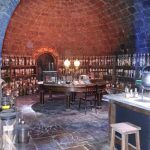 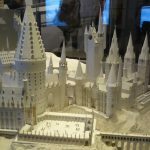 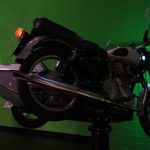 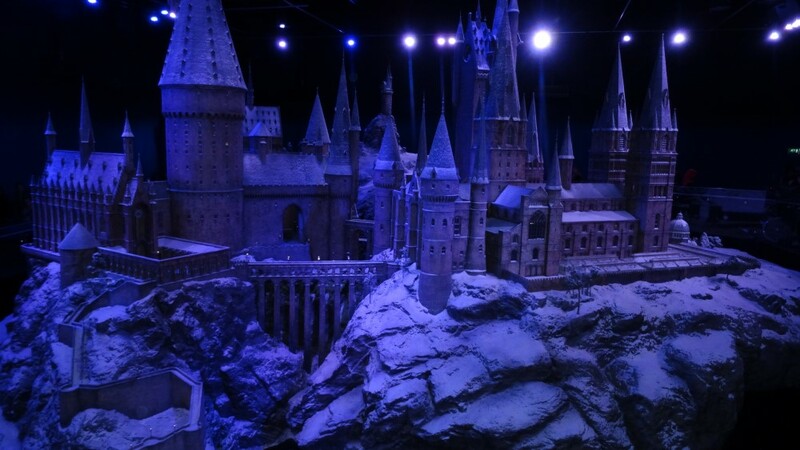 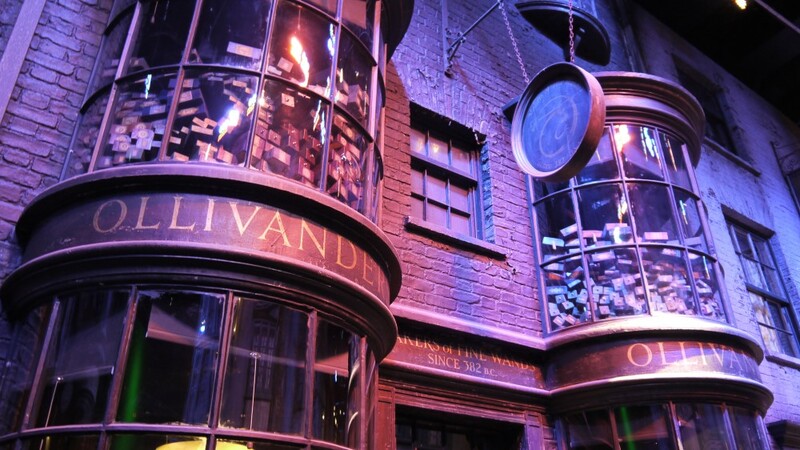 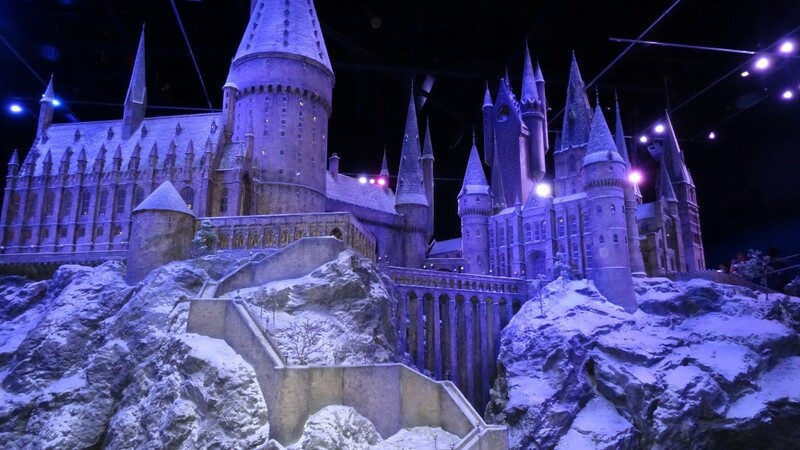 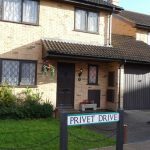 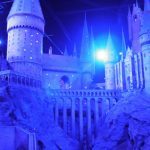 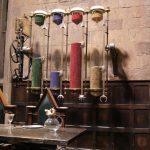 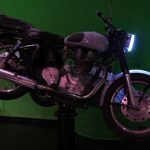 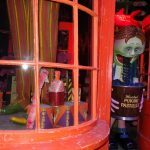 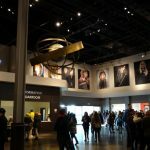 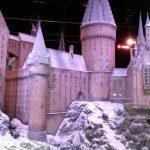 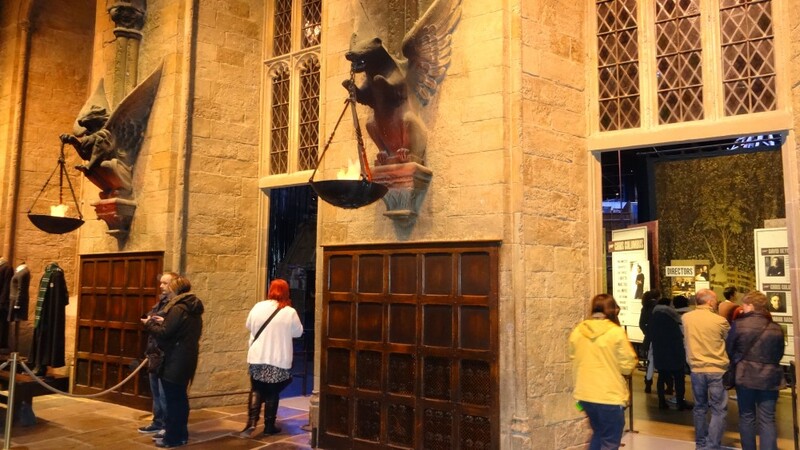 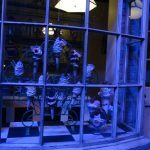 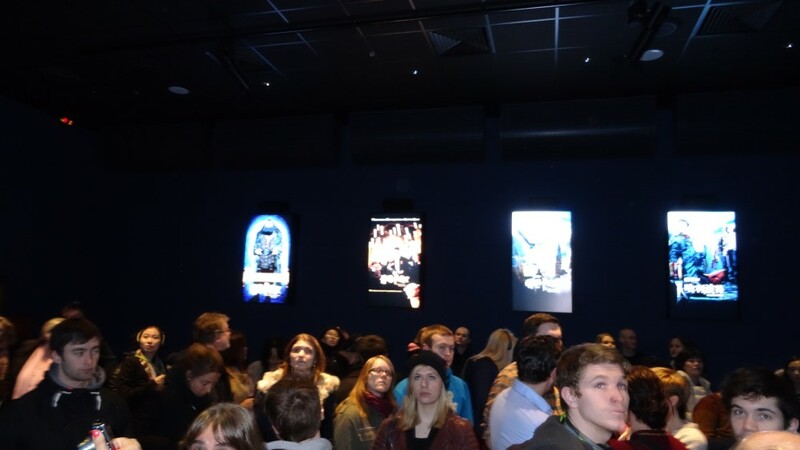 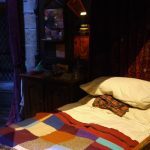 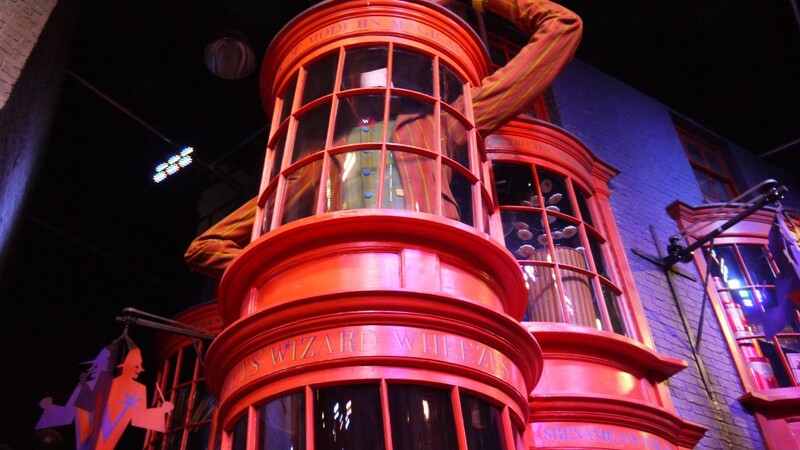 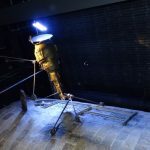 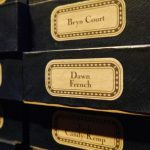 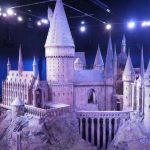 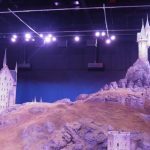 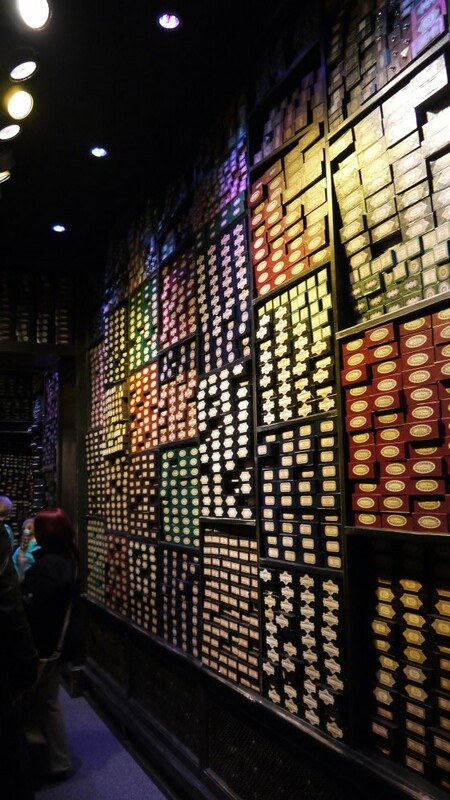 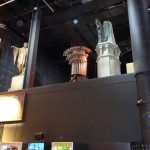 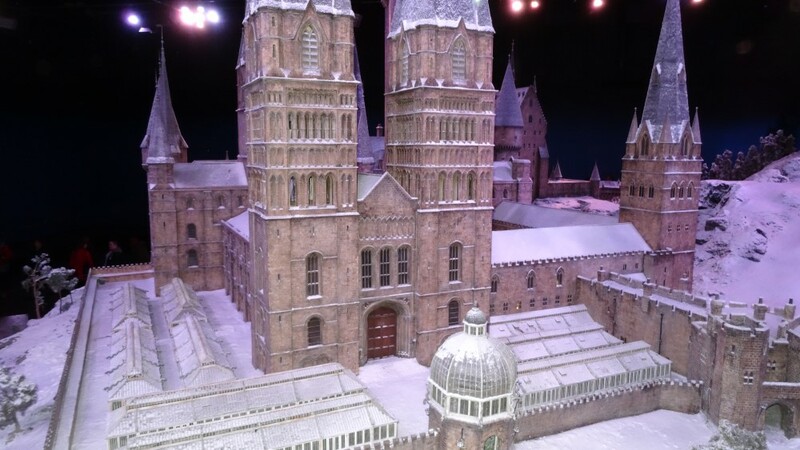 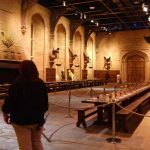 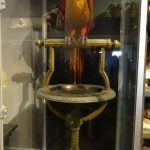 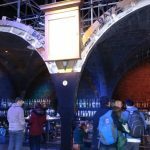 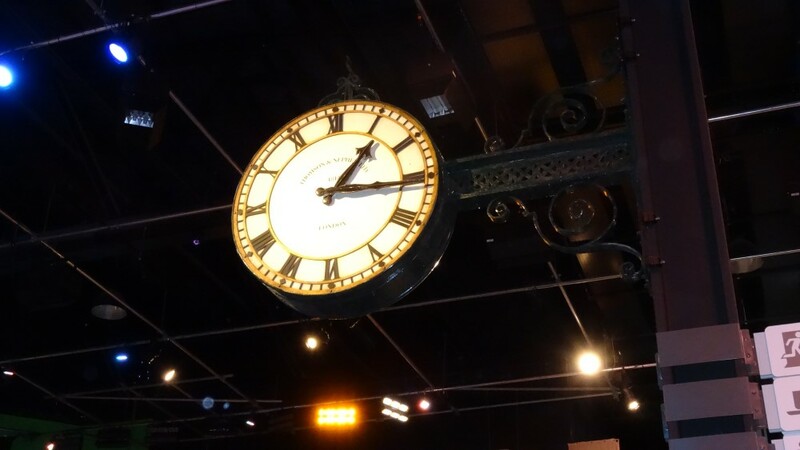 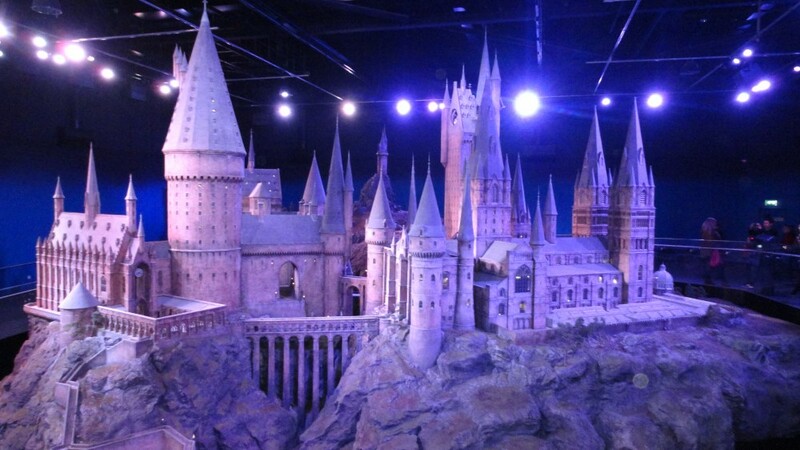 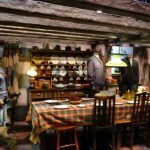 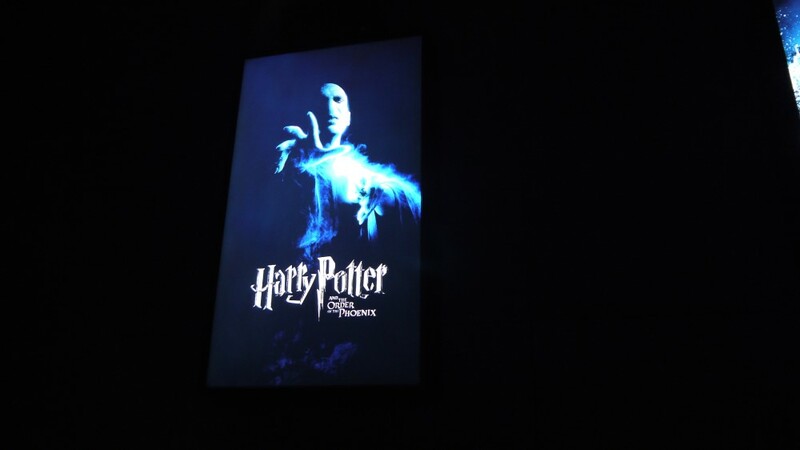 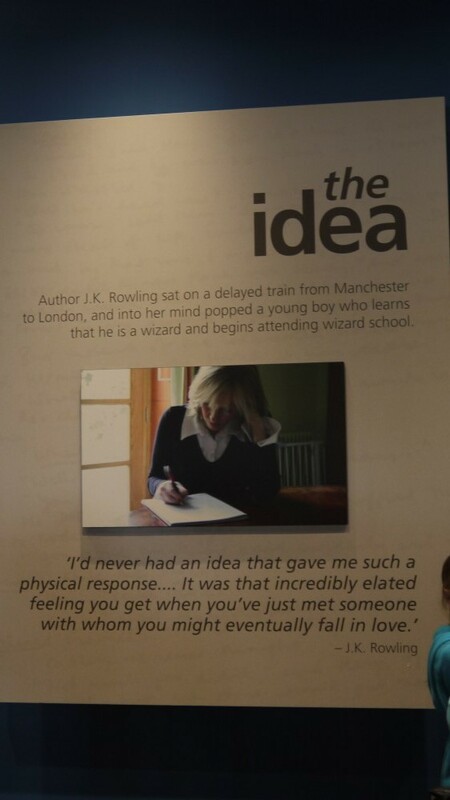 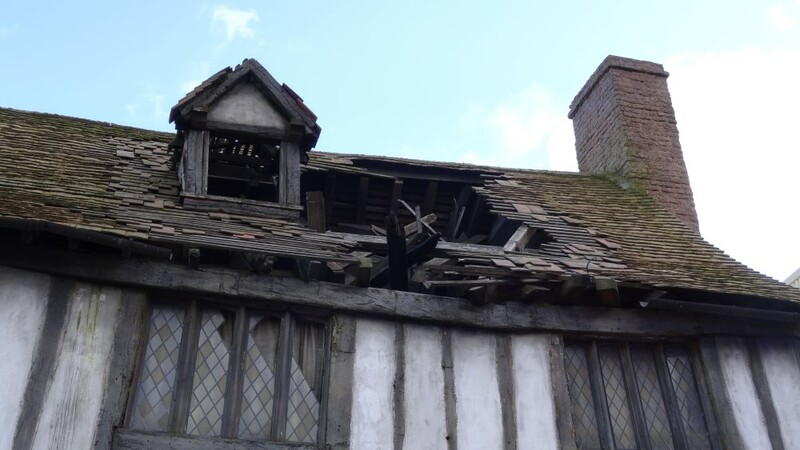 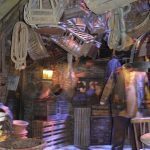 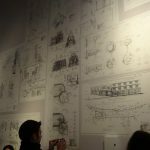 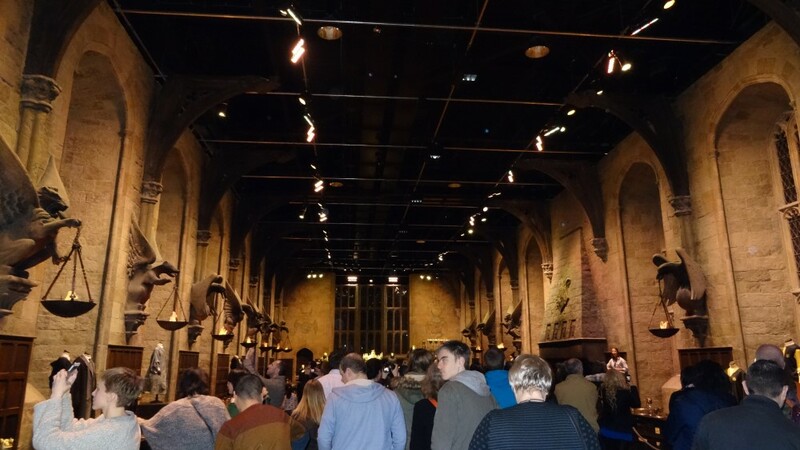 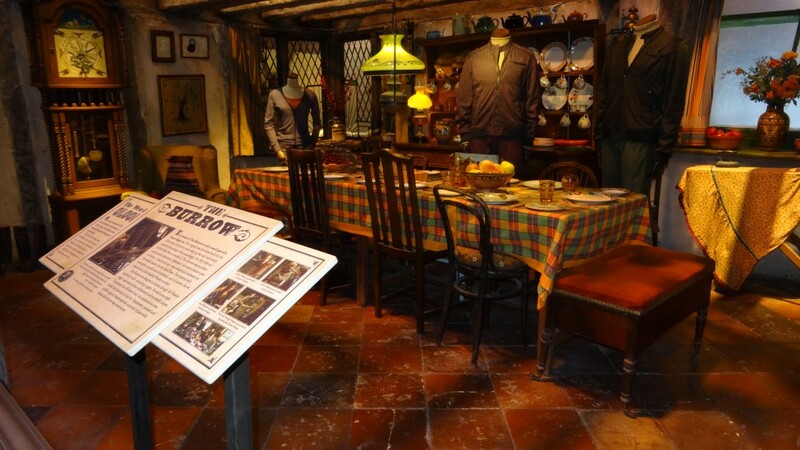 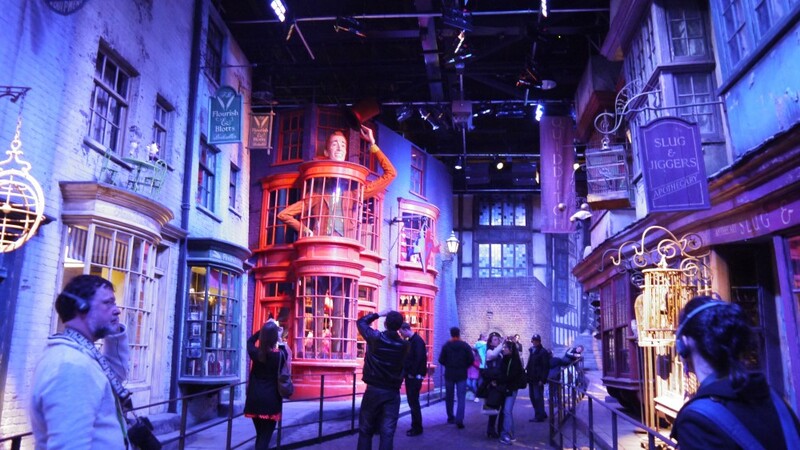 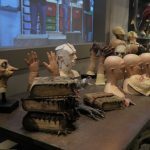 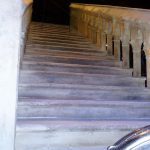 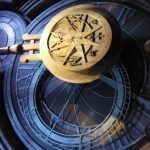 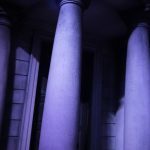 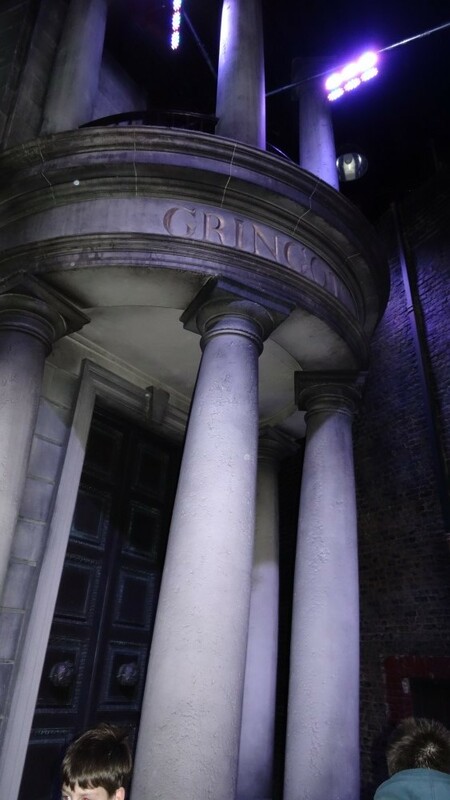 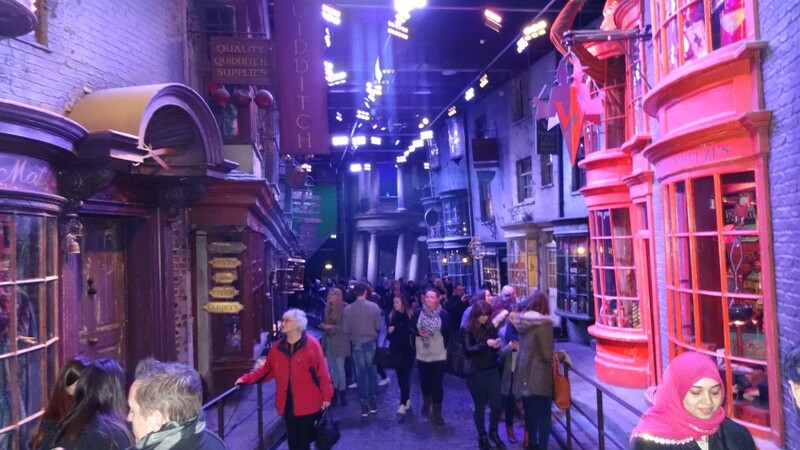 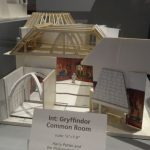 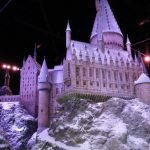 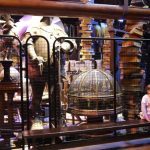 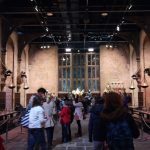 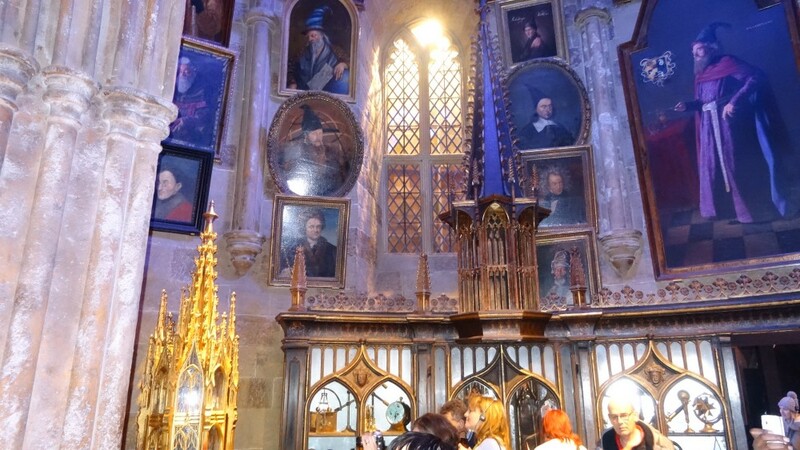 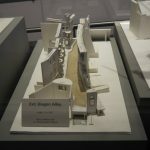 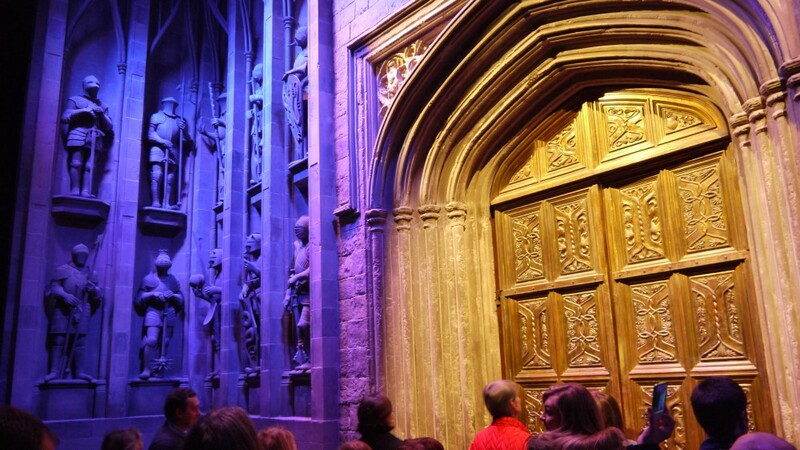 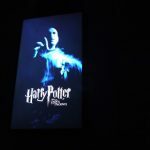 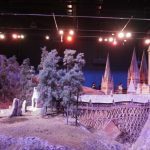 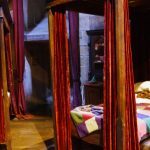 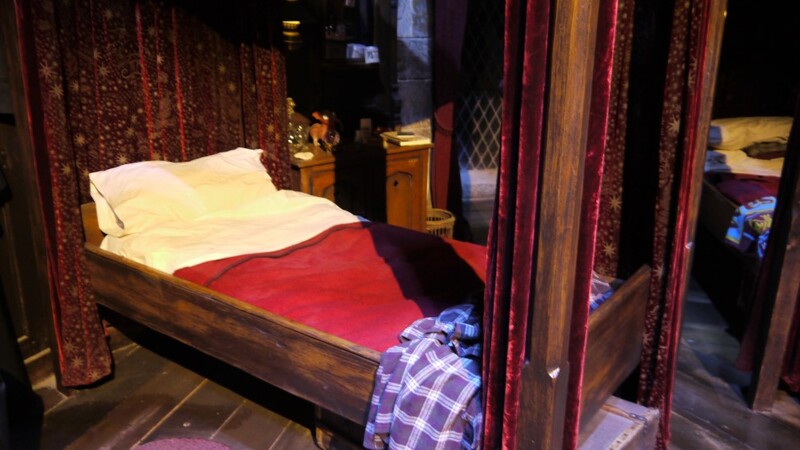 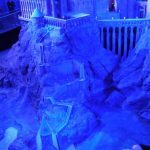 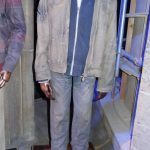 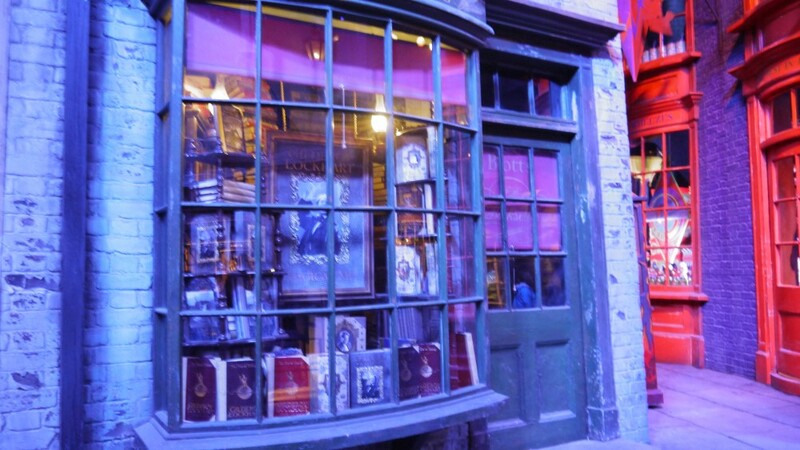 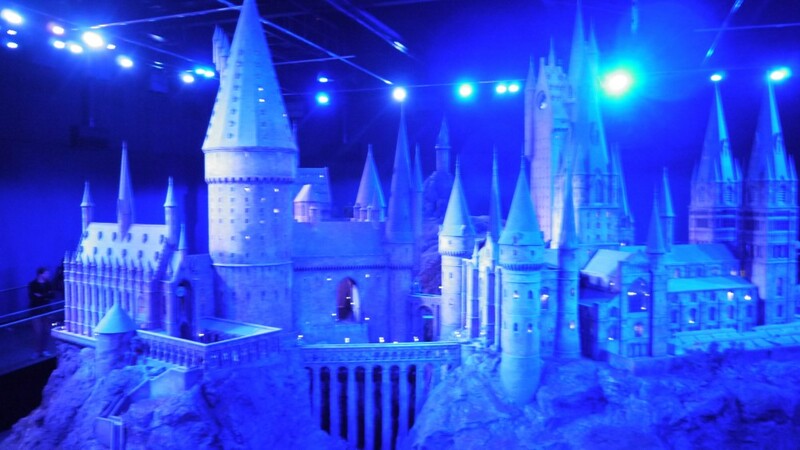 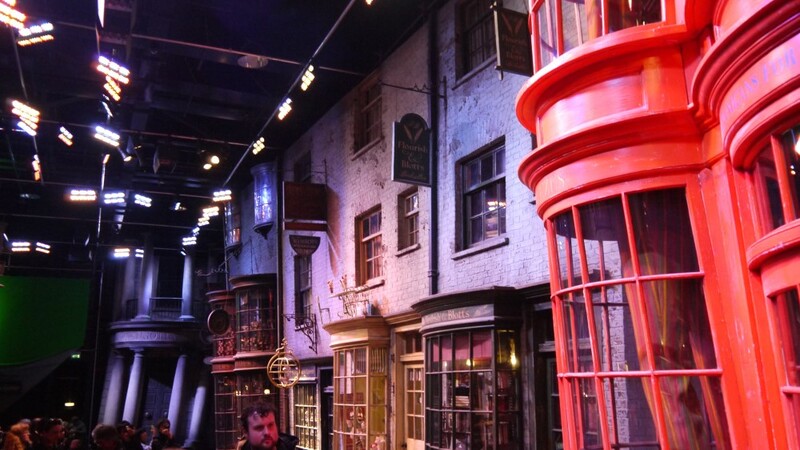 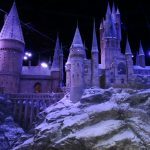 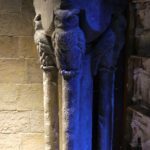 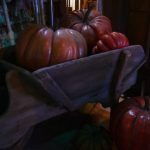 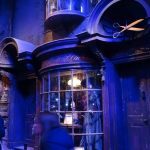 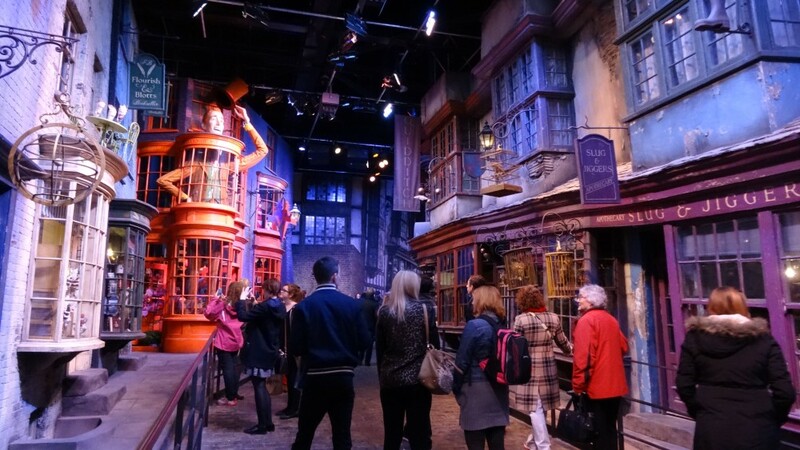 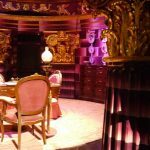 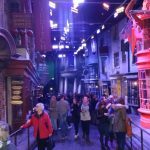 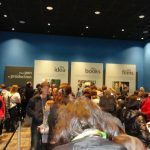 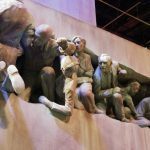 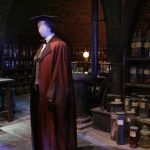 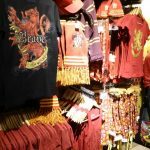 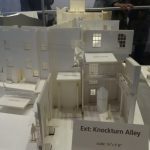 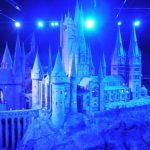 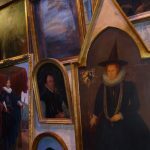 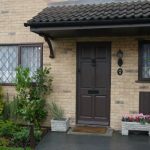 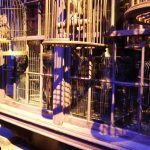 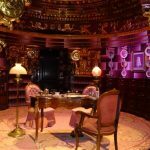 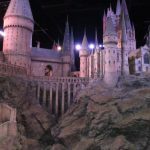 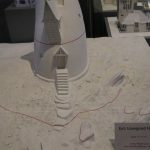 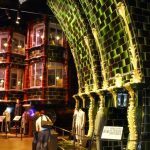 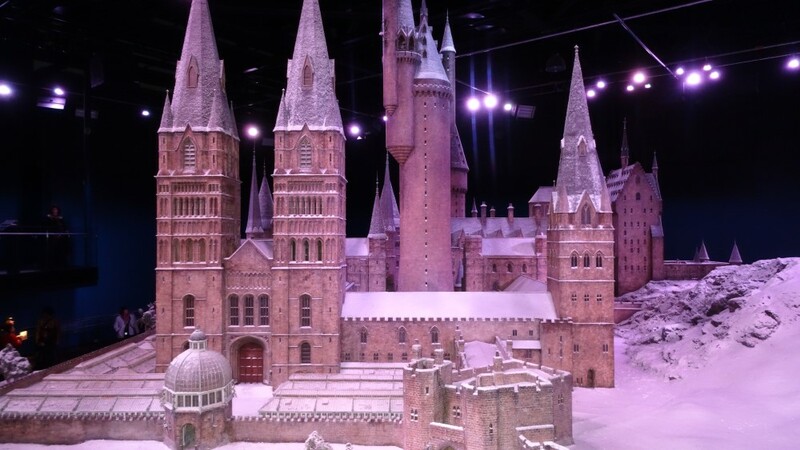 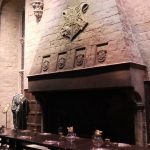 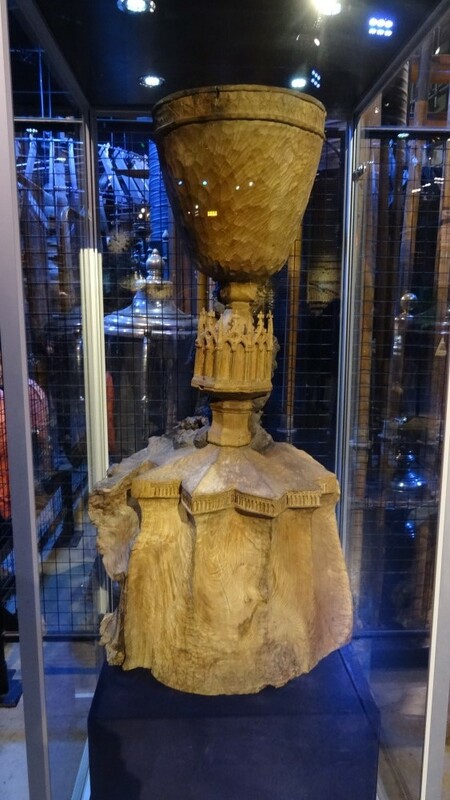 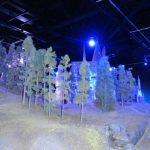 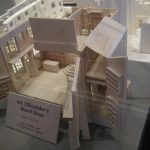 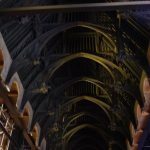 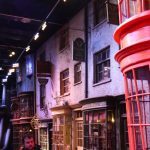 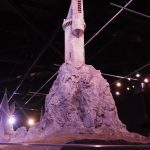 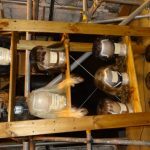 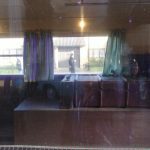 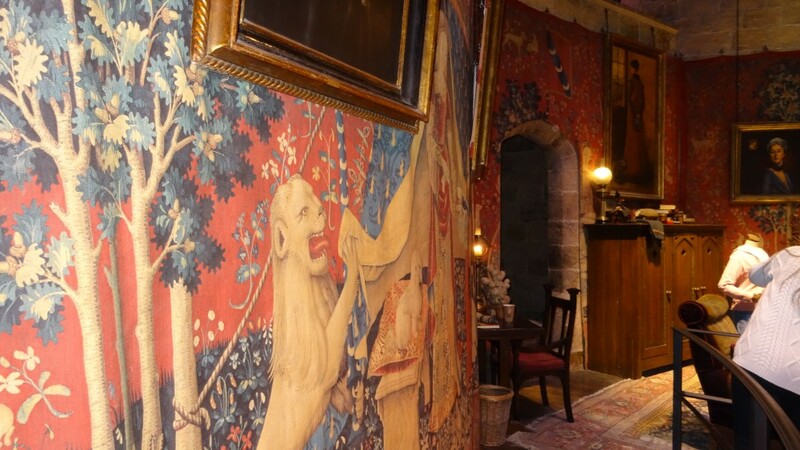 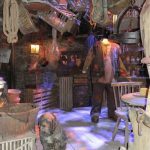 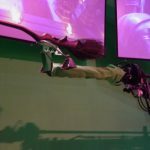 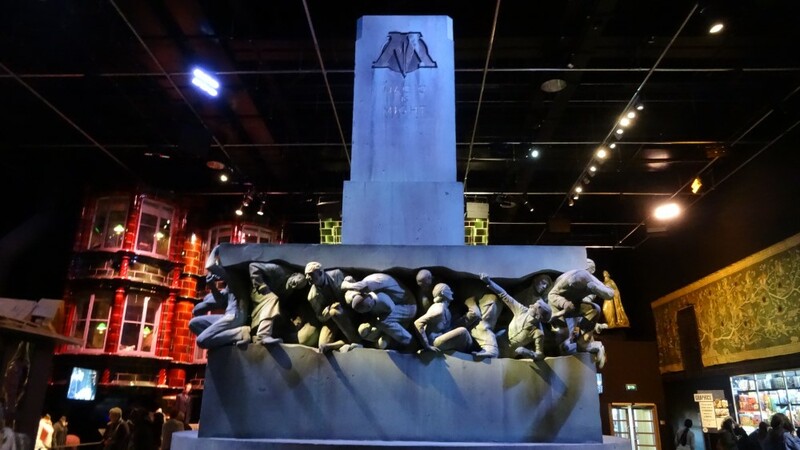 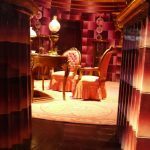 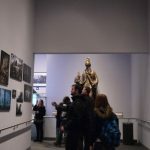 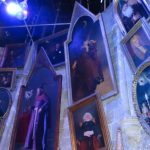 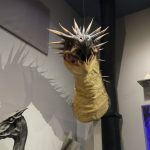 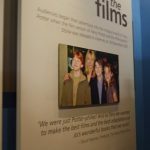 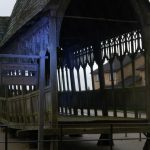 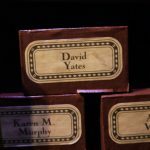 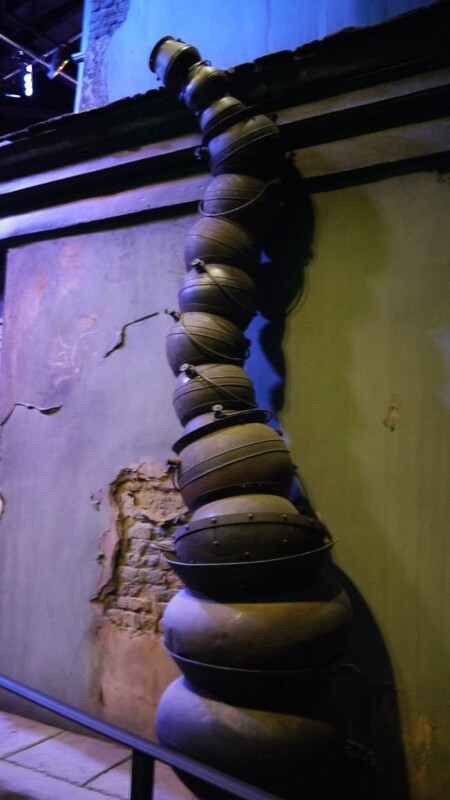 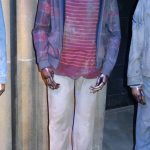 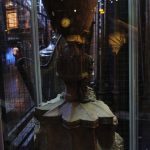 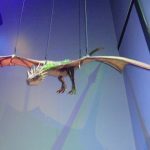 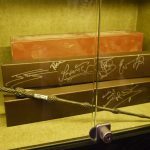 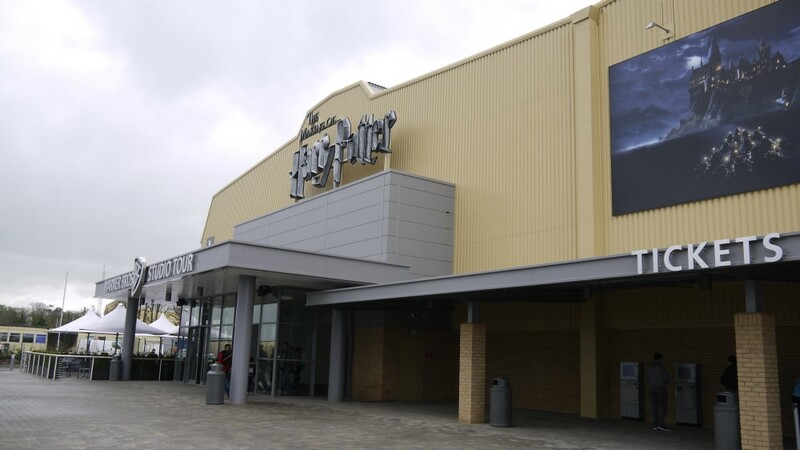 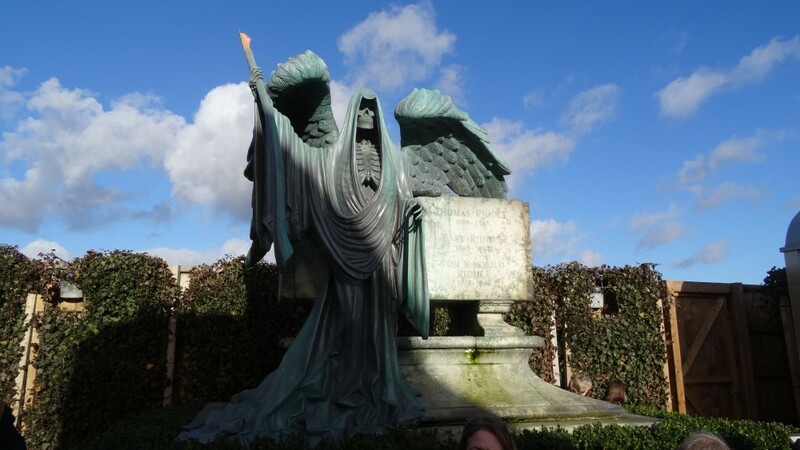 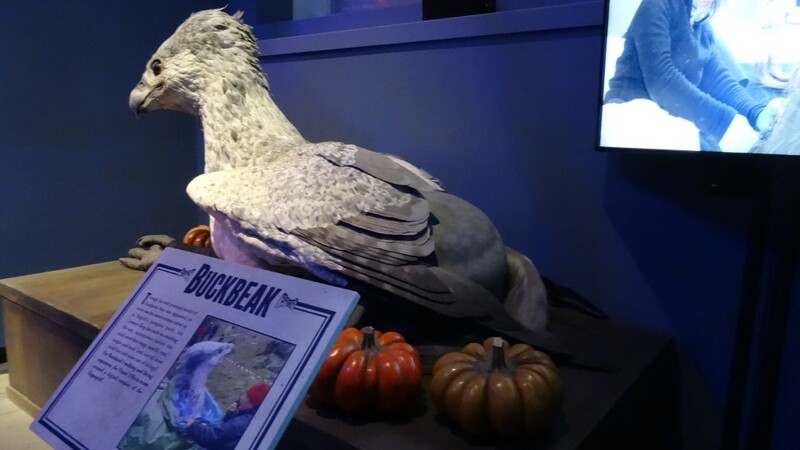 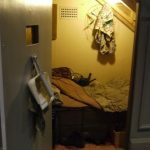 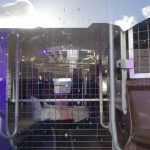 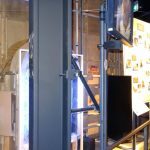 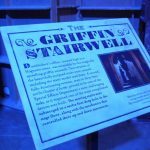 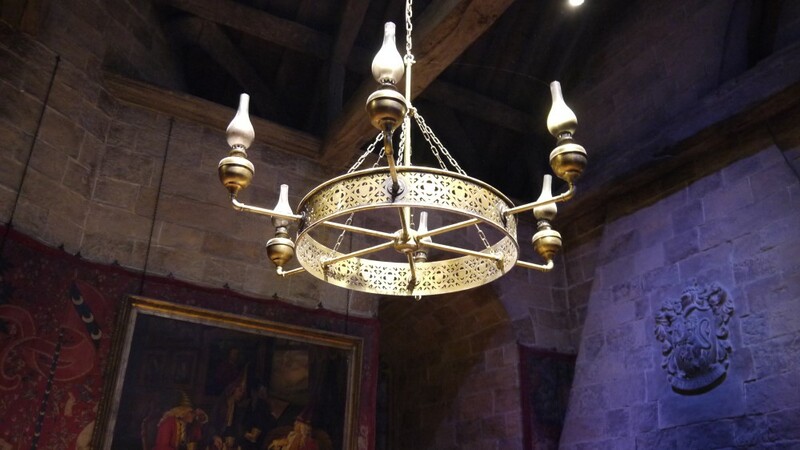 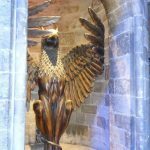 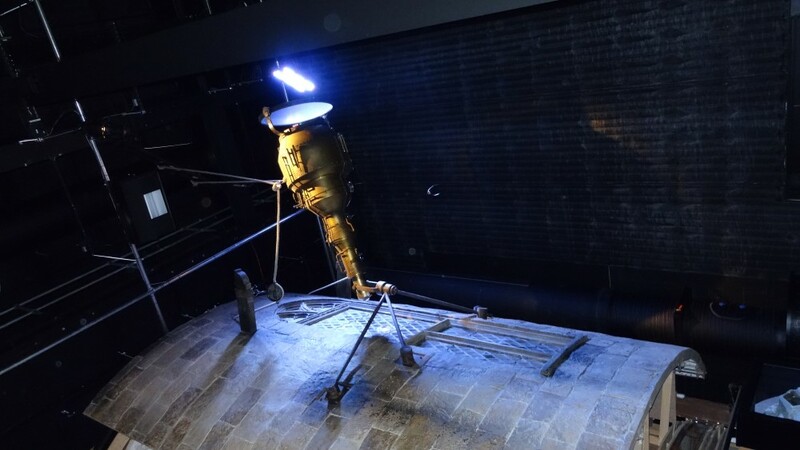 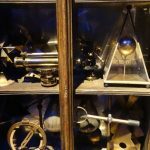 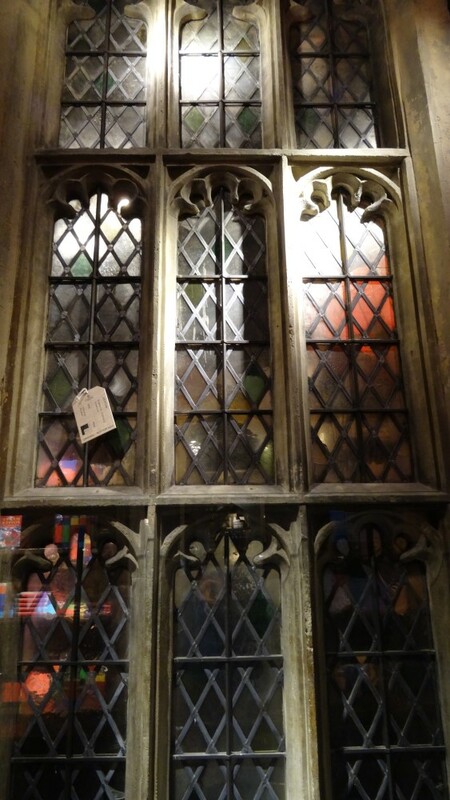 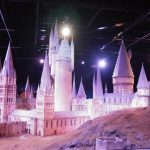 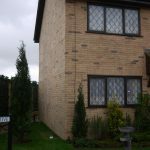 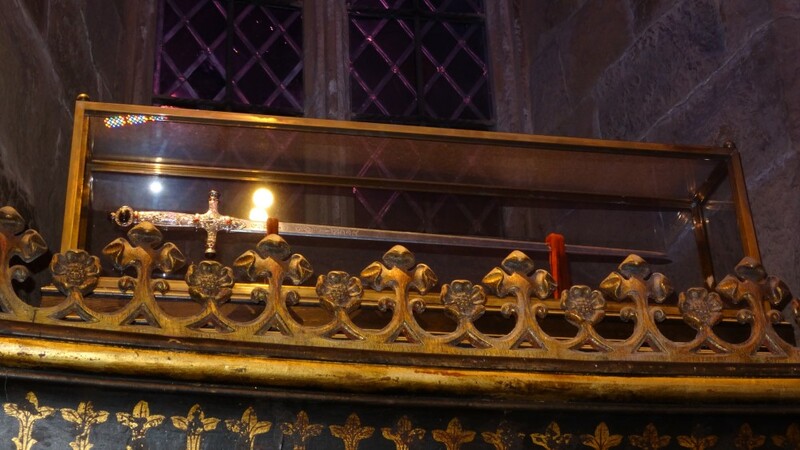 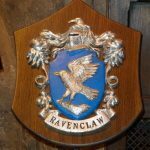 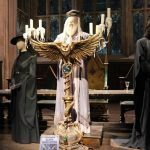 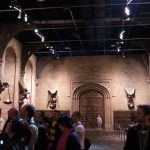 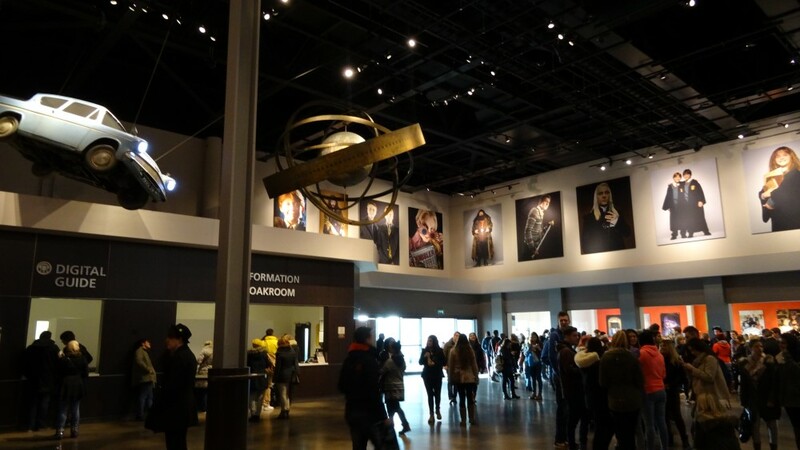 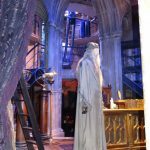 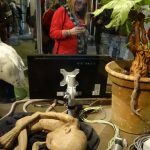 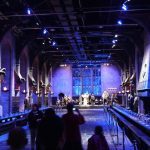 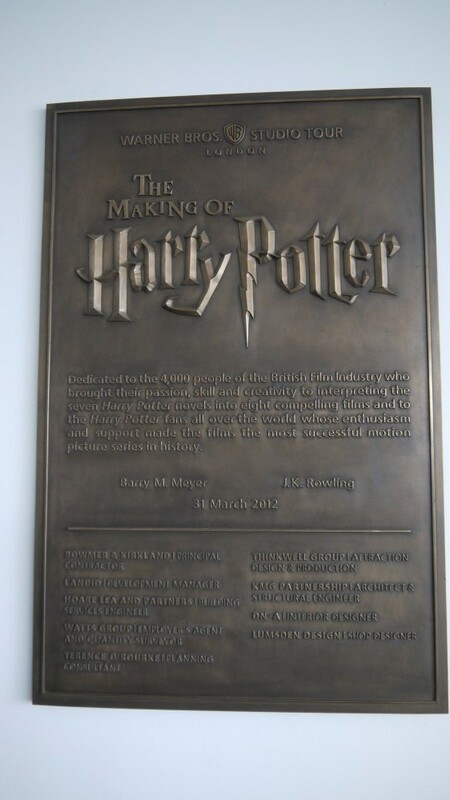 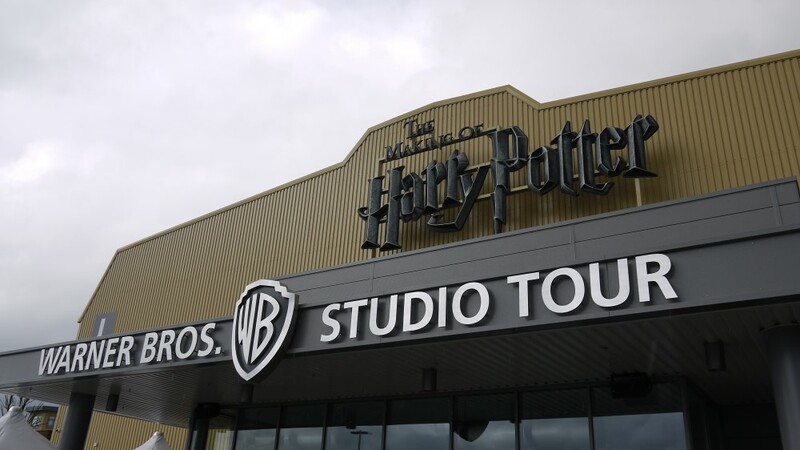 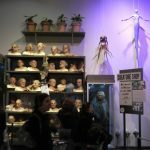 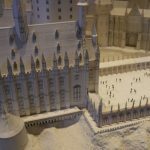 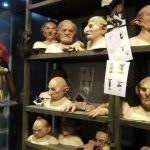 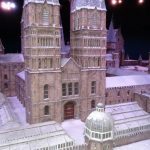 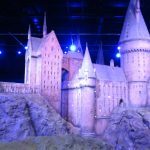 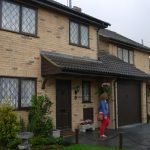 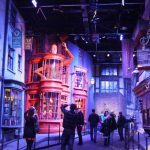 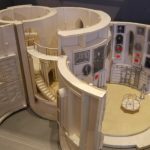 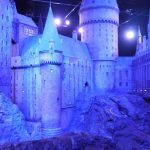 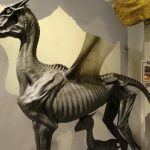 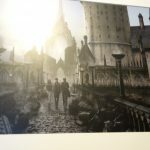 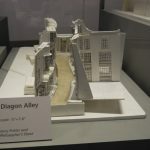 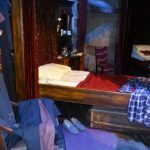 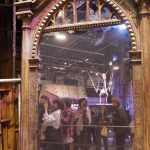 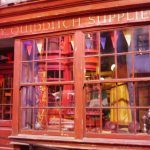 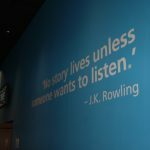 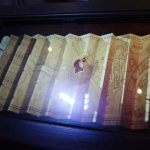 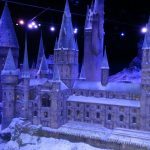 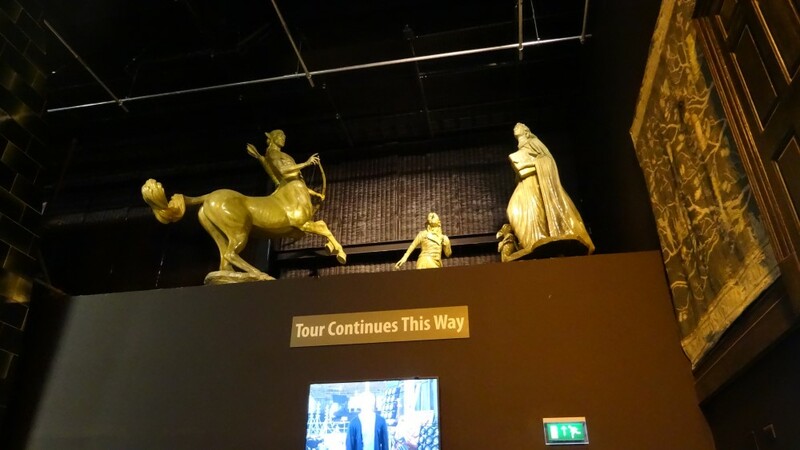 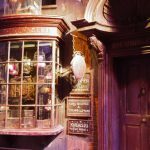 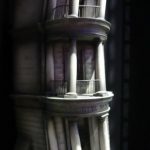 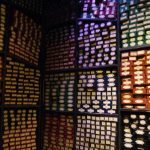 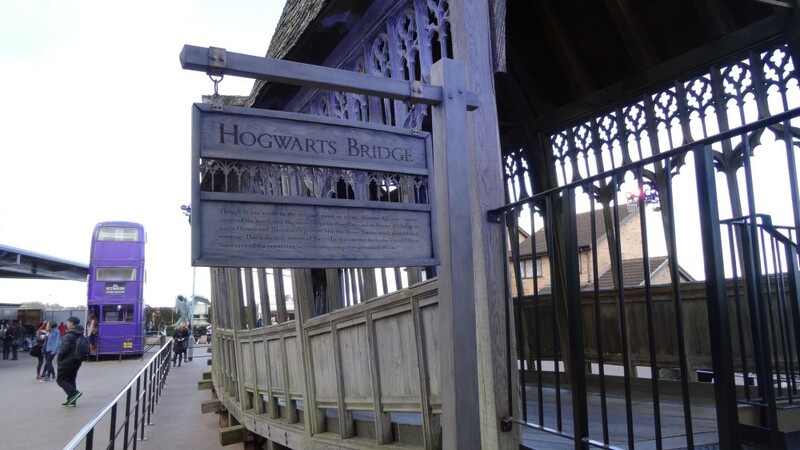 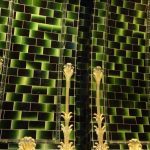 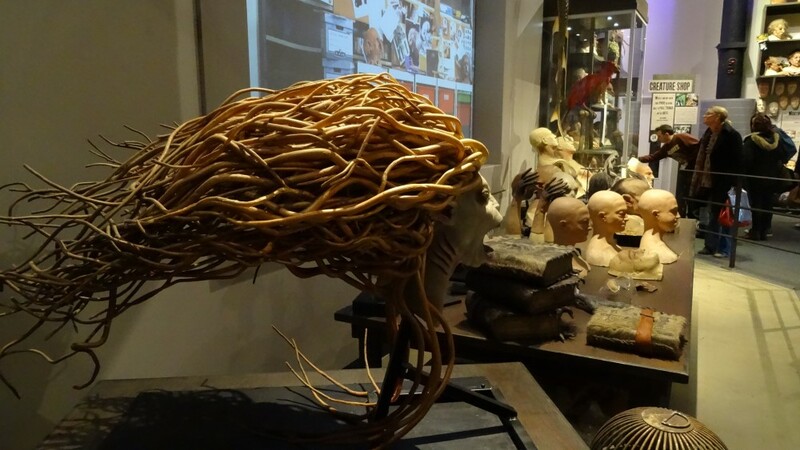 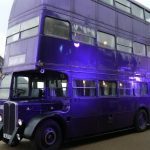 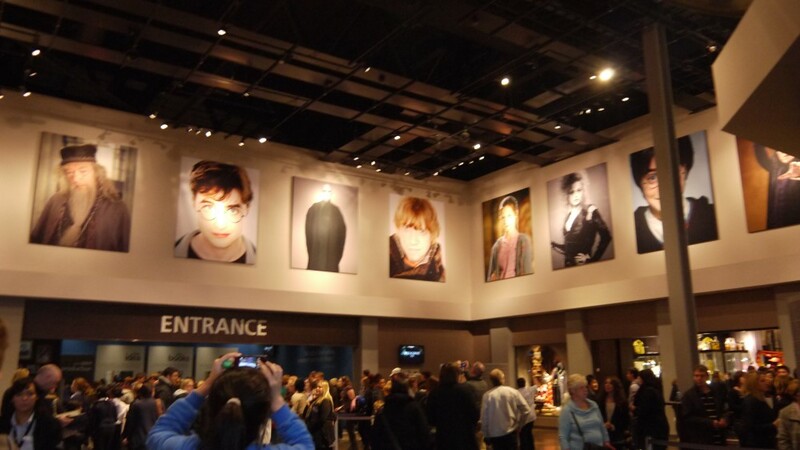 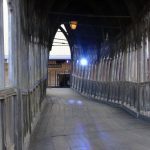 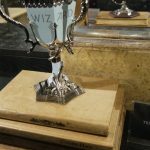 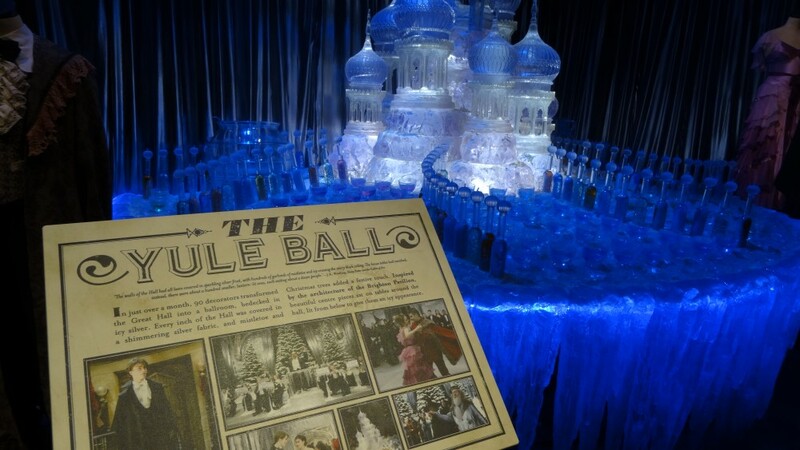 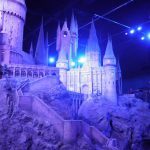 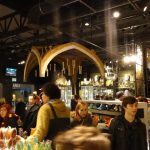 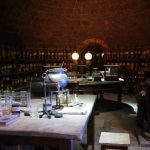 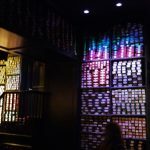 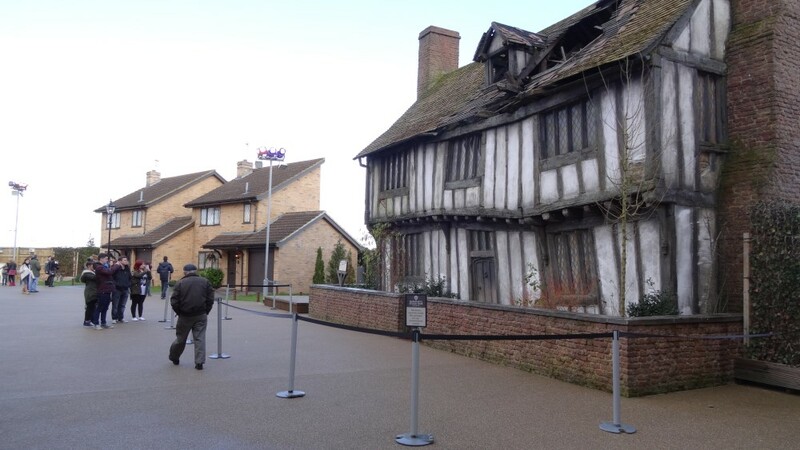 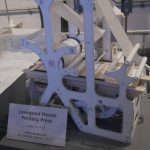 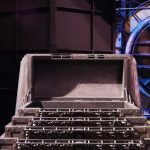 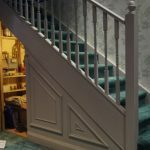 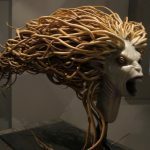 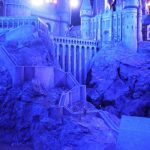 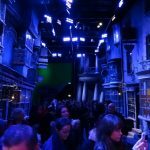 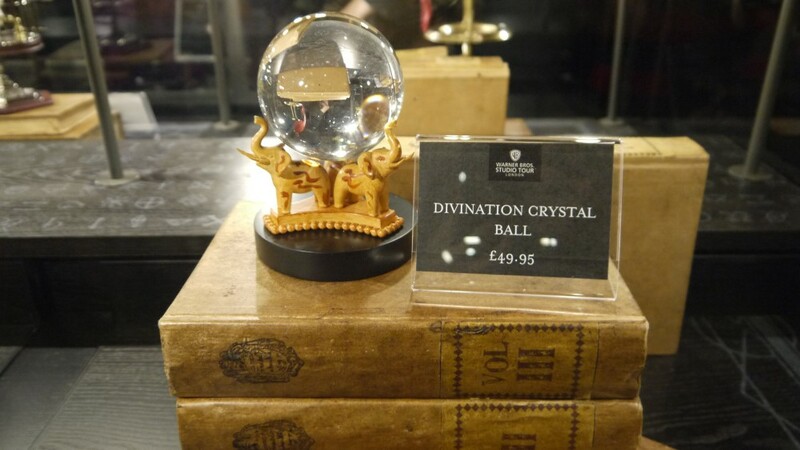 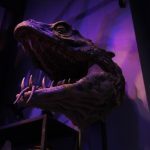 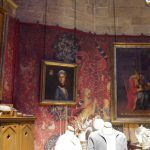 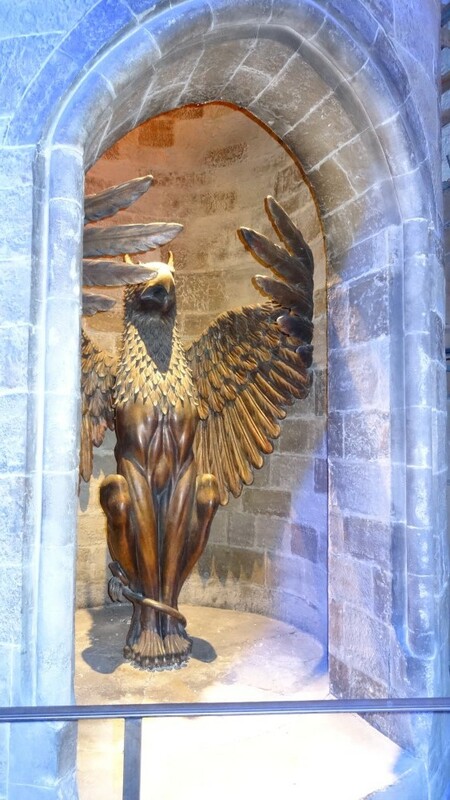 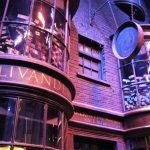 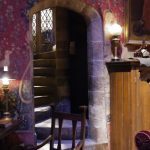 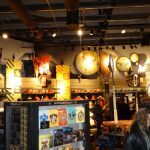 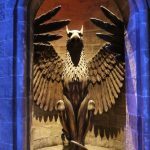 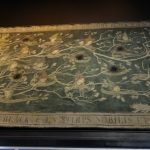 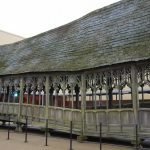 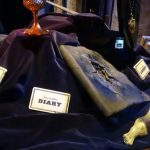 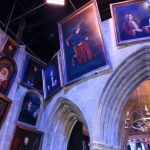 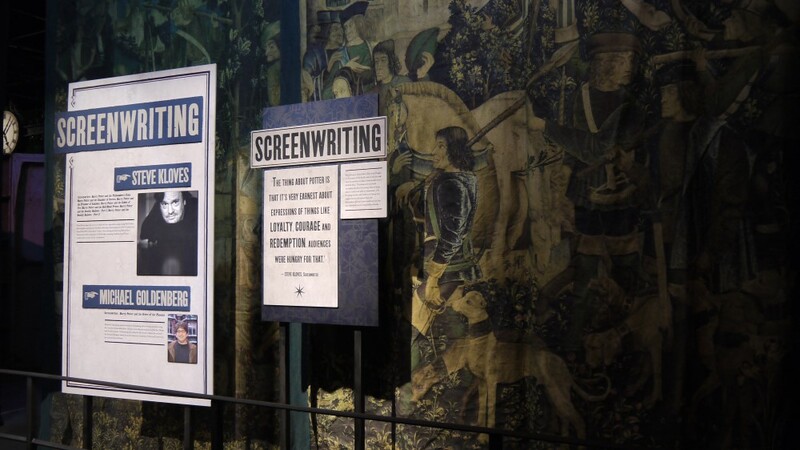 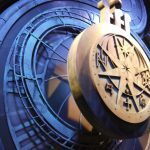 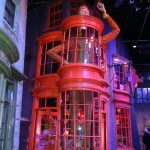 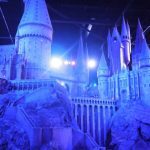 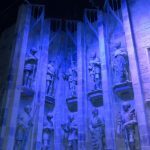 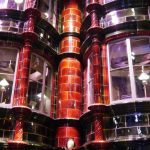 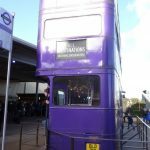 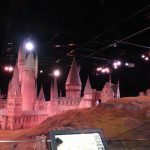 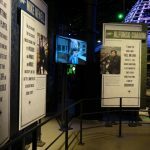 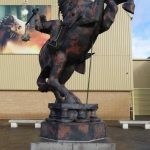 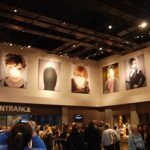 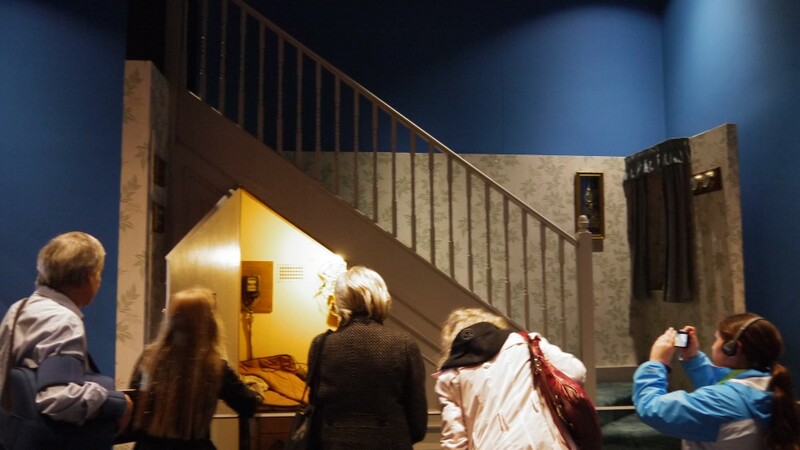 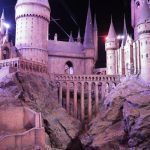 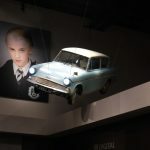 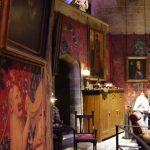 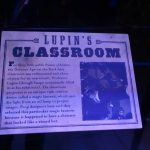 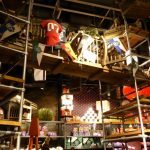 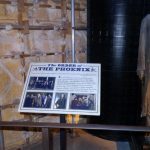 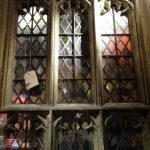 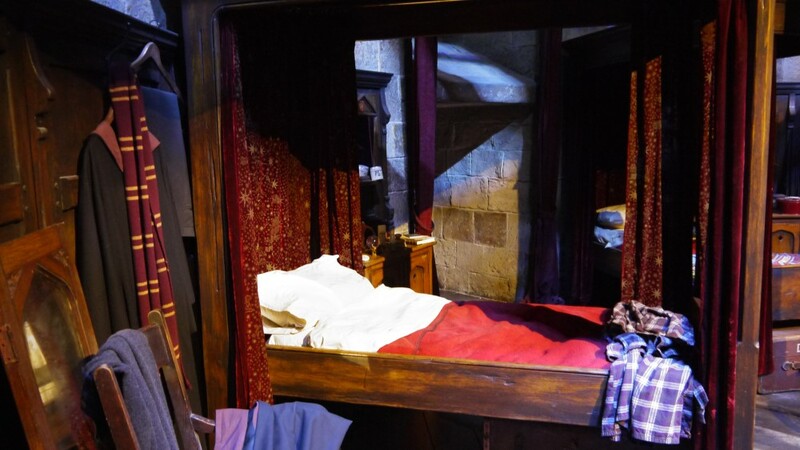 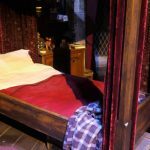 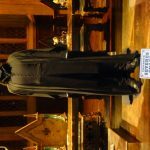 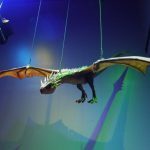 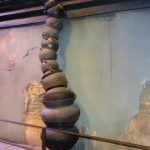 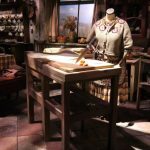 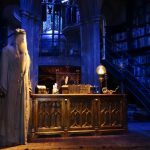 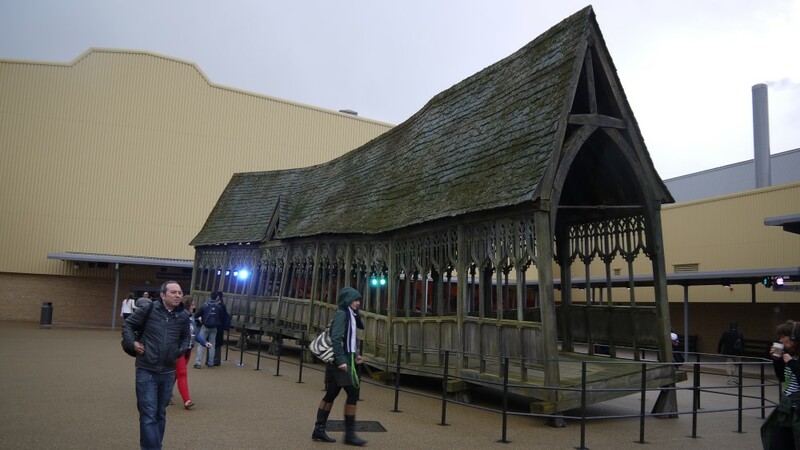 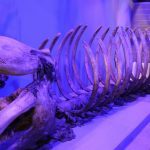 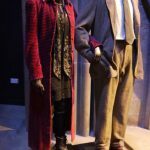 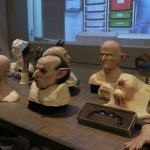 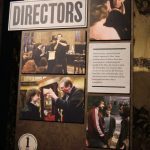 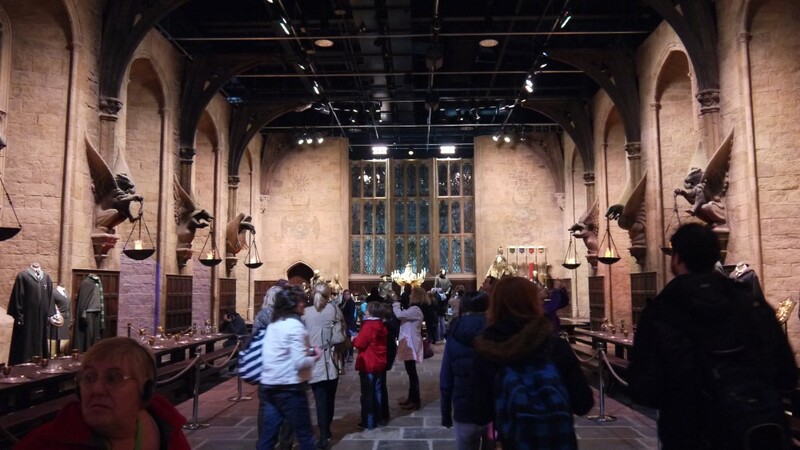 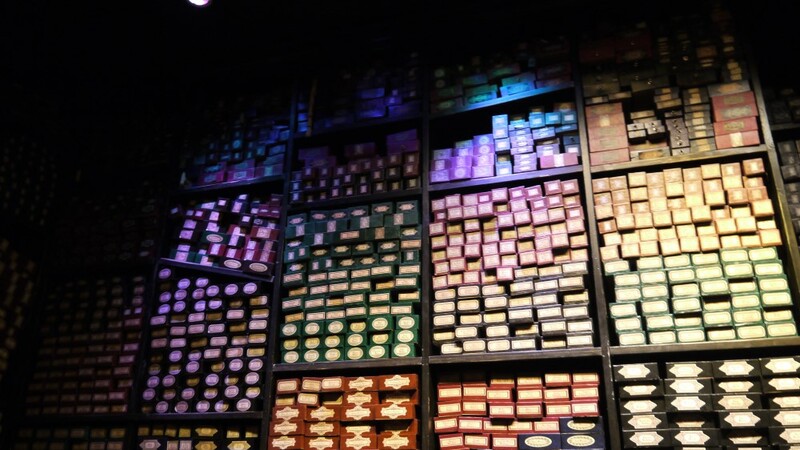 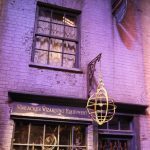 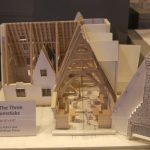 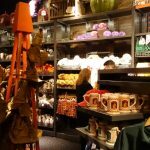 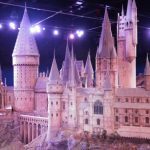 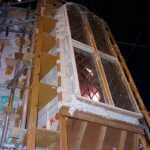 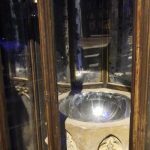 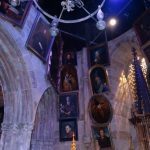 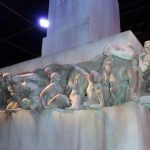 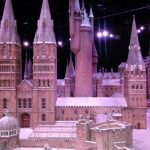 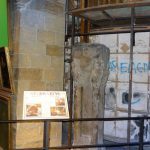 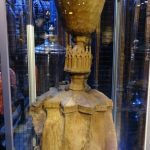 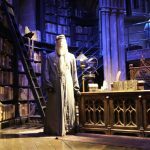 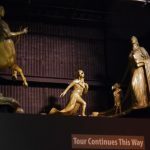 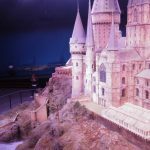 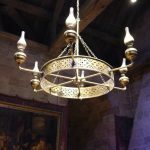 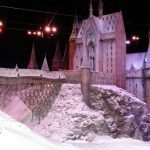 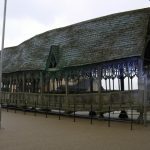 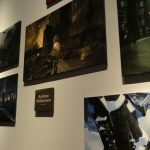 One of the most magical places in the UK, the Harry Potter Studio Tours takes you behind the magic of one the most successful franchise ever in the Harry Potter films, with lots to see. 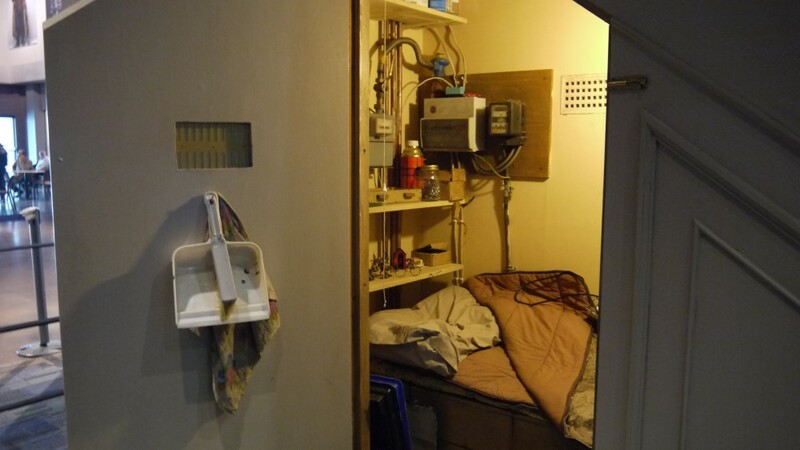 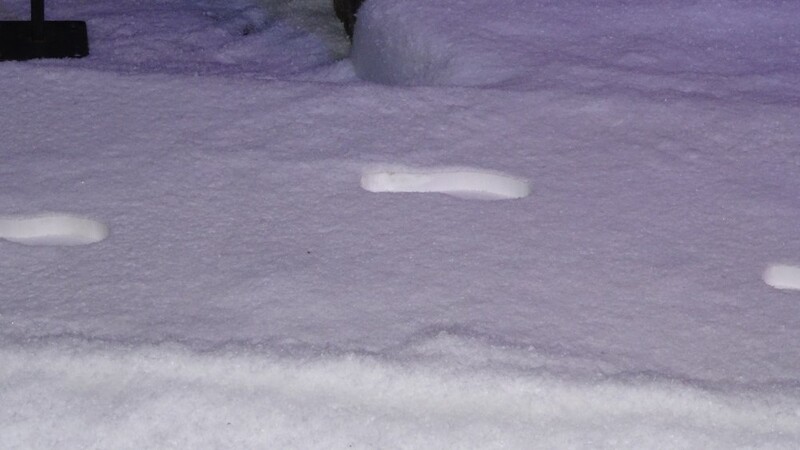 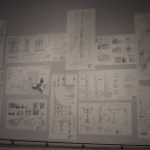 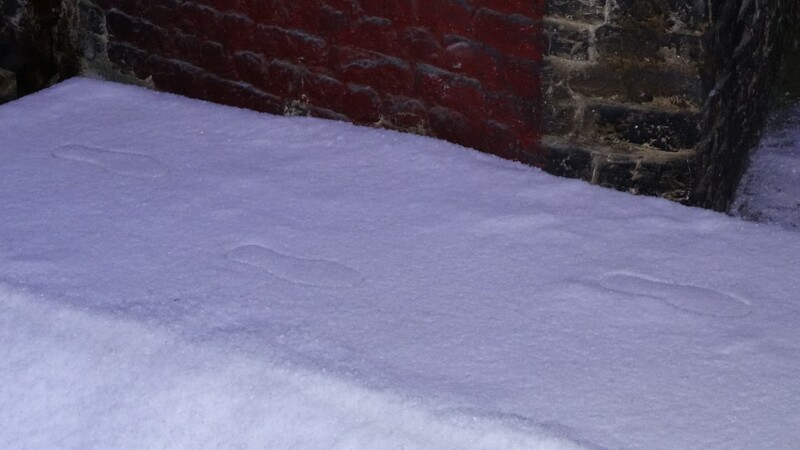 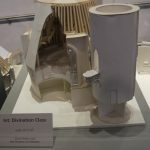 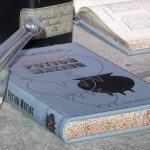 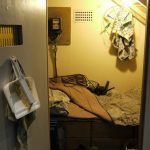 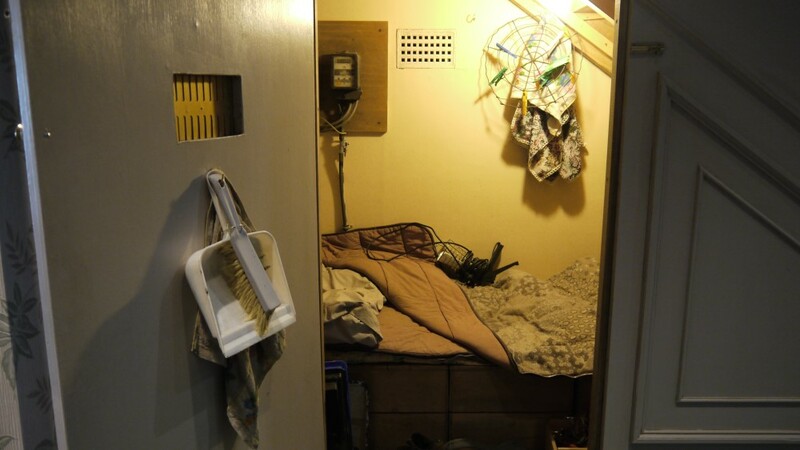 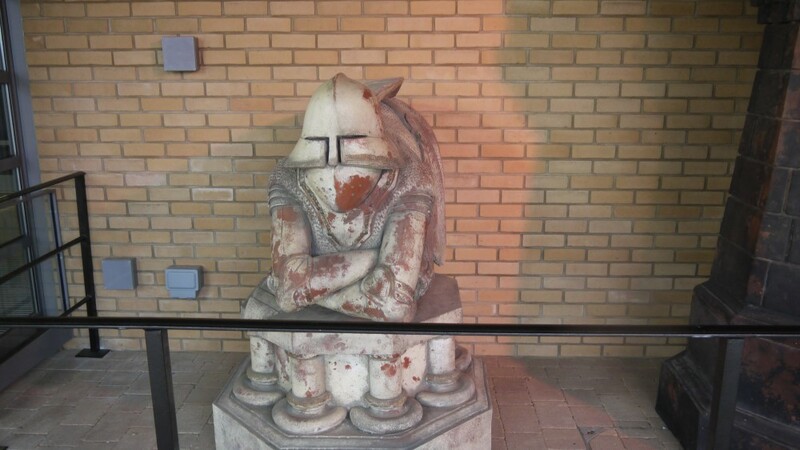 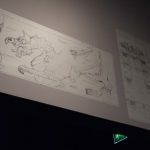 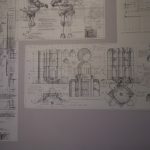 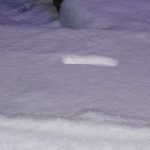 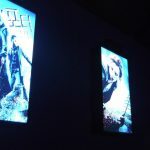 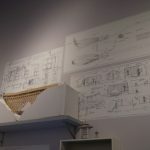 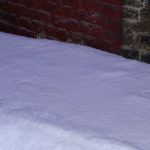 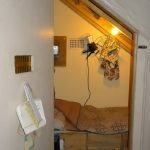 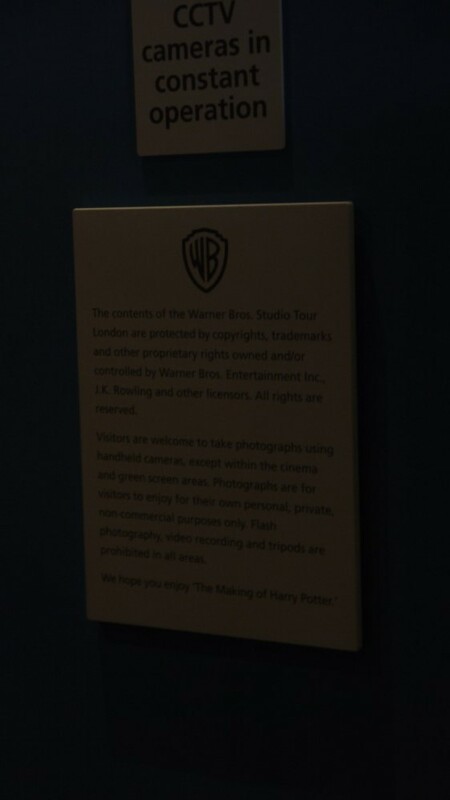 This is what you will see below. 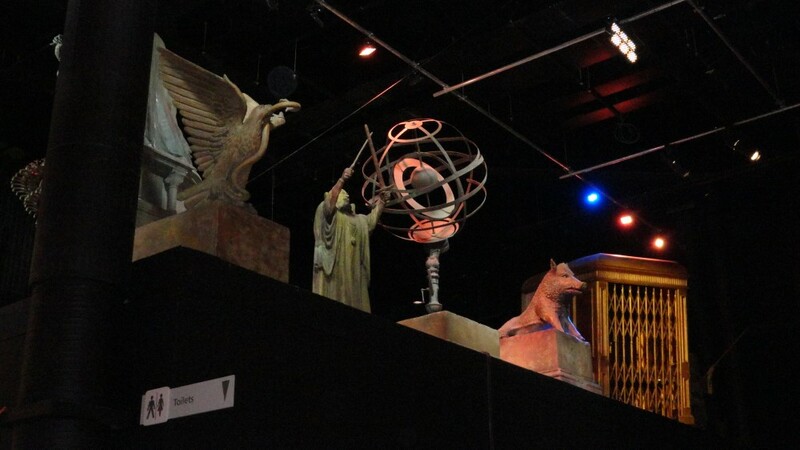 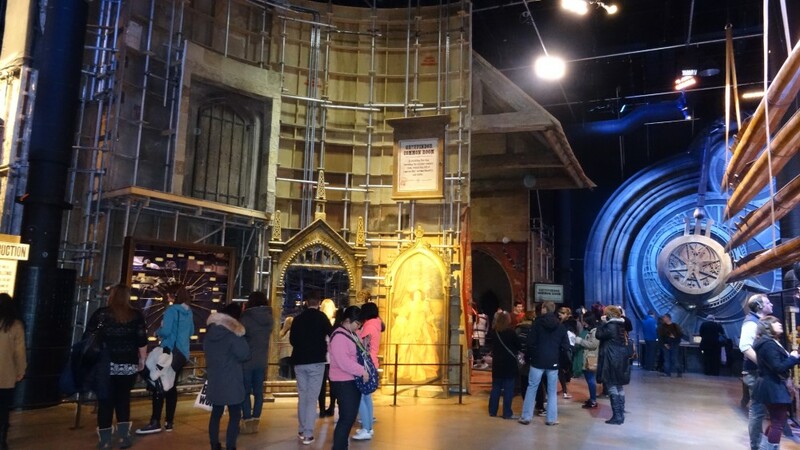 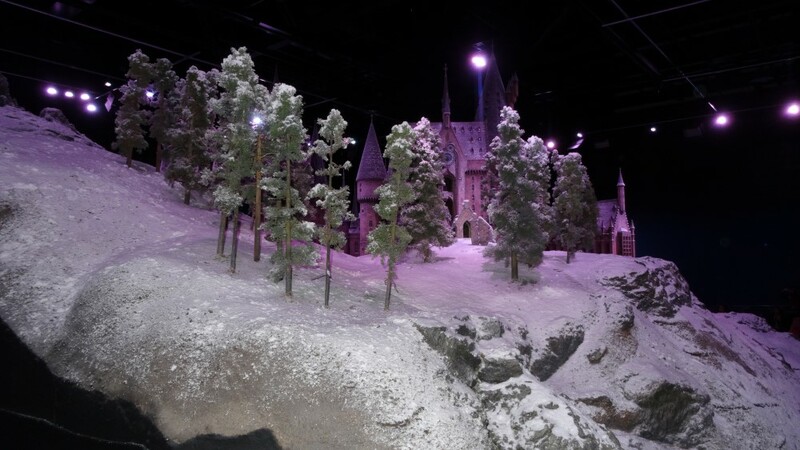 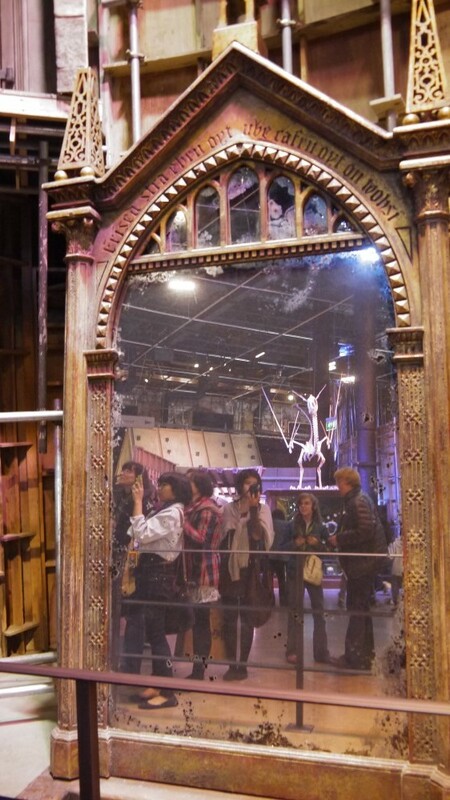 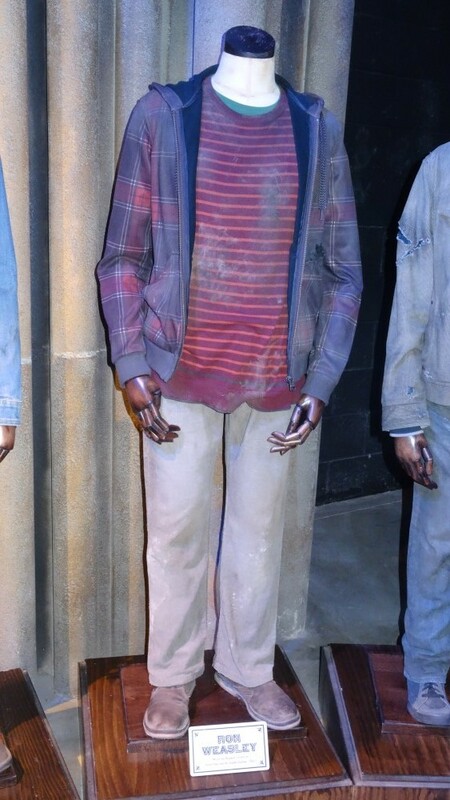 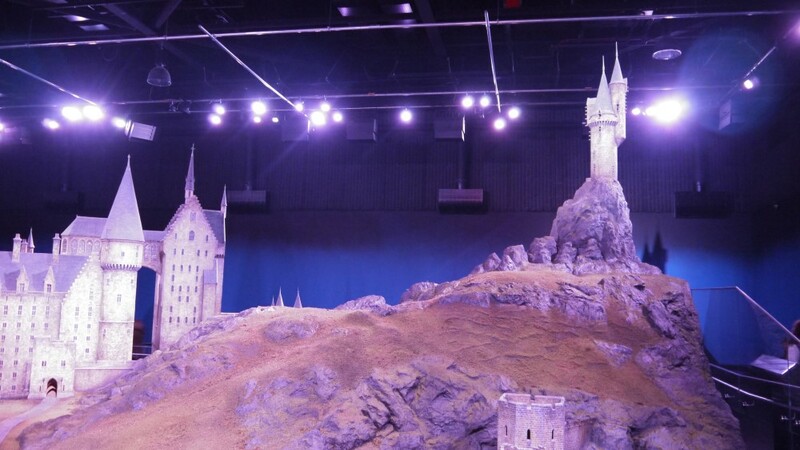 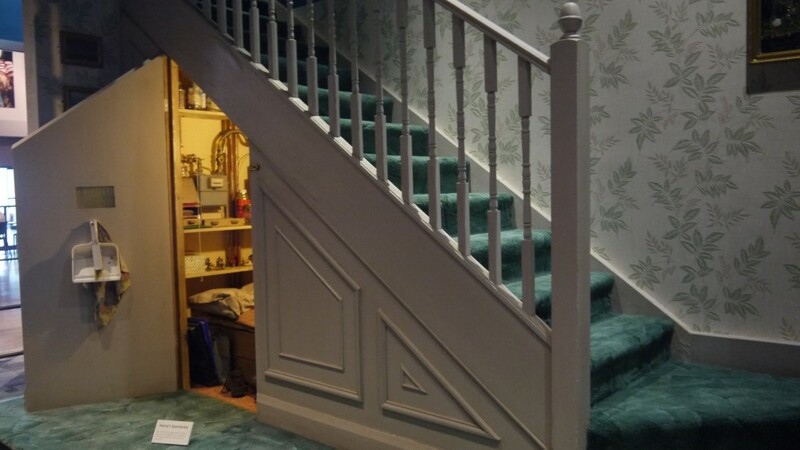 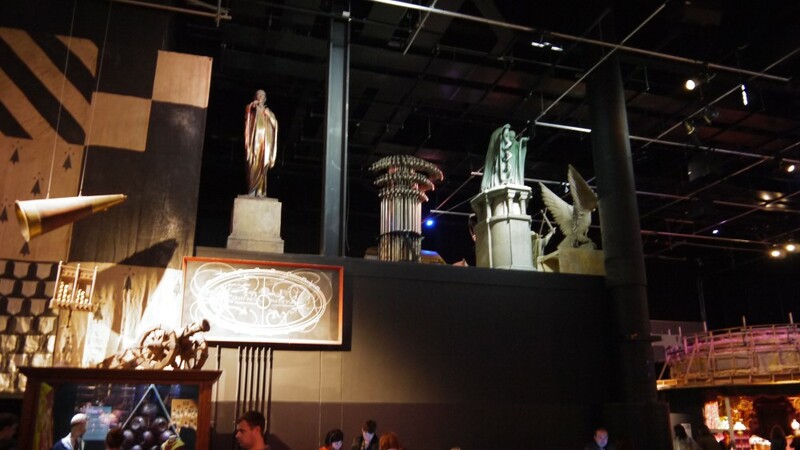 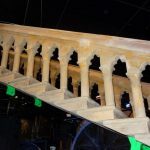 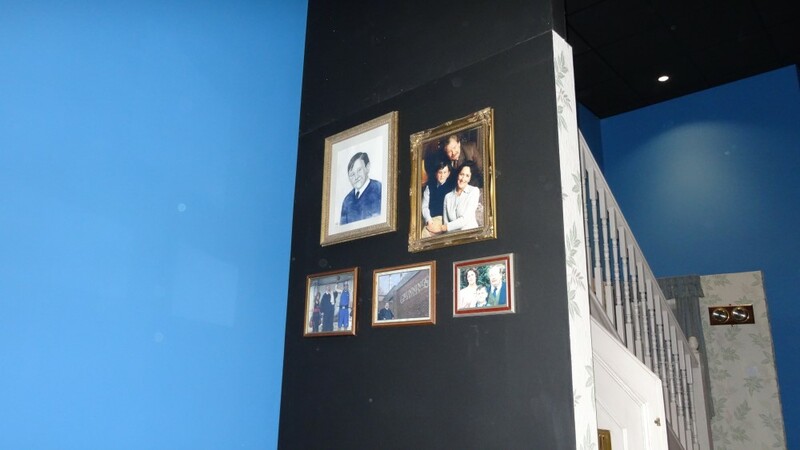 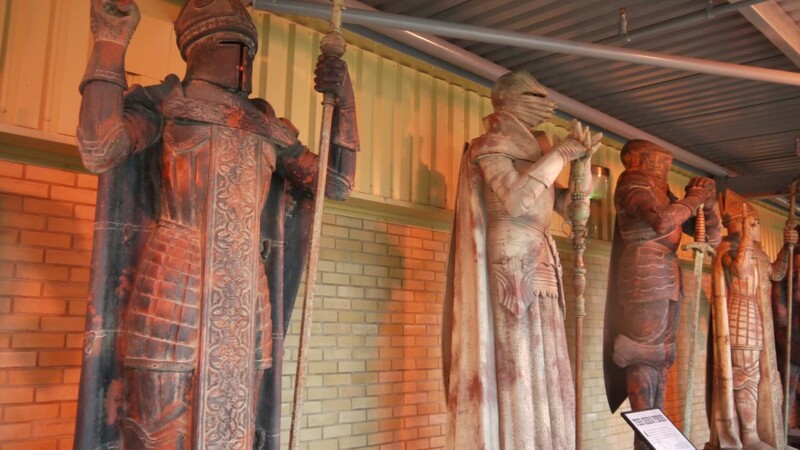 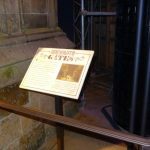 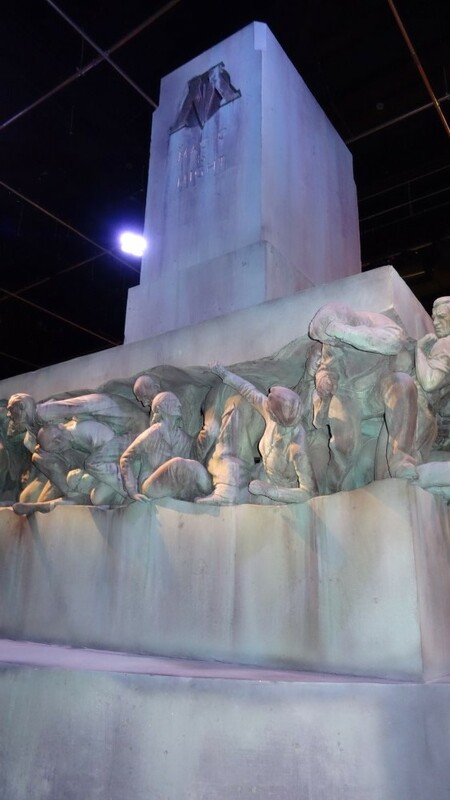 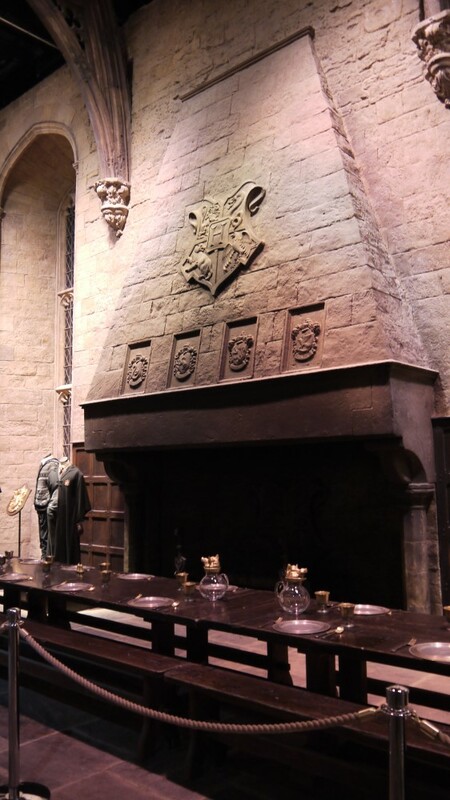 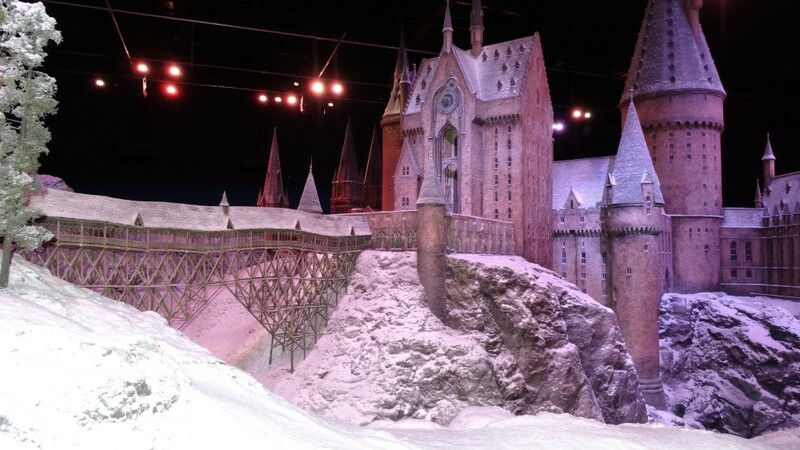 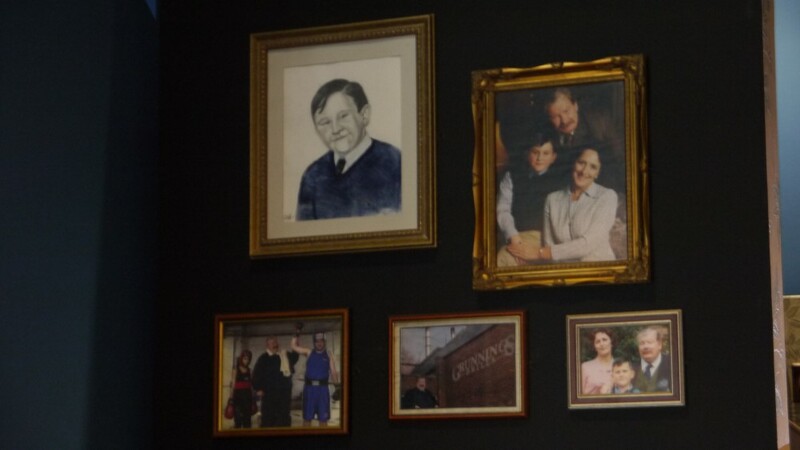 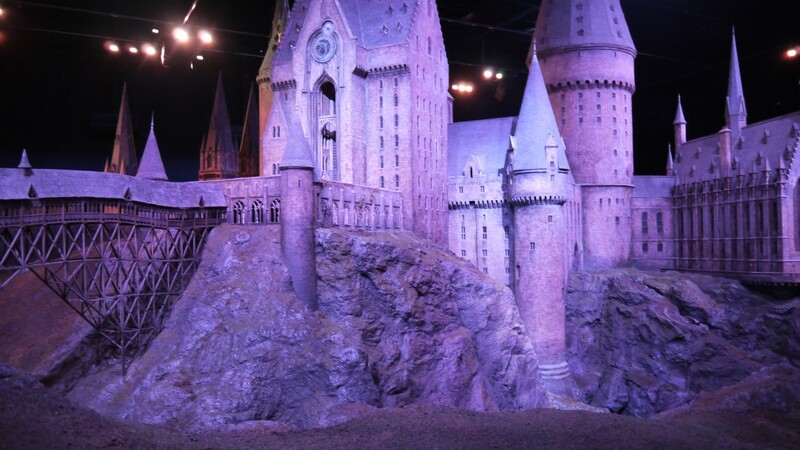 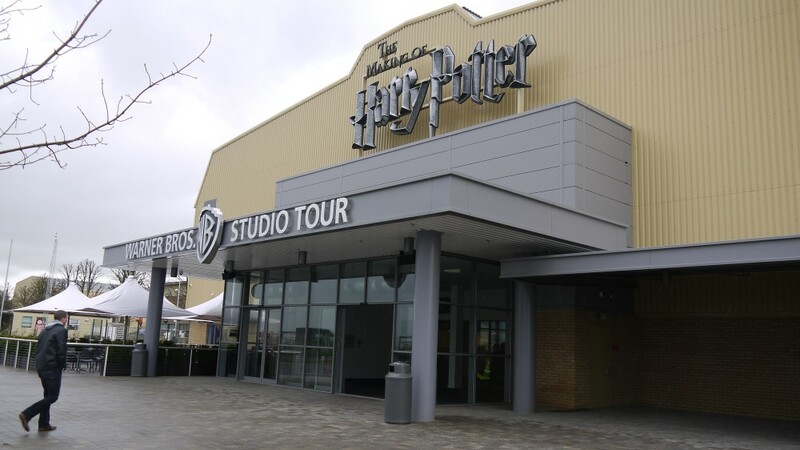 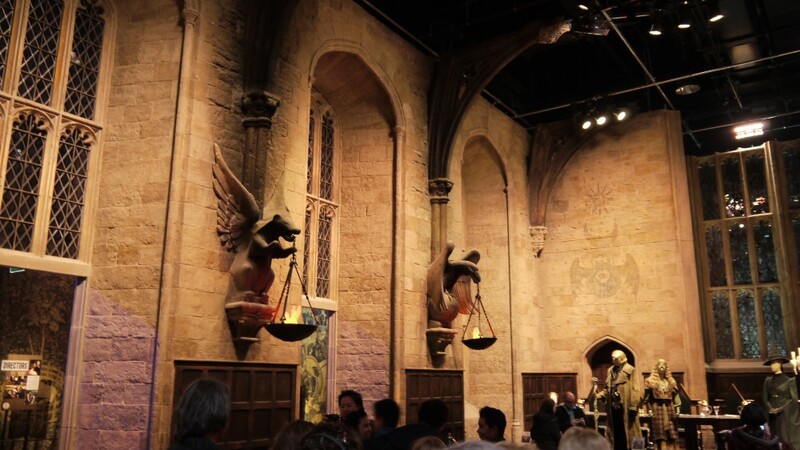 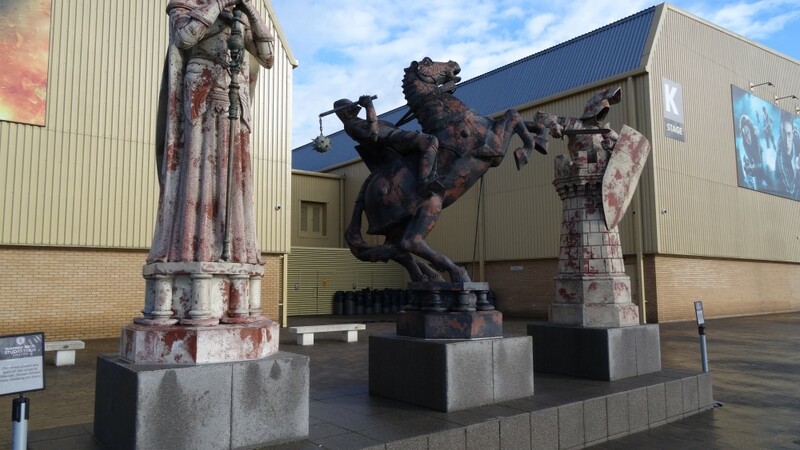 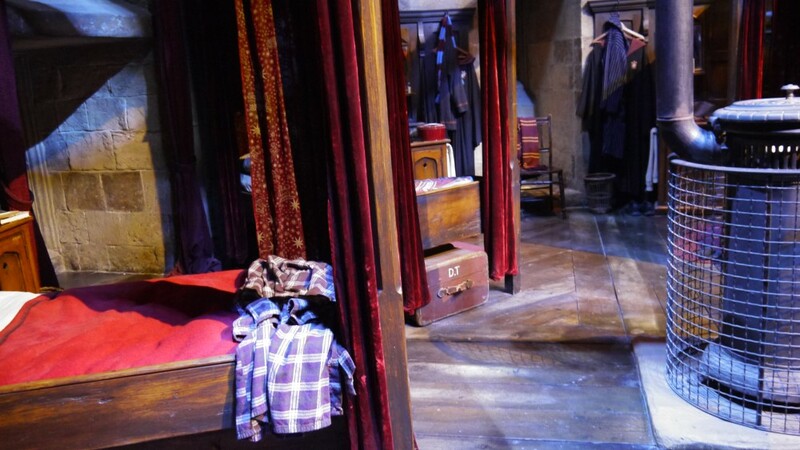 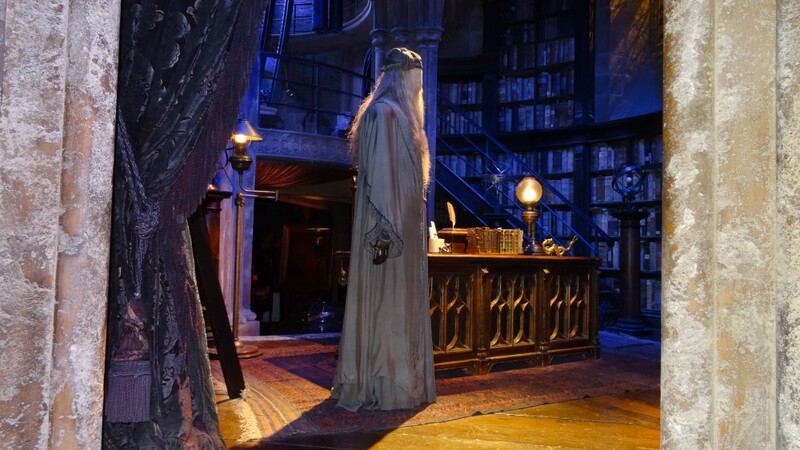 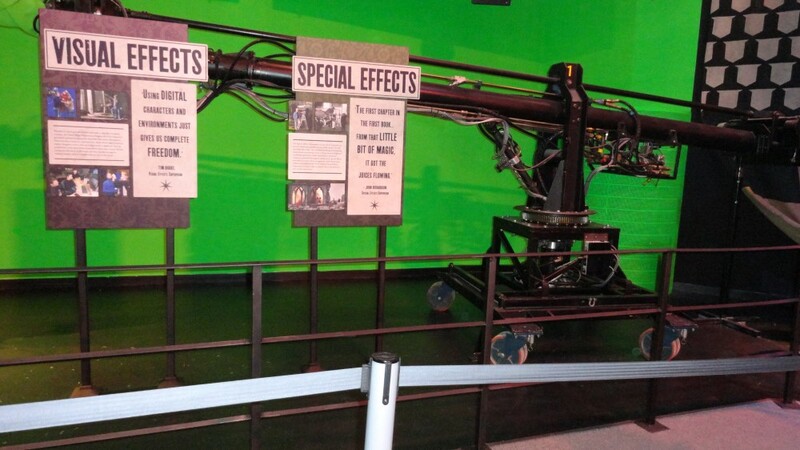 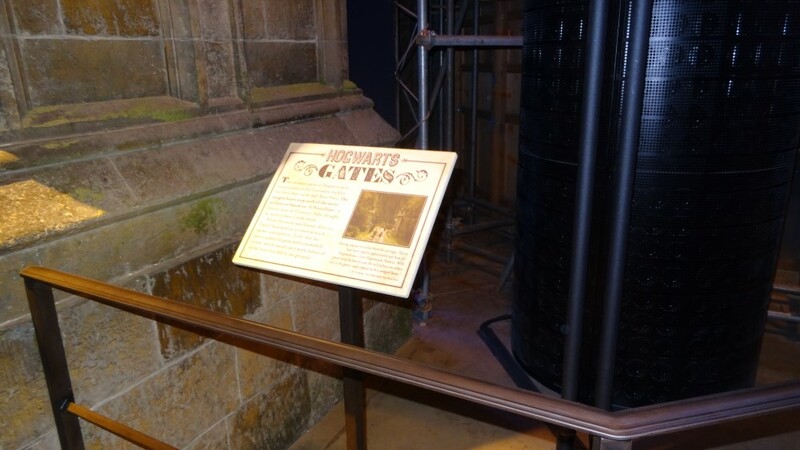 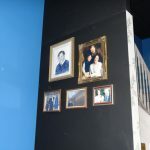 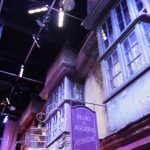 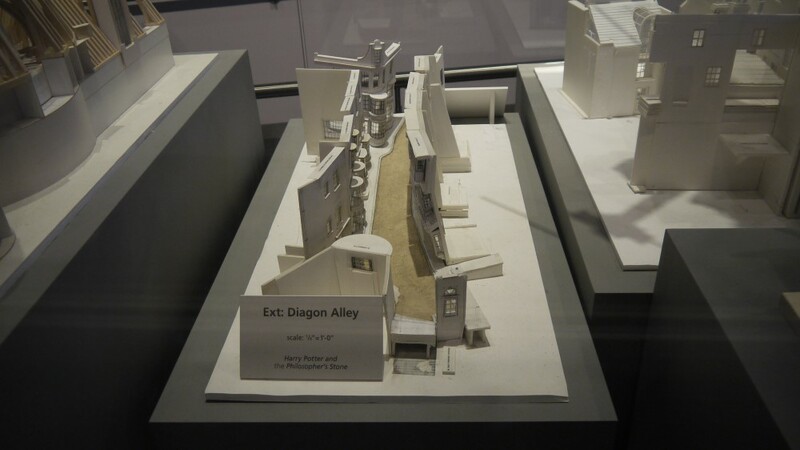 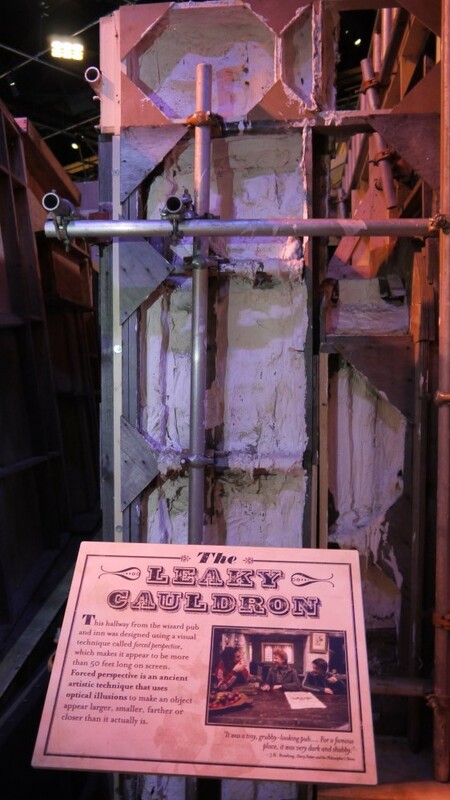 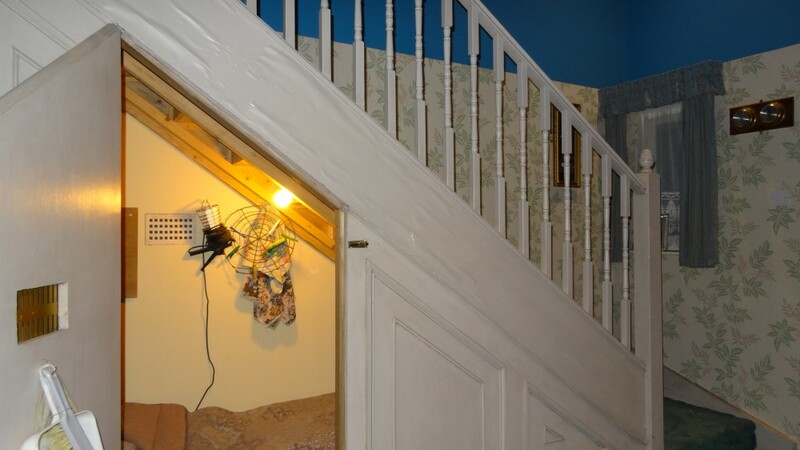 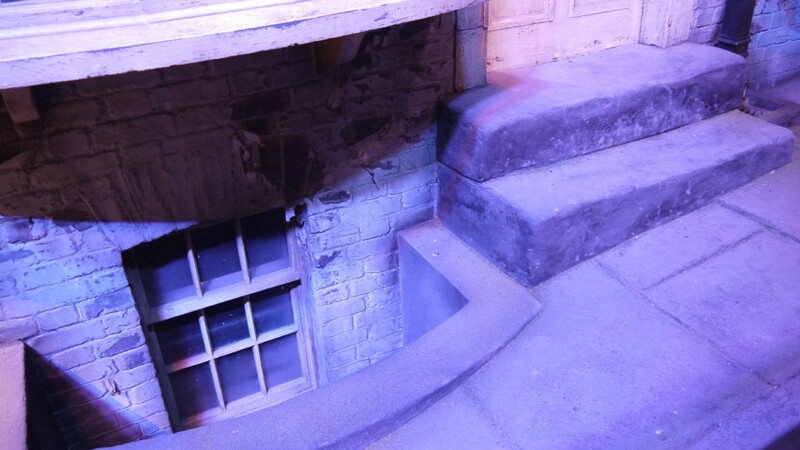 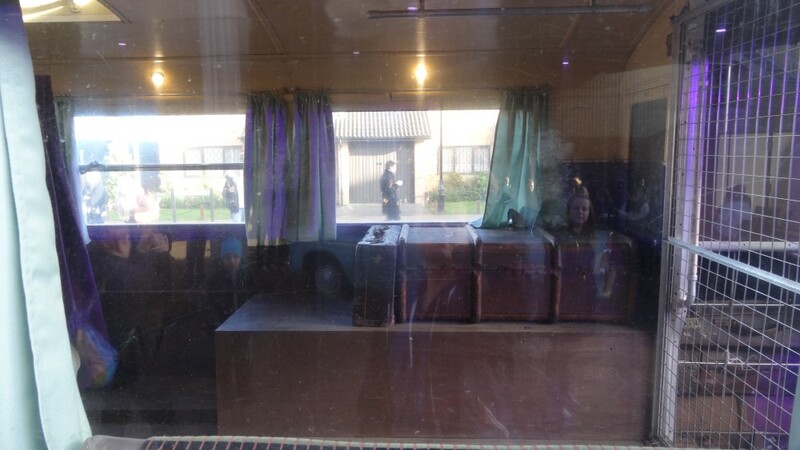 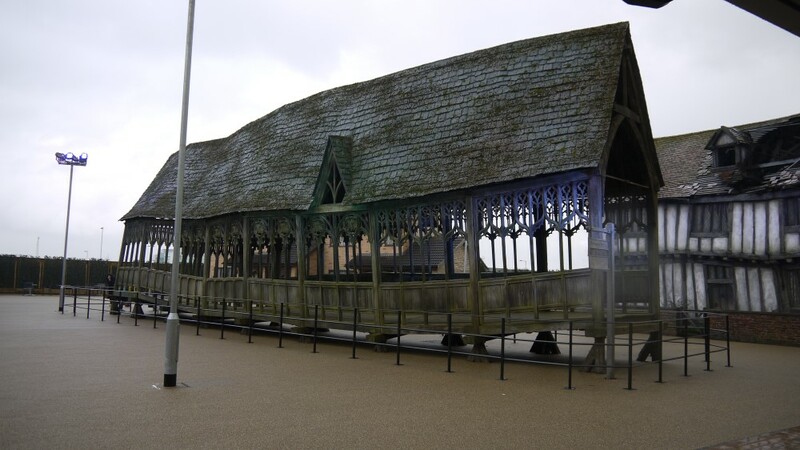 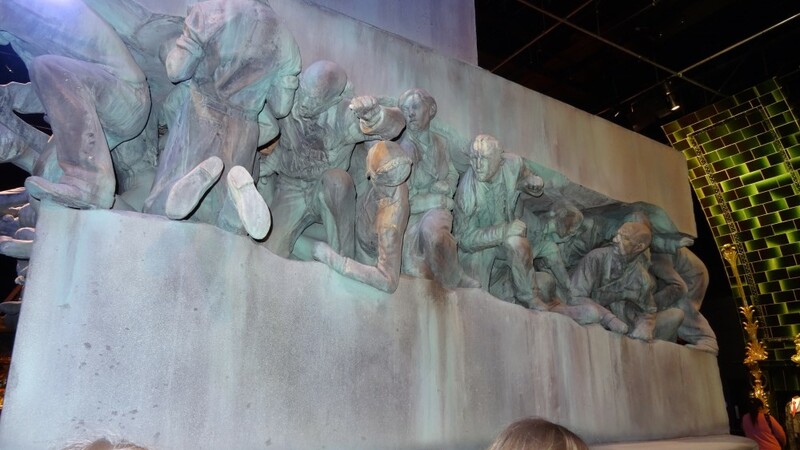 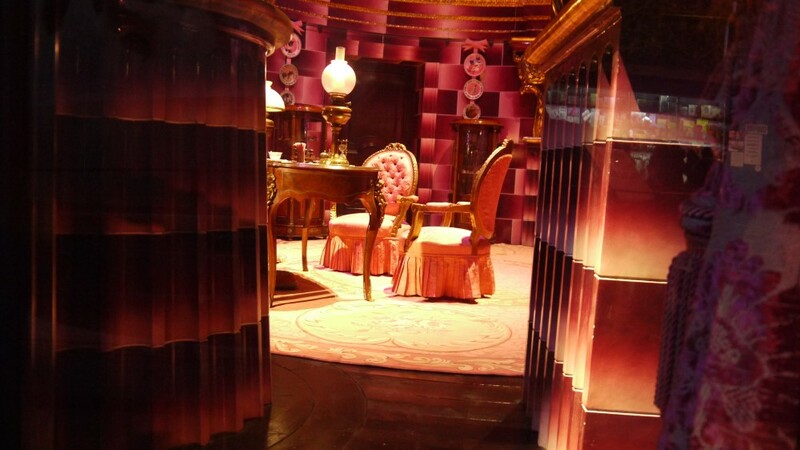 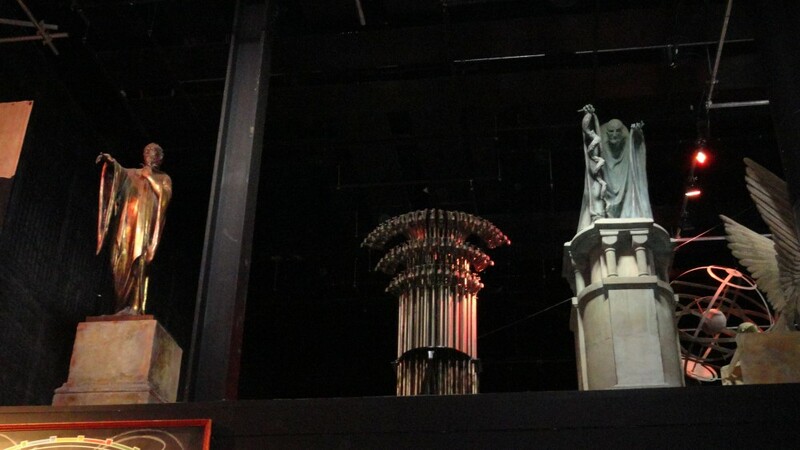 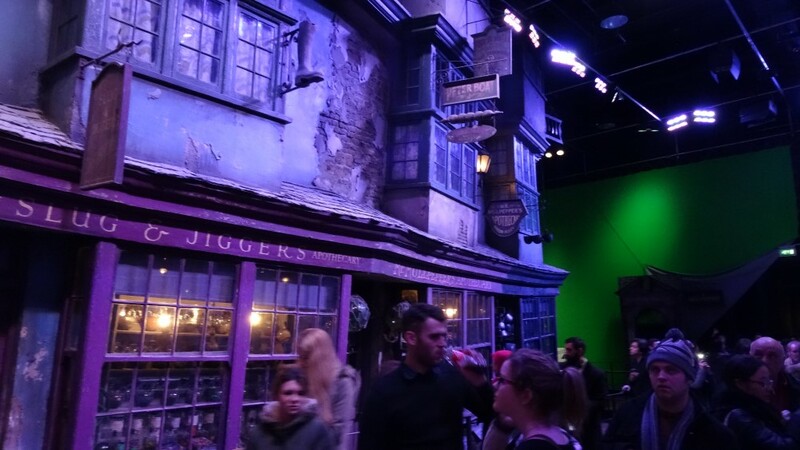 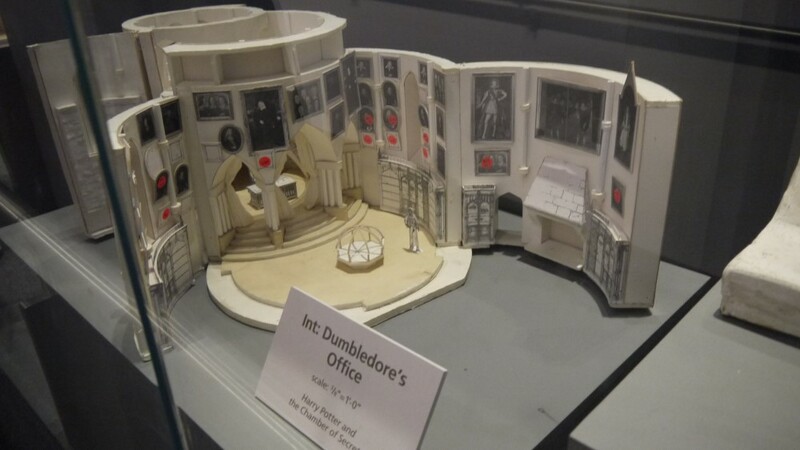 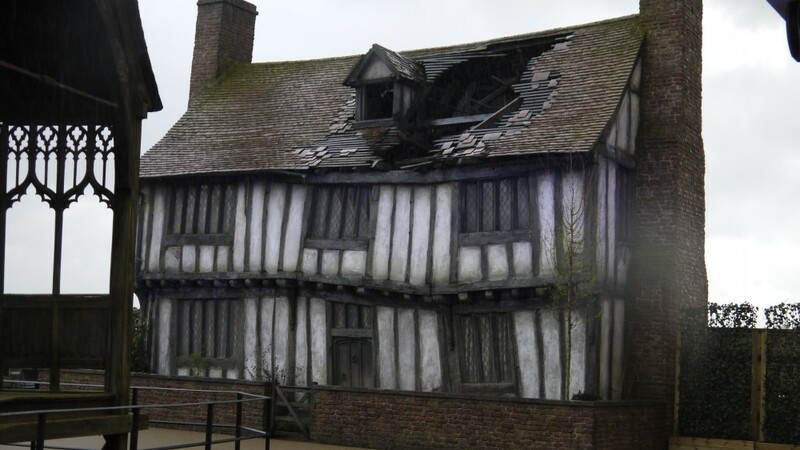 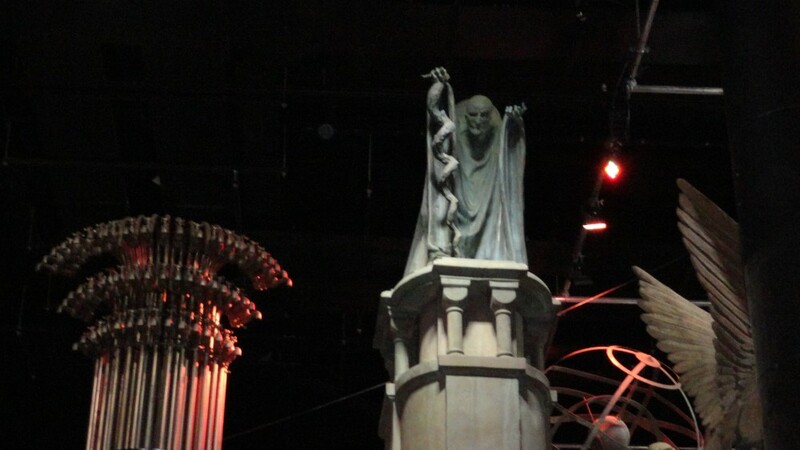 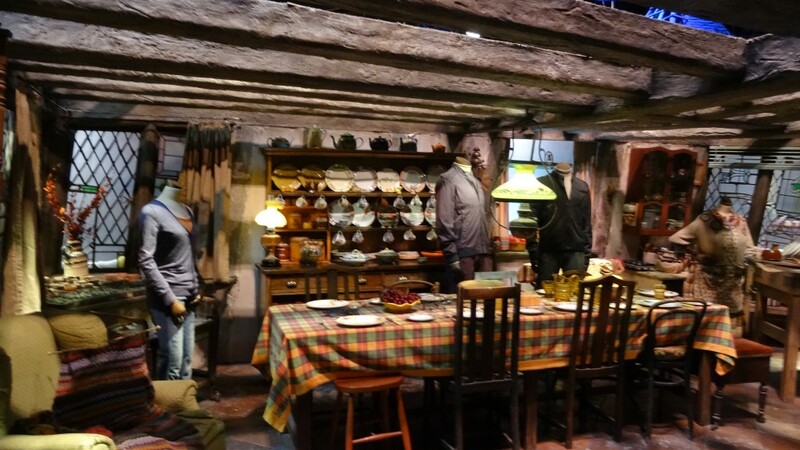 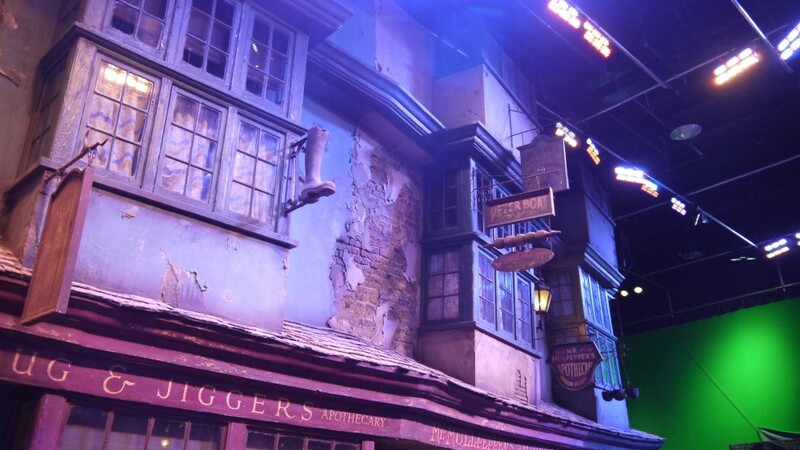 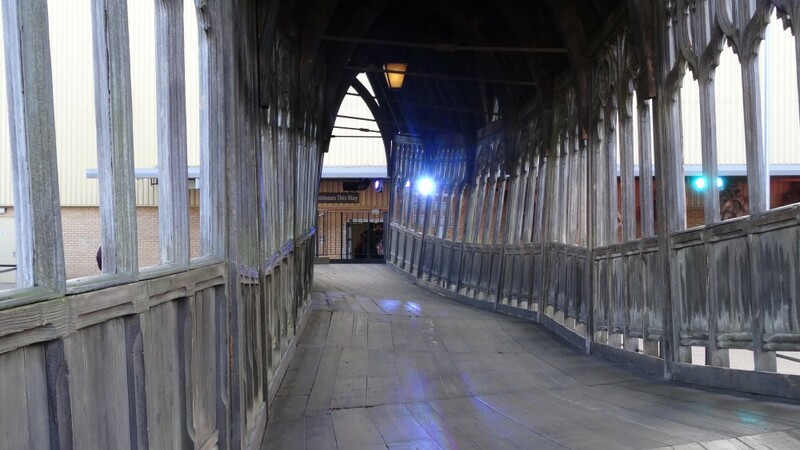 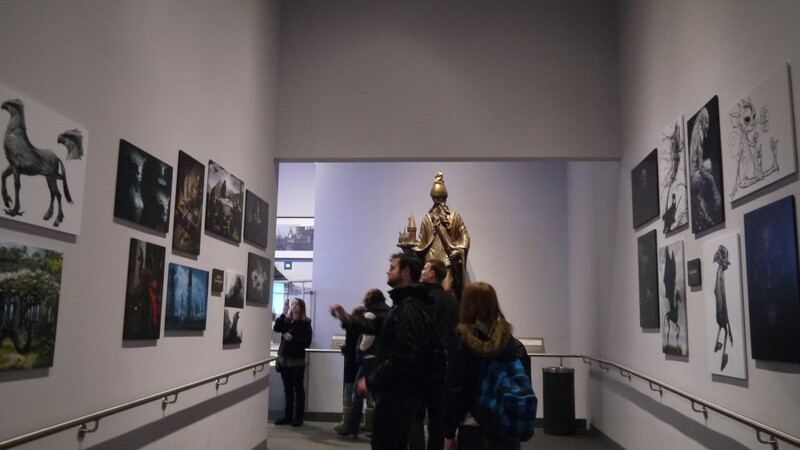 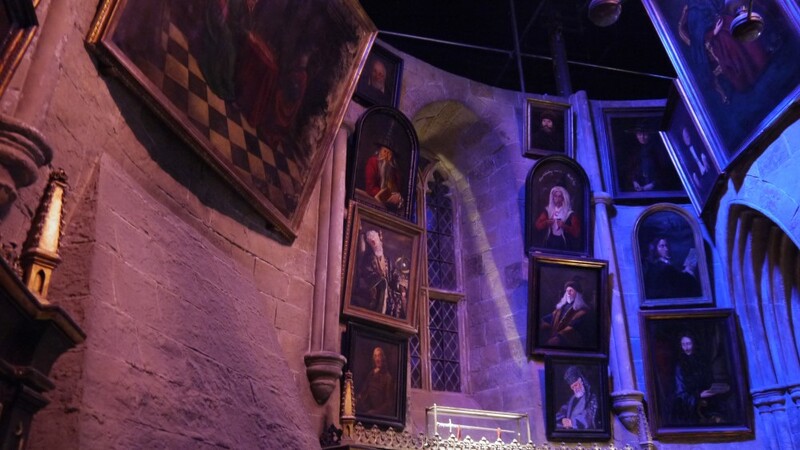 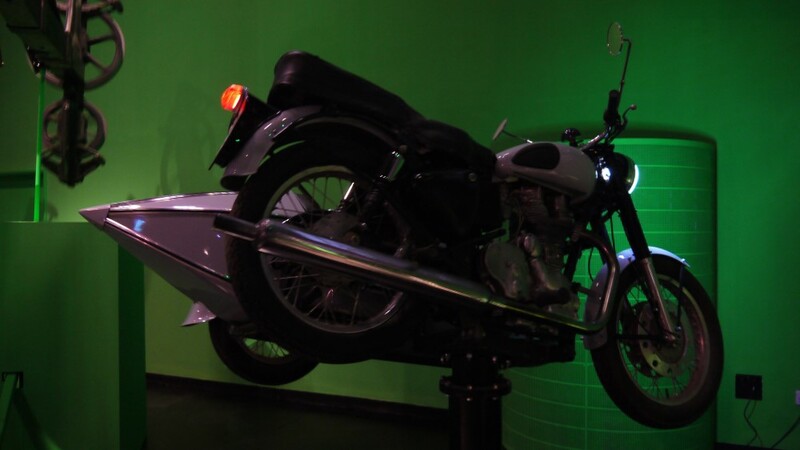 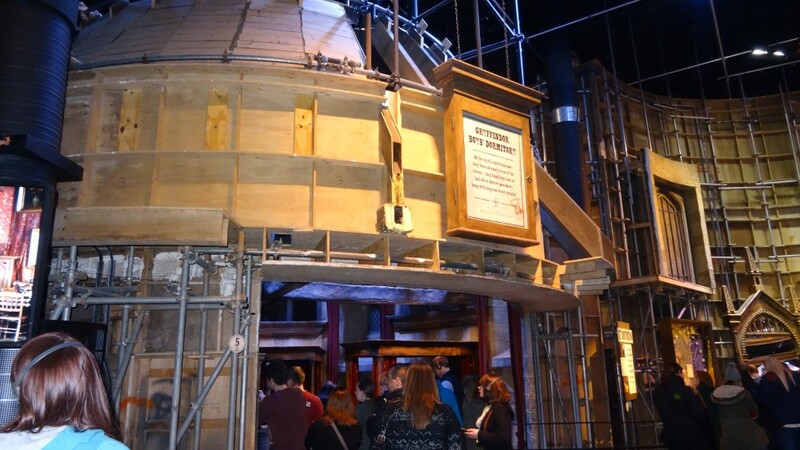 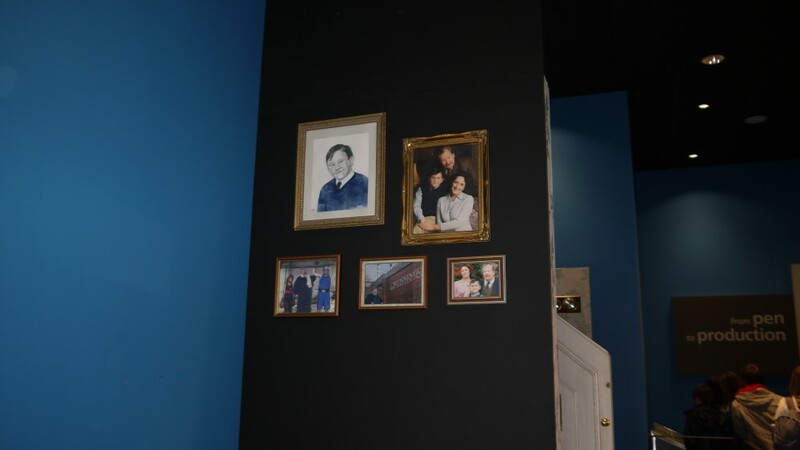 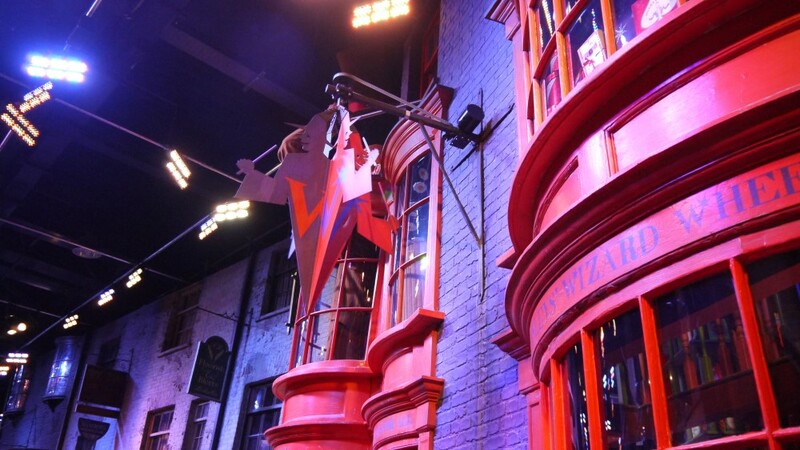 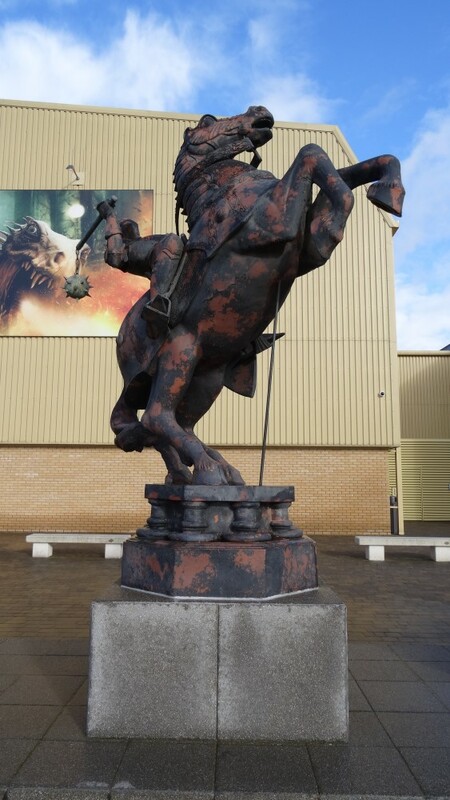 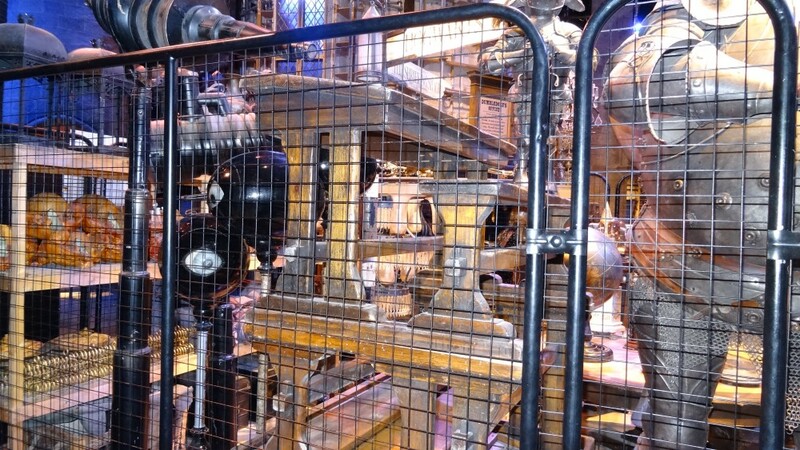 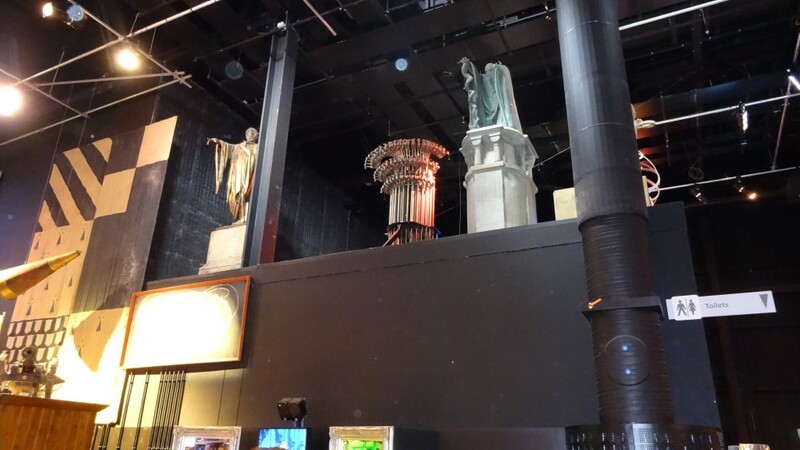 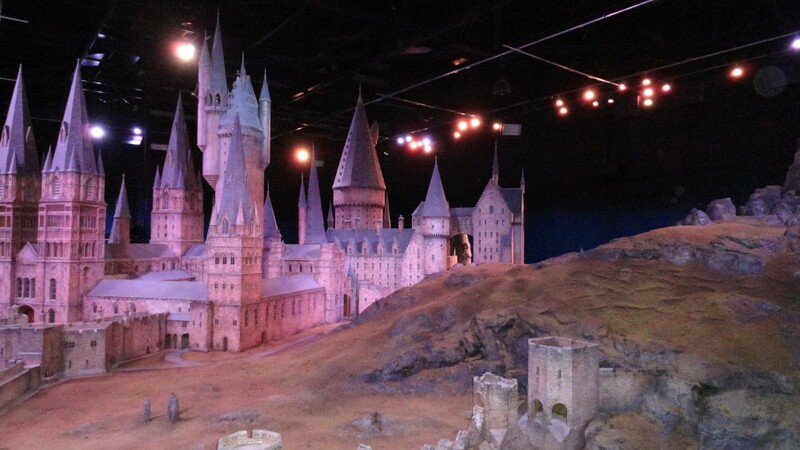 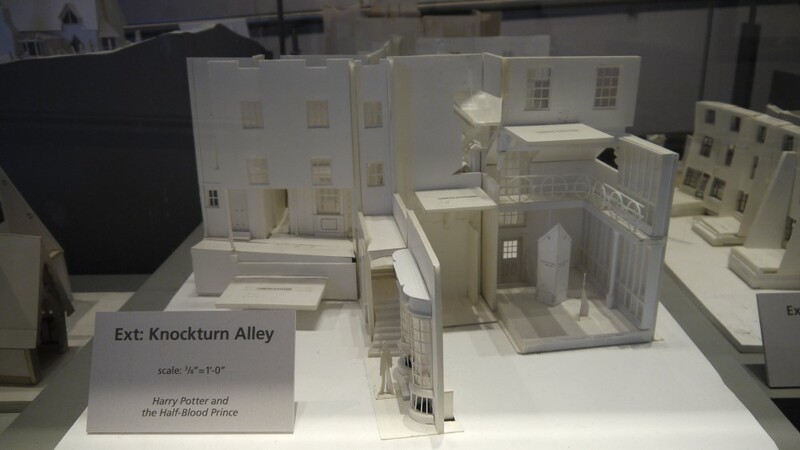 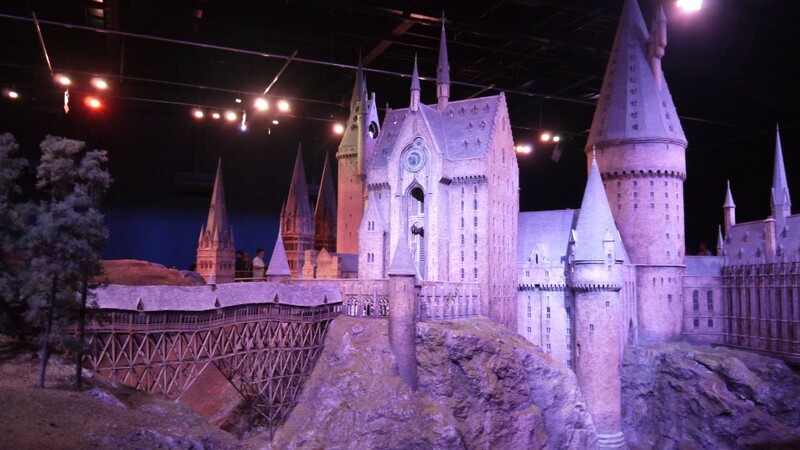 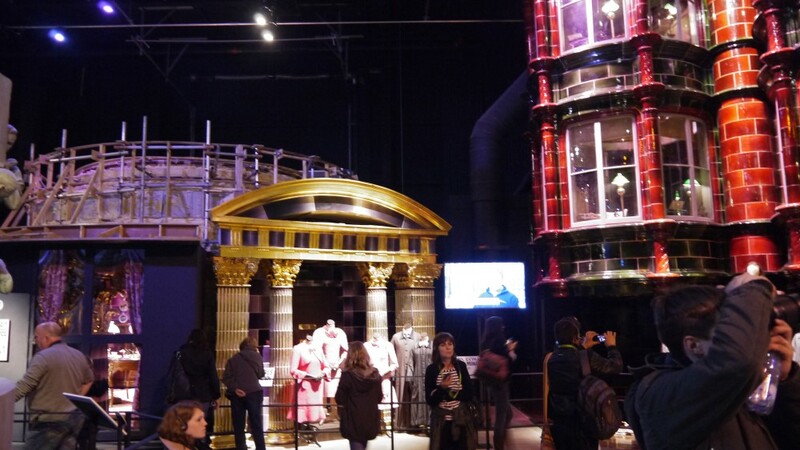 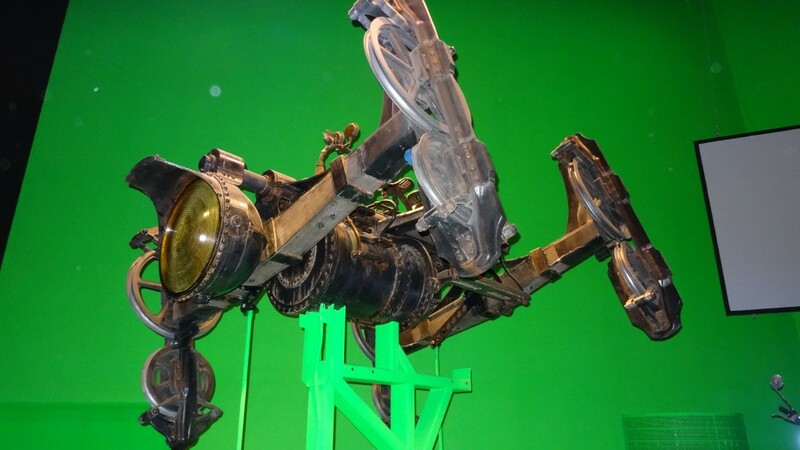 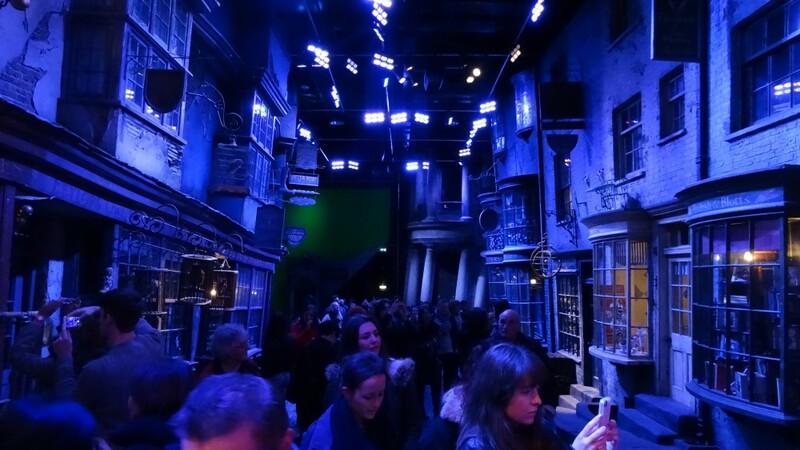 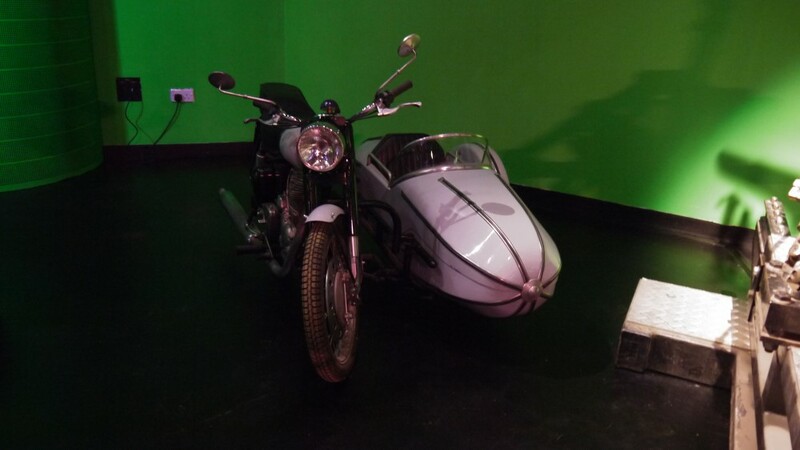 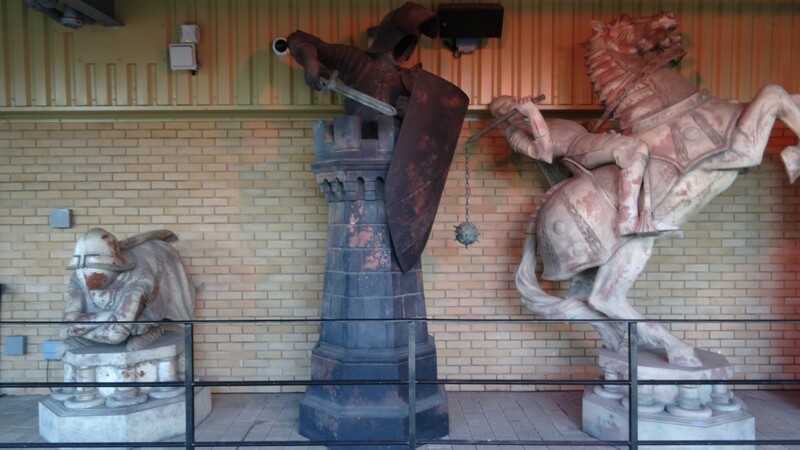 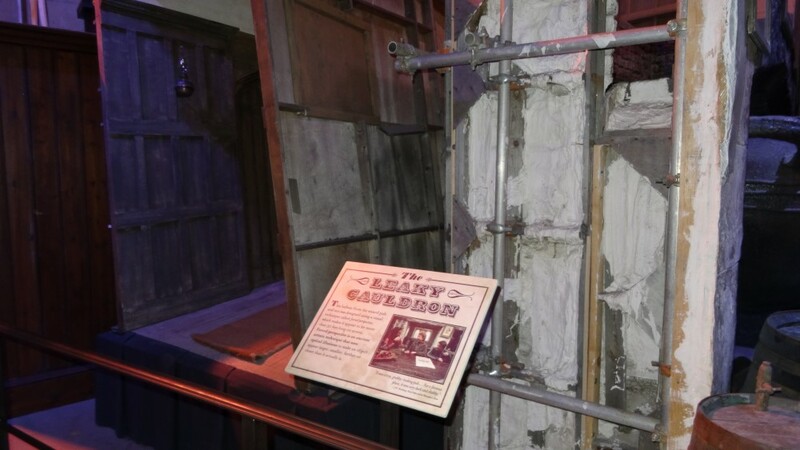 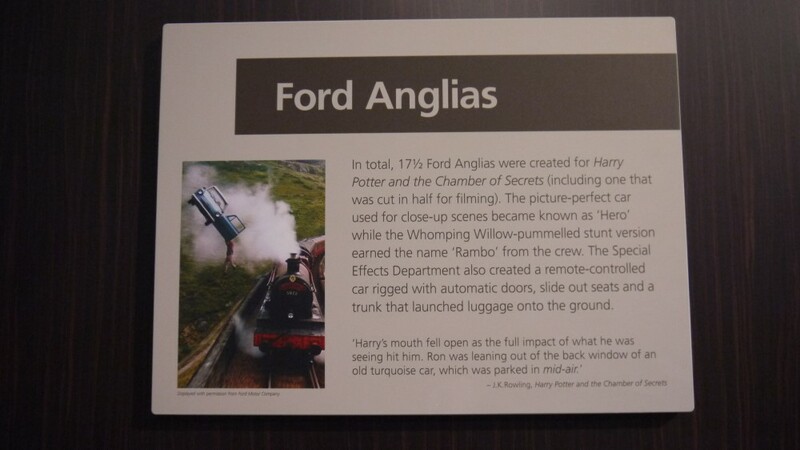 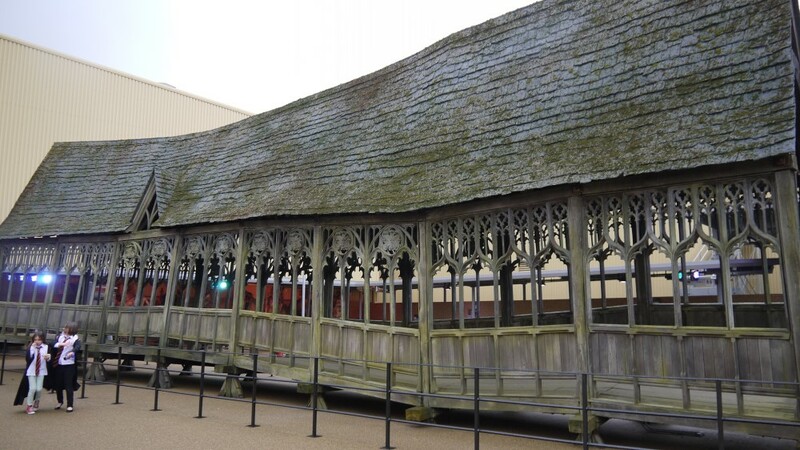 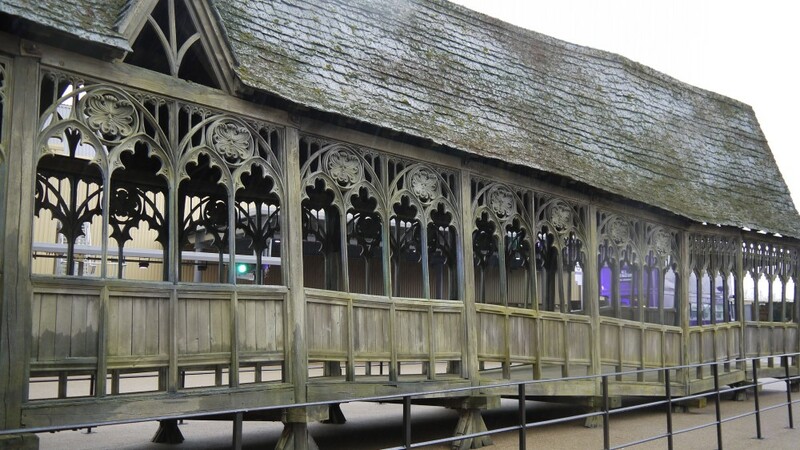 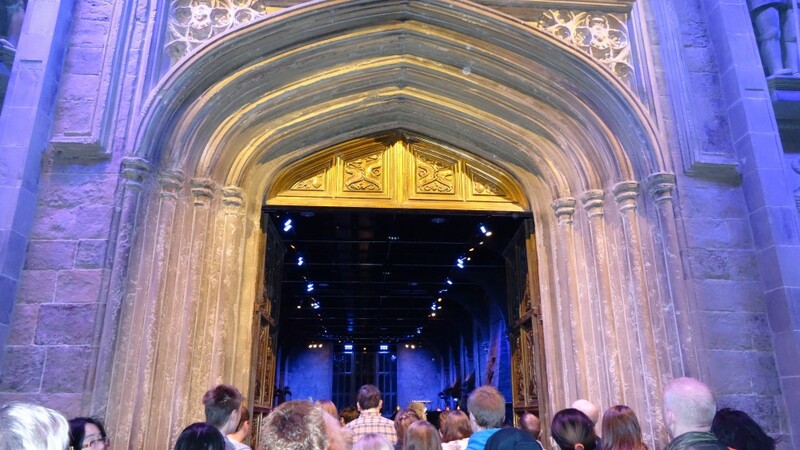 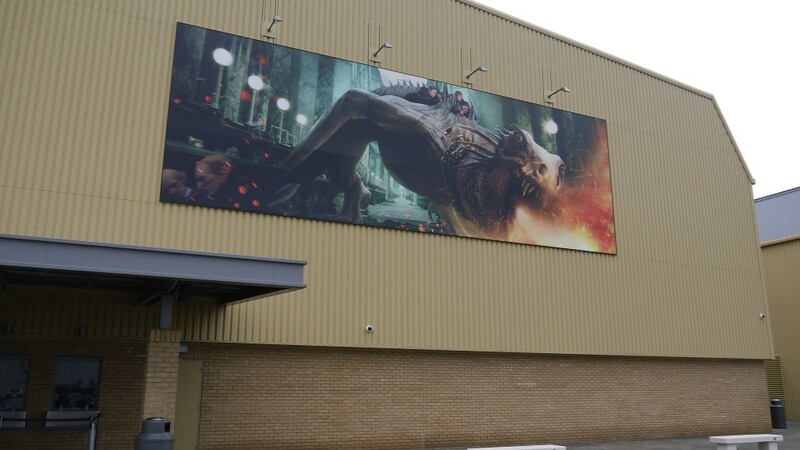 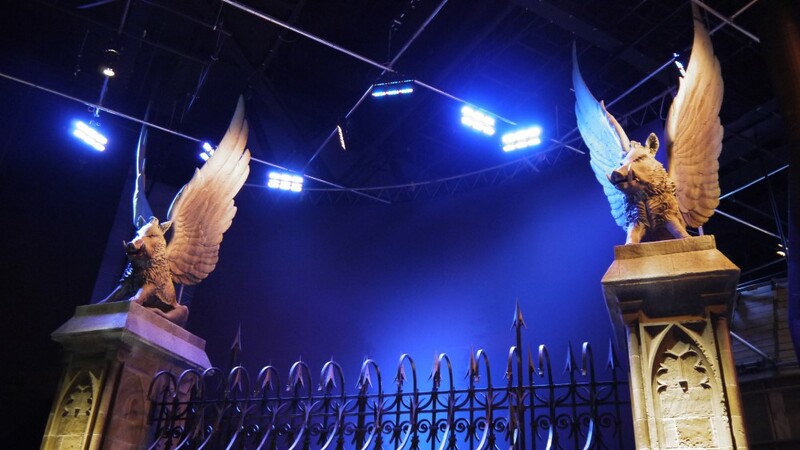 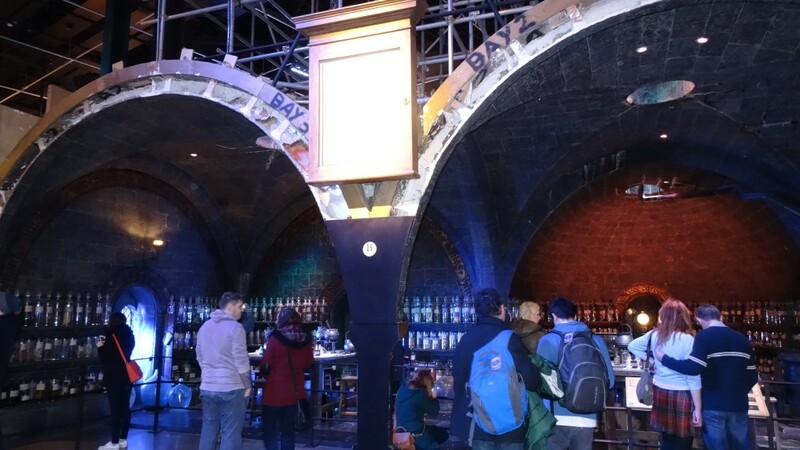 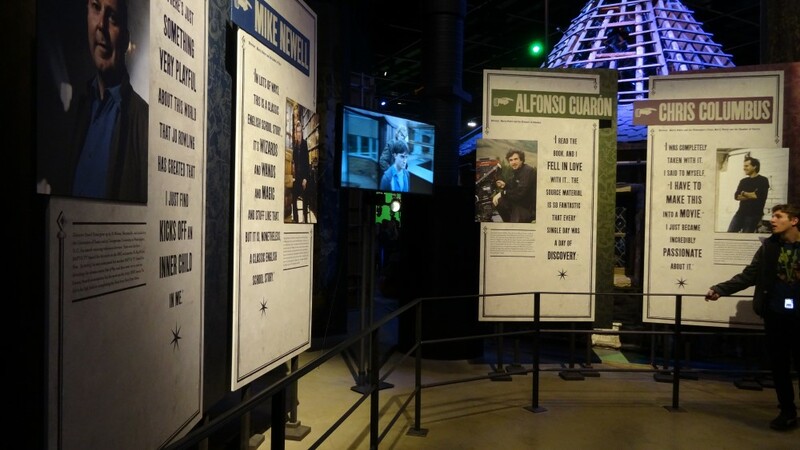 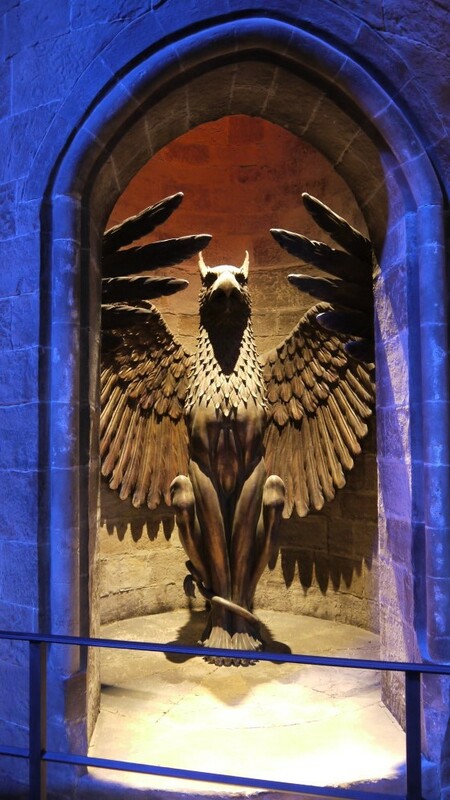 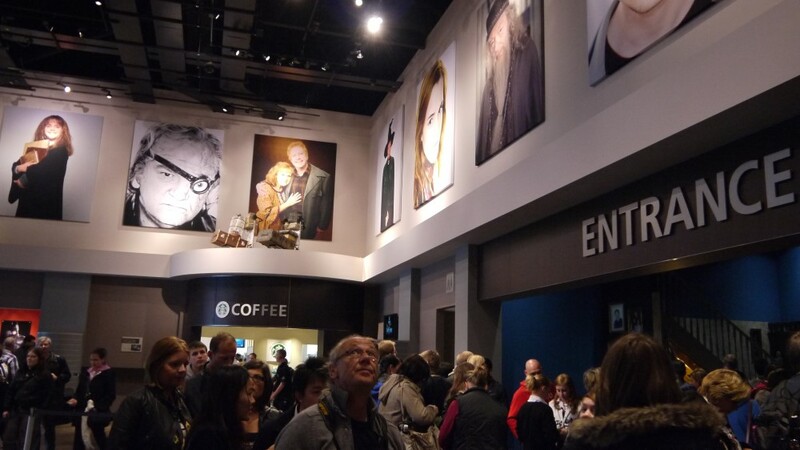 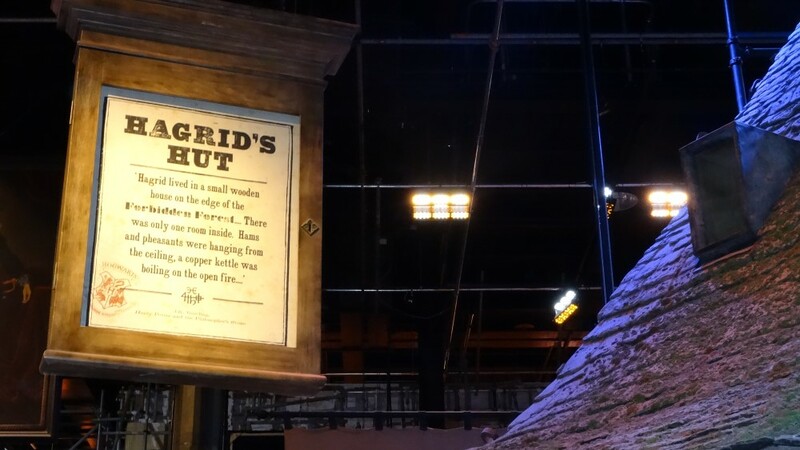 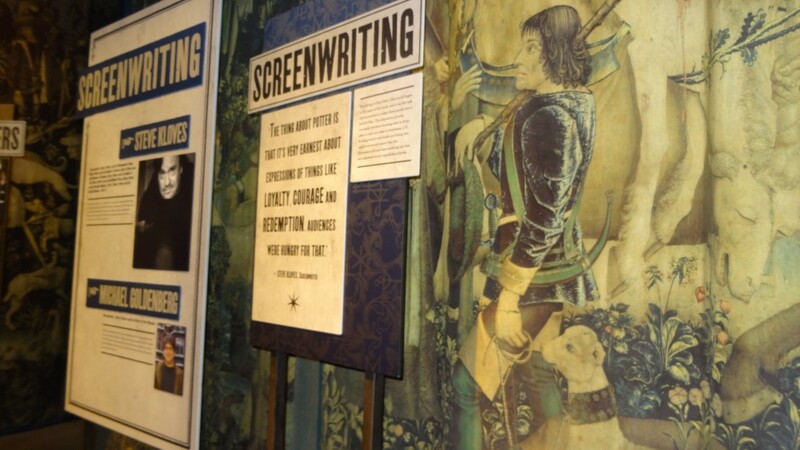 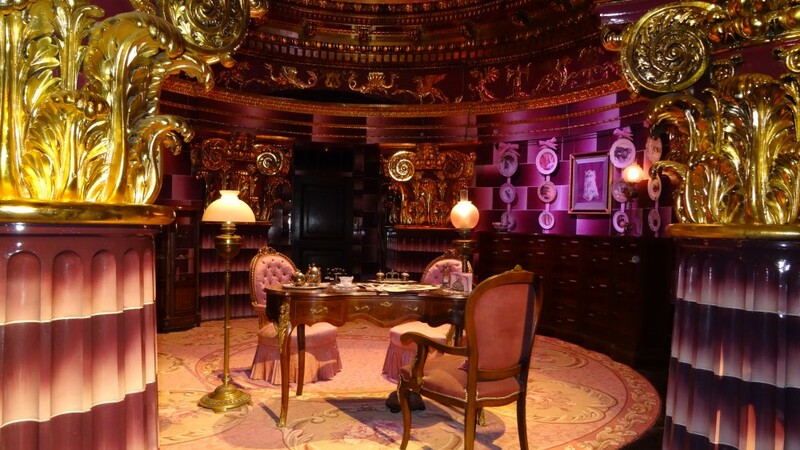 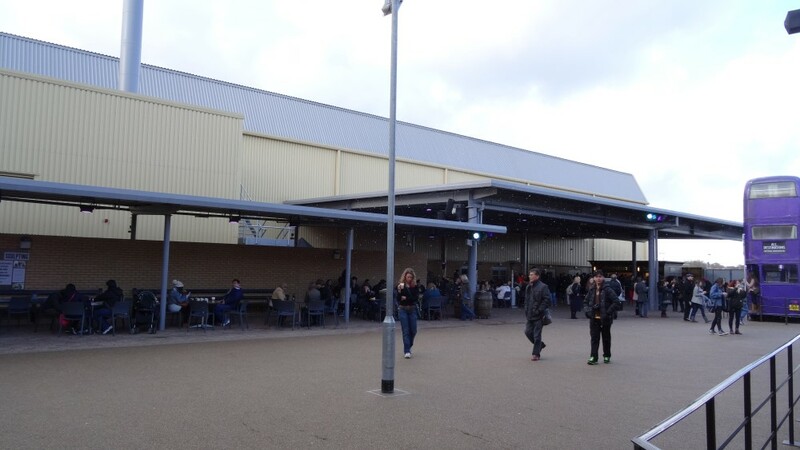 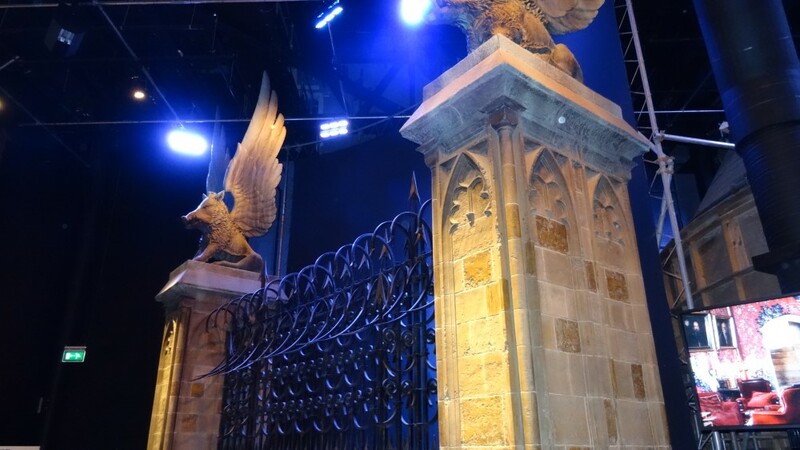 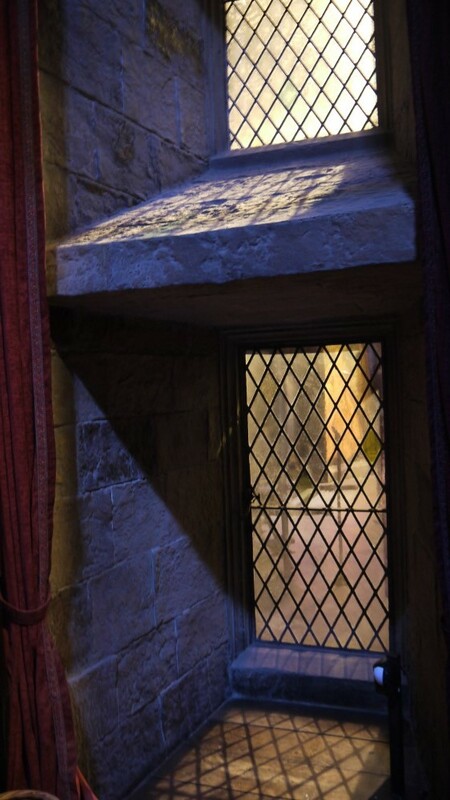 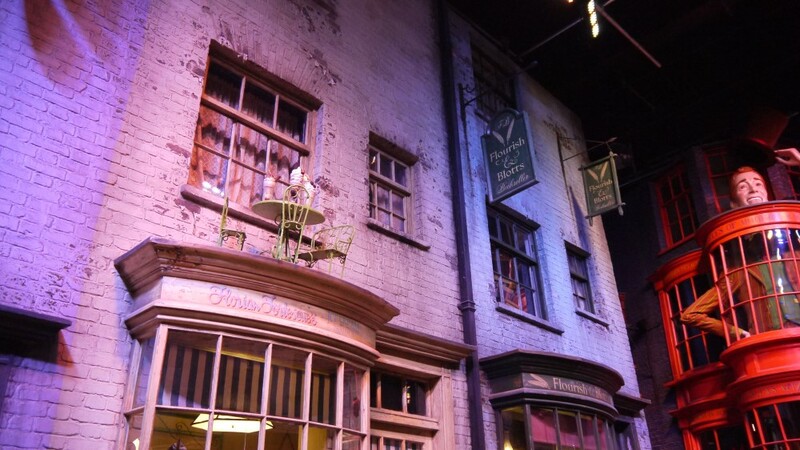 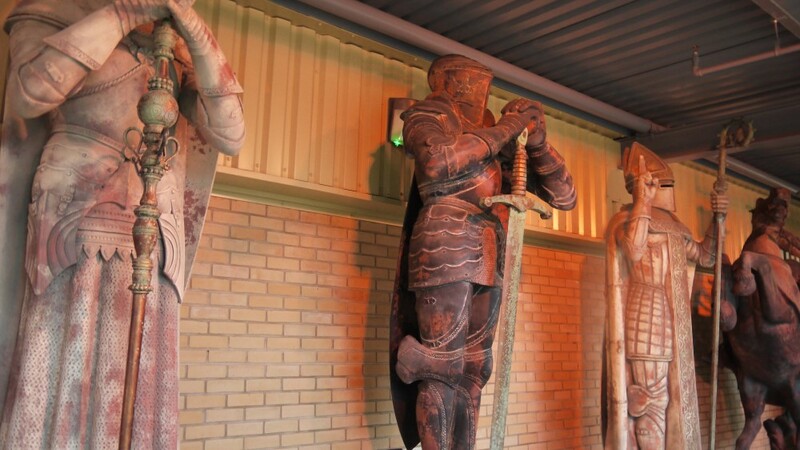 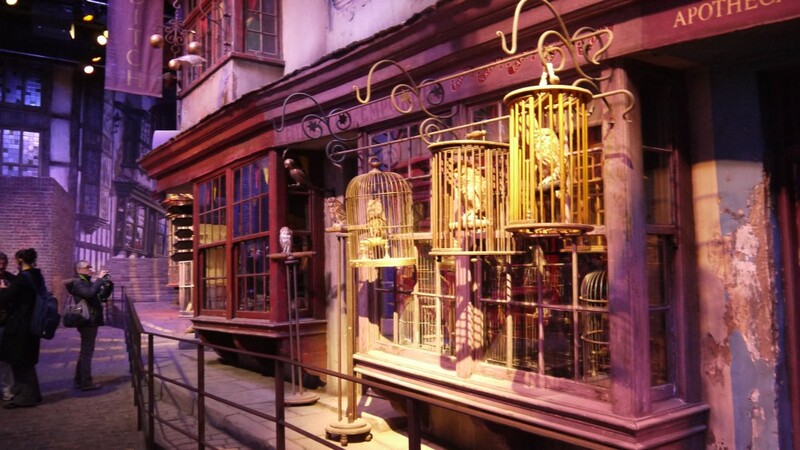 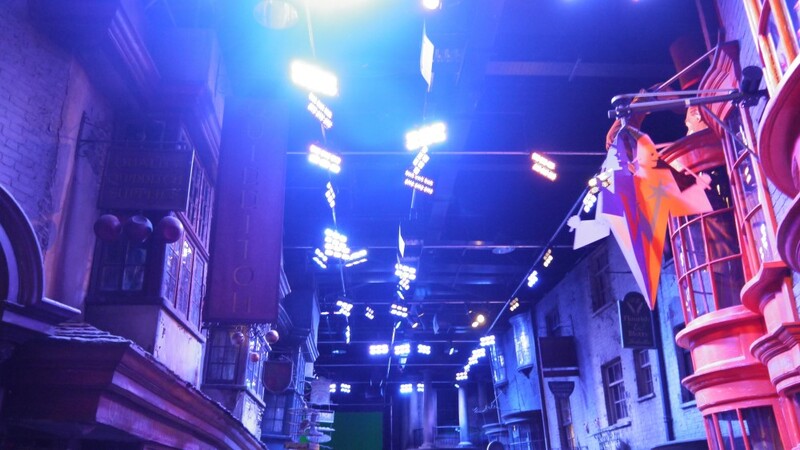 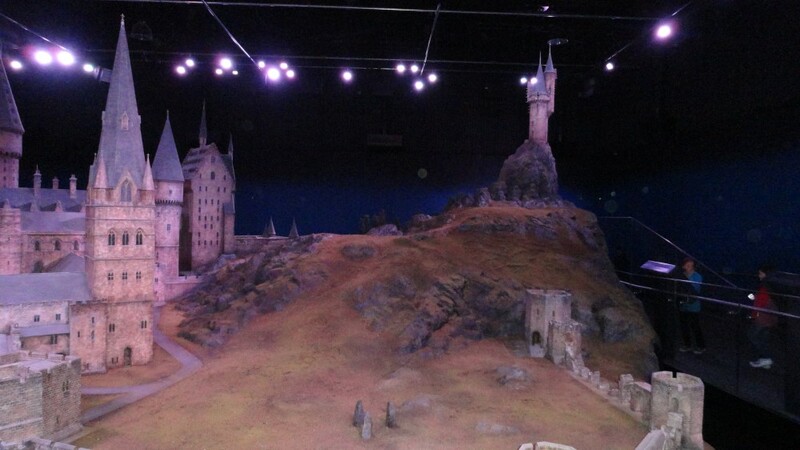 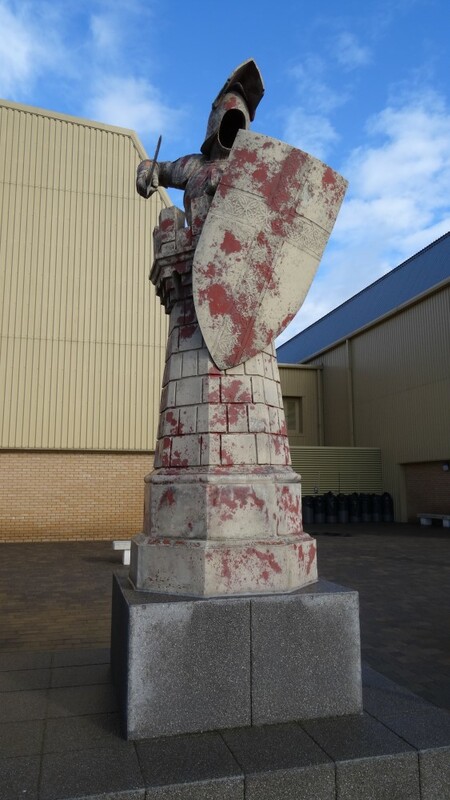 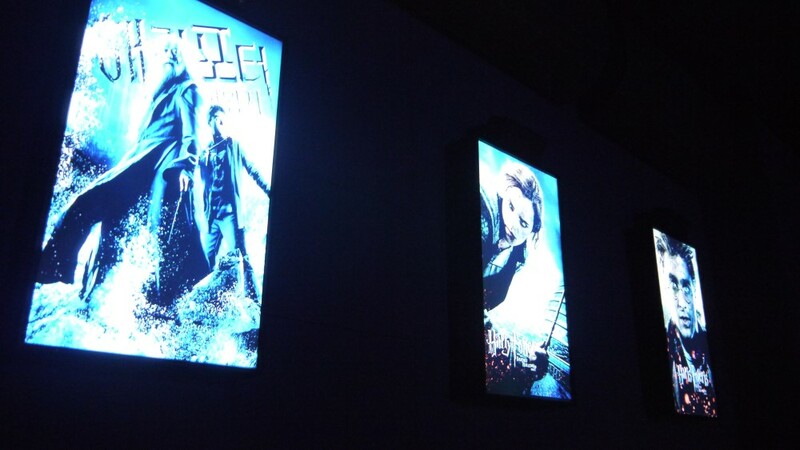 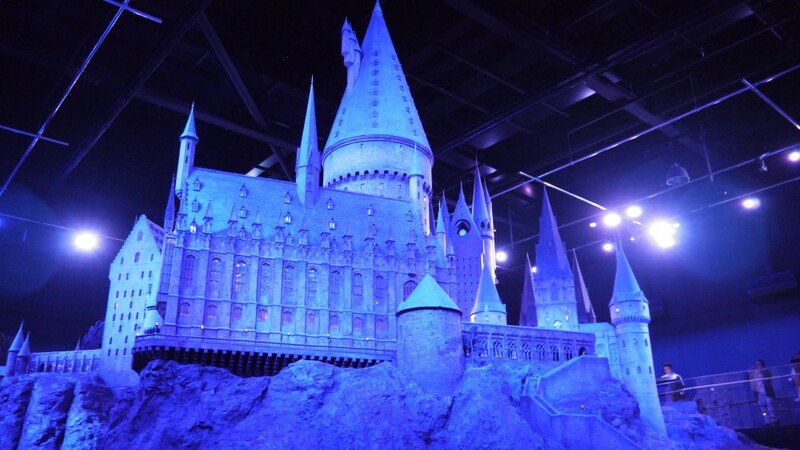 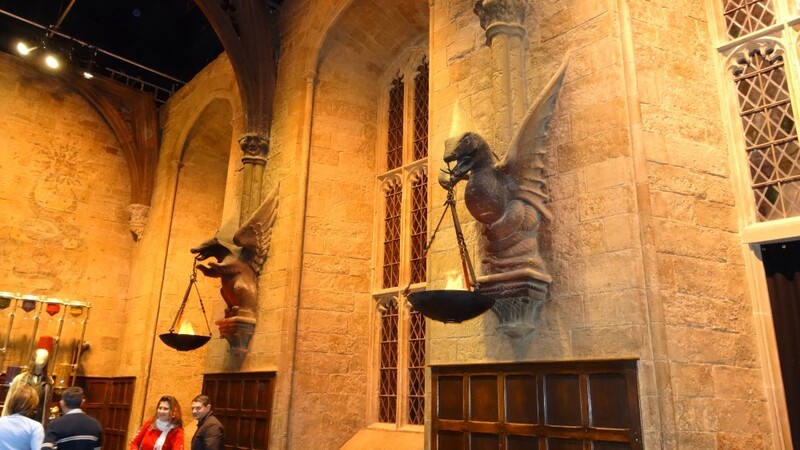 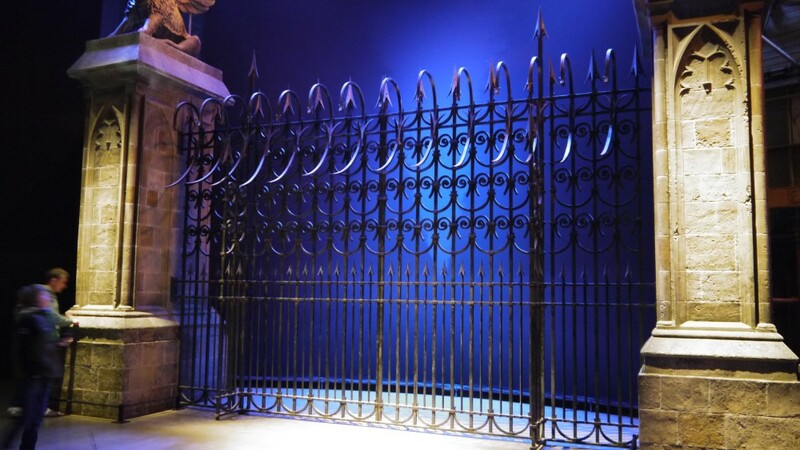 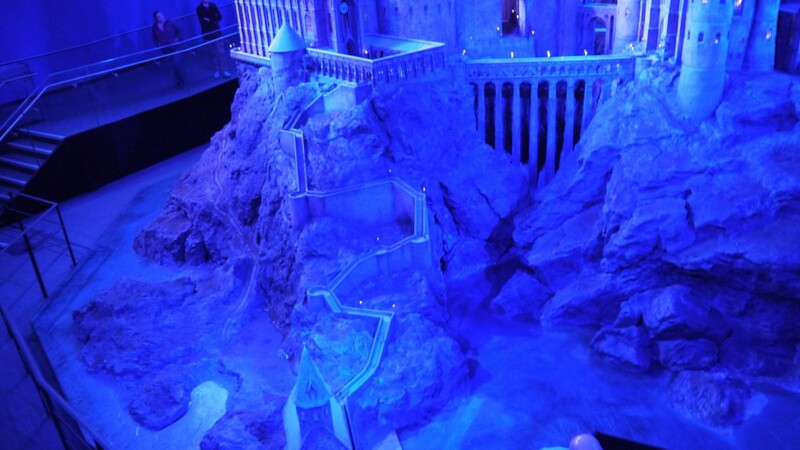 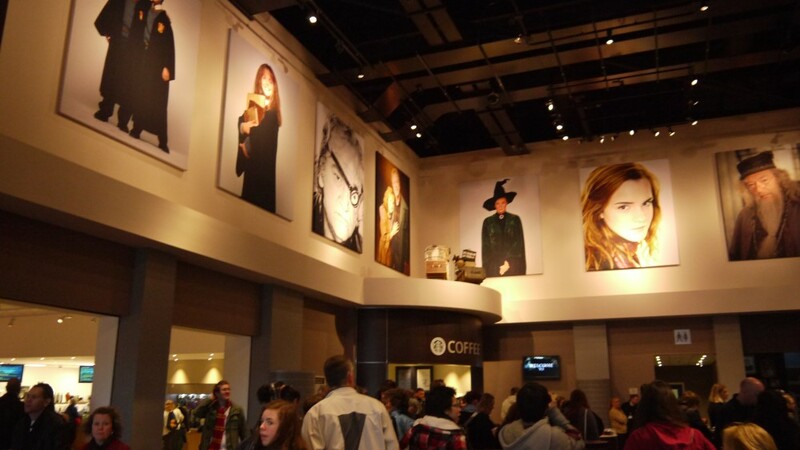 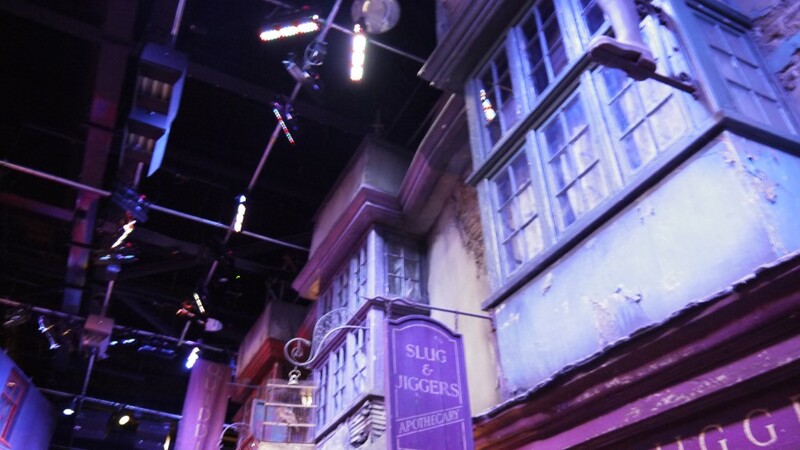 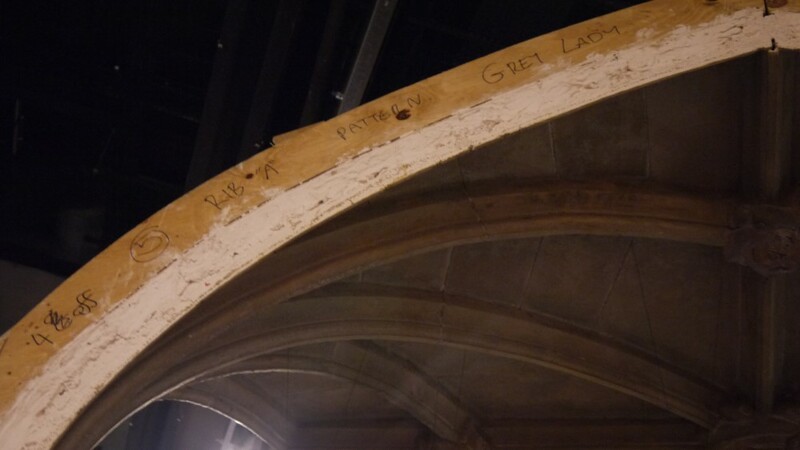 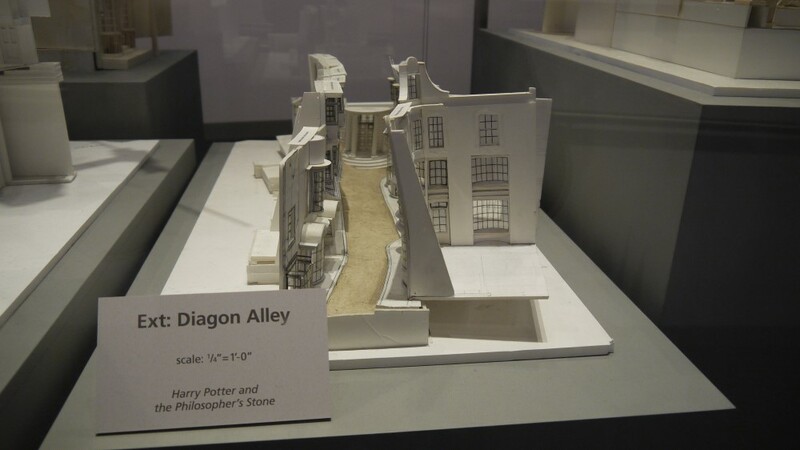 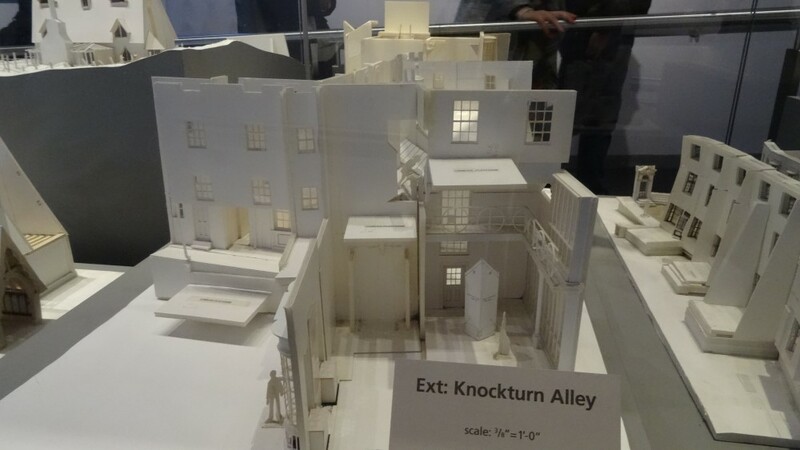 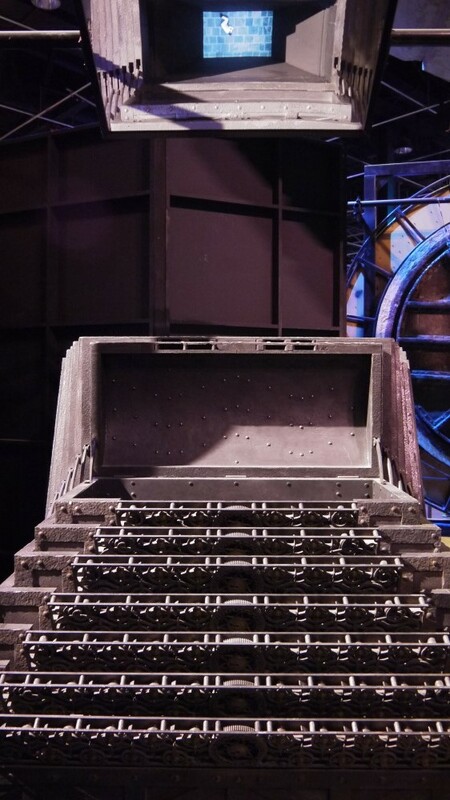 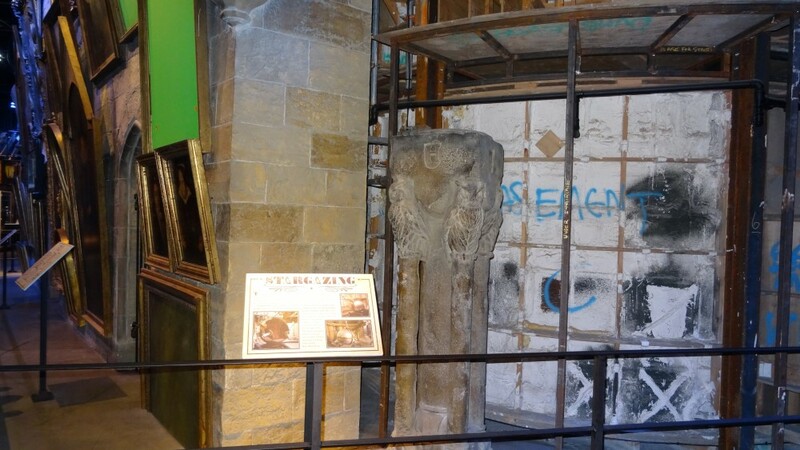 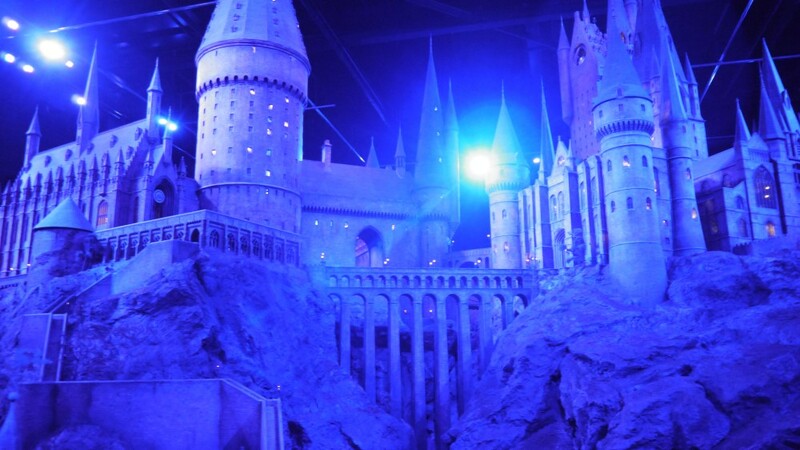 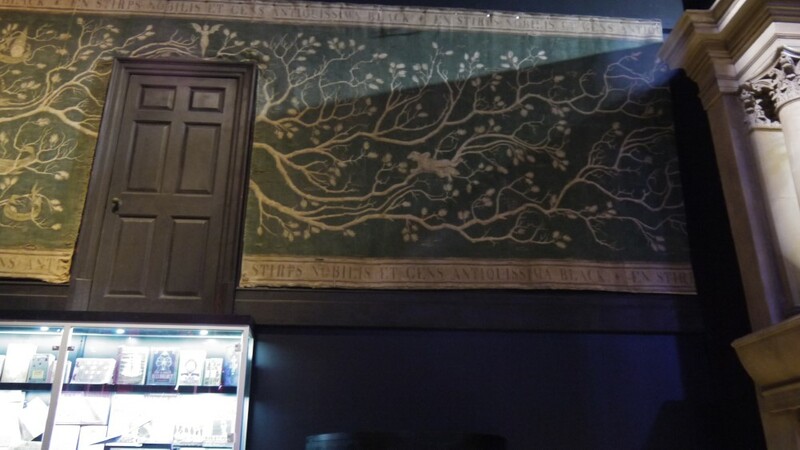 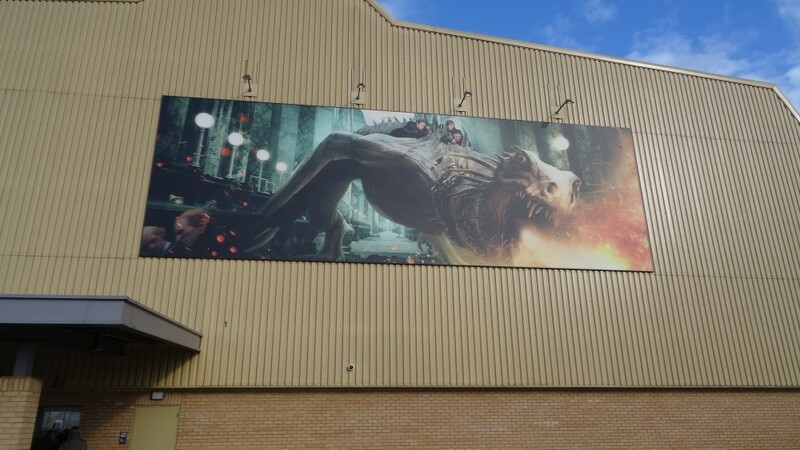 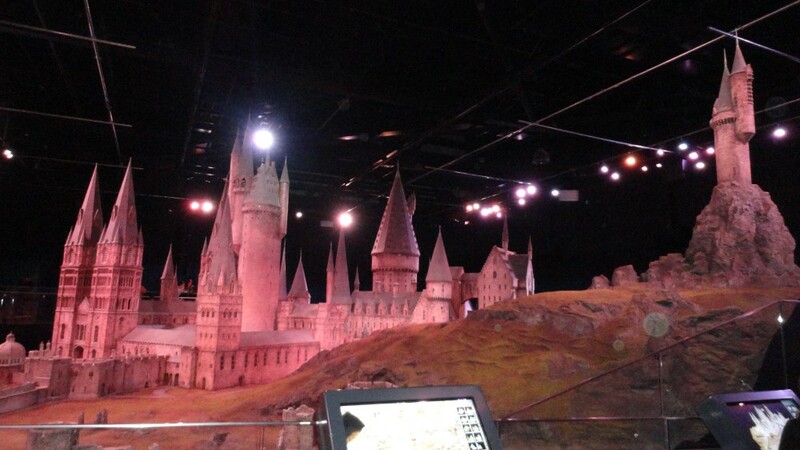 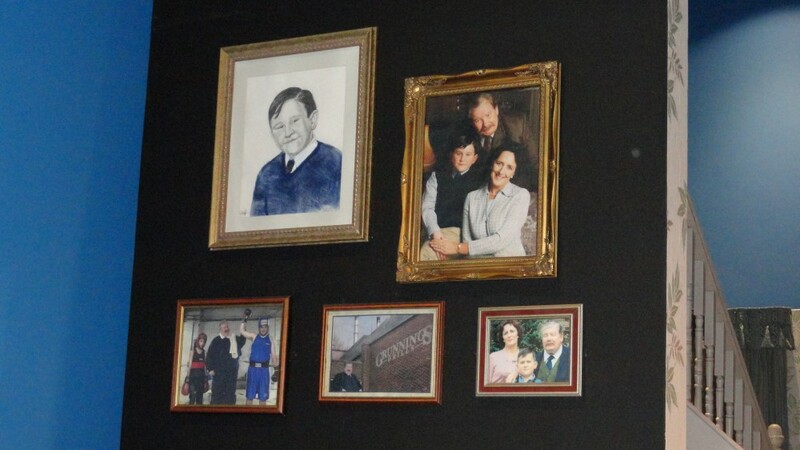 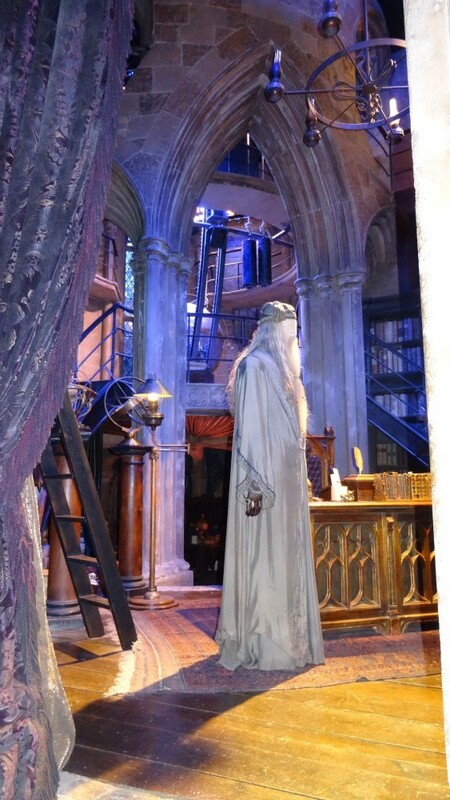 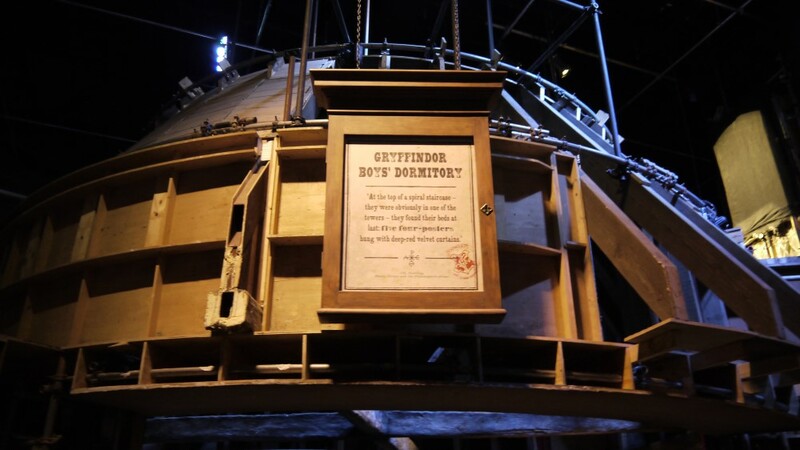 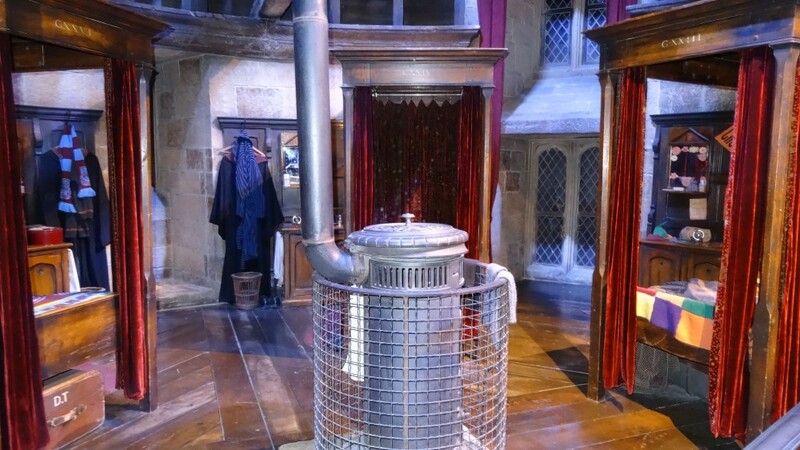 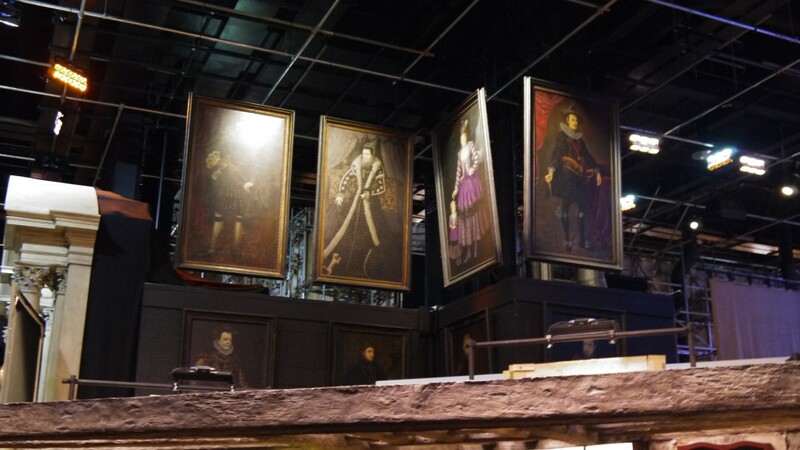 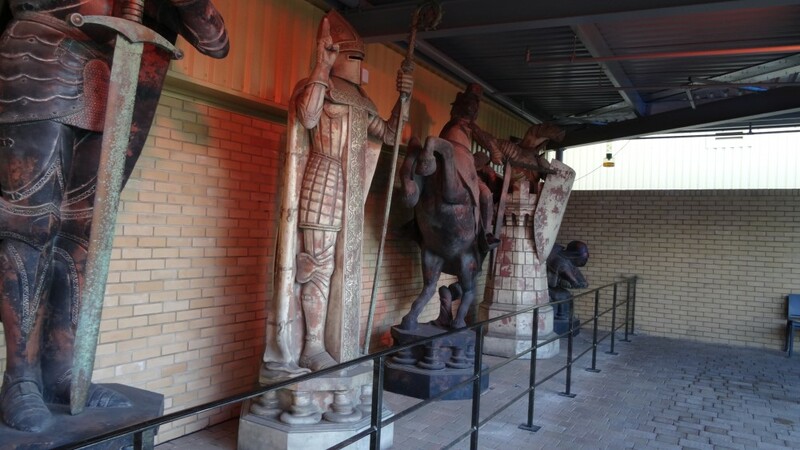 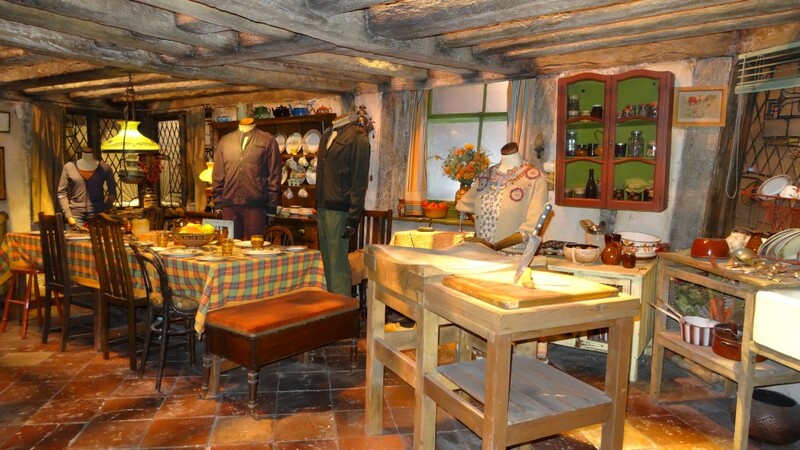 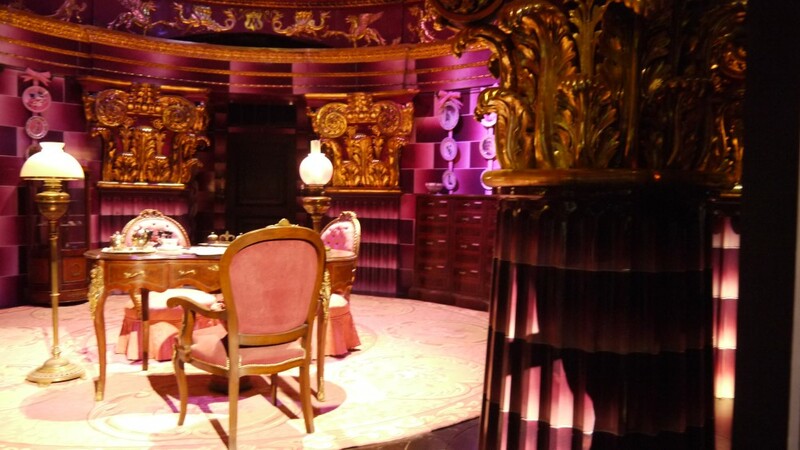 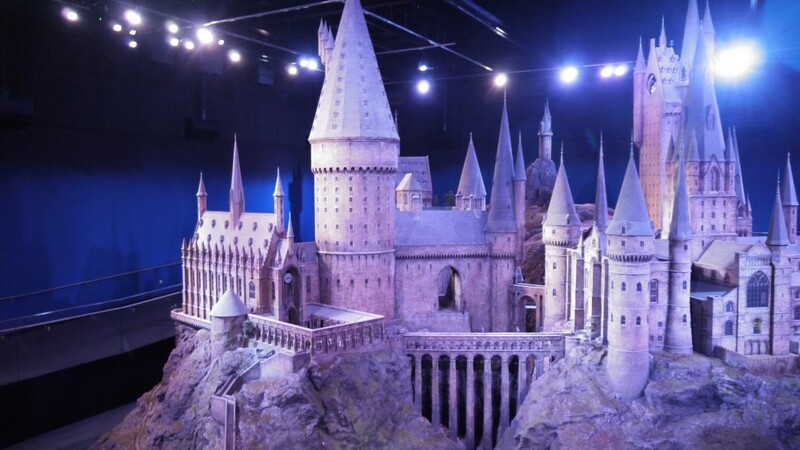 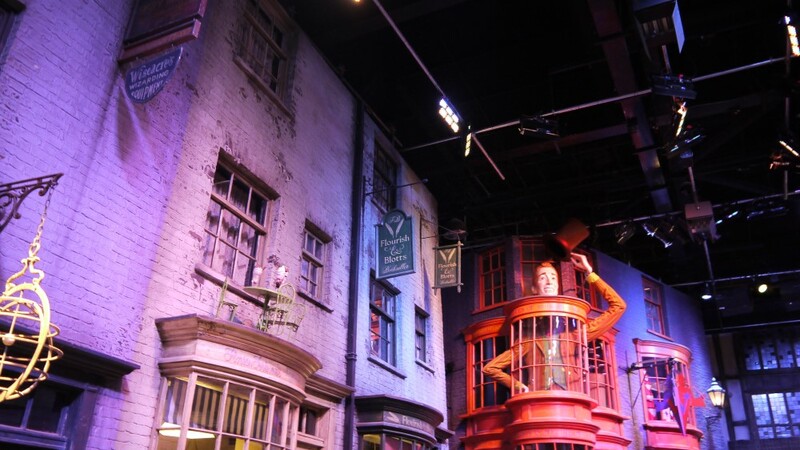 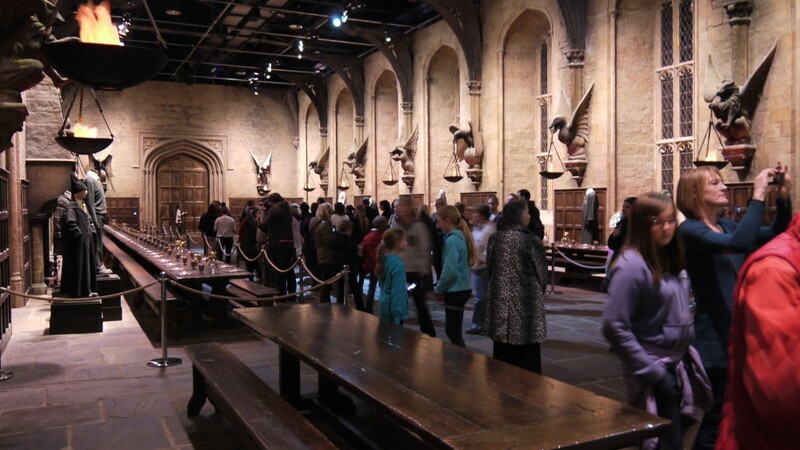 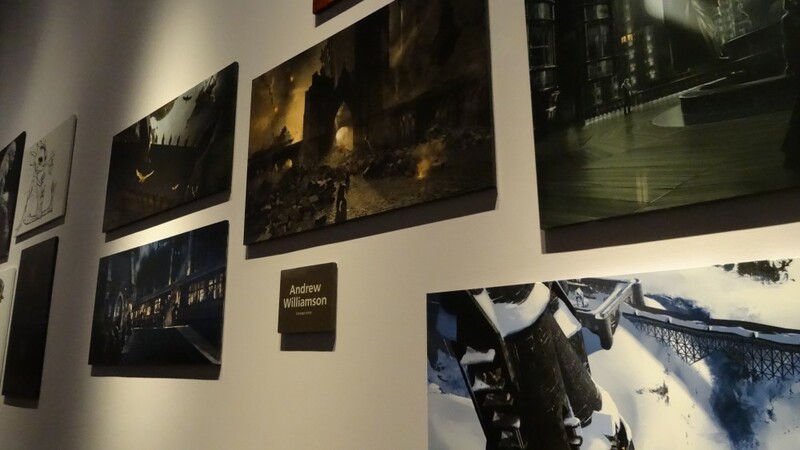 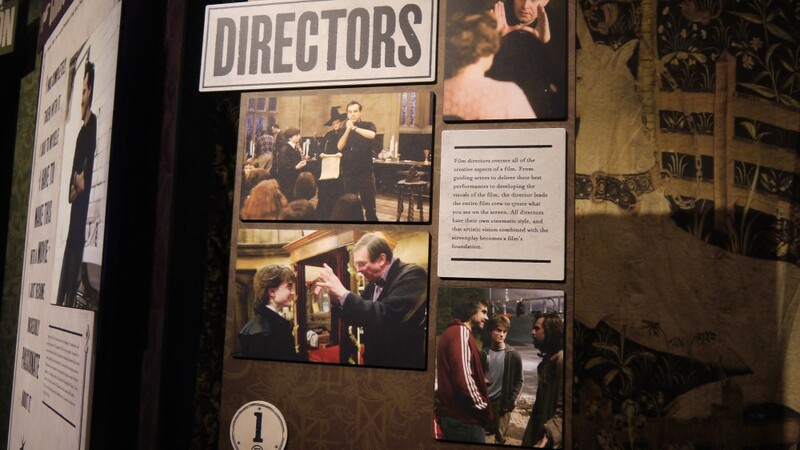 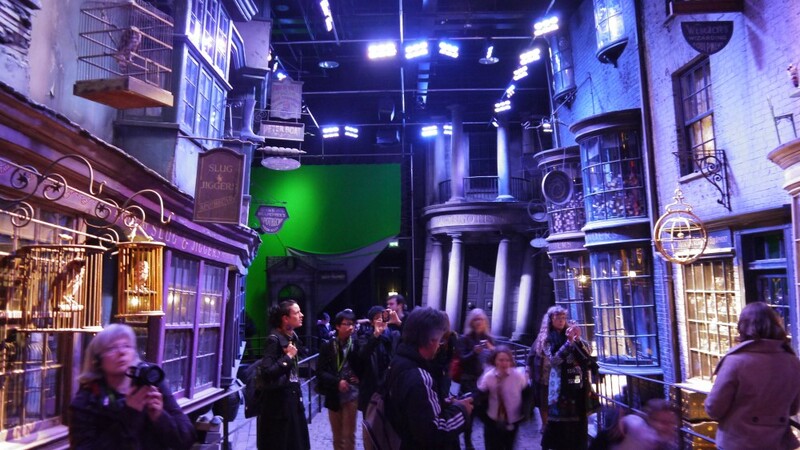 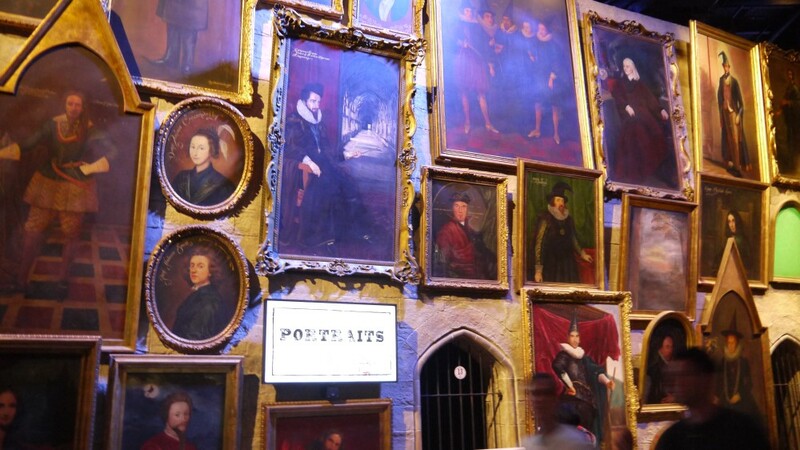 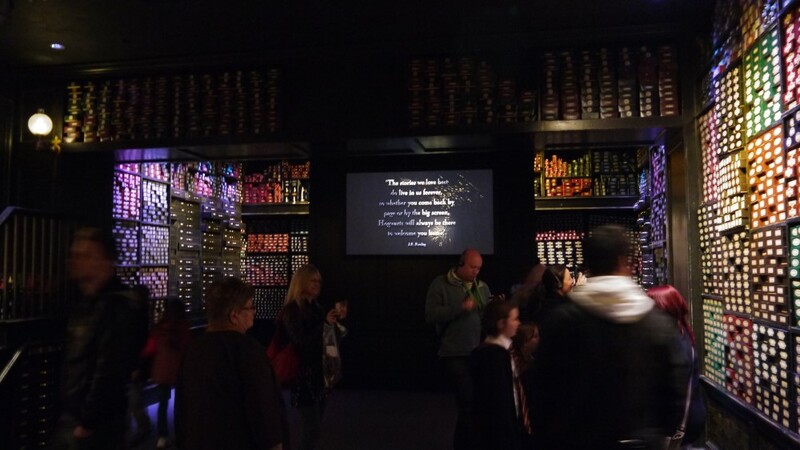 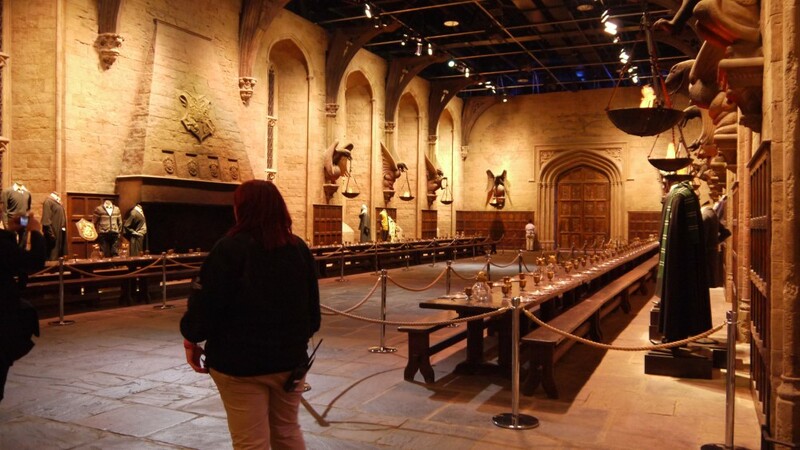 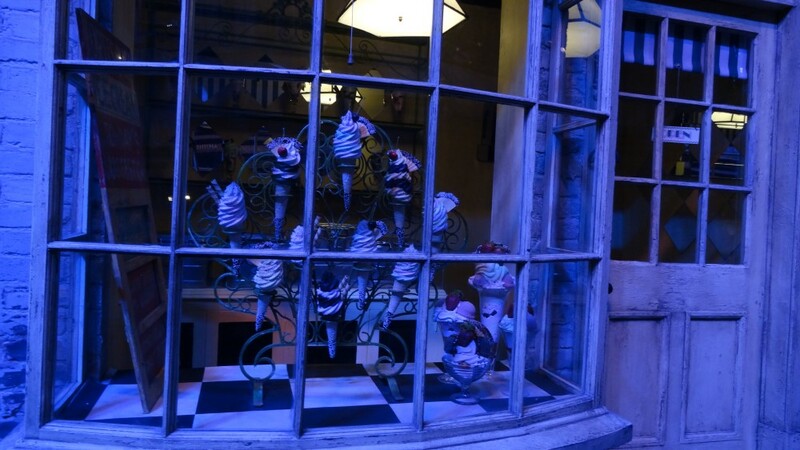 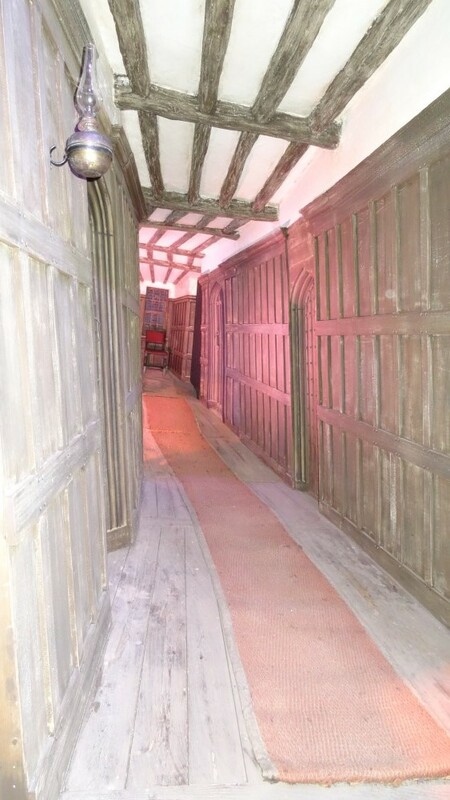 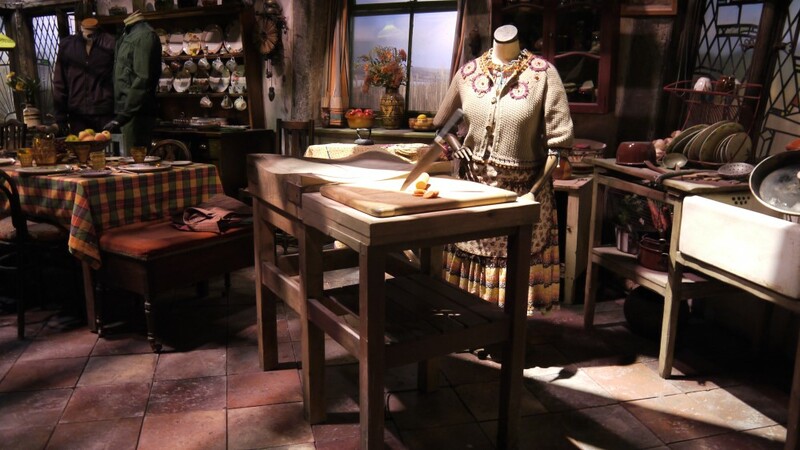 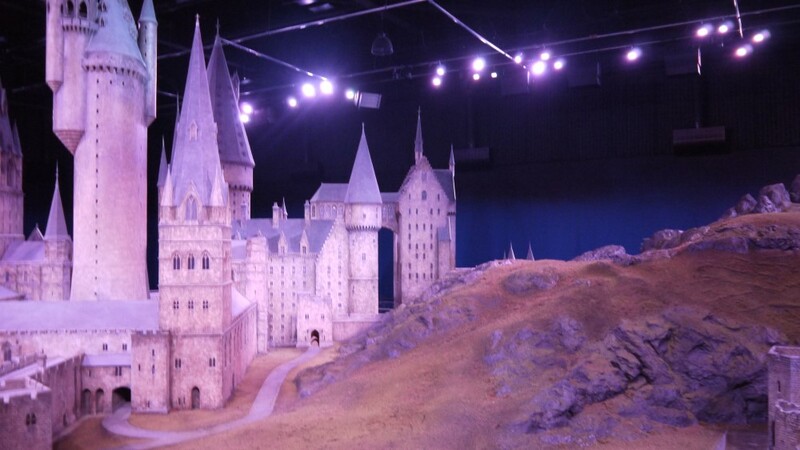 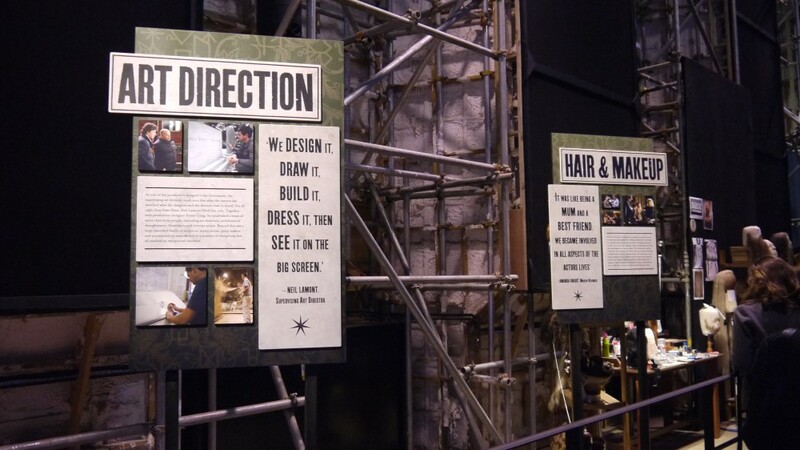 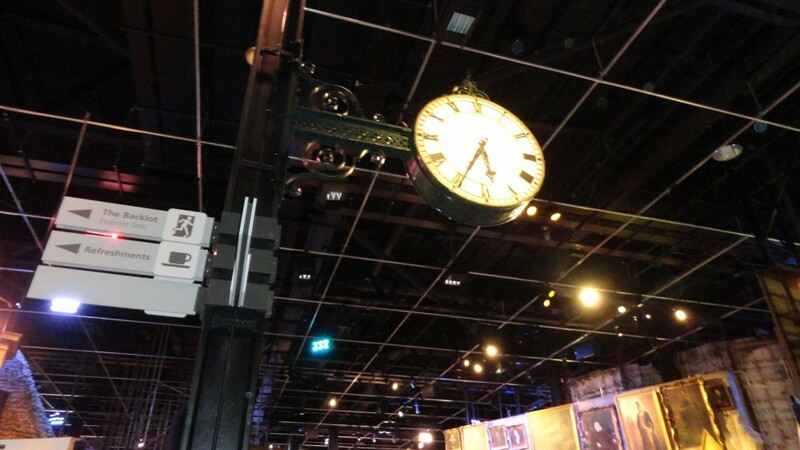 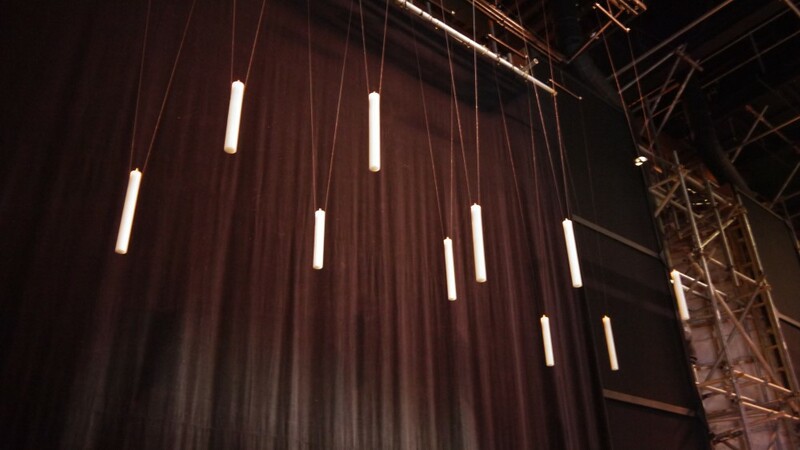 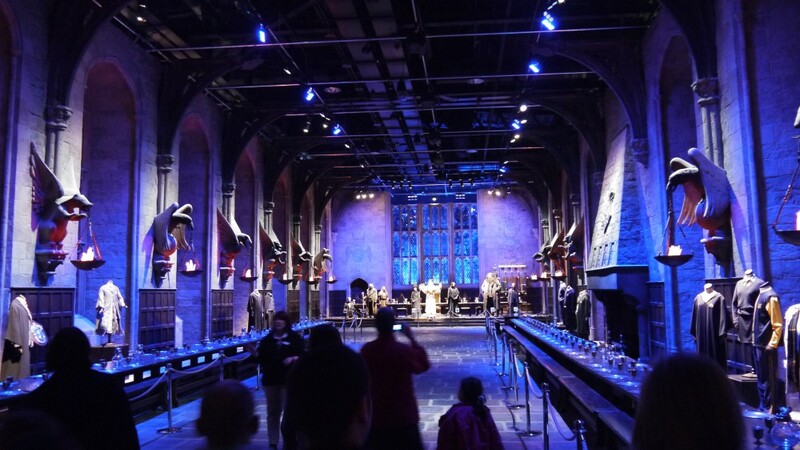 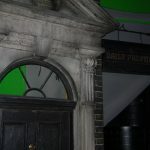 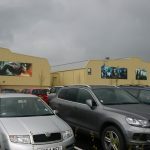 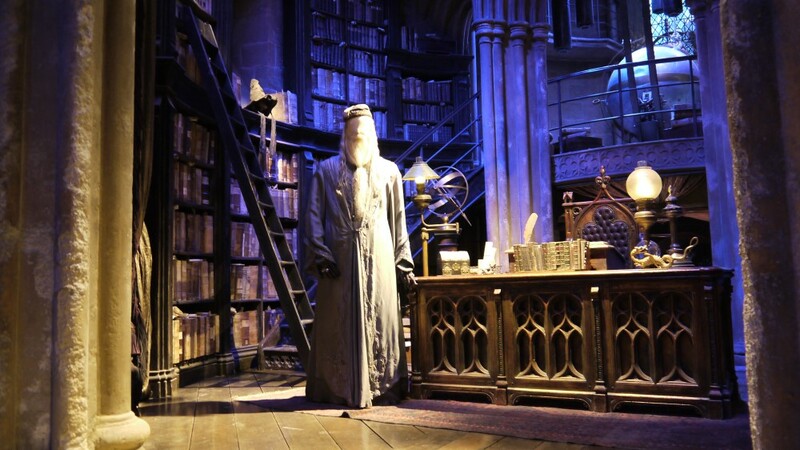 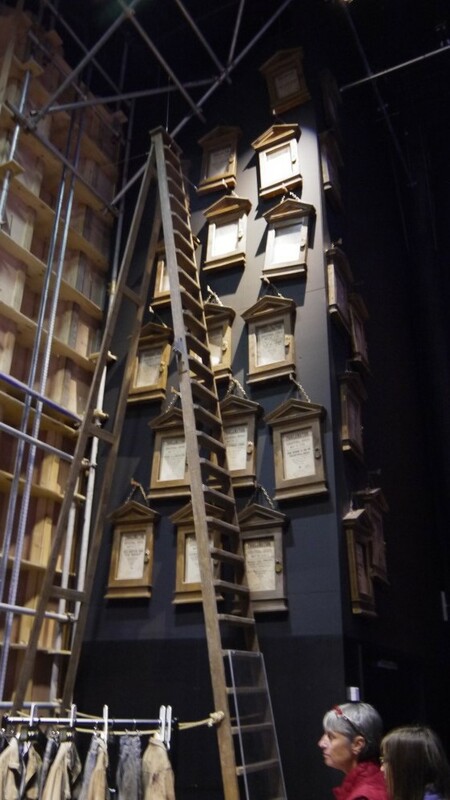 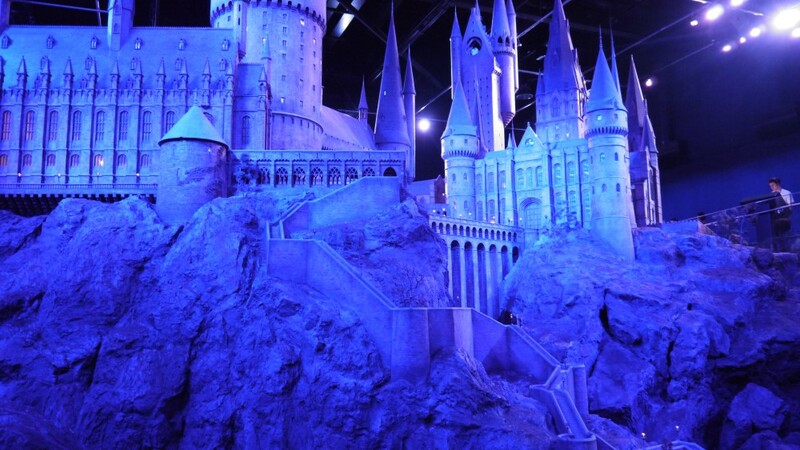 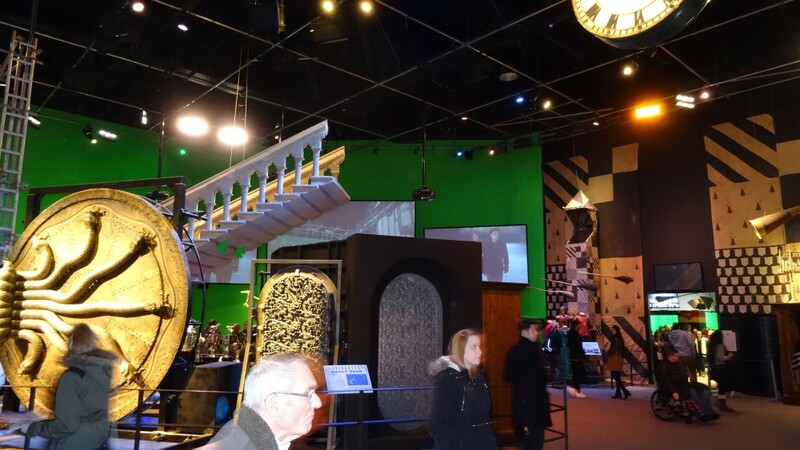 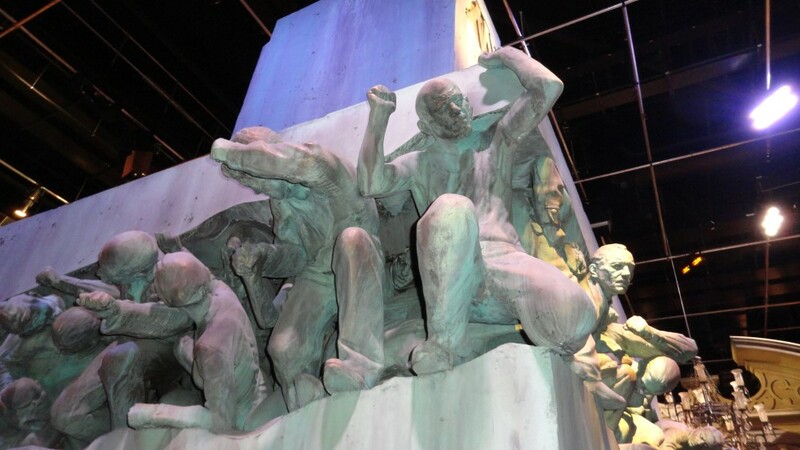 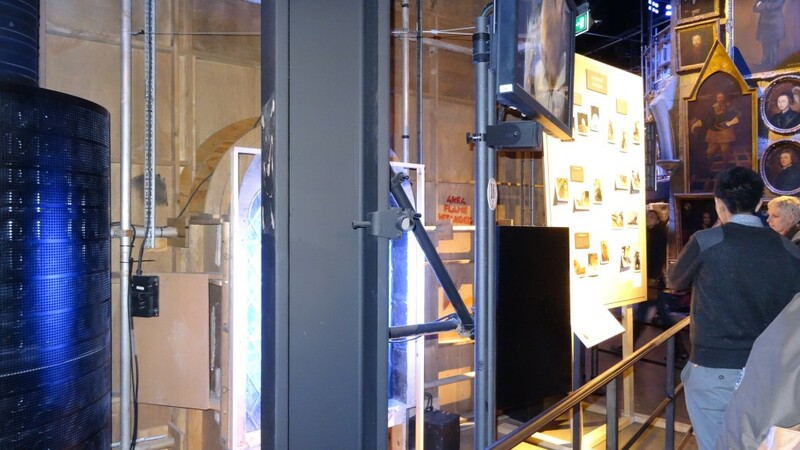 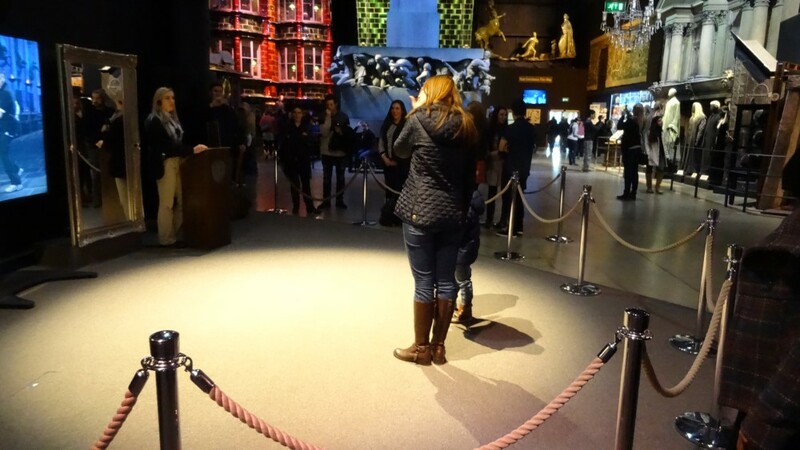 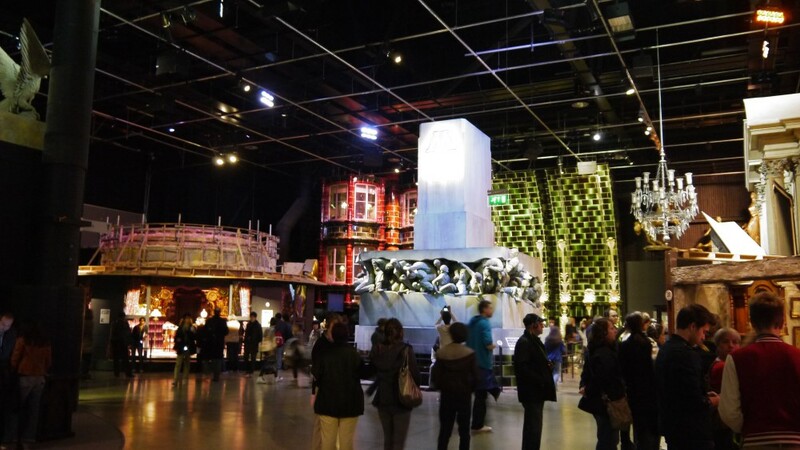 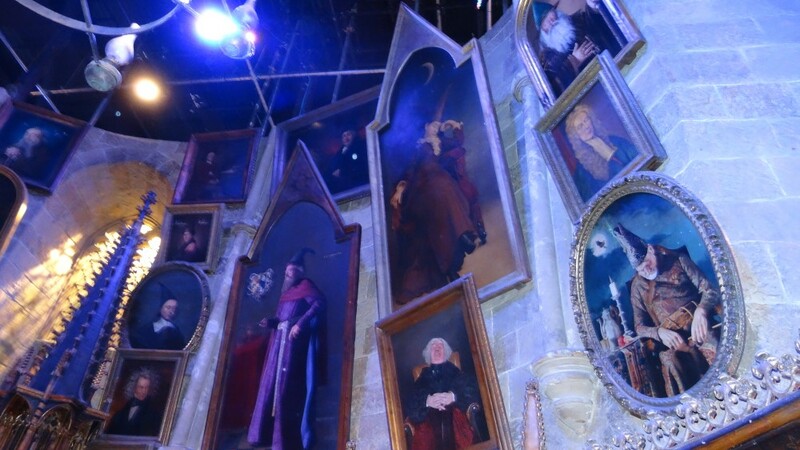 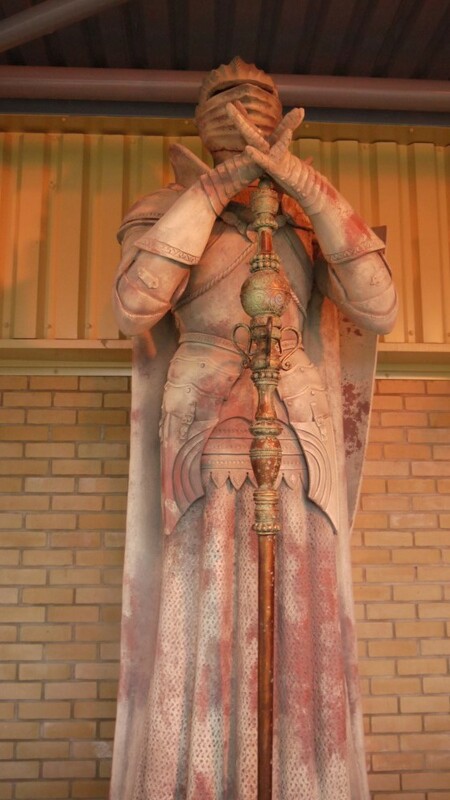 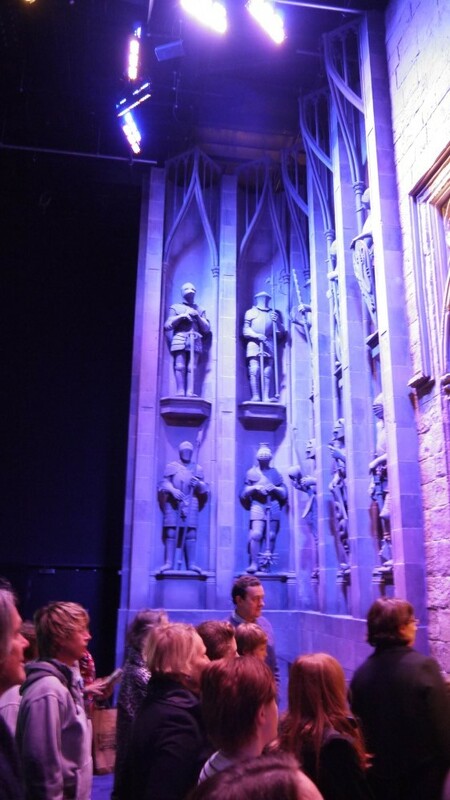 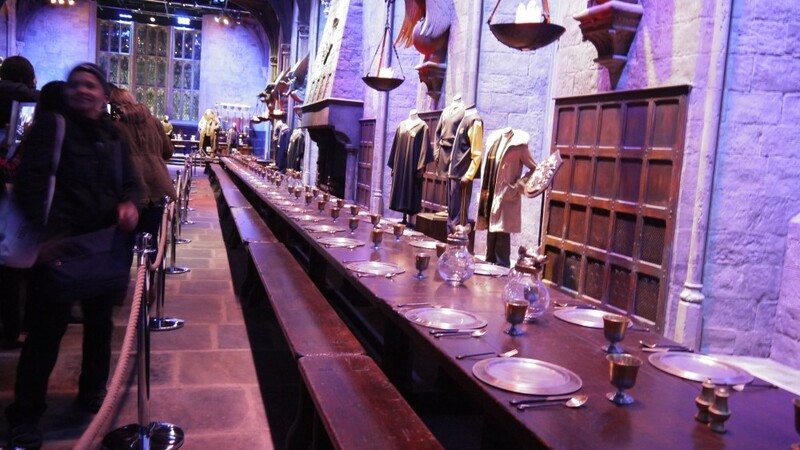 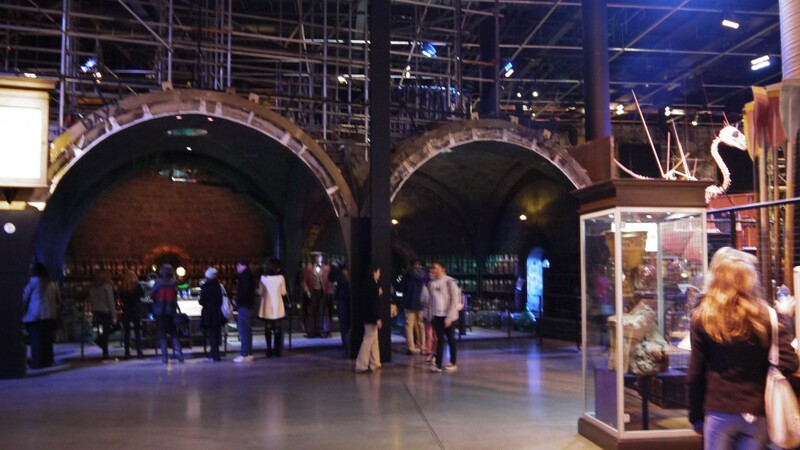 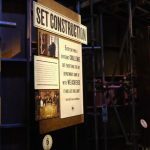 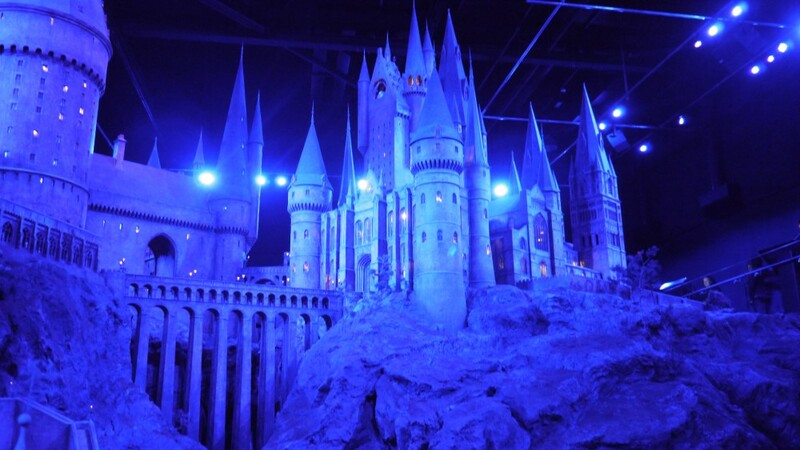 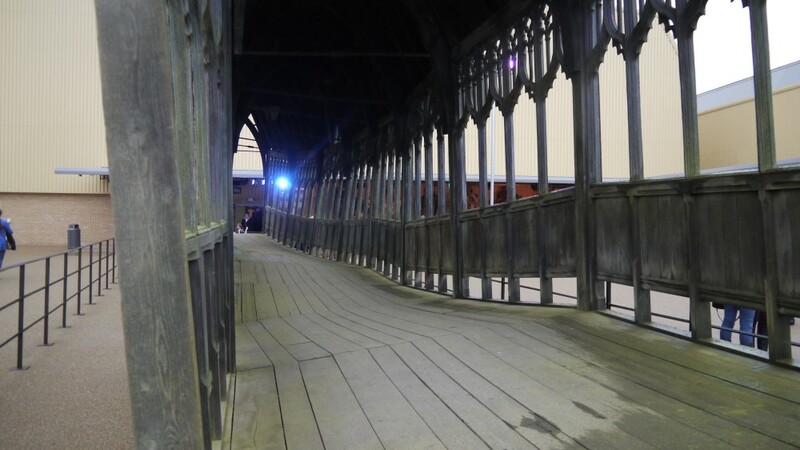 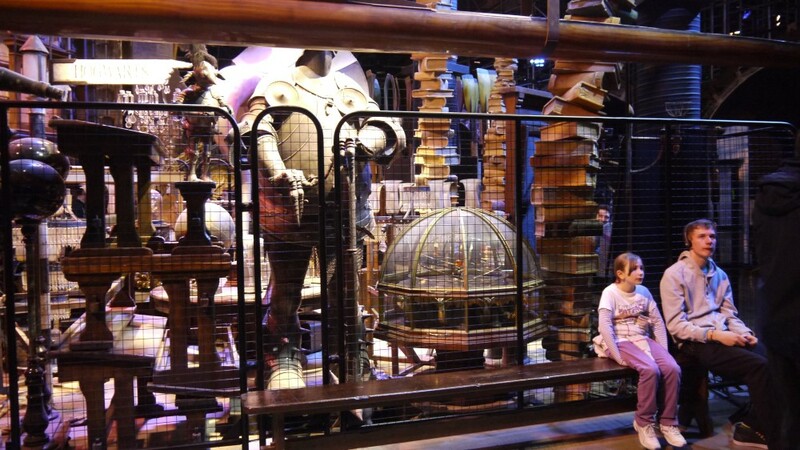 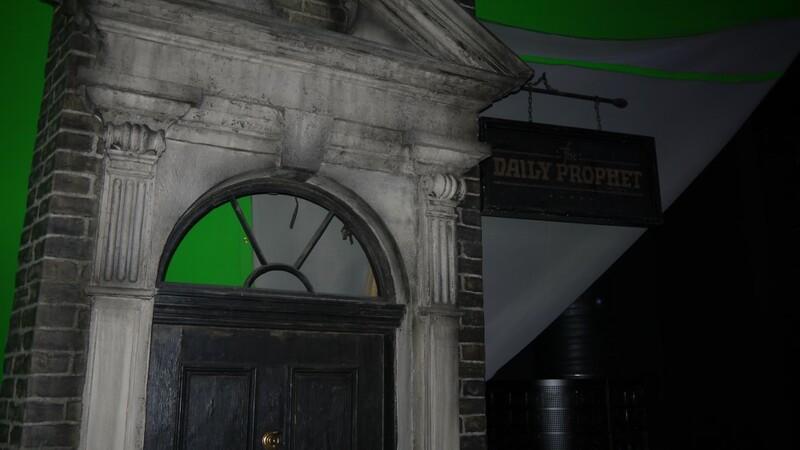 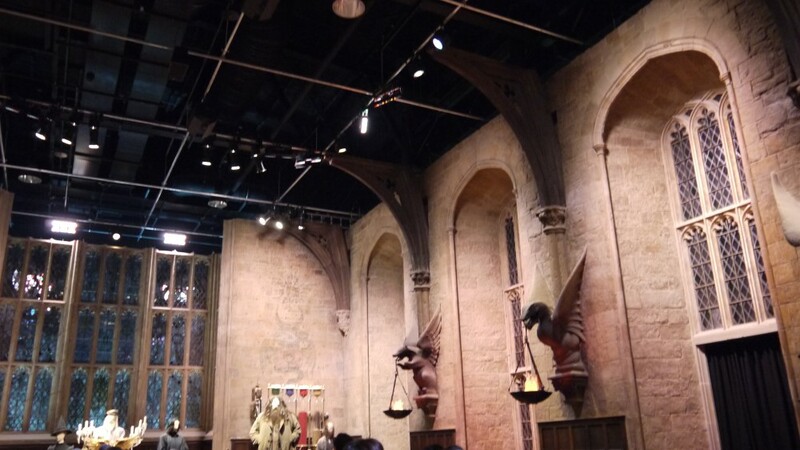 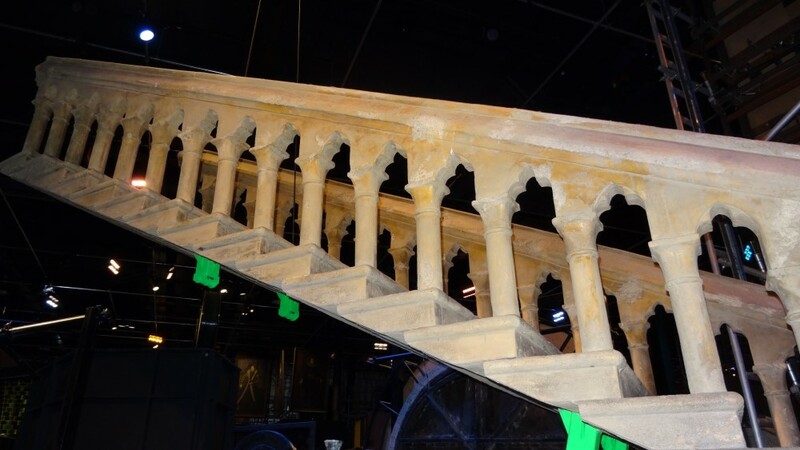 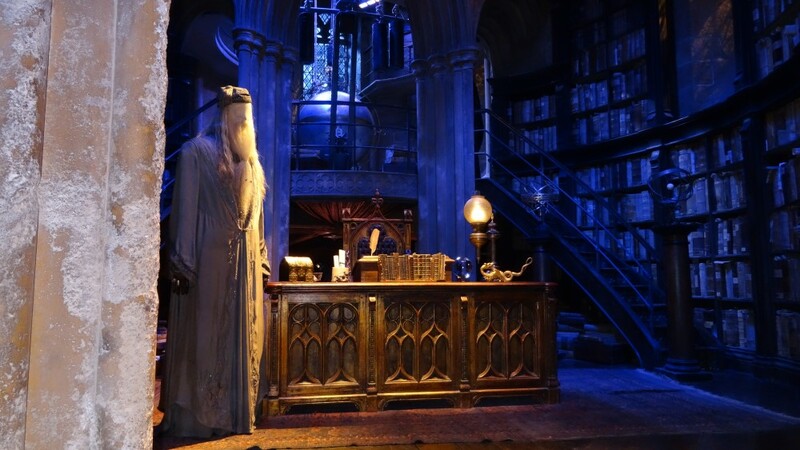 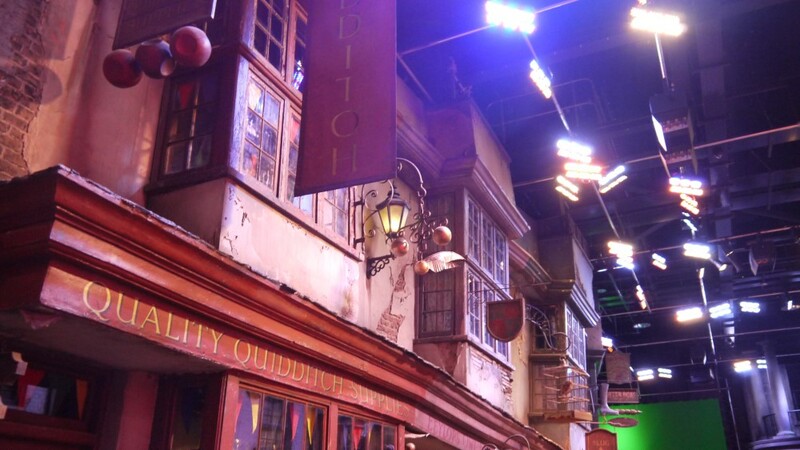 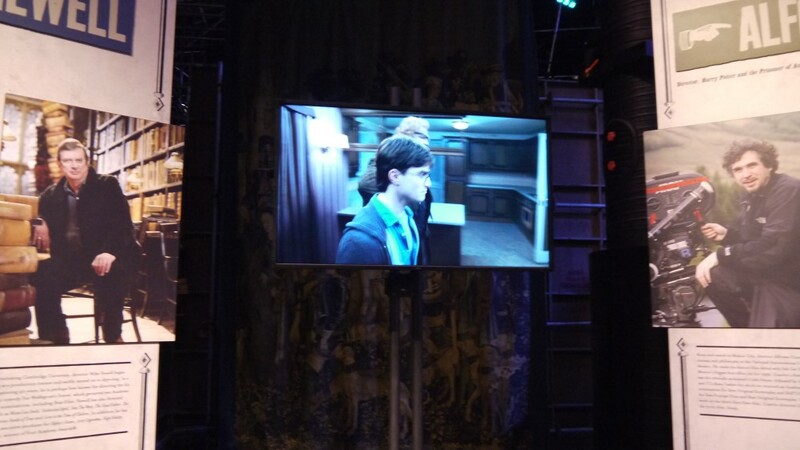 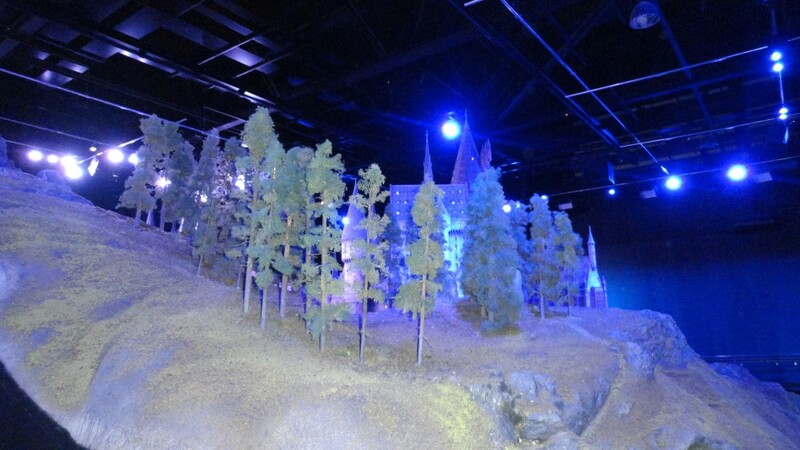 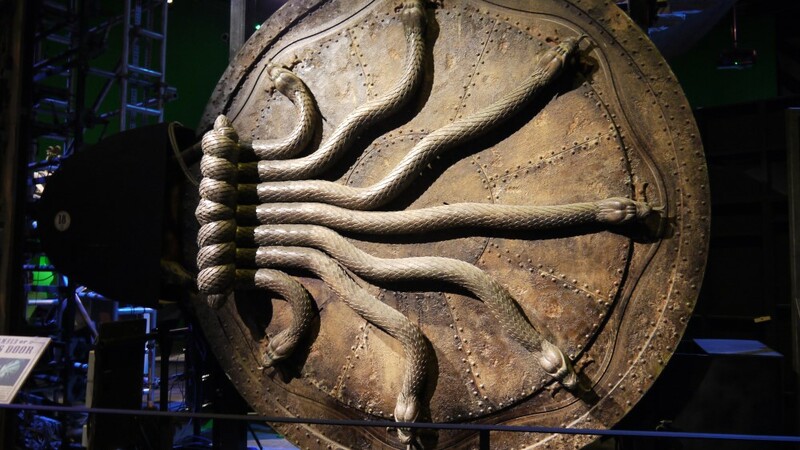 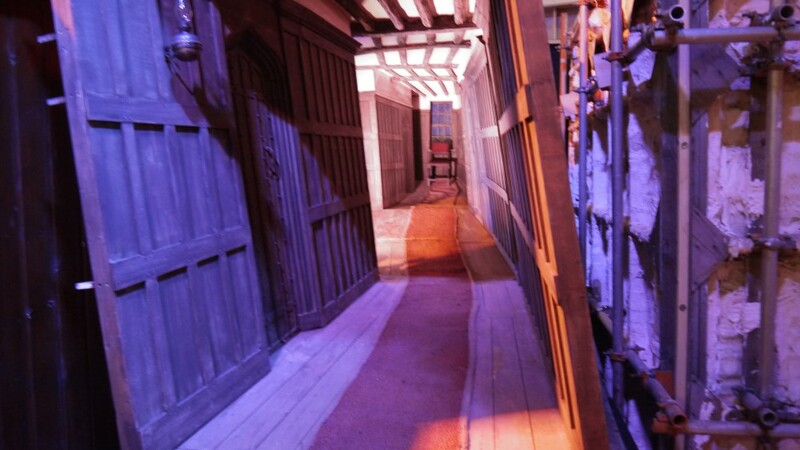 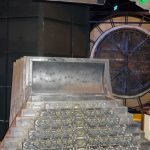 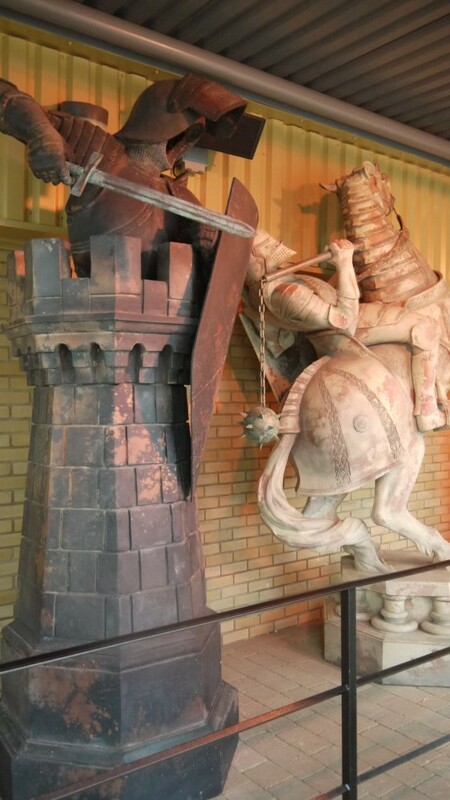 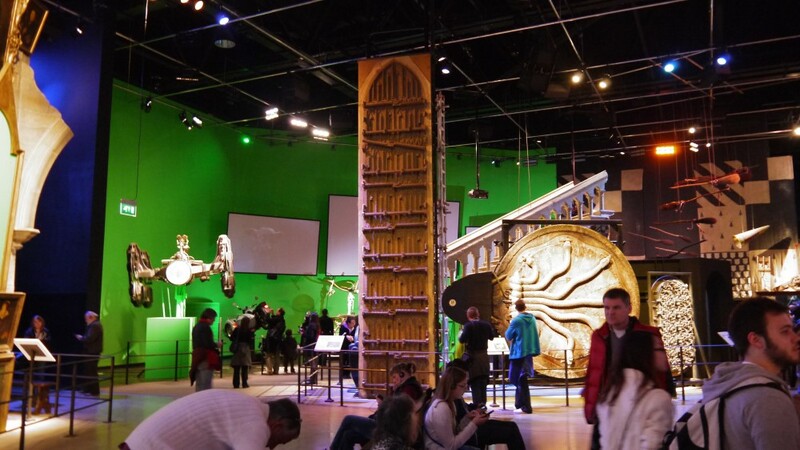 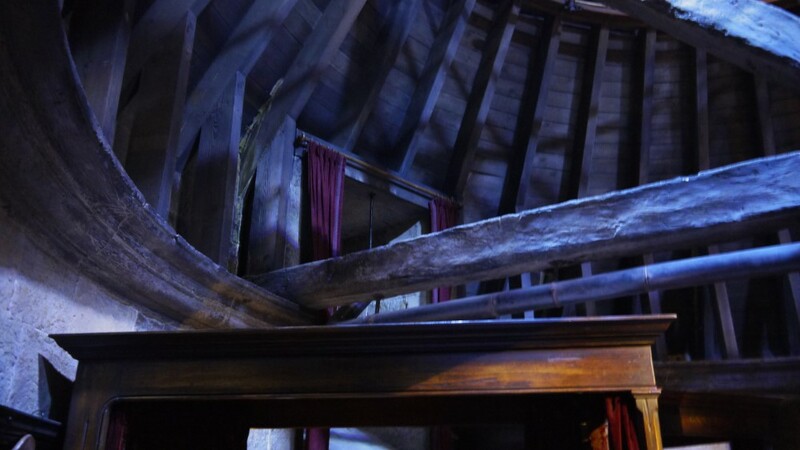 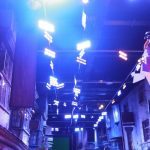 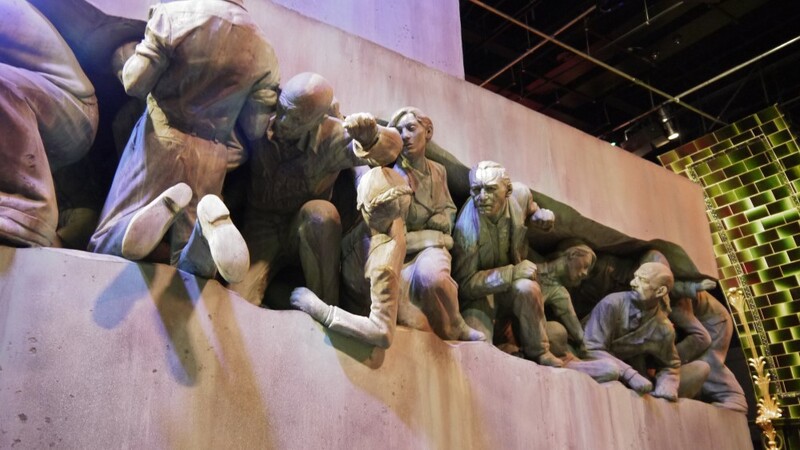 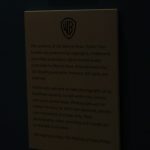 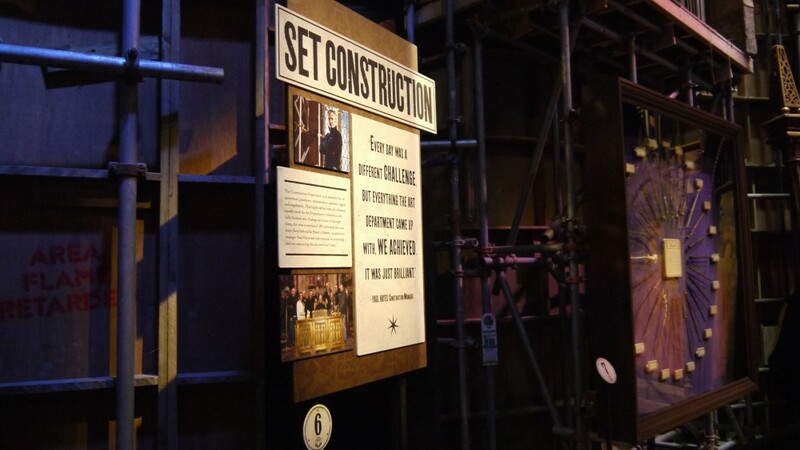 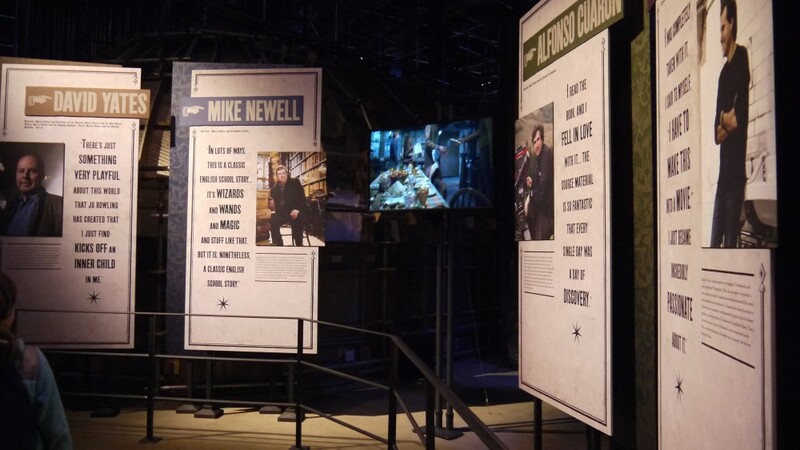 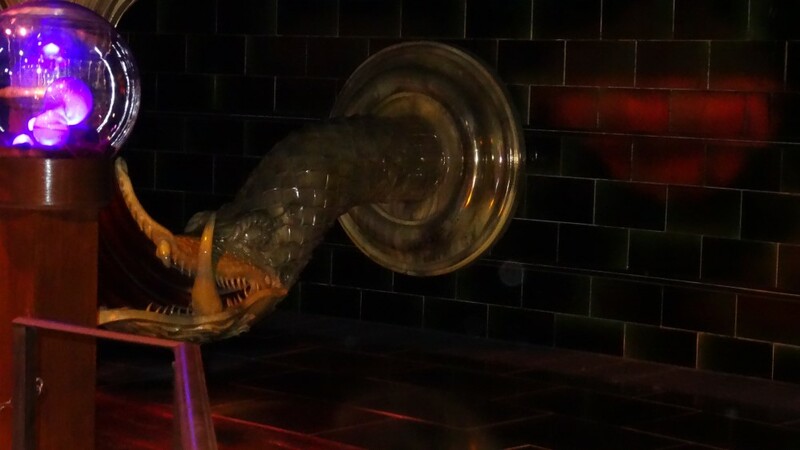 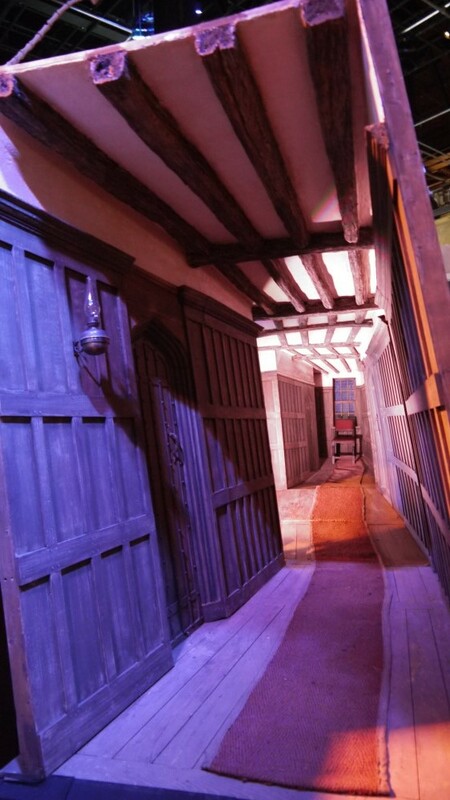 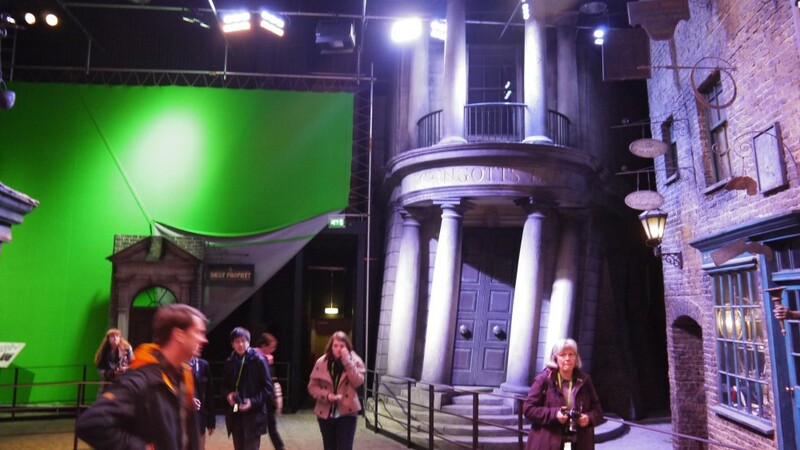 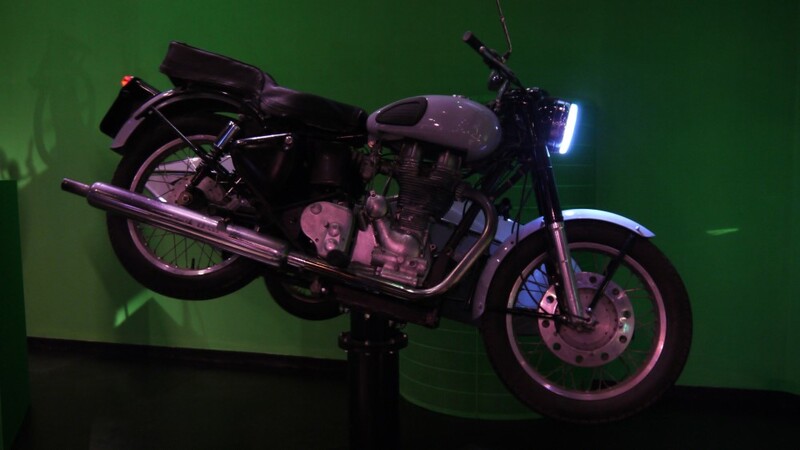 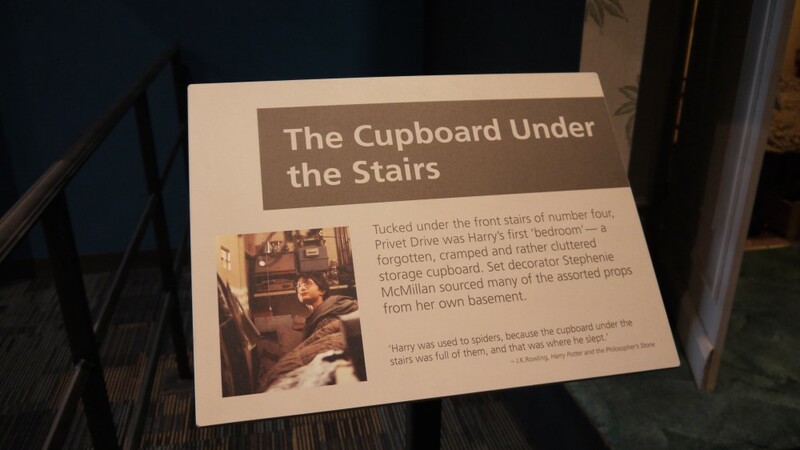 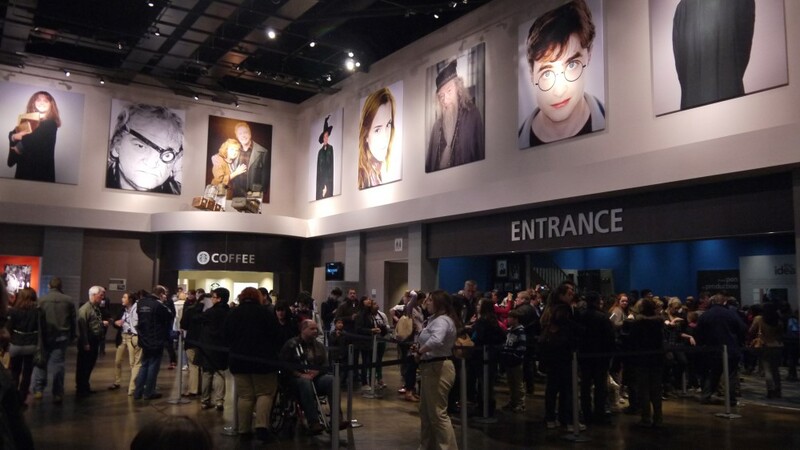 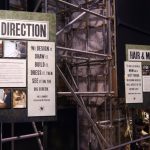 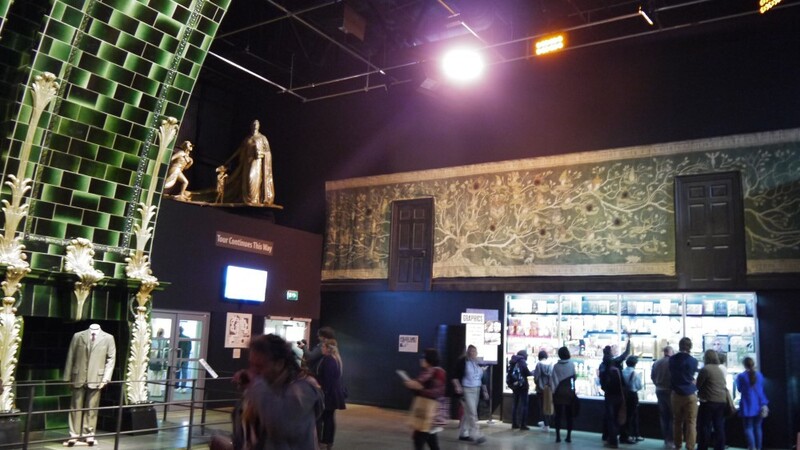 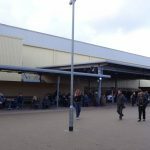 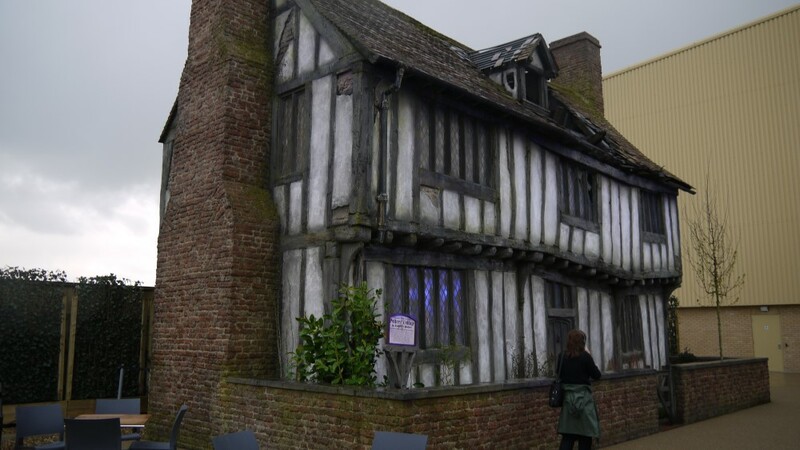 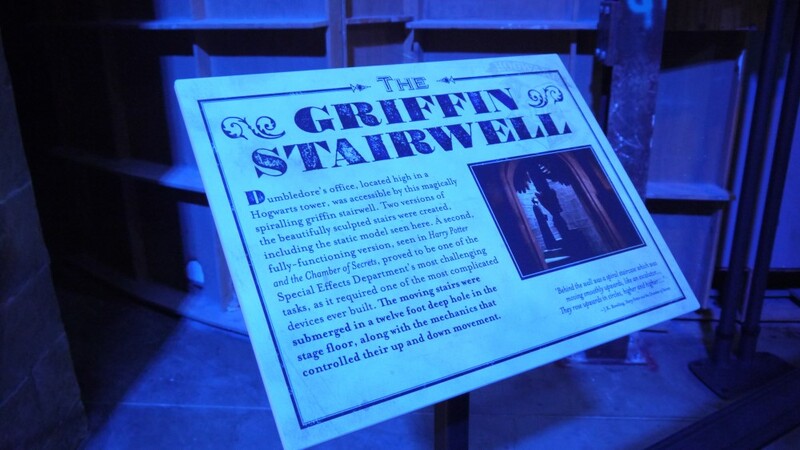 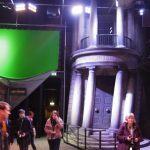 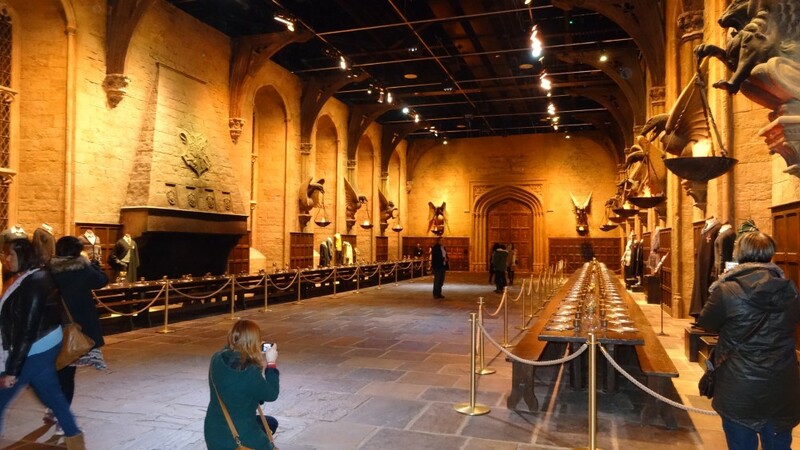 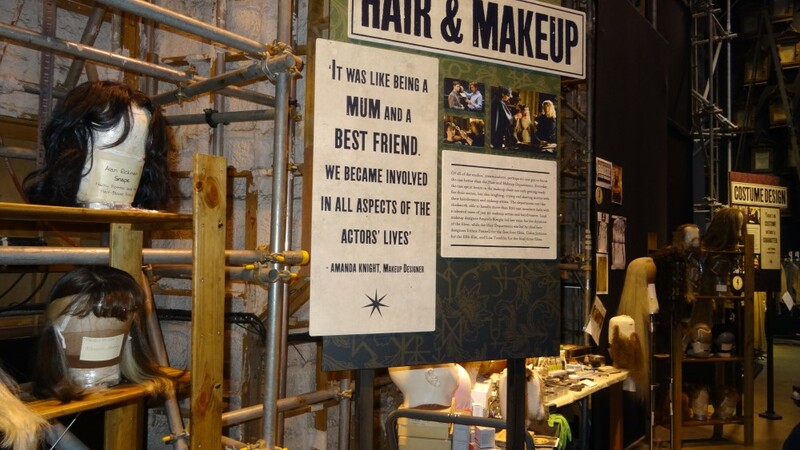 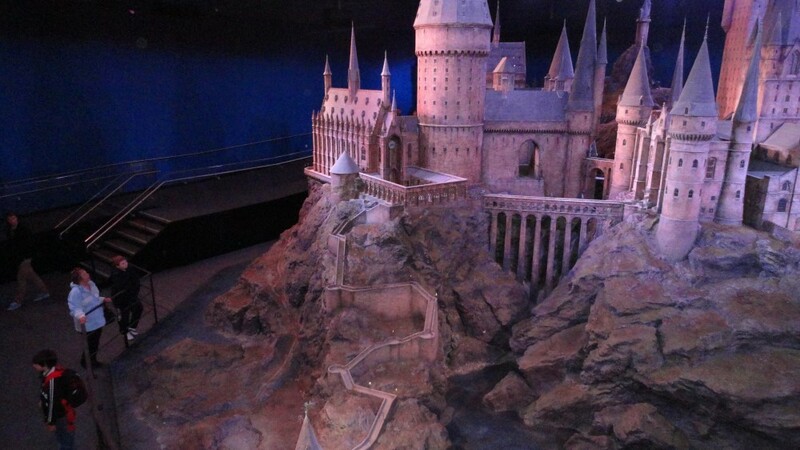 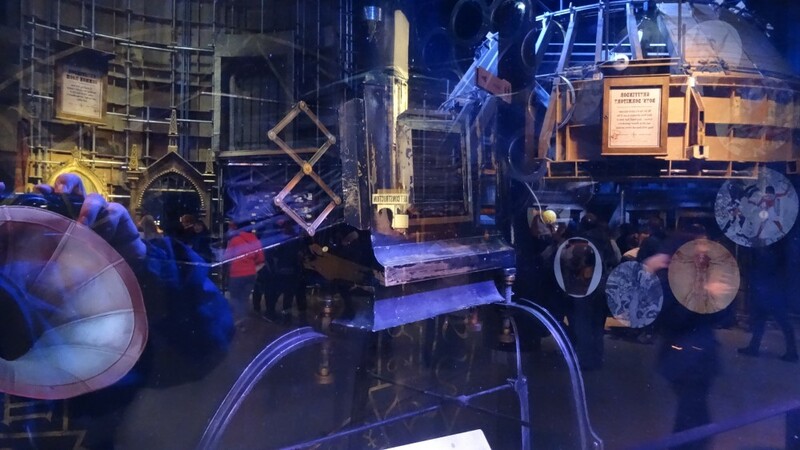 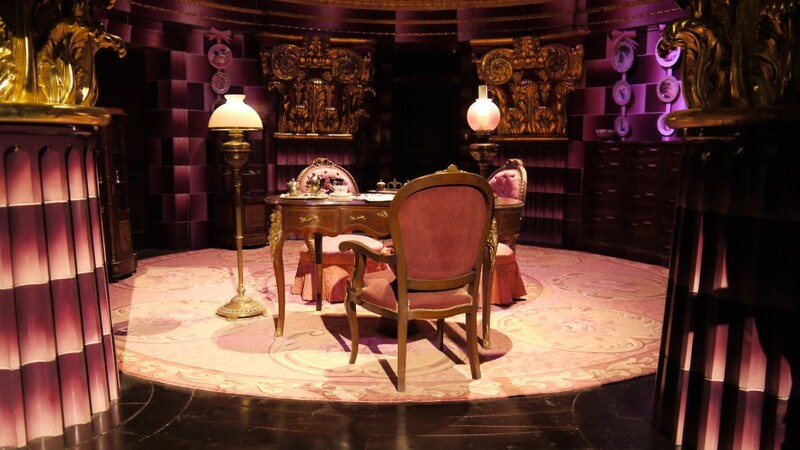 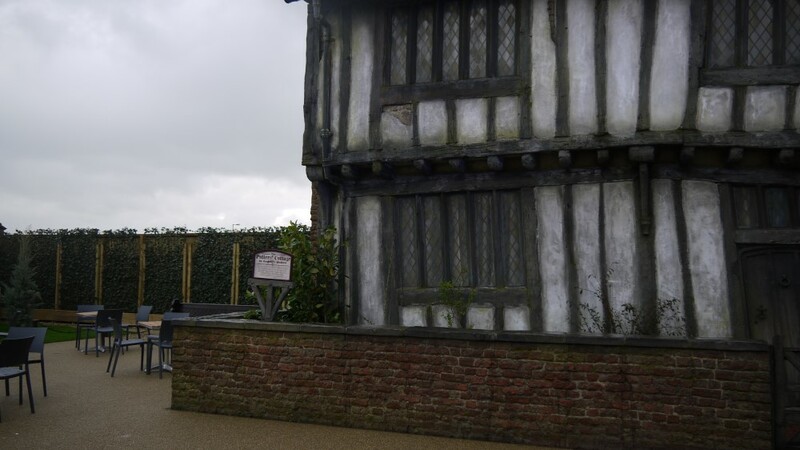 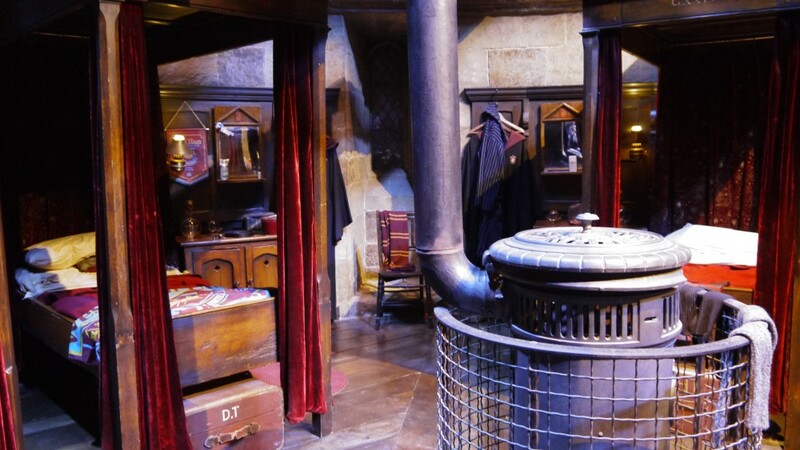 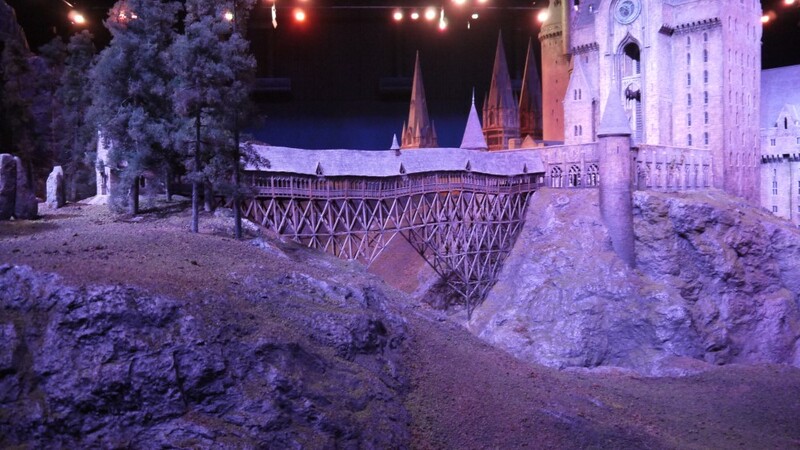 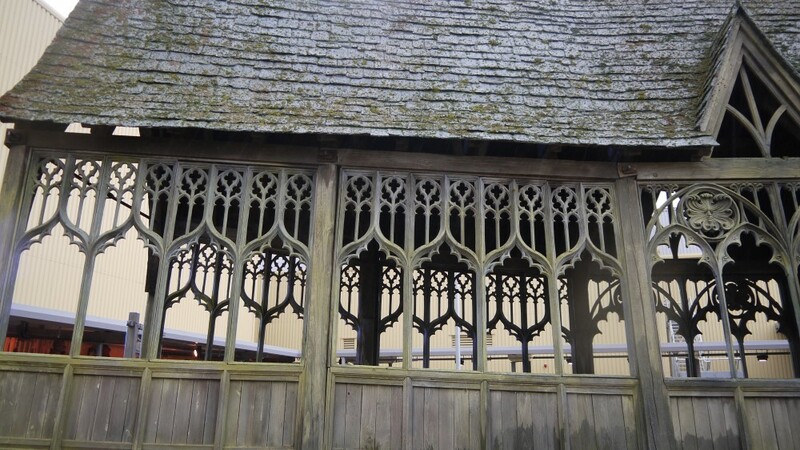 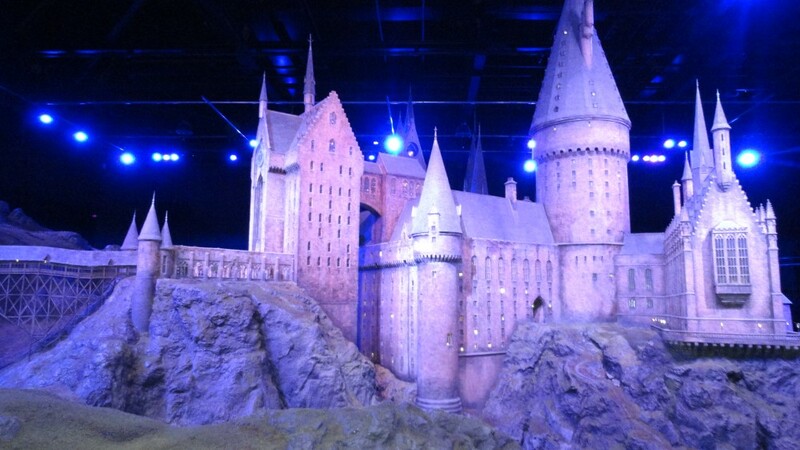 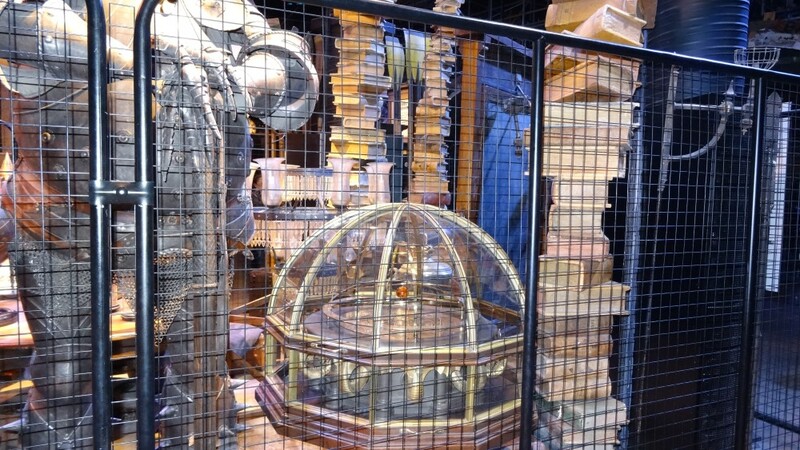 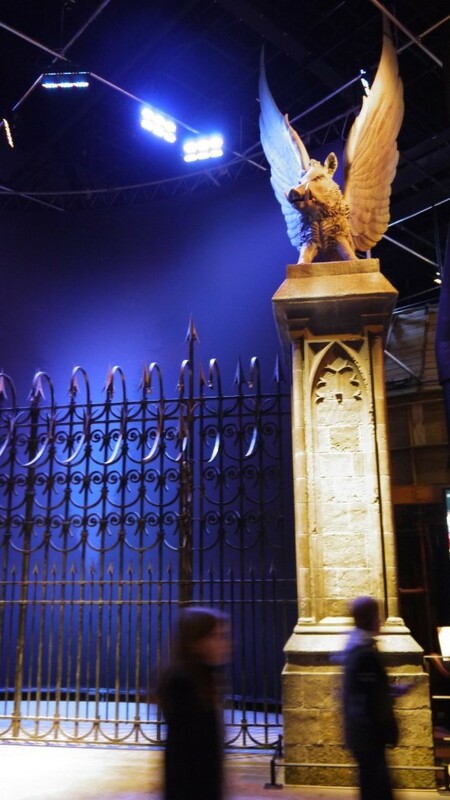 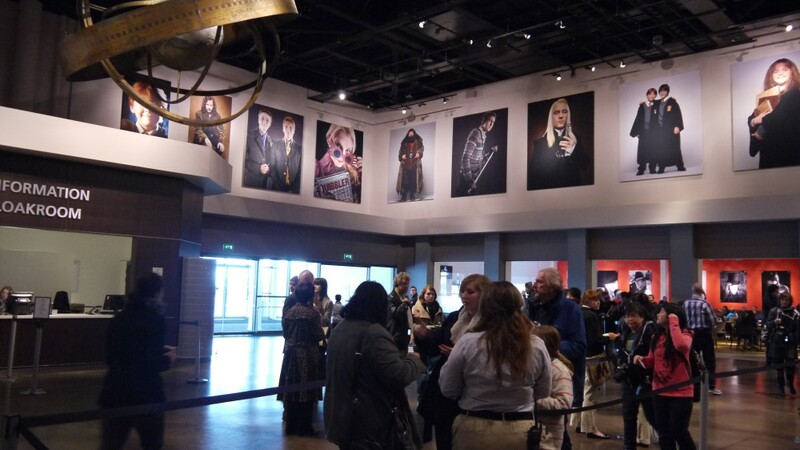 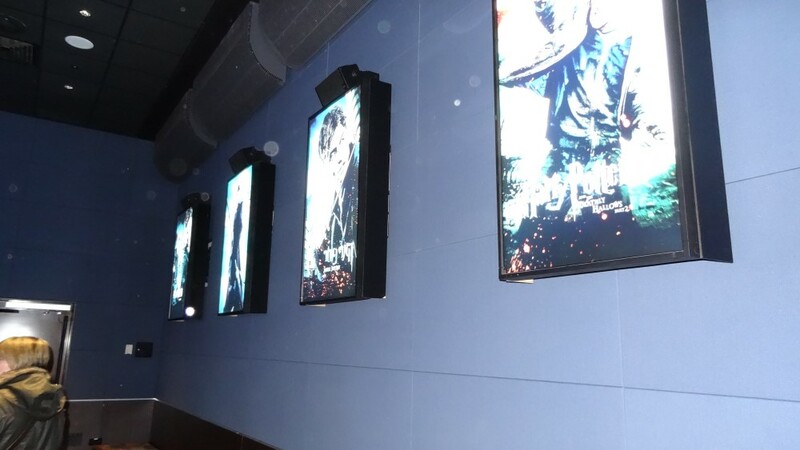 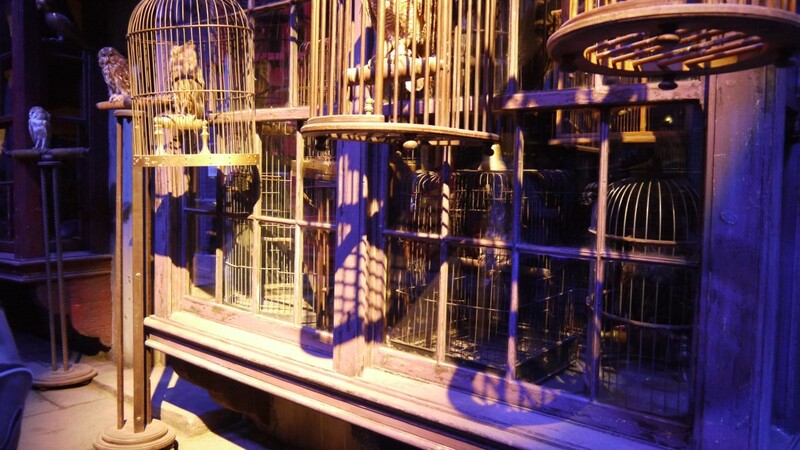 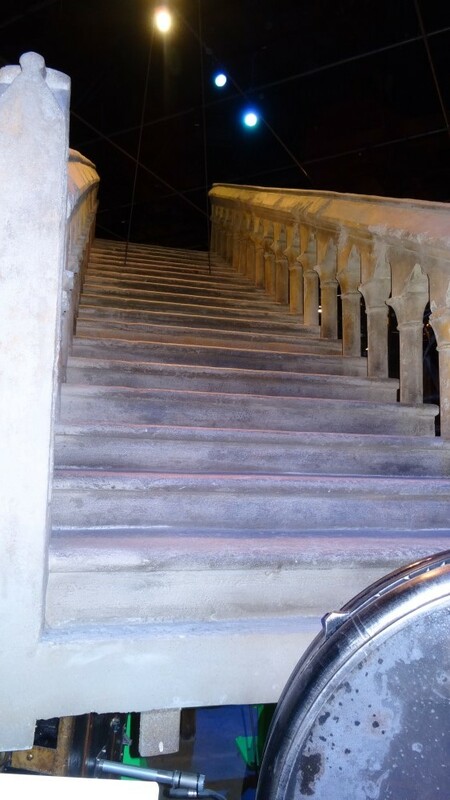 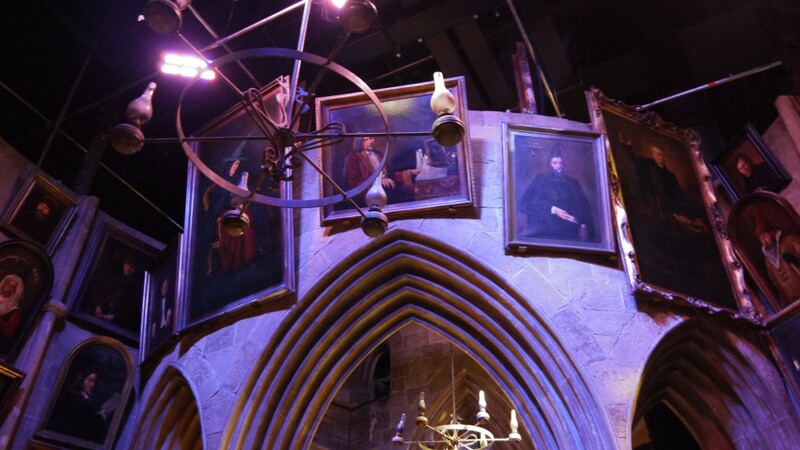 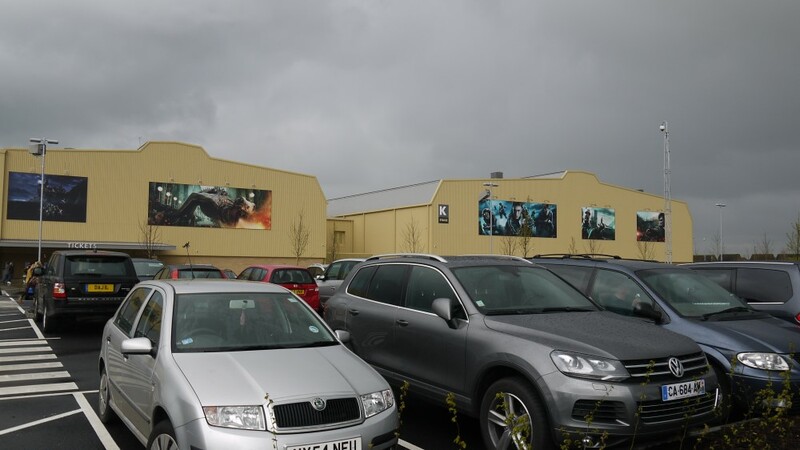 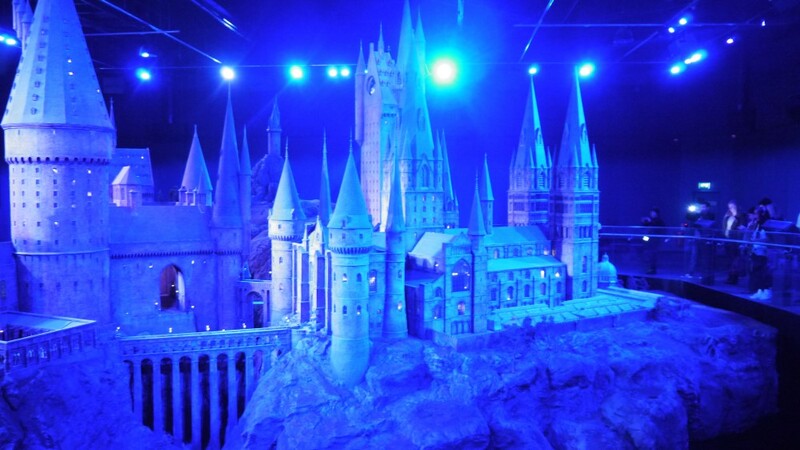 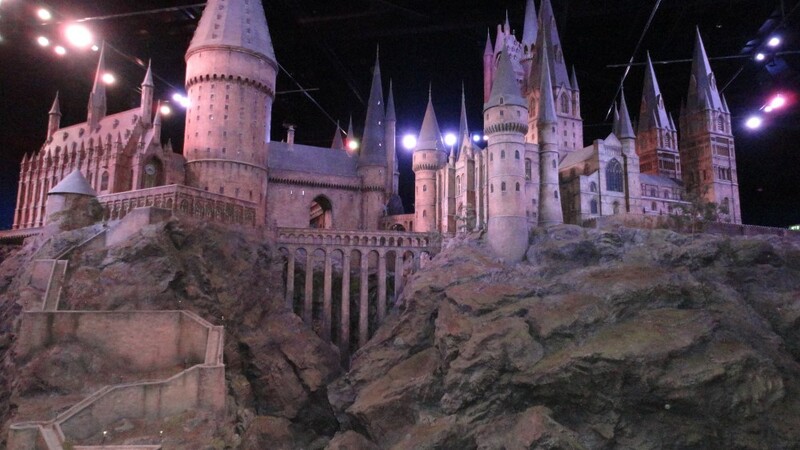 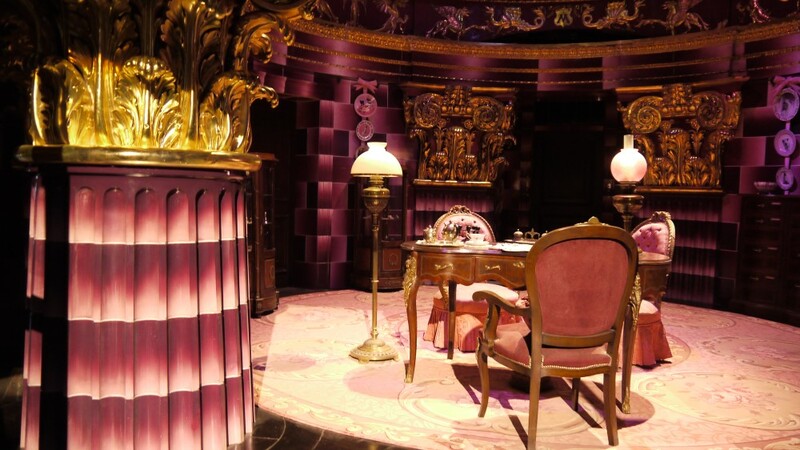 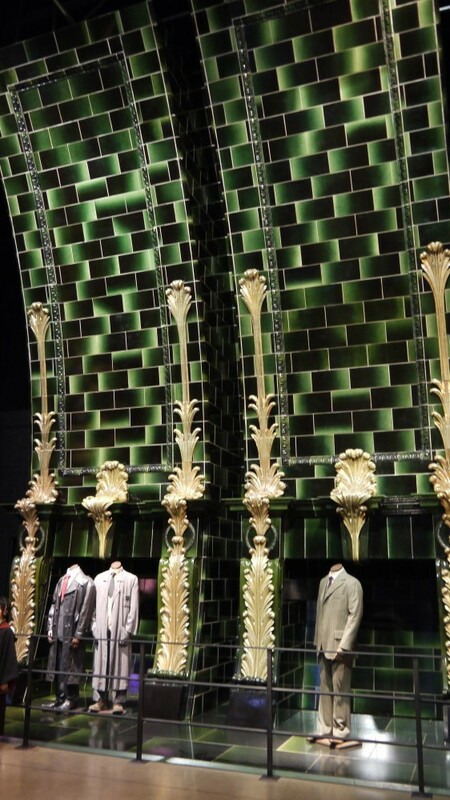 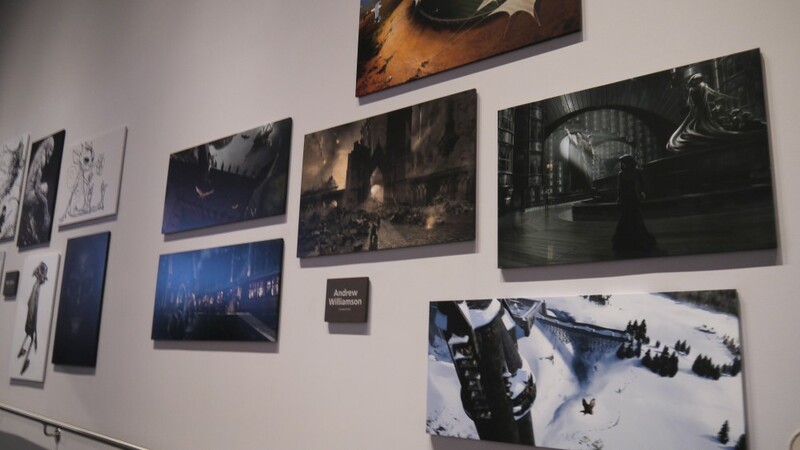 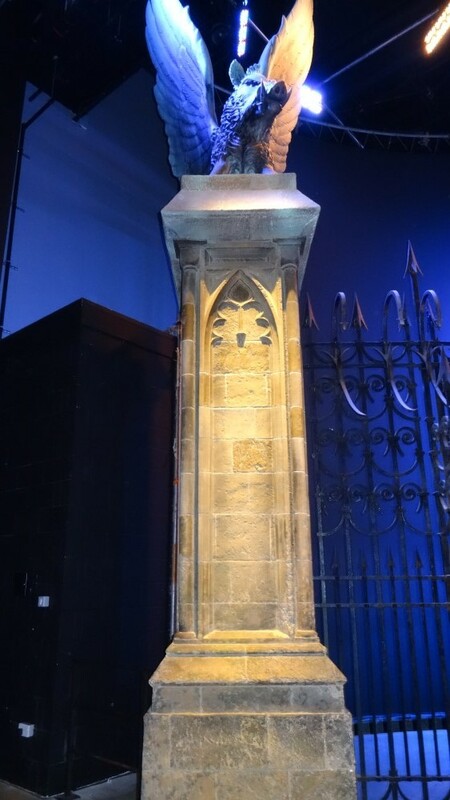 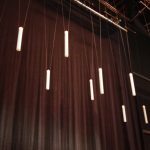 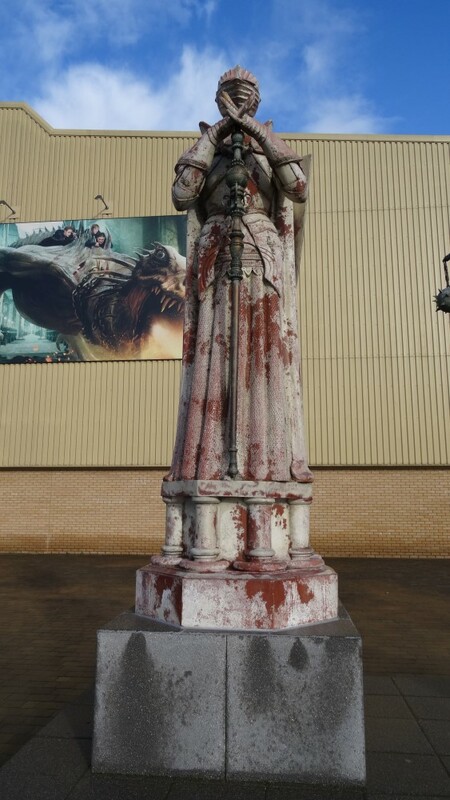 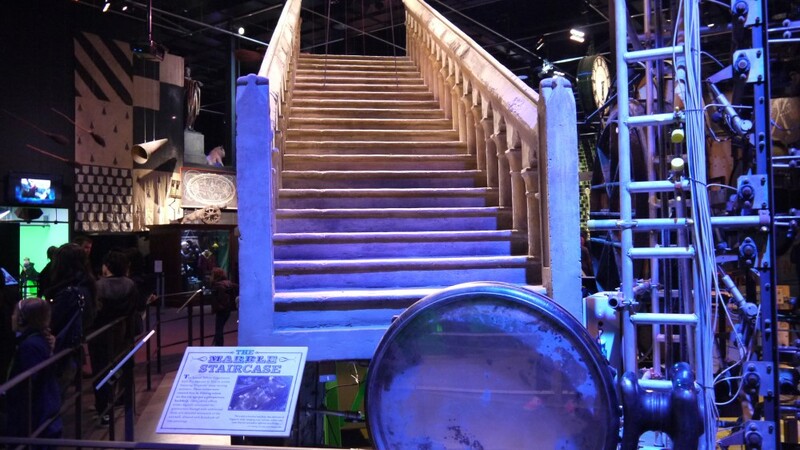 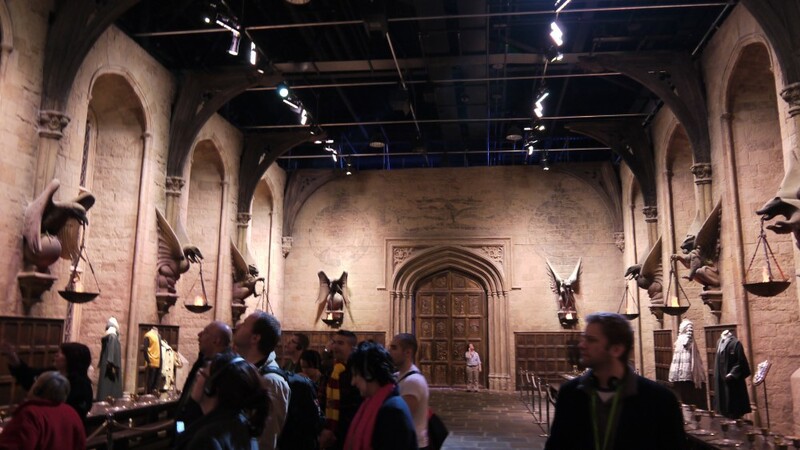 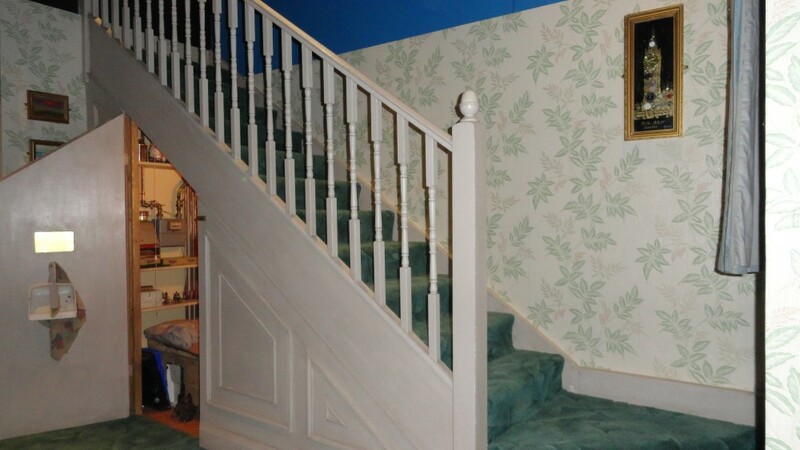 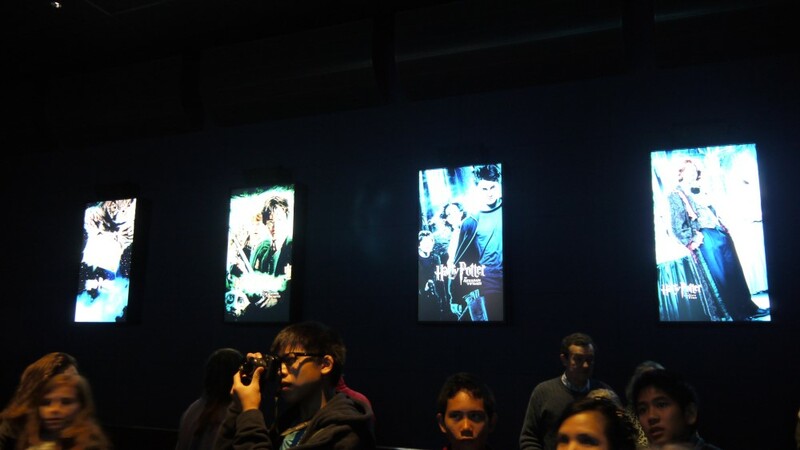 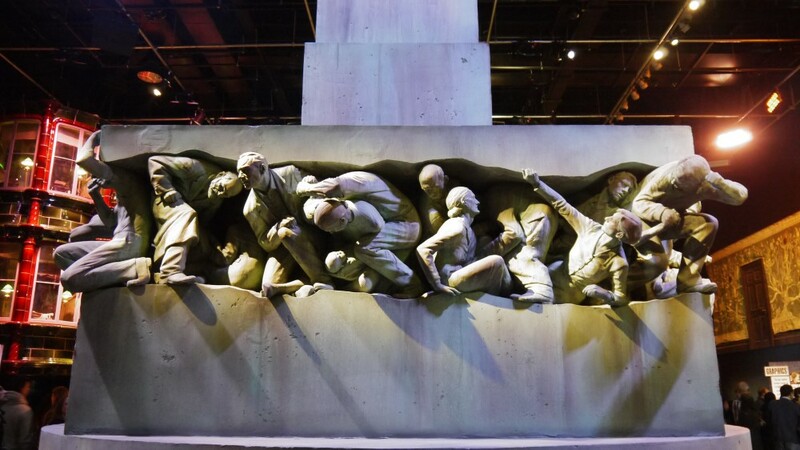 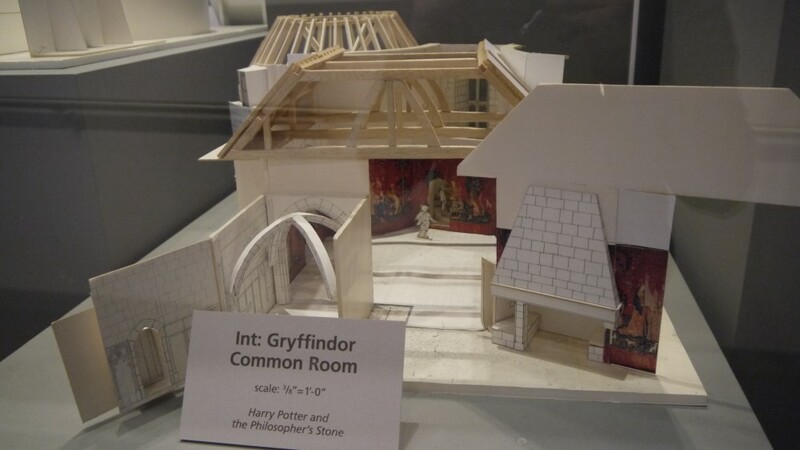 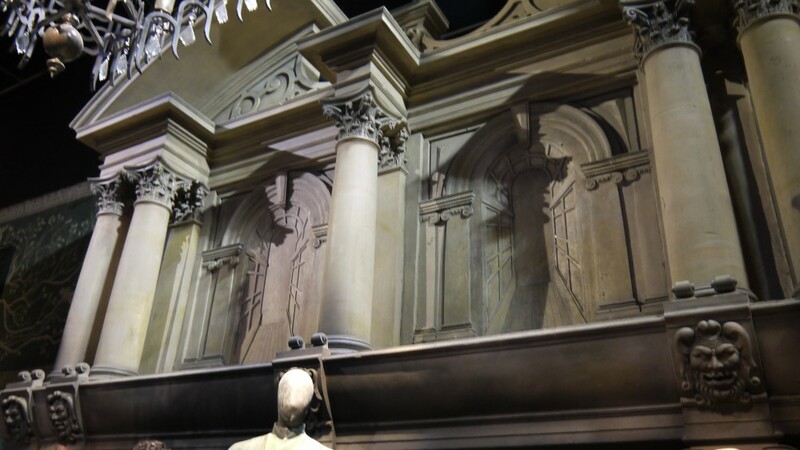 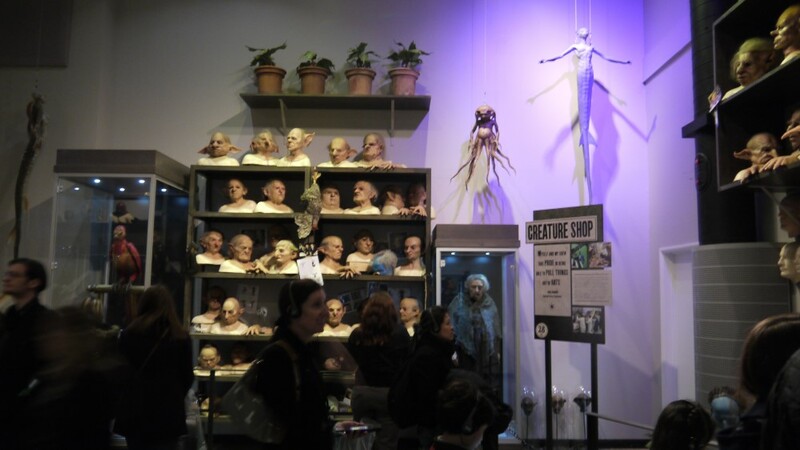 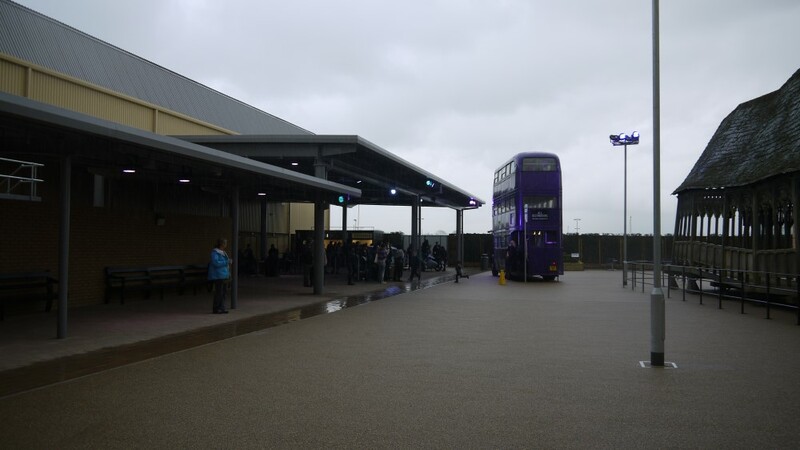 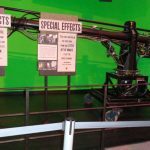 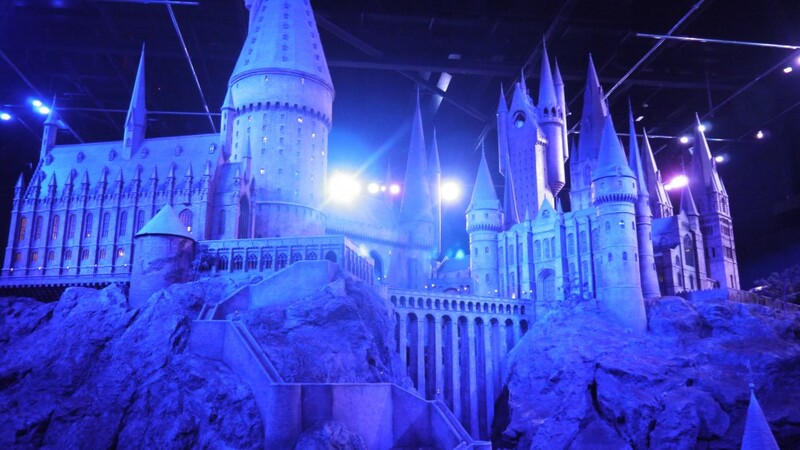 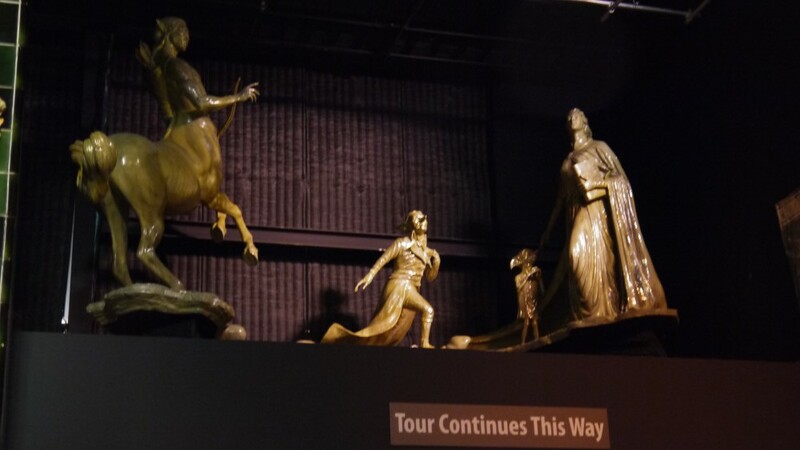 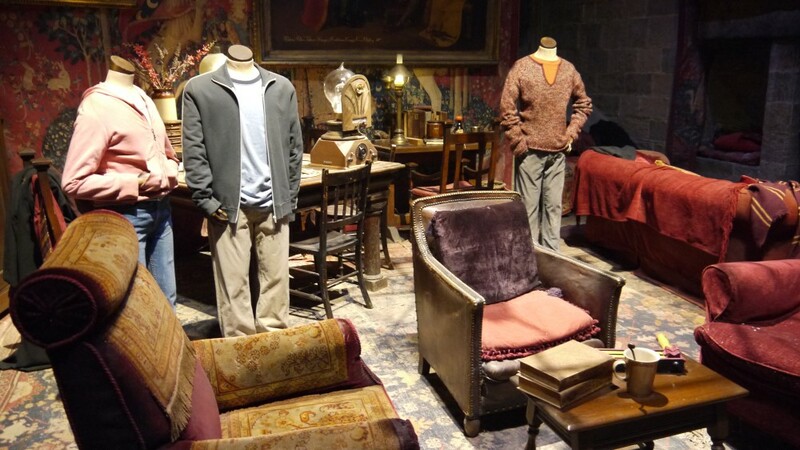 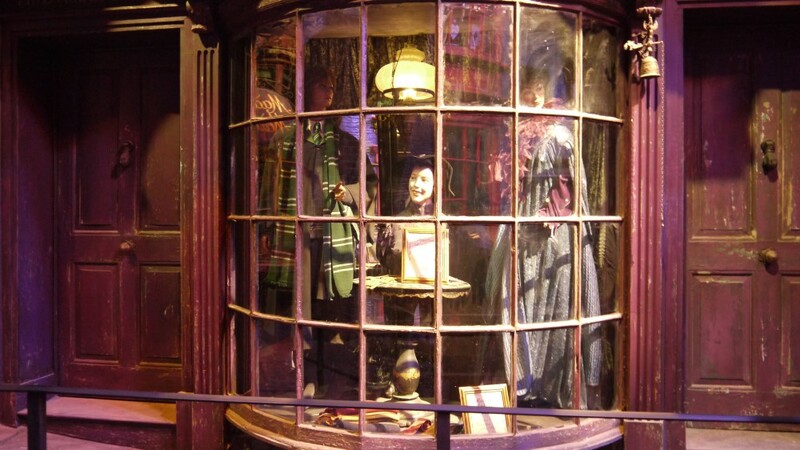 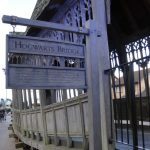 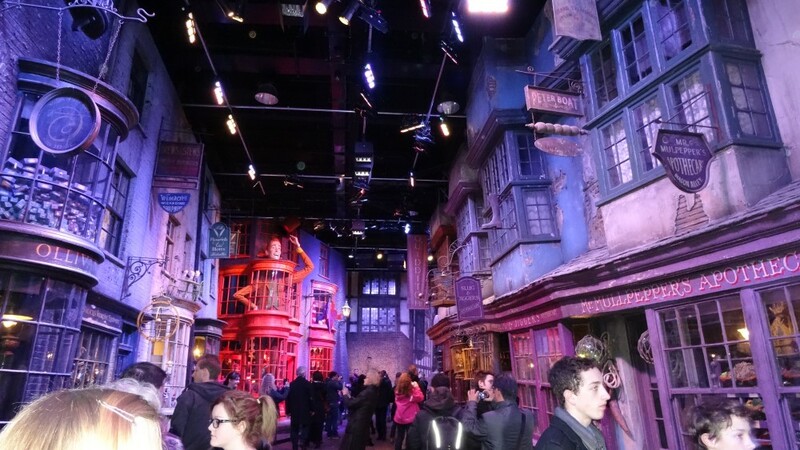 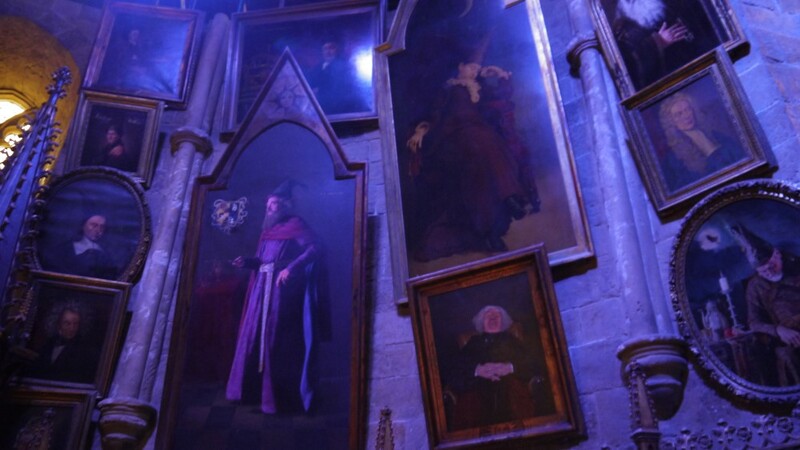 The Studio Tour’s two sound stages hold a number of authentic sets from the Harry Potter film series. 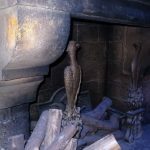 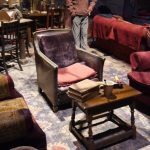 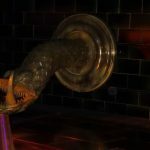 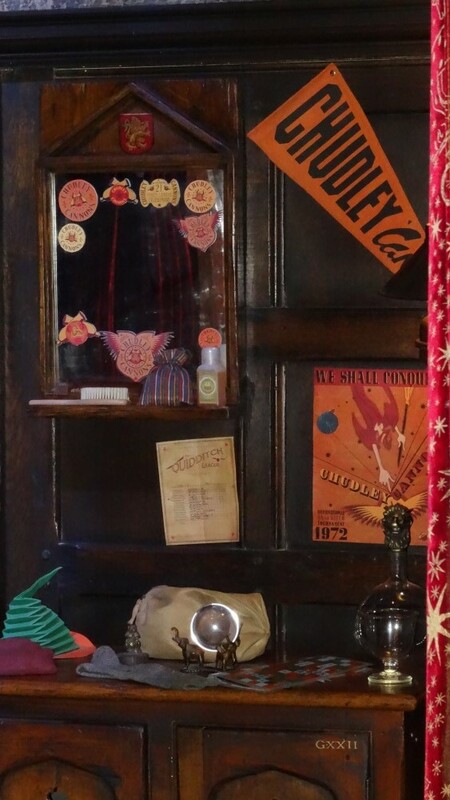 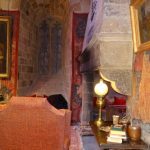 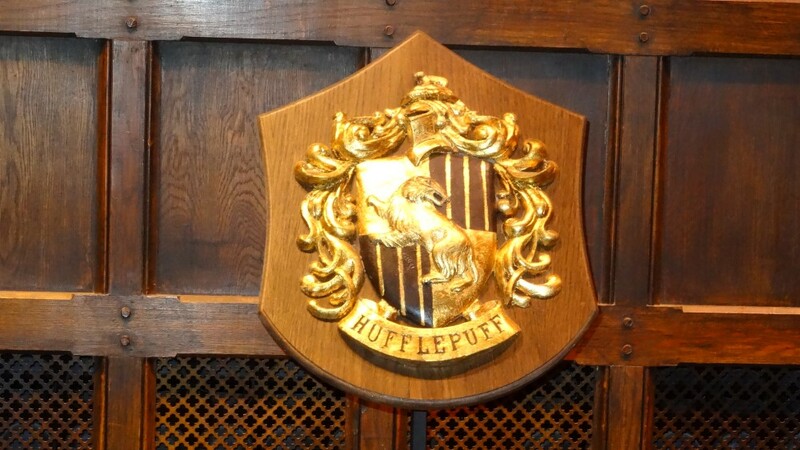 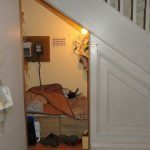 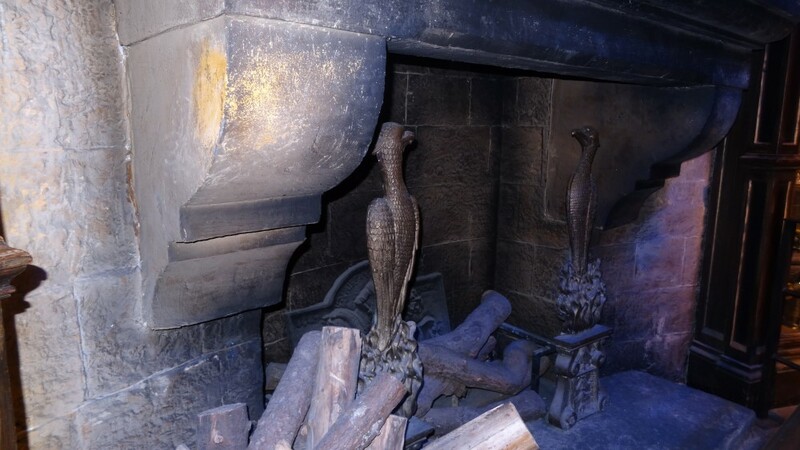 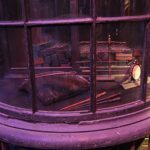 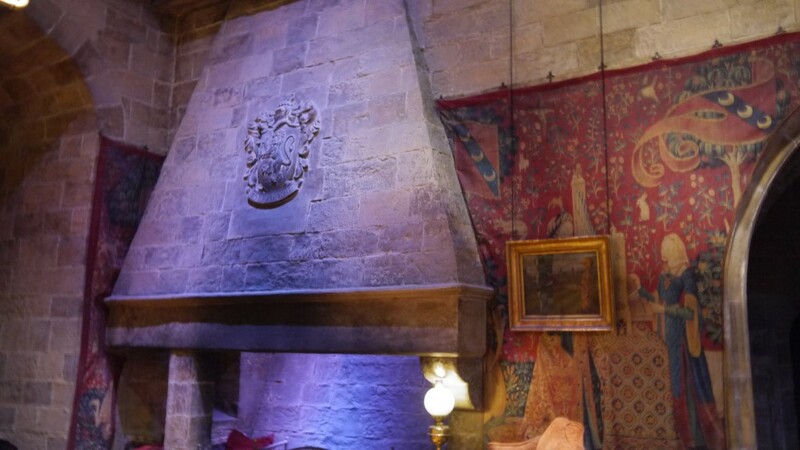 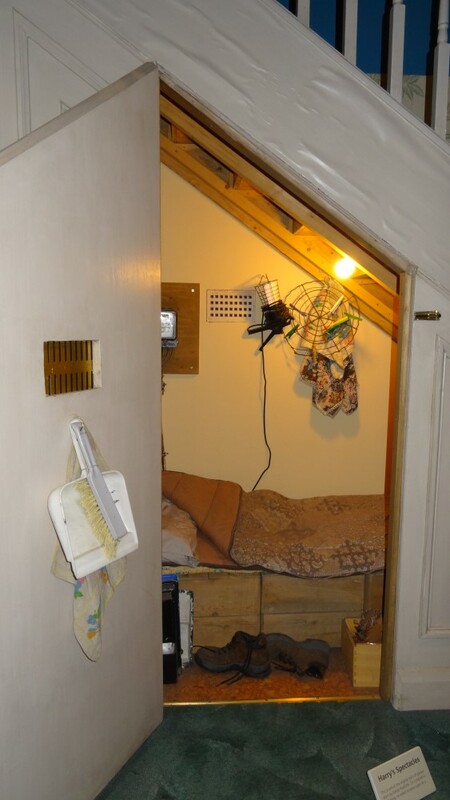 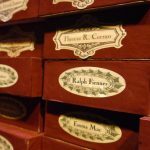 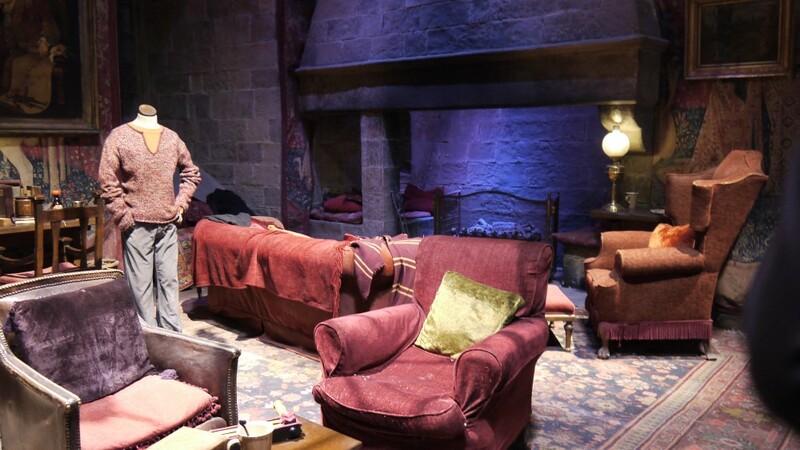 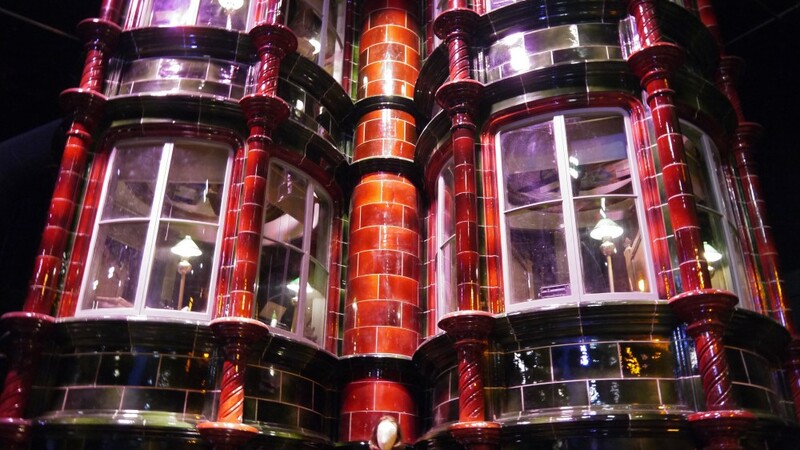 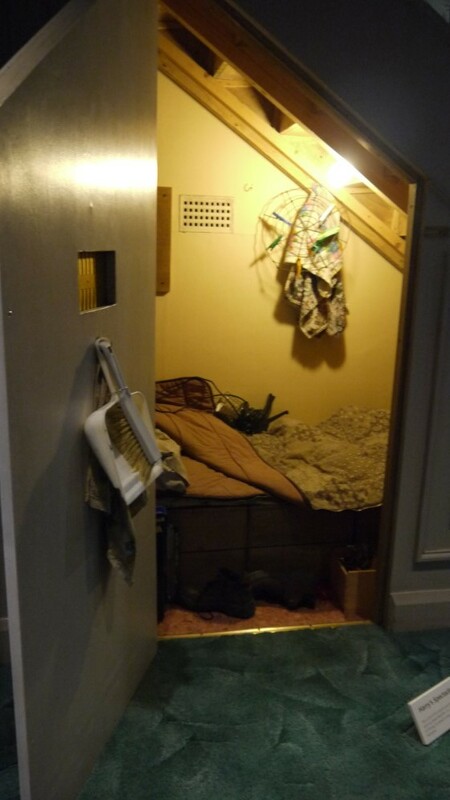 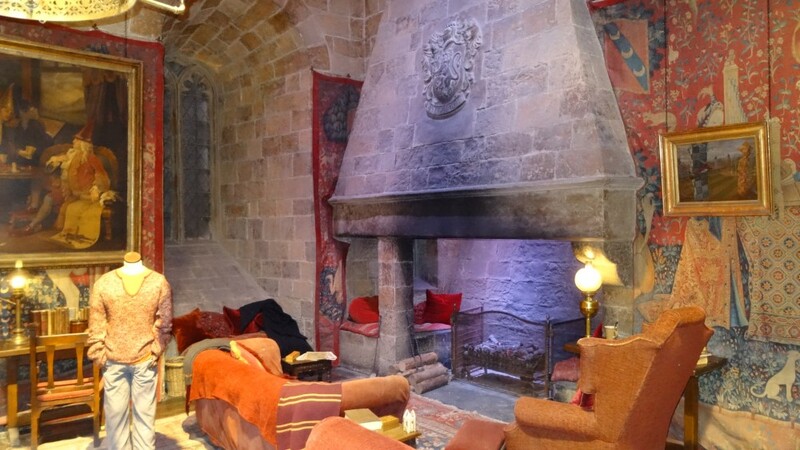 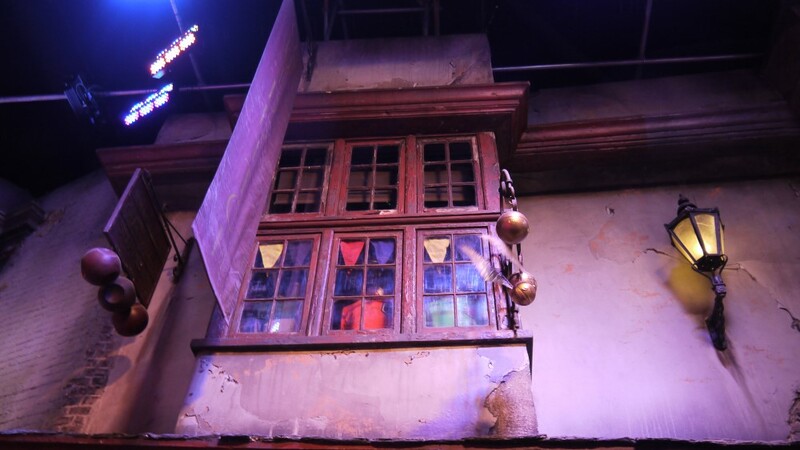 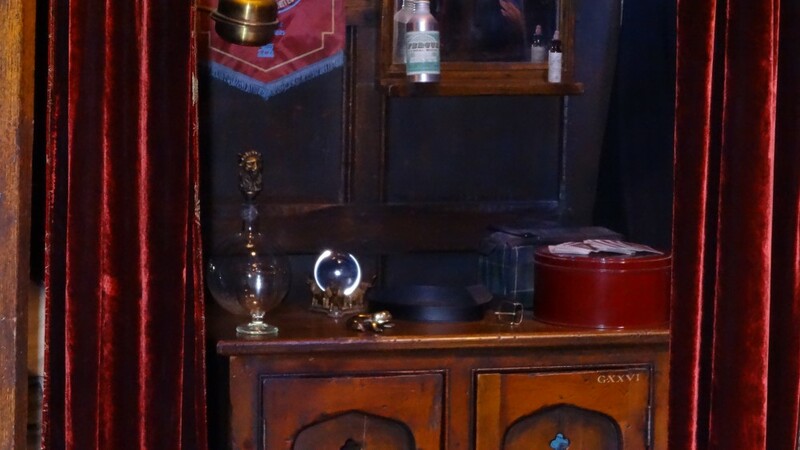 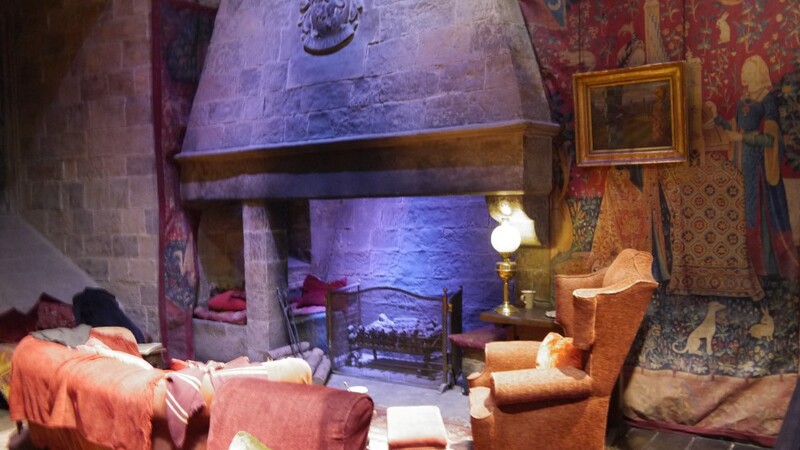 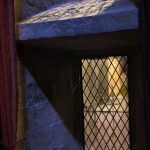 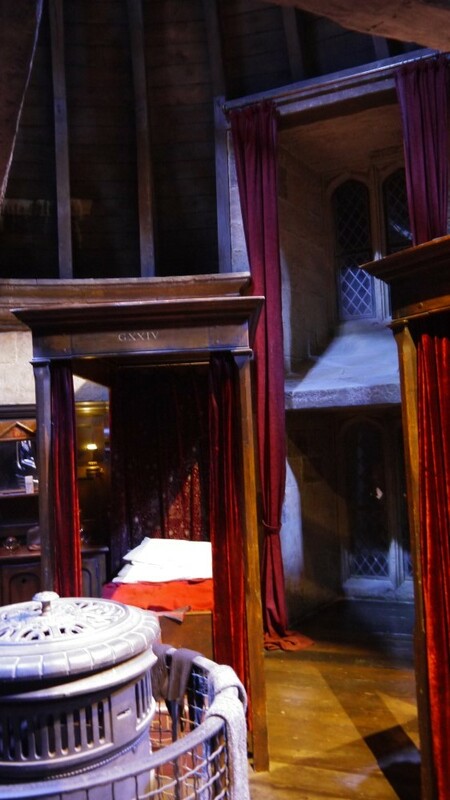 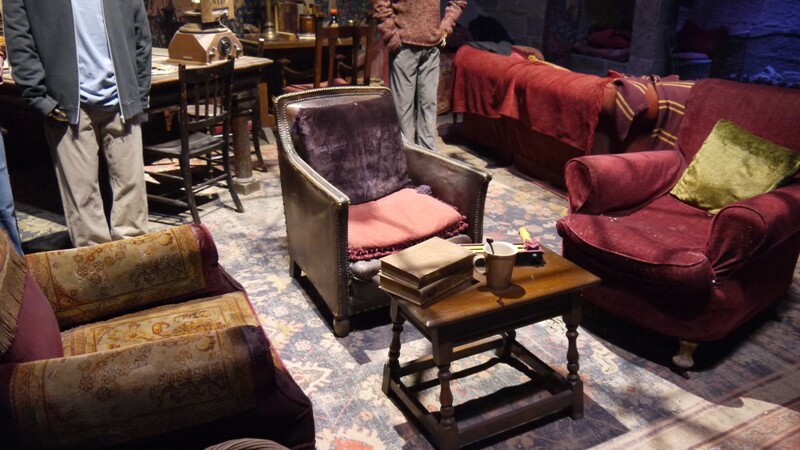 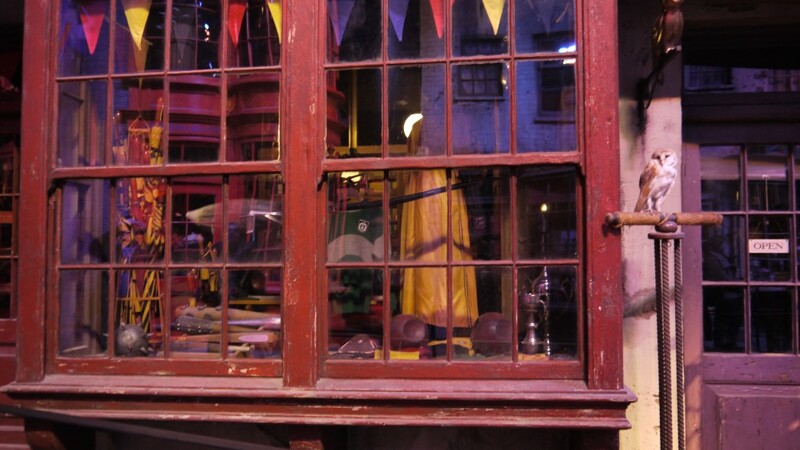 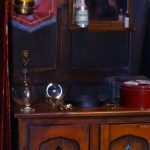 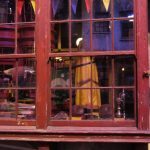 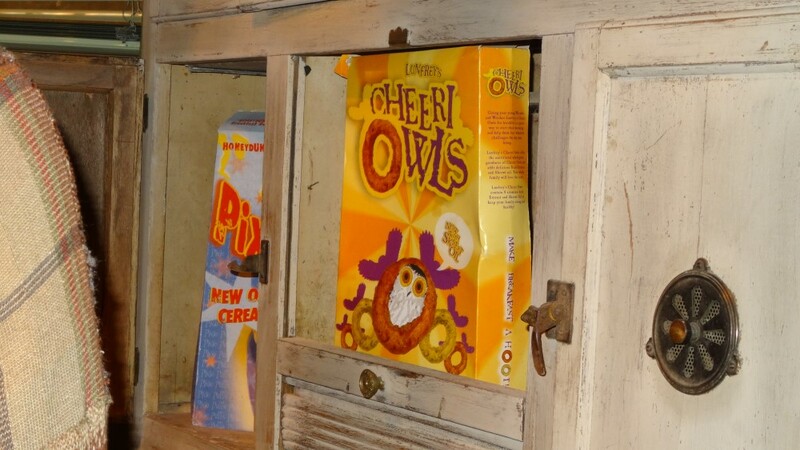 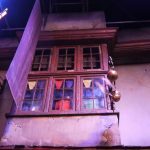 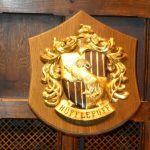 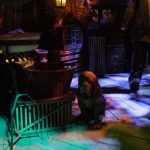 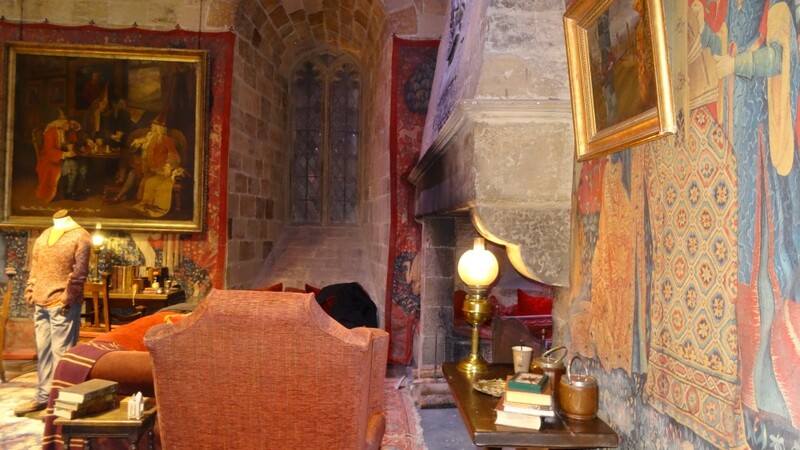 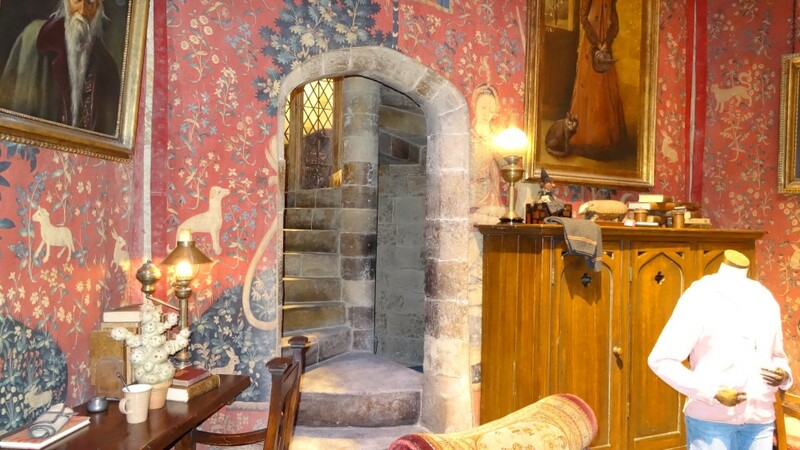 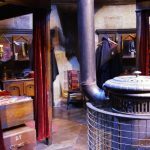 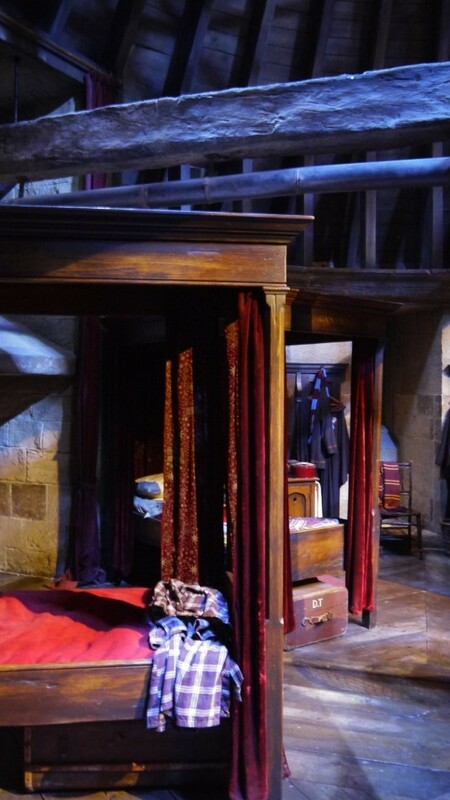 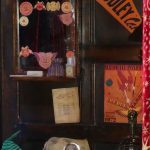 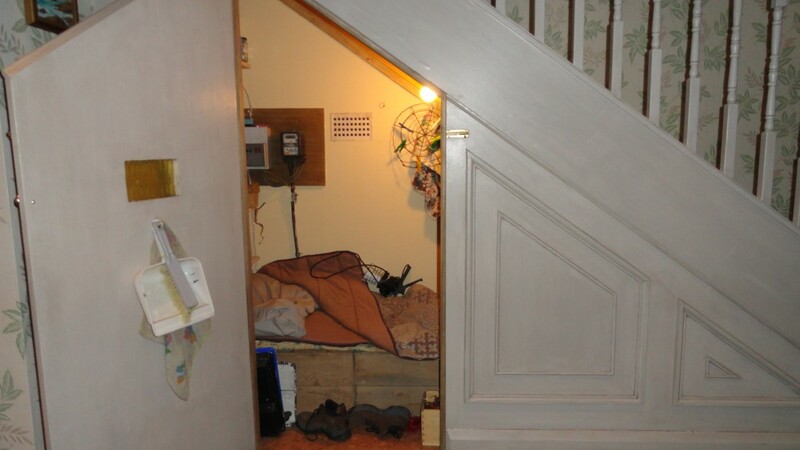 You can stroll down Diagon Alley, peer into the cabinets of Dumbledore’s office and admire the well-worn furniture in Gryffindor common room. 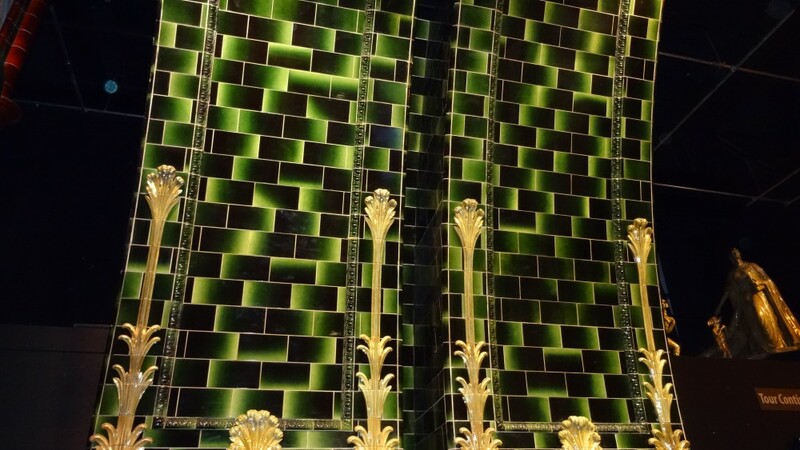 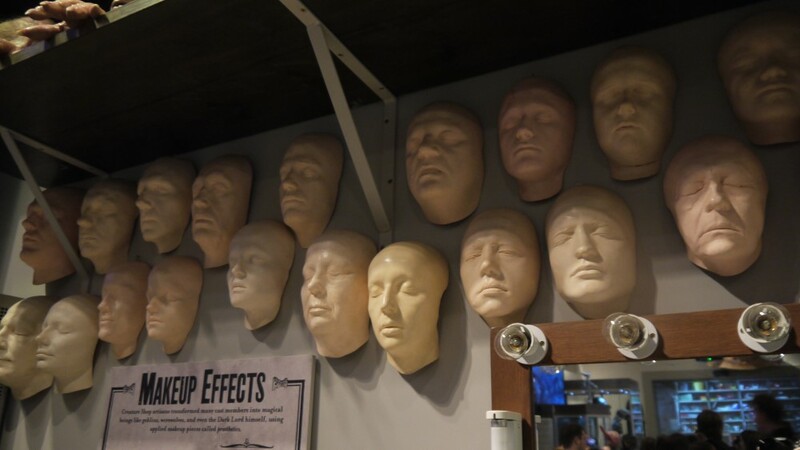 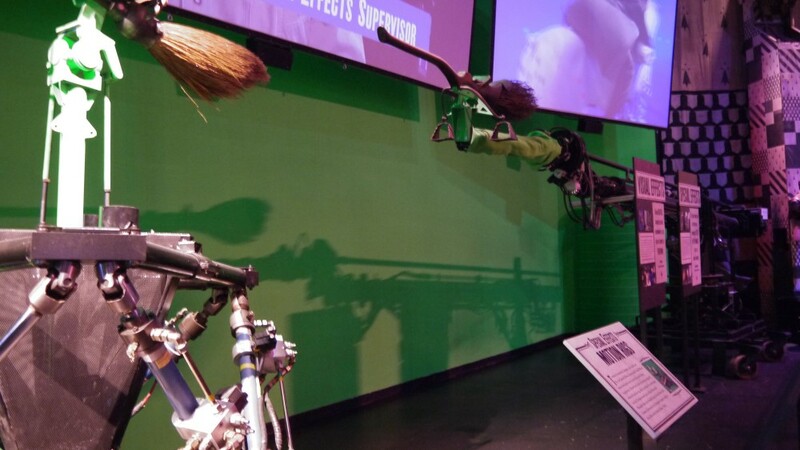 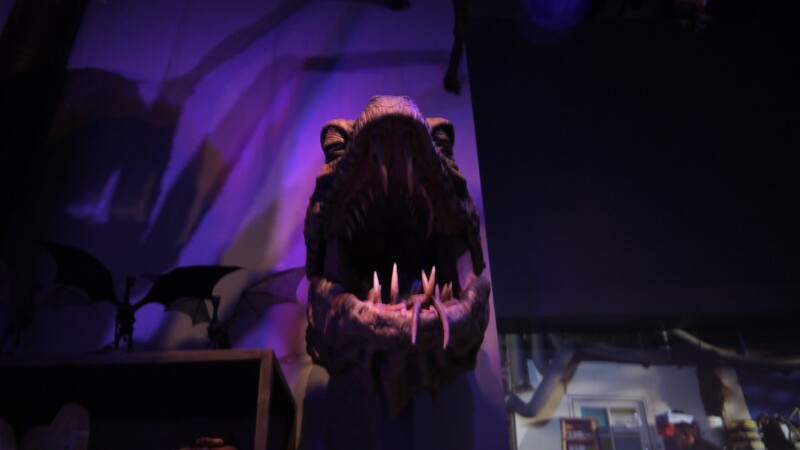 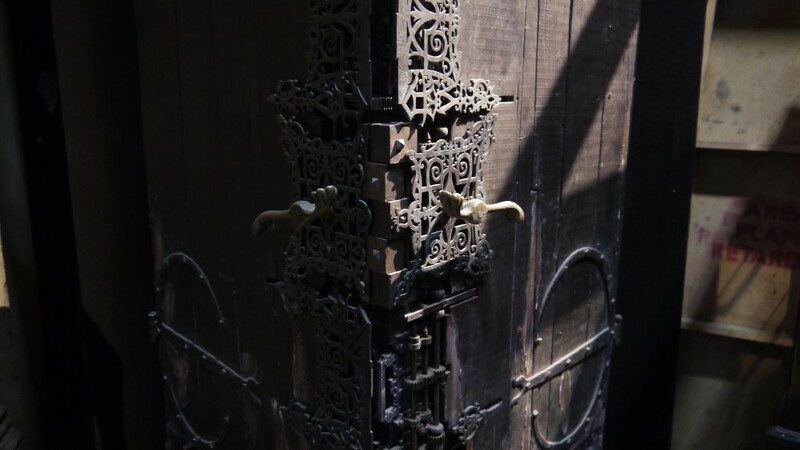 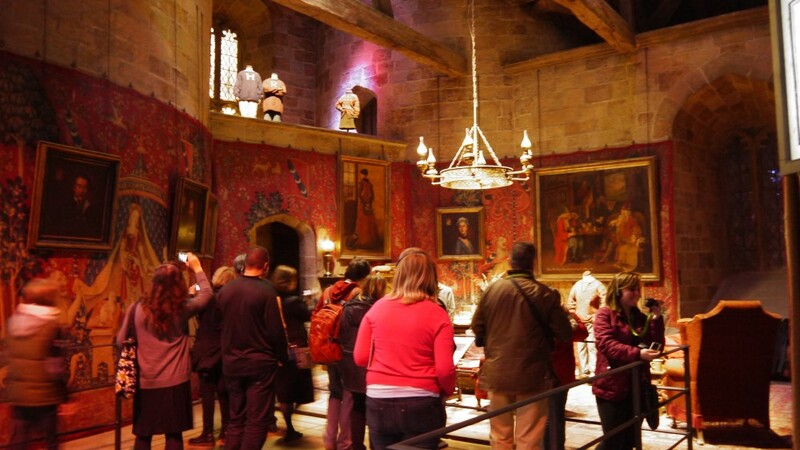 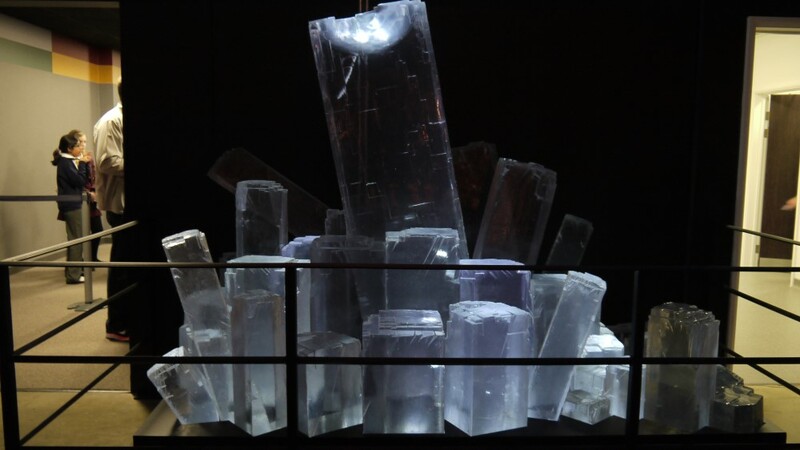 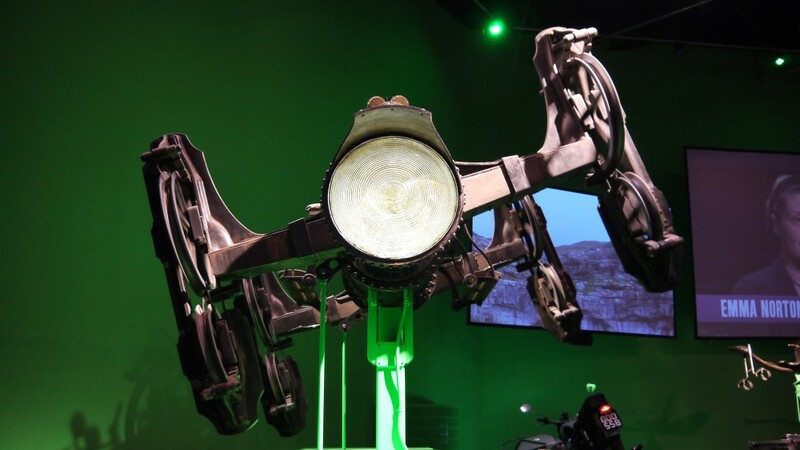 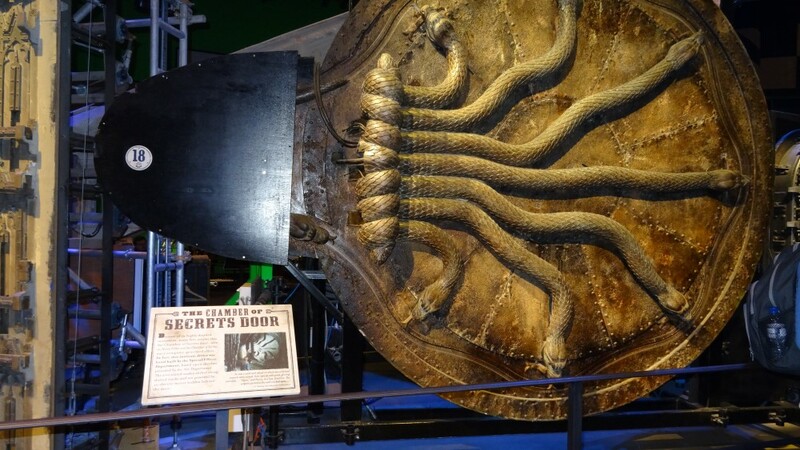 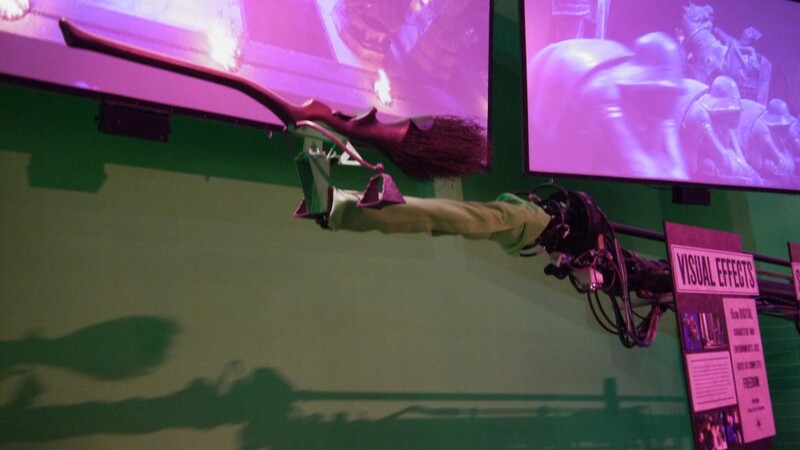 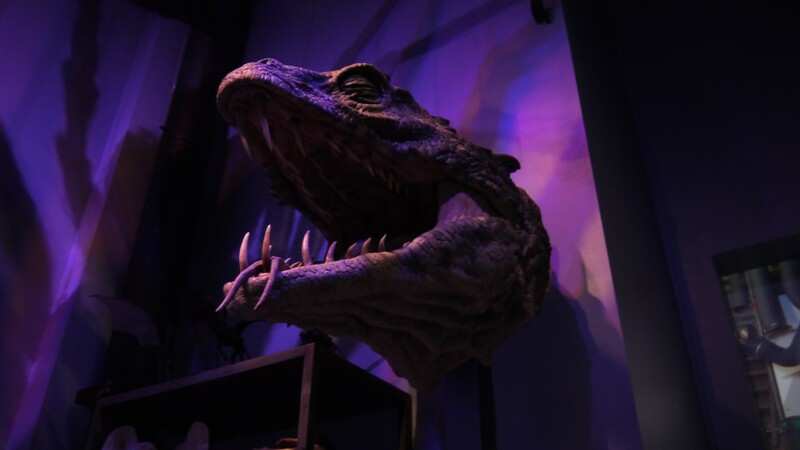 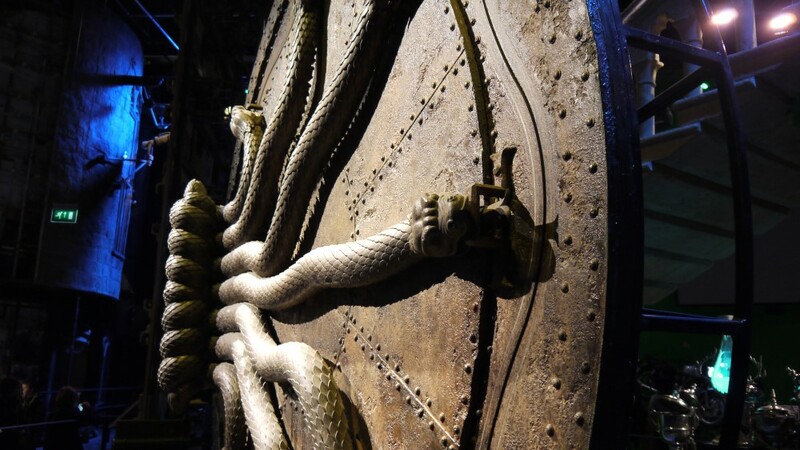 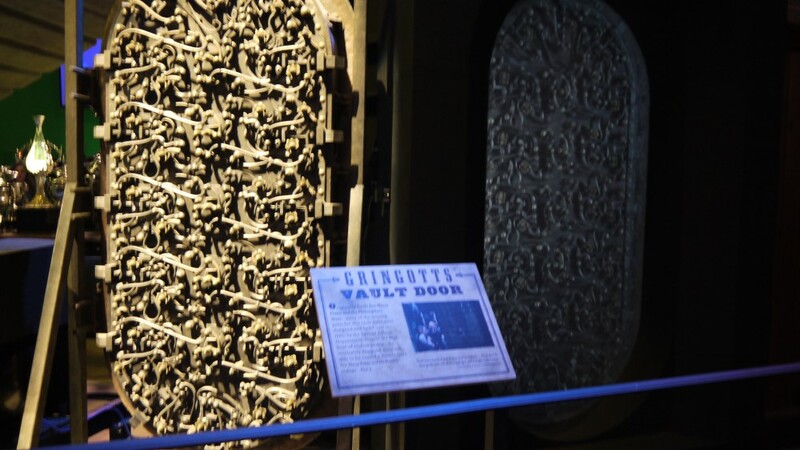 Learn a host of visual and special effects techniques here at the Studio Tour, as you get up close to the real entrance to the Chamber of Secrets, examine household special effects in the Weasley kitchen and discover how the Great Hall’s magical ceiling was created. 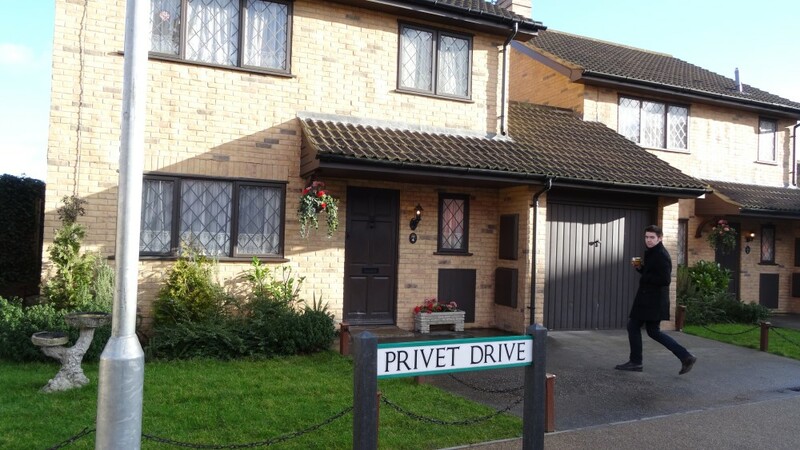 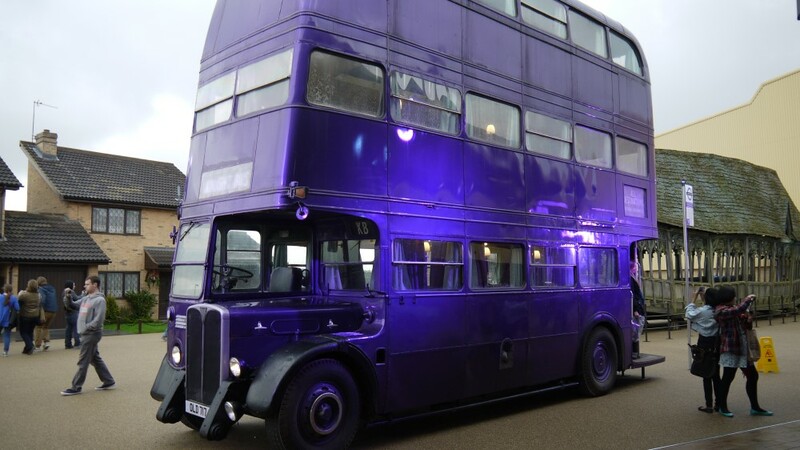 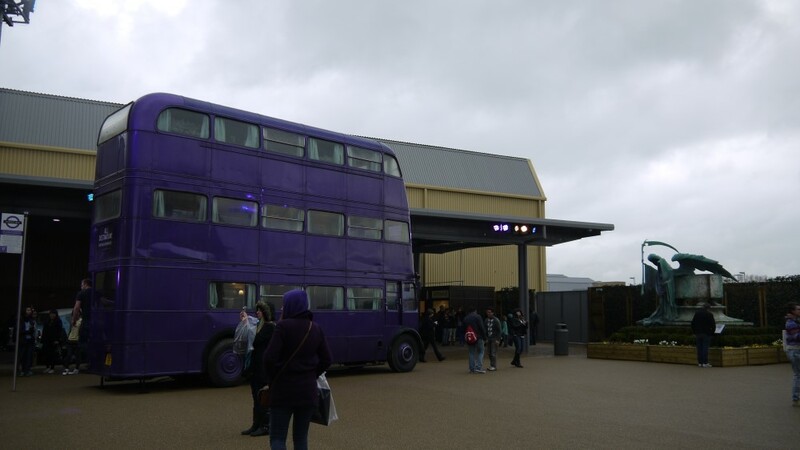 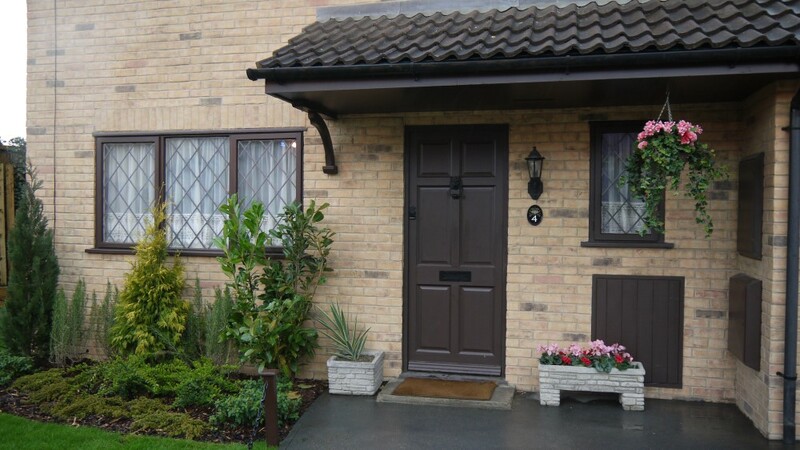 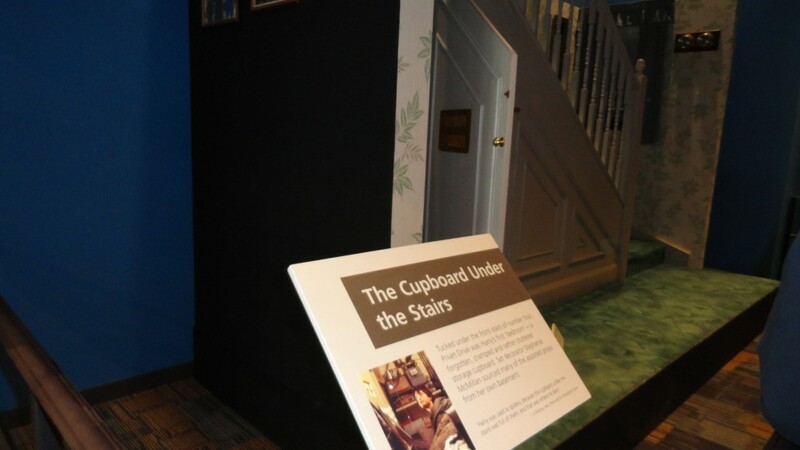 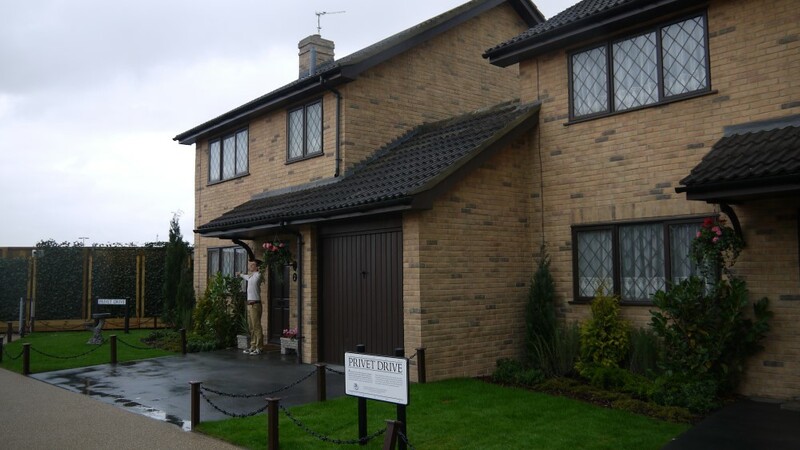 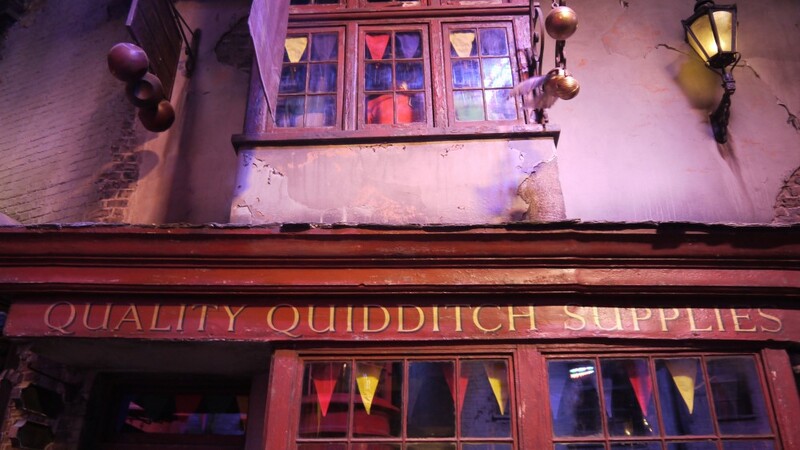 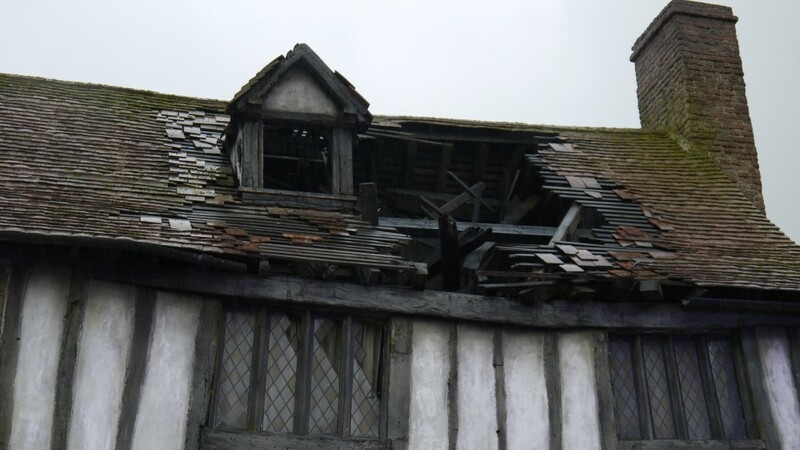 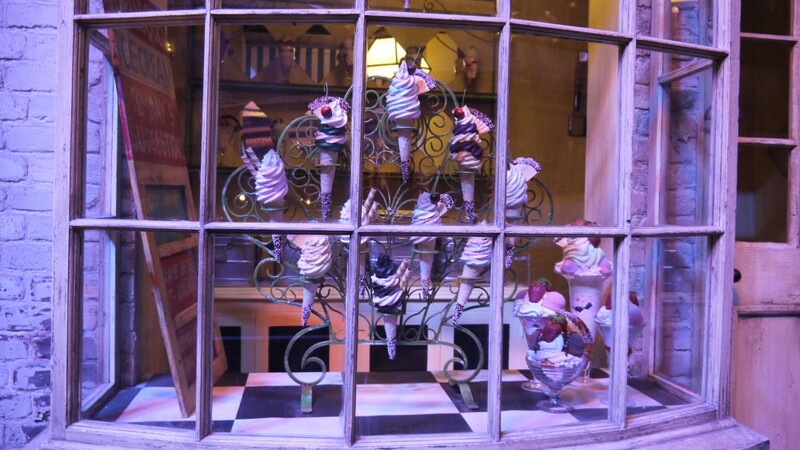 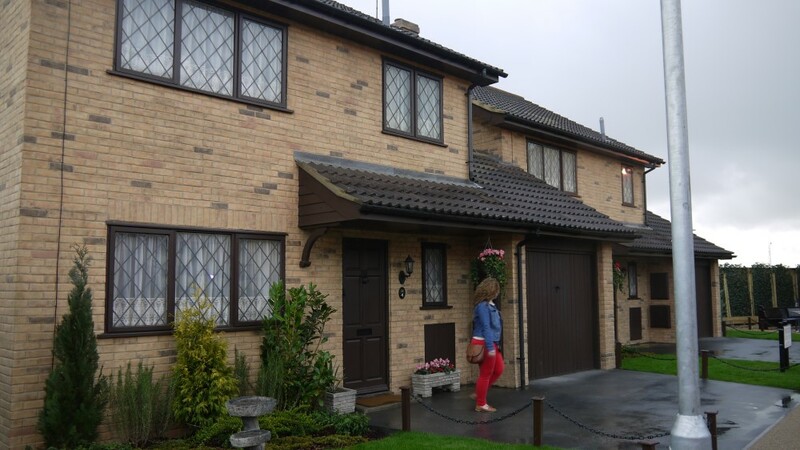 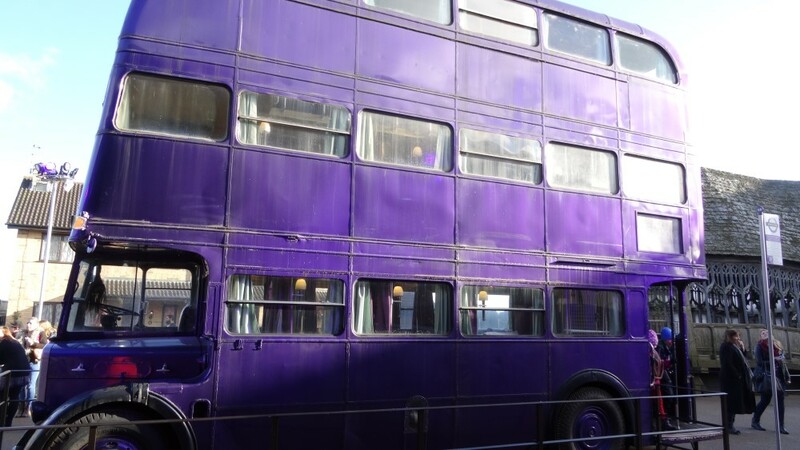 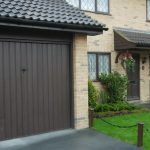 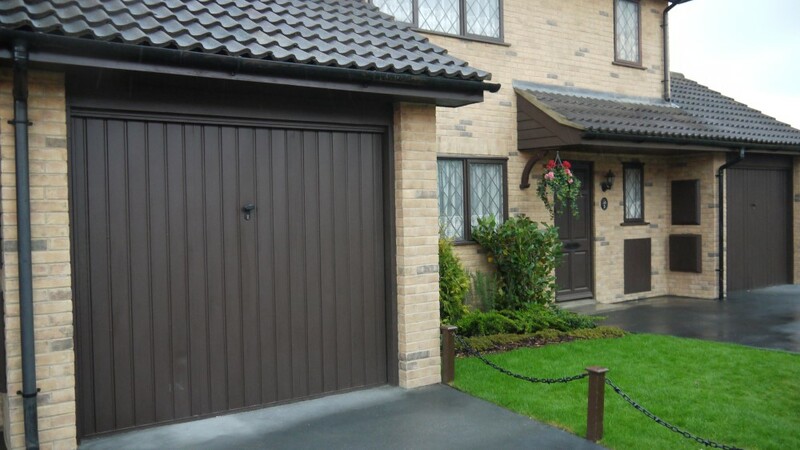 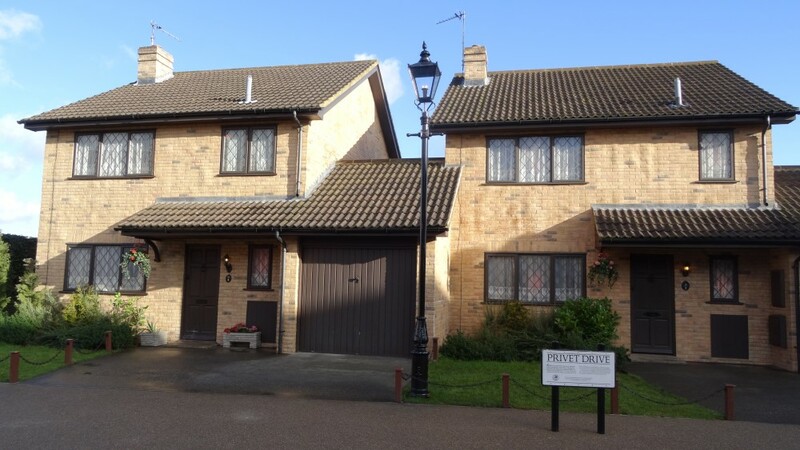 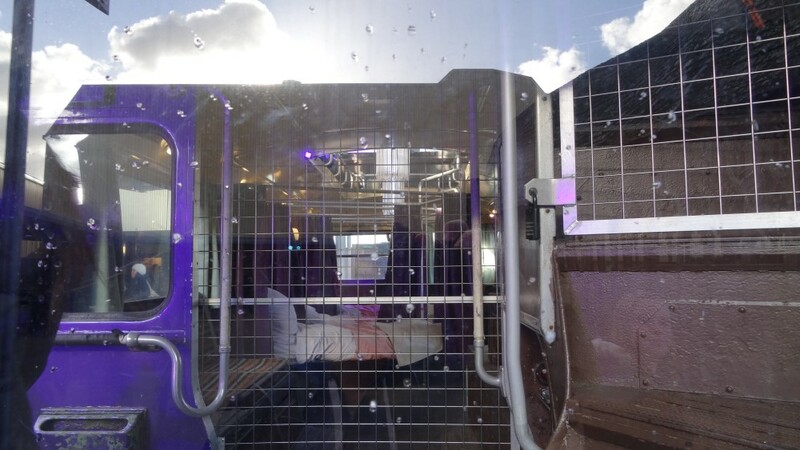 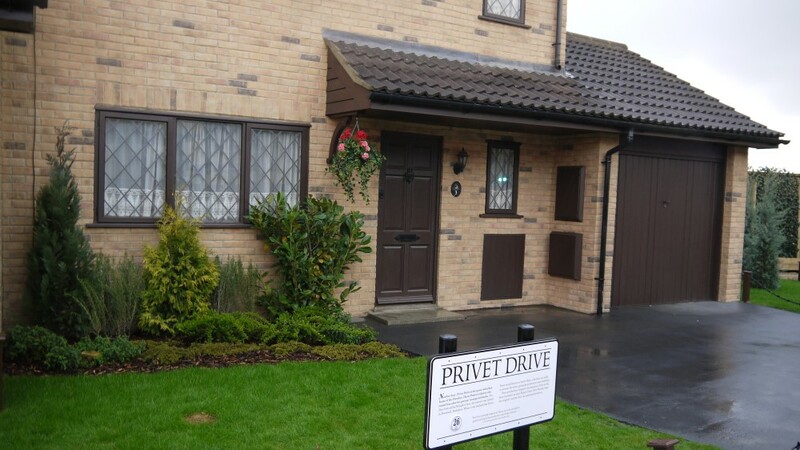 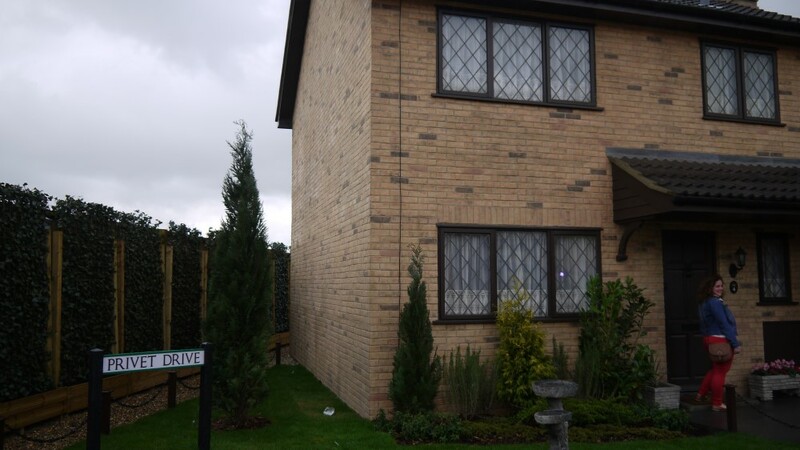 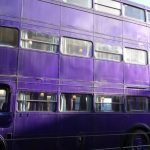 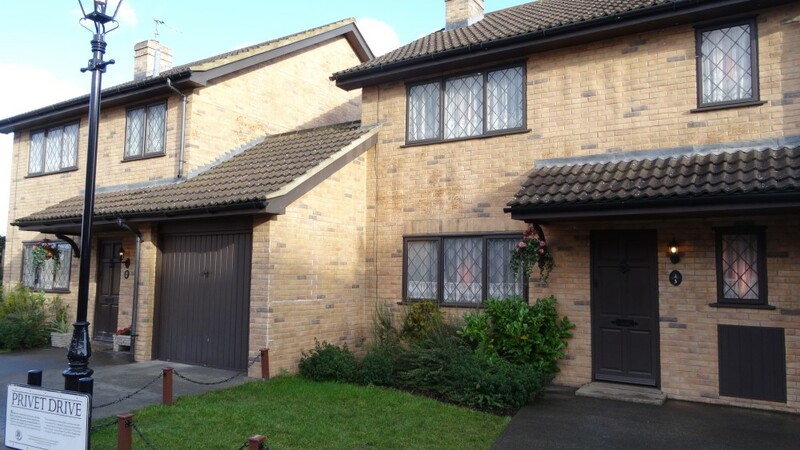 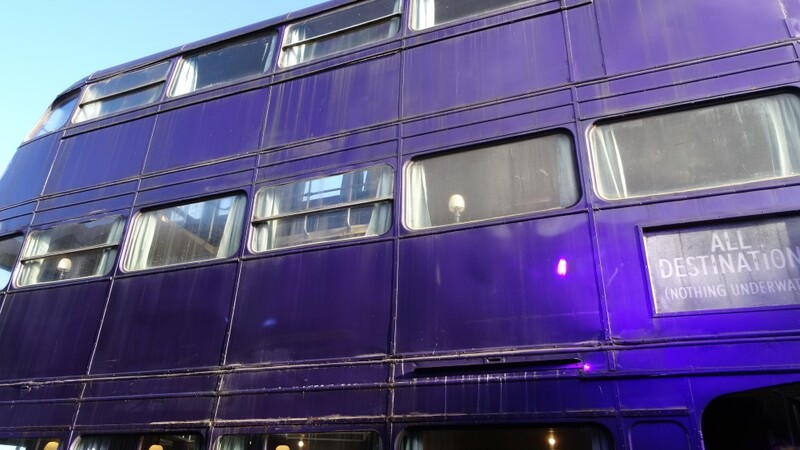 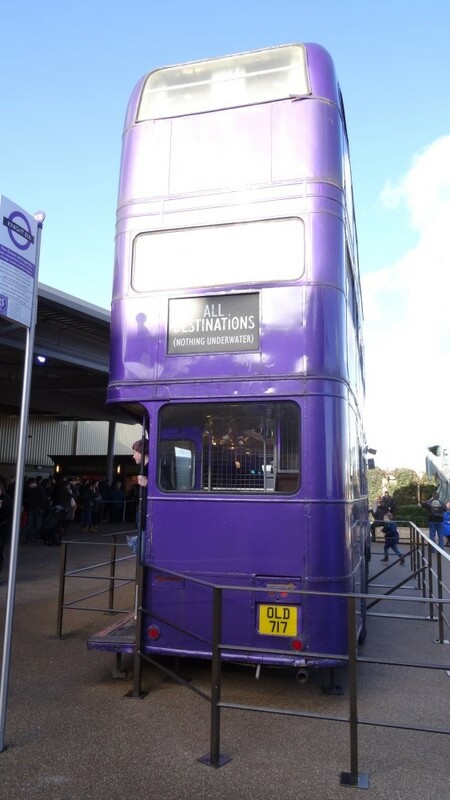 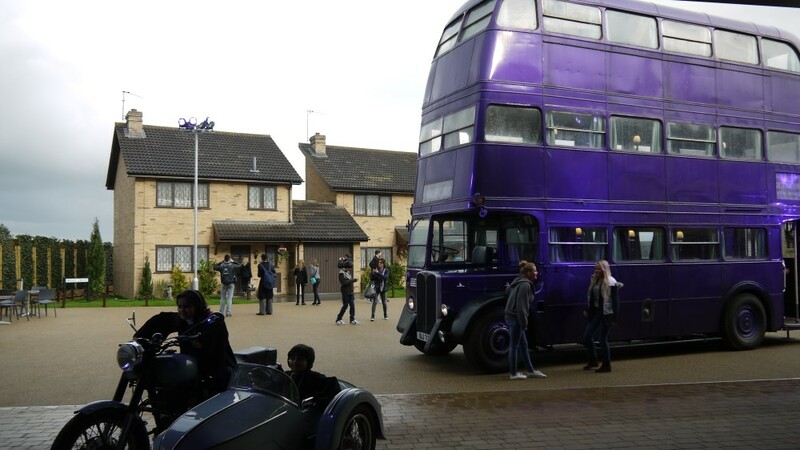 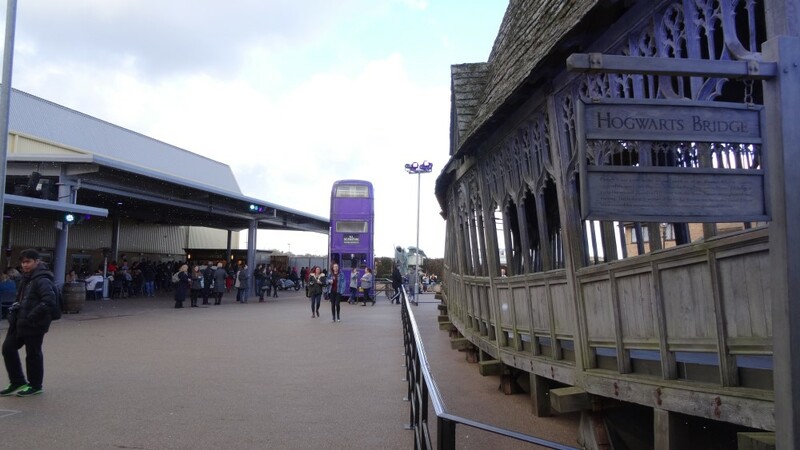 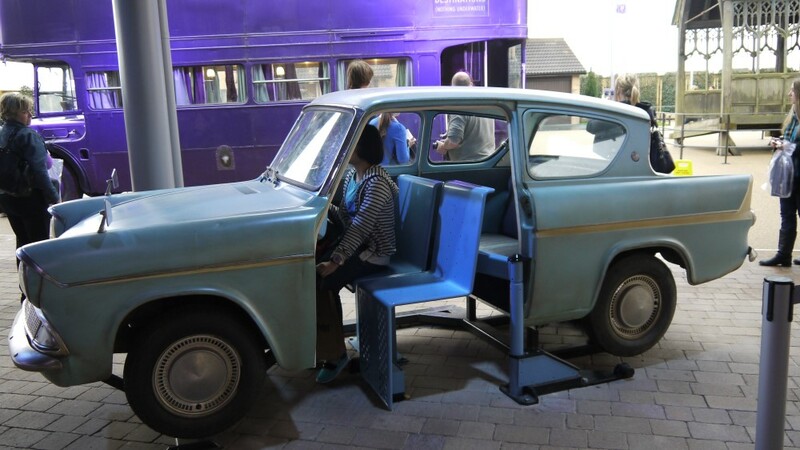 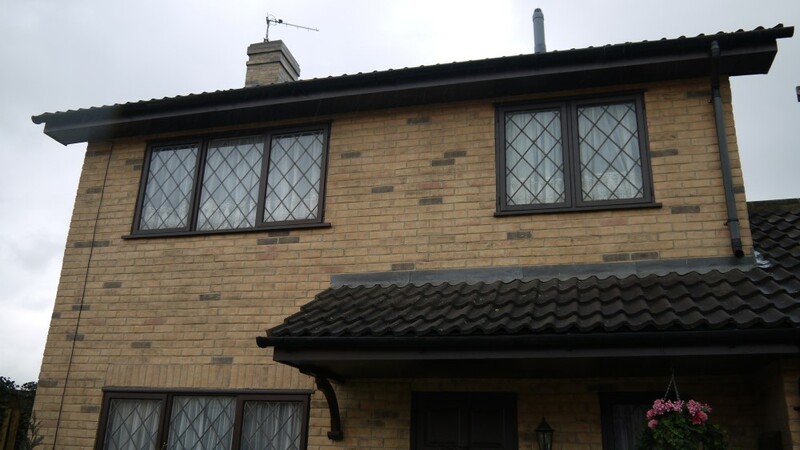 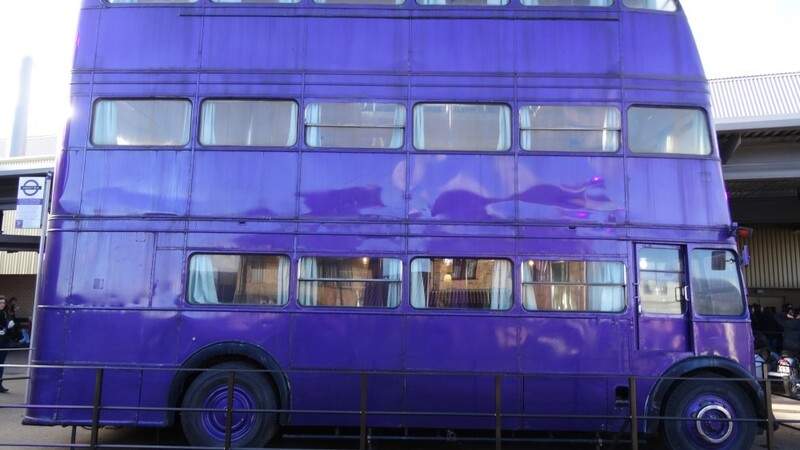 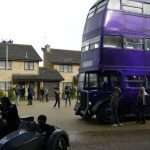 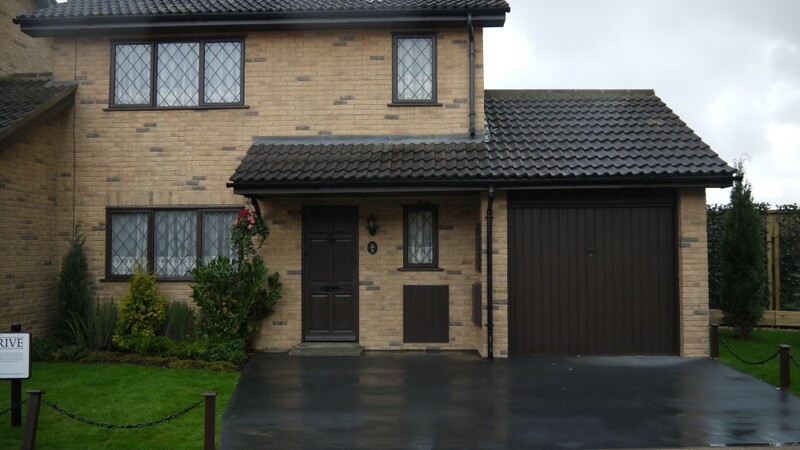 Exterior sets such as number four, Privet Drive and the triple-decker purple Knight Bus are showcased in the Studio Tour’s backlot – it’s also one of three places in the world where you can buy Butterbeer! 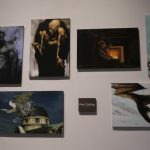 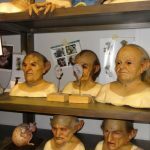 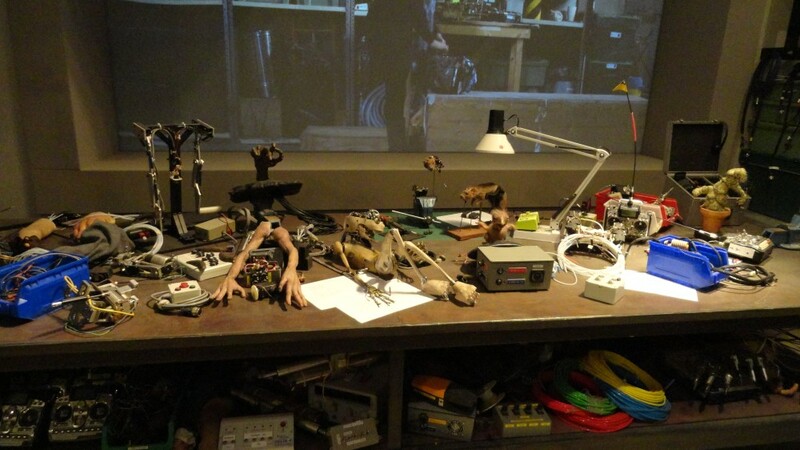 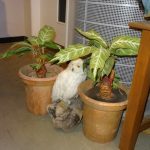 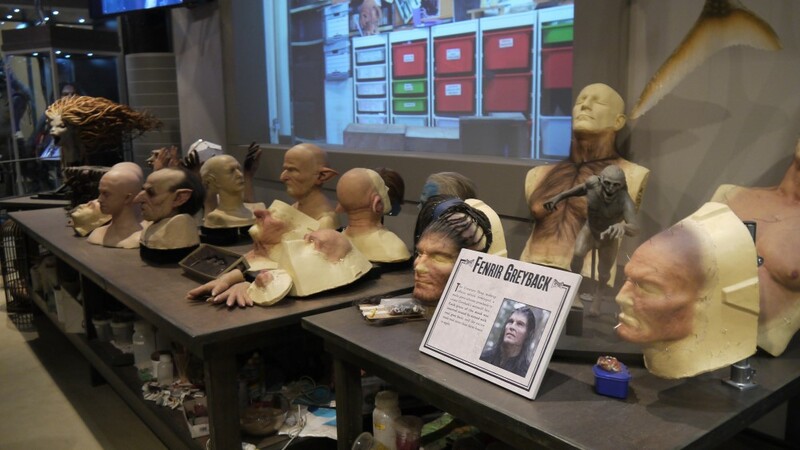 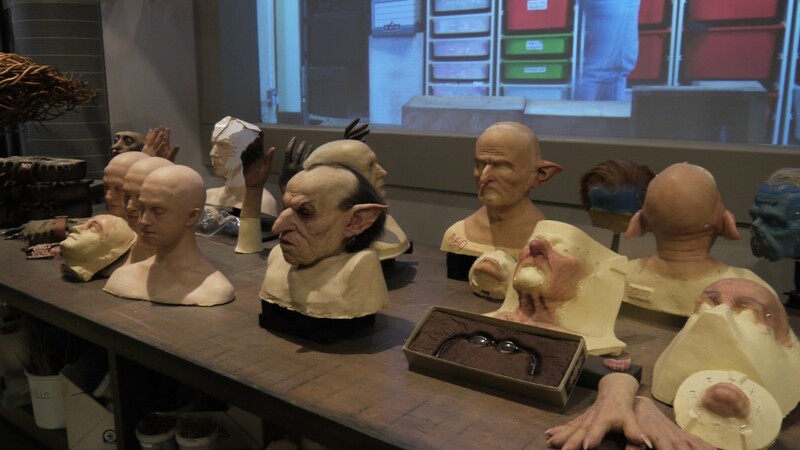 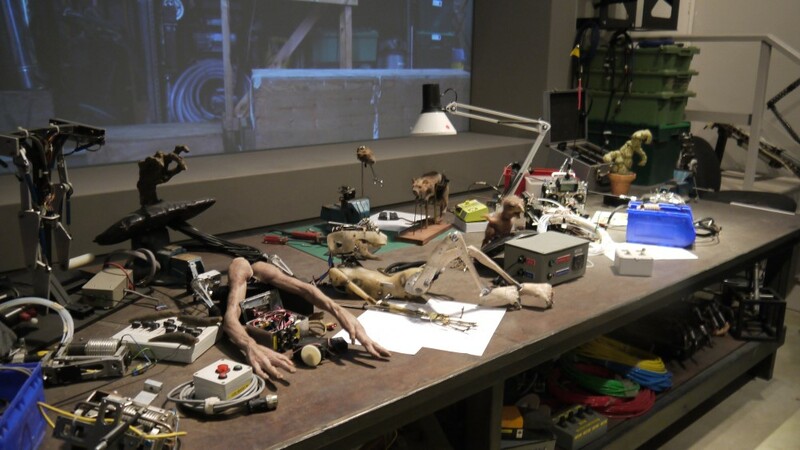 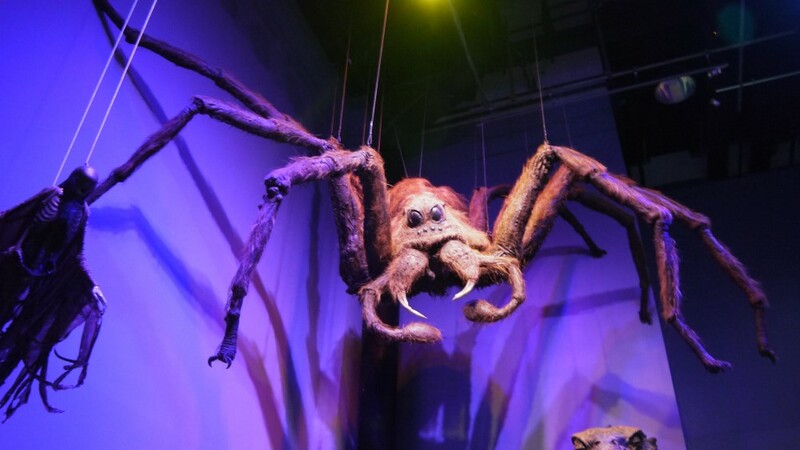 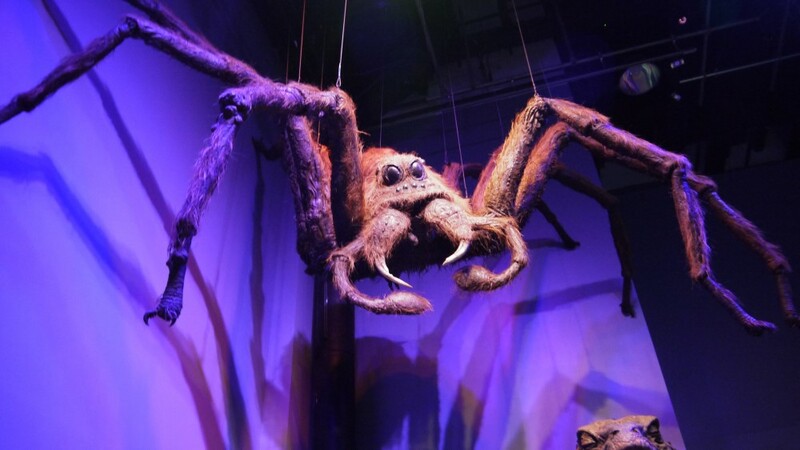 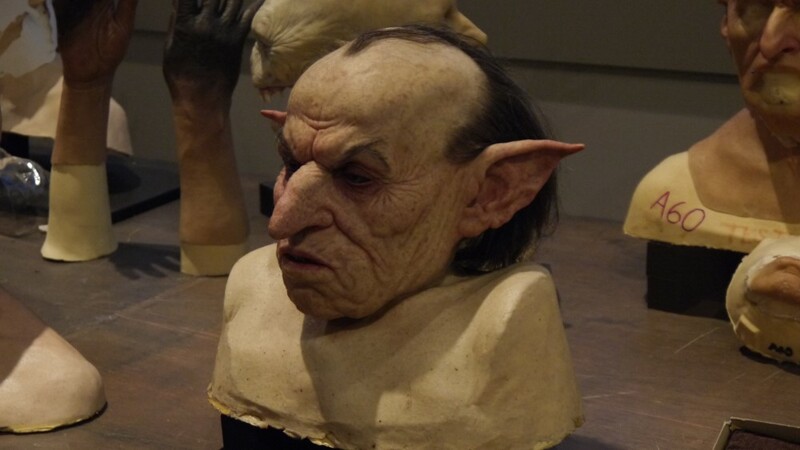 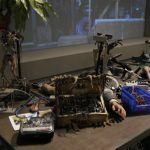 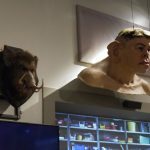 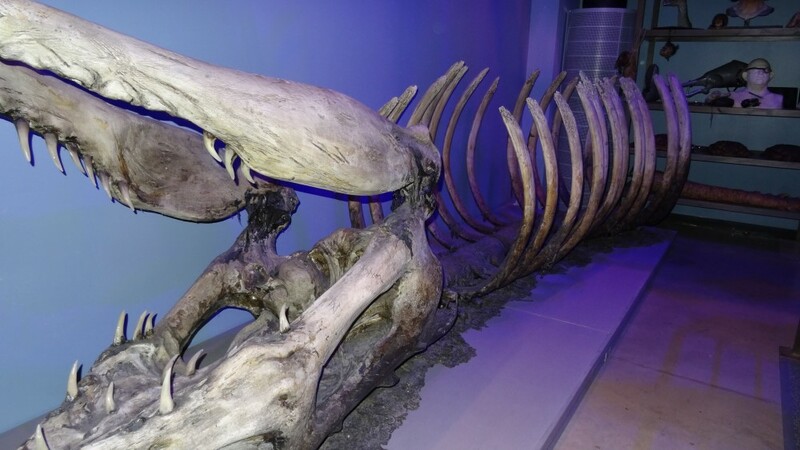 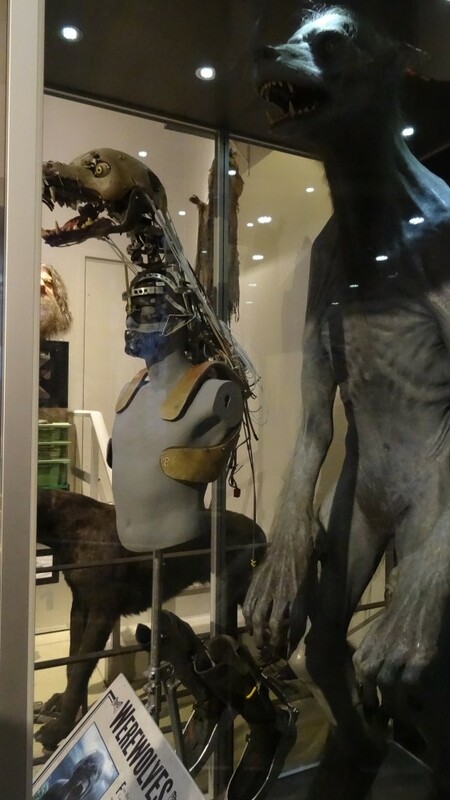 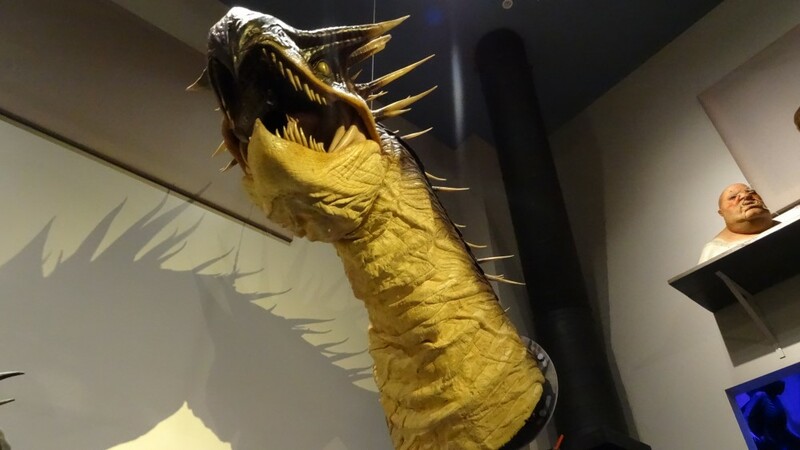 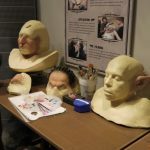 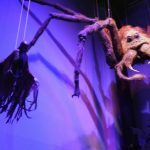 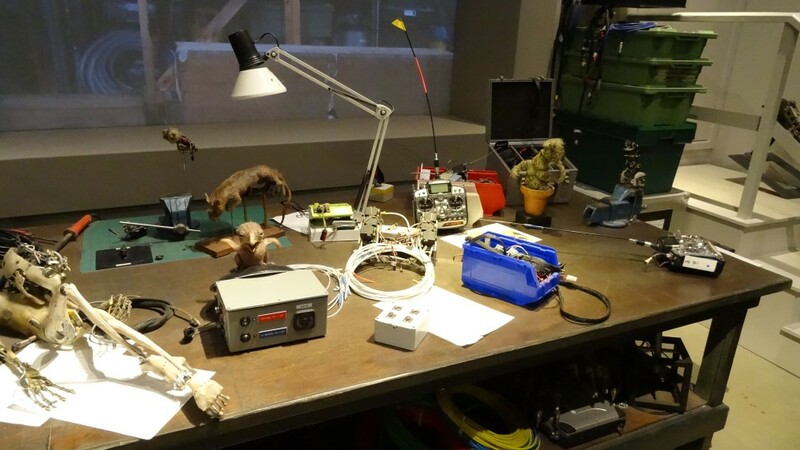 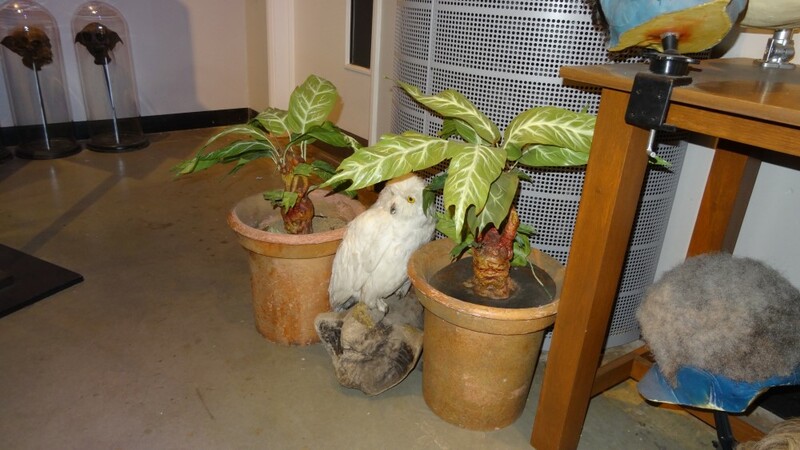 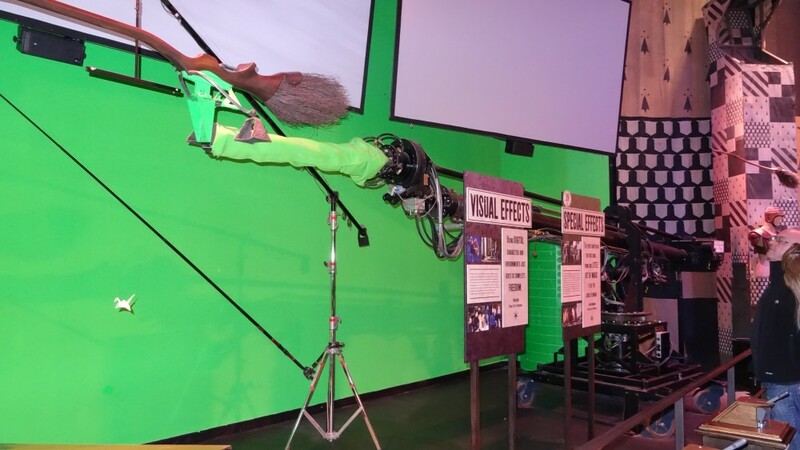 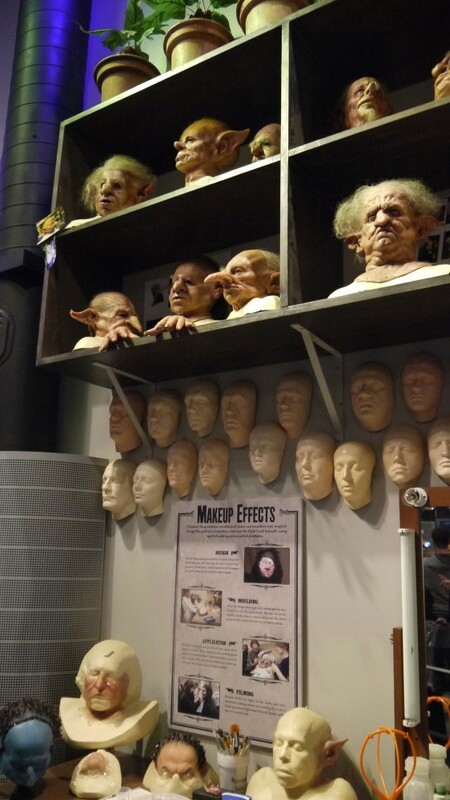 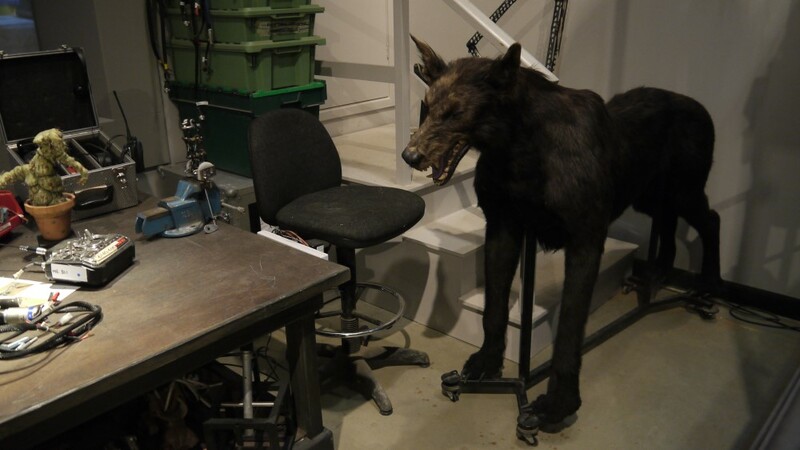 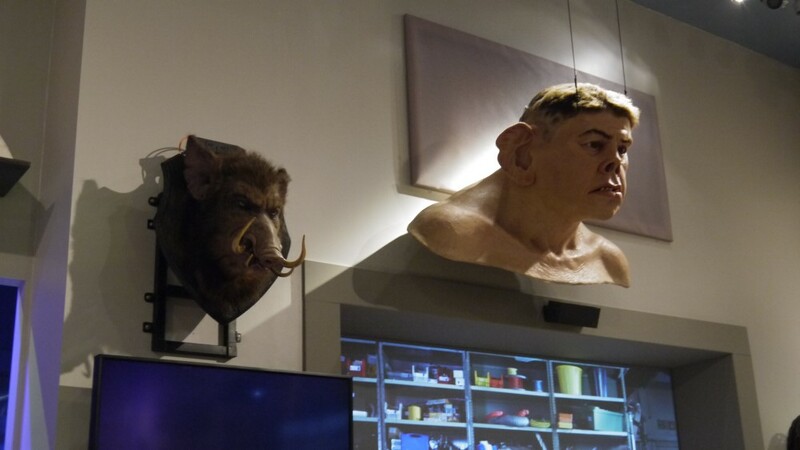 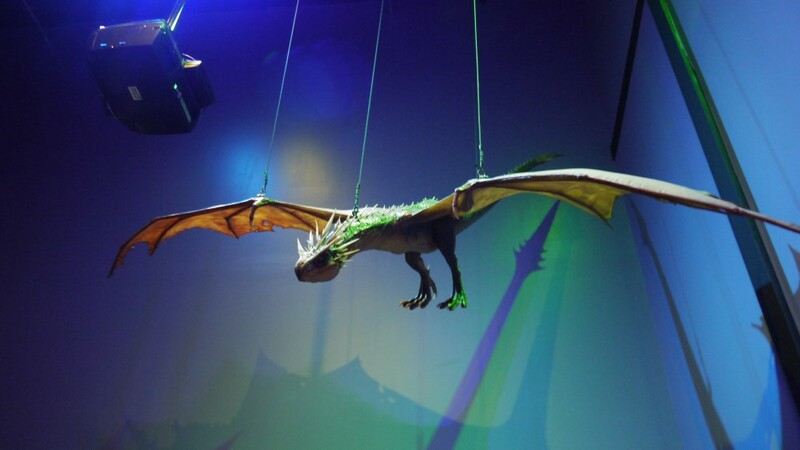 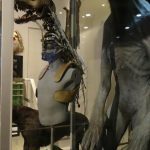 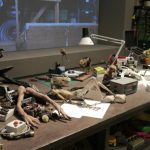 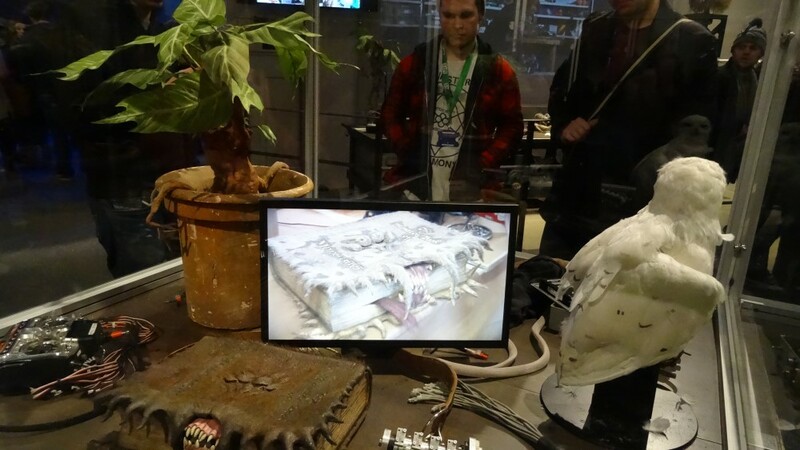 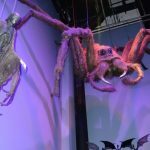 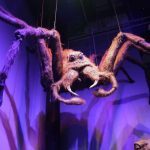 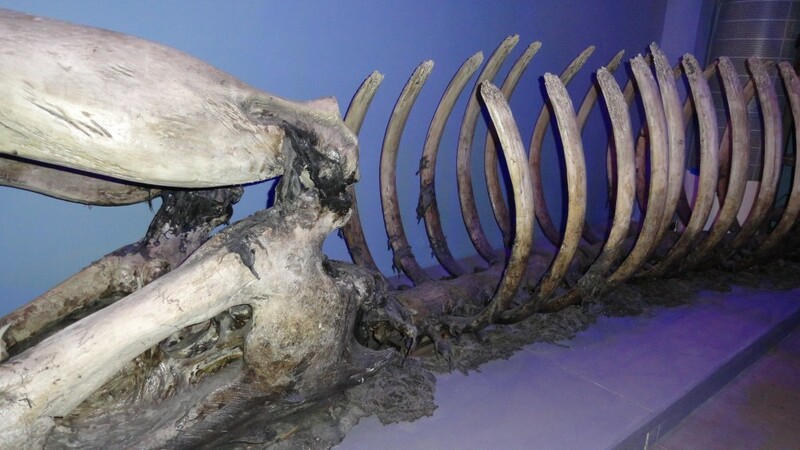 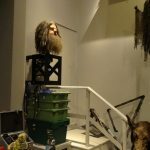 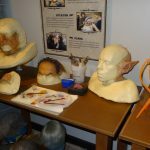 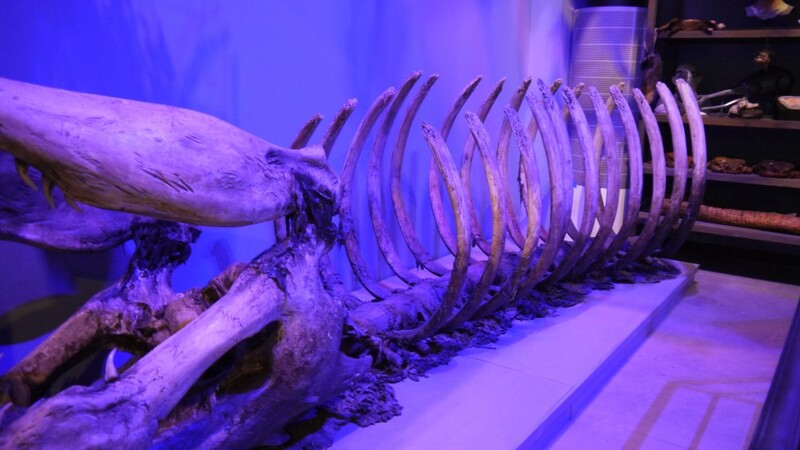 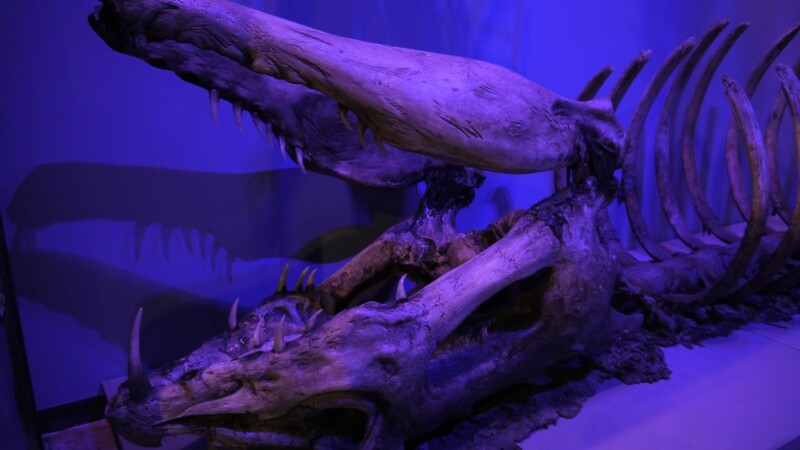 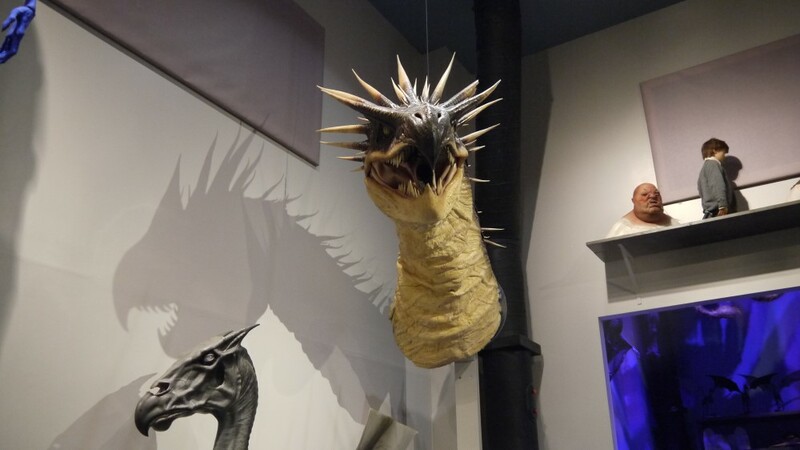 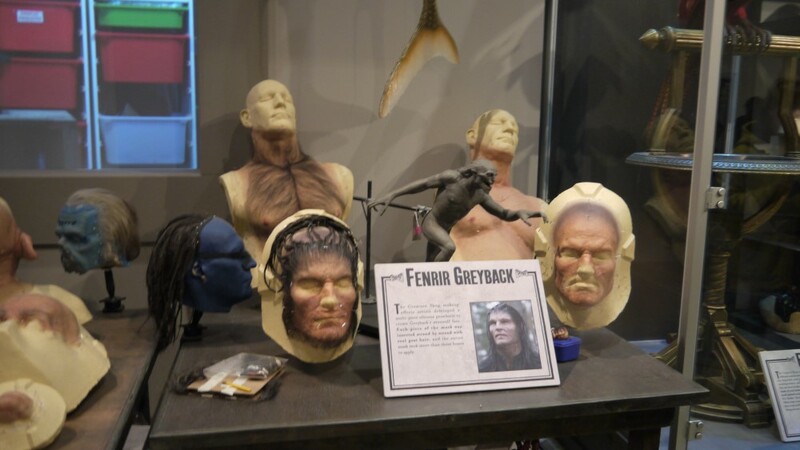 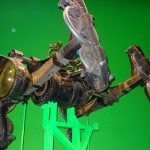 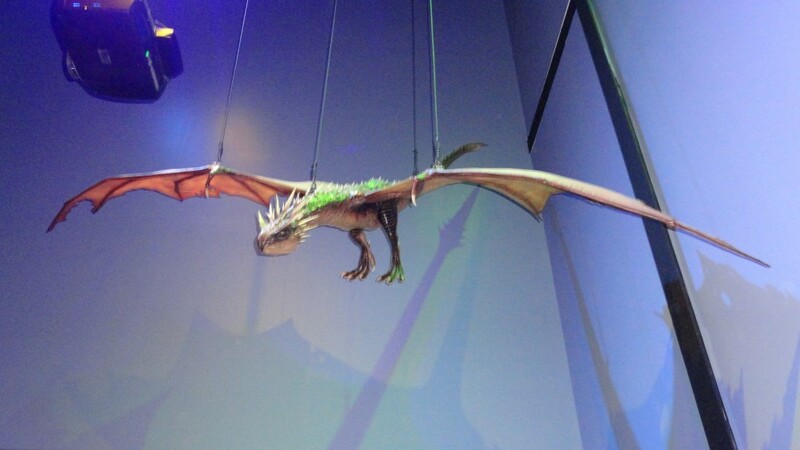 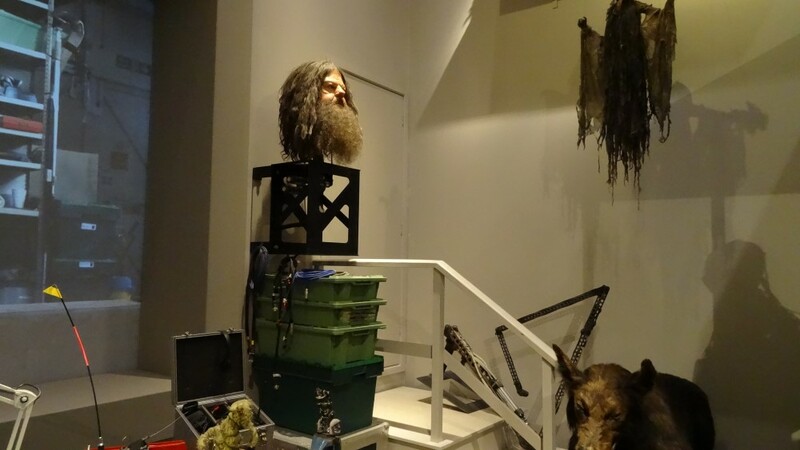 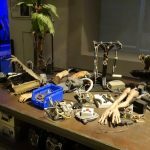 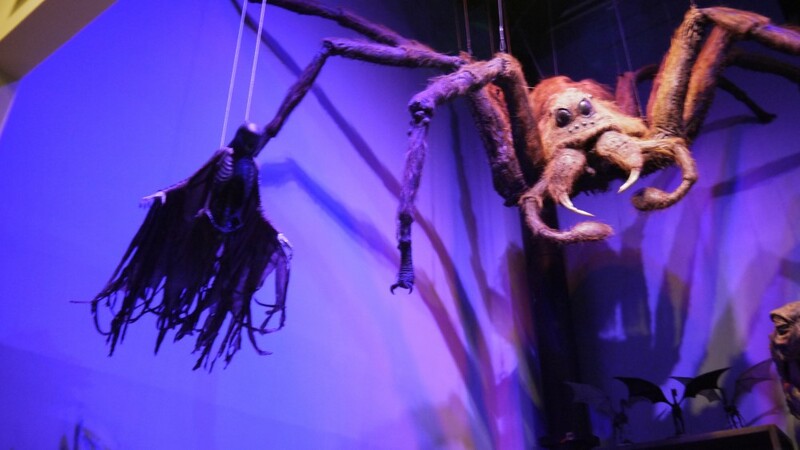 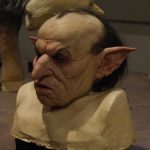 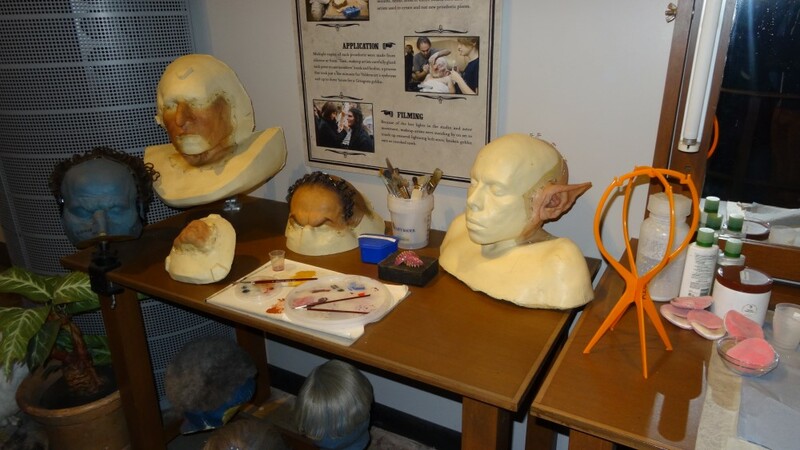 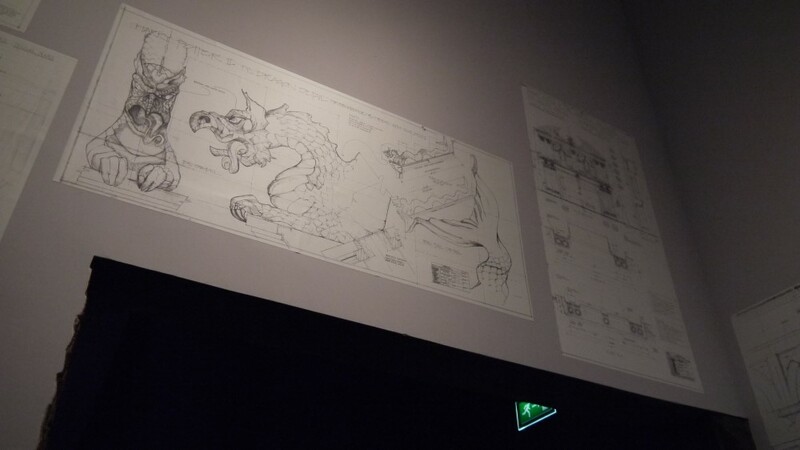 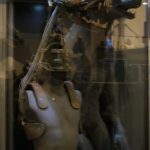 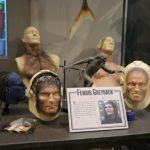 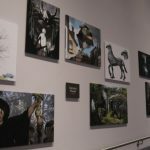 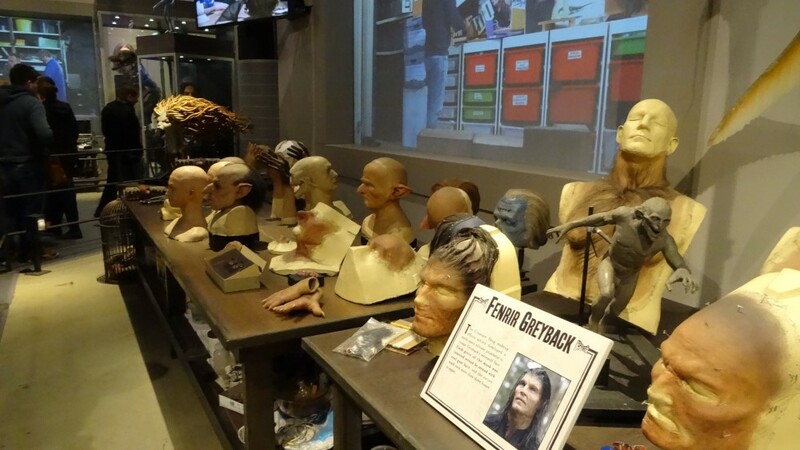 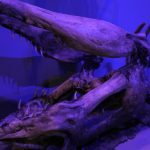 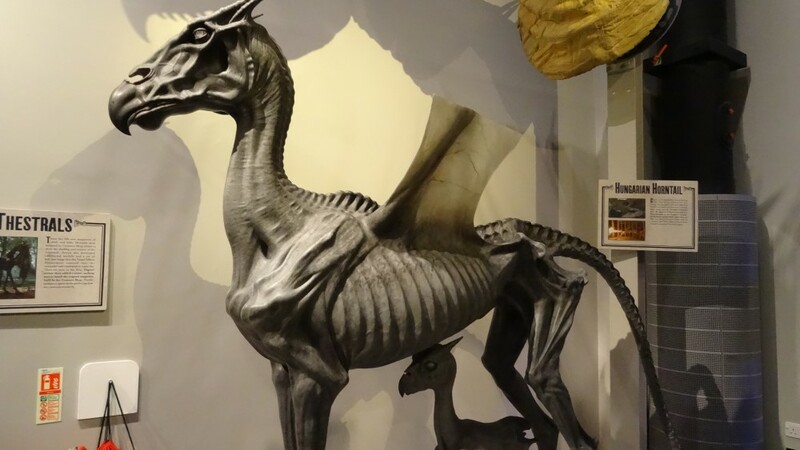 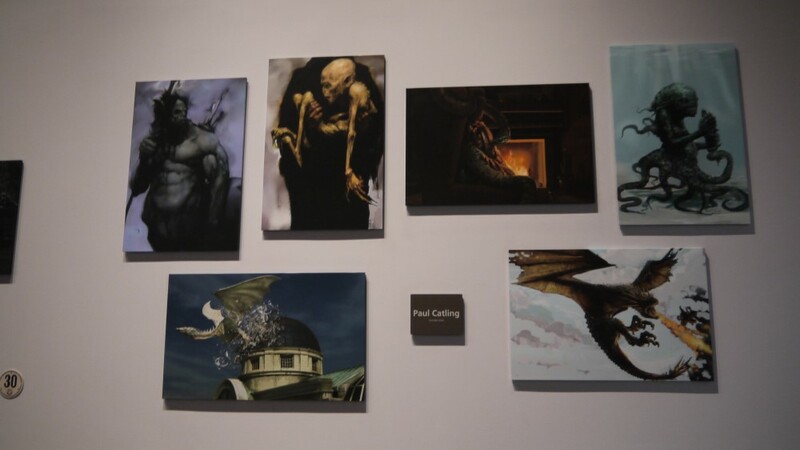 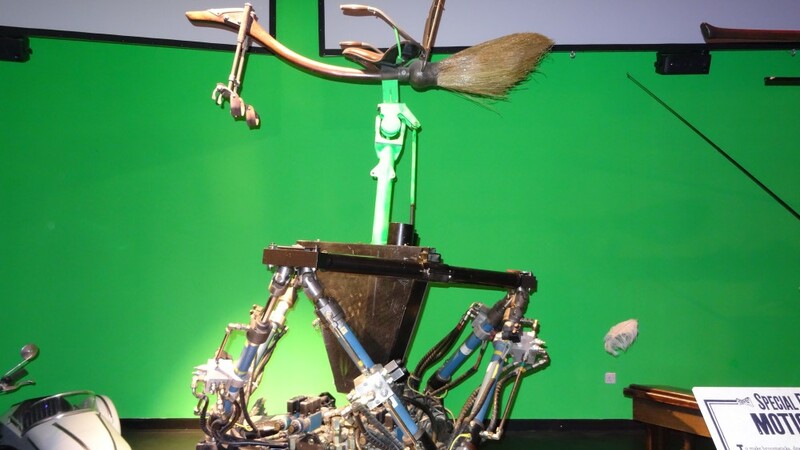 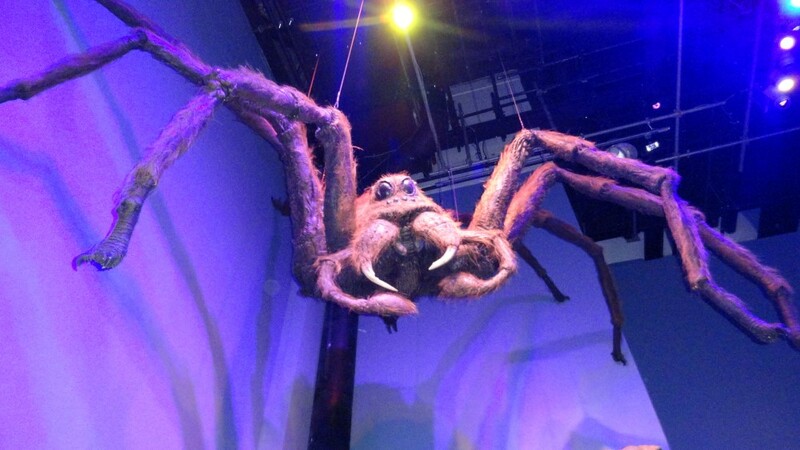 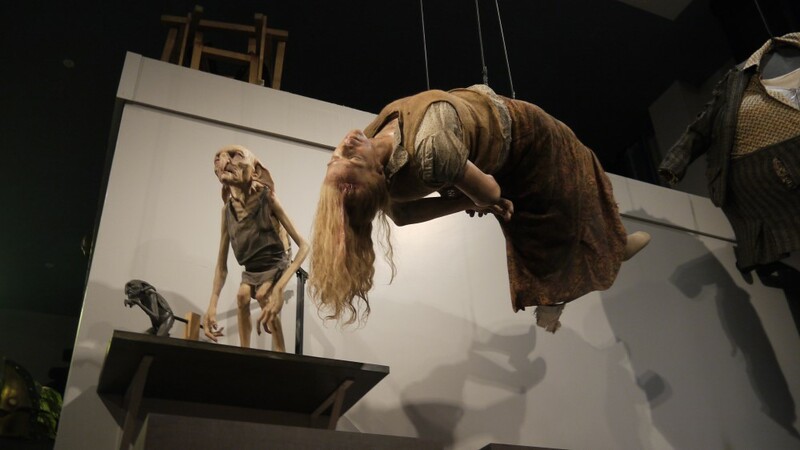 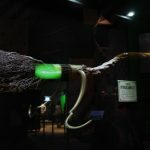 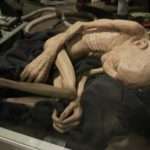 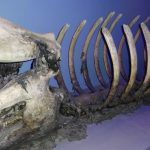 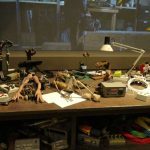 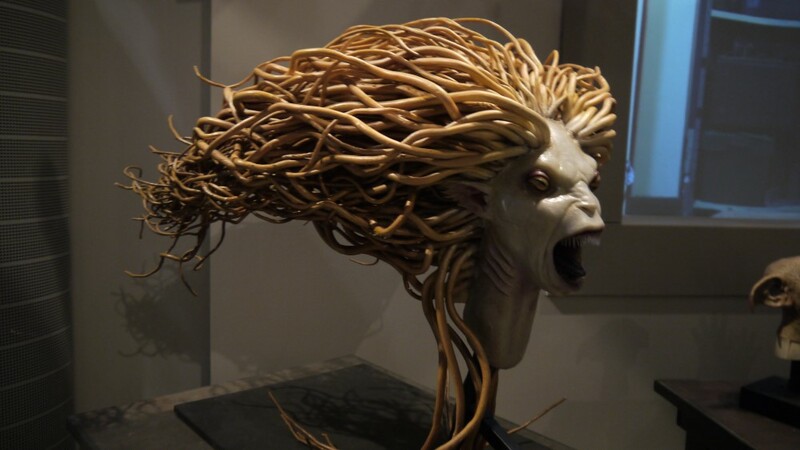 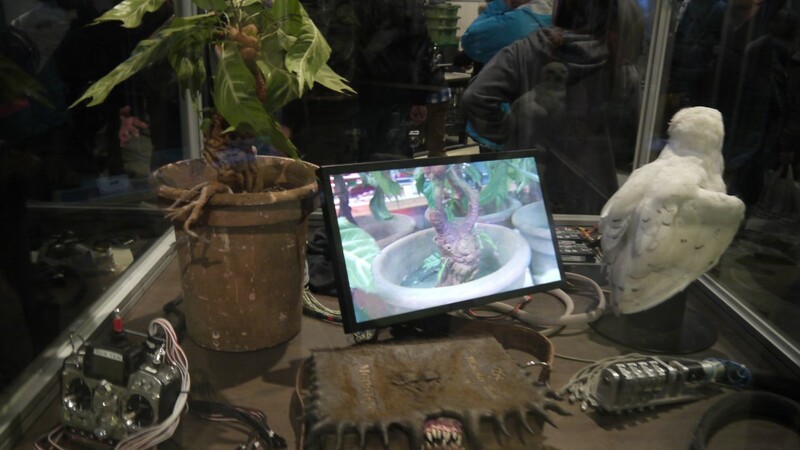 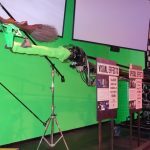 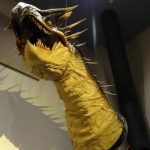 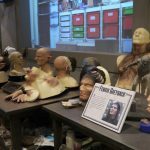 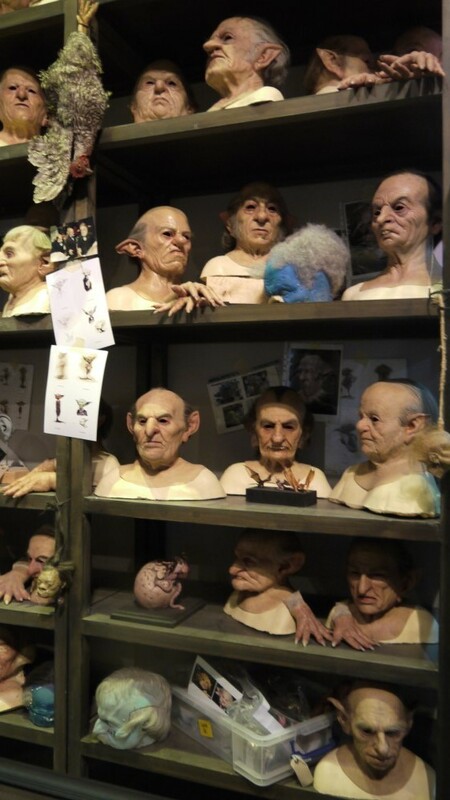 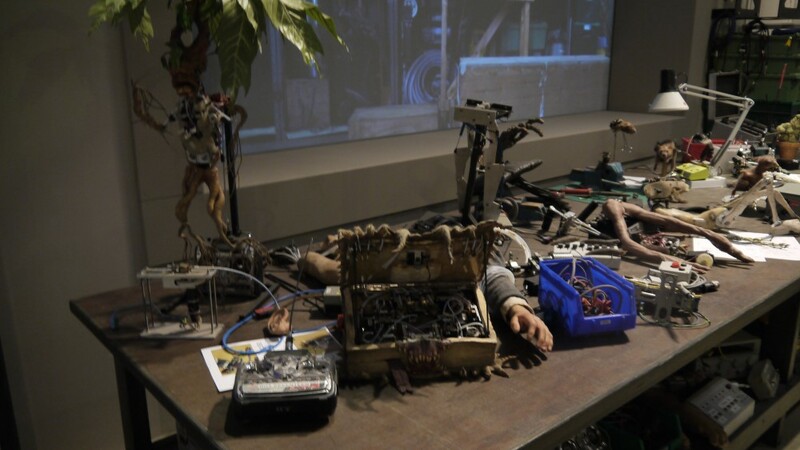 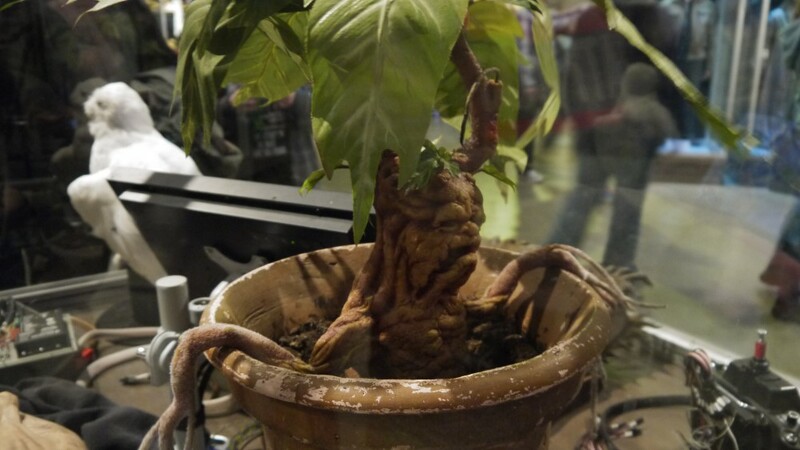 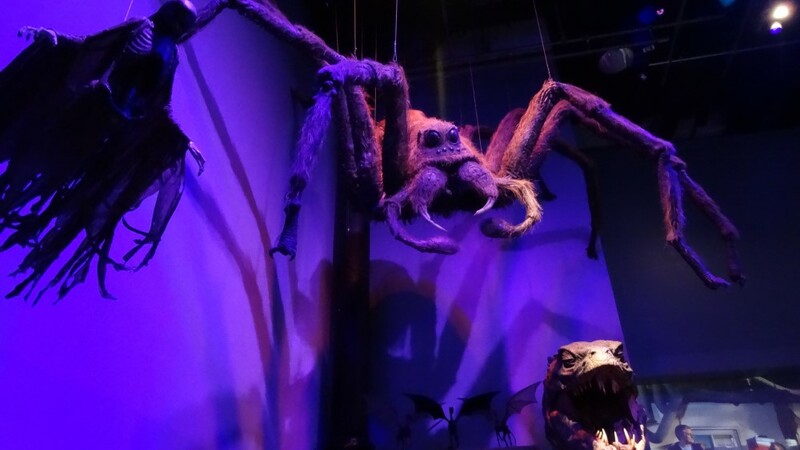 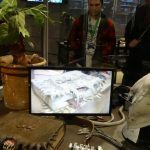 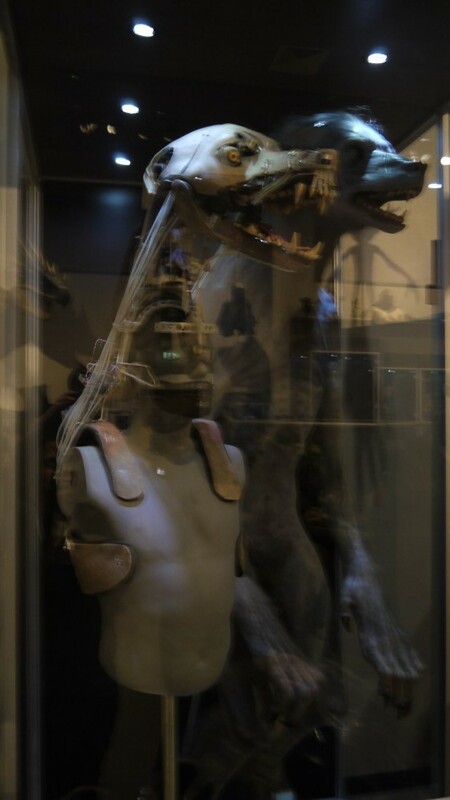 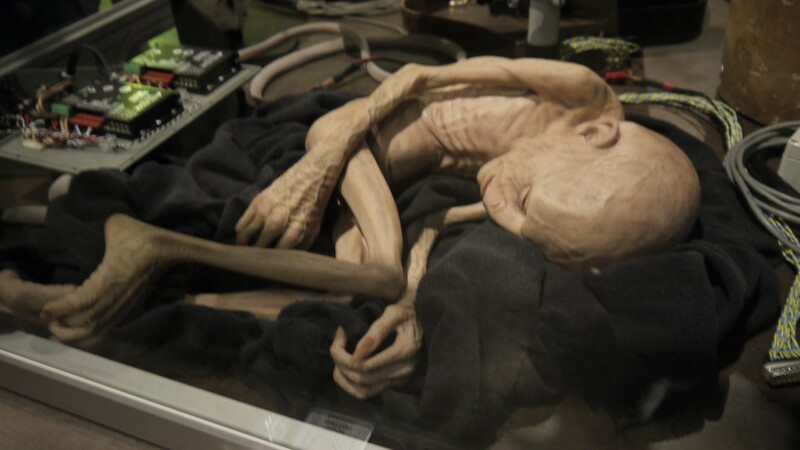 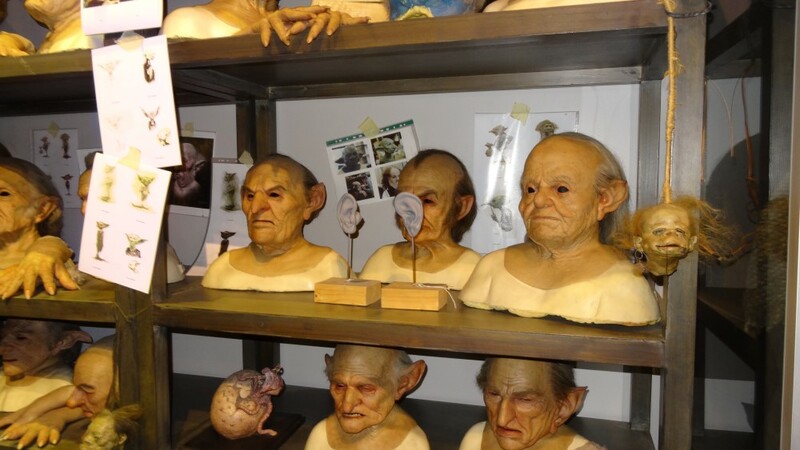 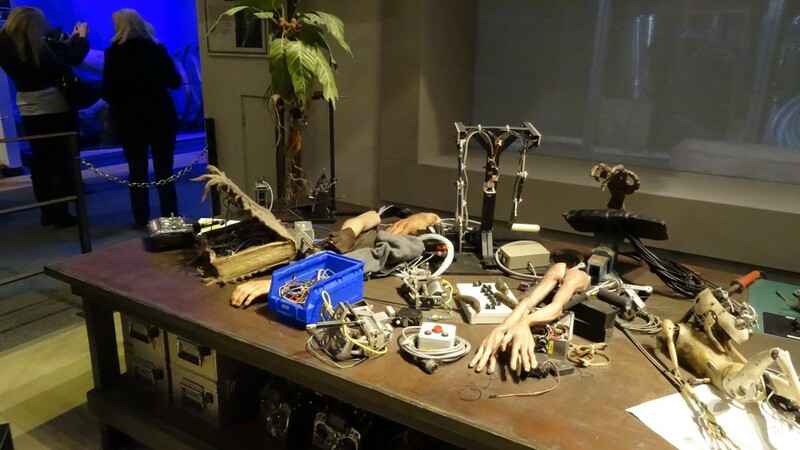 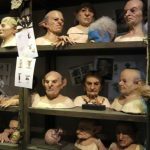 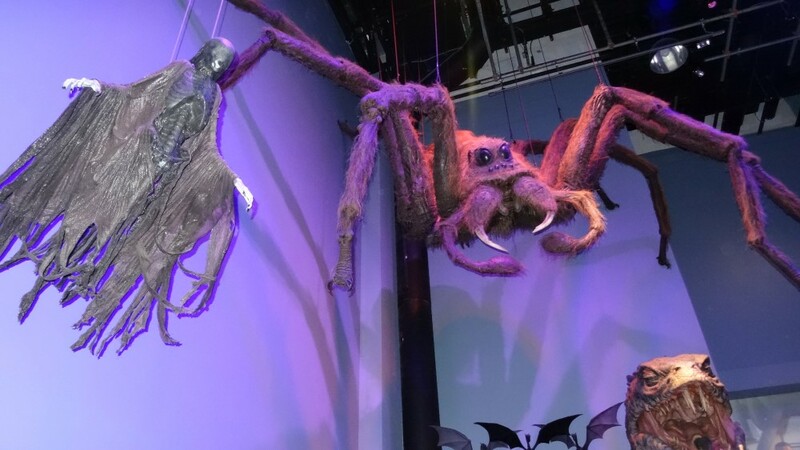 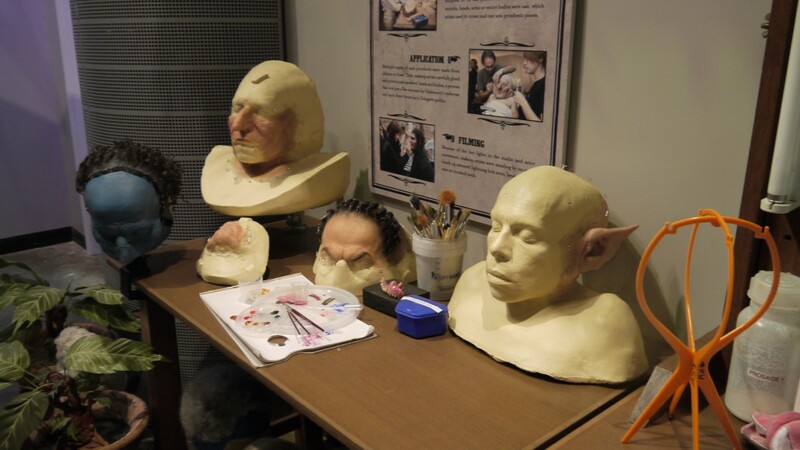 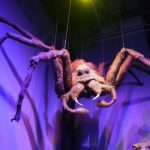 The Creature Effects Department created more than 200 mythical creatures over ten years of filming, including a host of goblins, a number of house-elves and an 18-foot animatronic spider. 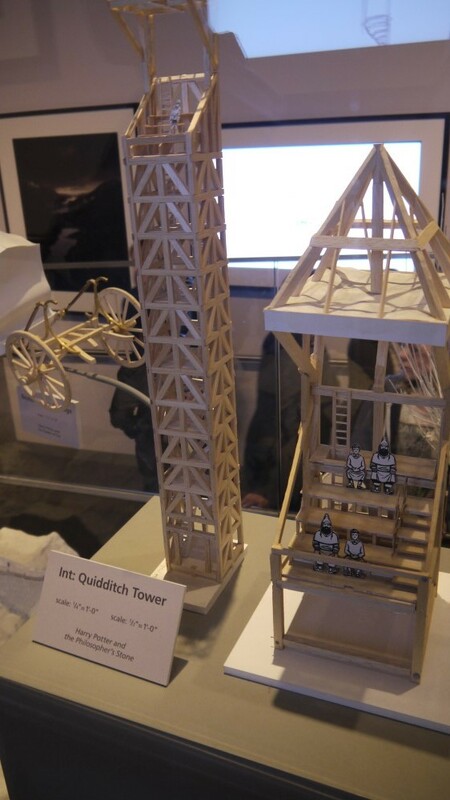 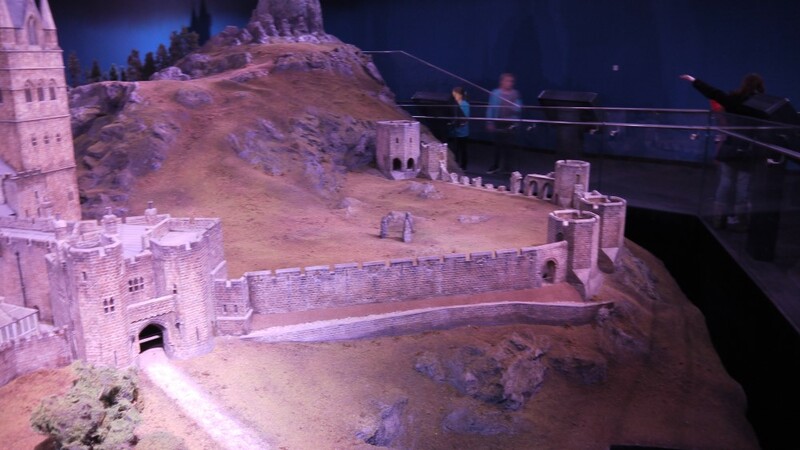 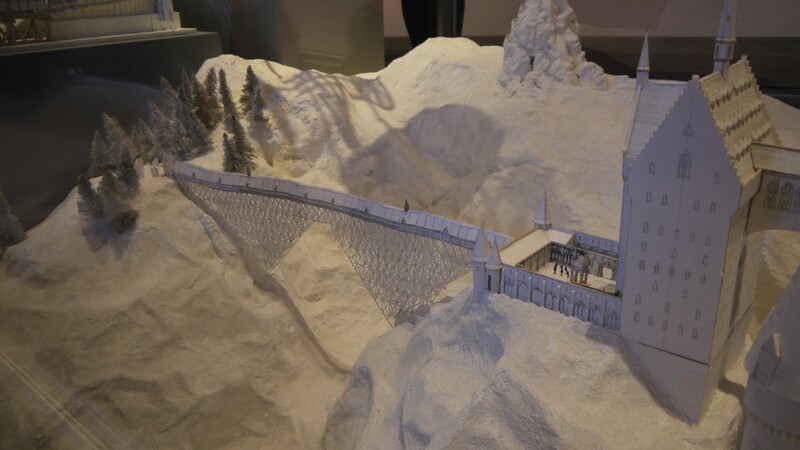 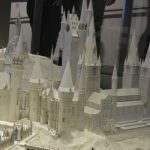 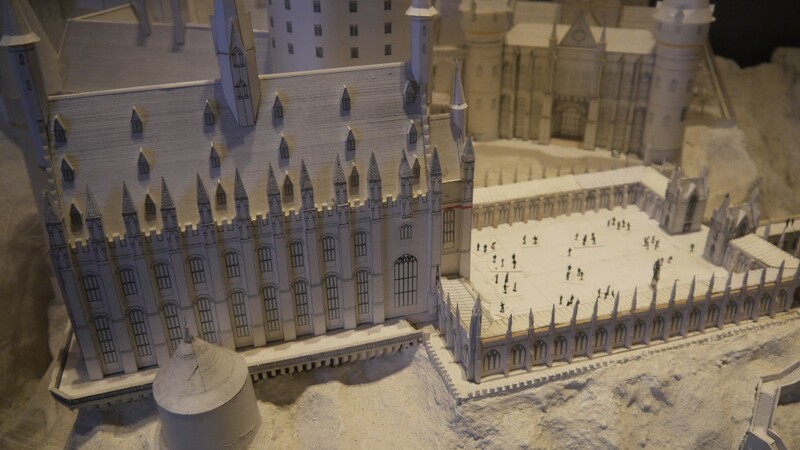 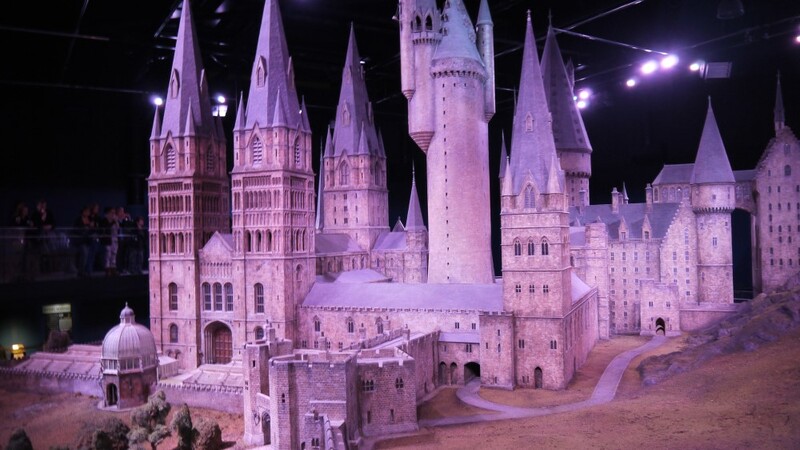 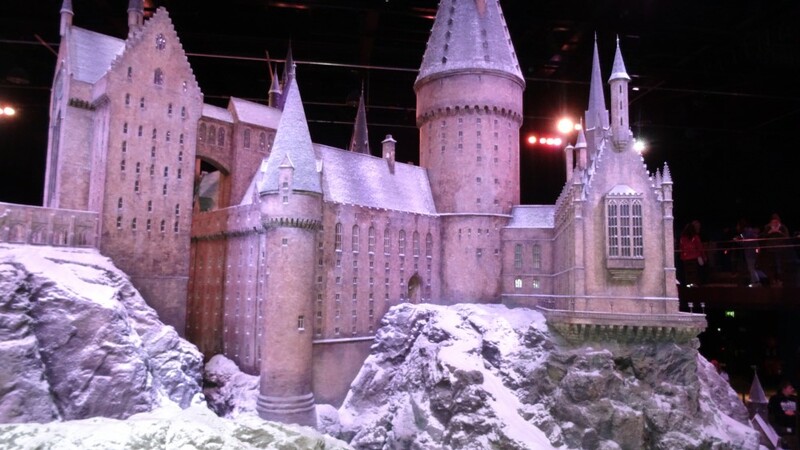 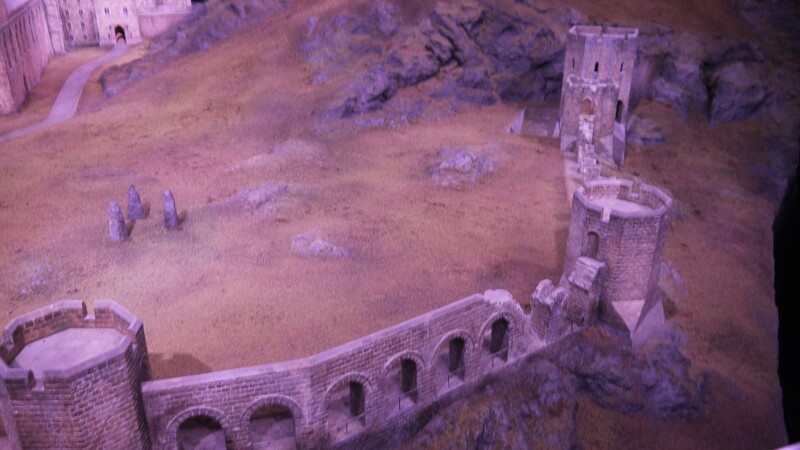 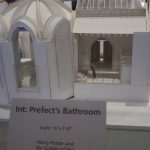 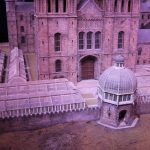 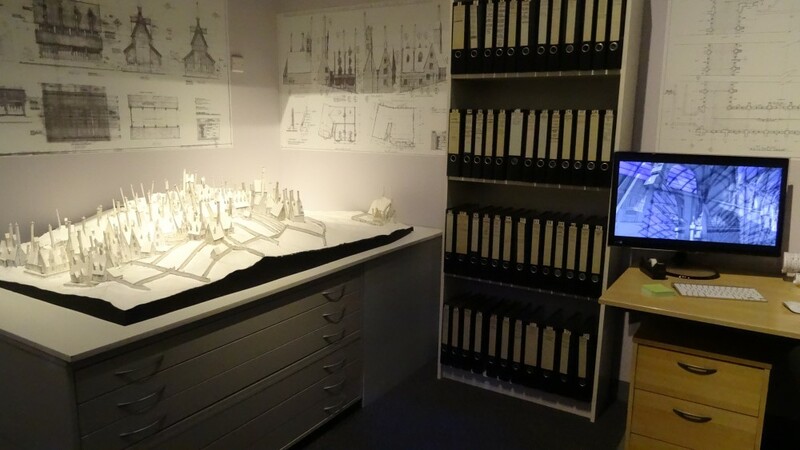 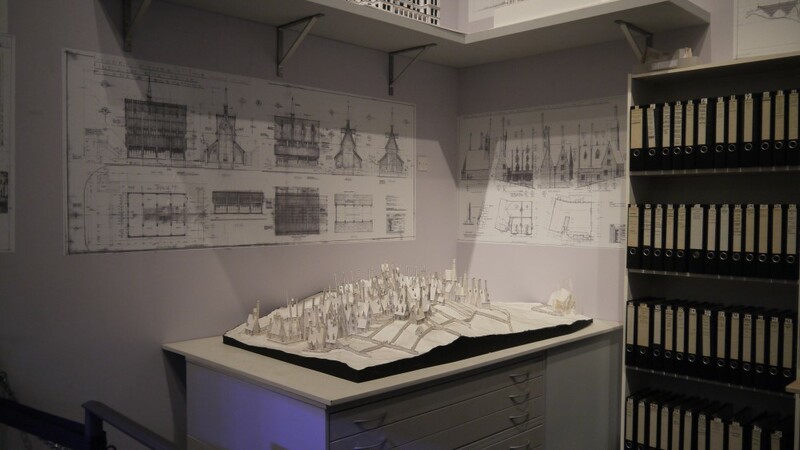 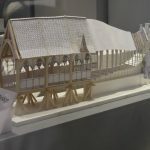 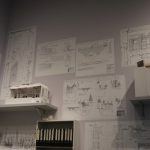 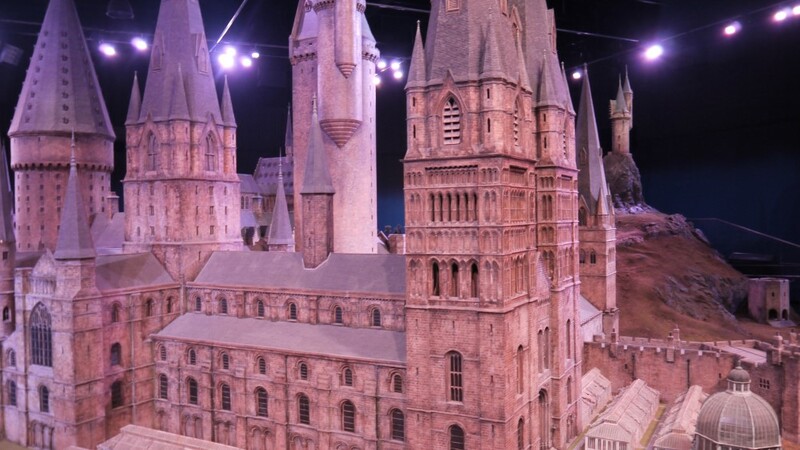 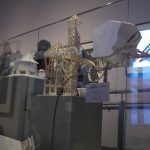 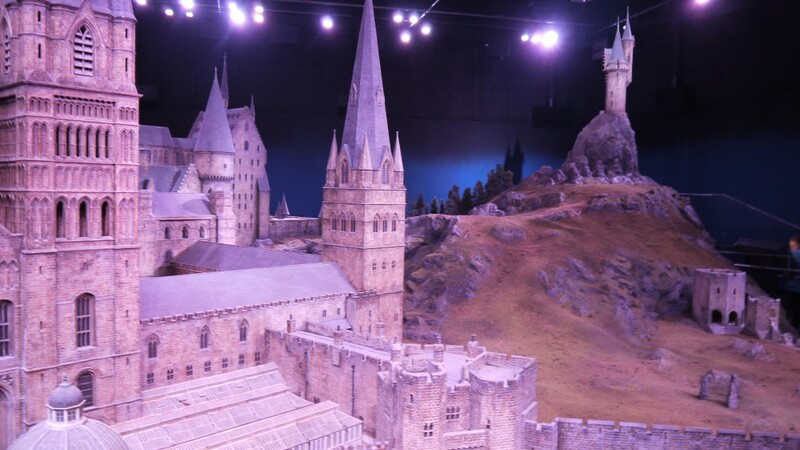 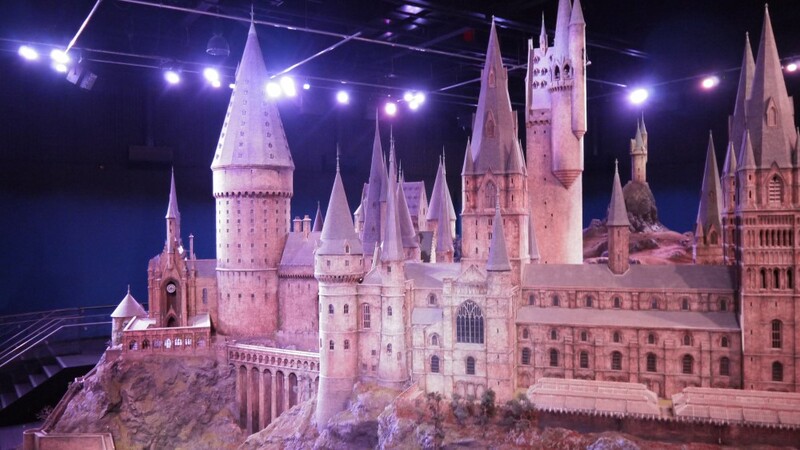 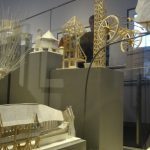 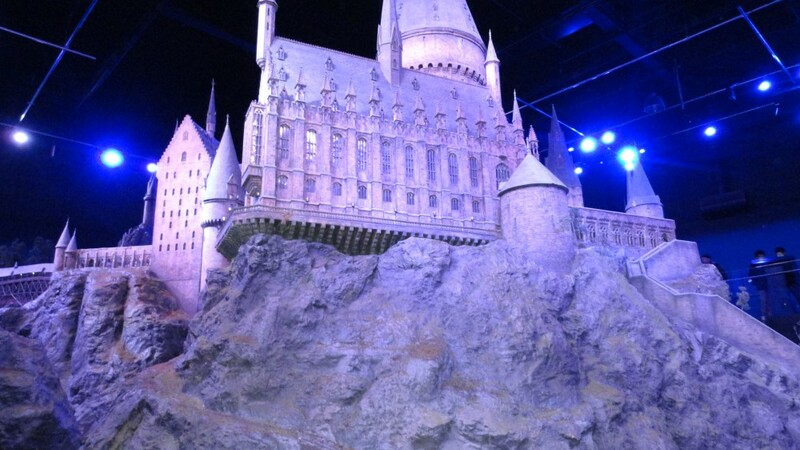 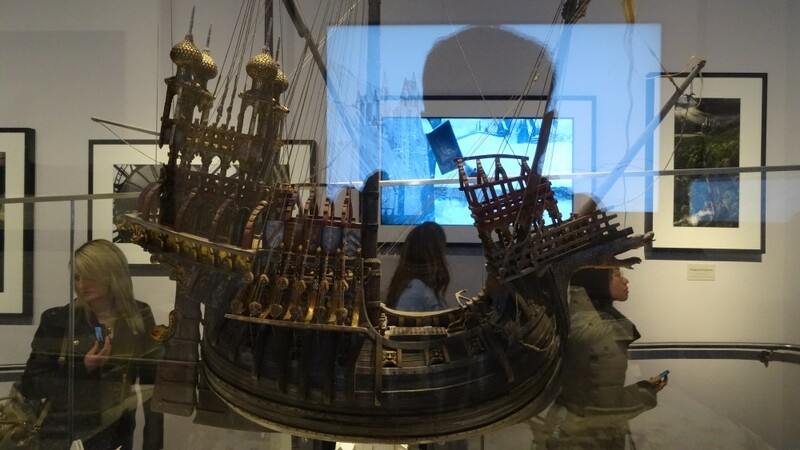 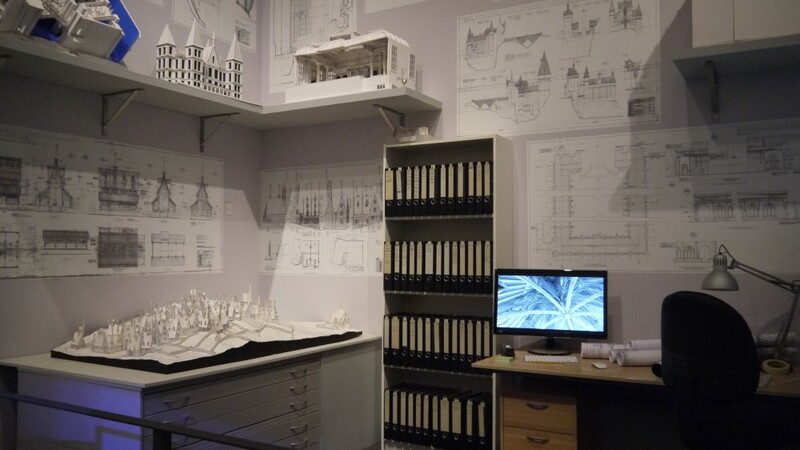 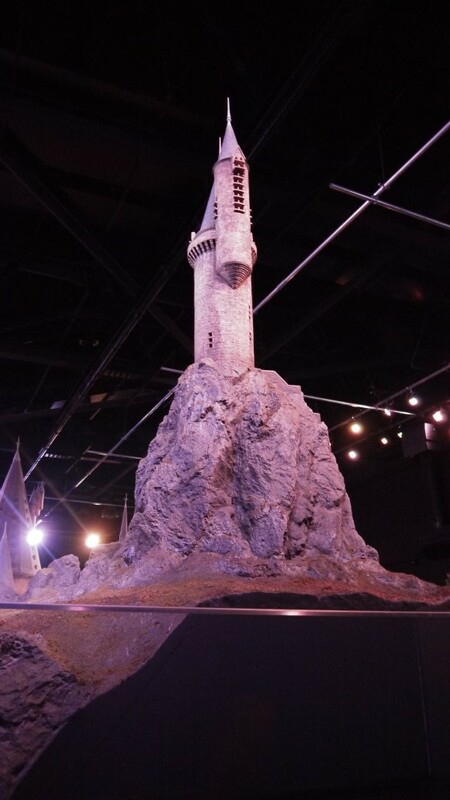 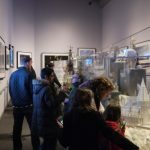 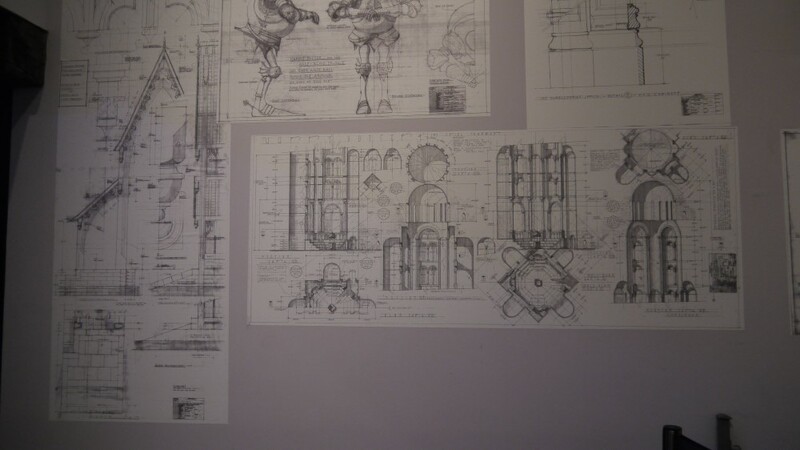 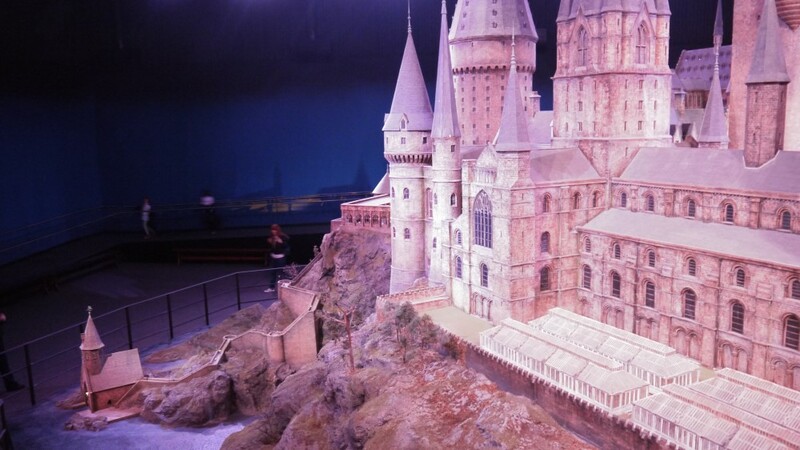 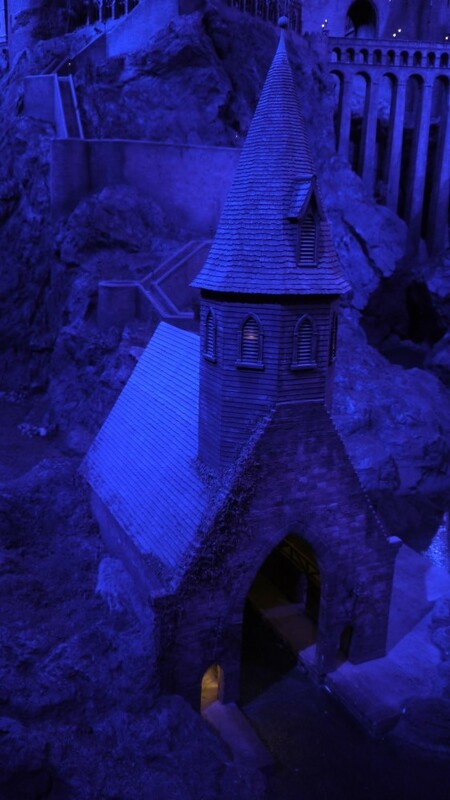 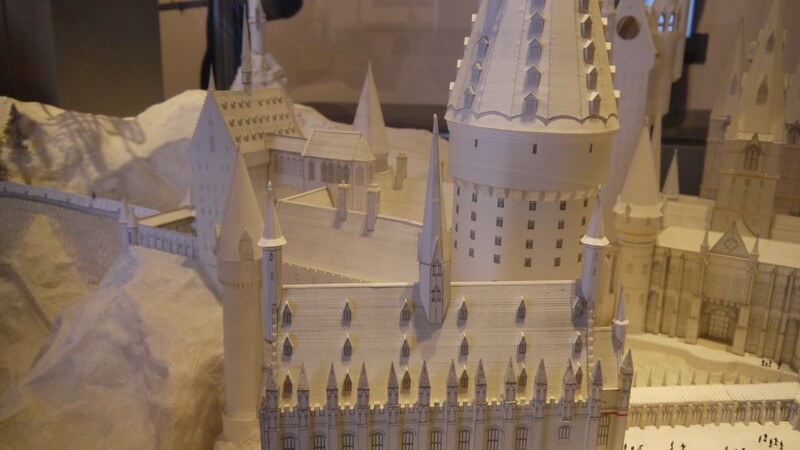 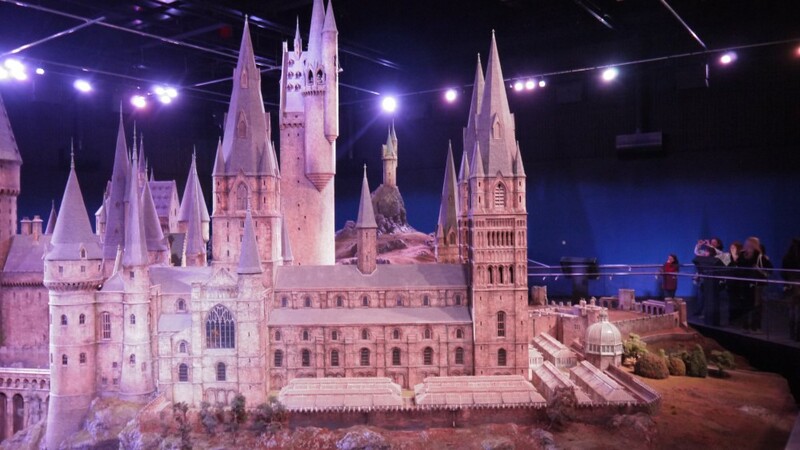 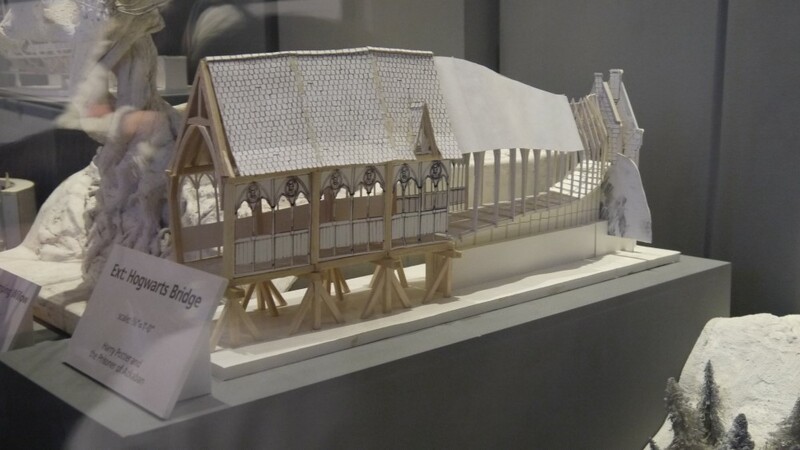 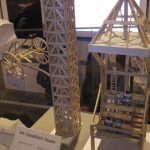 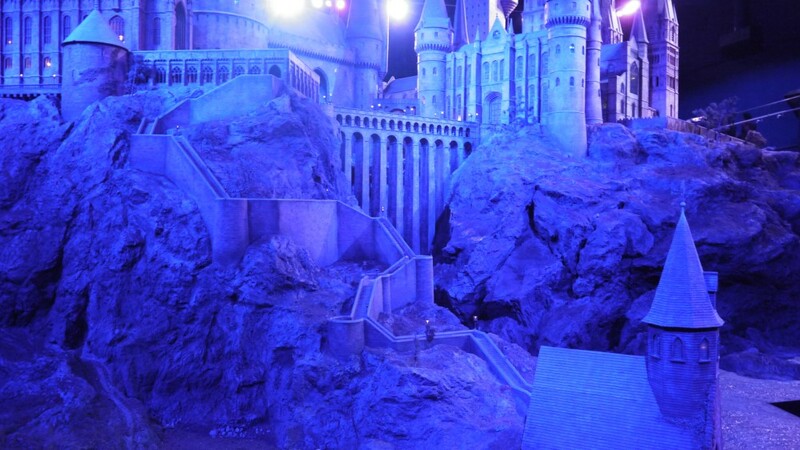 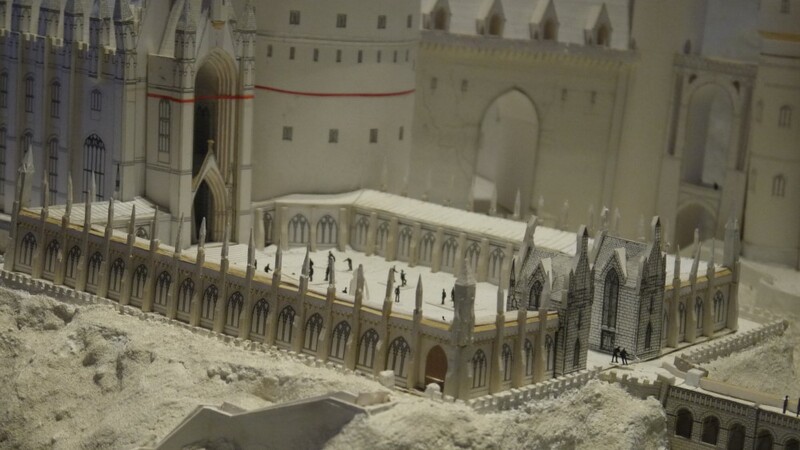 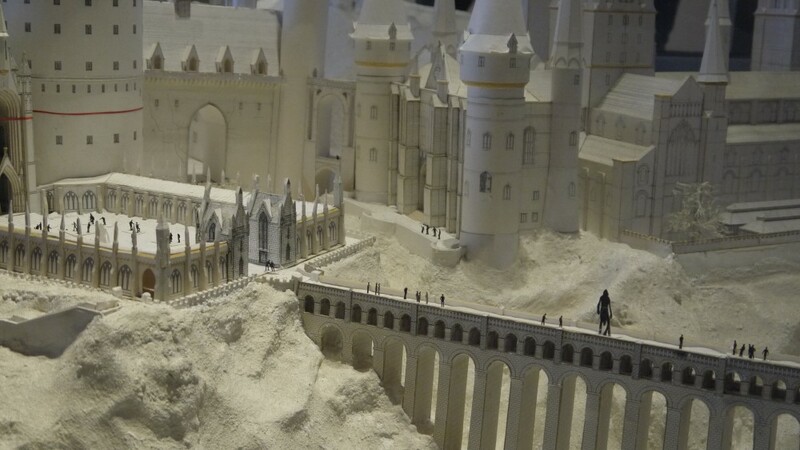 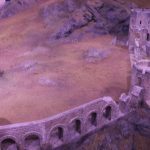 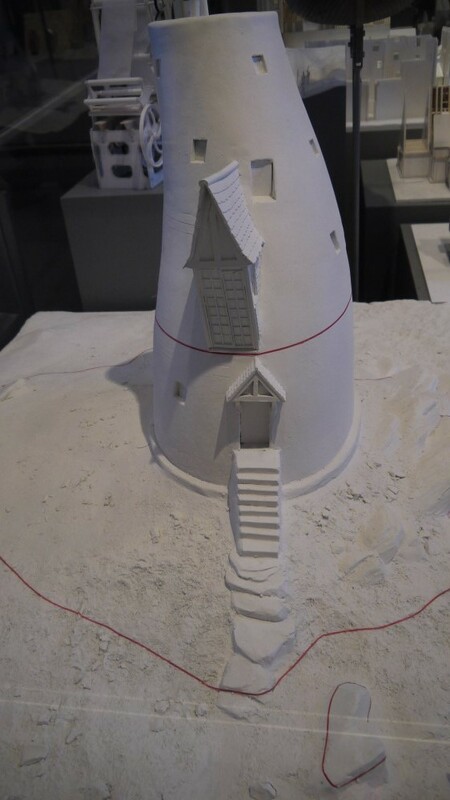 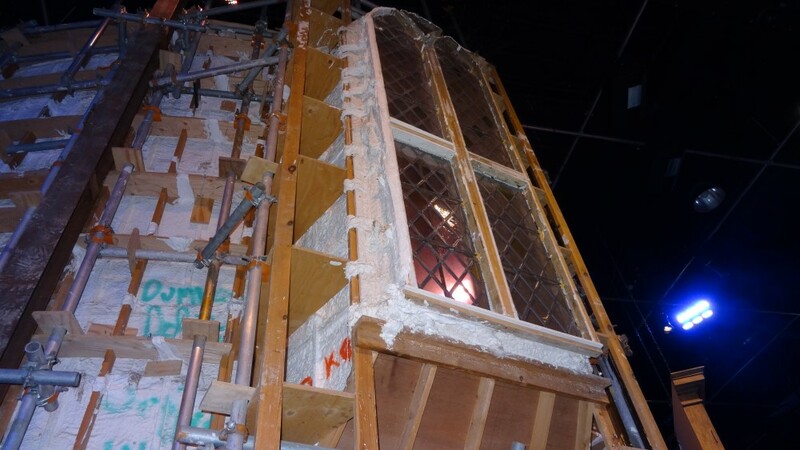 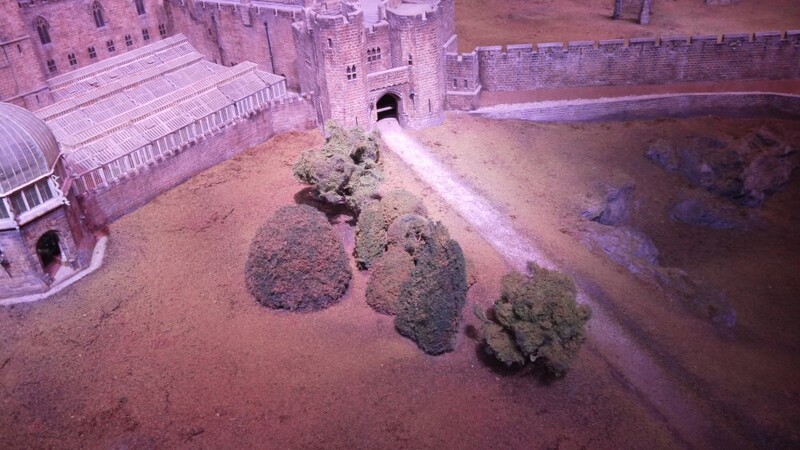 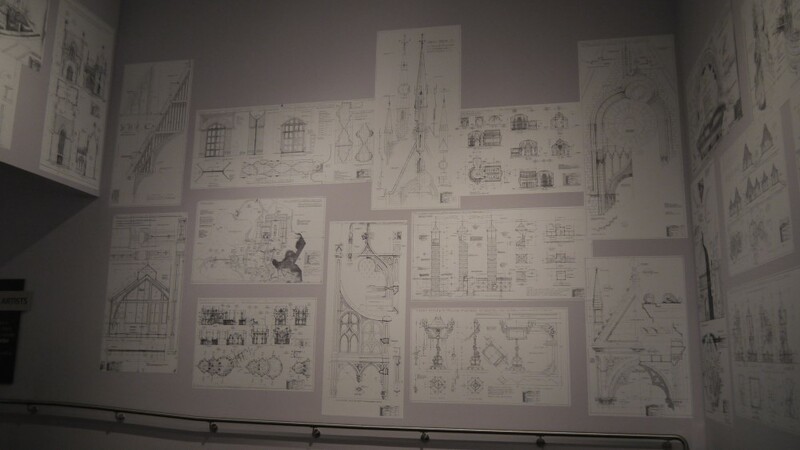 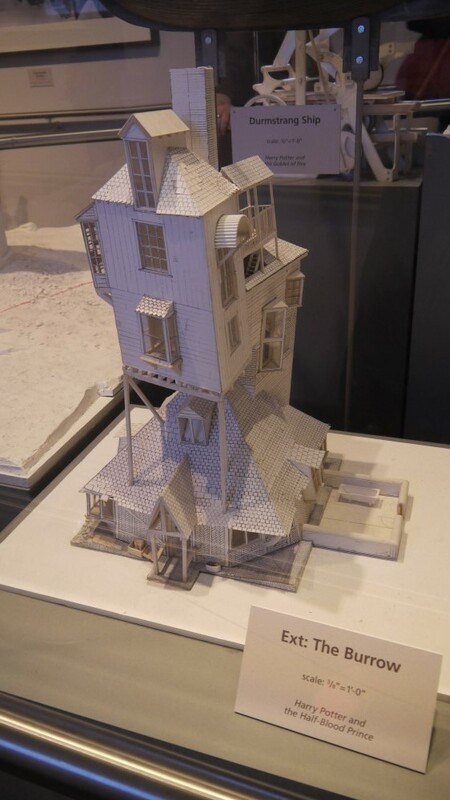 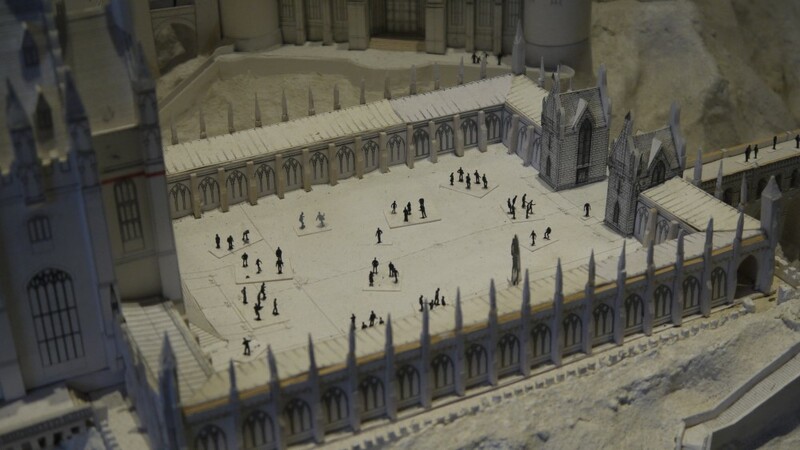 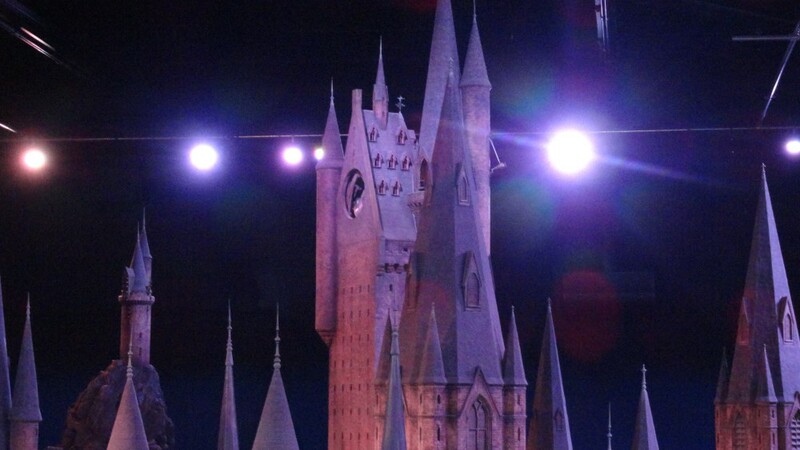 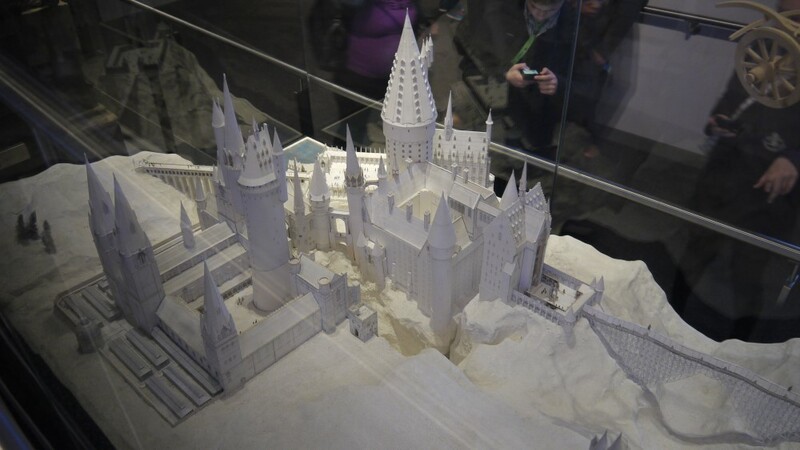 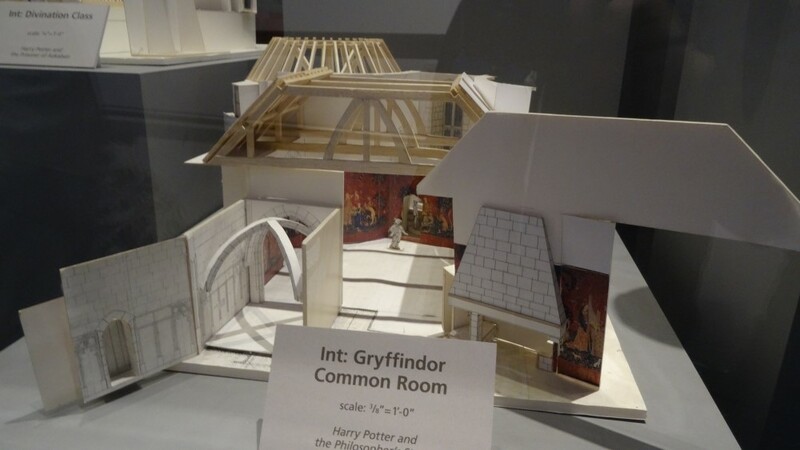 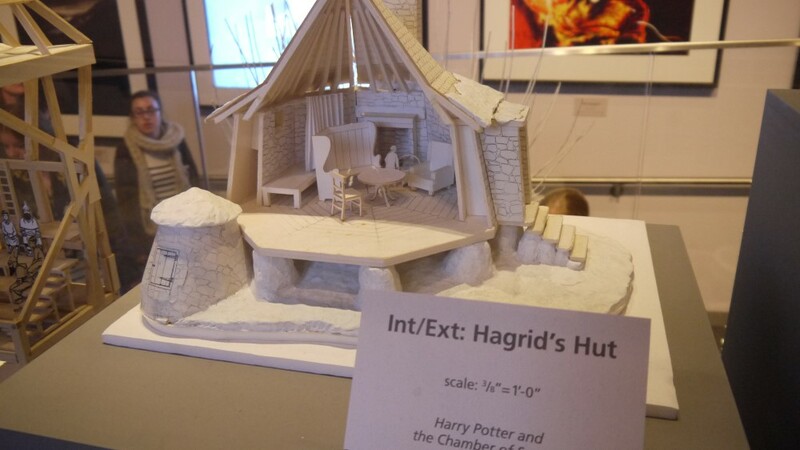 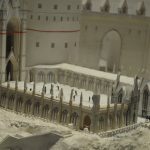 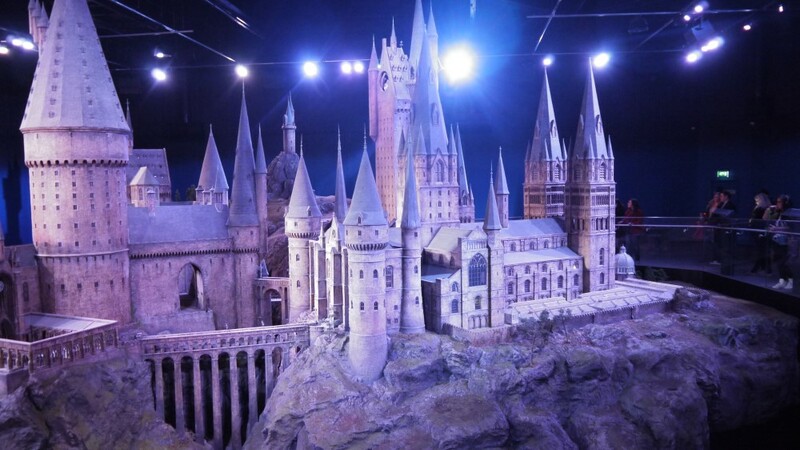 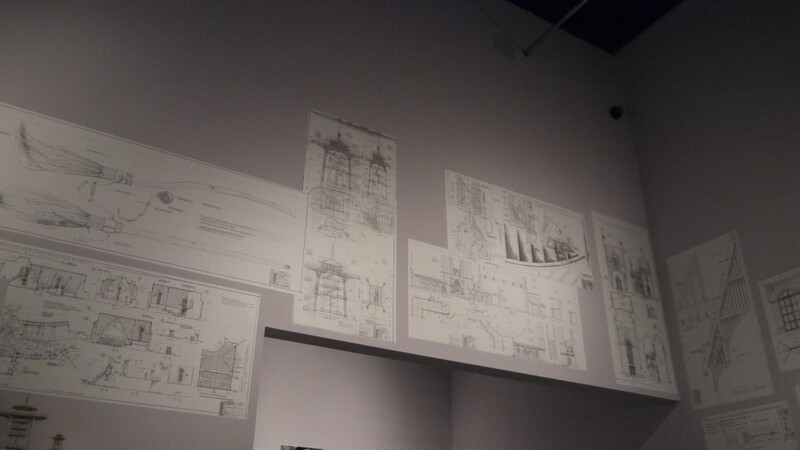 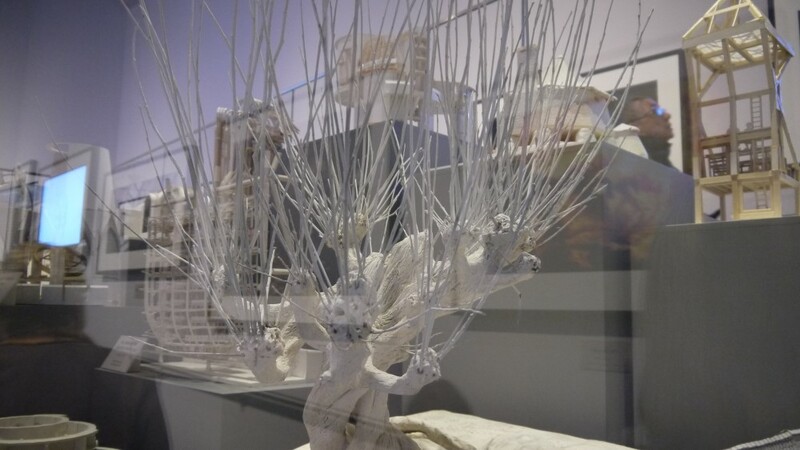 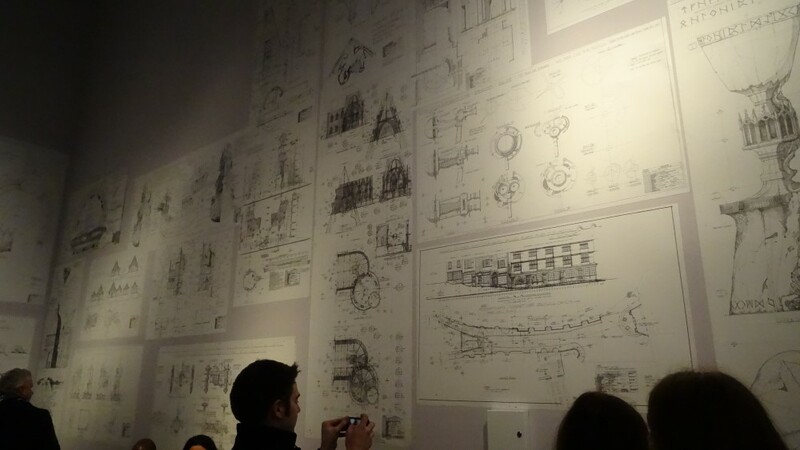 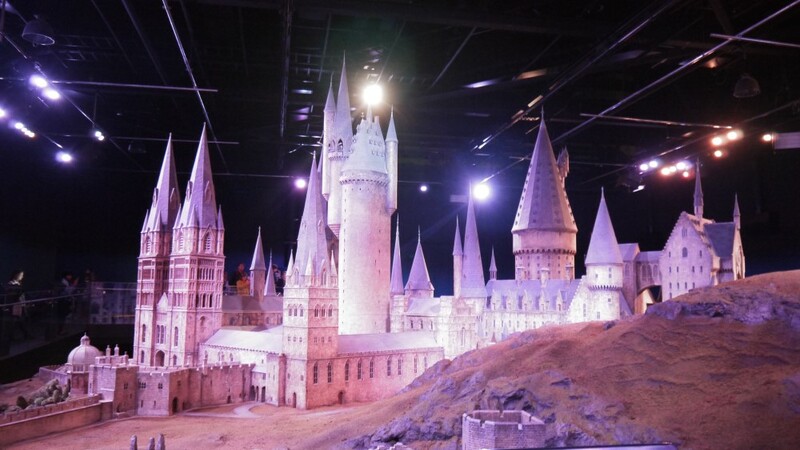 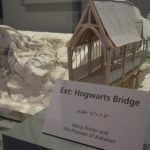 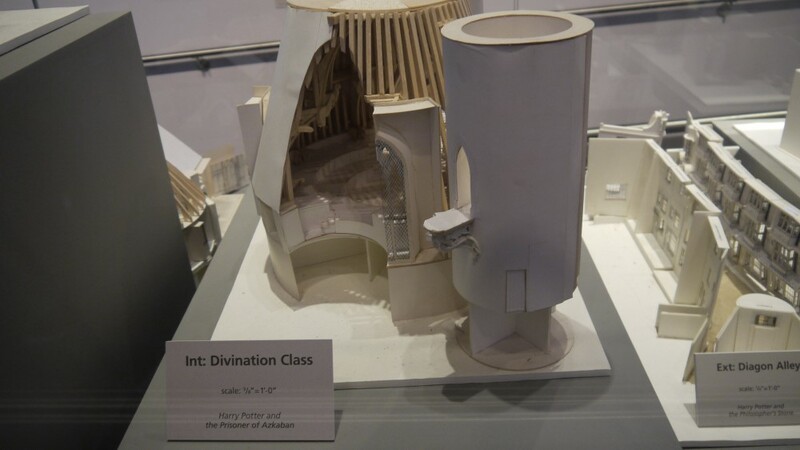 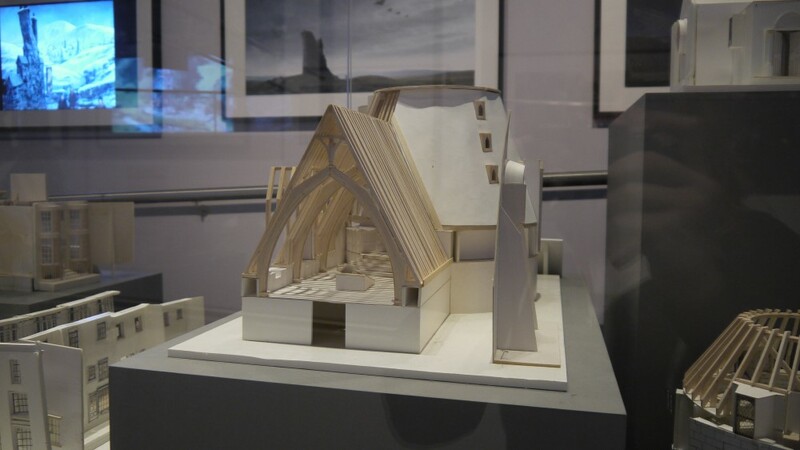 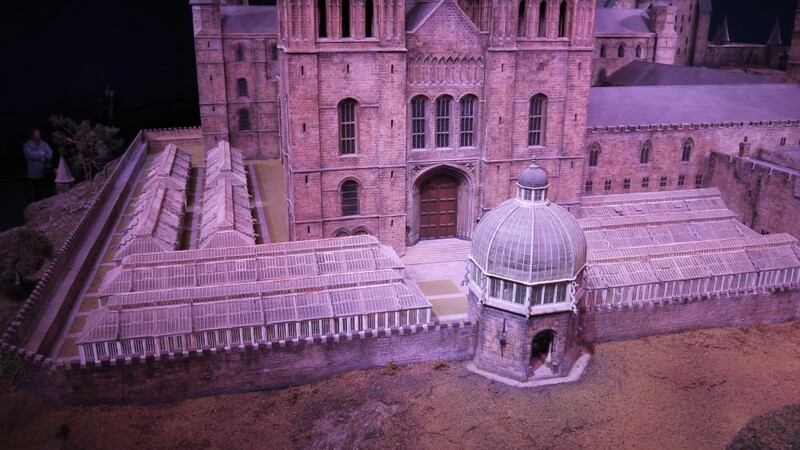 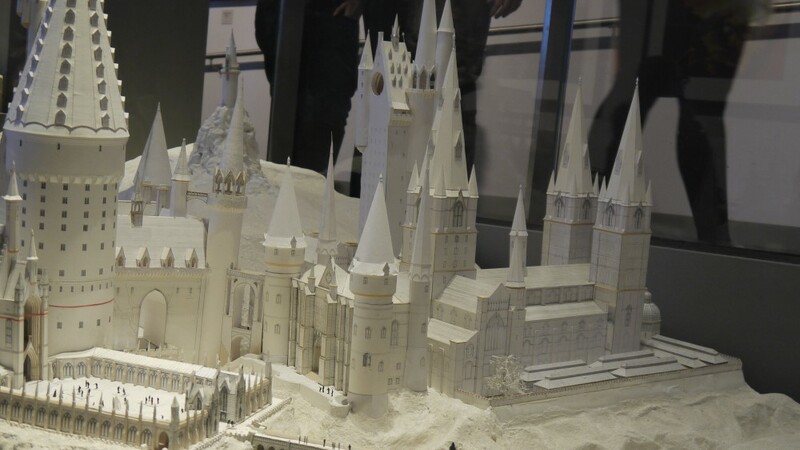 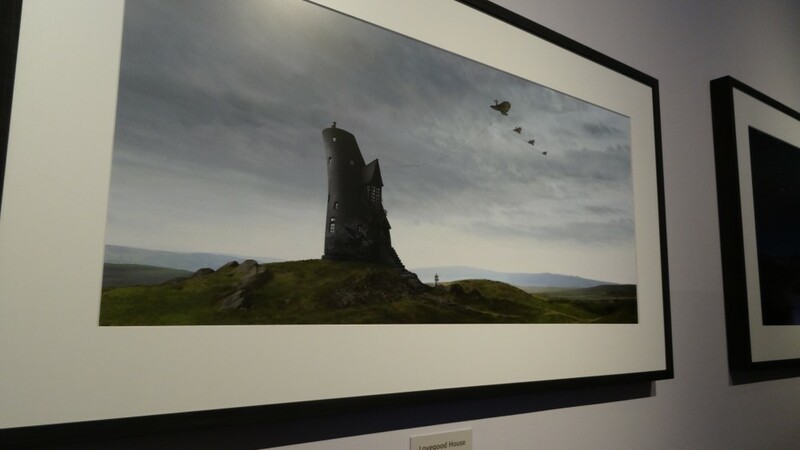 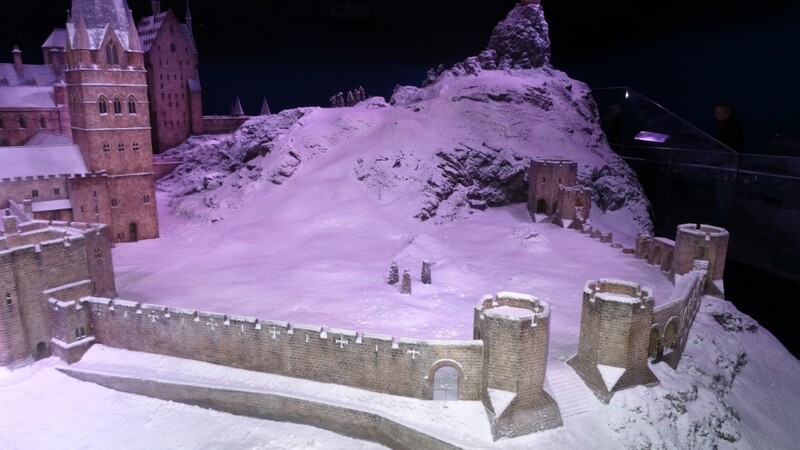 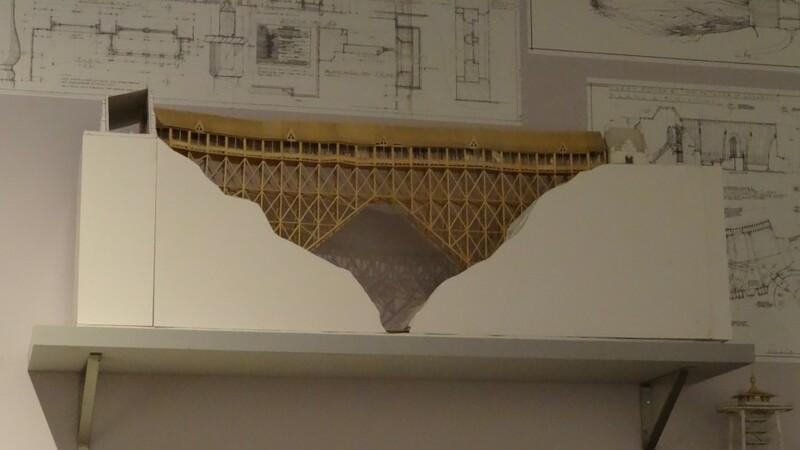 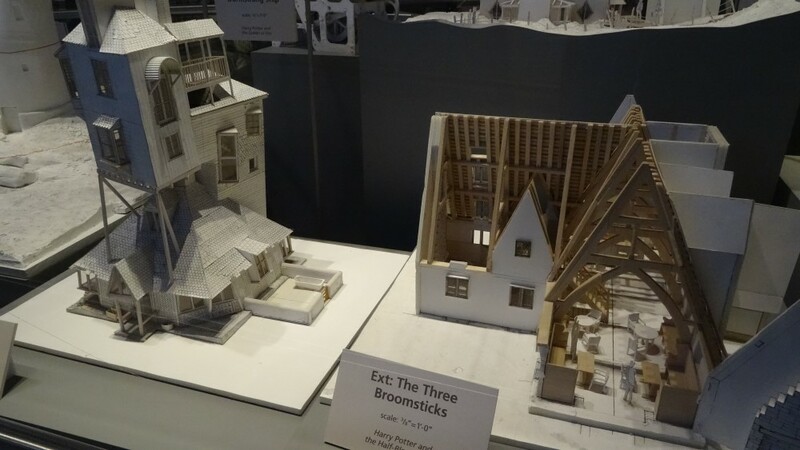 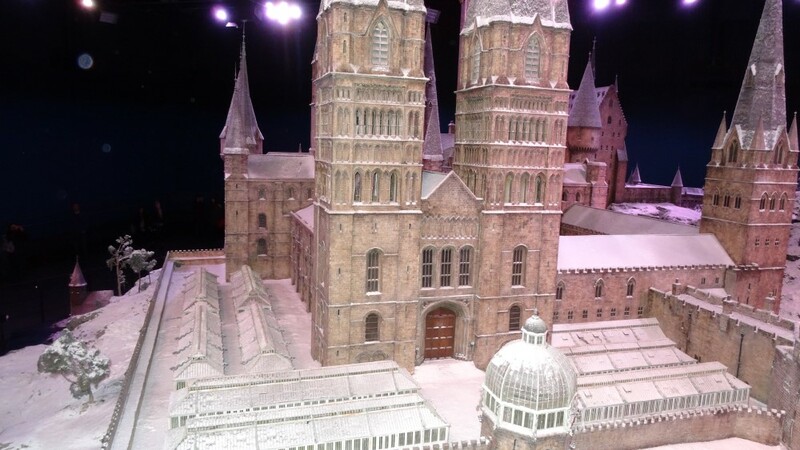 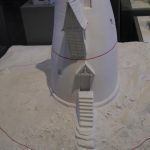 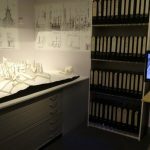 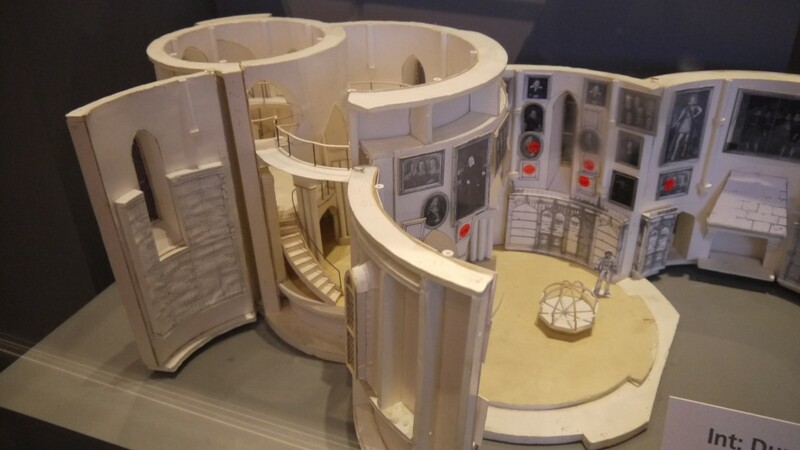 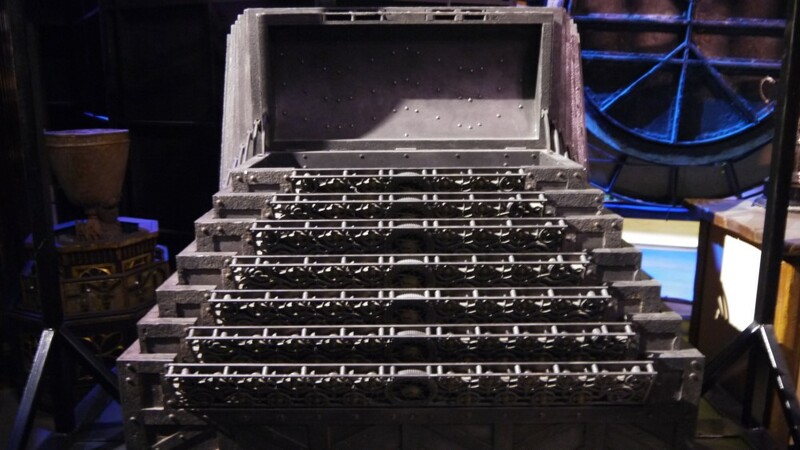 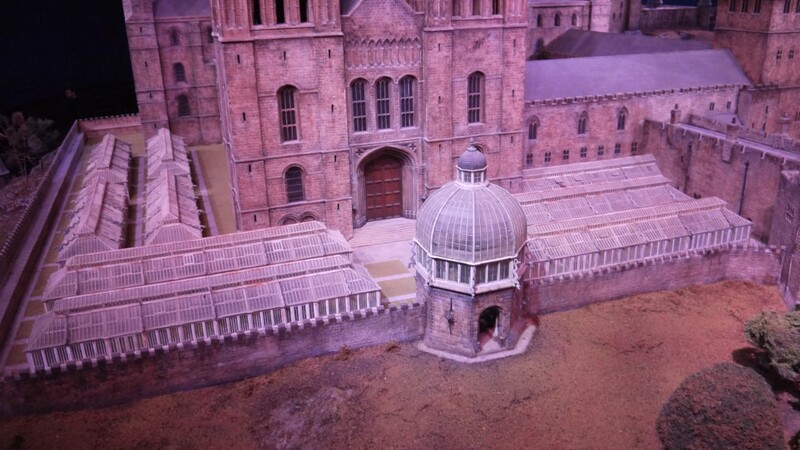 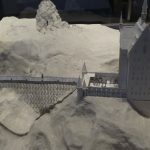 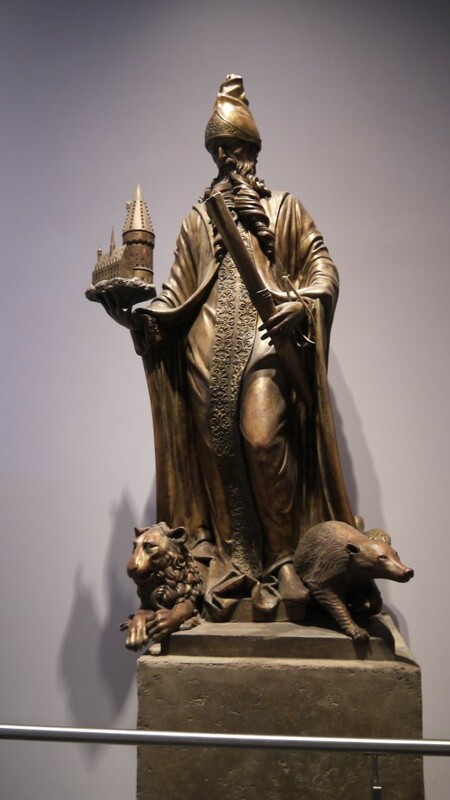 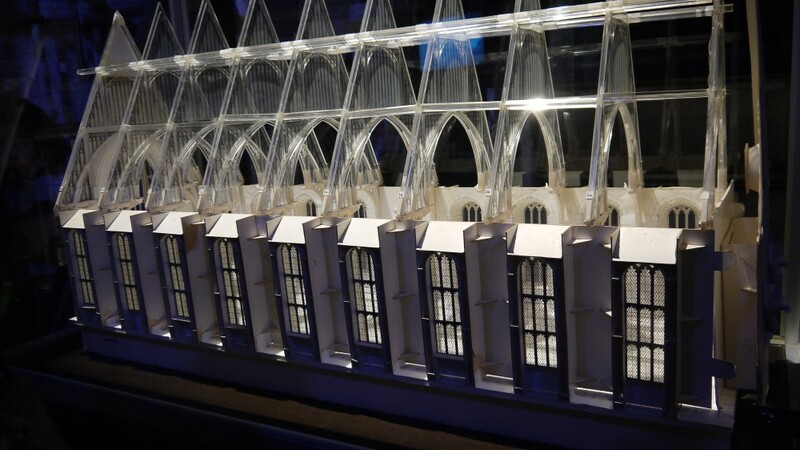 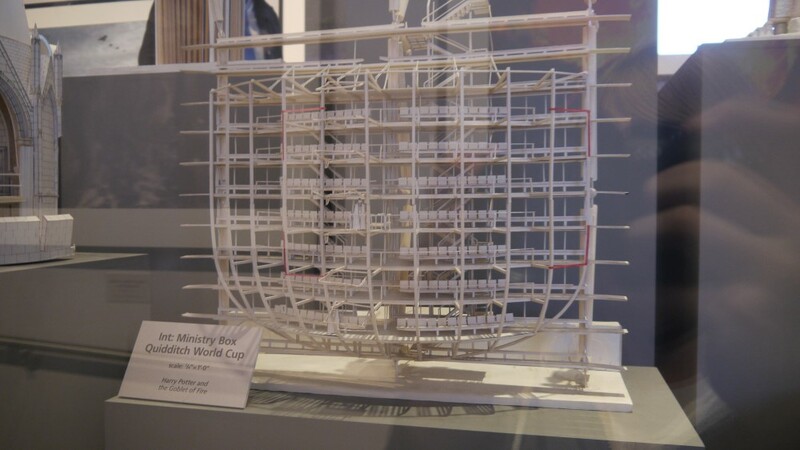 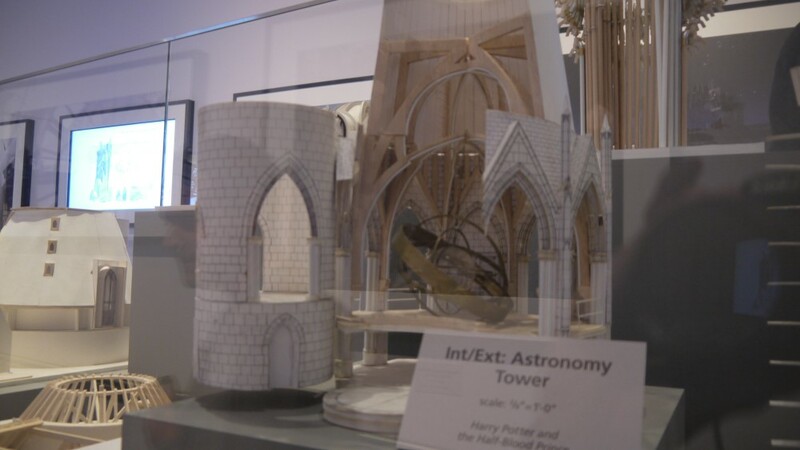 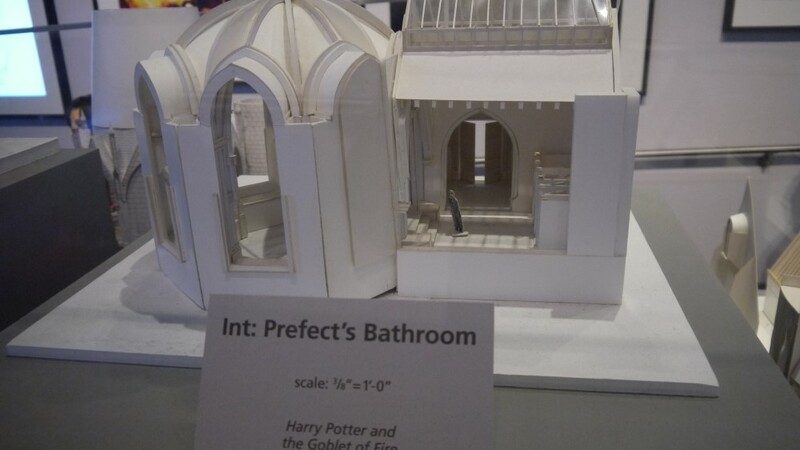 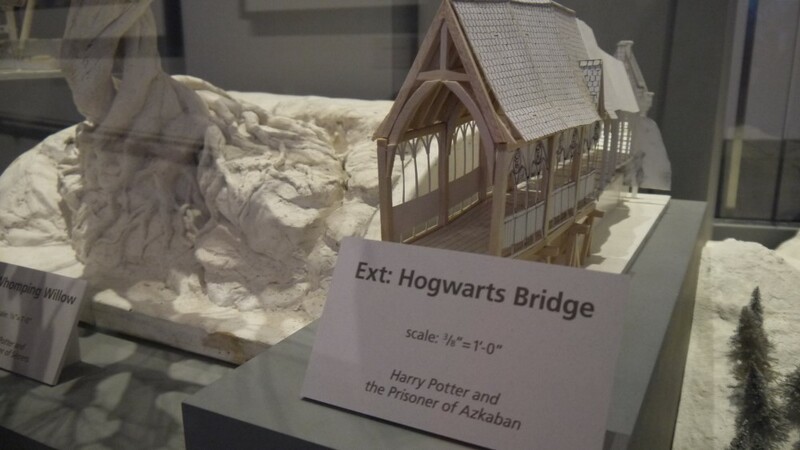 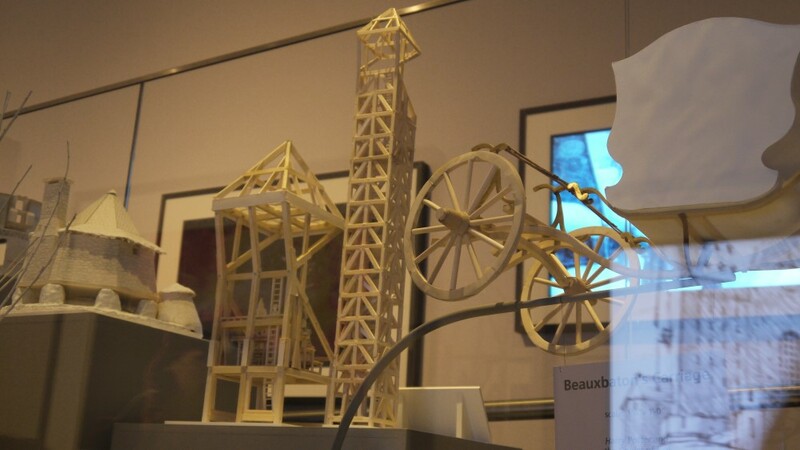 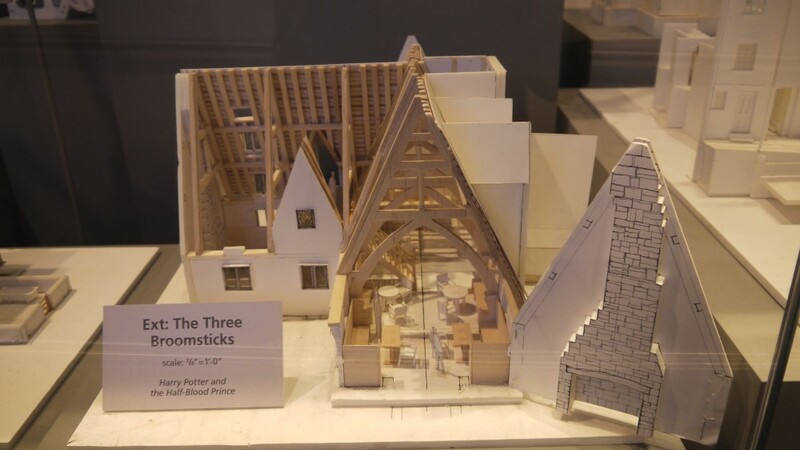 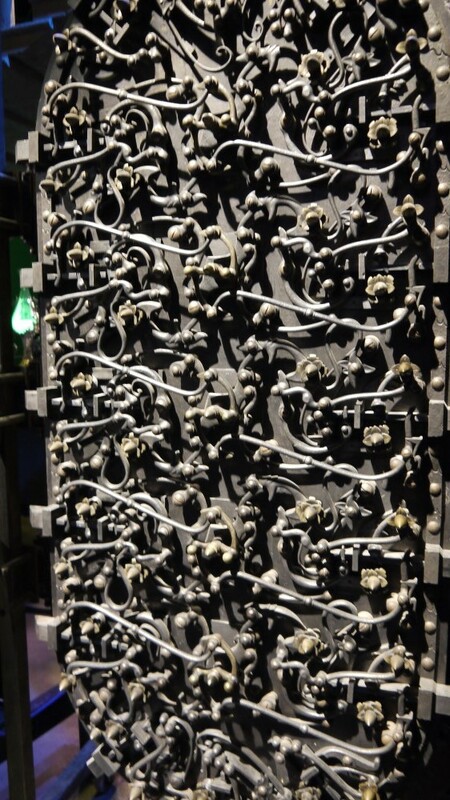 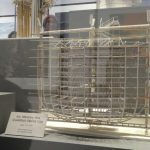 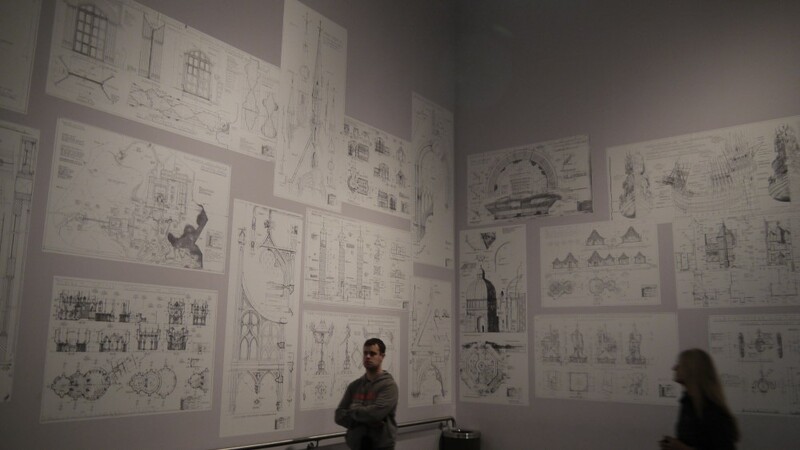 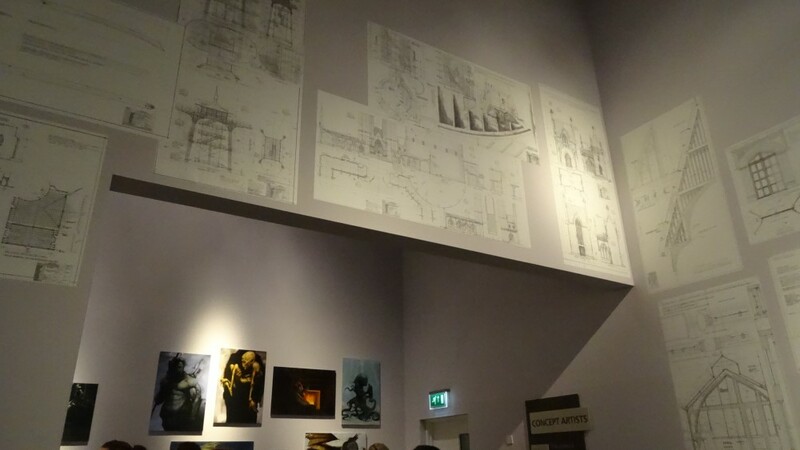 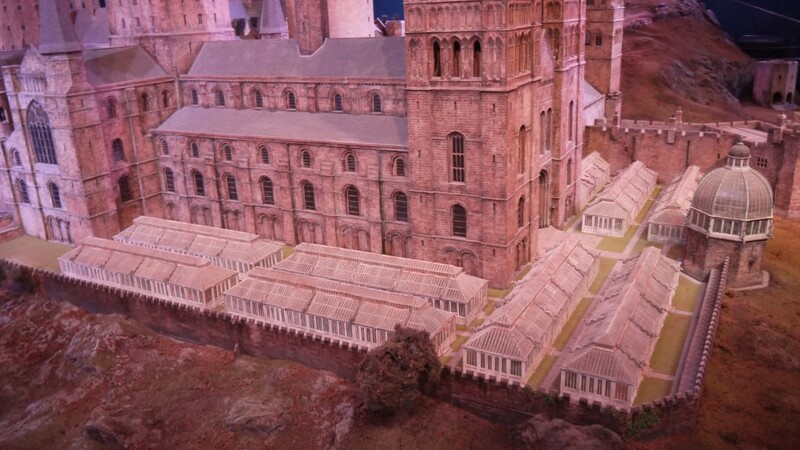 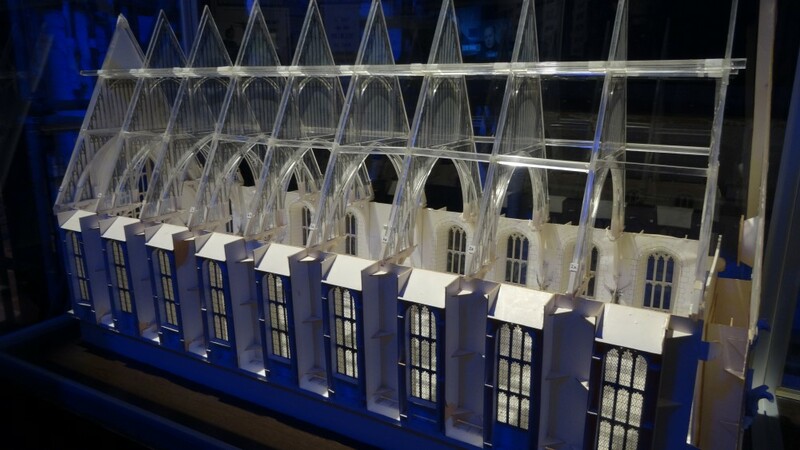 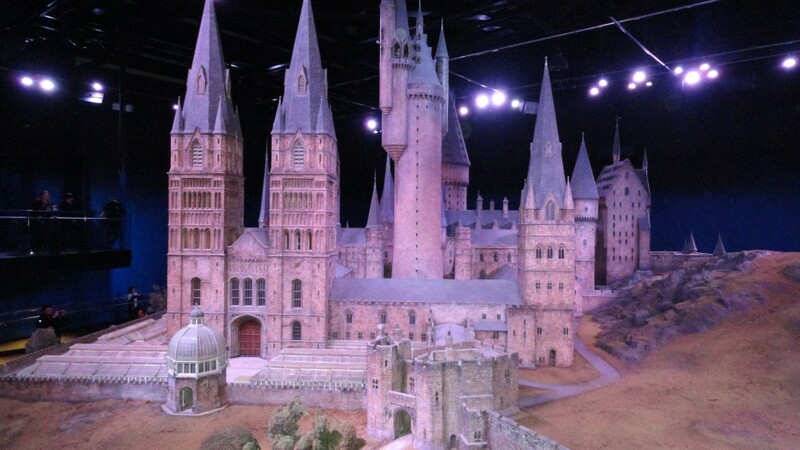 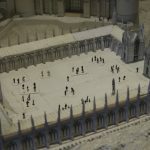 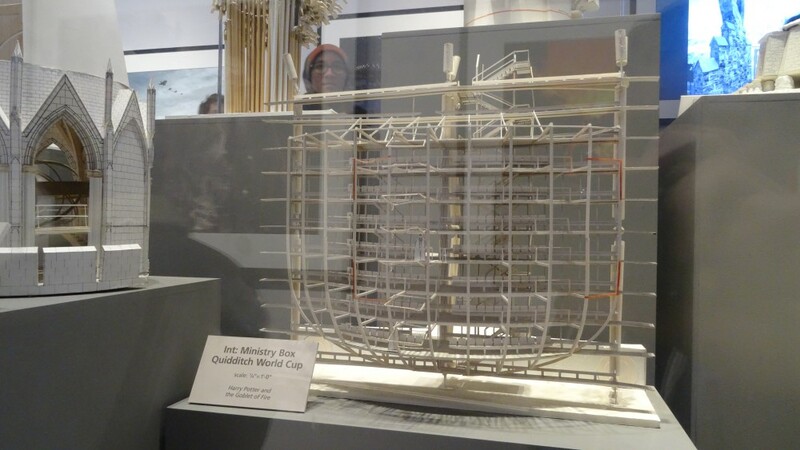 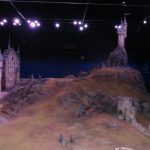 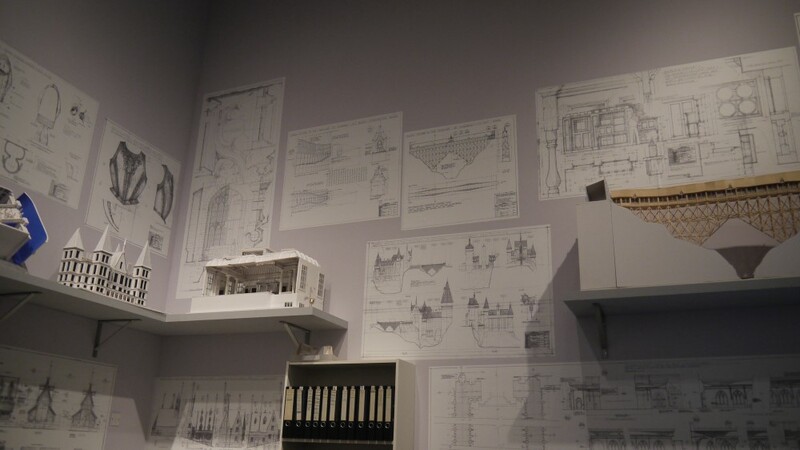 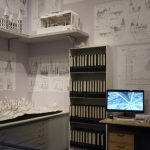 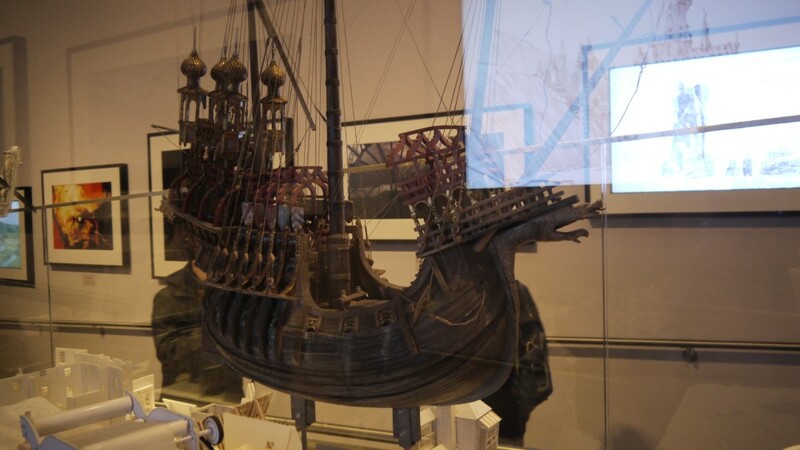 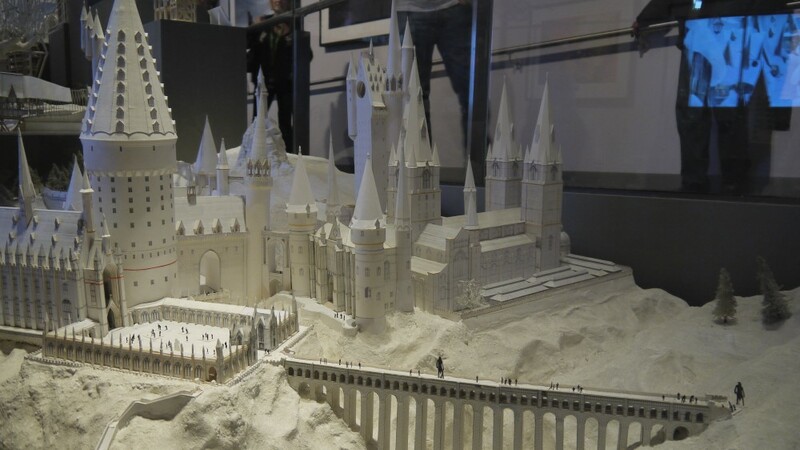 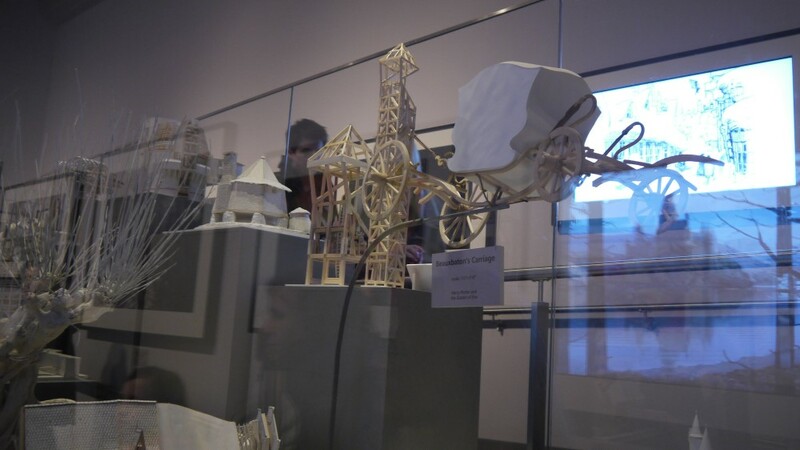 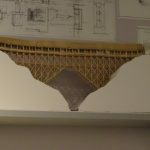 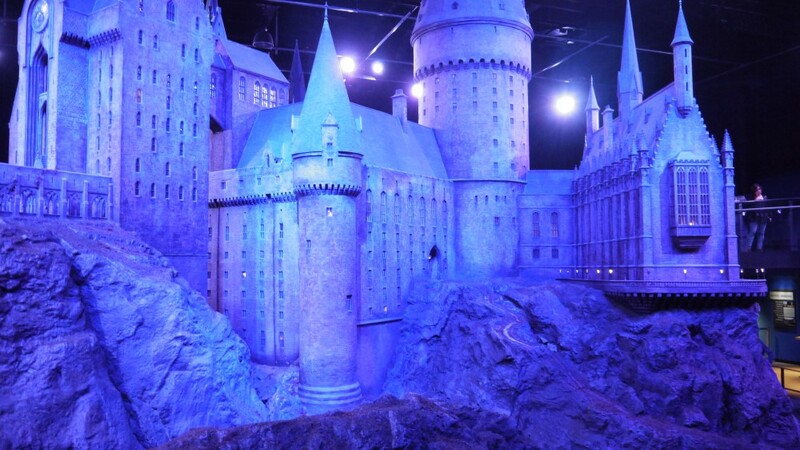 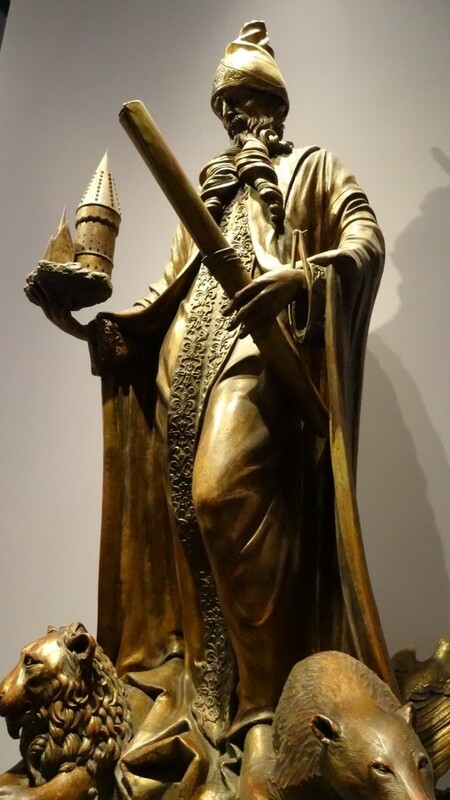 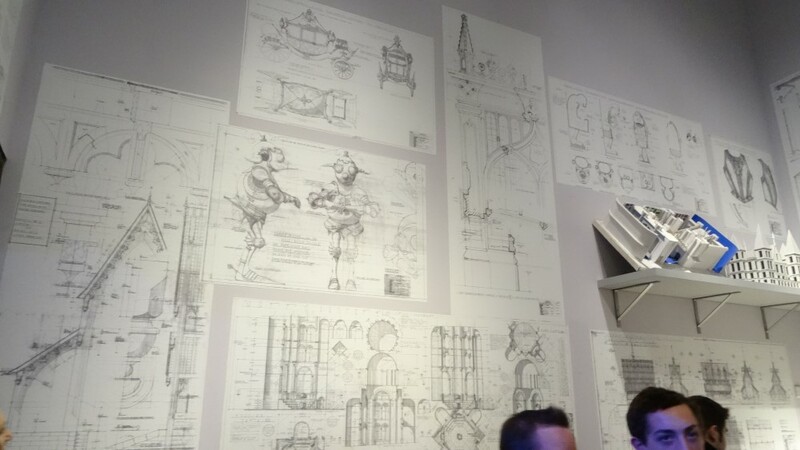 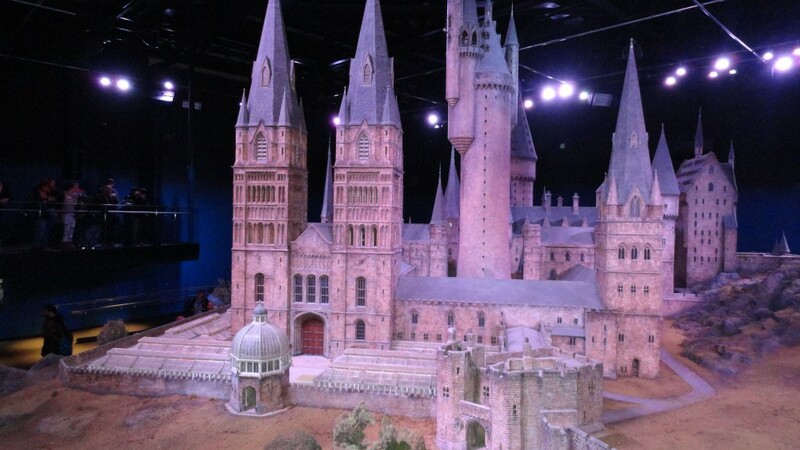 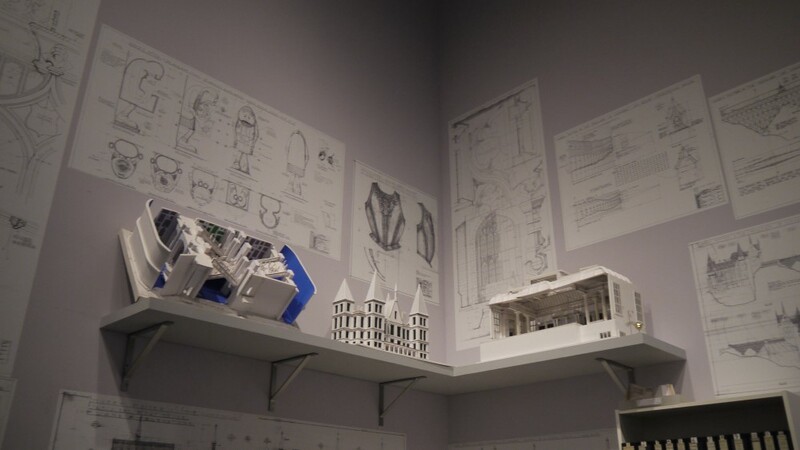 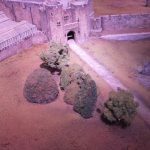 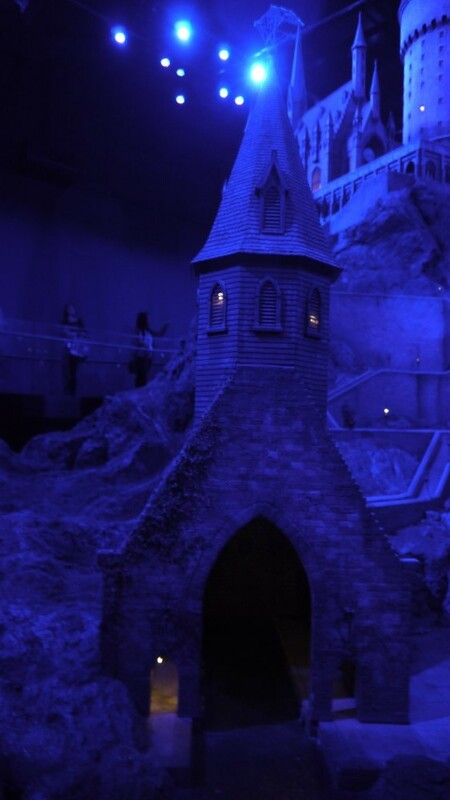 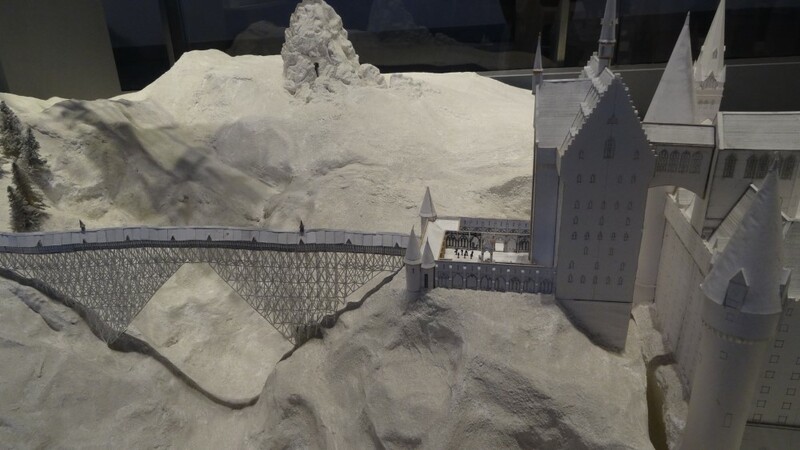 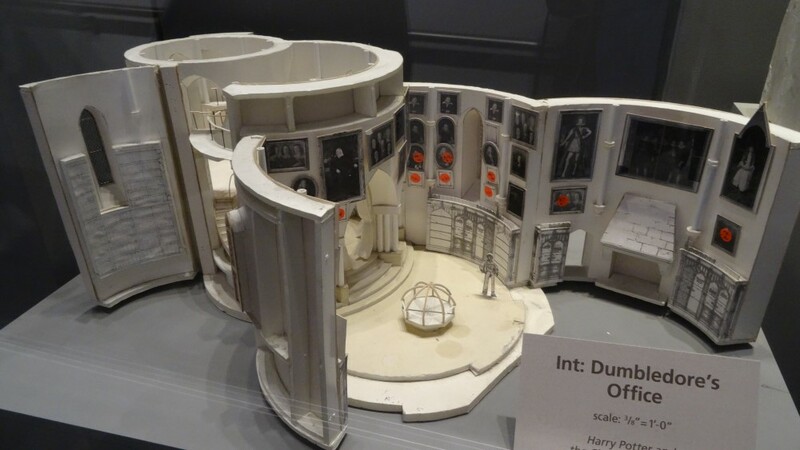 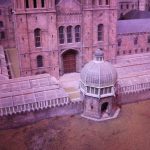 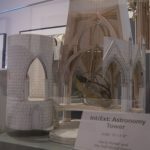 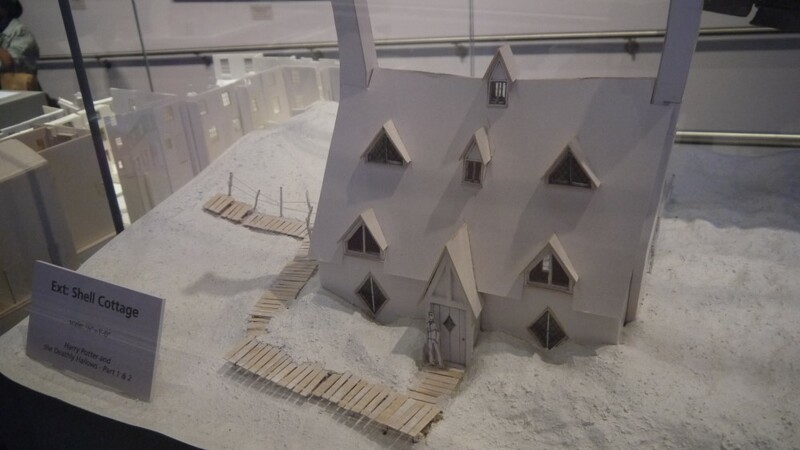 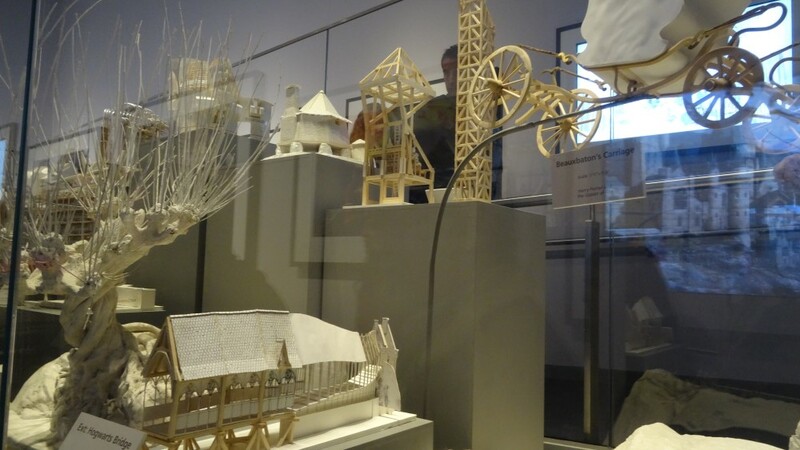 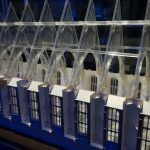 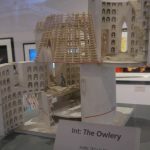 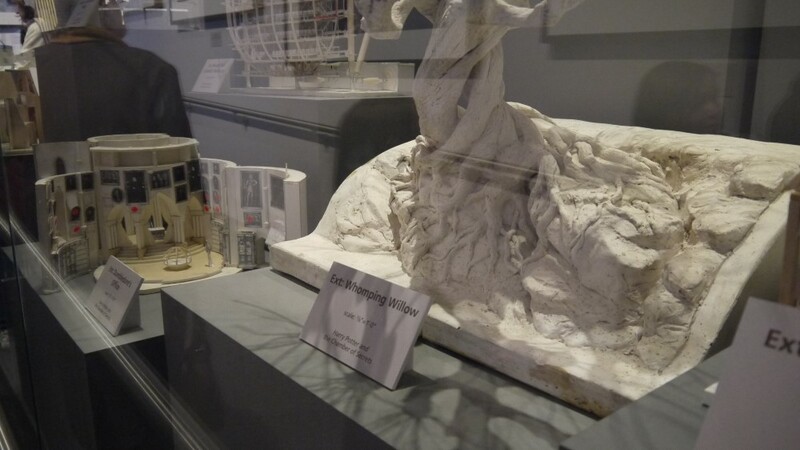 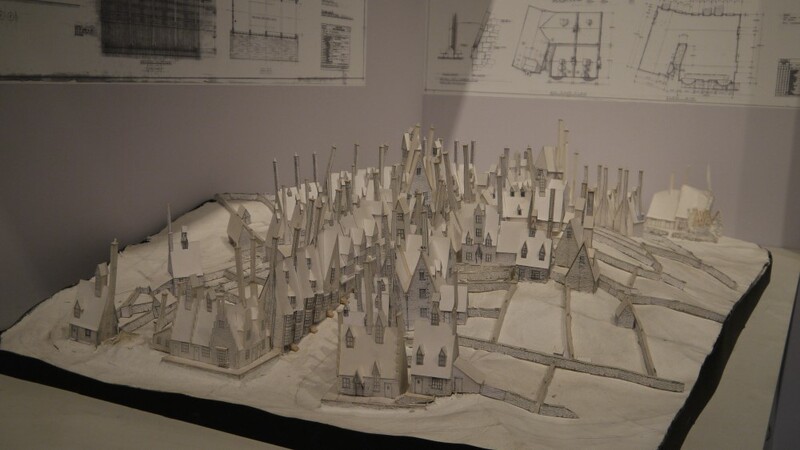 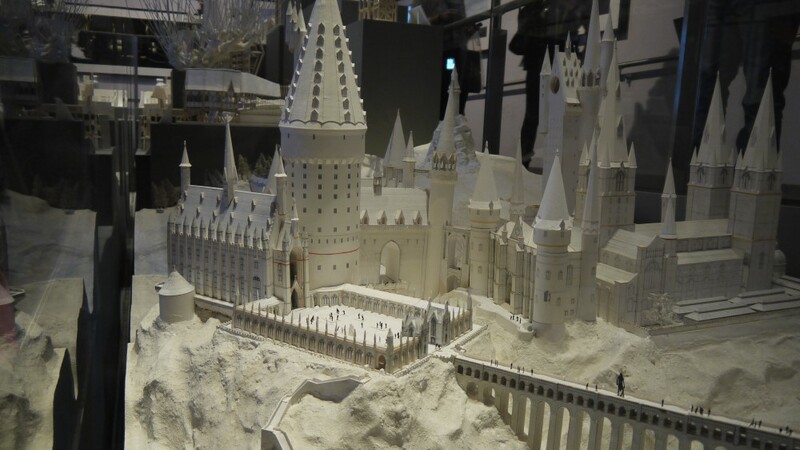 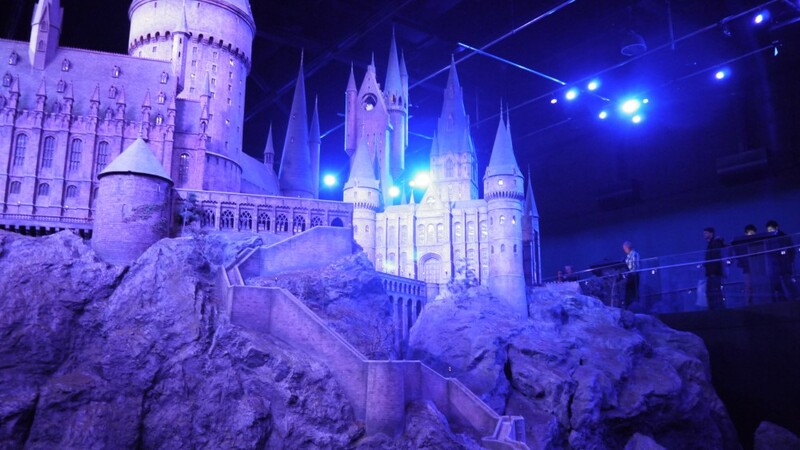 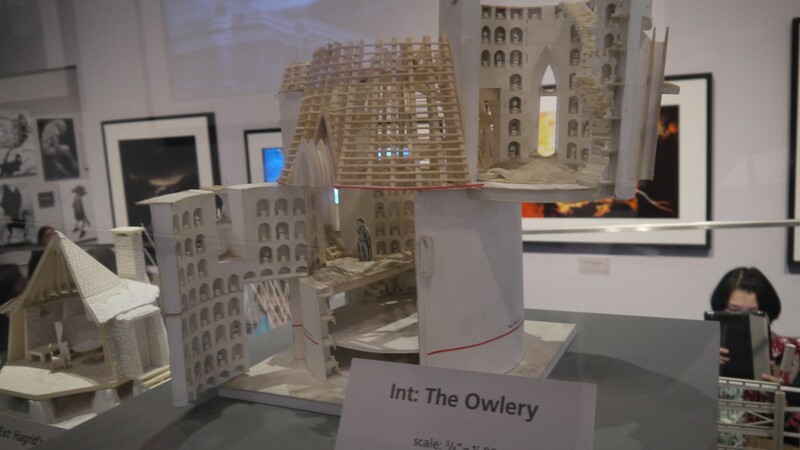 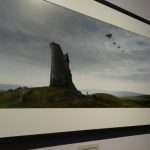 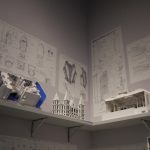 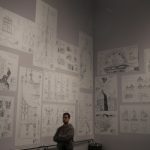 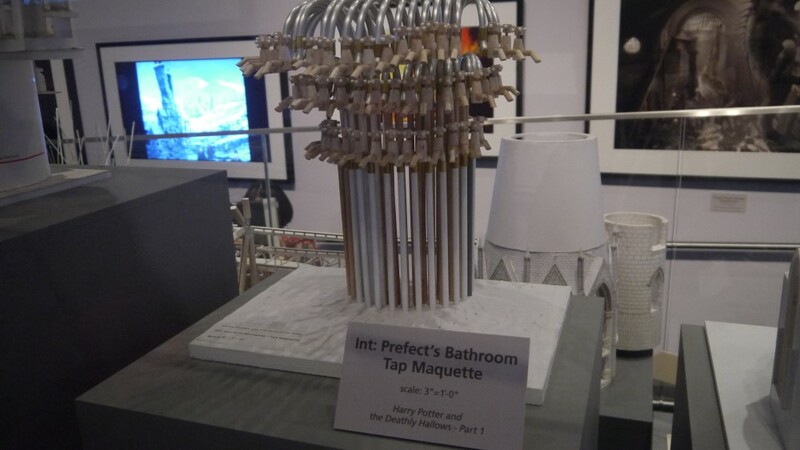 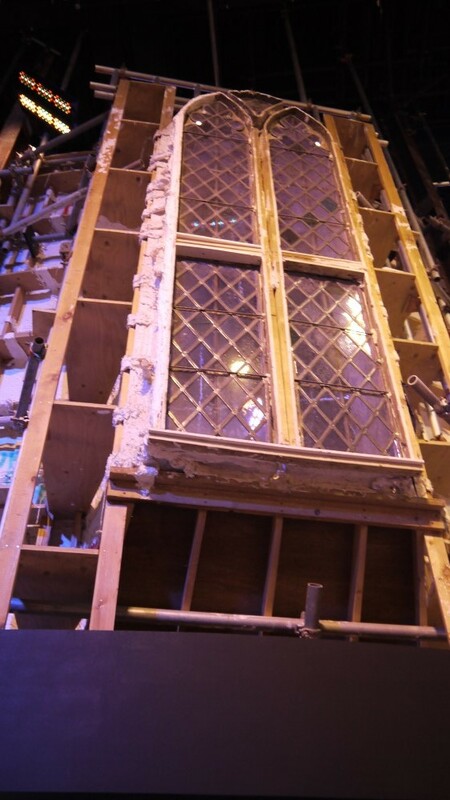 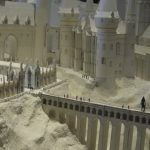 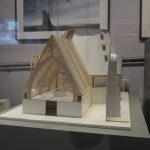 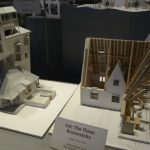 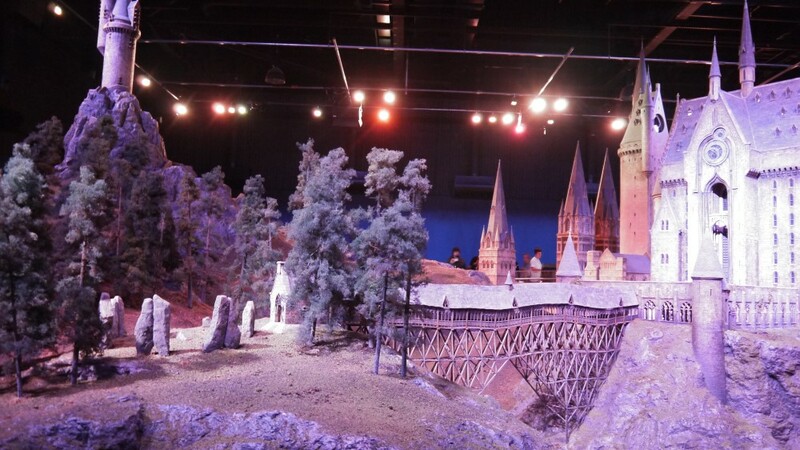 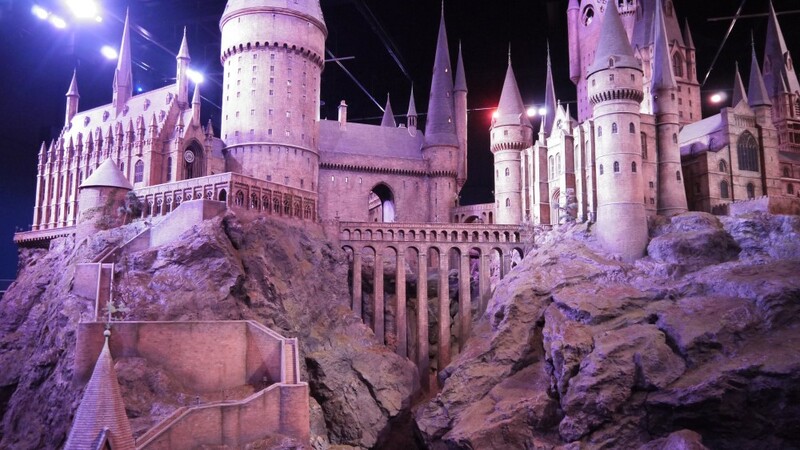 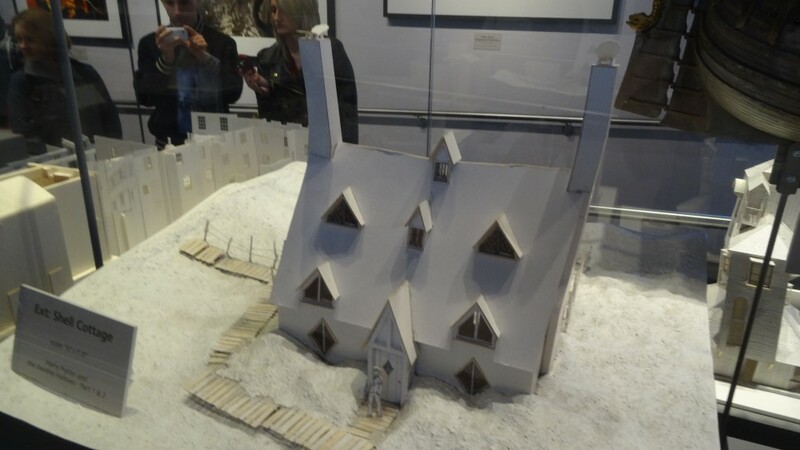 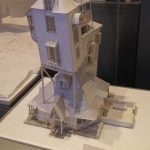 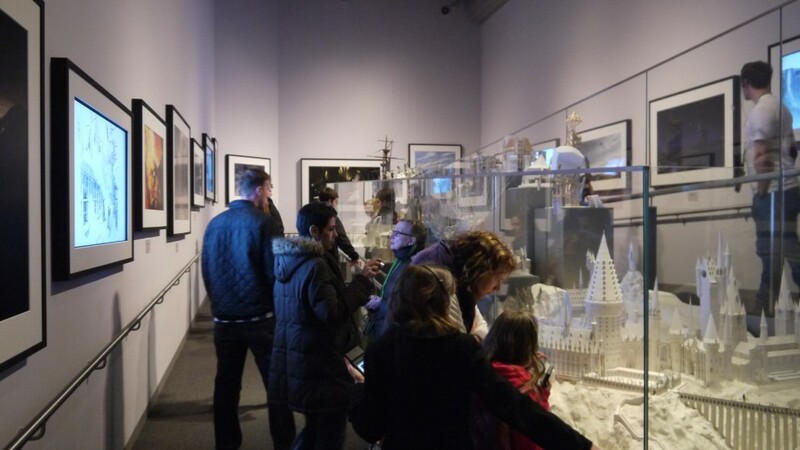 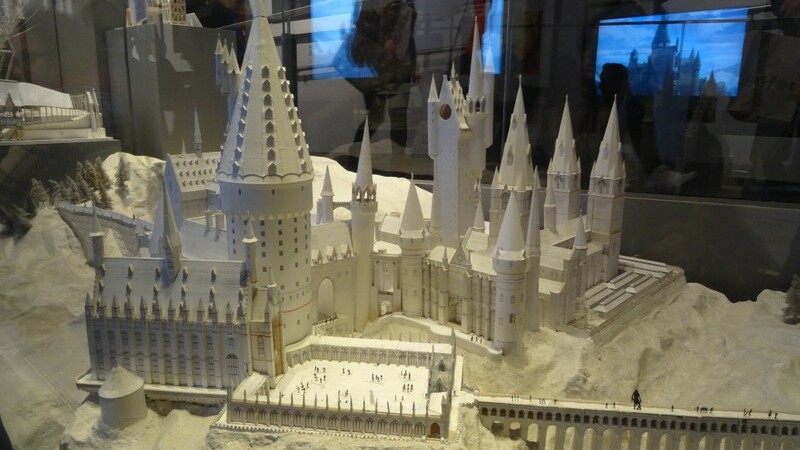 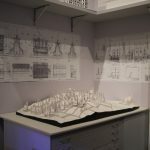 The Art Department, led by Production Designer Stuart Craig, designed all of the sets and props seen through the Harry Potter film series in minute detail, including the breathtaking 1:24 scale model of Hogwarts castle which was used for exterior shots of the magical school. 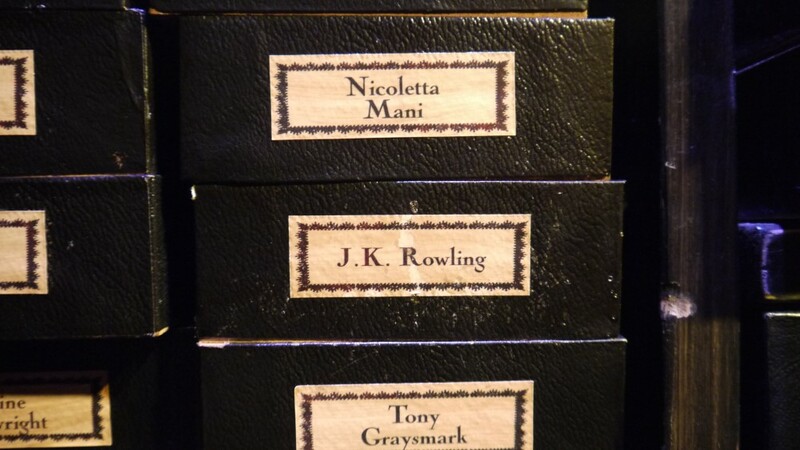 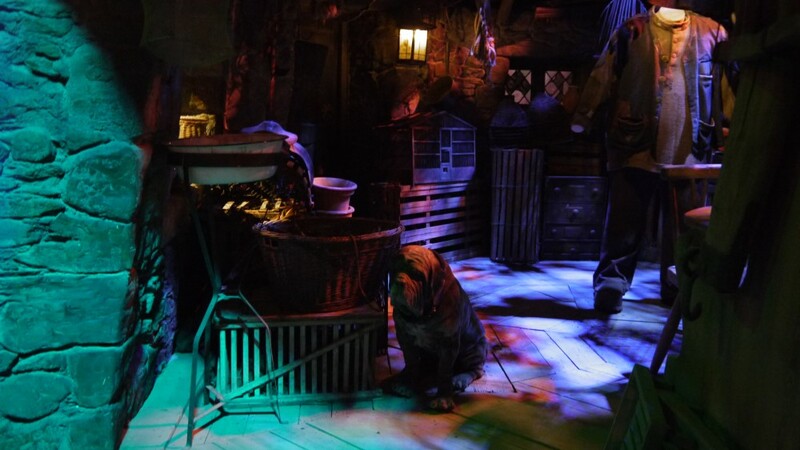 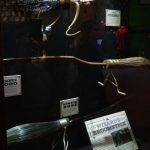 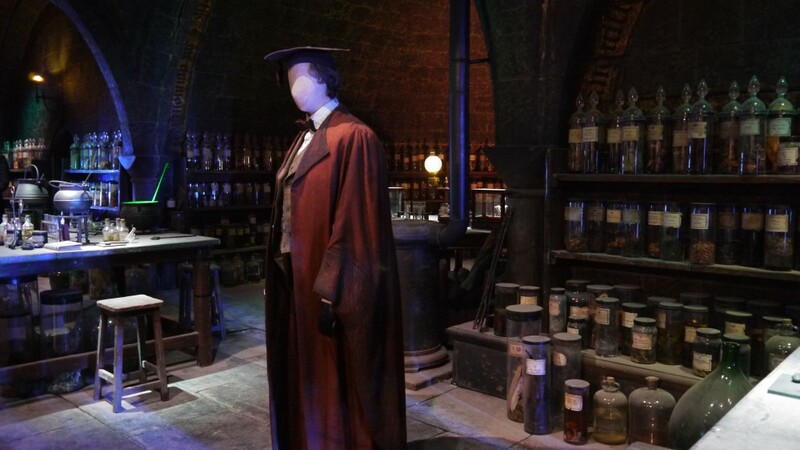 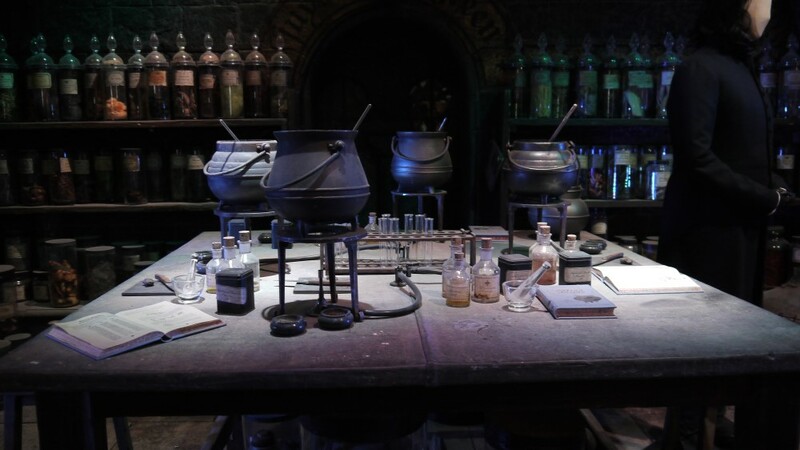 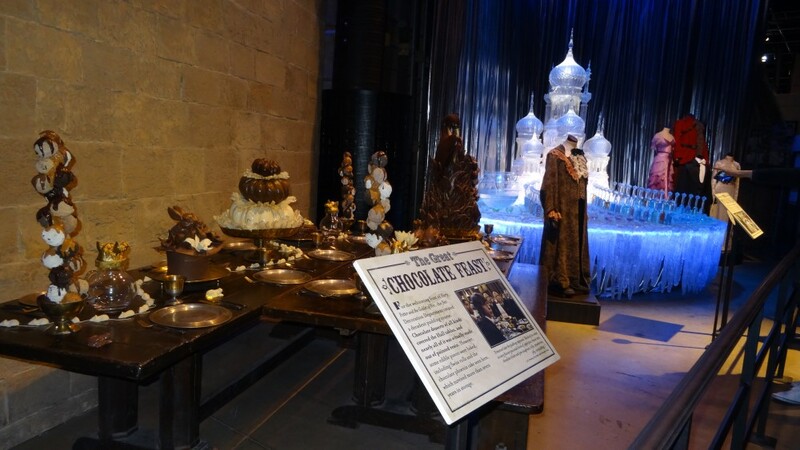 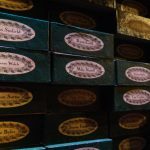 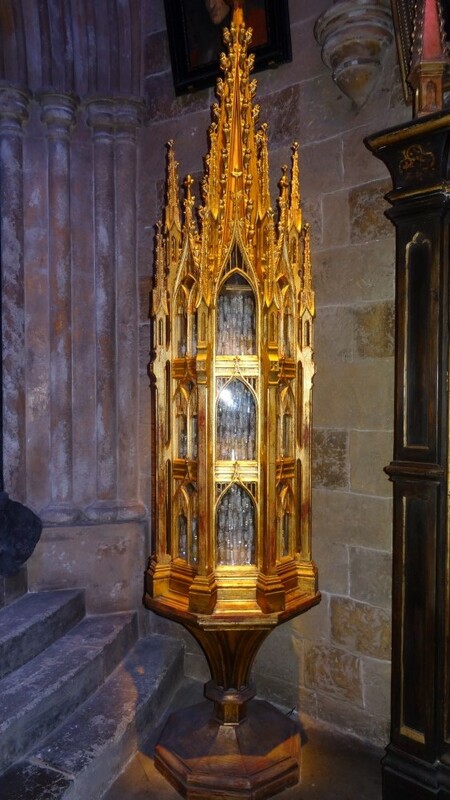 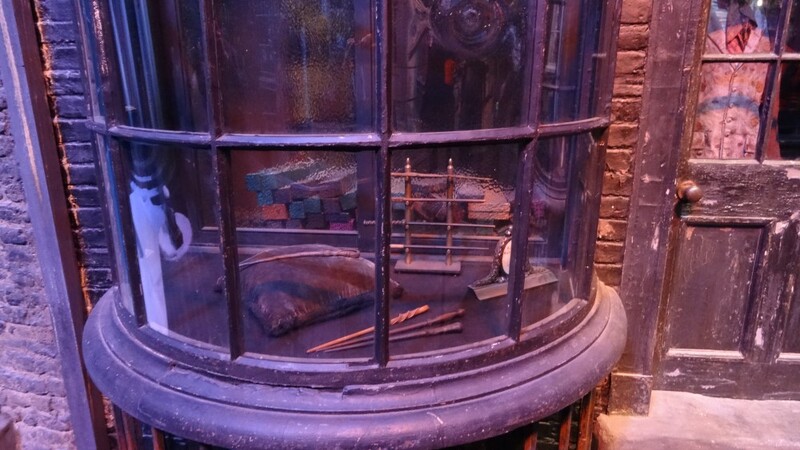 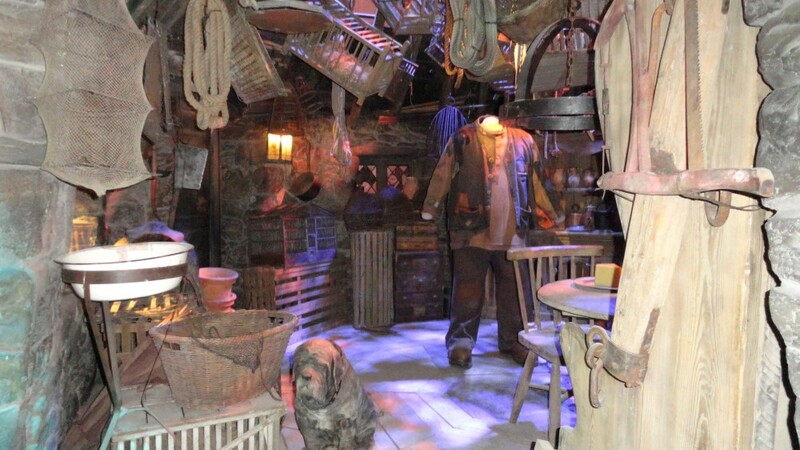 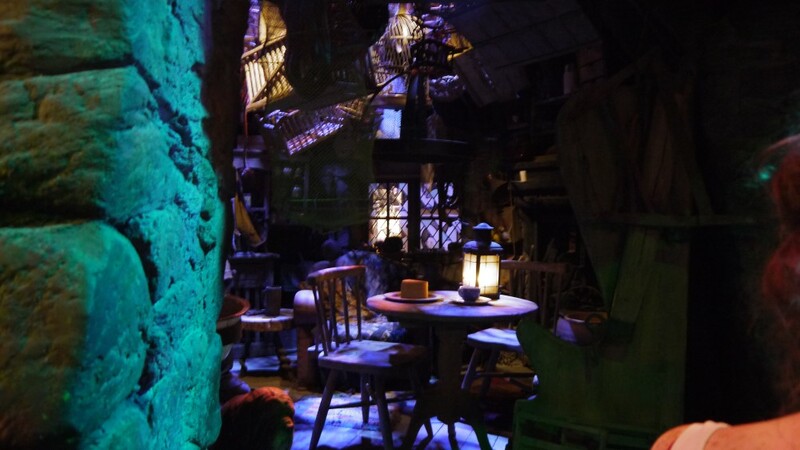 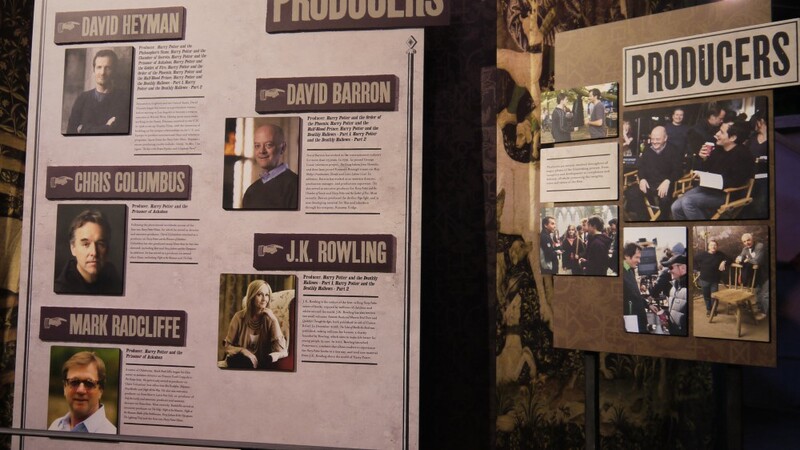 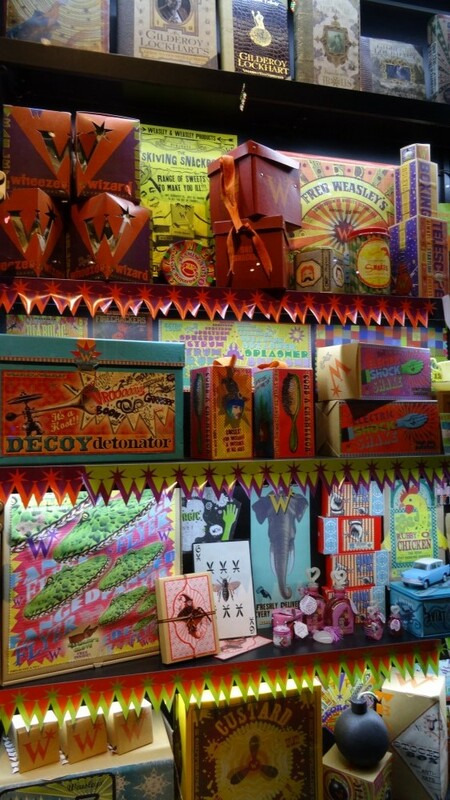 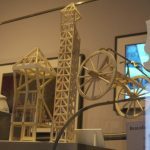 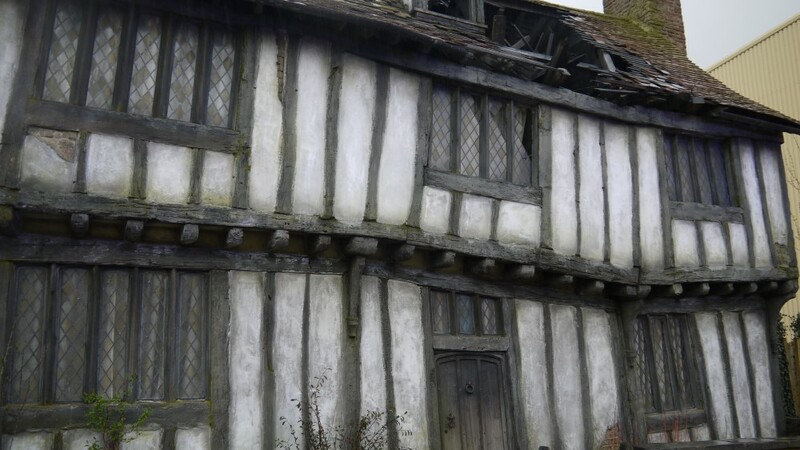 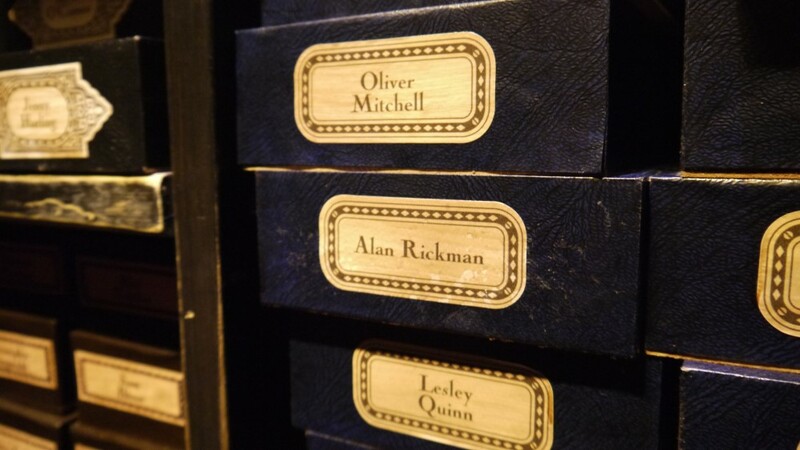 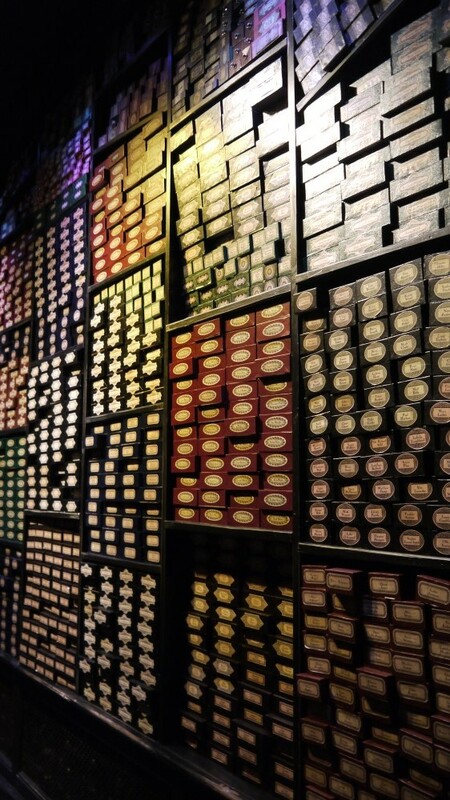 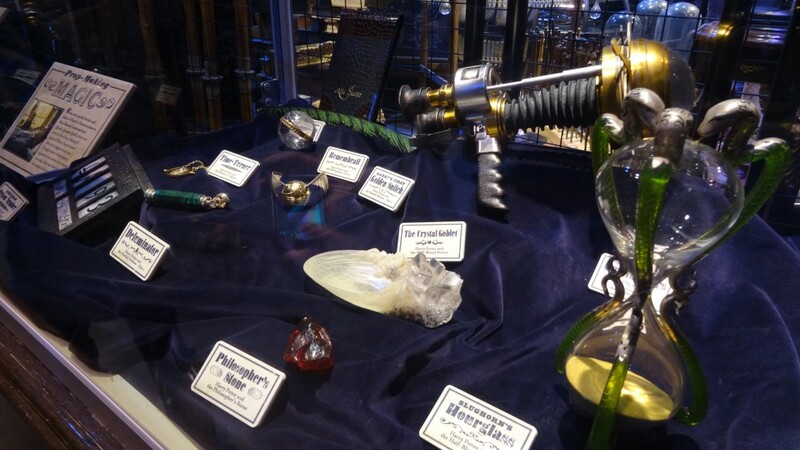 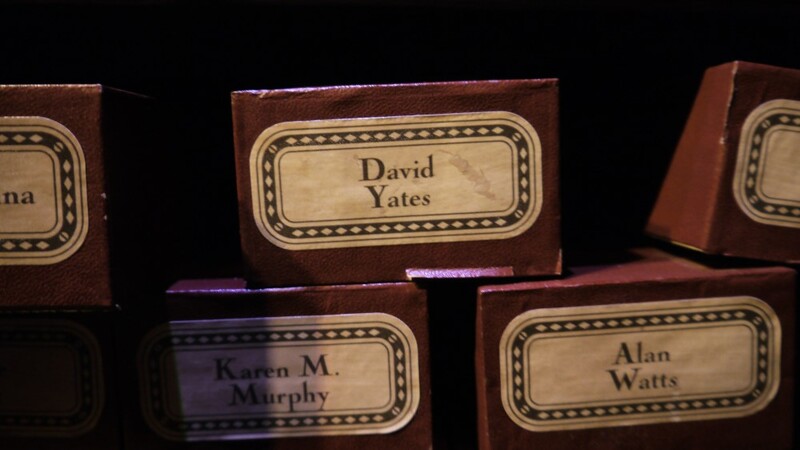 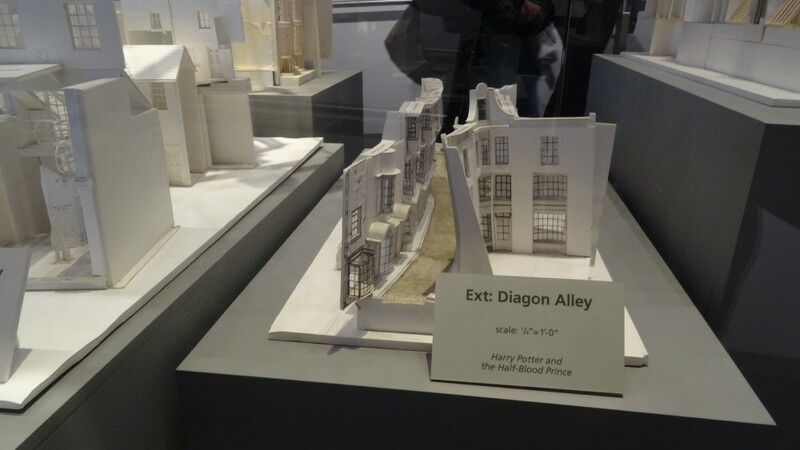 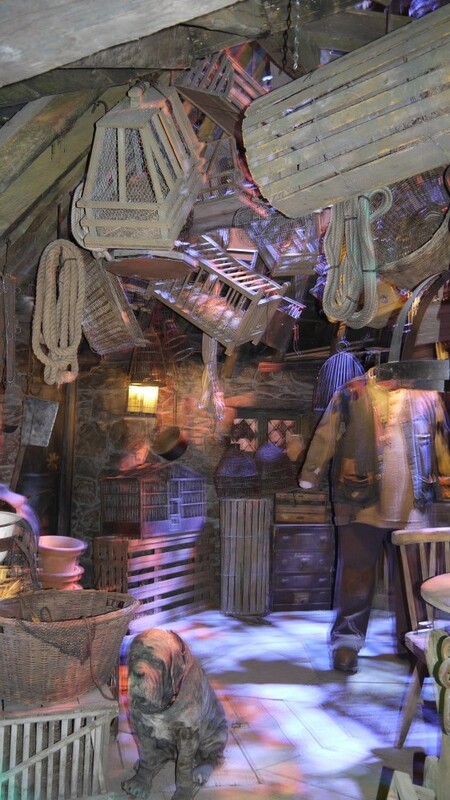 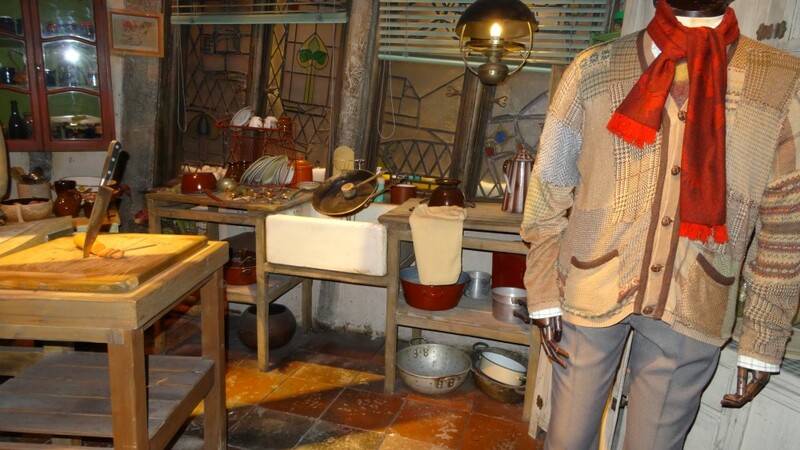 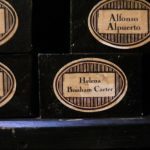 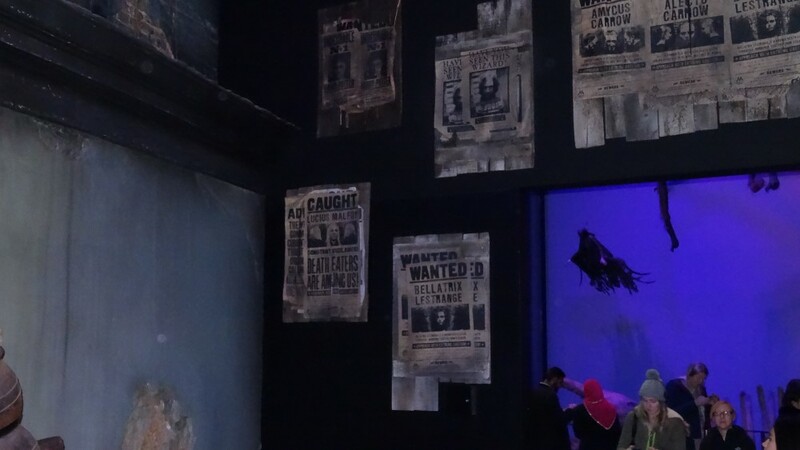 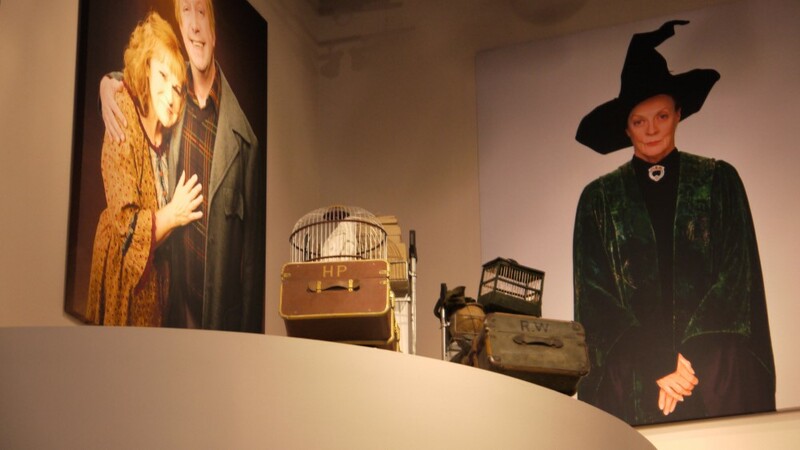 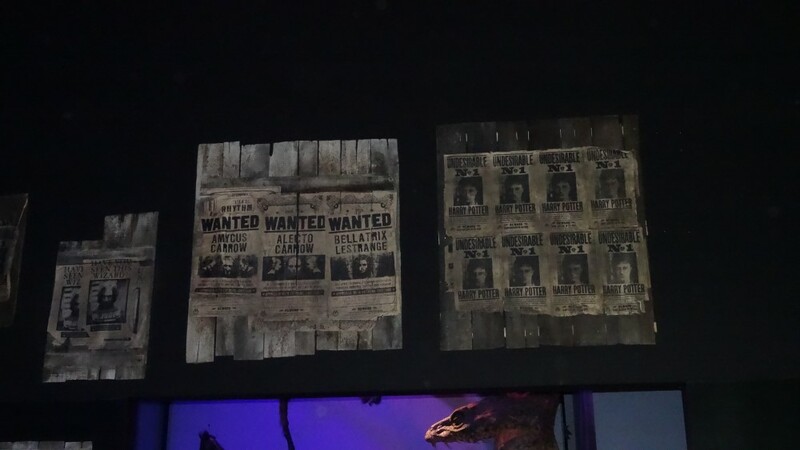 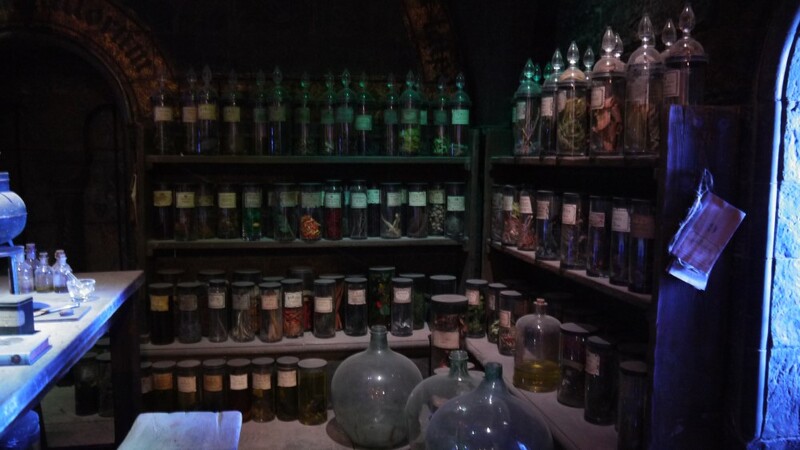 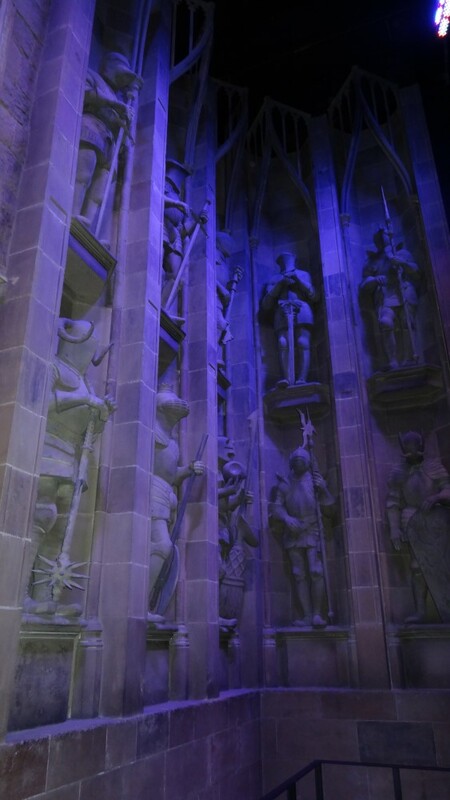 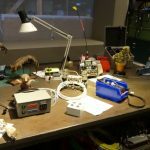 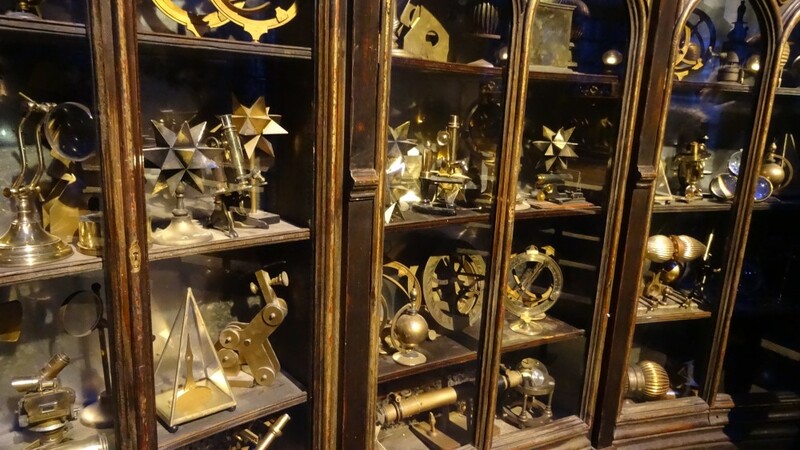 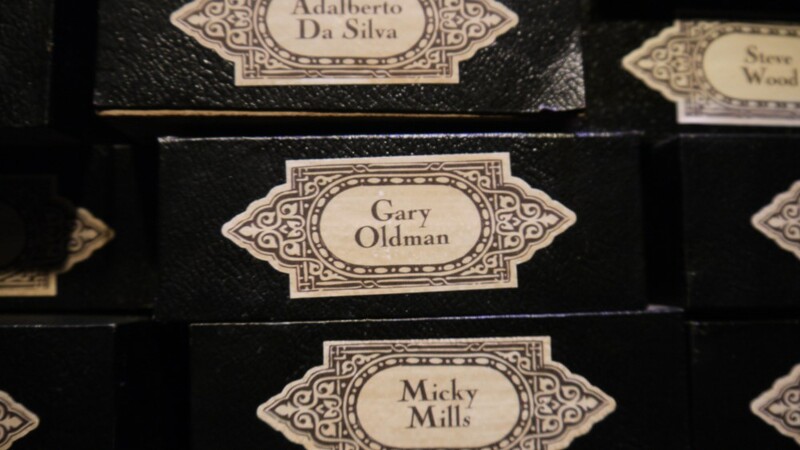 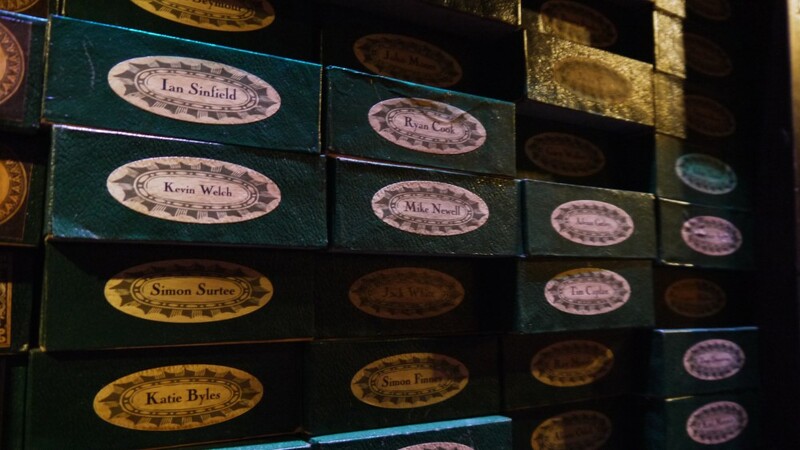 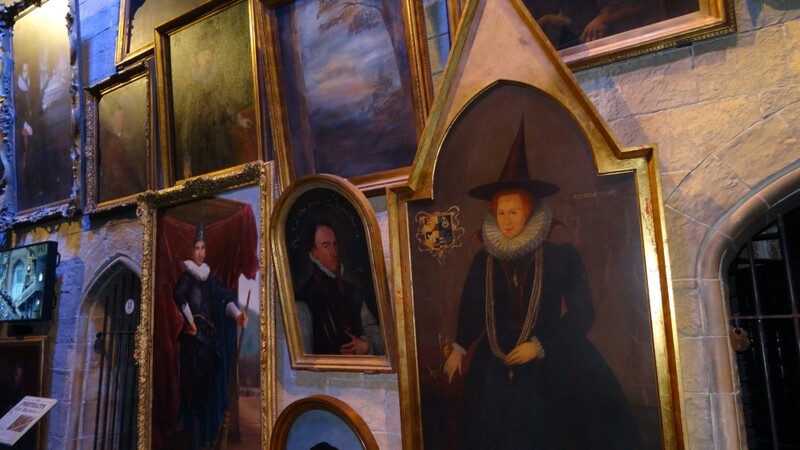 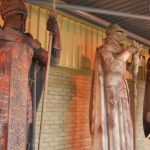 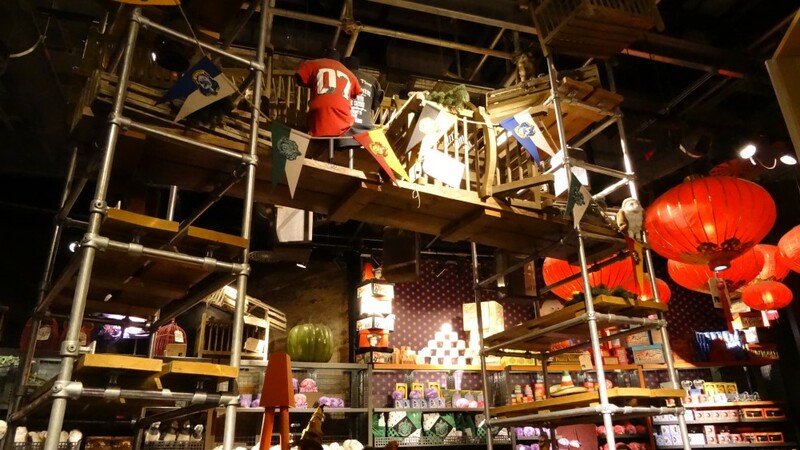 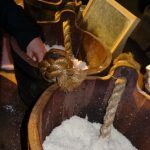 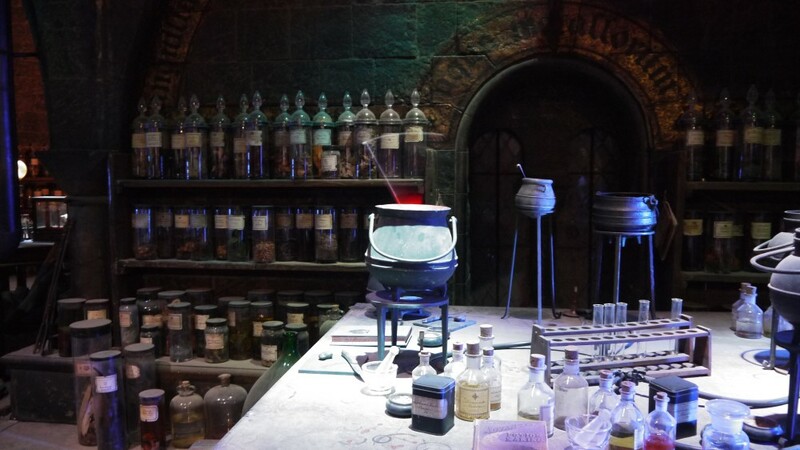 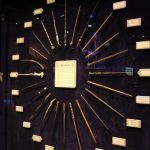 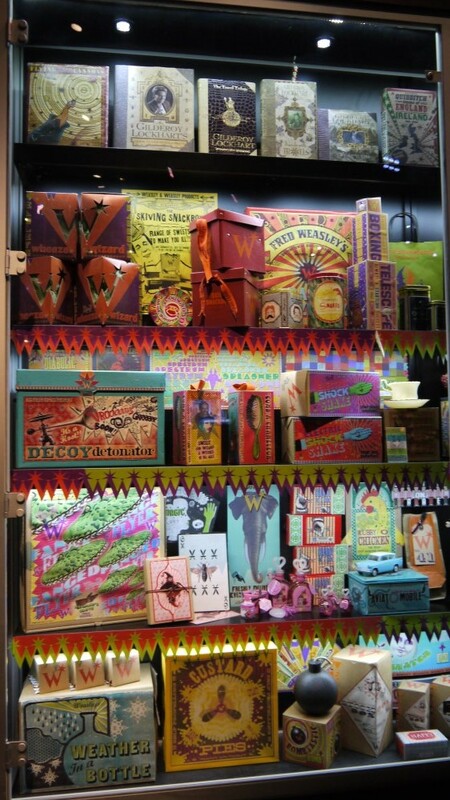 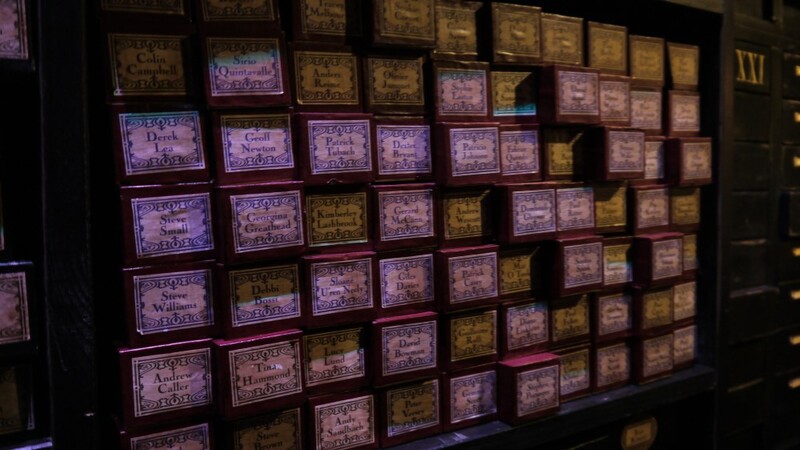 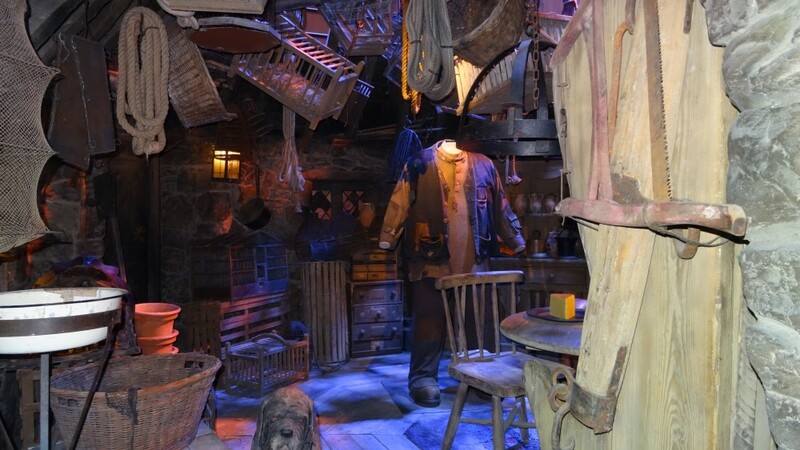 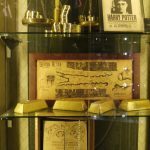 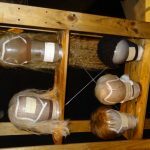 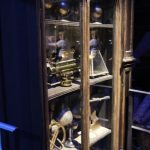 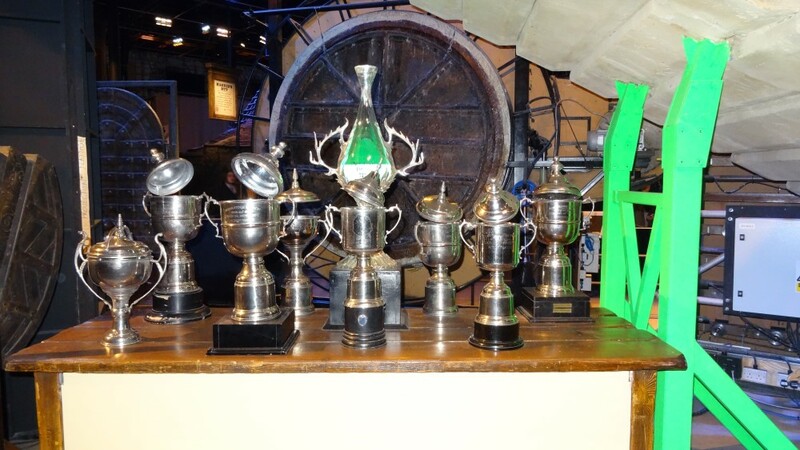 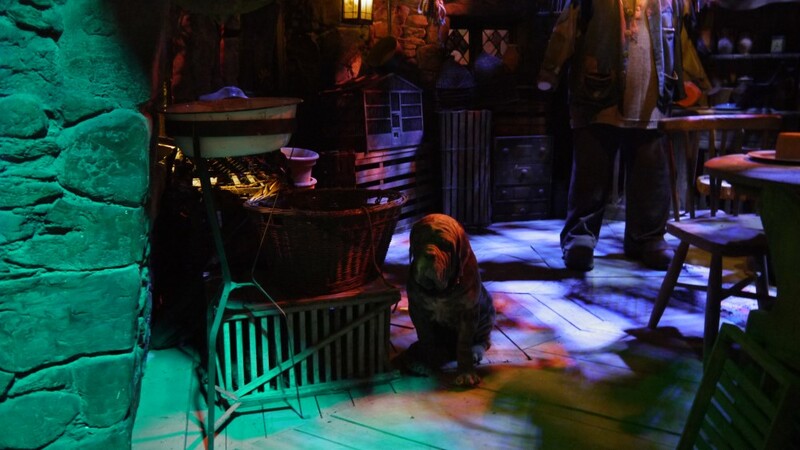 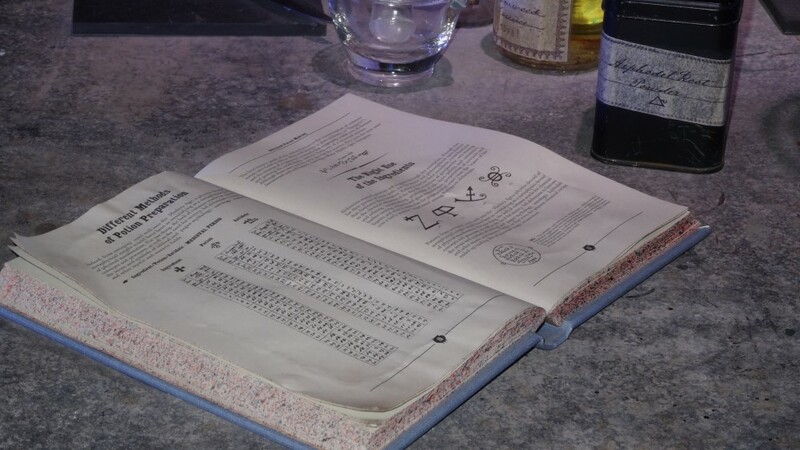 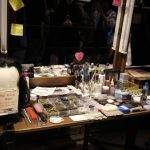 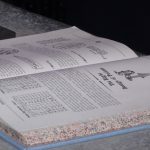 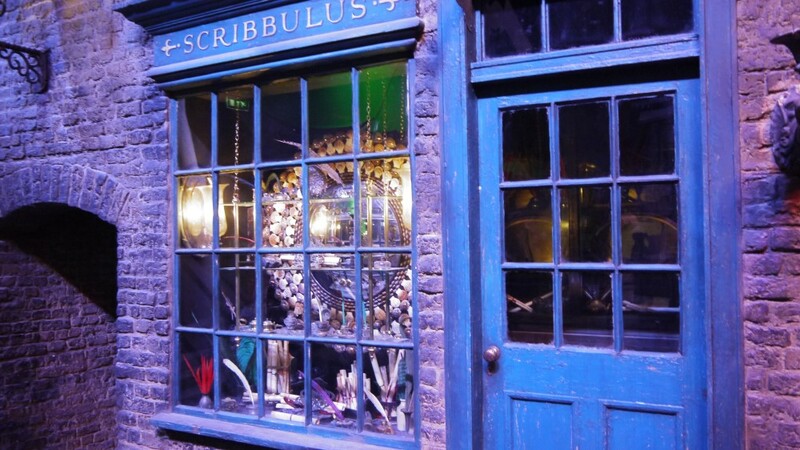 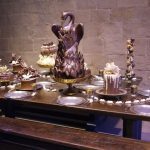 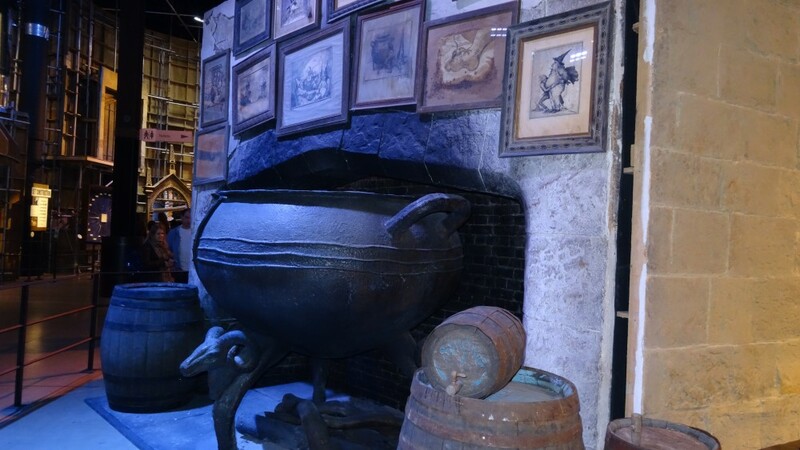 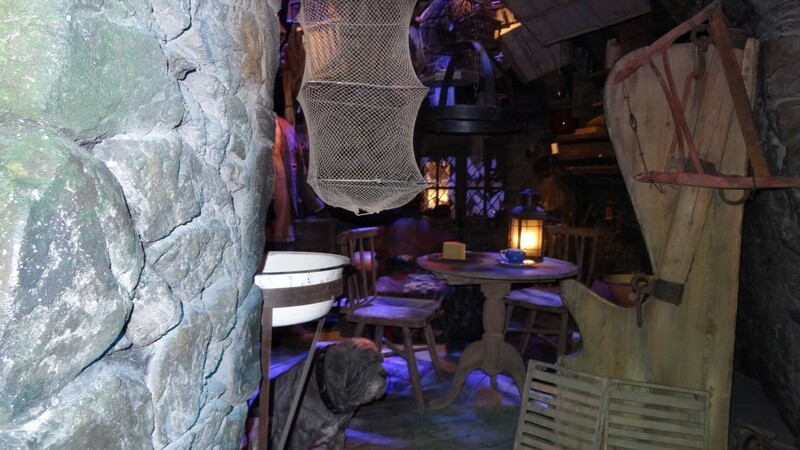 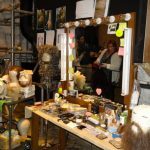 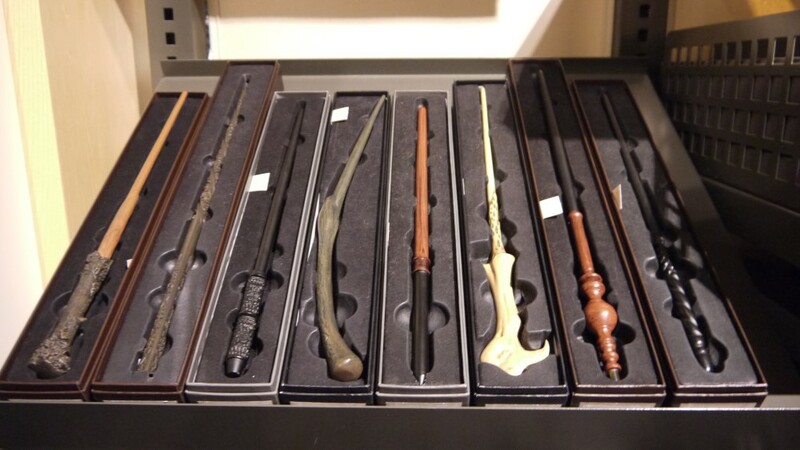 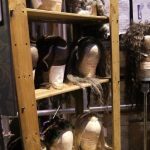 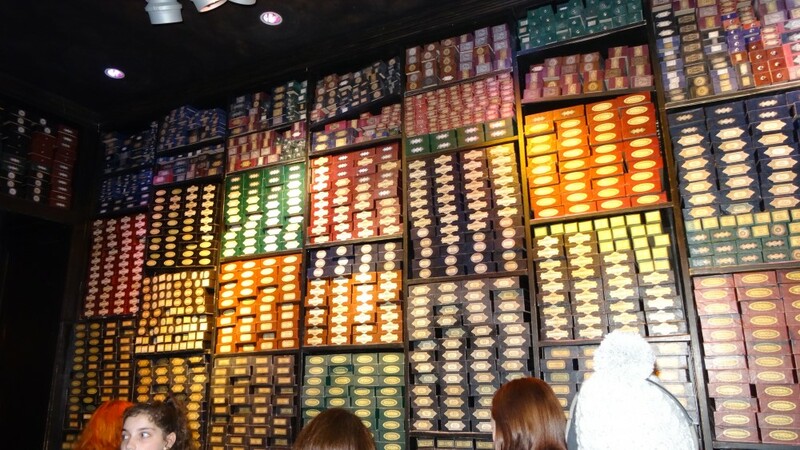 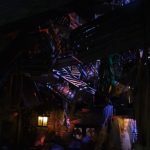 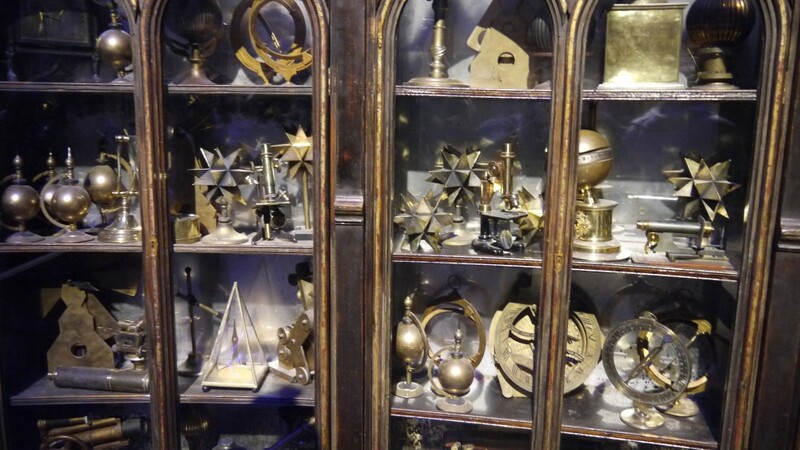 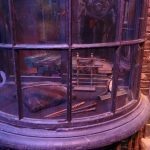 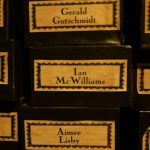 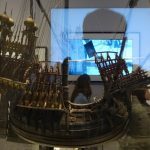 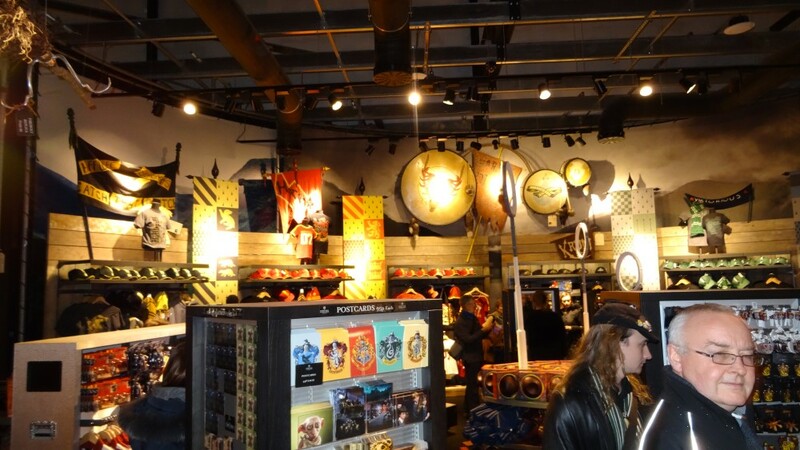 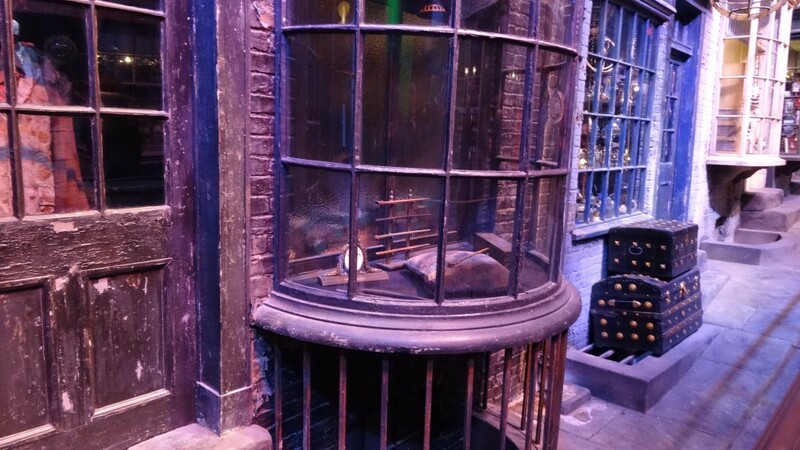 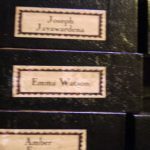 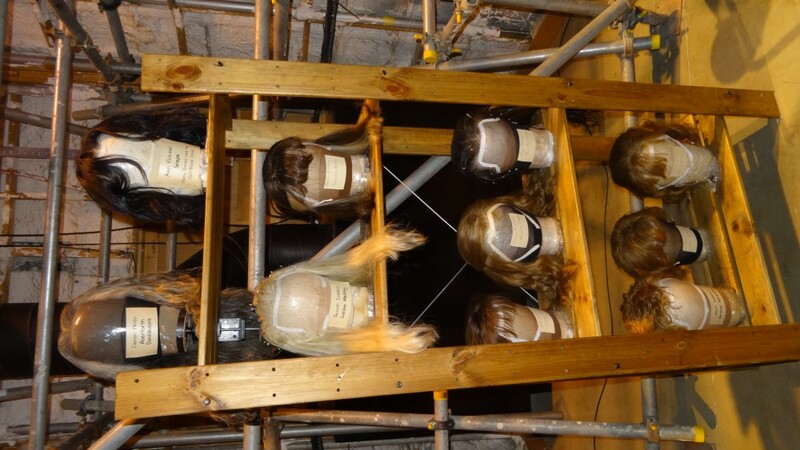 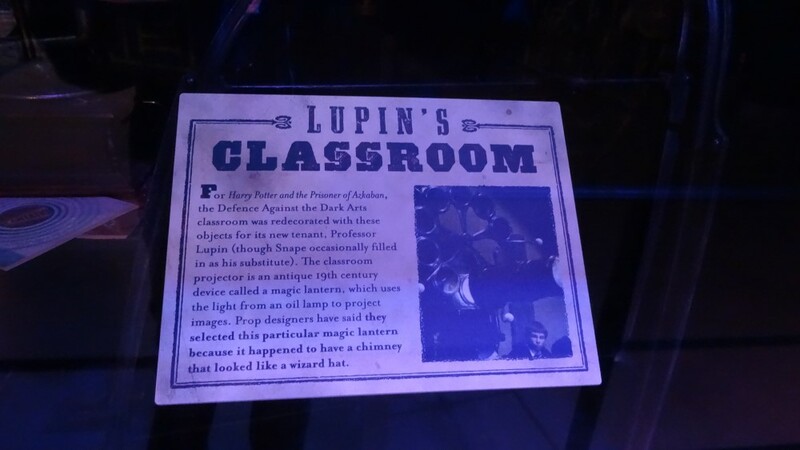 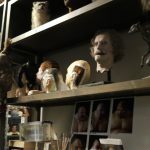 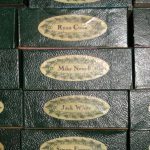 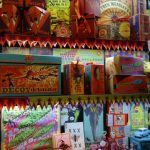 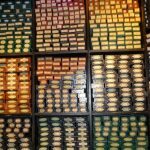 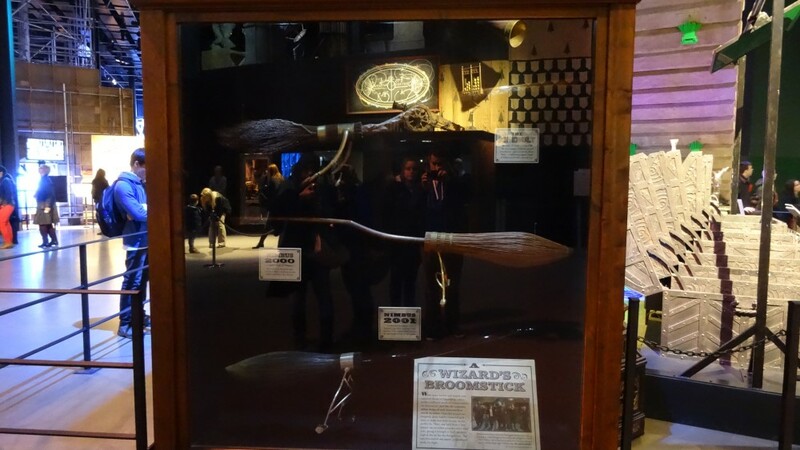 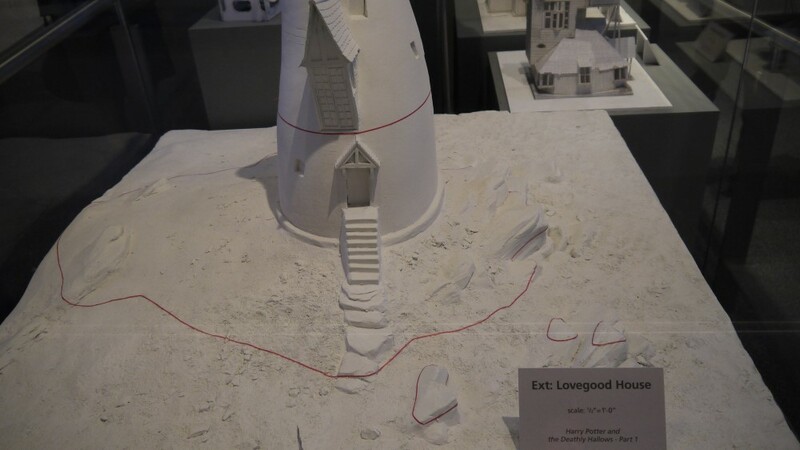 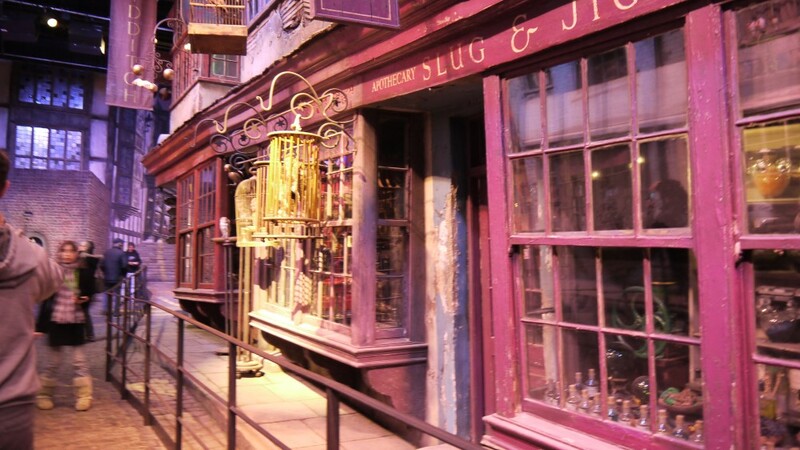 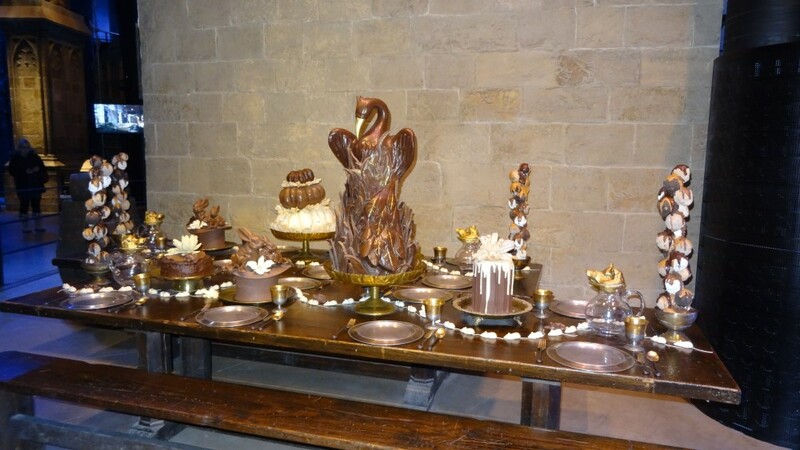 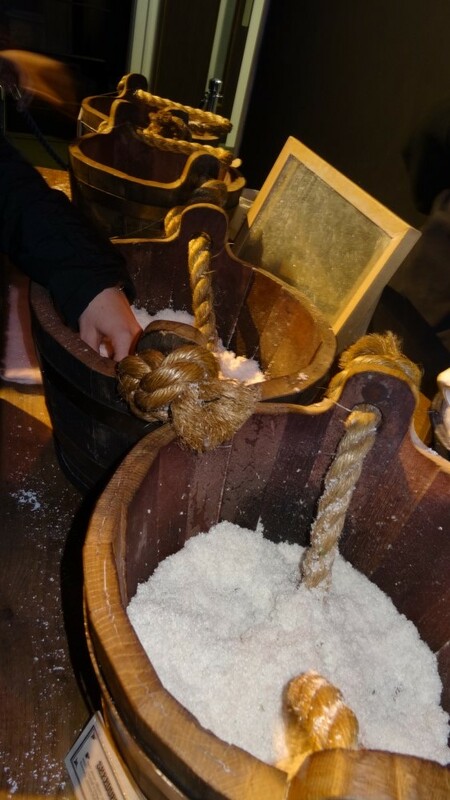 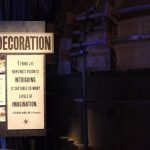 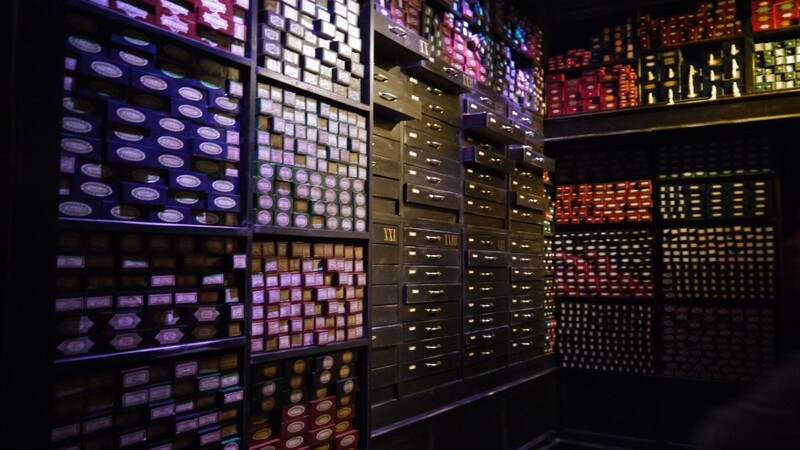 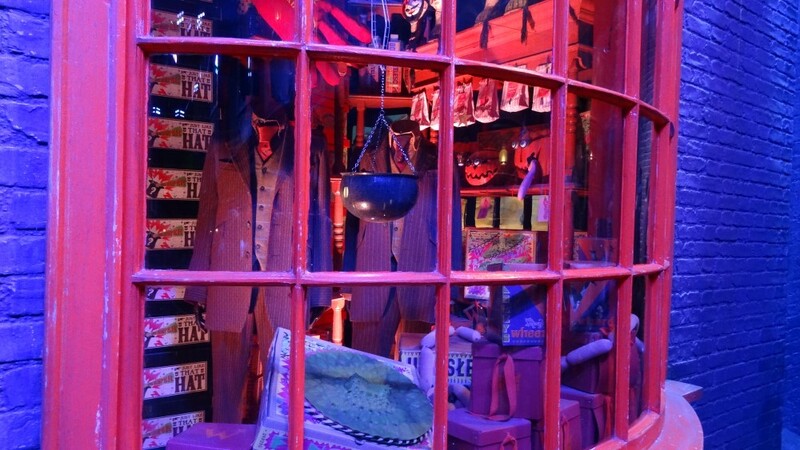 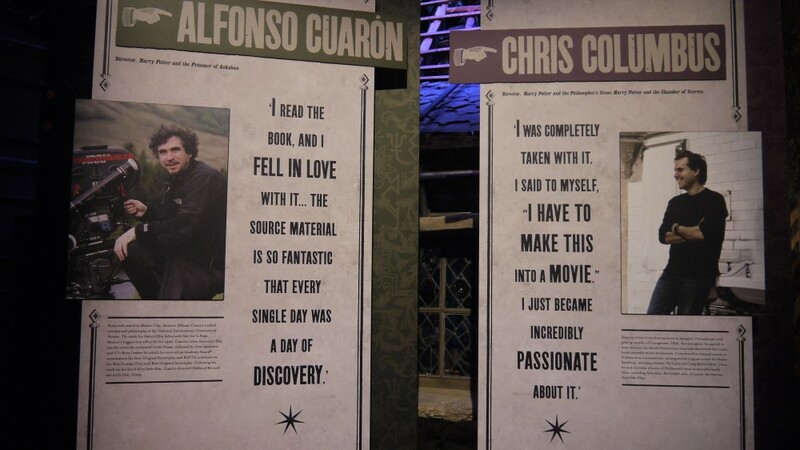 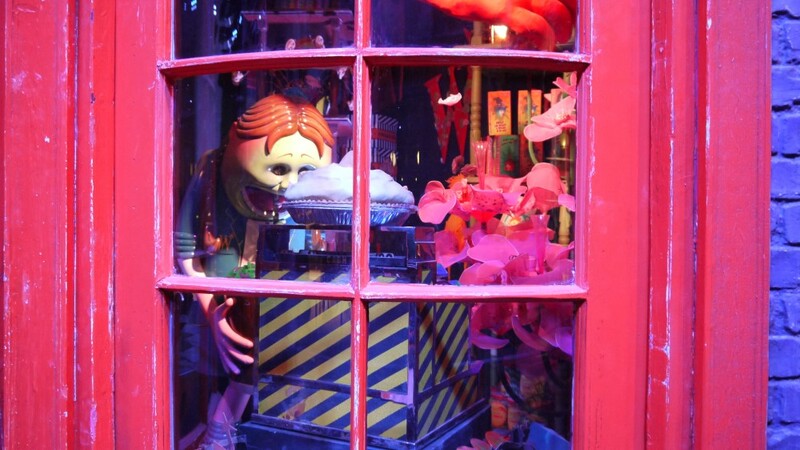 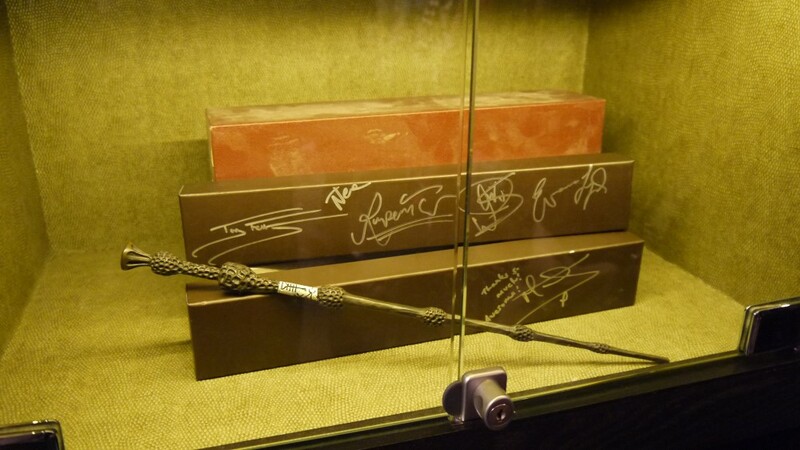 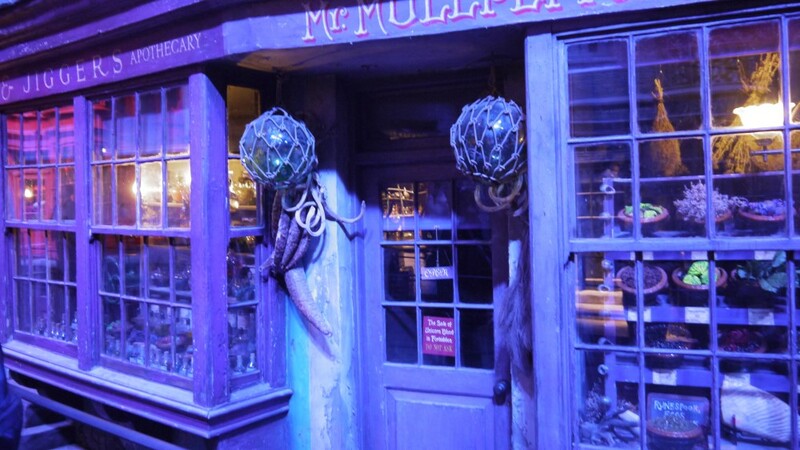 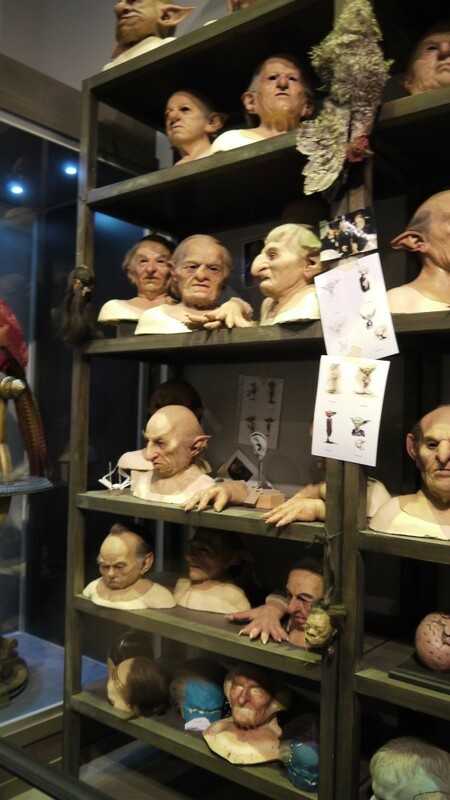 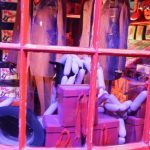 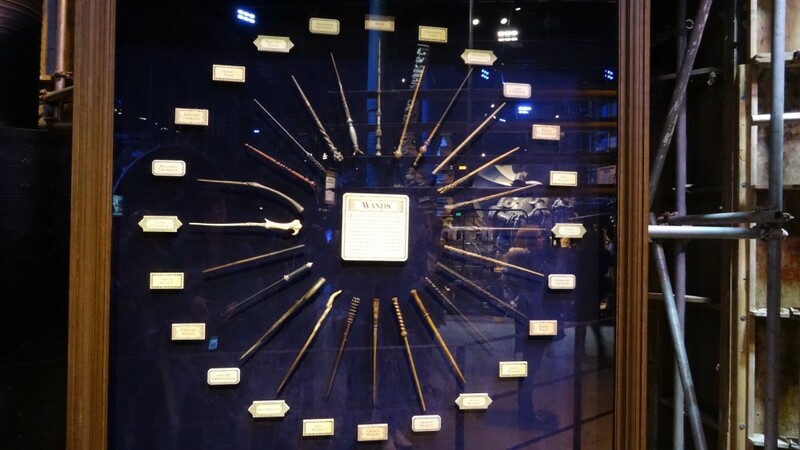 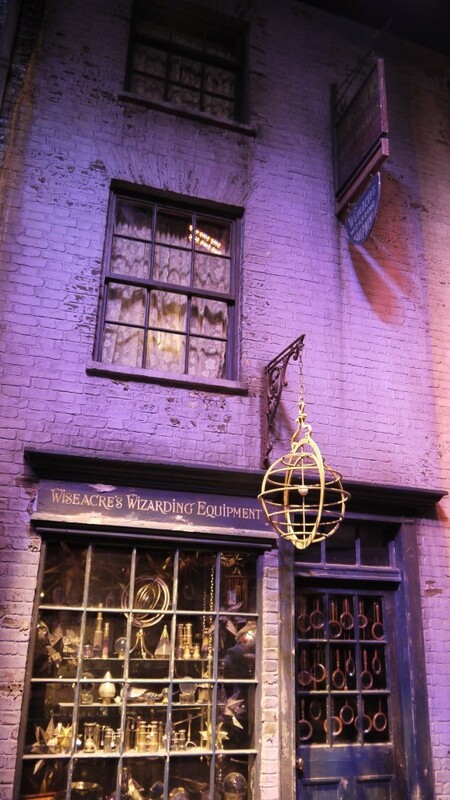 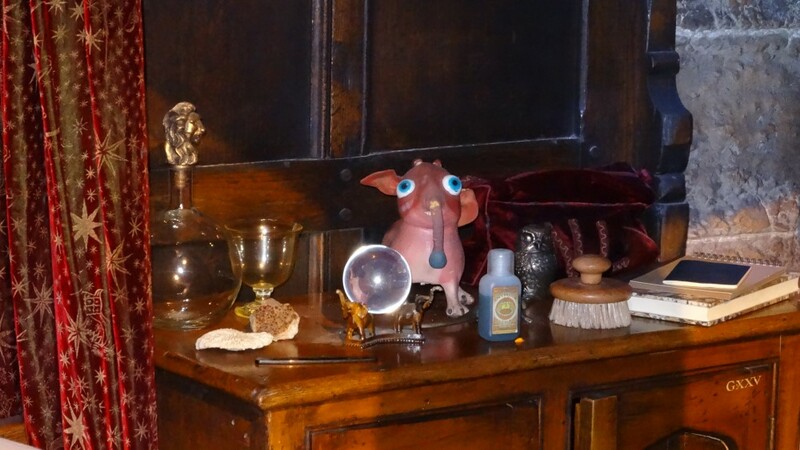 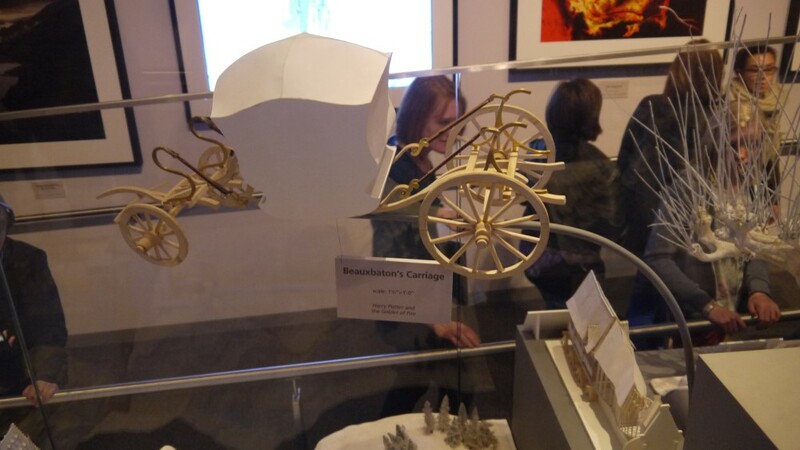 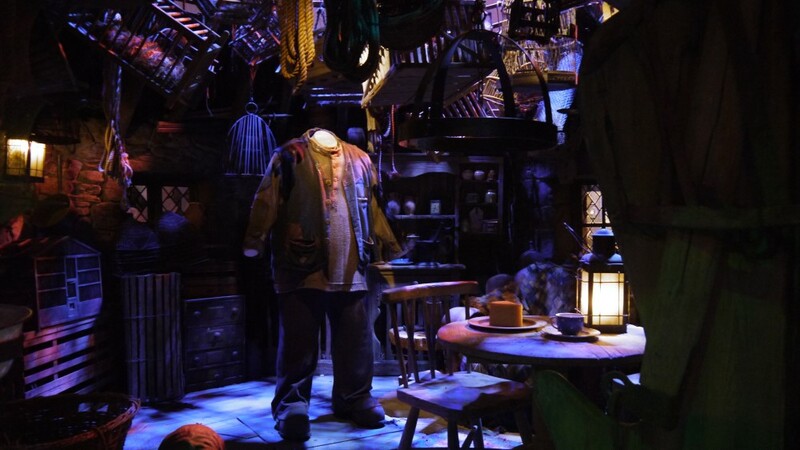 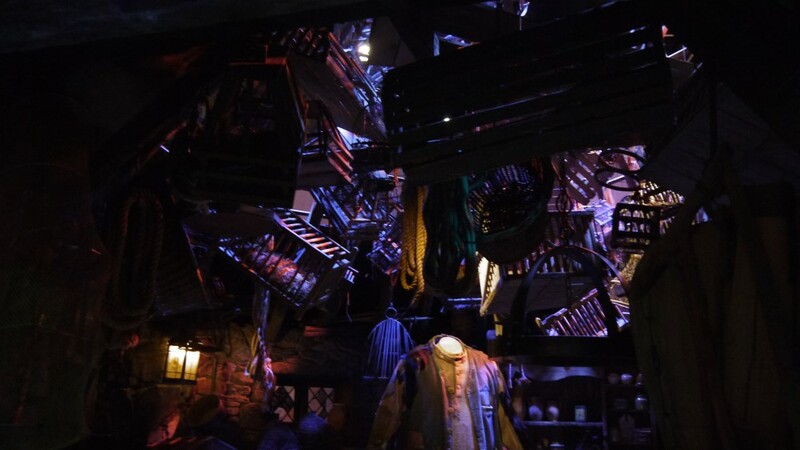 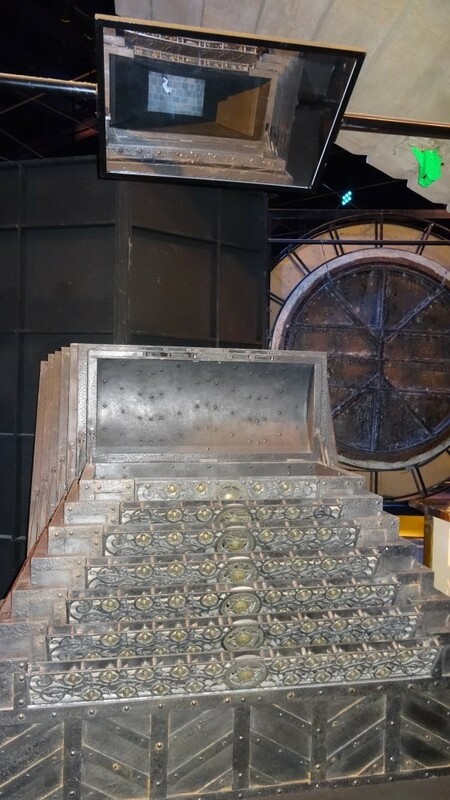 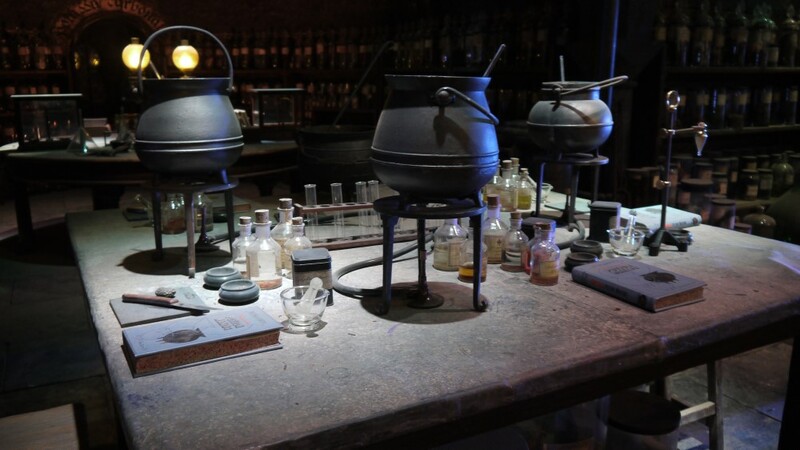 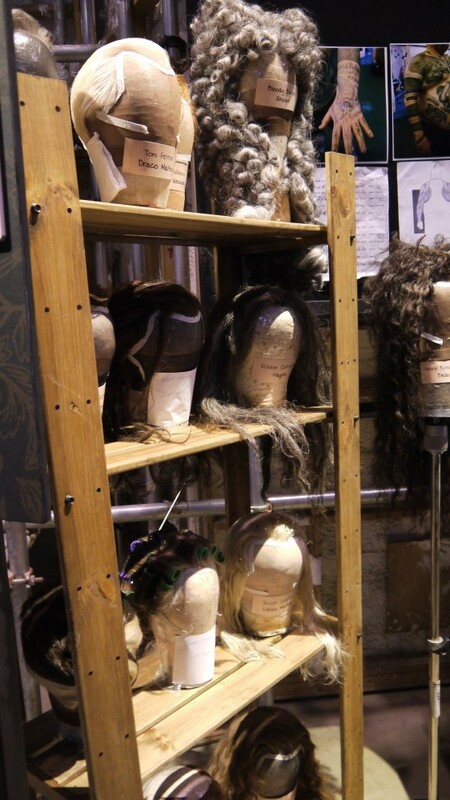 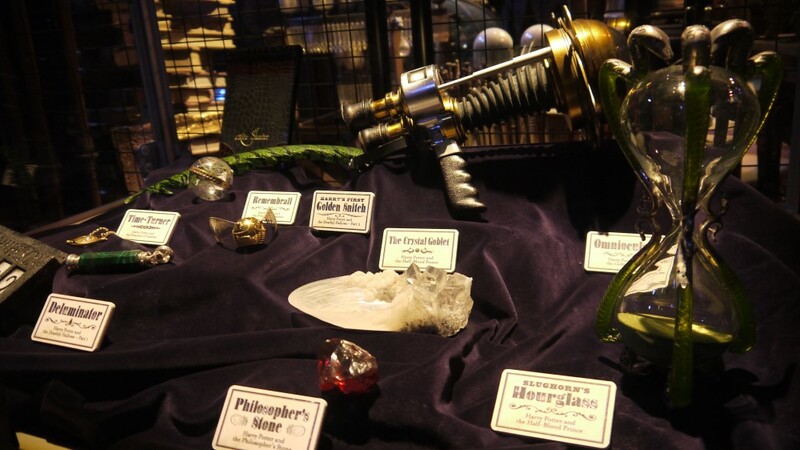 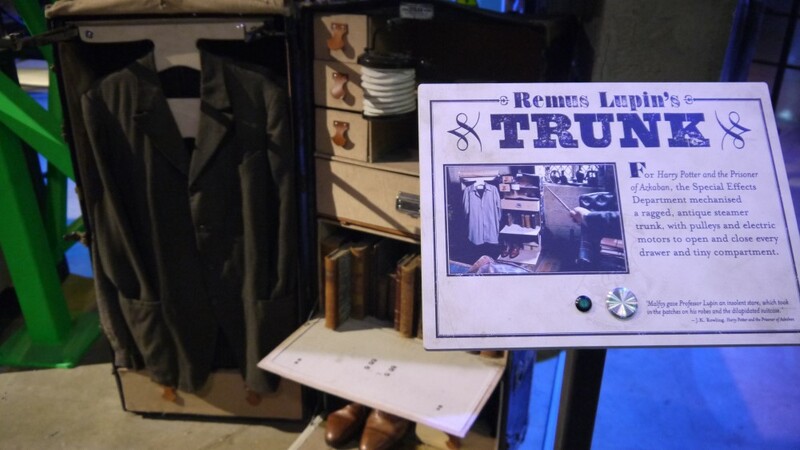 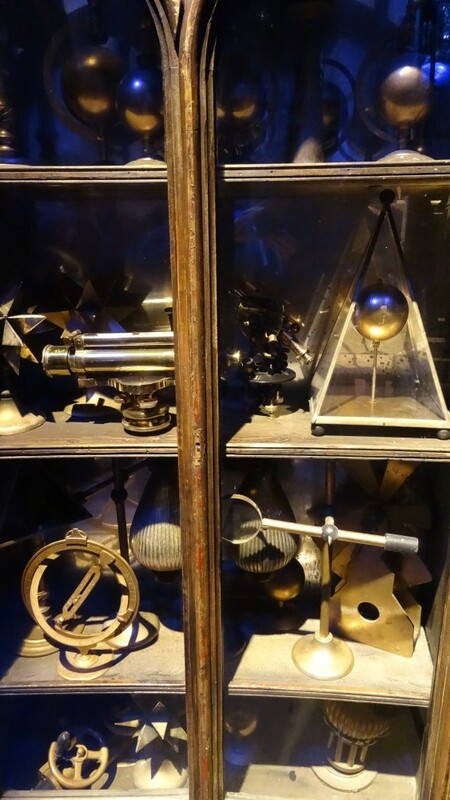 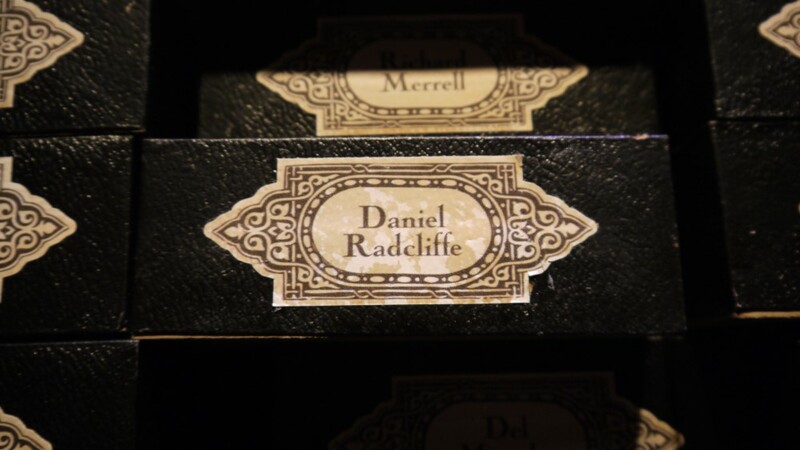 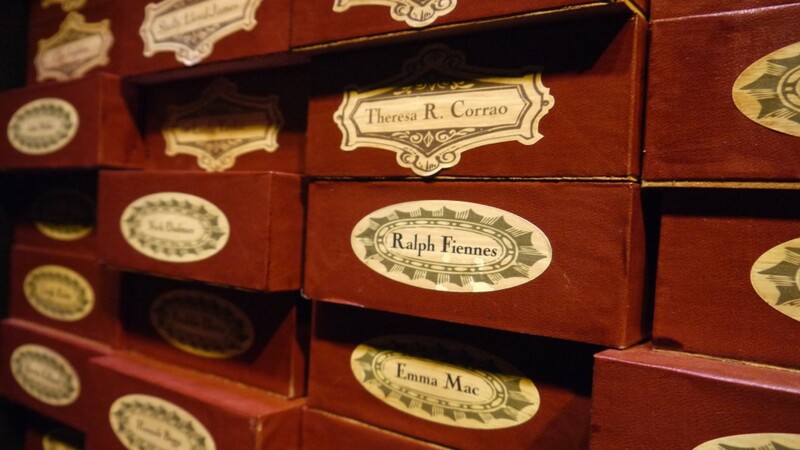 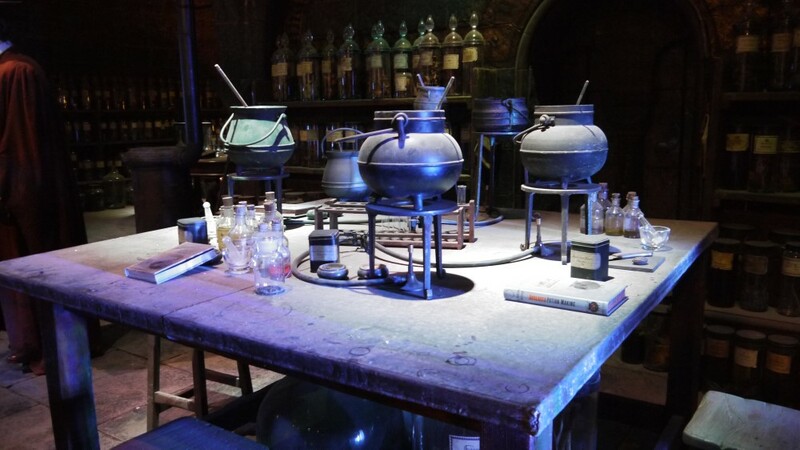 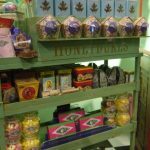 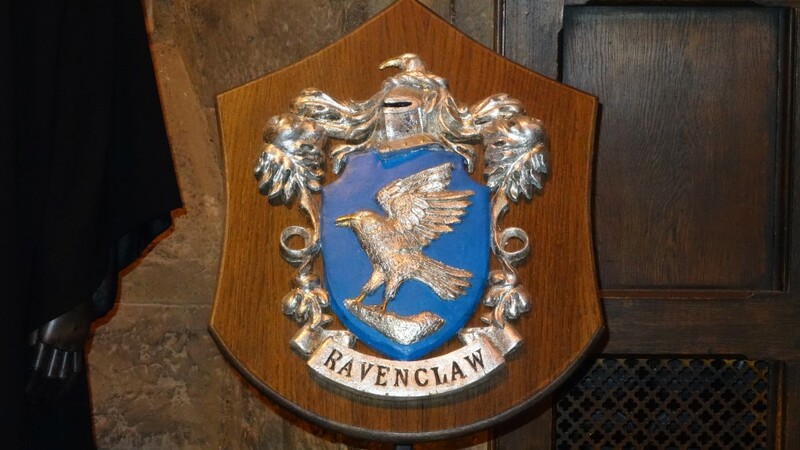 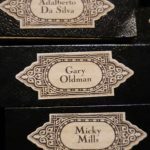 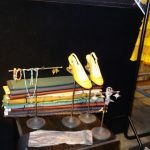 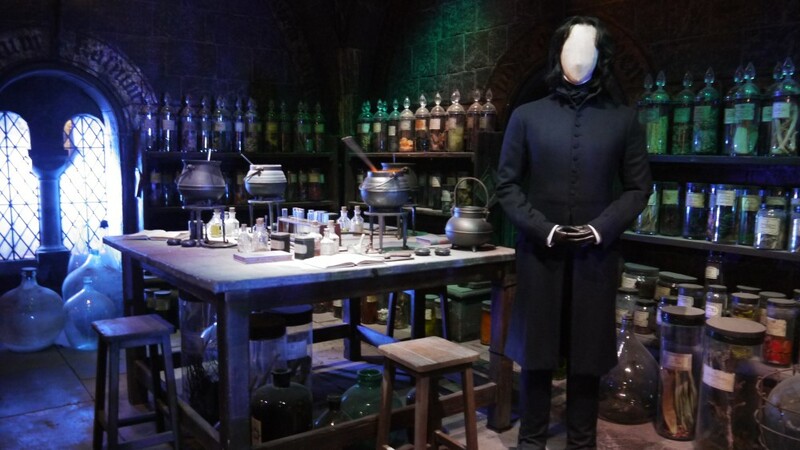 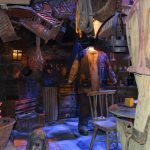 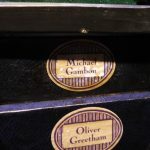 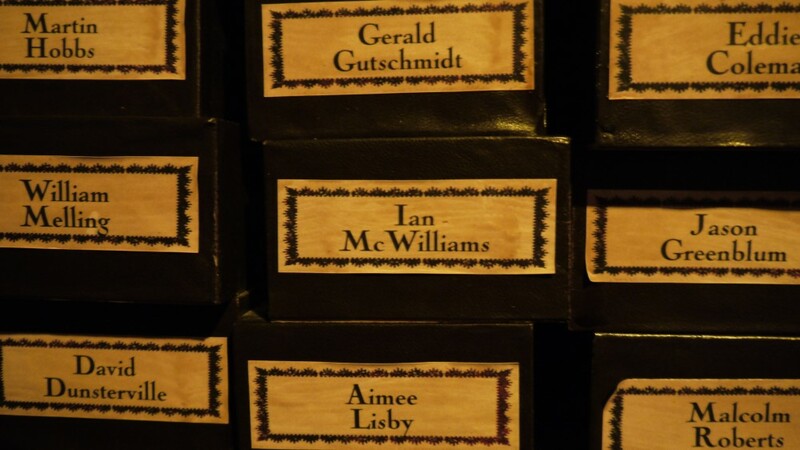 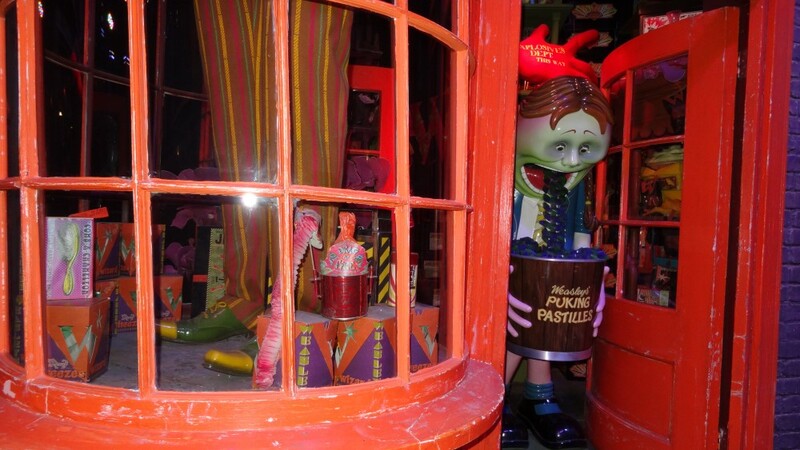 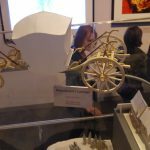 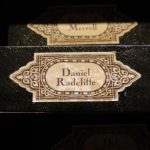 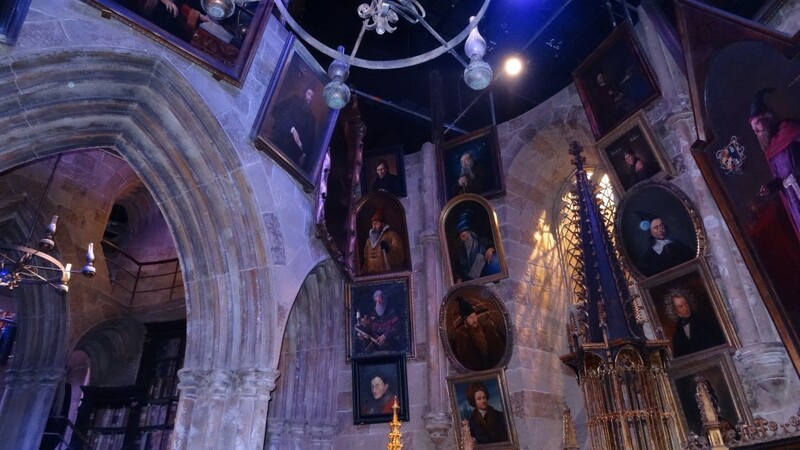 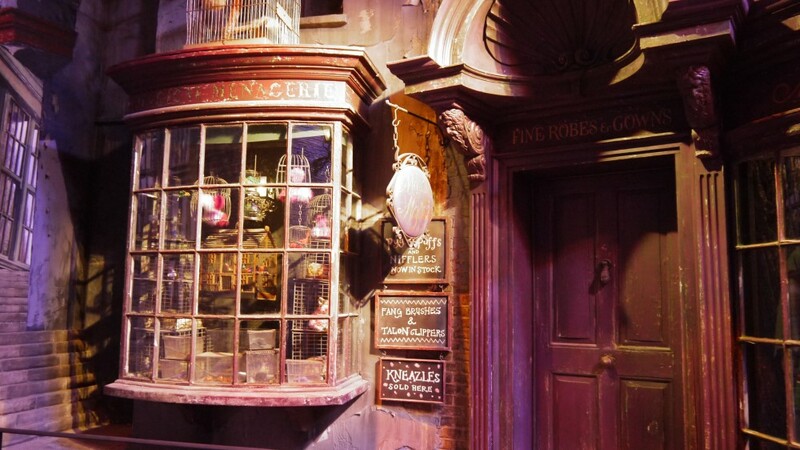 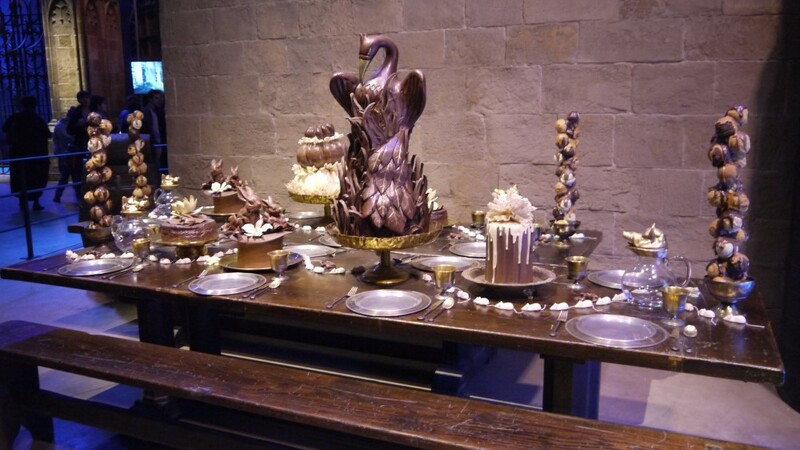 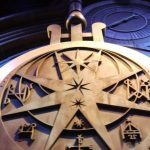 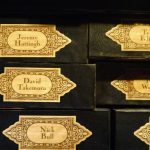 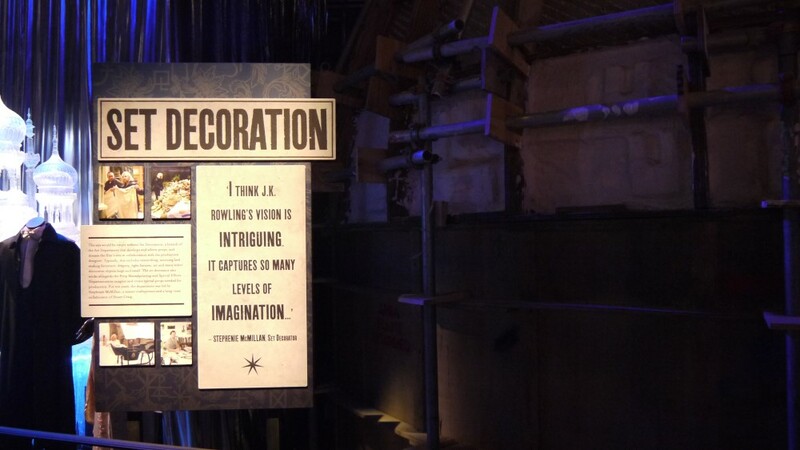 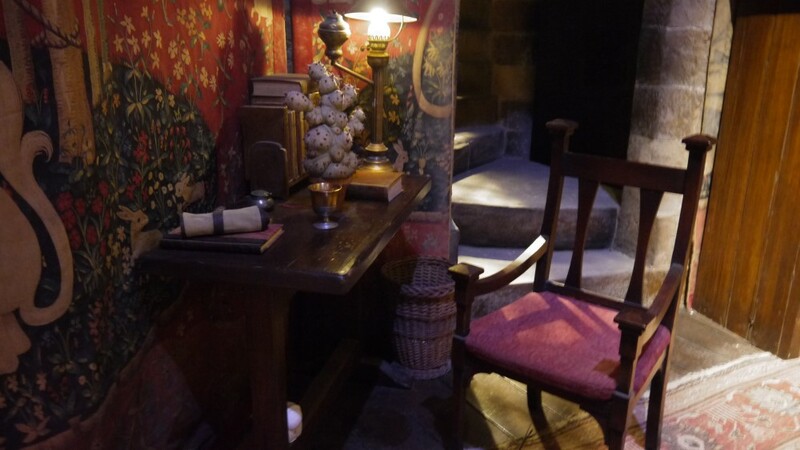 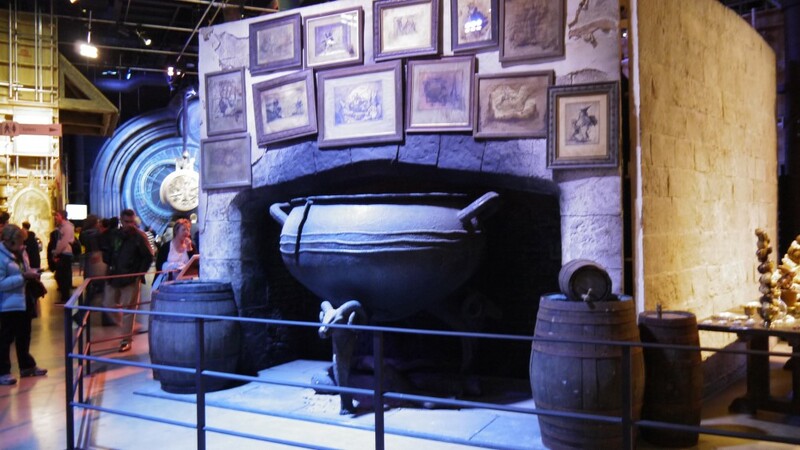 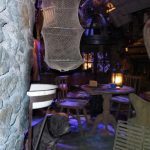 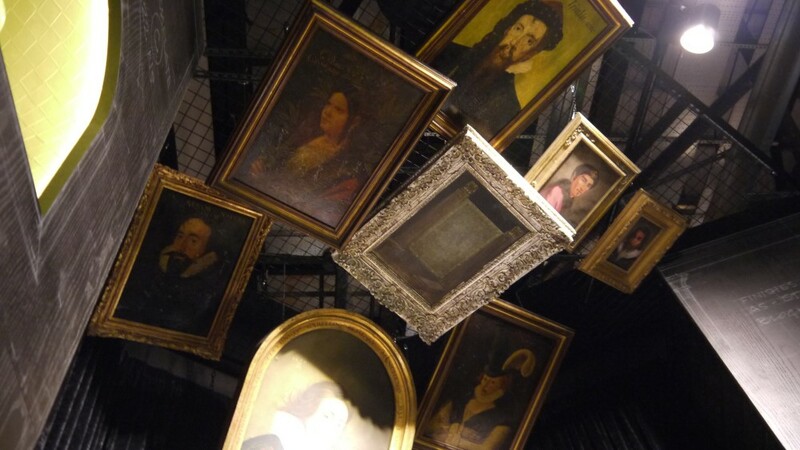 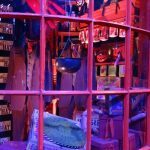 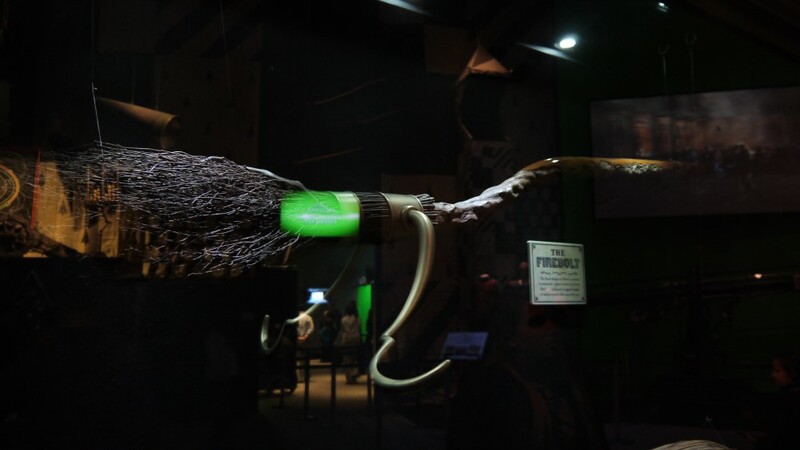 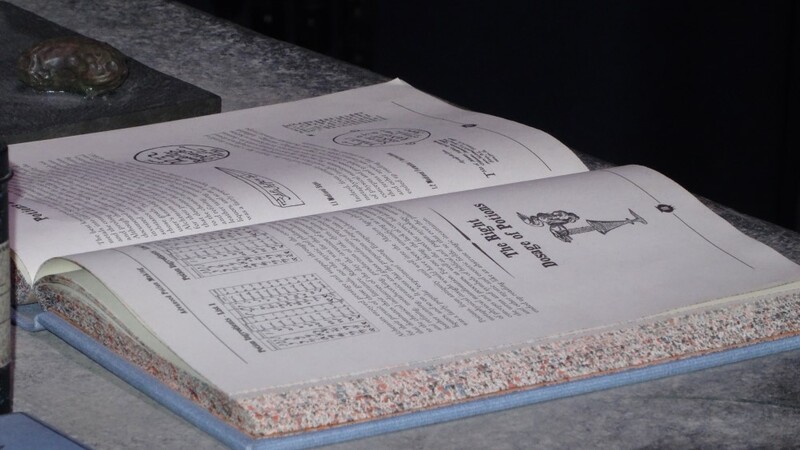 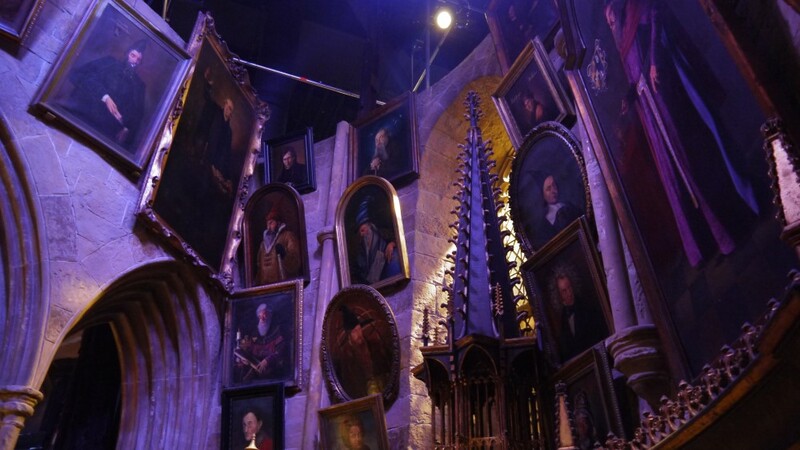 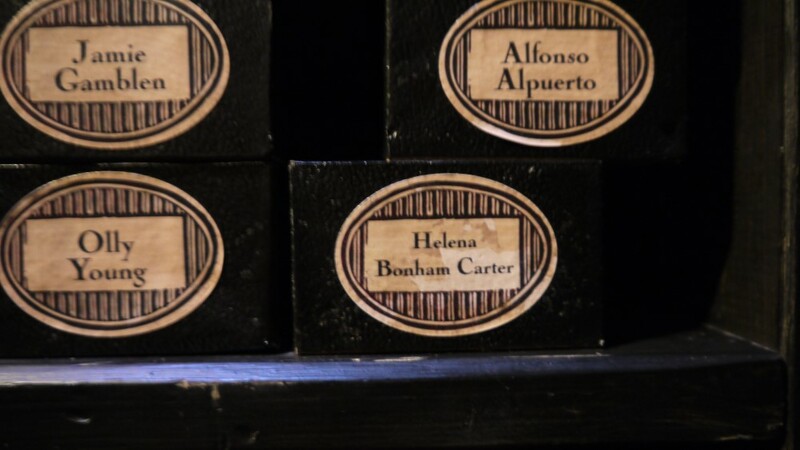 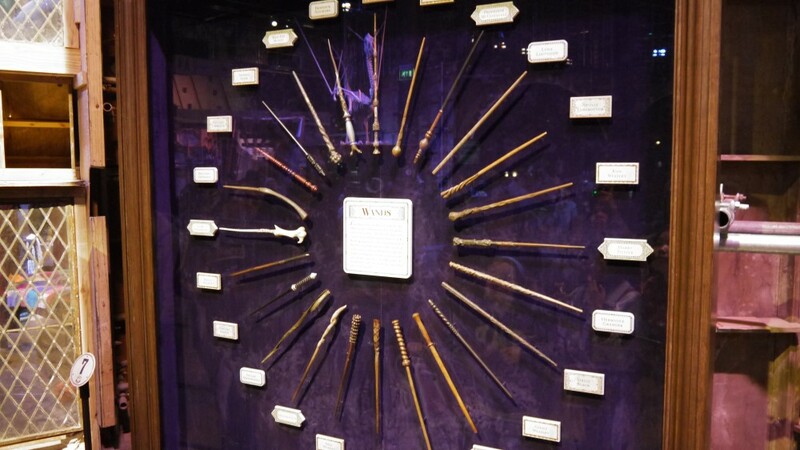 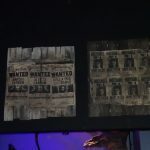 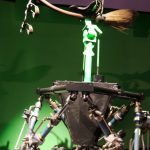 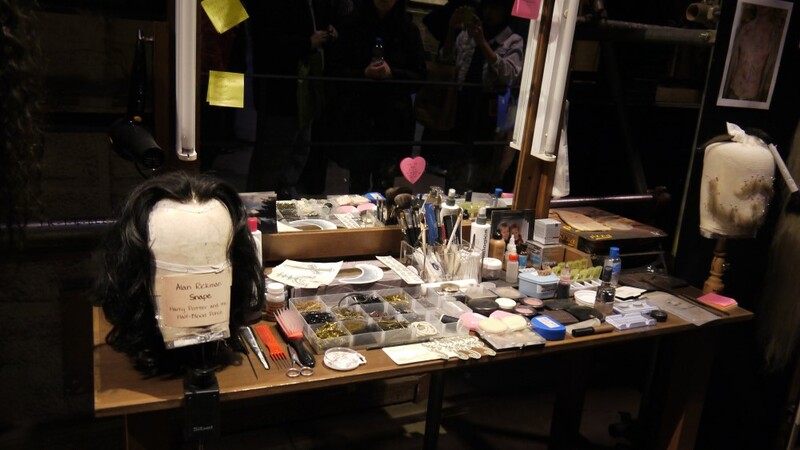 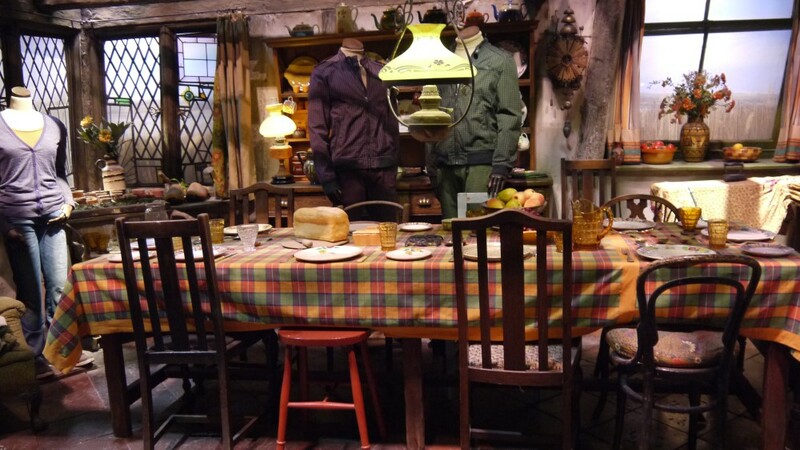 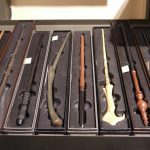 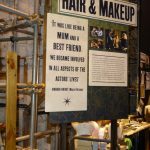 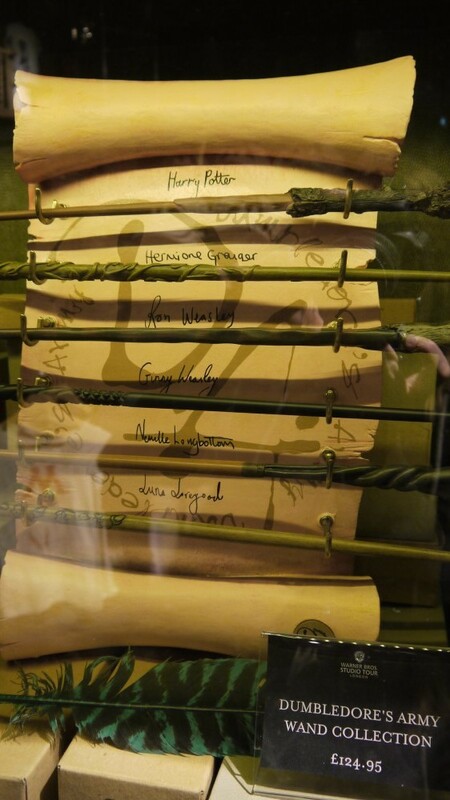 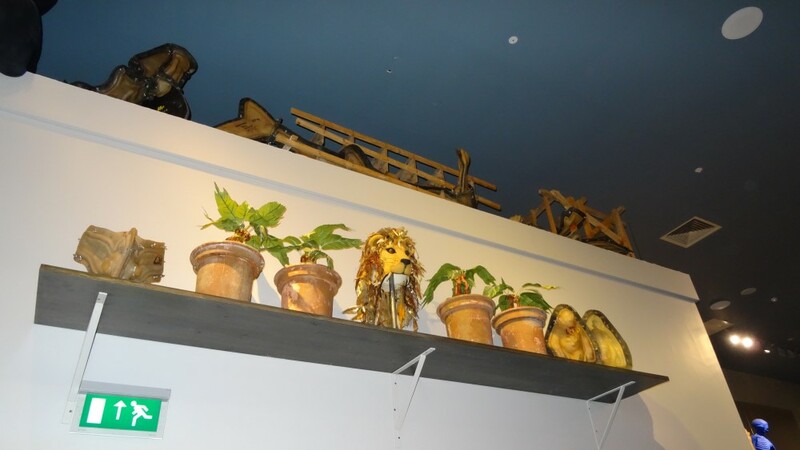 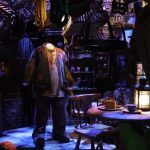 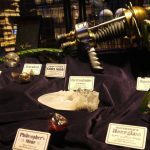 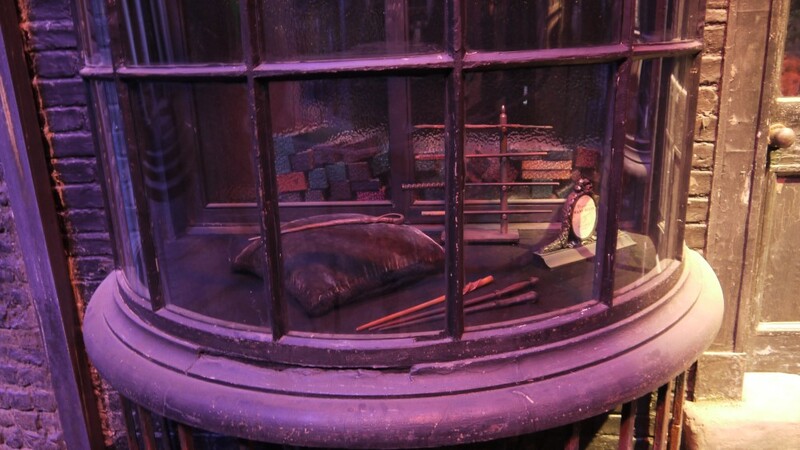 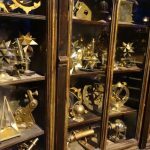 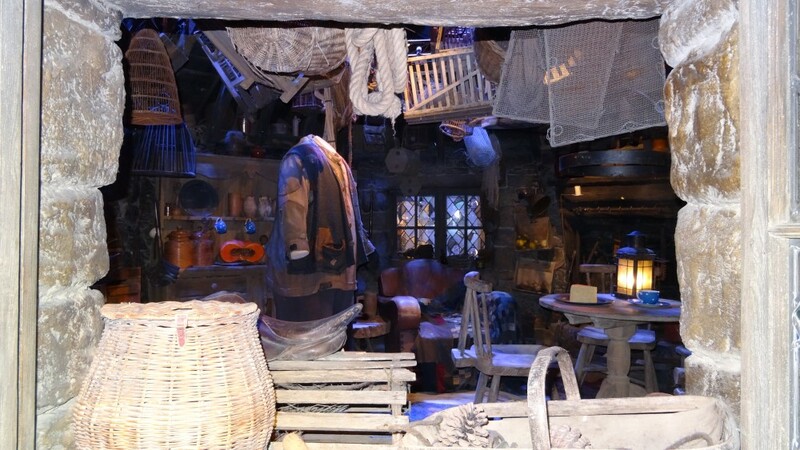 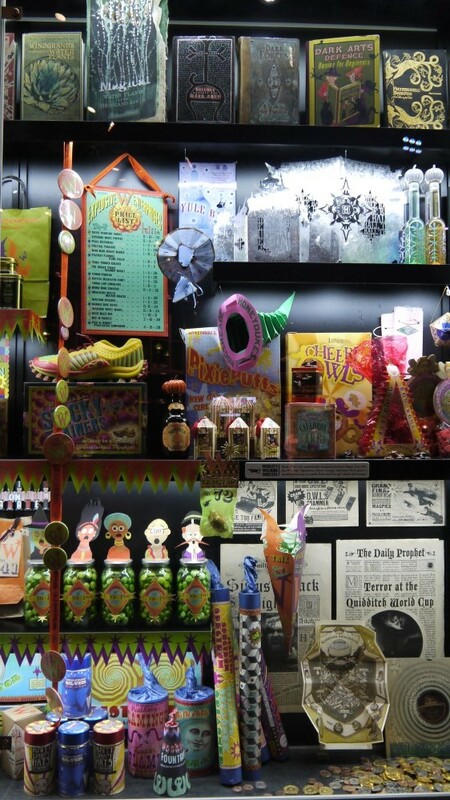 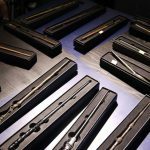 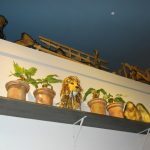 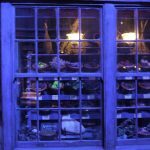 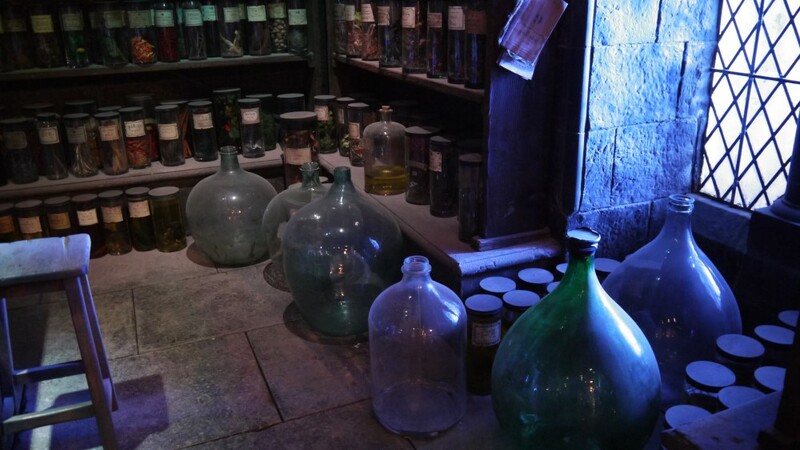 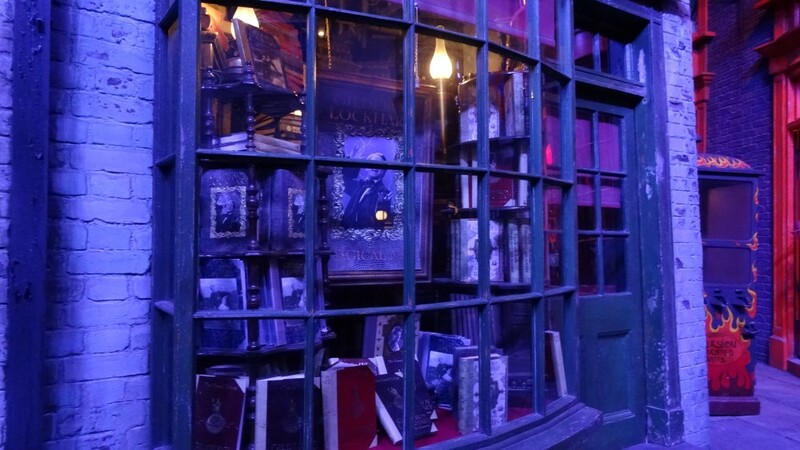 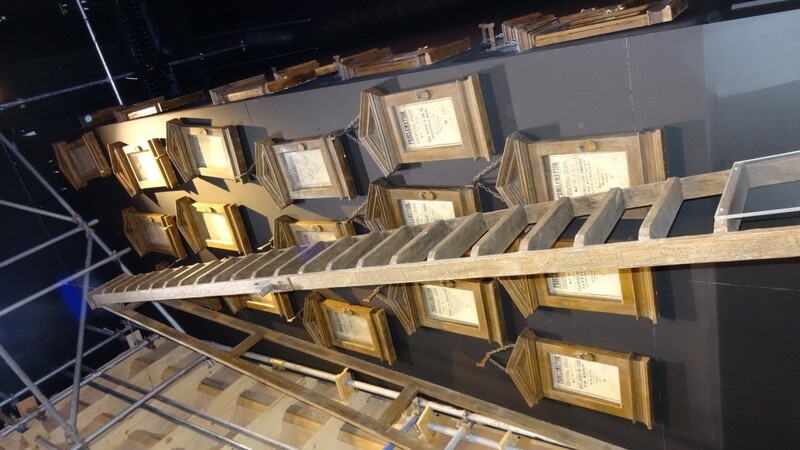 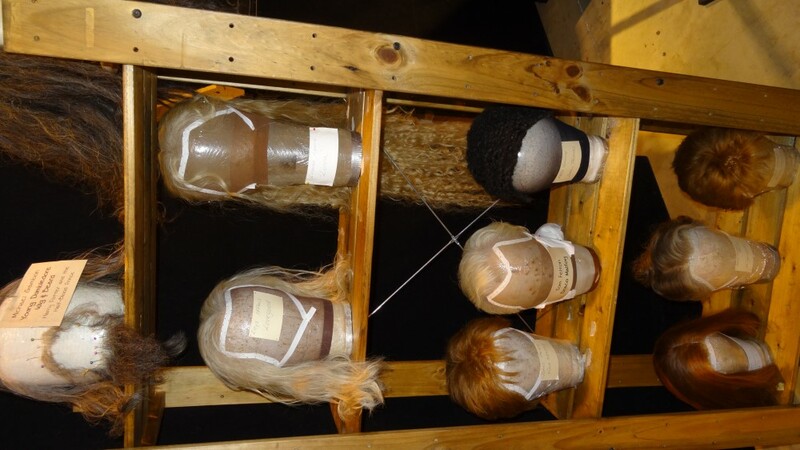 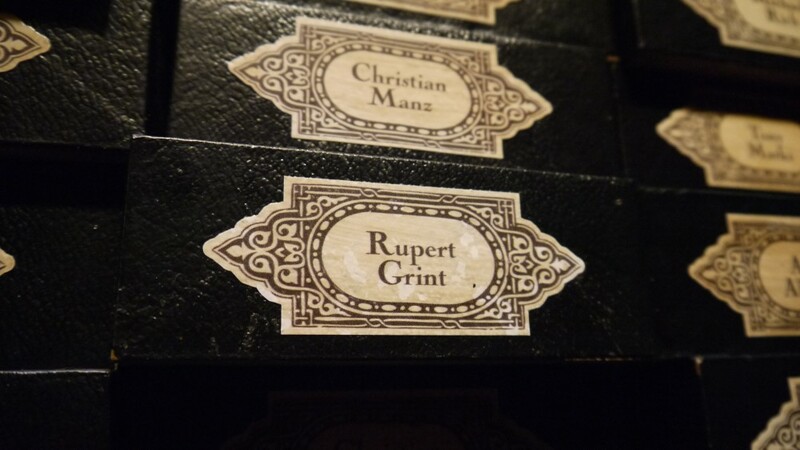 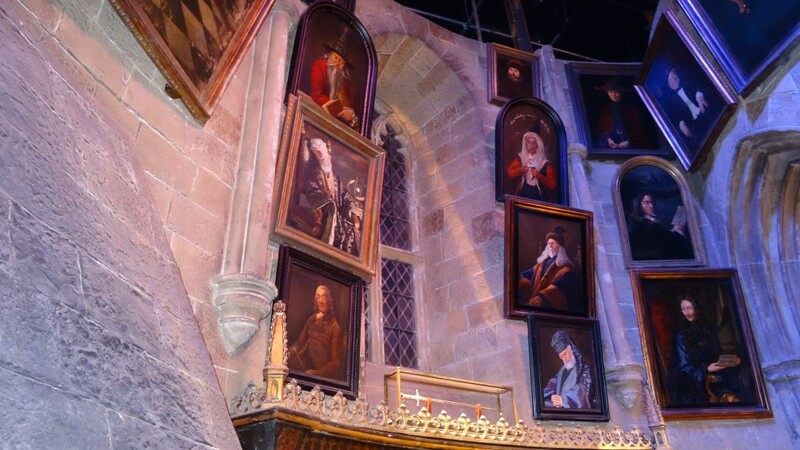 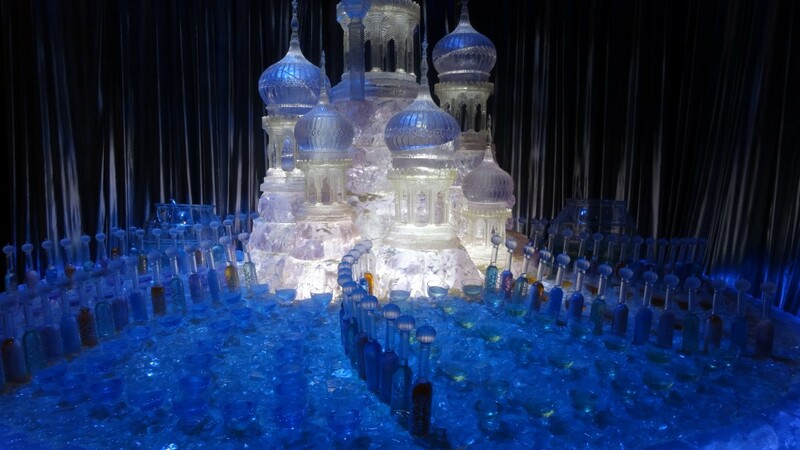 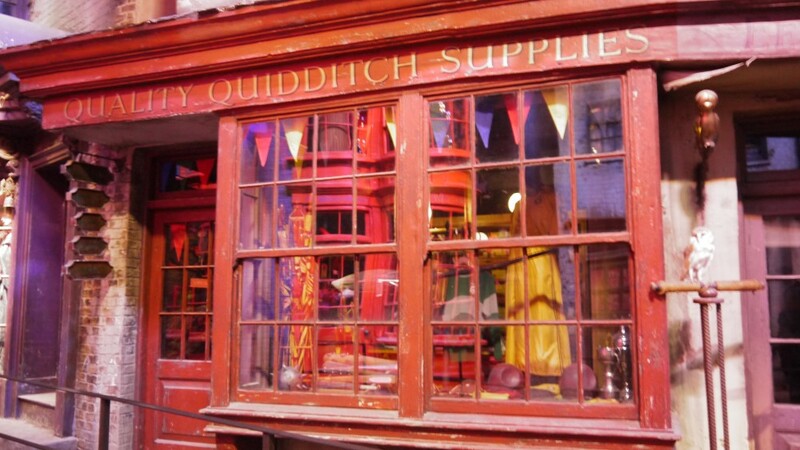 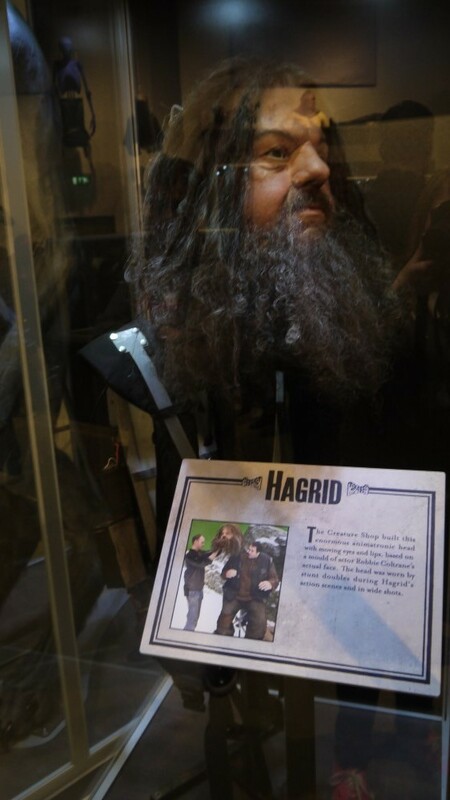 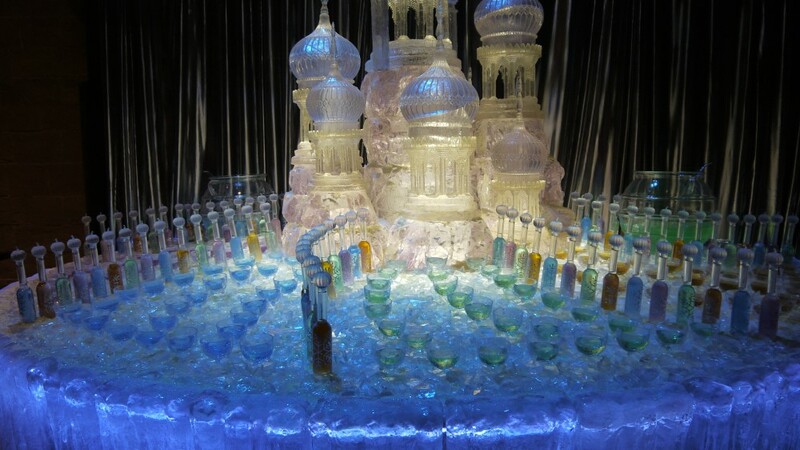 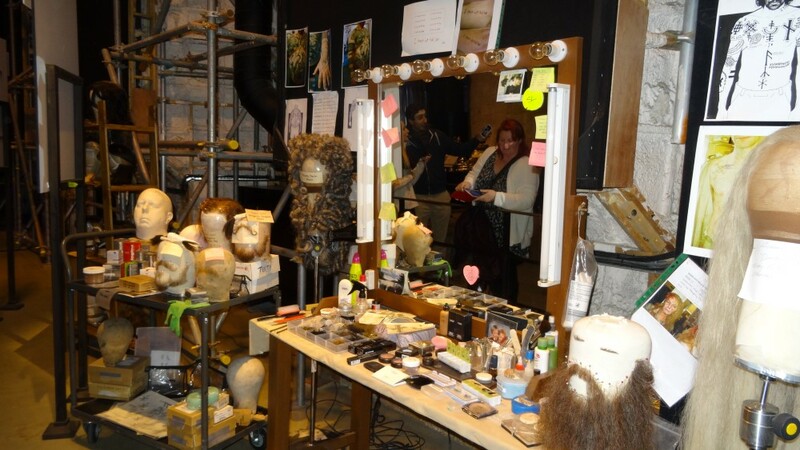 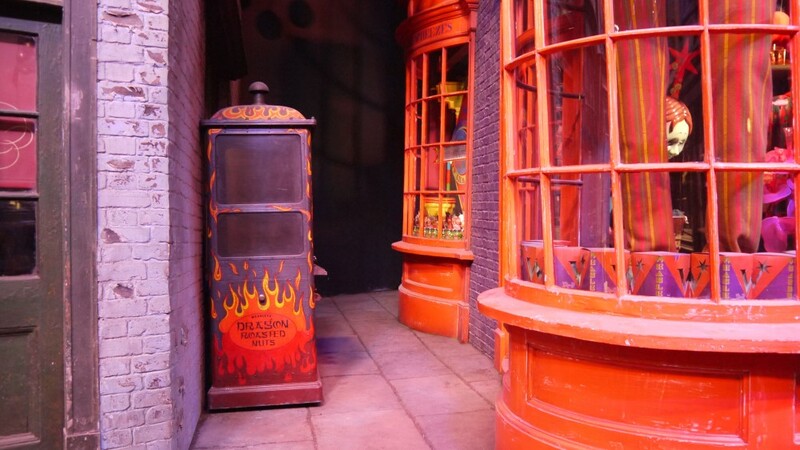 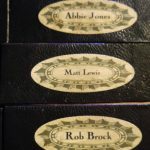 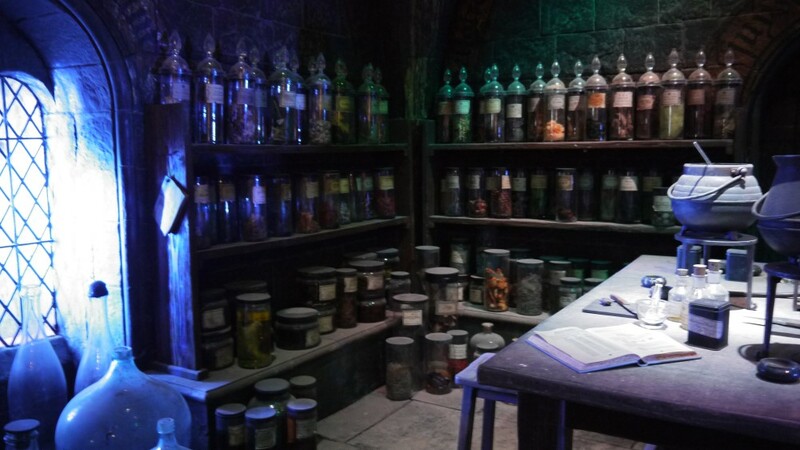 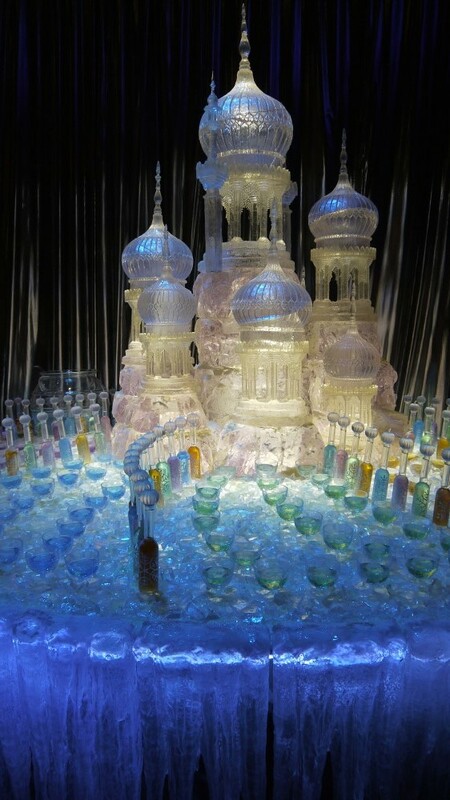 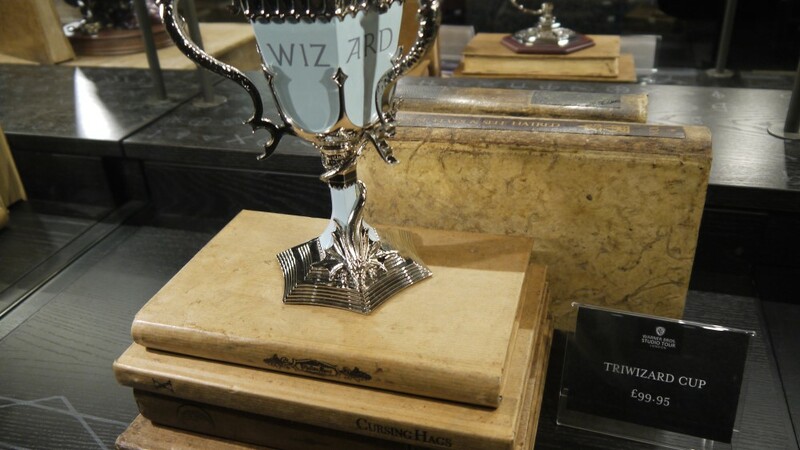 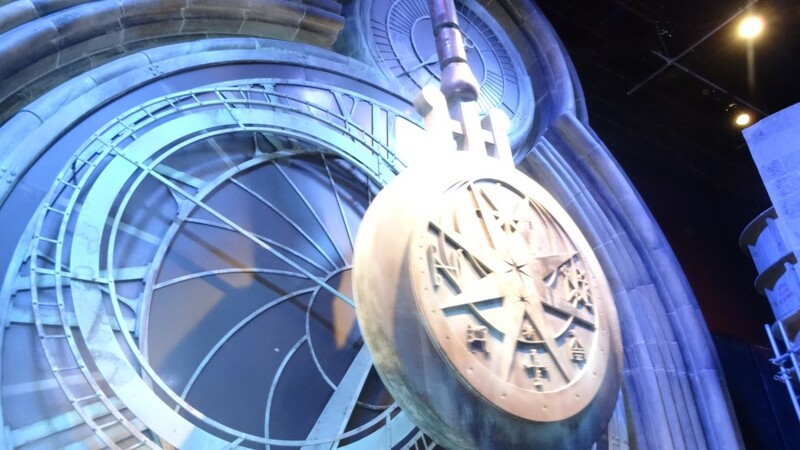 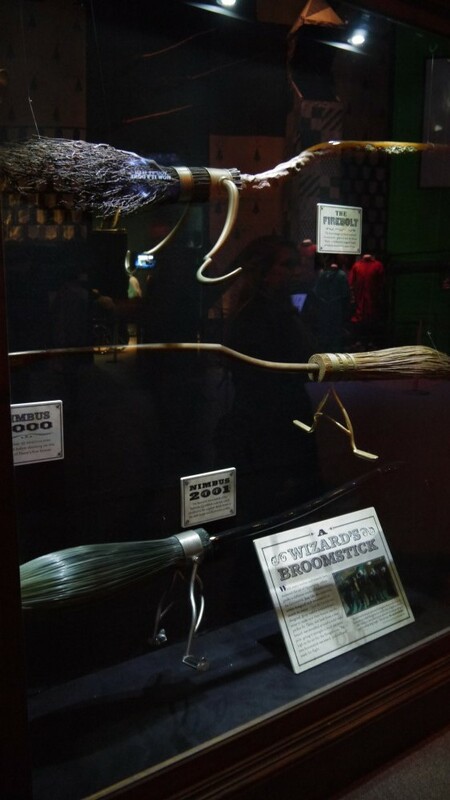 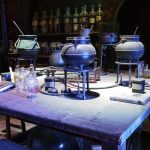 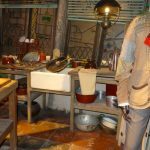 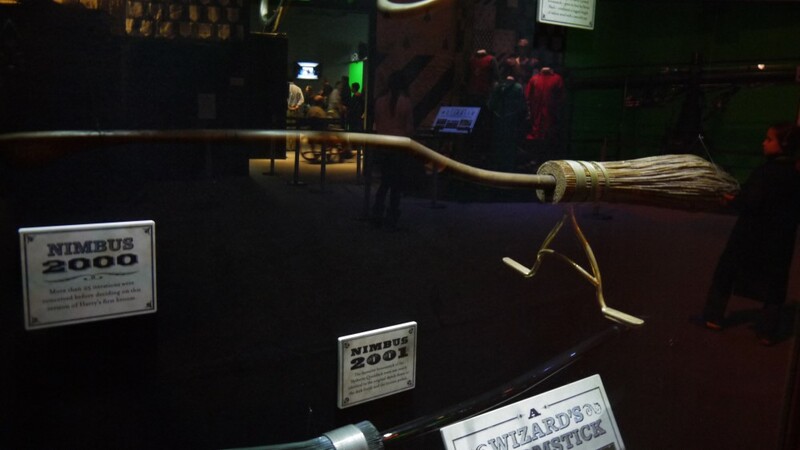 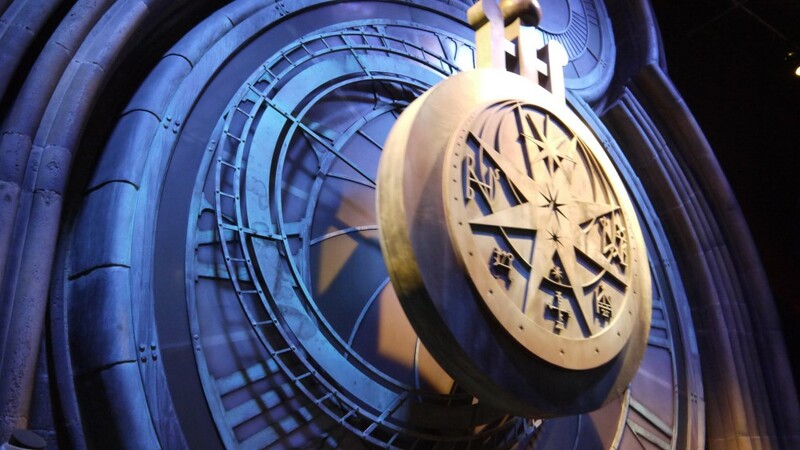 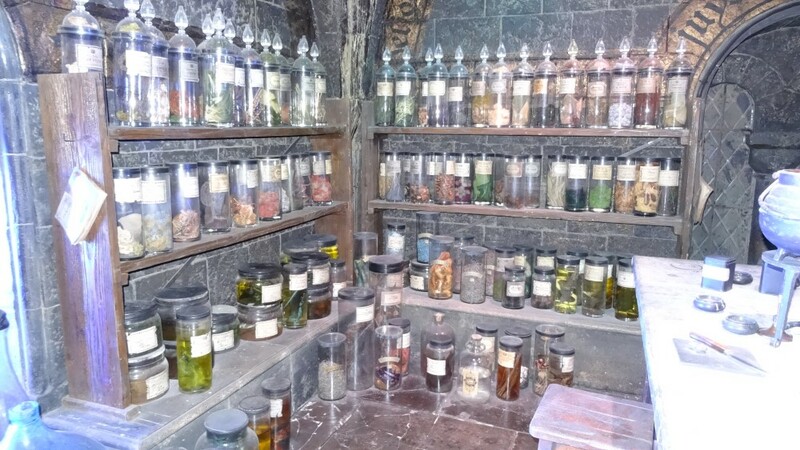 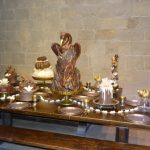 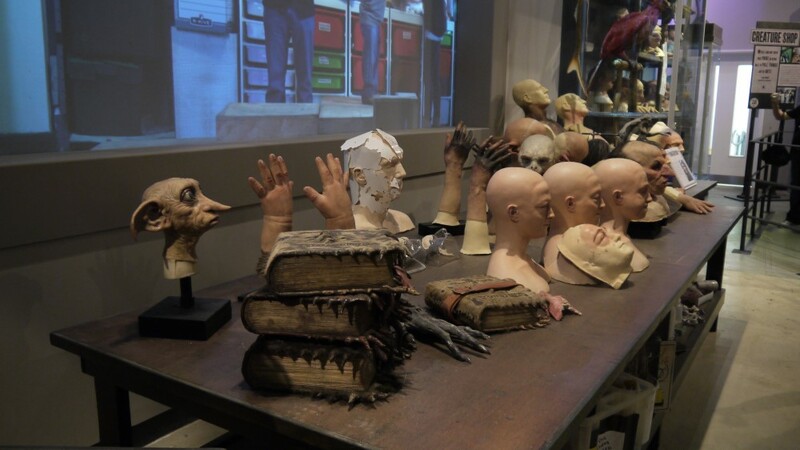 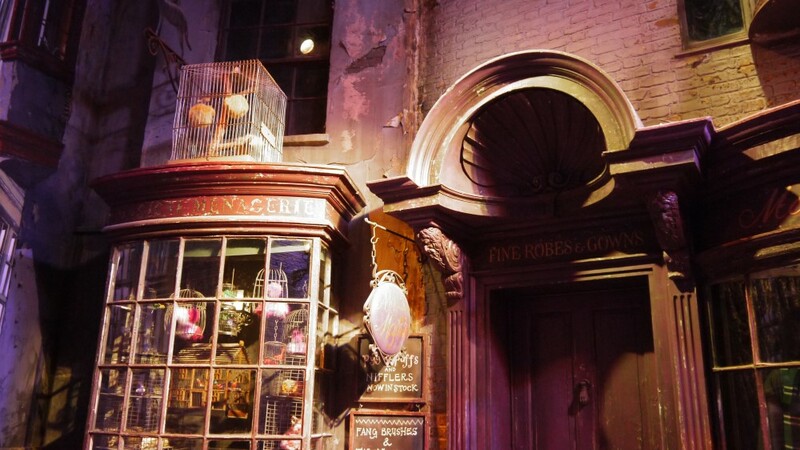 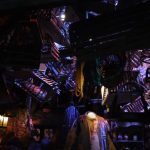 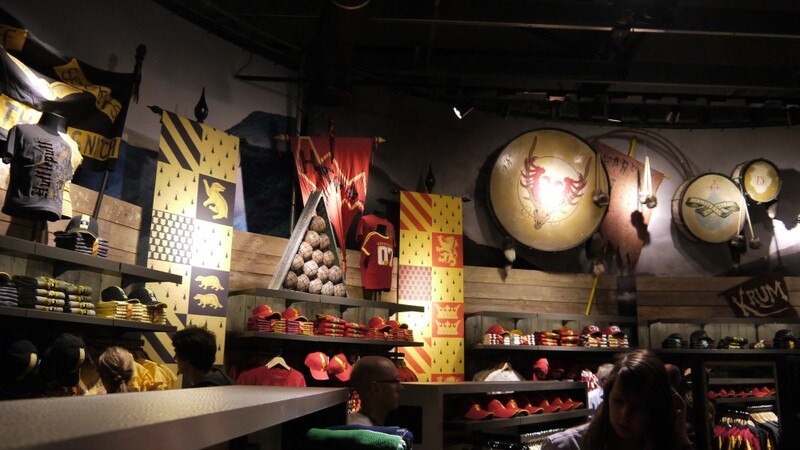 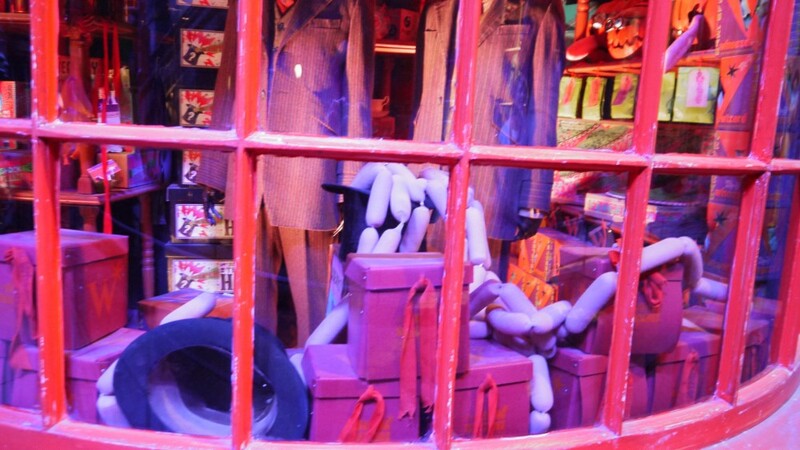 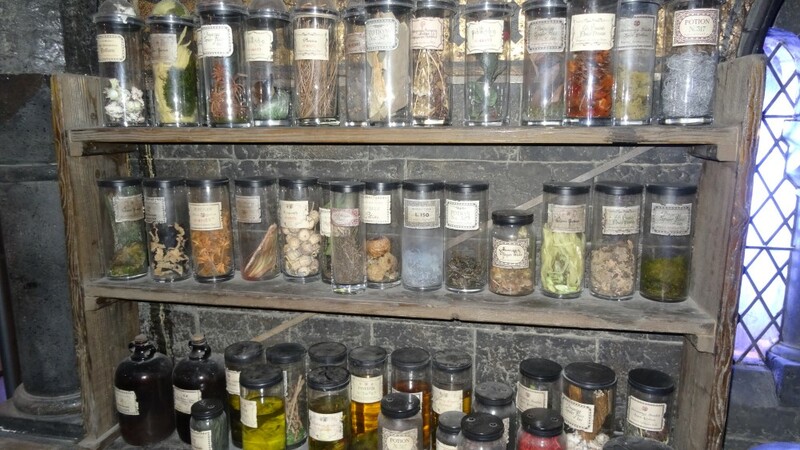 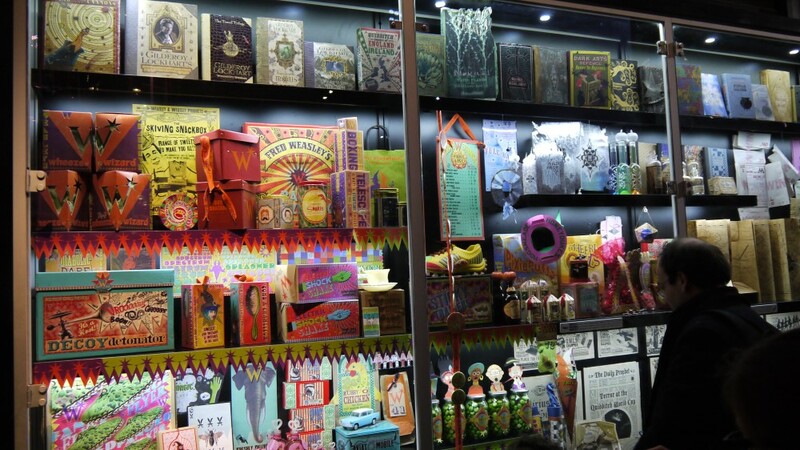 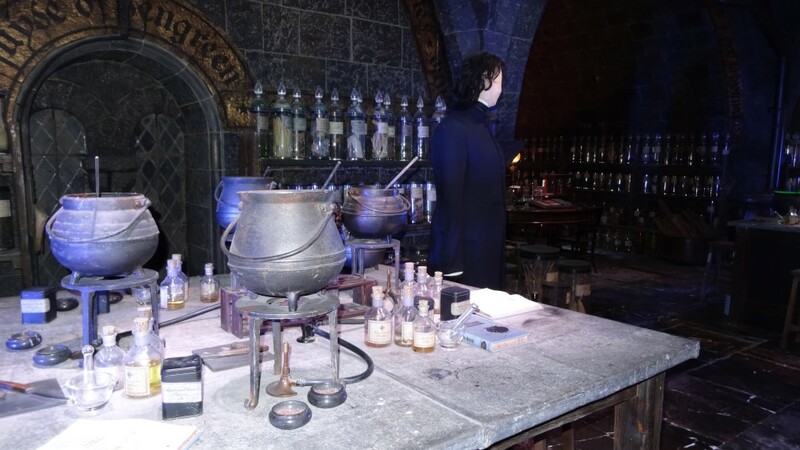 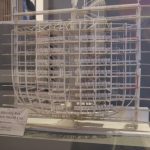 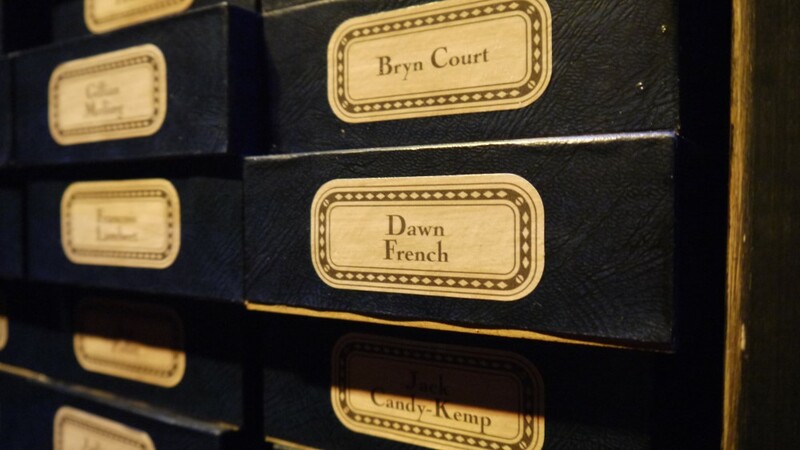 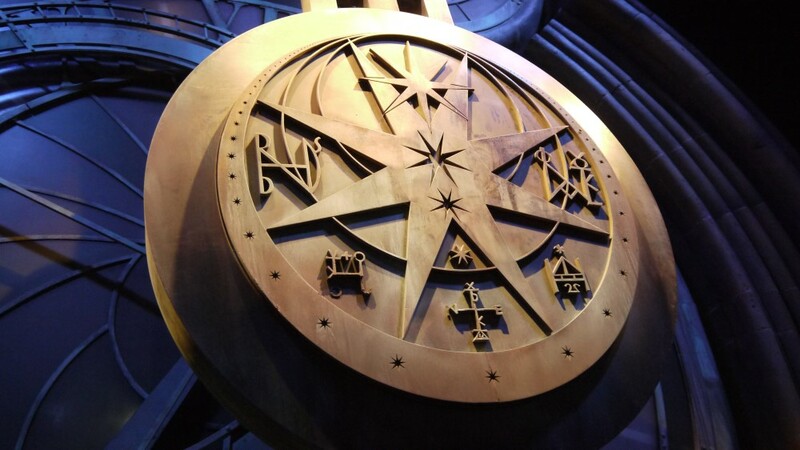 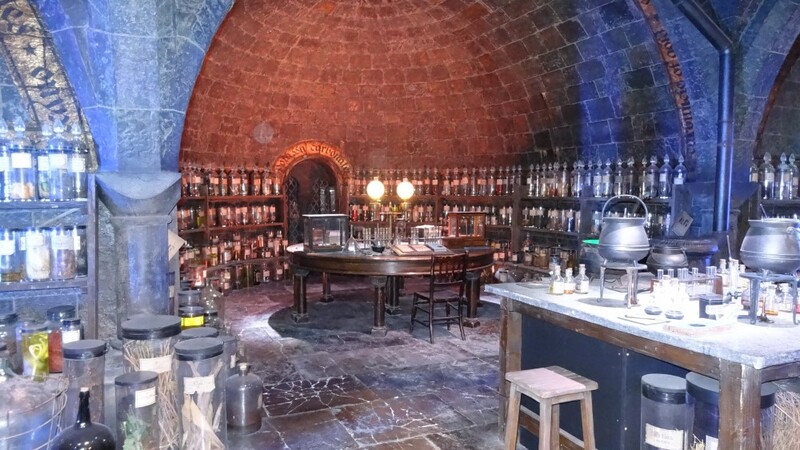 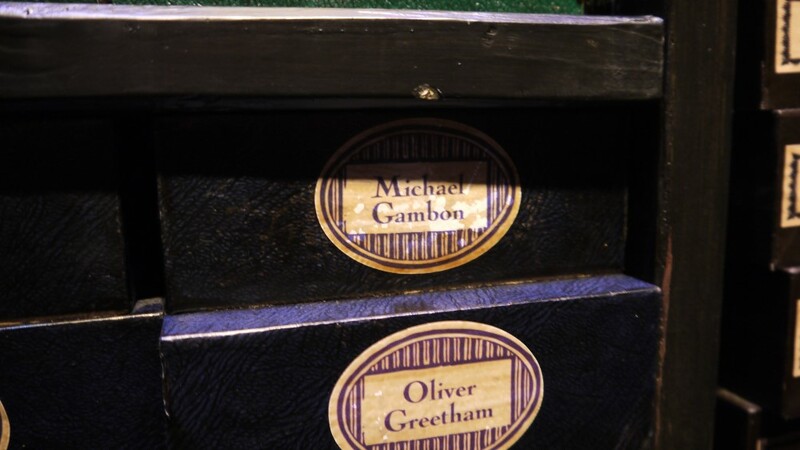 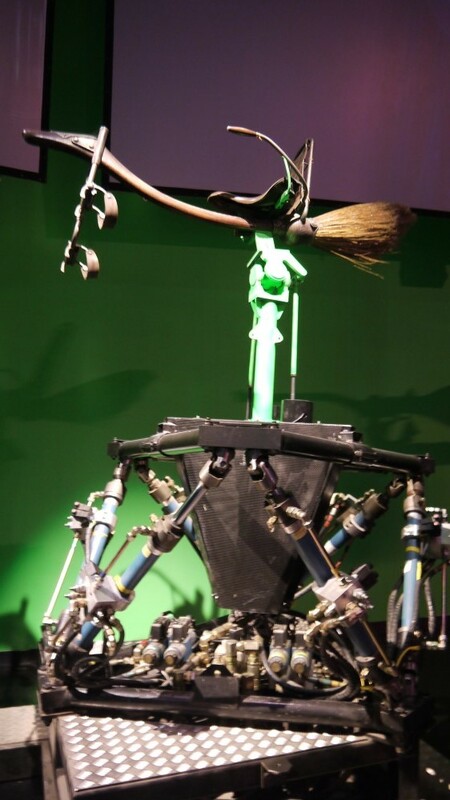 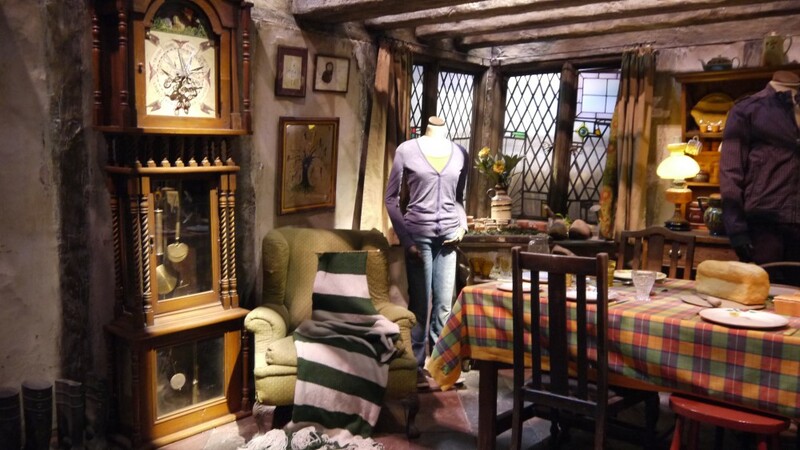 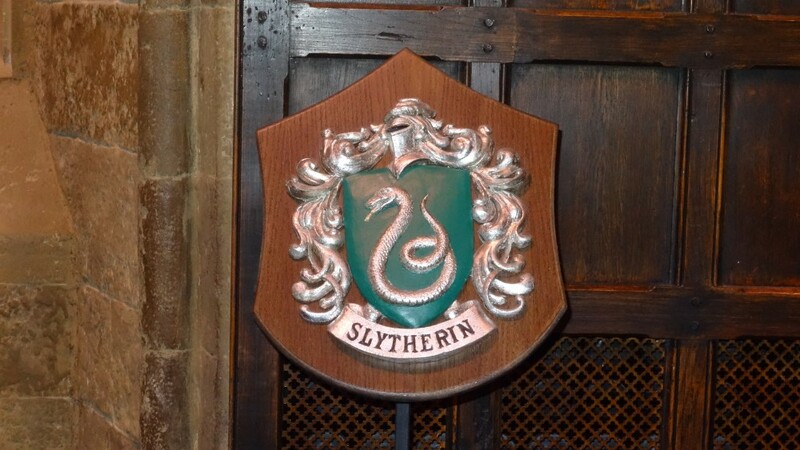 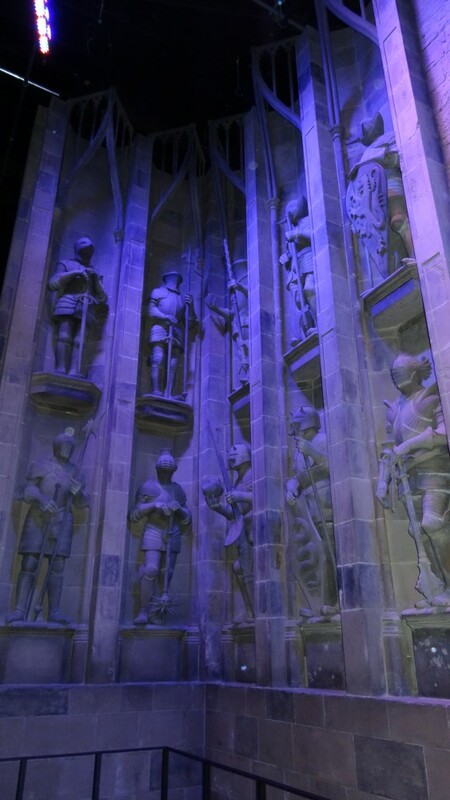 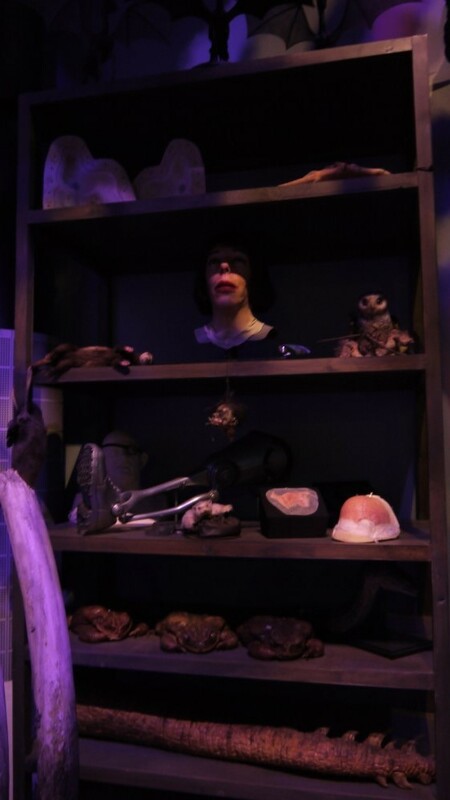 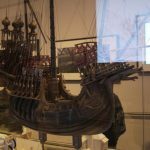 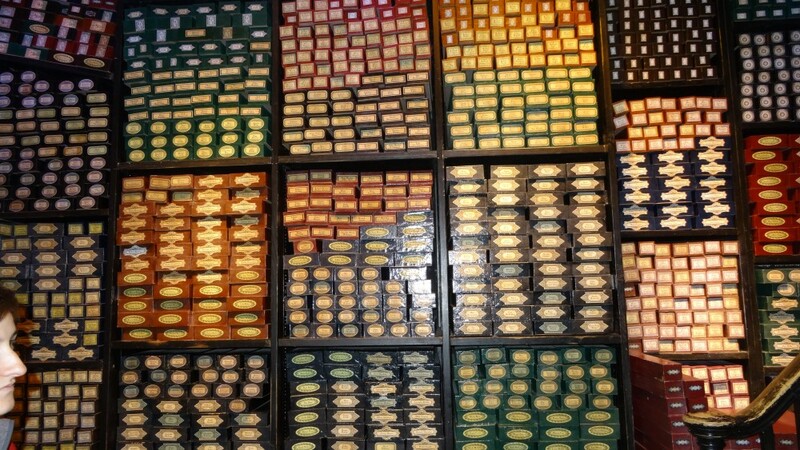 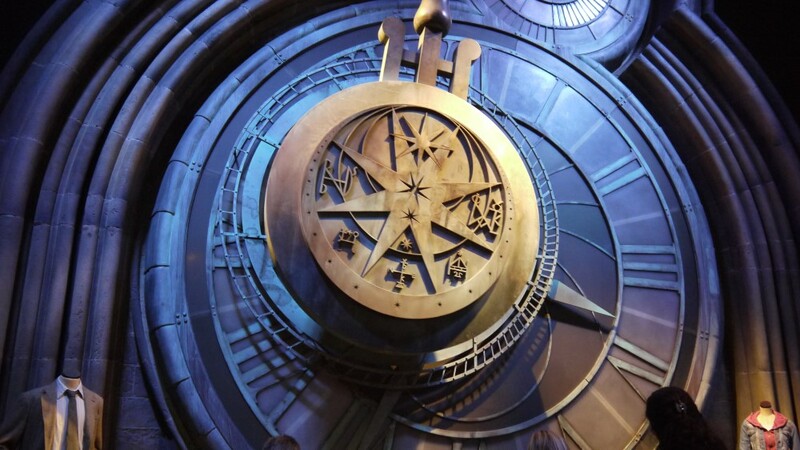 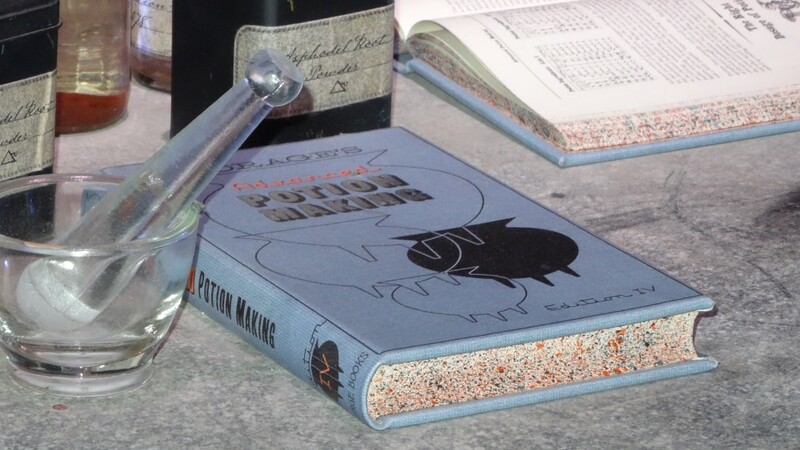 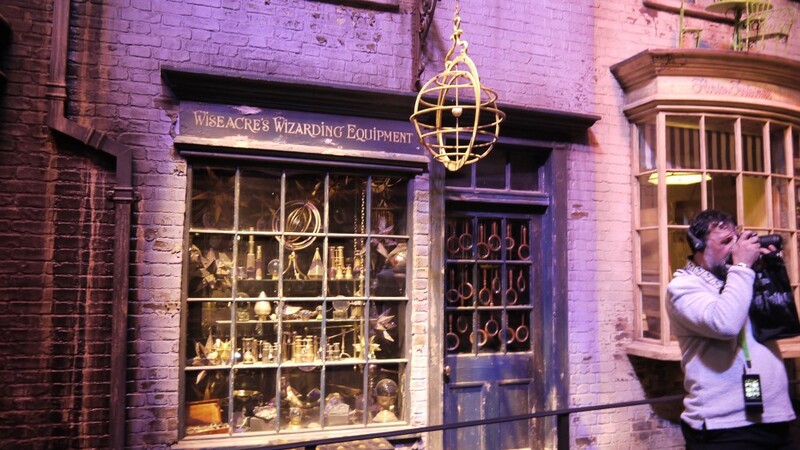 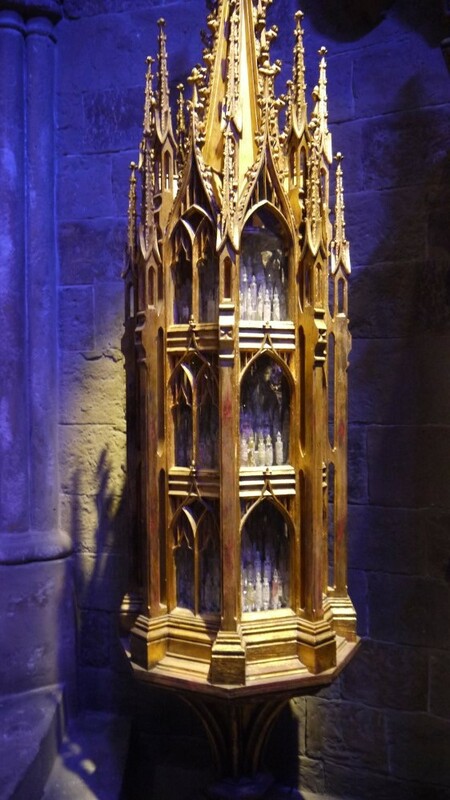 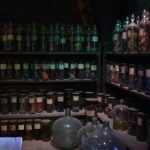 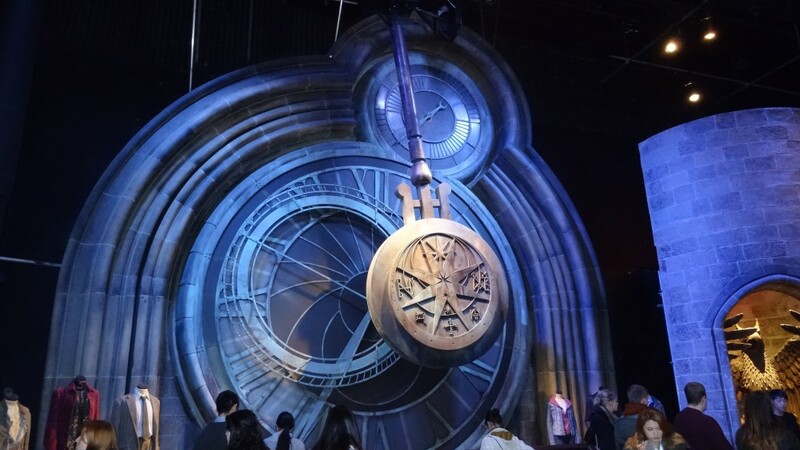 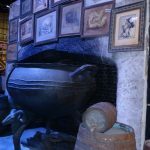 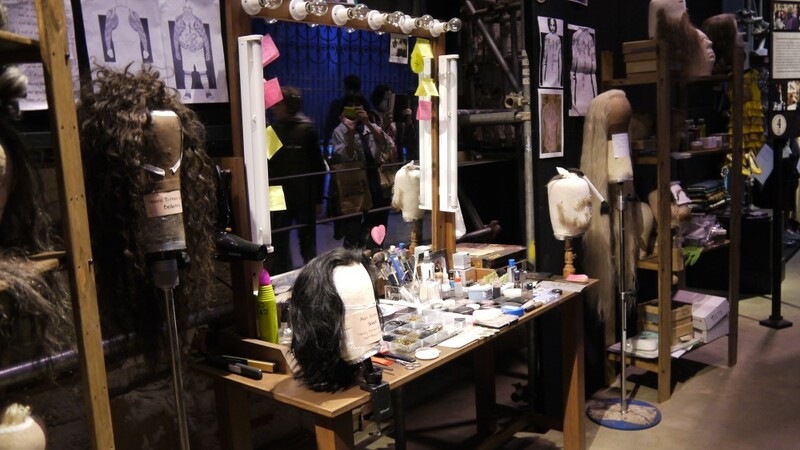 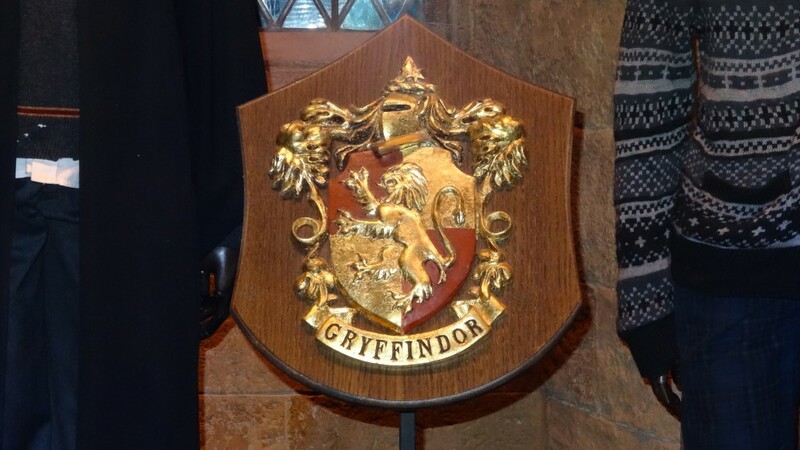 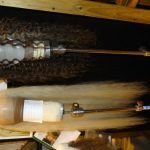 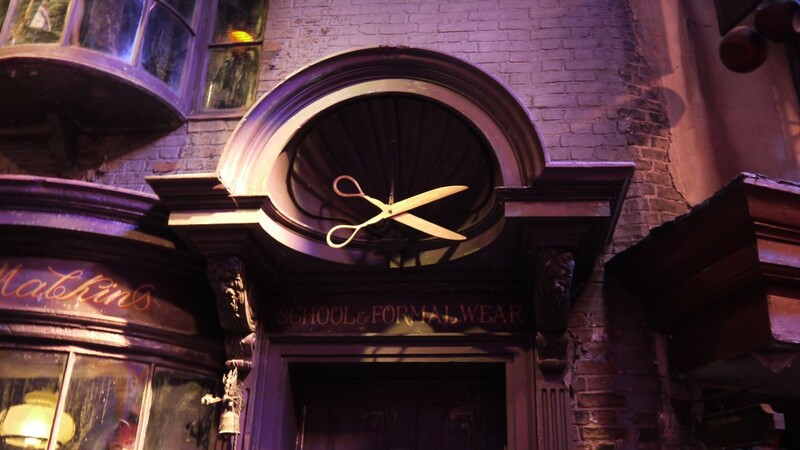 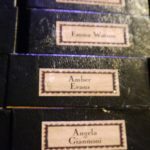 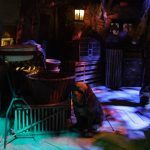 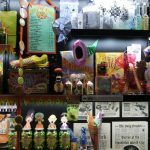 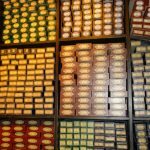 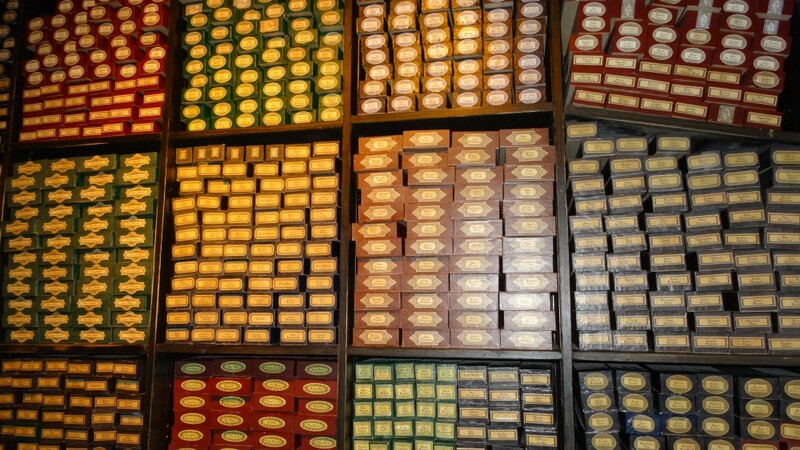 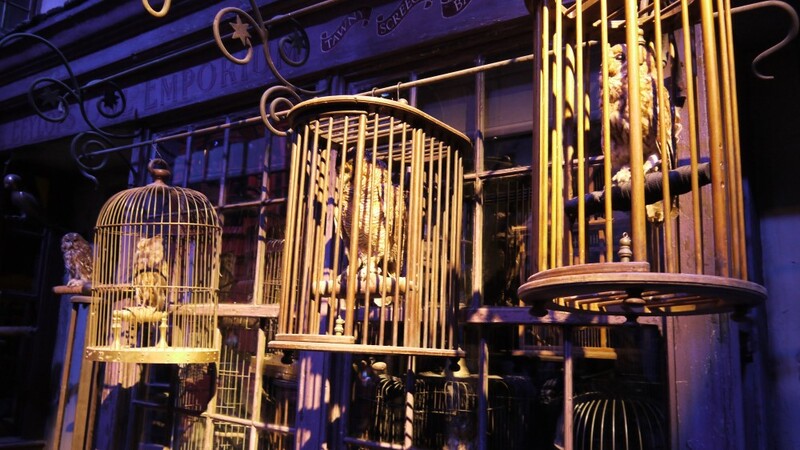 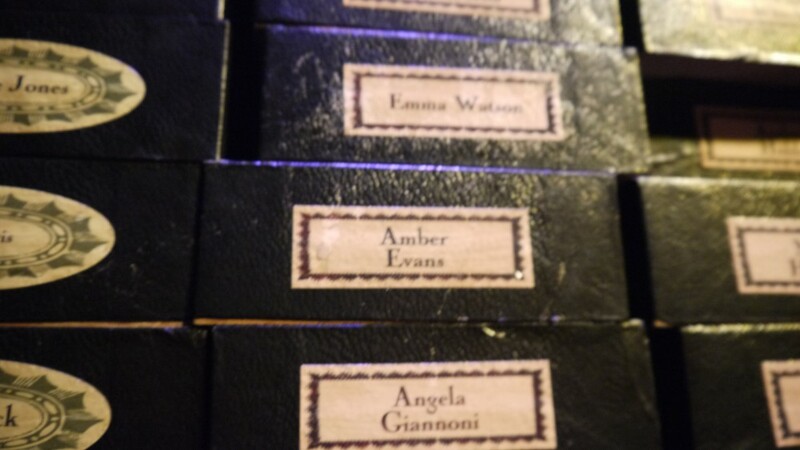 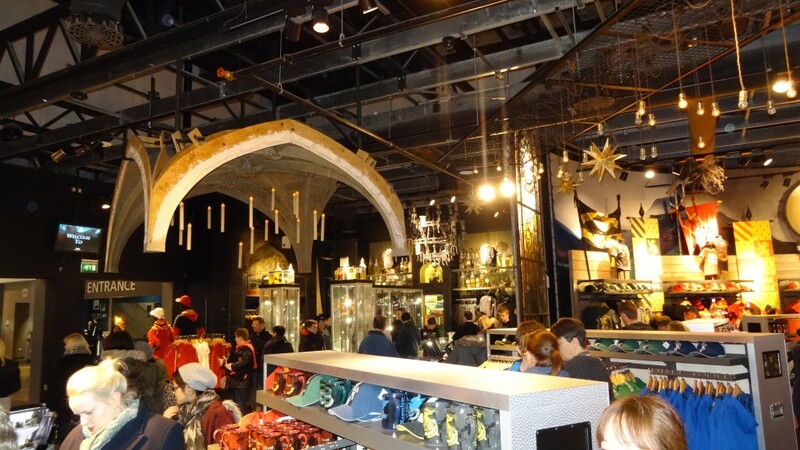 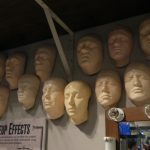 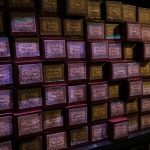 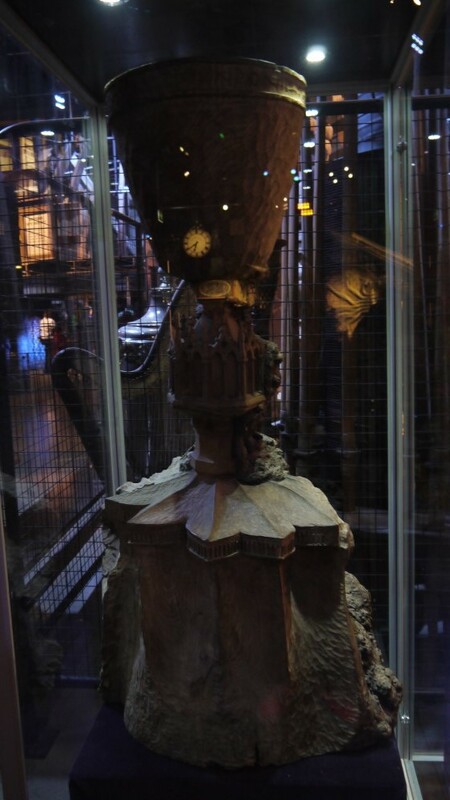 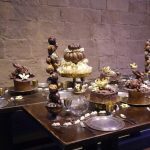 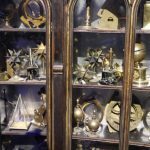 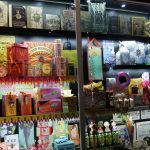 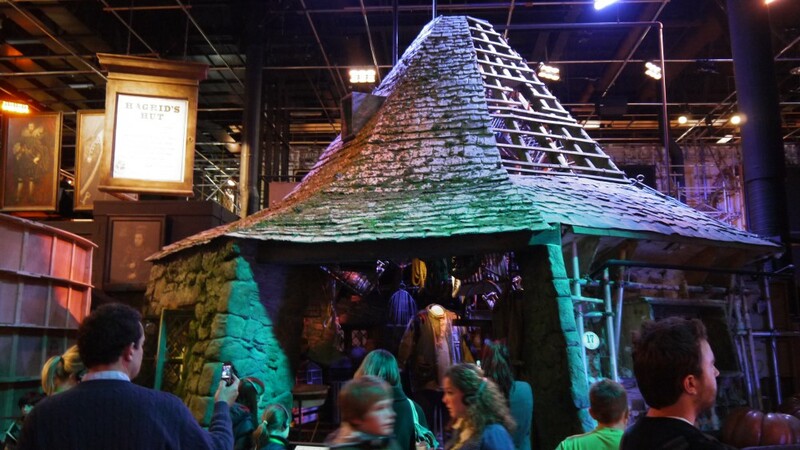 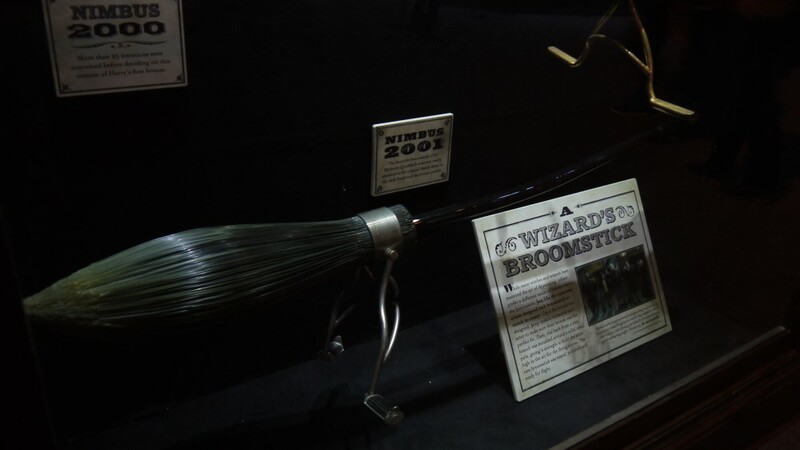 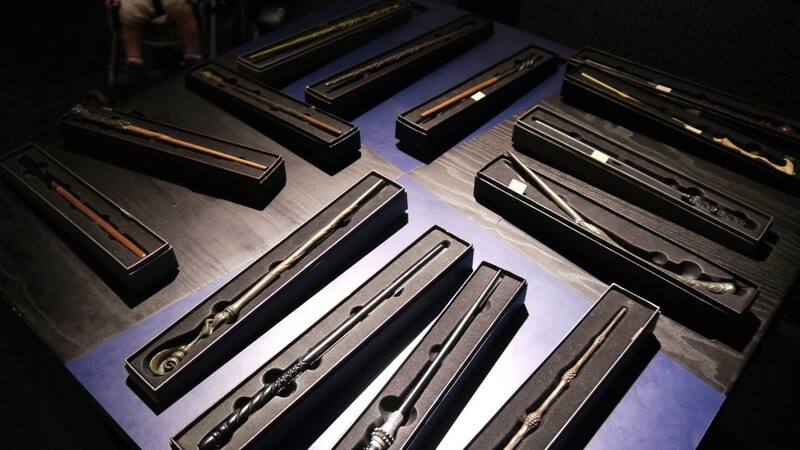 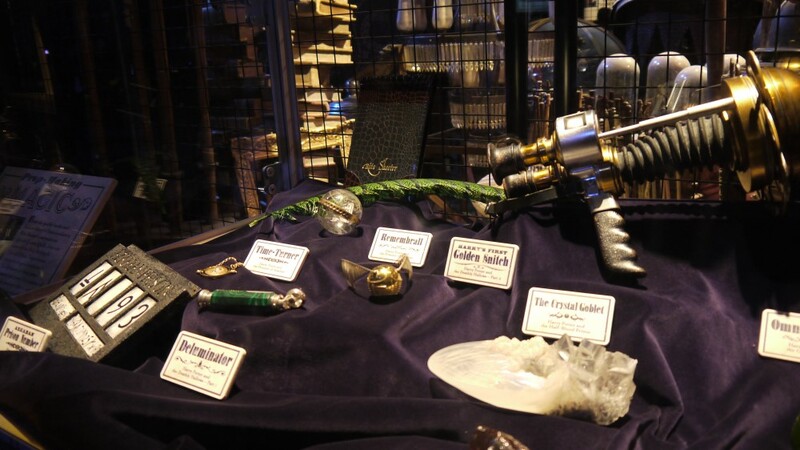 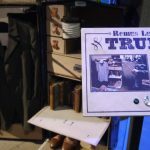 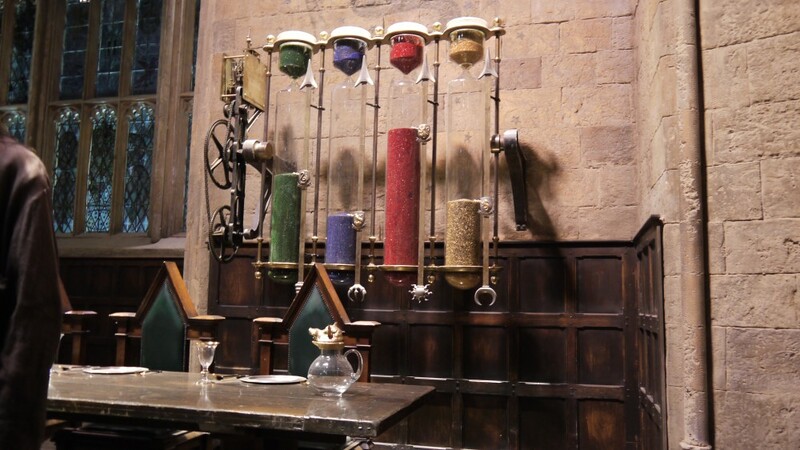 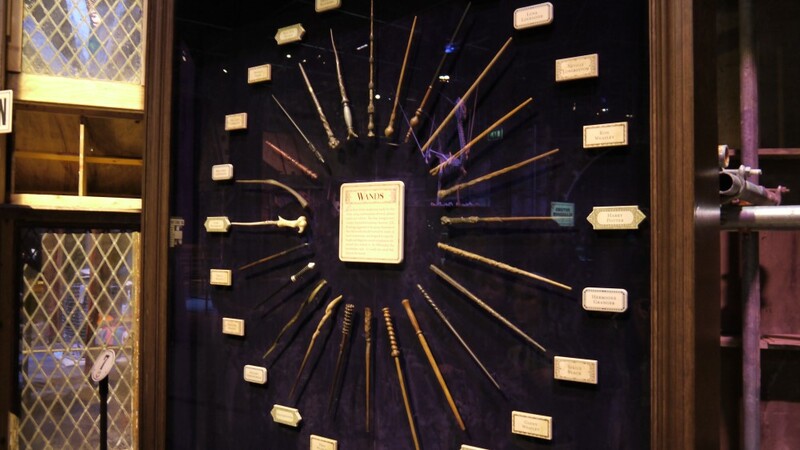 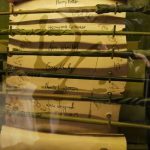 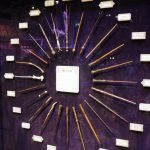 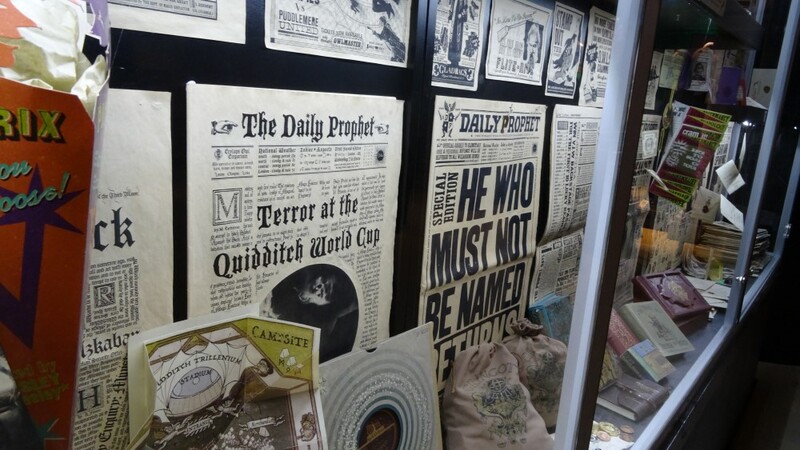 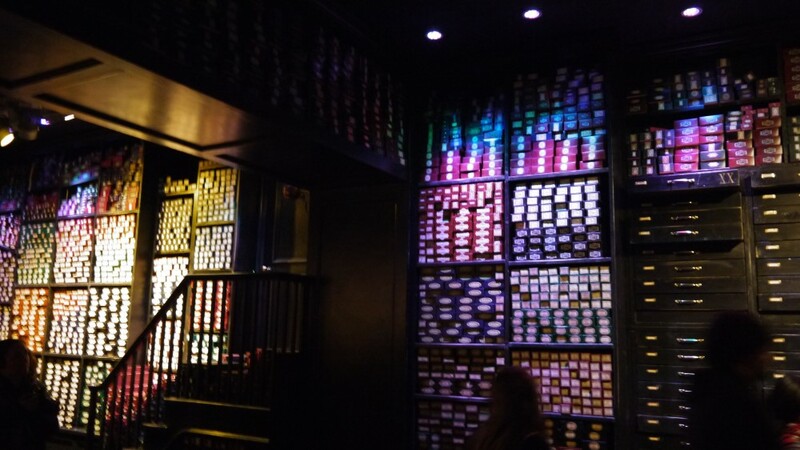 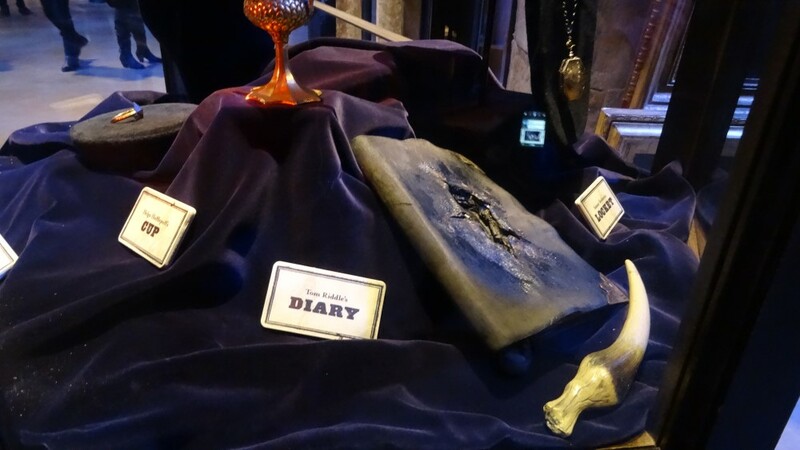 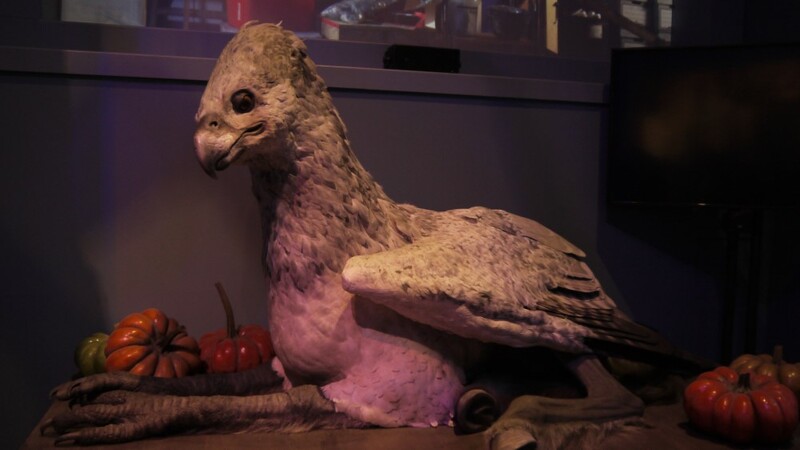 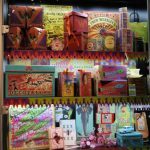 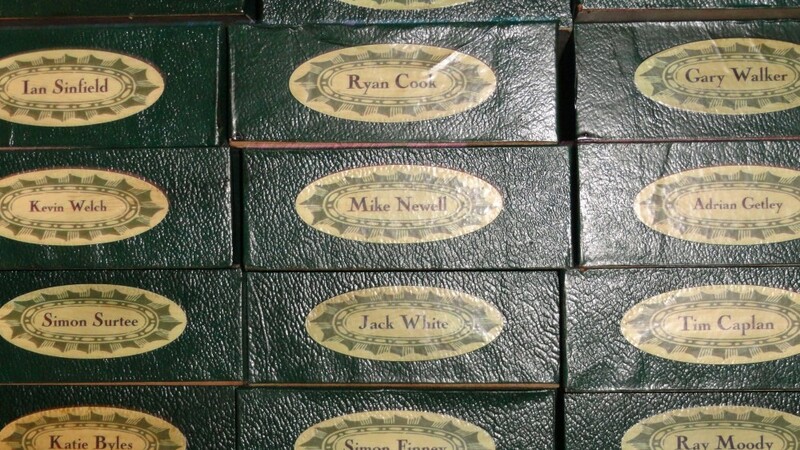 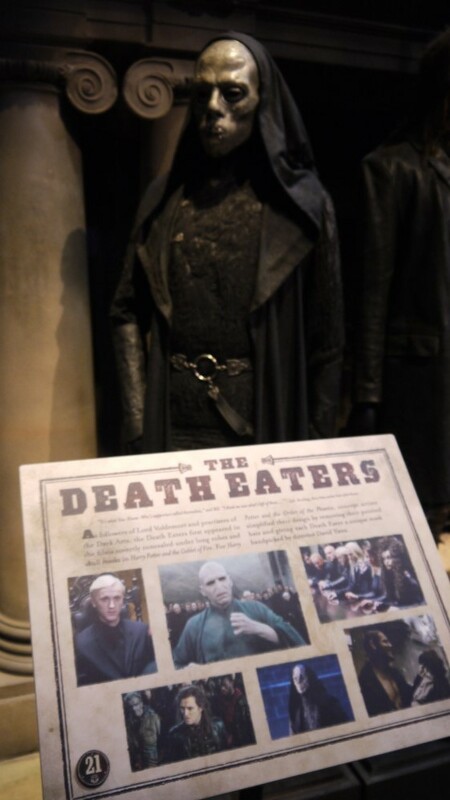 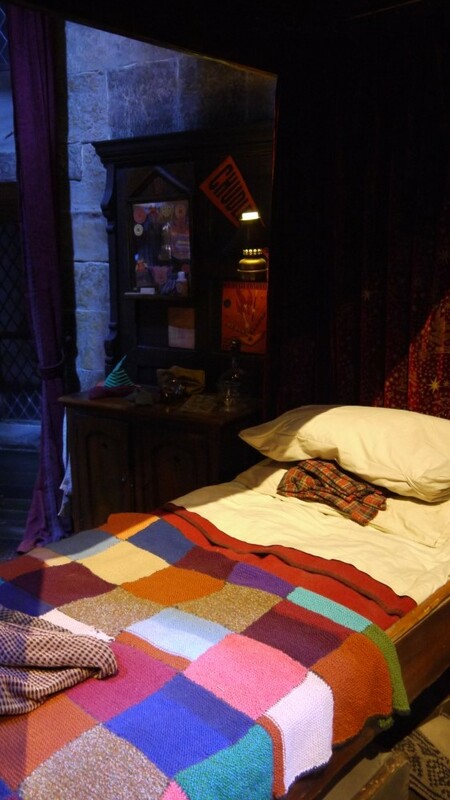 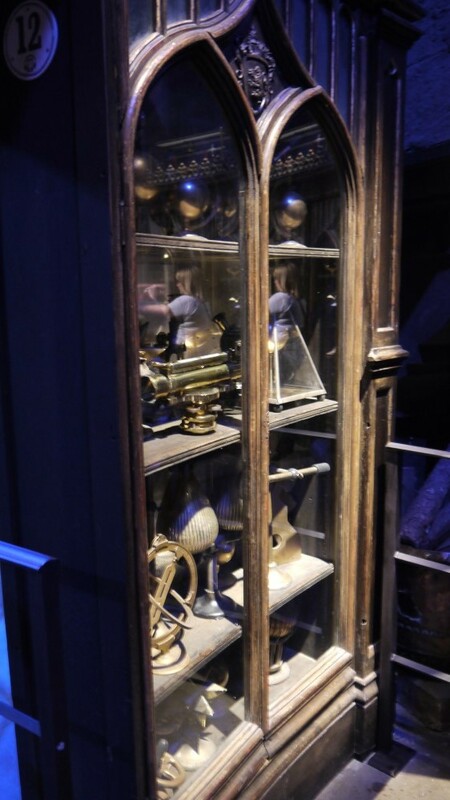 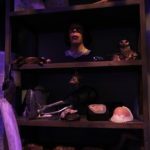 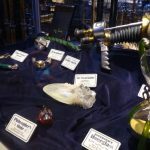 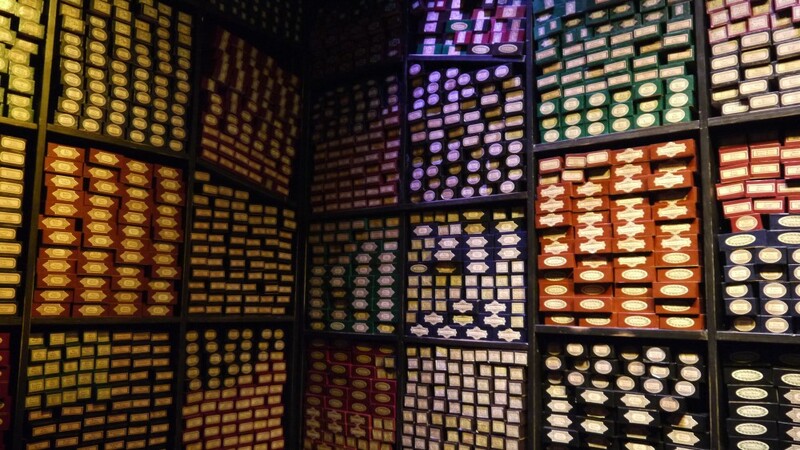 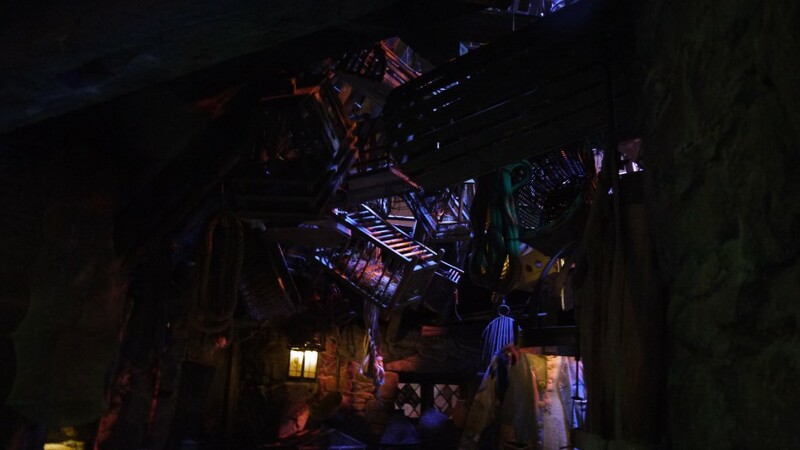 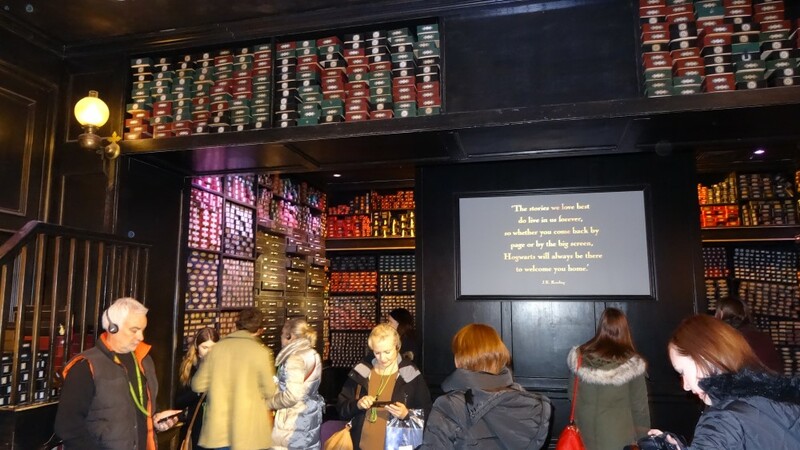 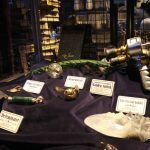 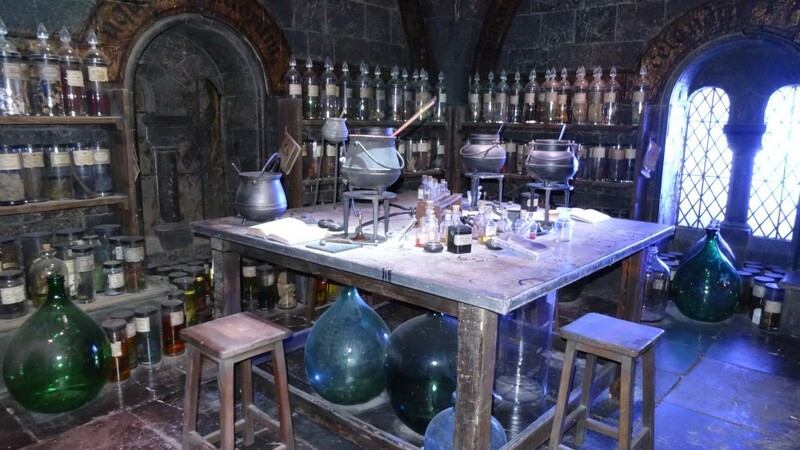 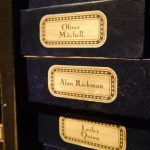 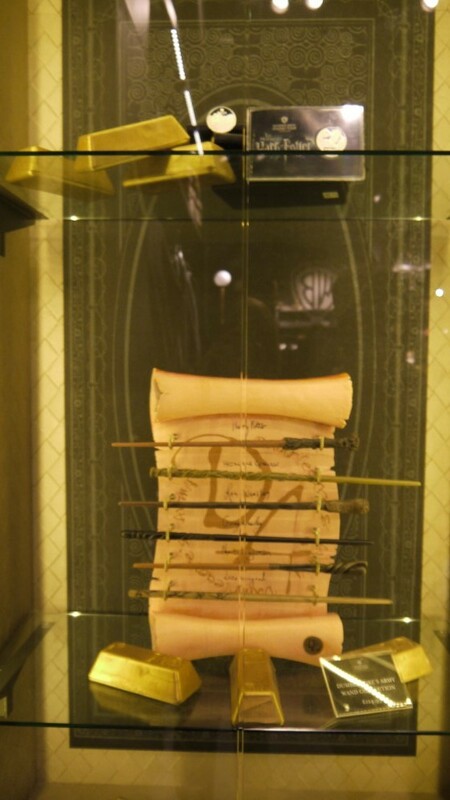 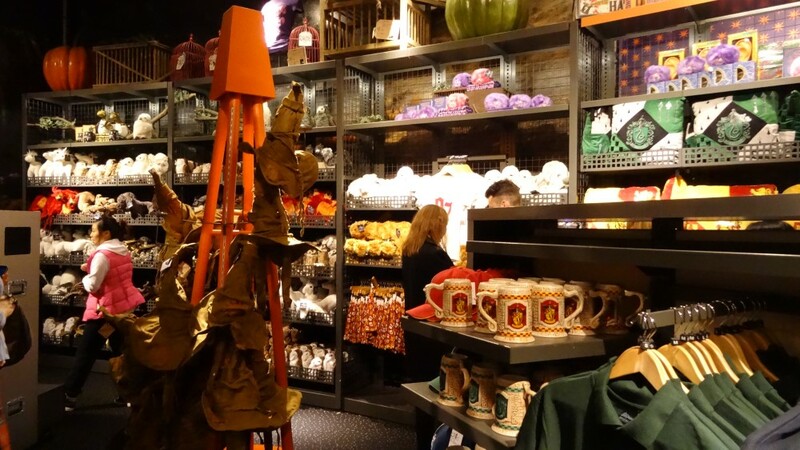 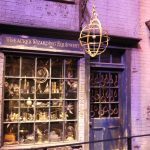 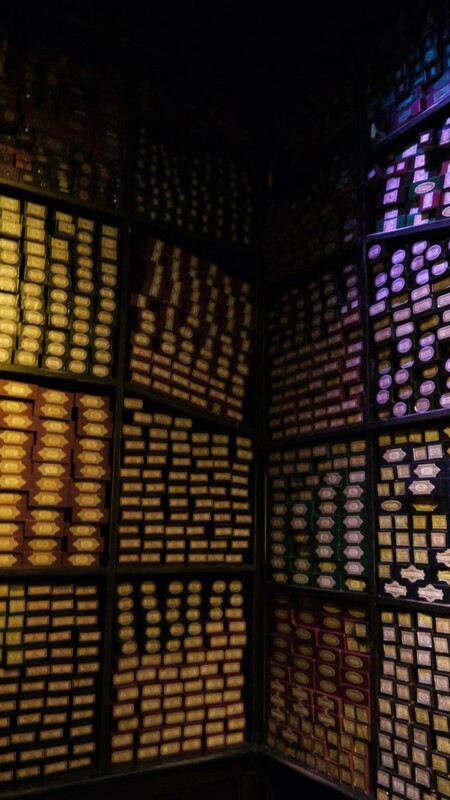 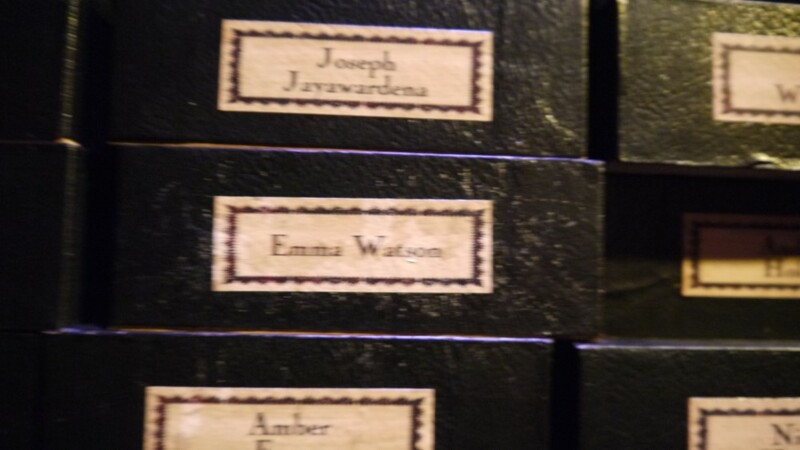 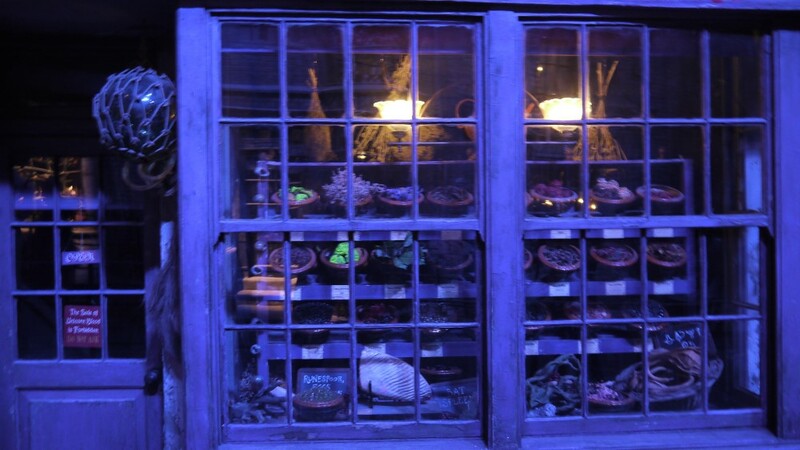 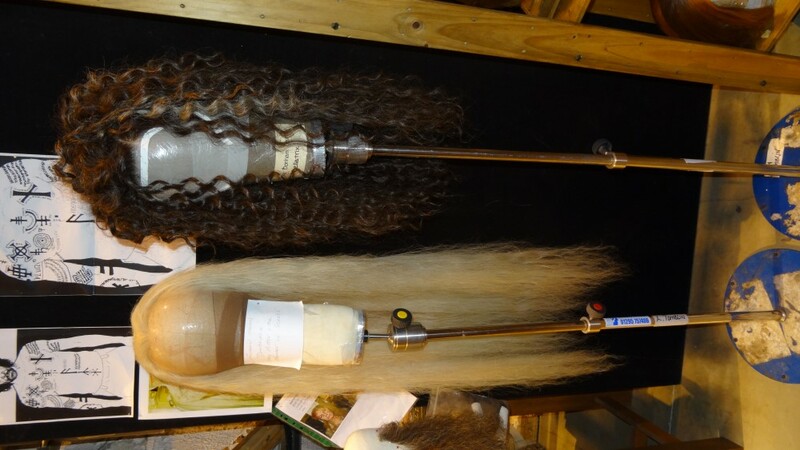 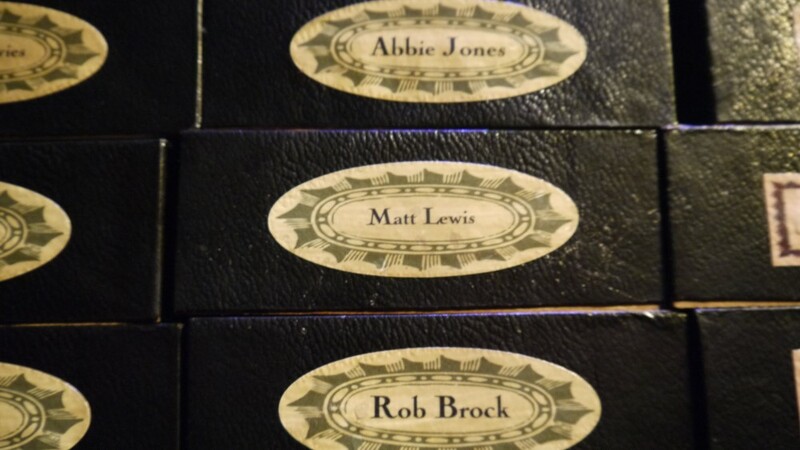 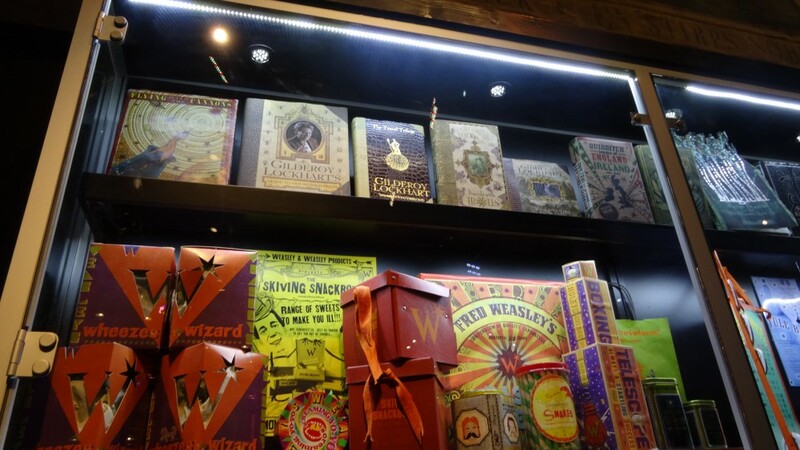 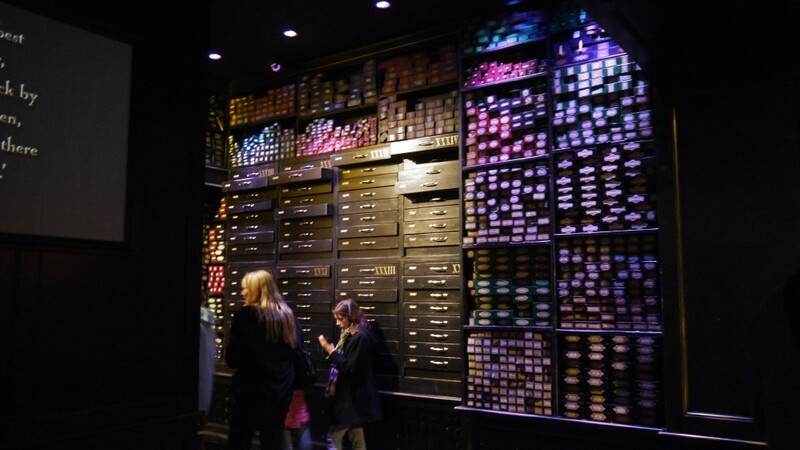 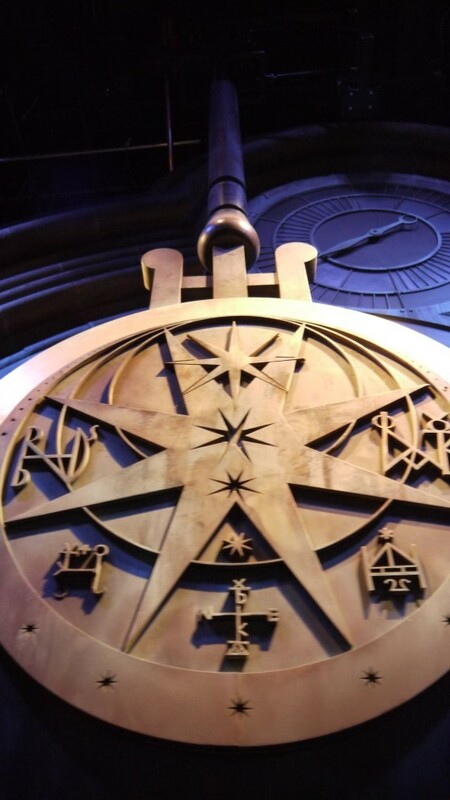 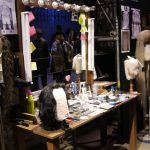 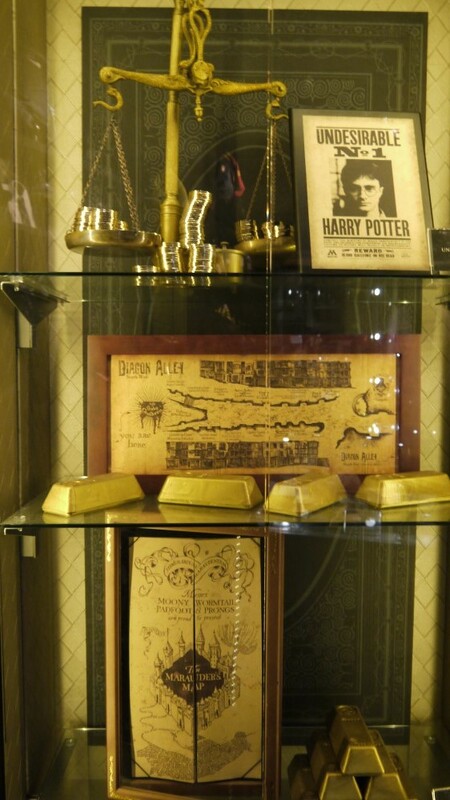 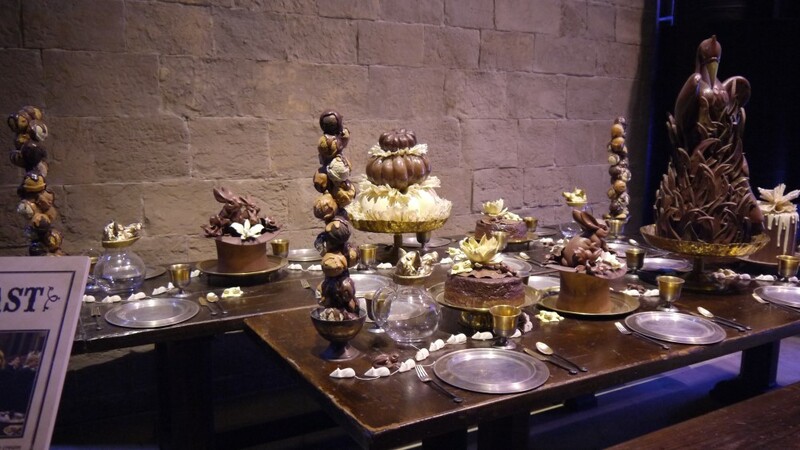 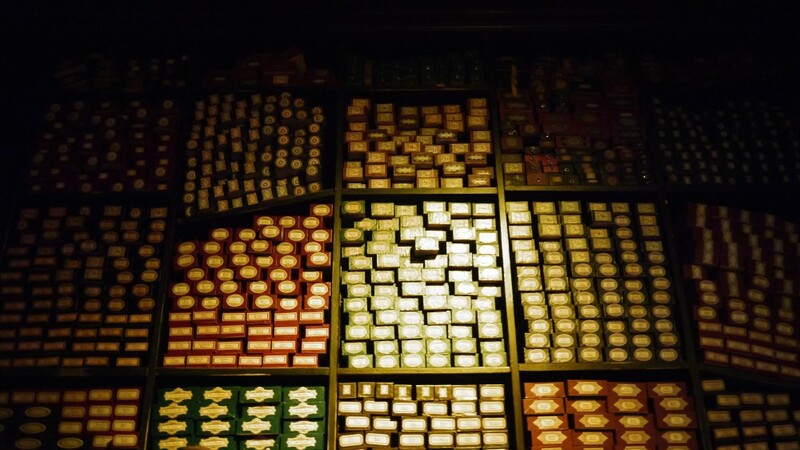 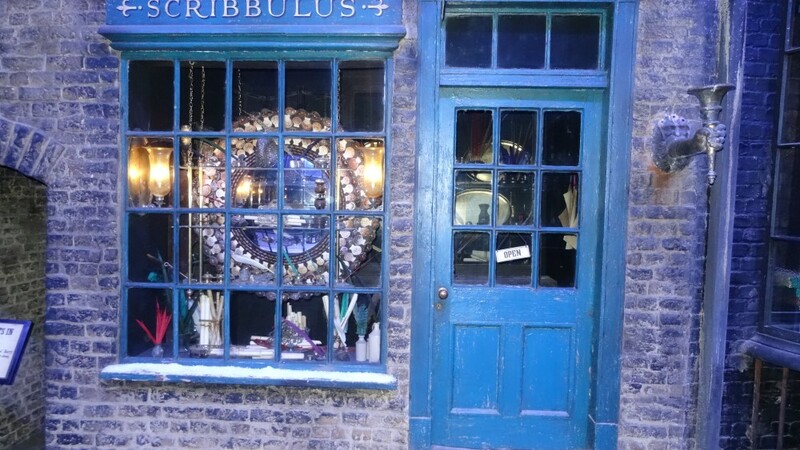 The Prop Department, led by Head Prop Maker Pierre Bohanna, created thousands of hand-crafted items including an array of wands personalised to each character, jars of potions ingredients and mountains of golden Galleons. 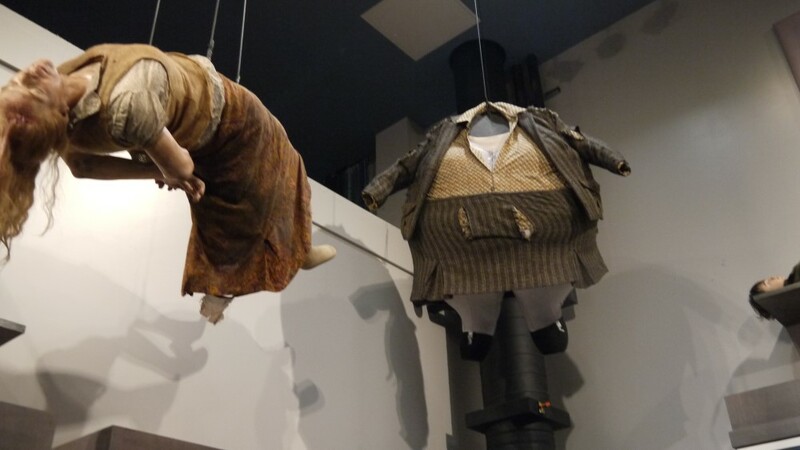 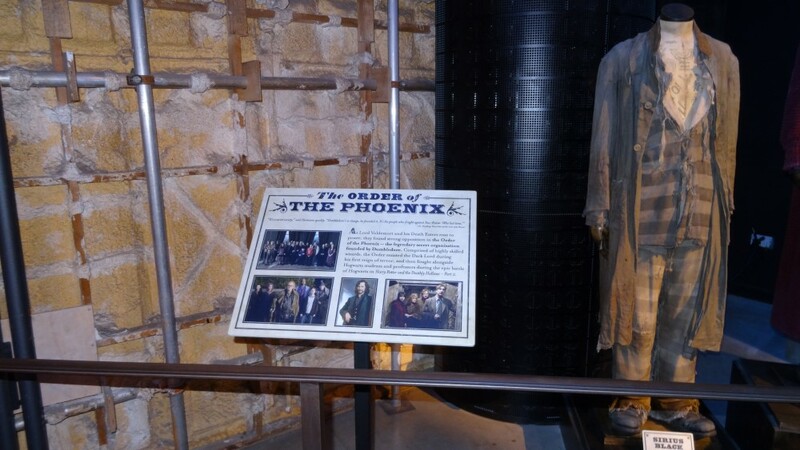 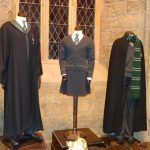 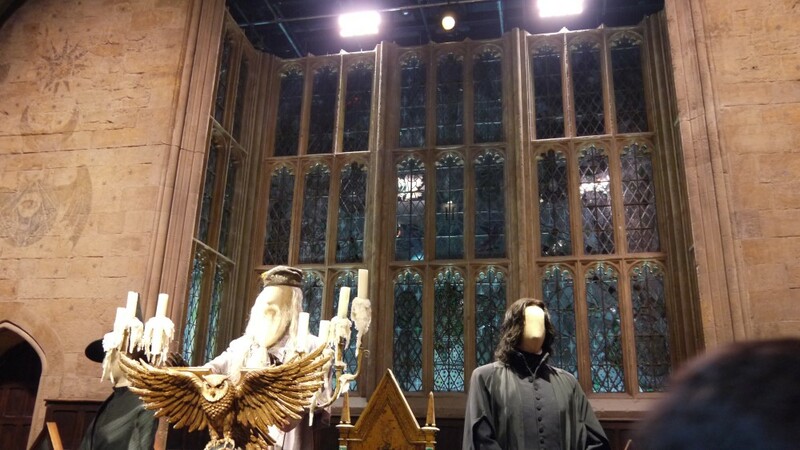 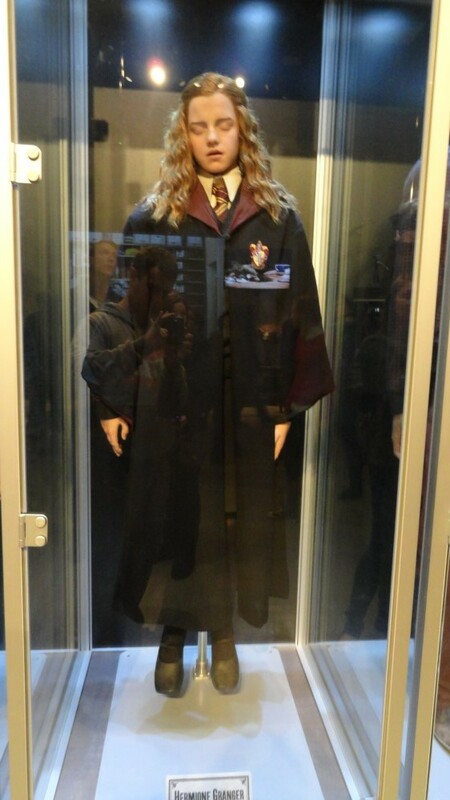 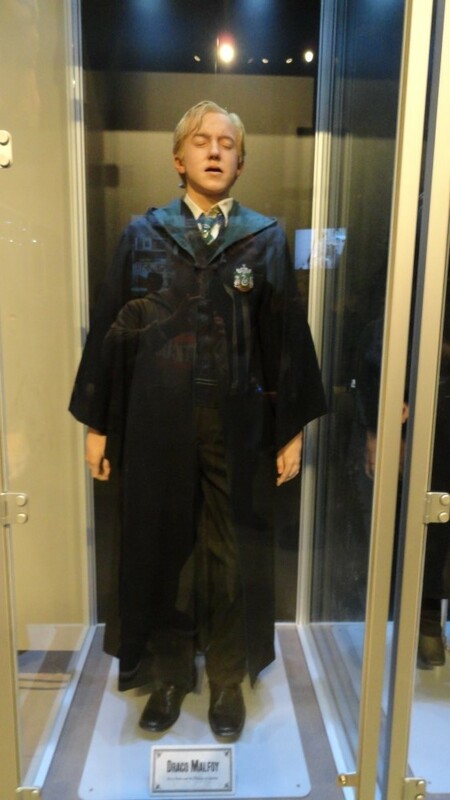 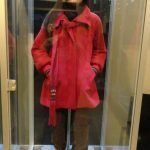 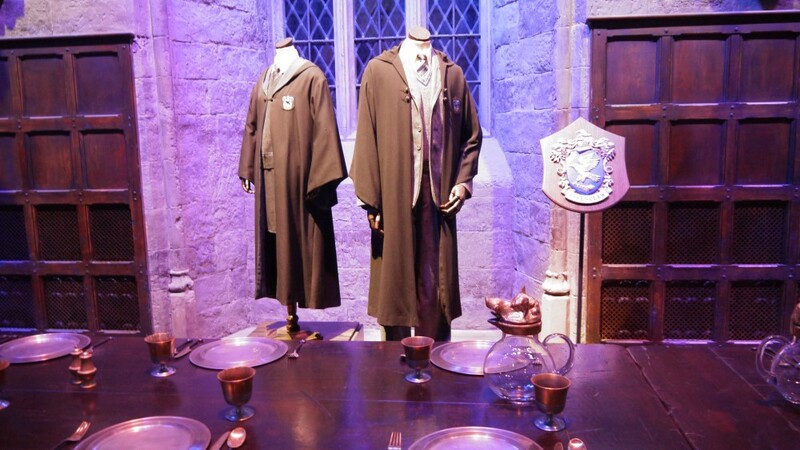 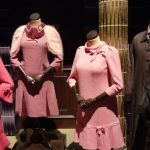 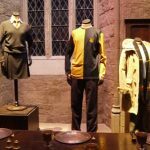 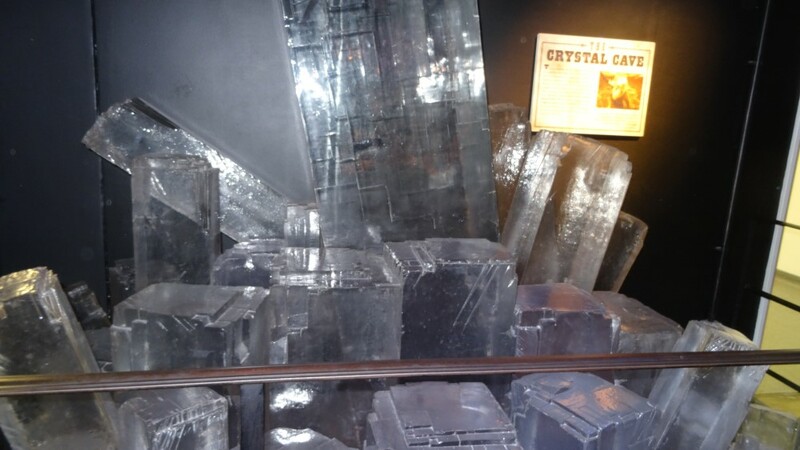 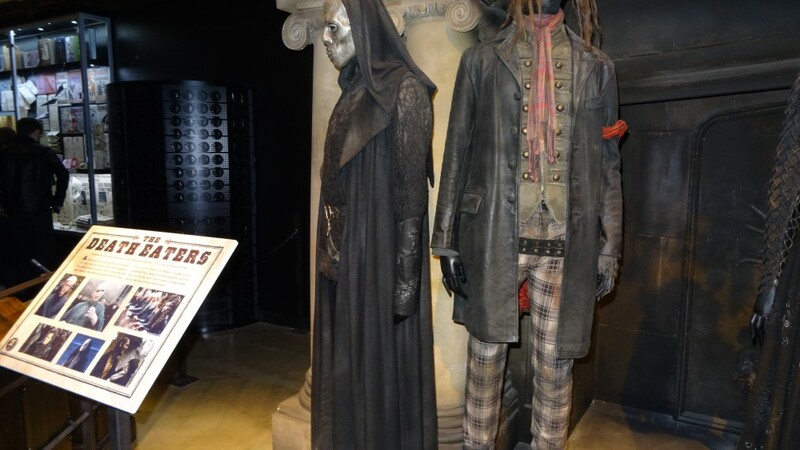 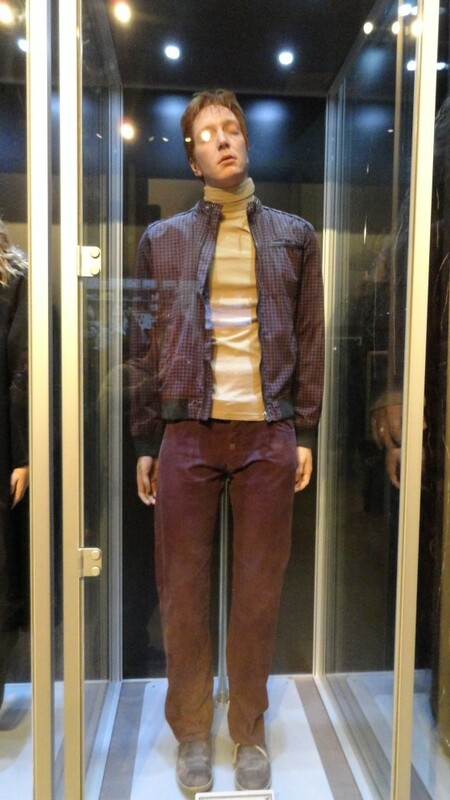 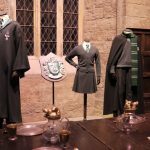 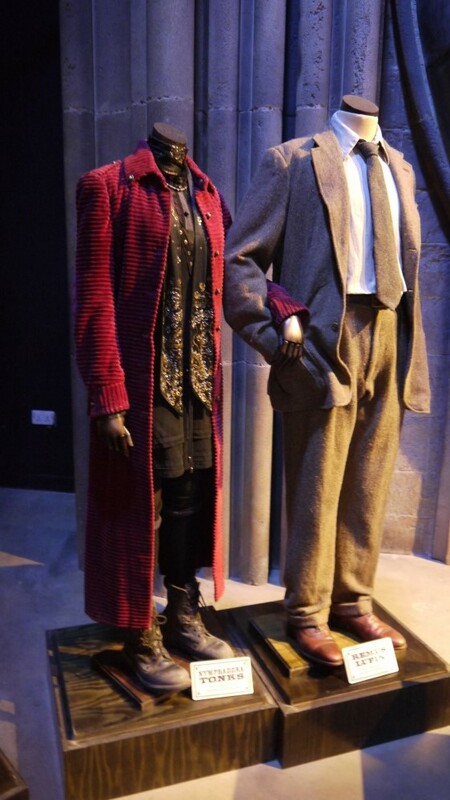 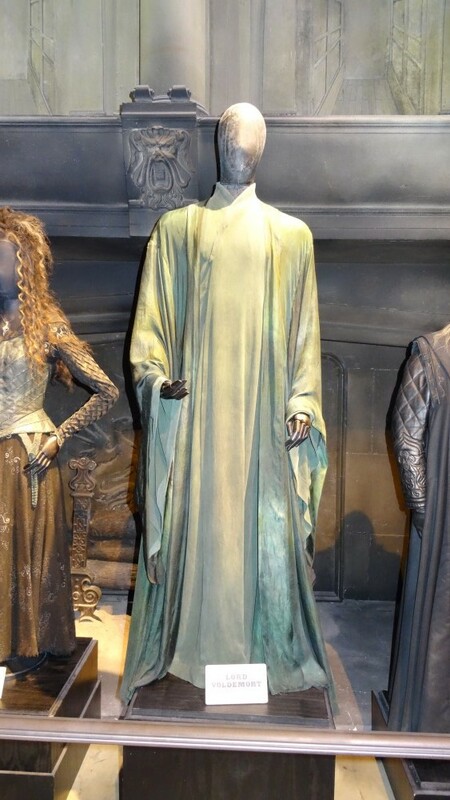 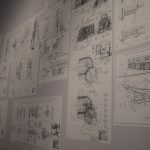 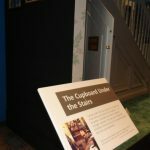 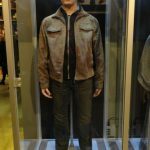 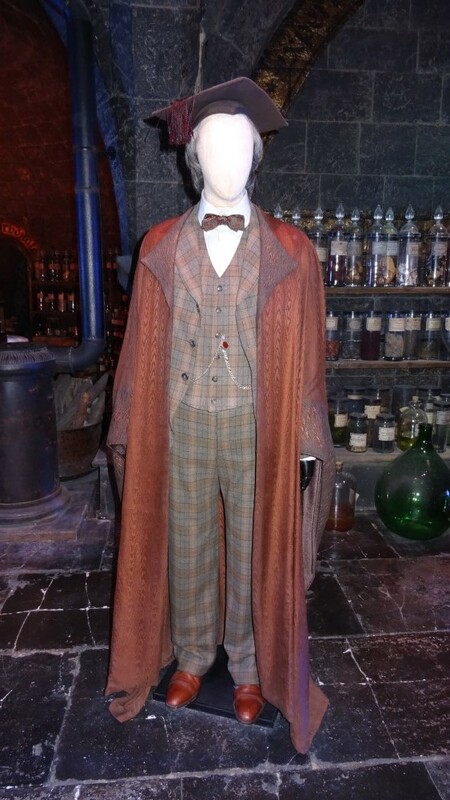 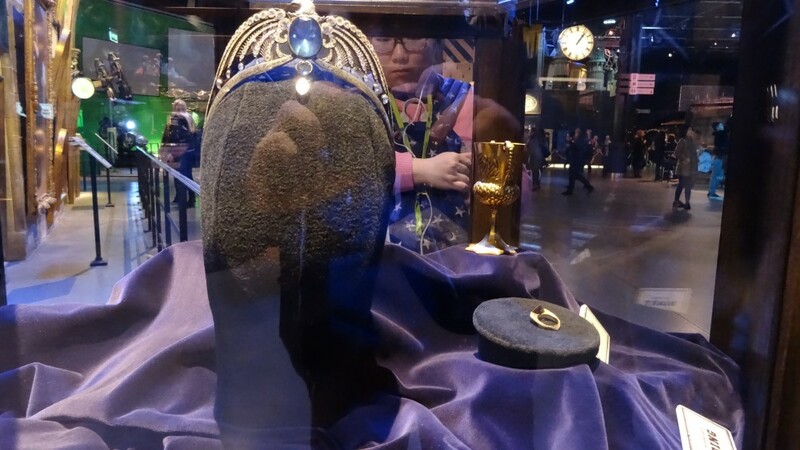 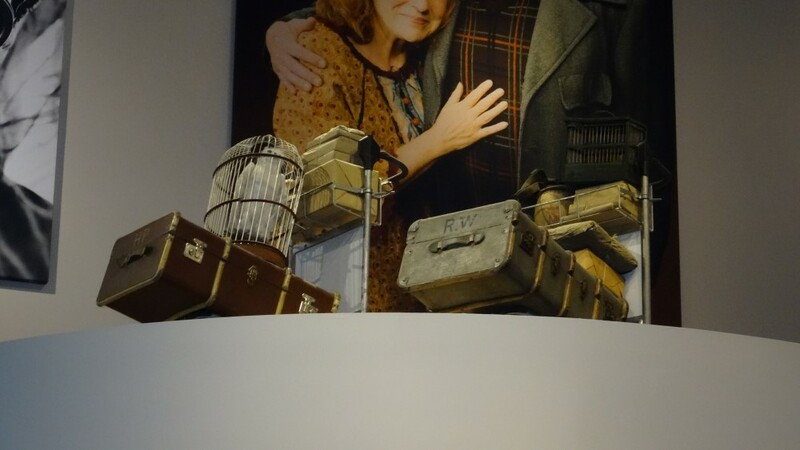 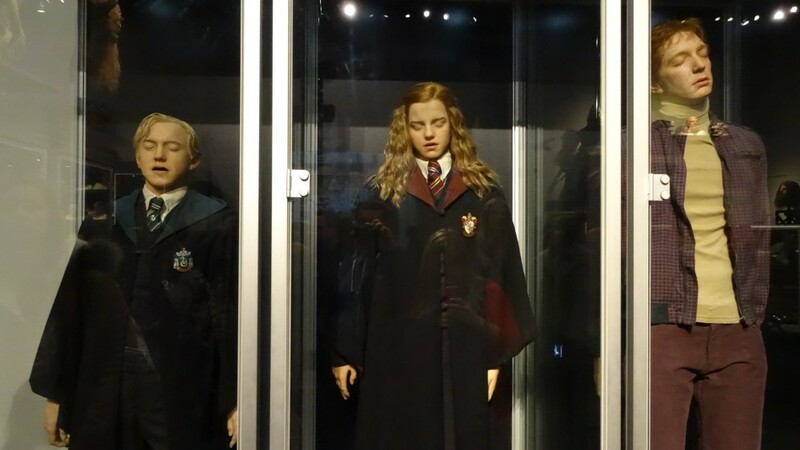 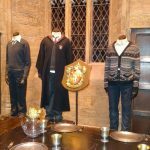 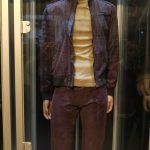 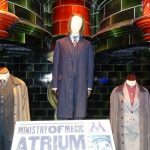 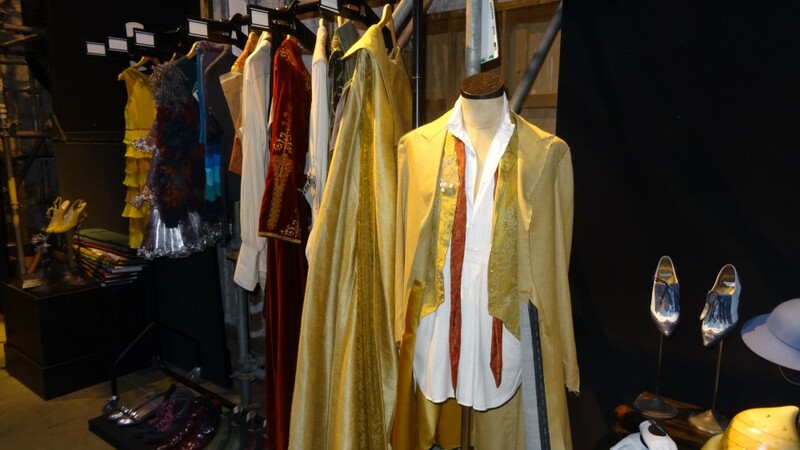 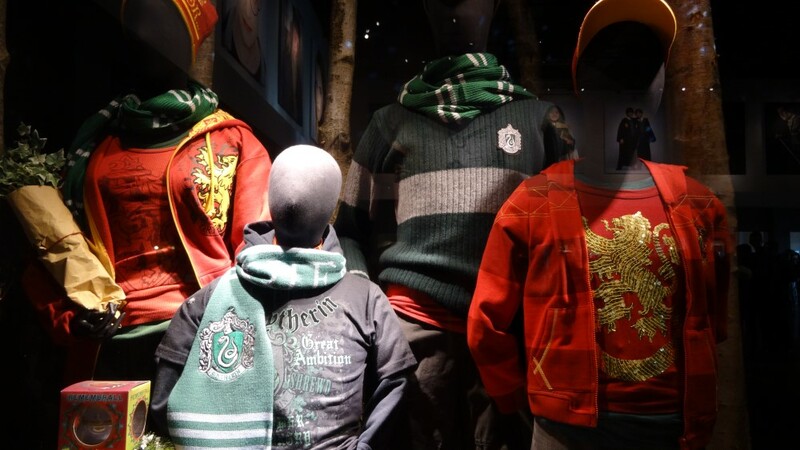 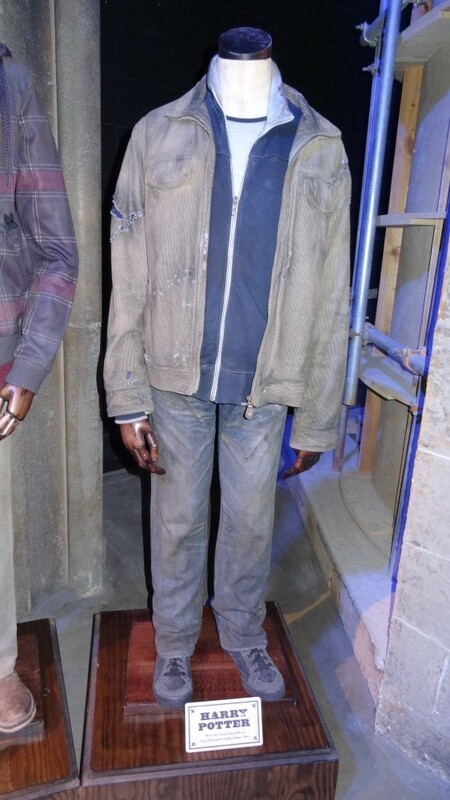 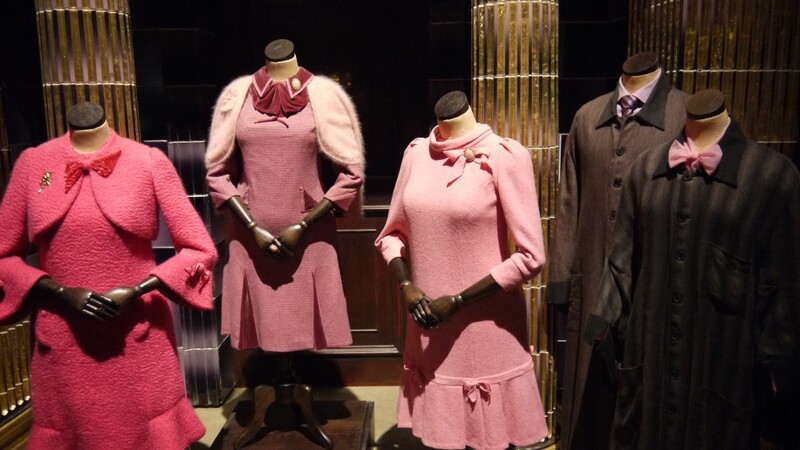 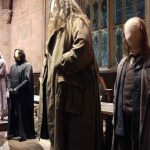 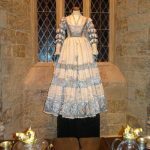 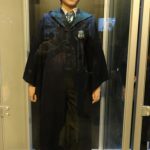 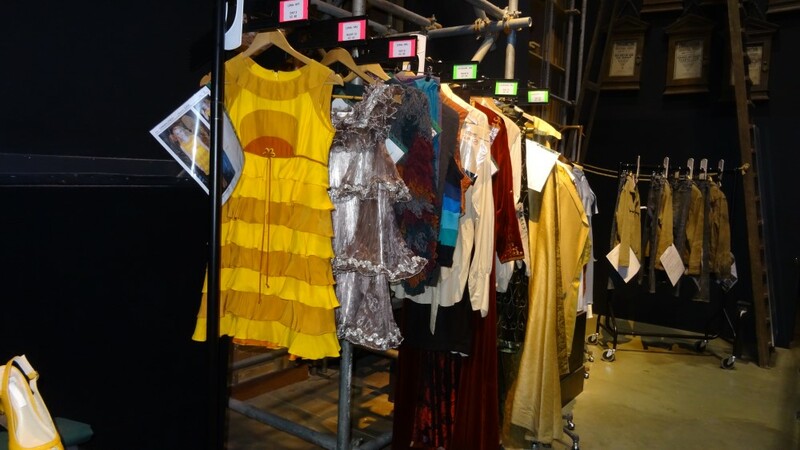 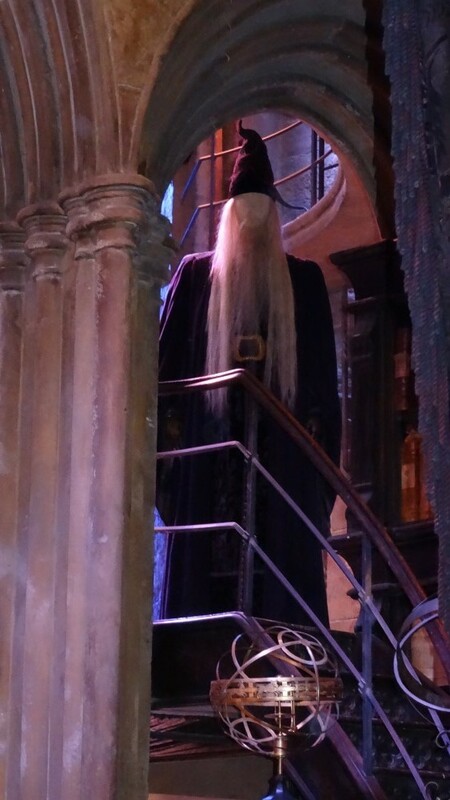 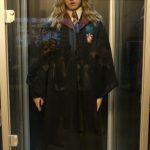 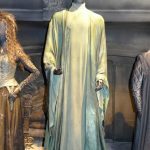 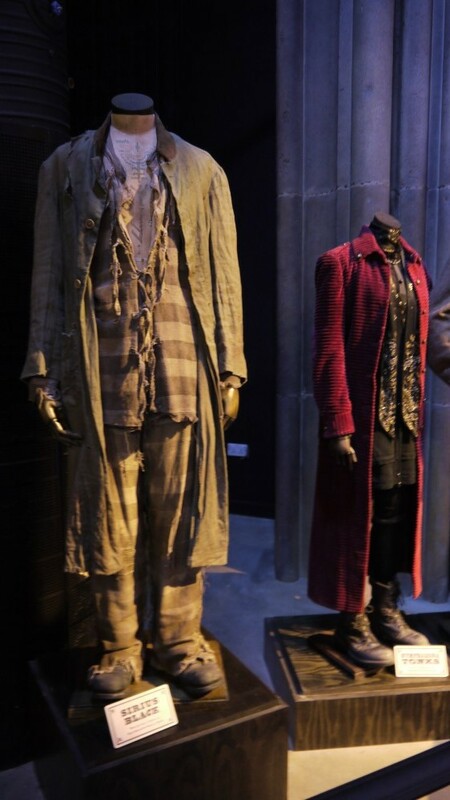 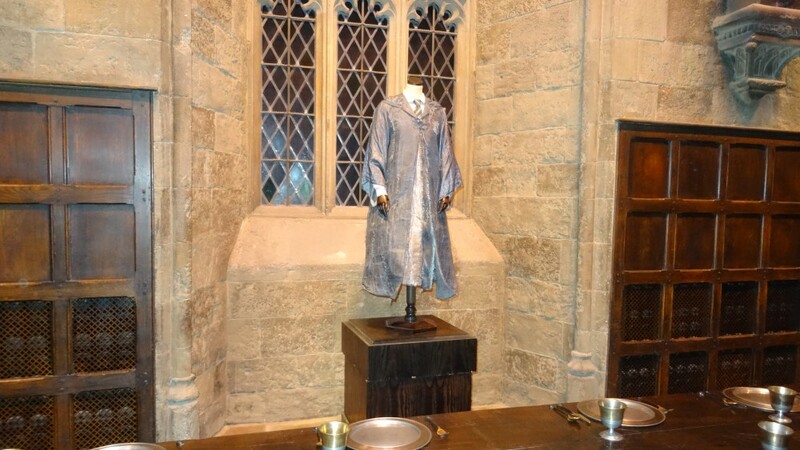 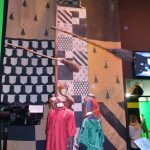 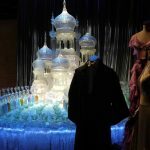 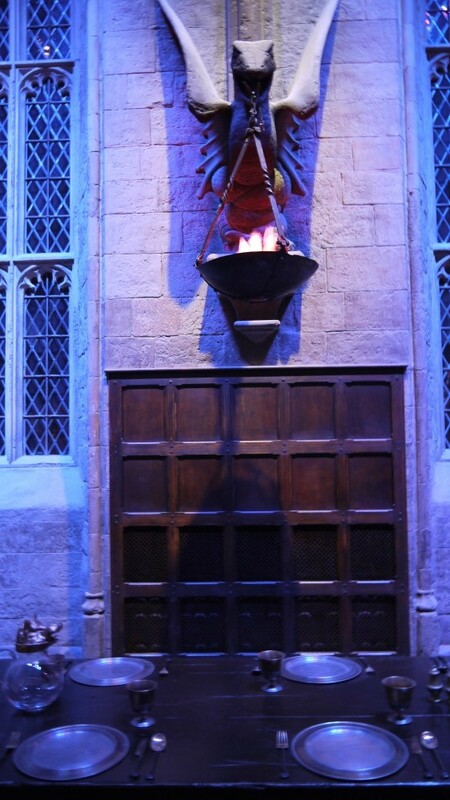 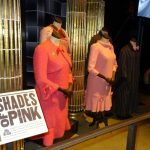 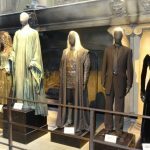 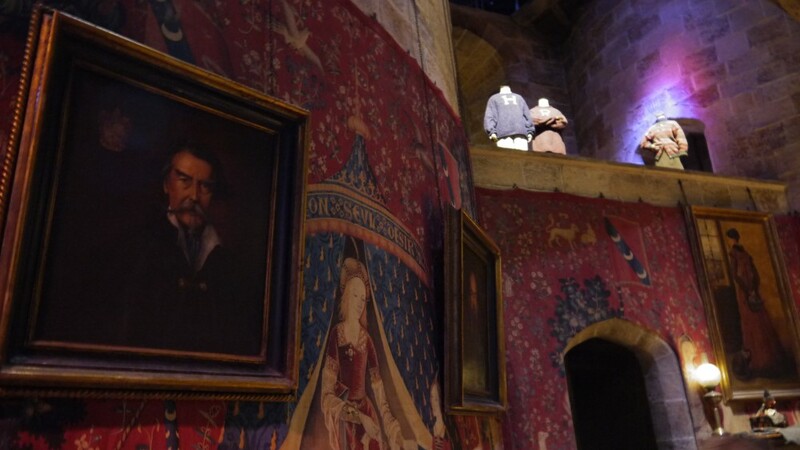 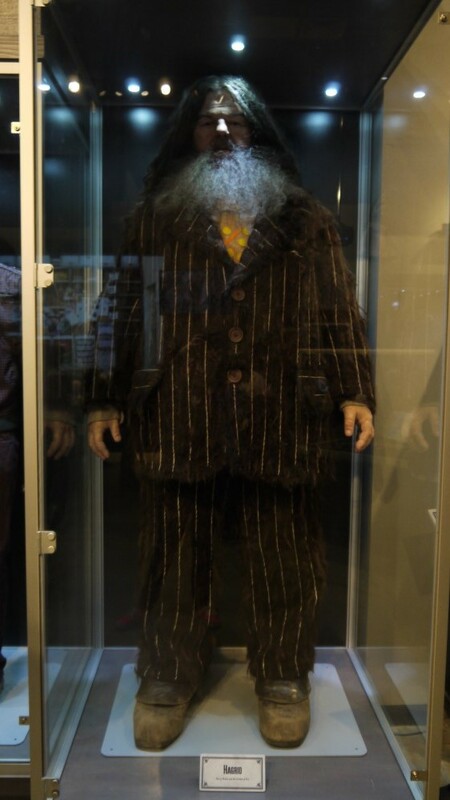 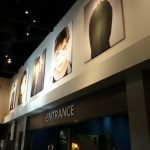 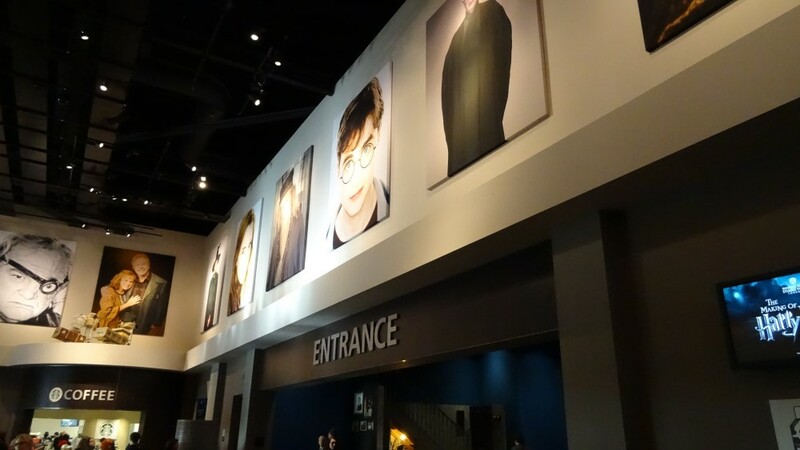 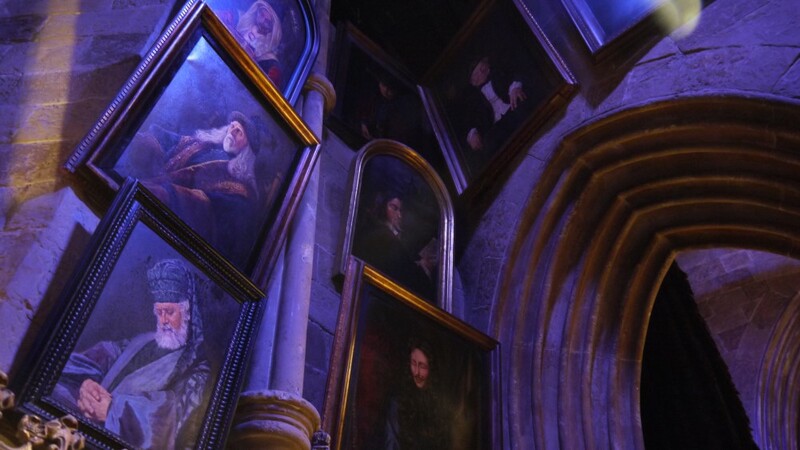 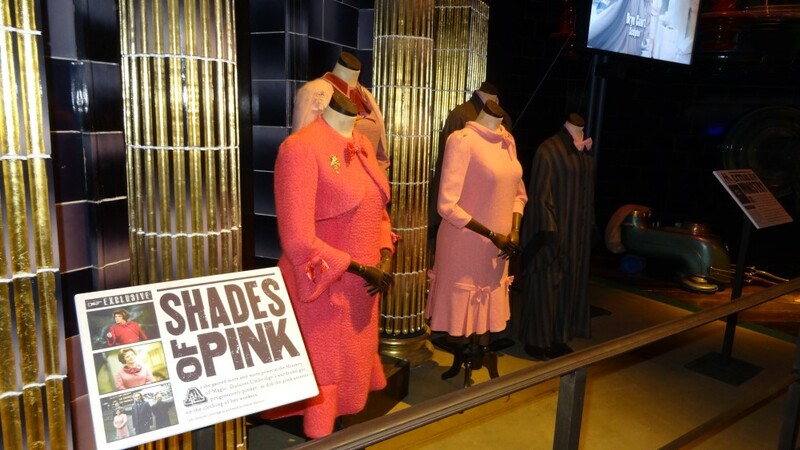 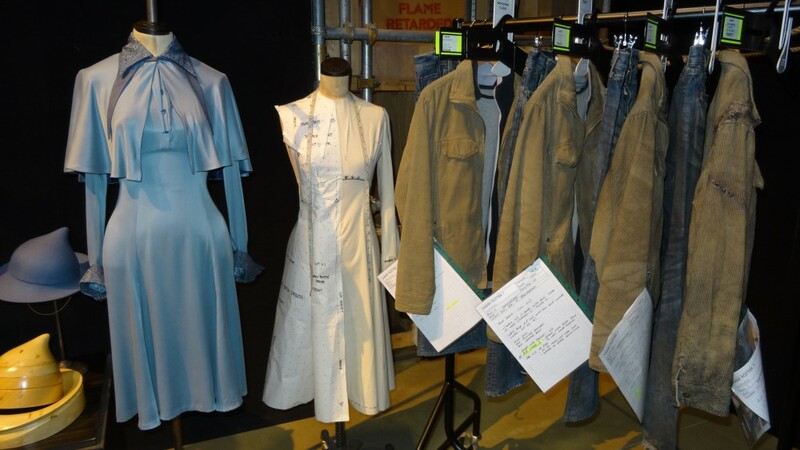 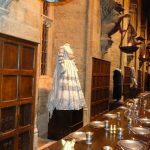 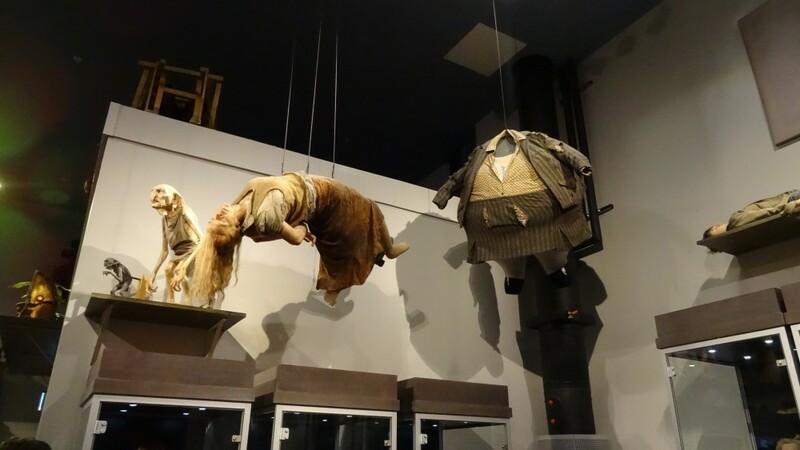 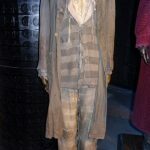 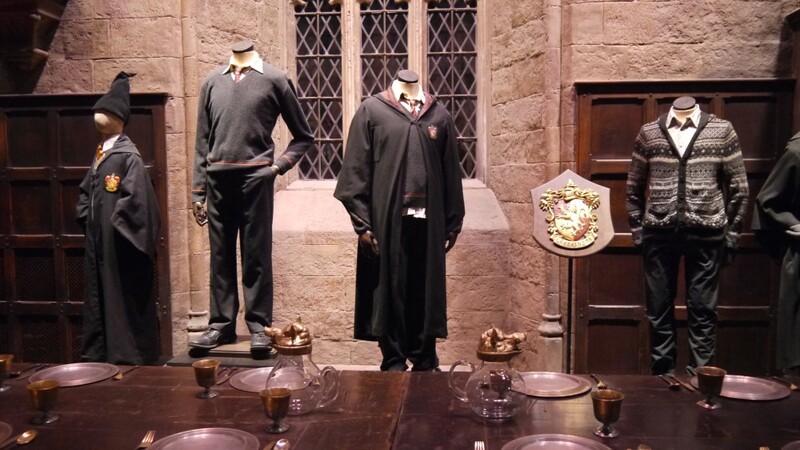 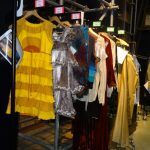 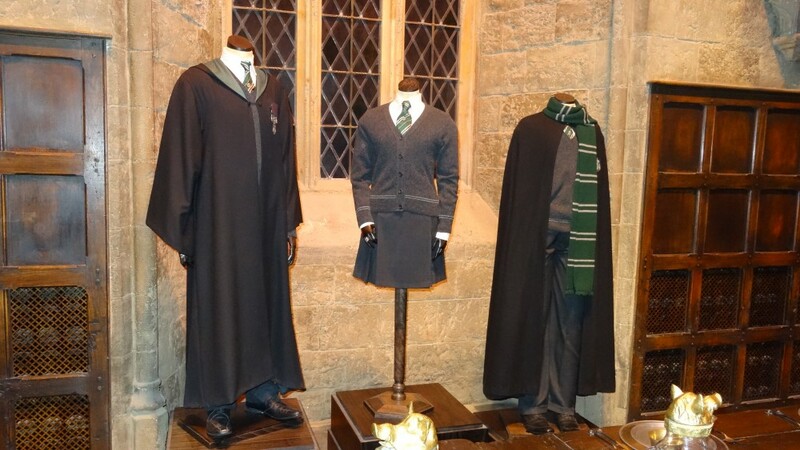 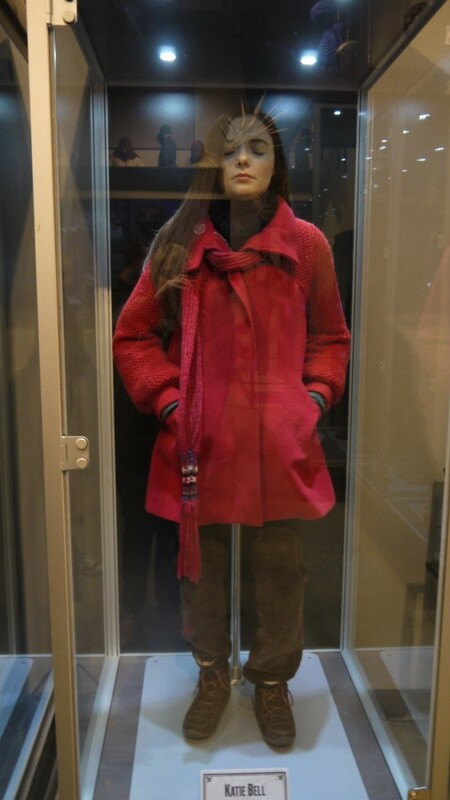 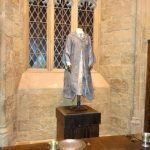 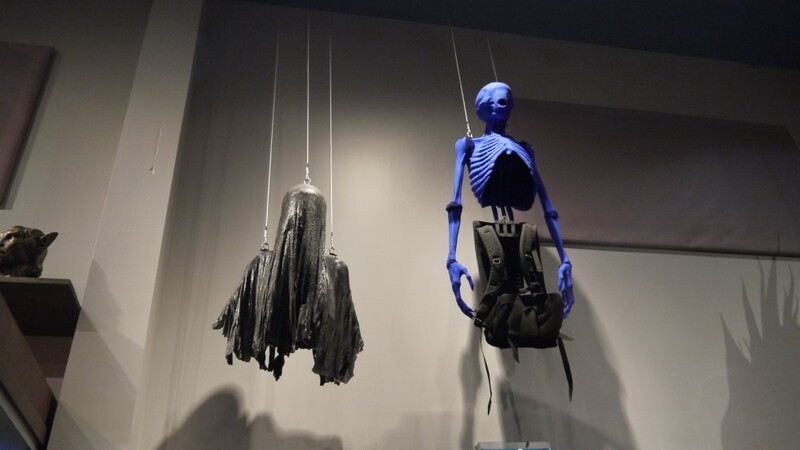 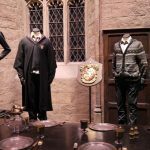 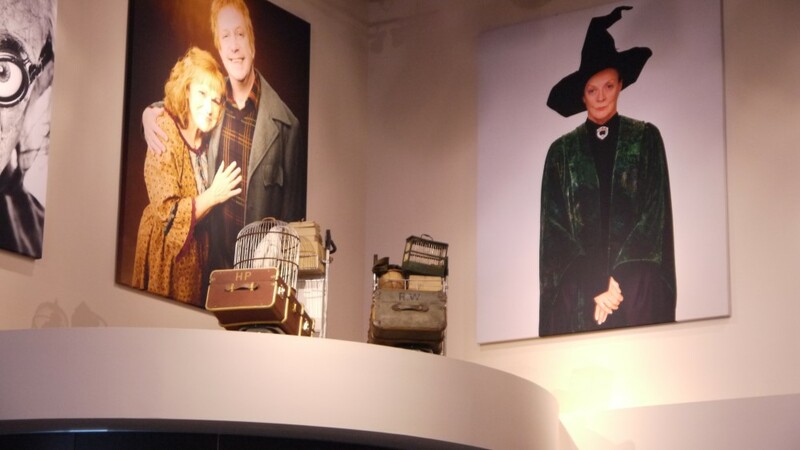 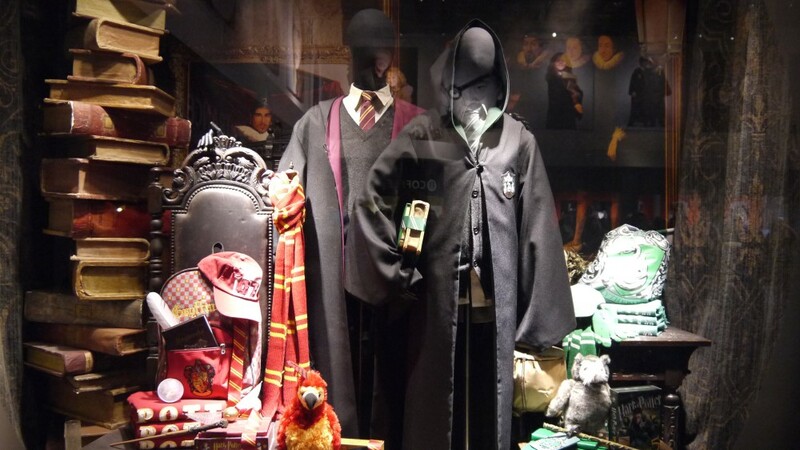 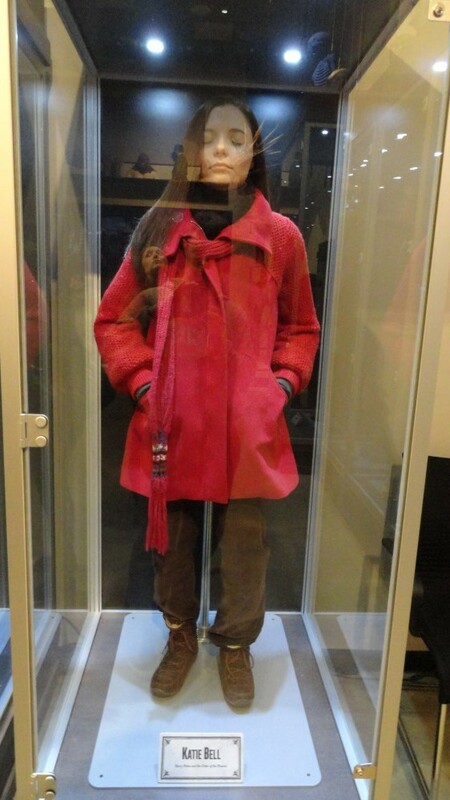 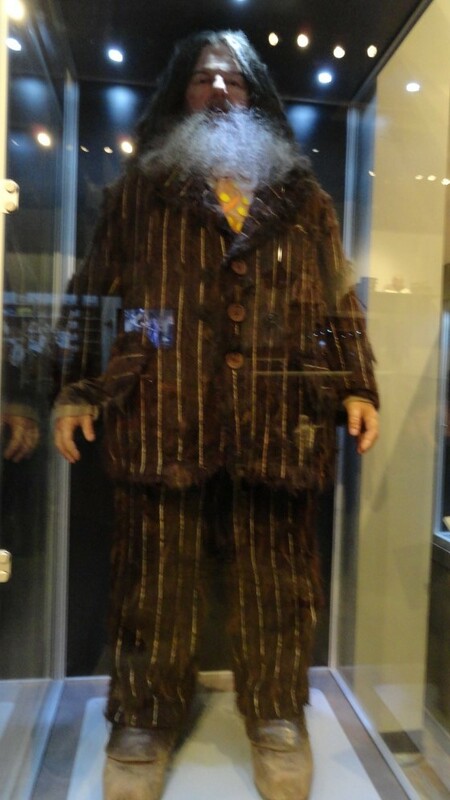 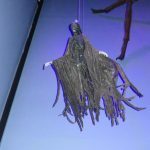 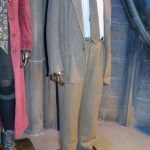 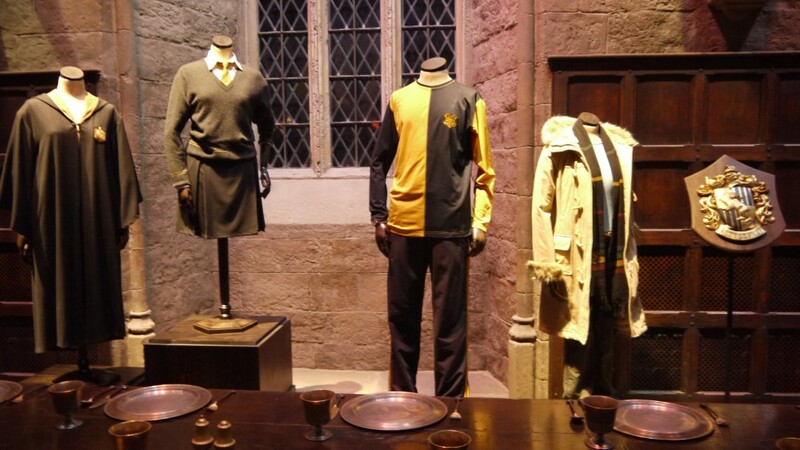 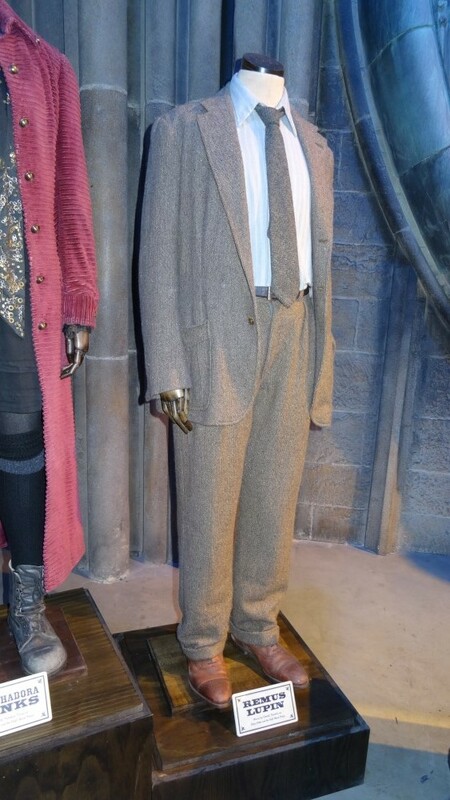 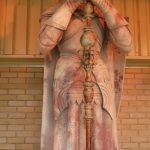 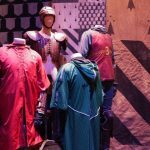 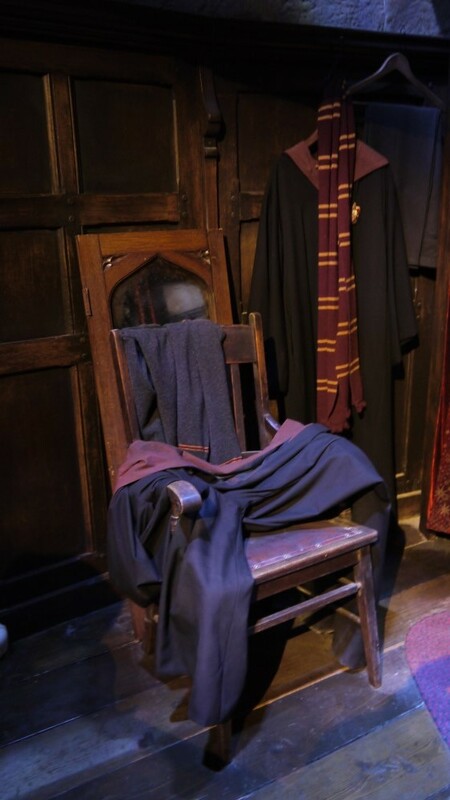 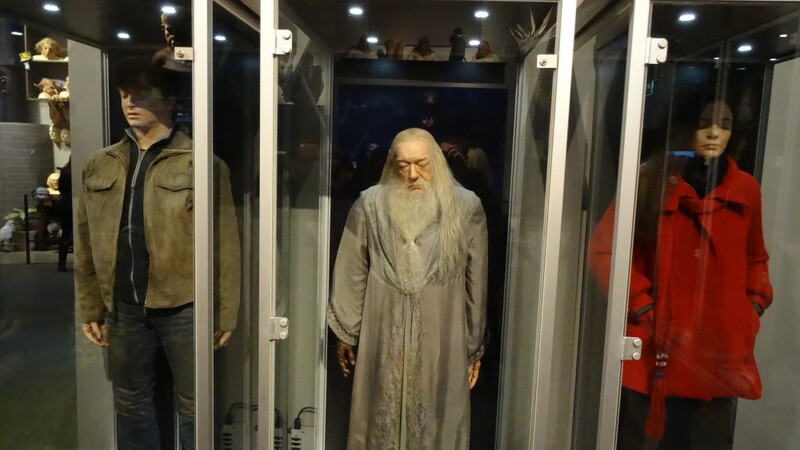 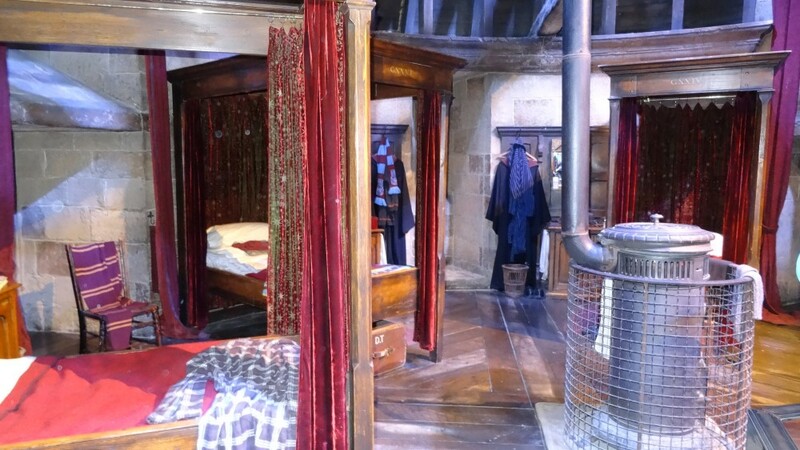 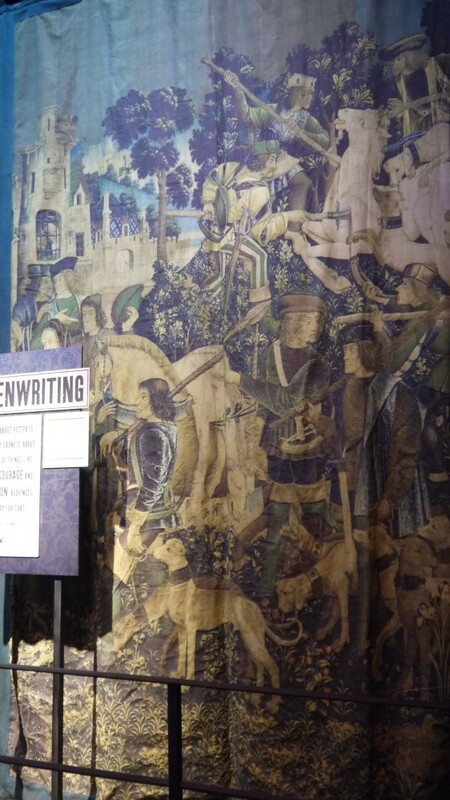 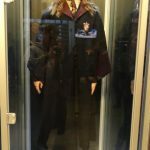 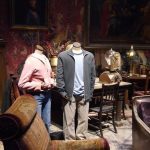 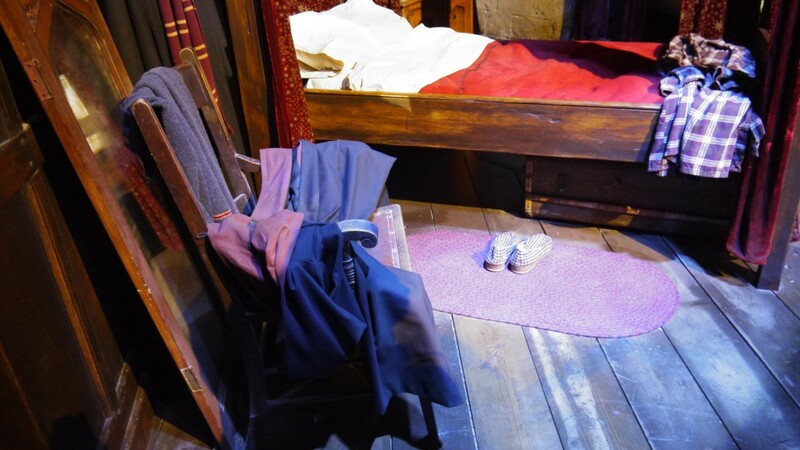 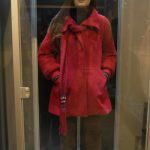 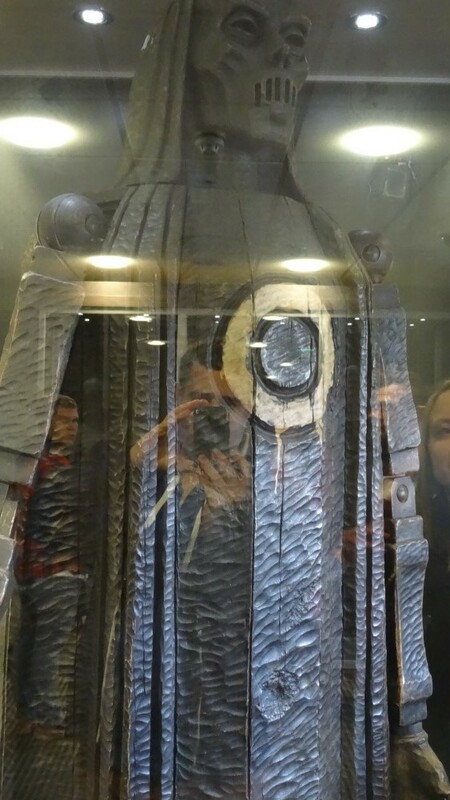 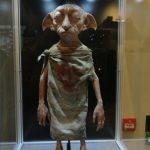 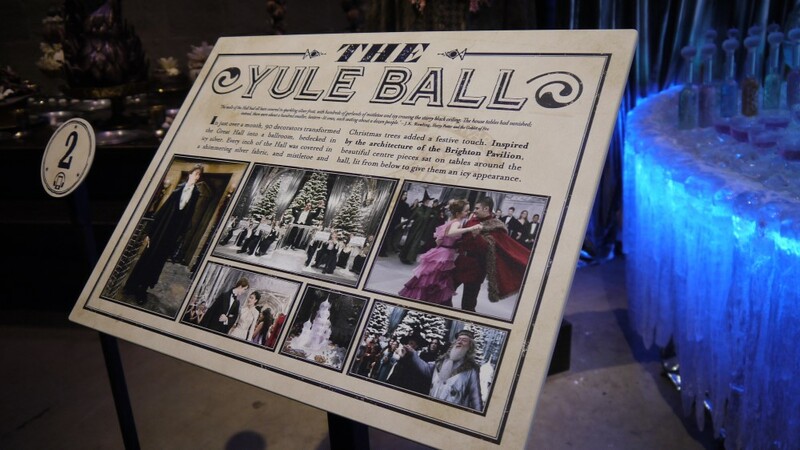 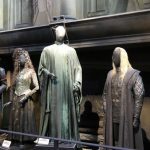 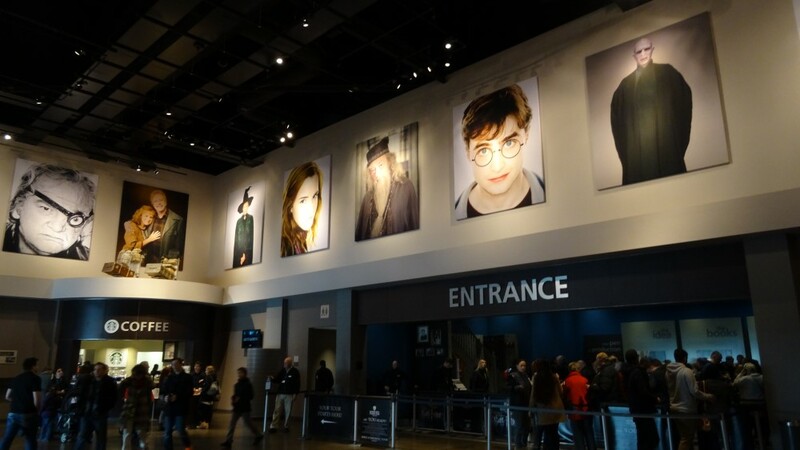 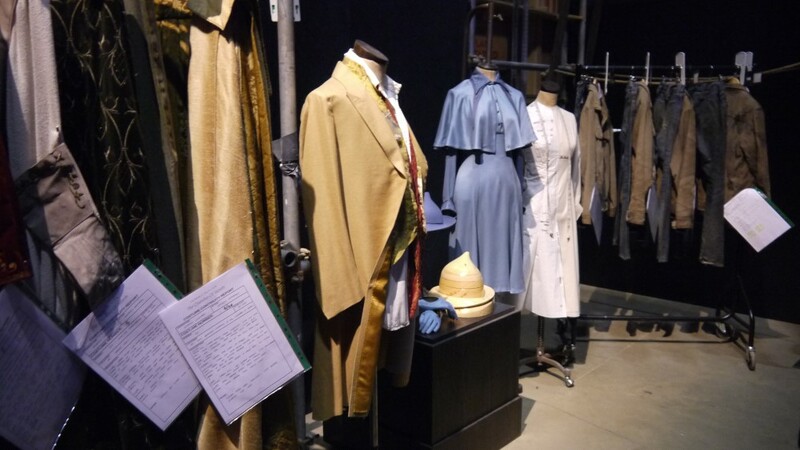 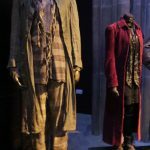 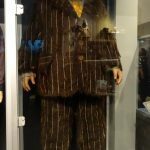 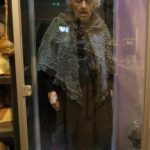 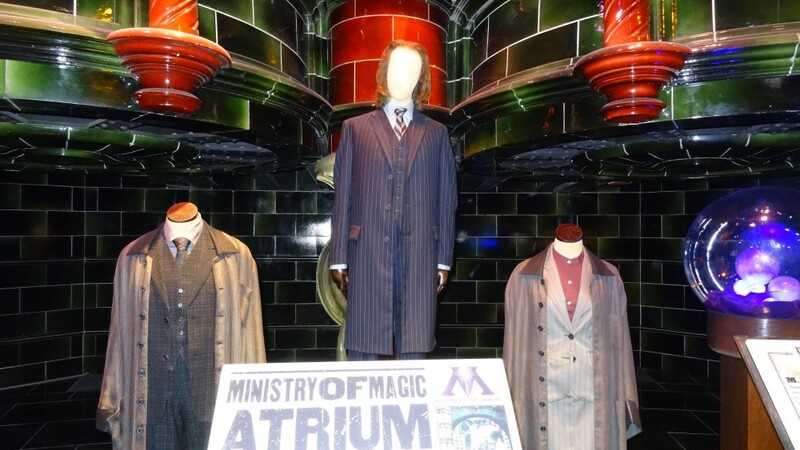 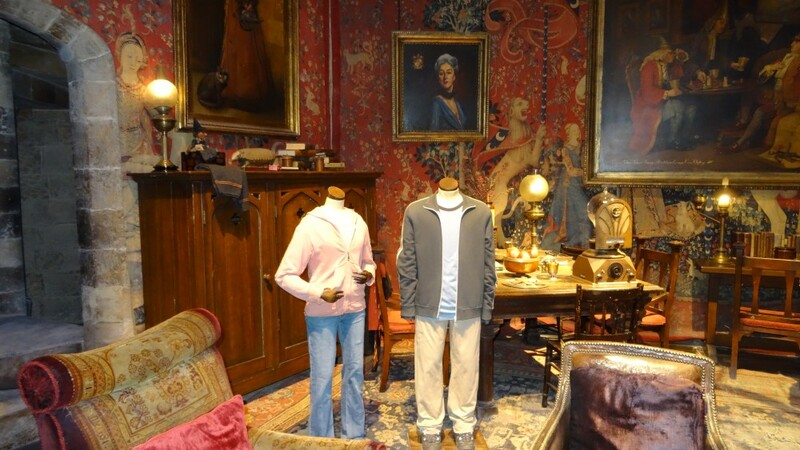 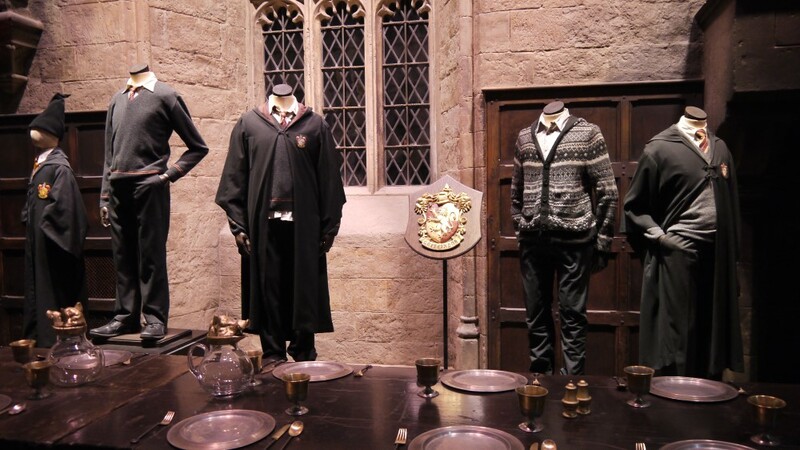 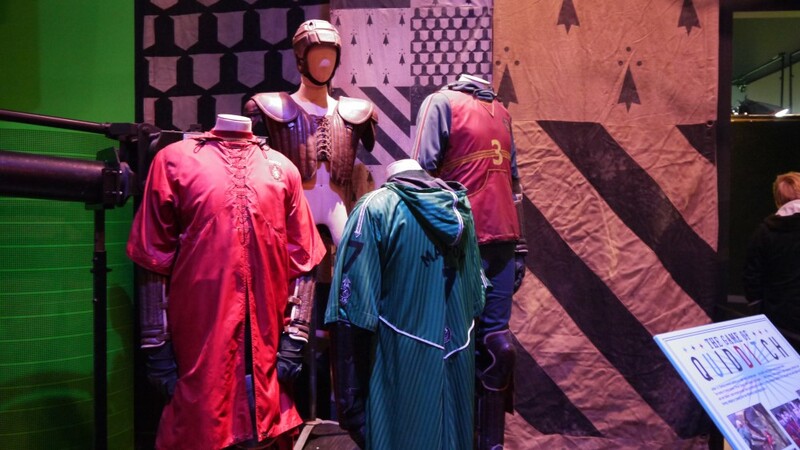 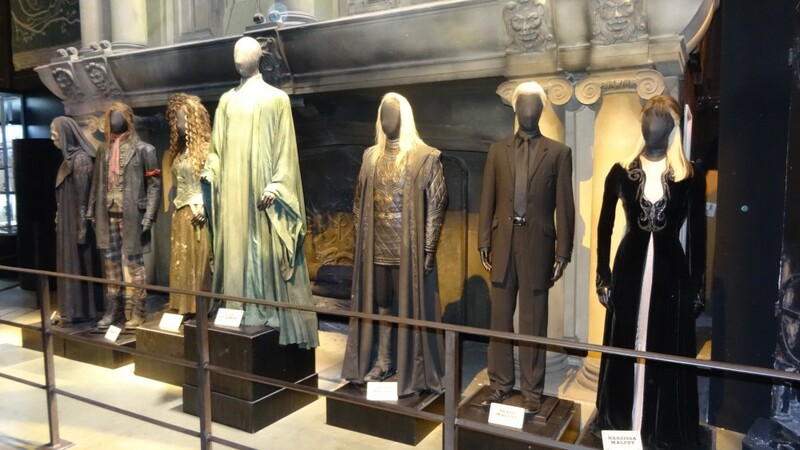 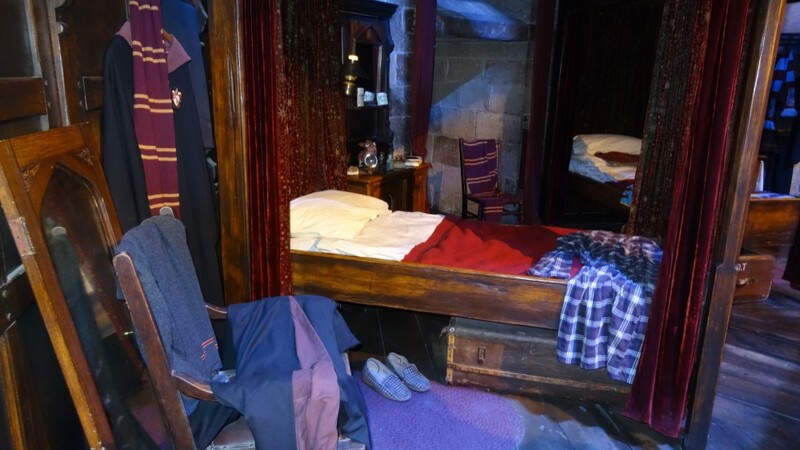 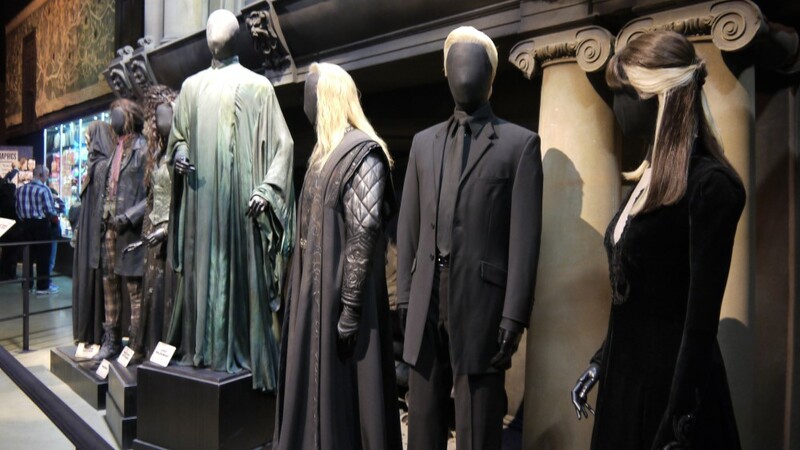 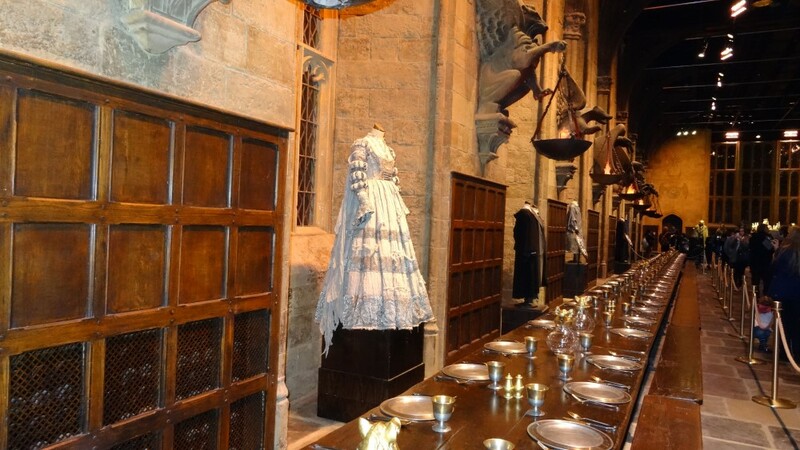 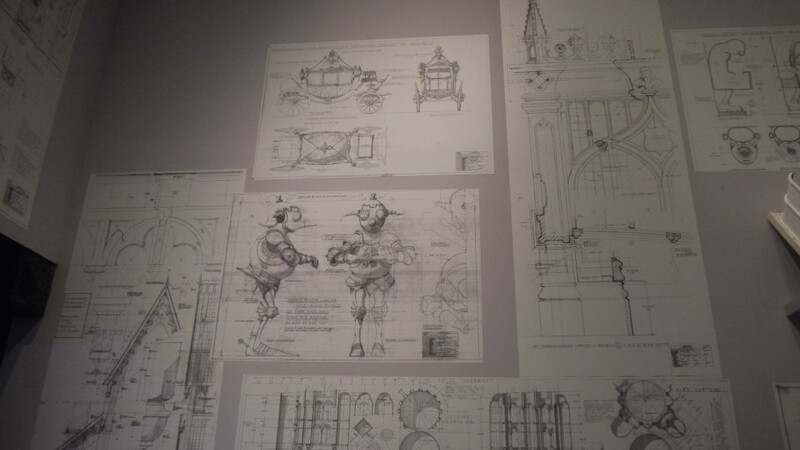 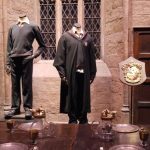 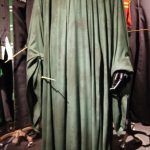 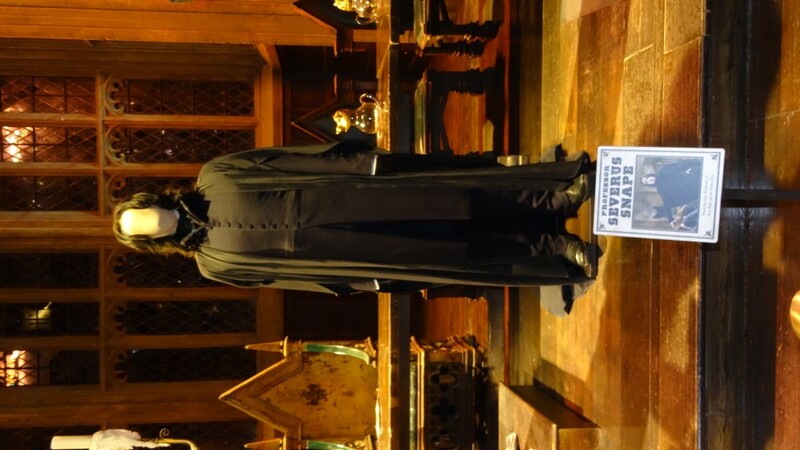 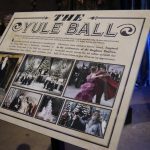 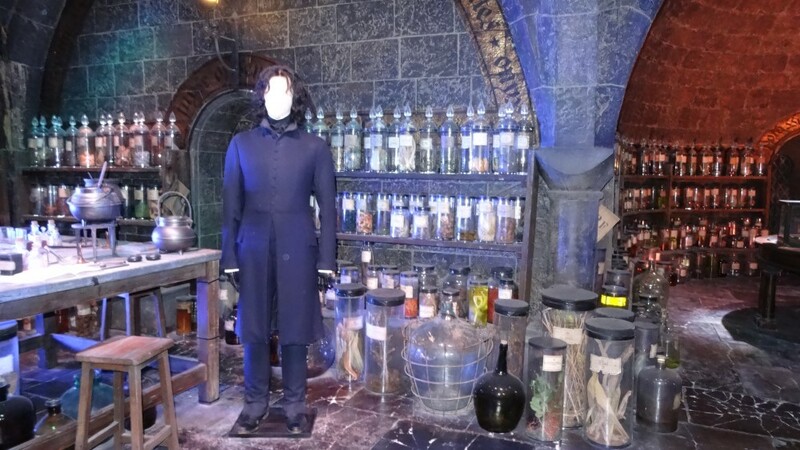 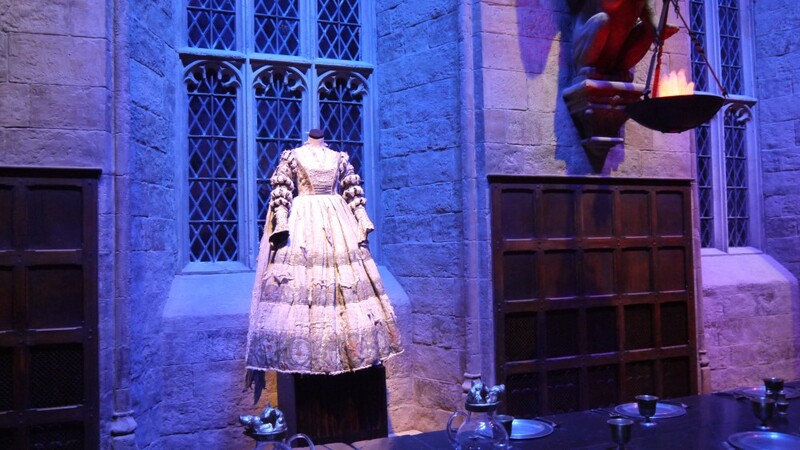 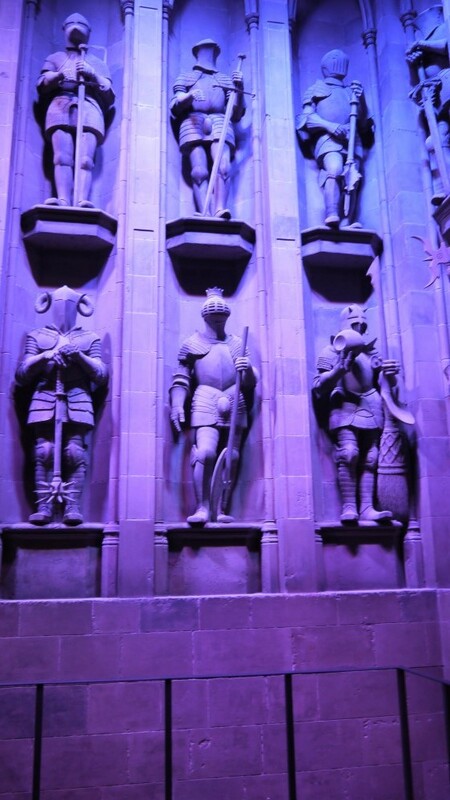 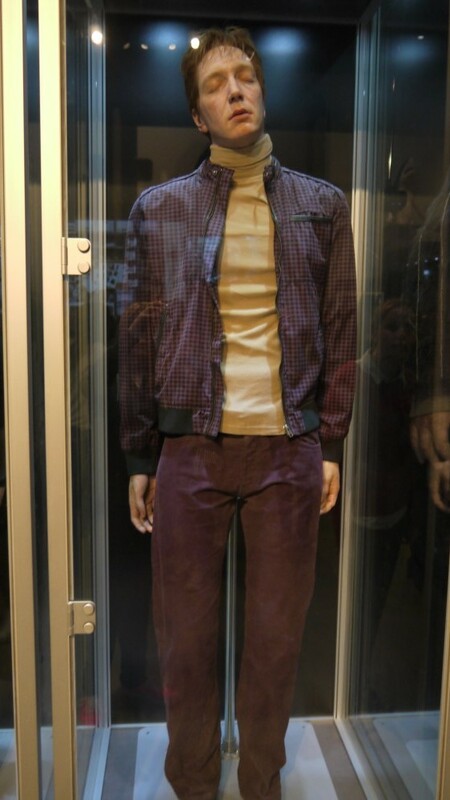 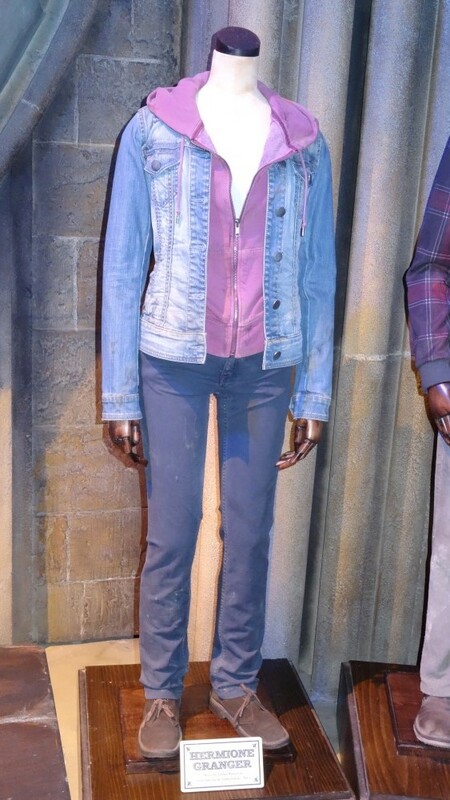 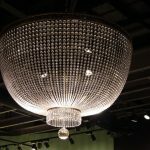 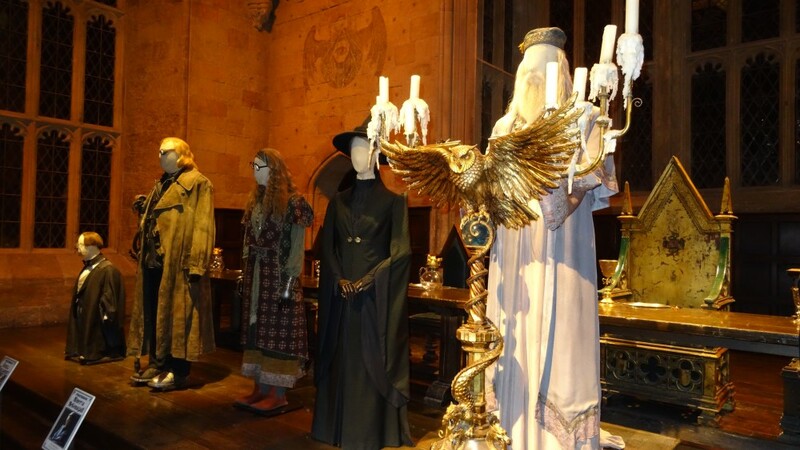 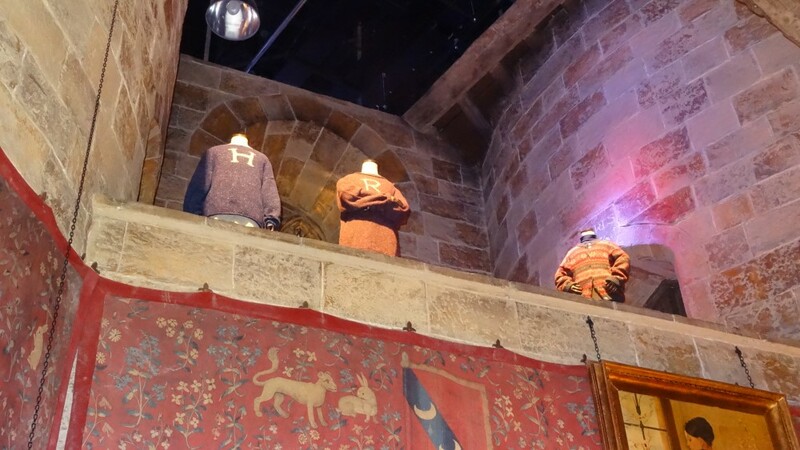 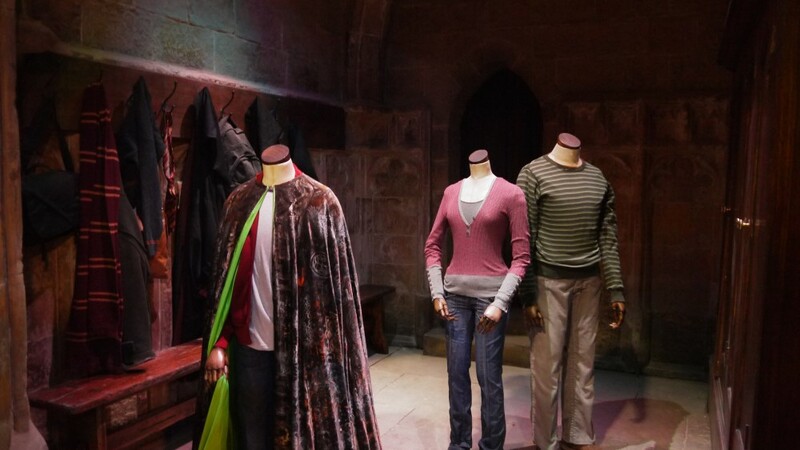 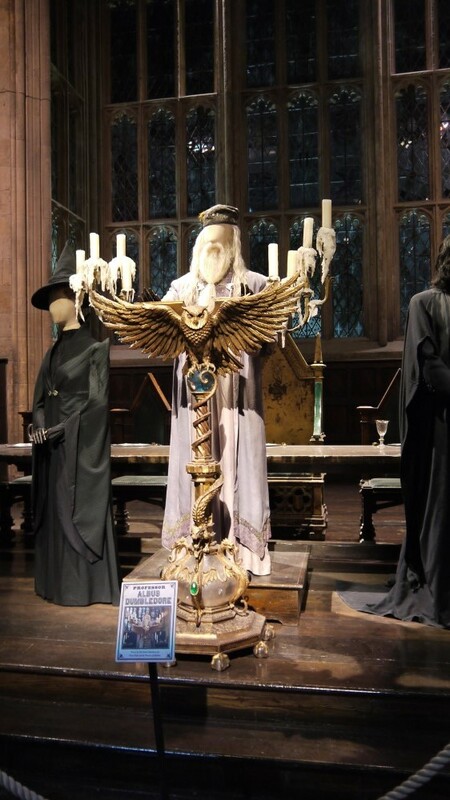 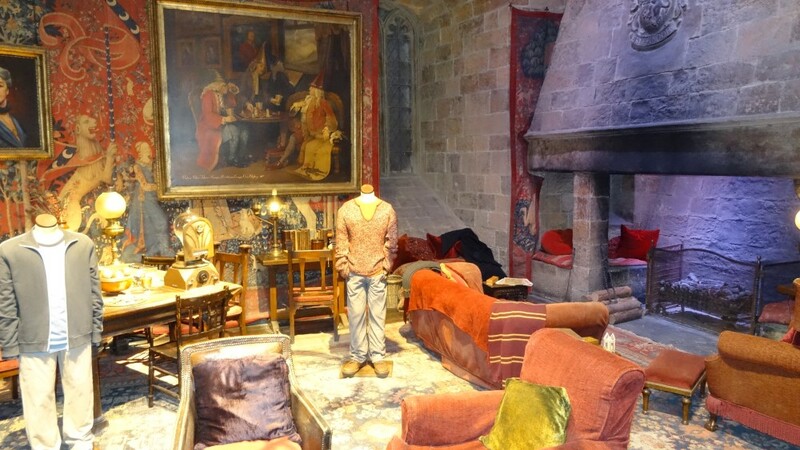 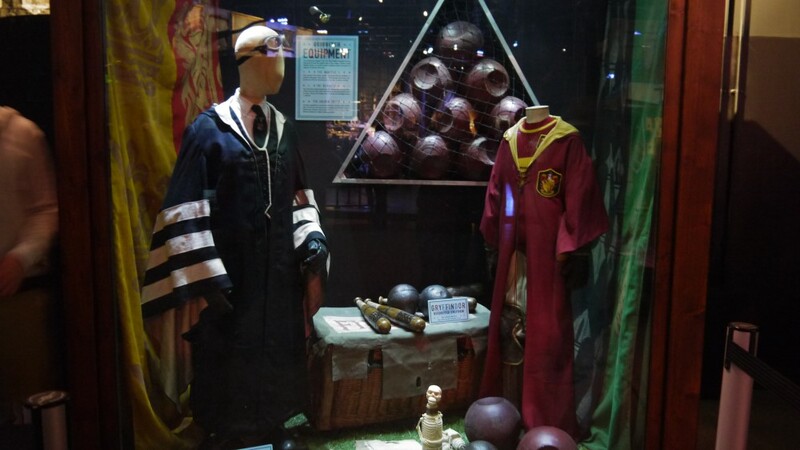 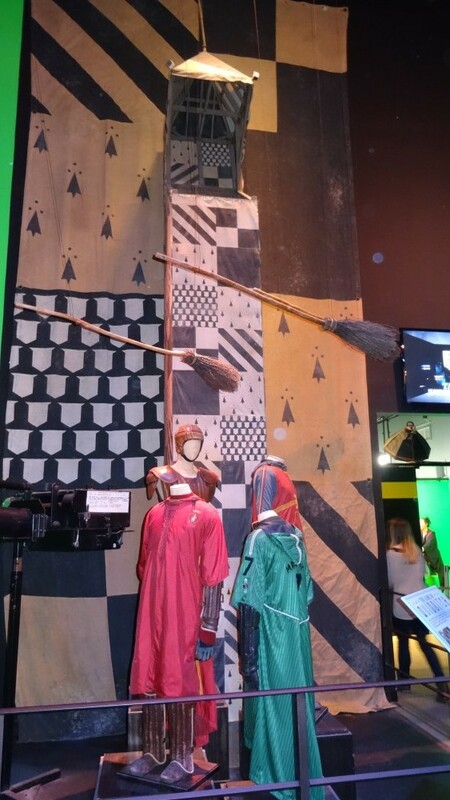 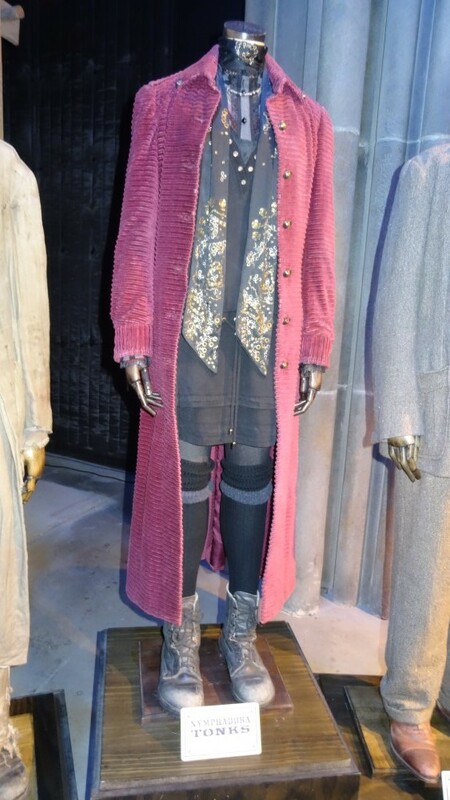 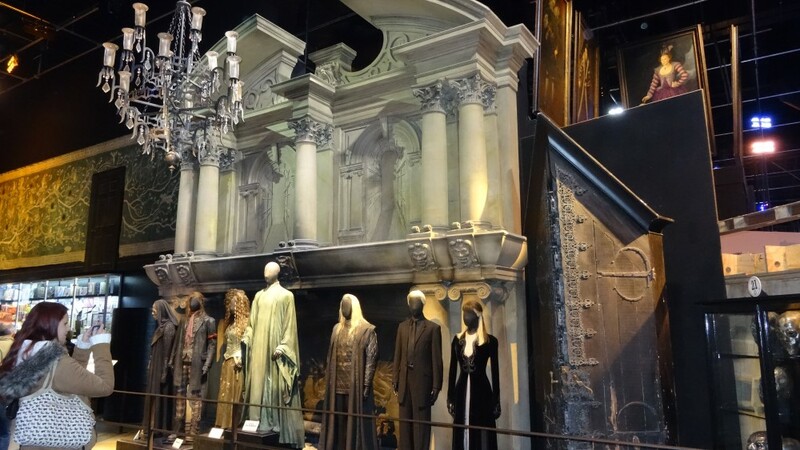 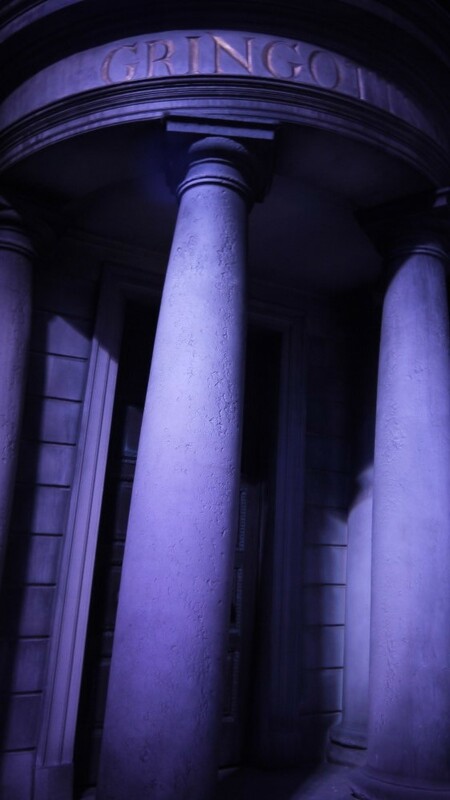 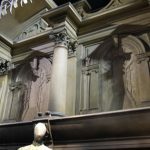 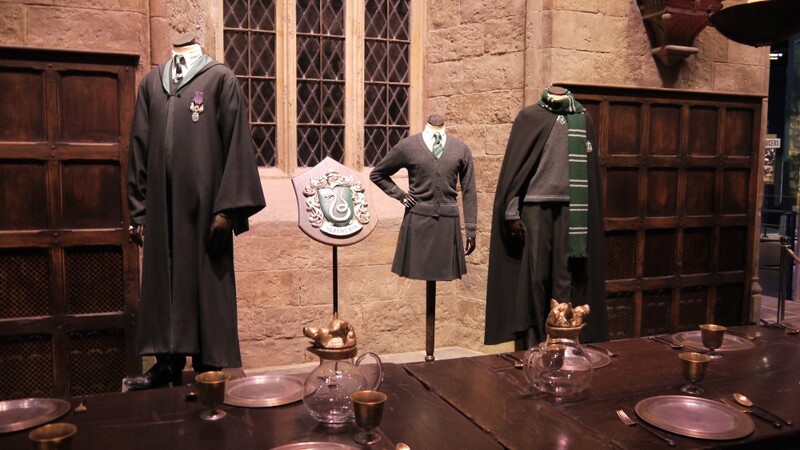 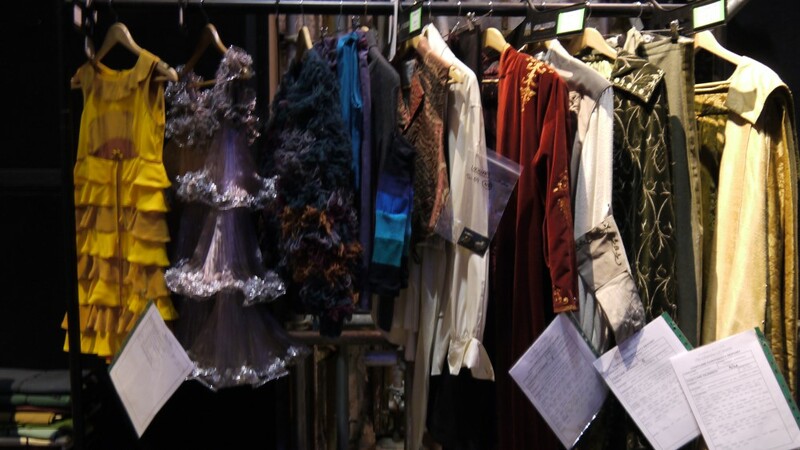 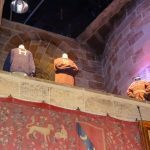 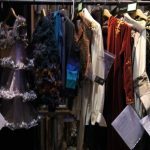 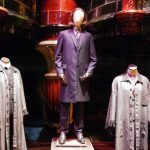 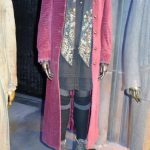 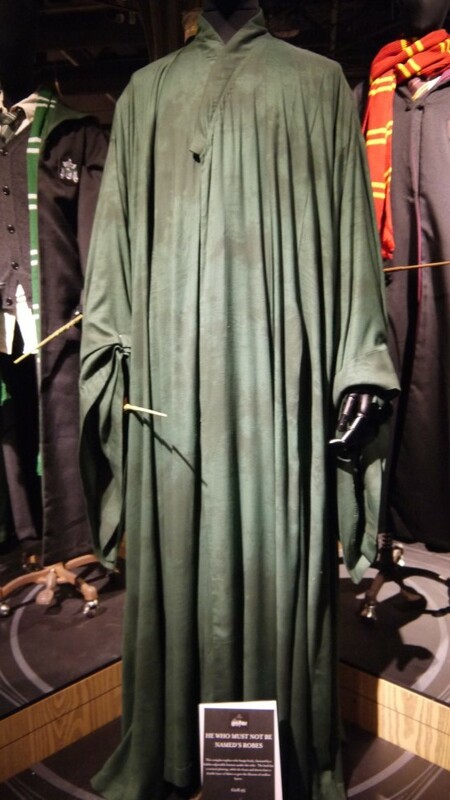 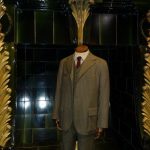 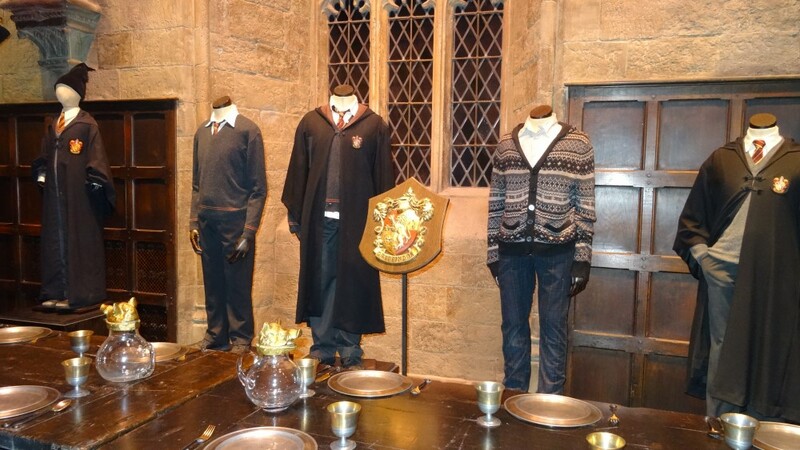 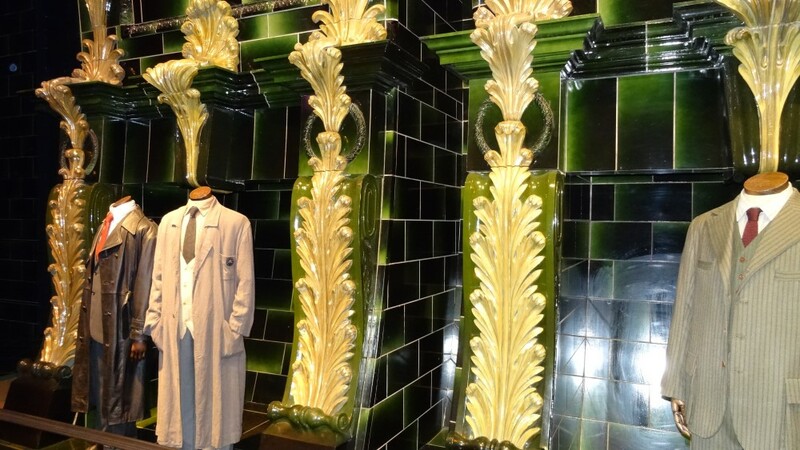 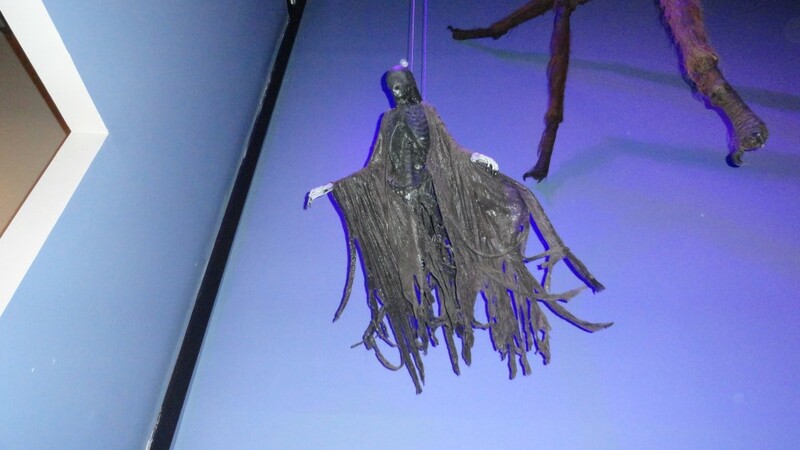 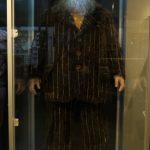 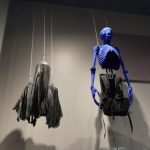 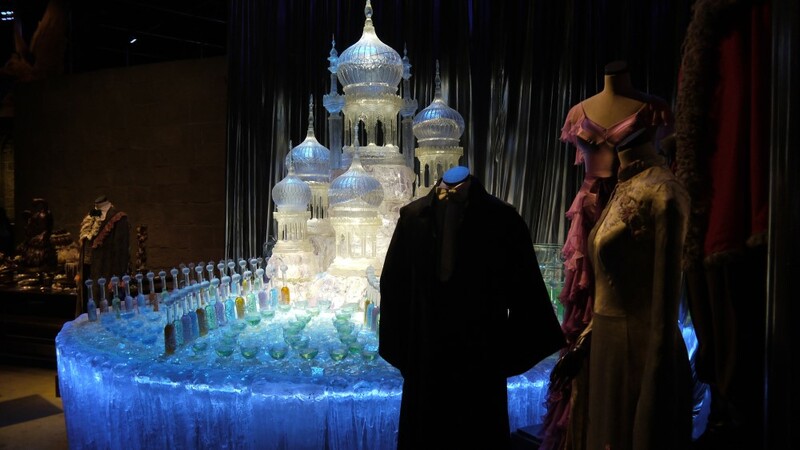 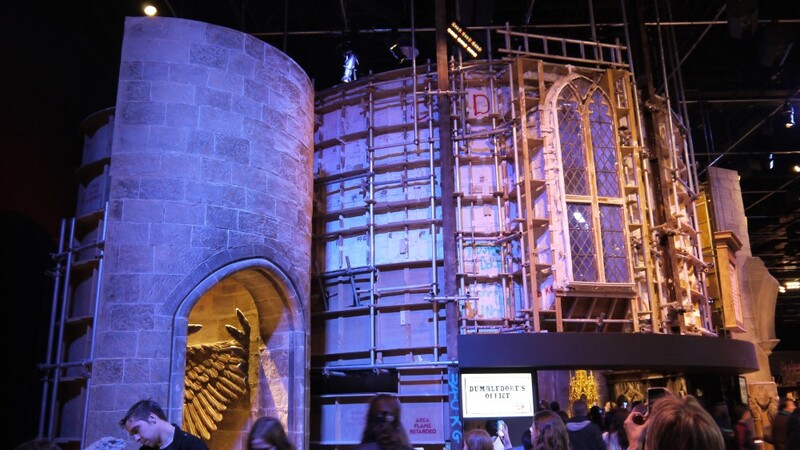 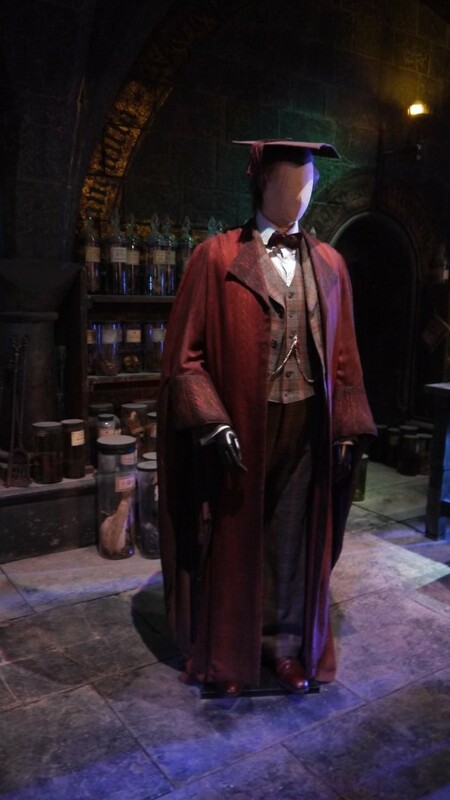 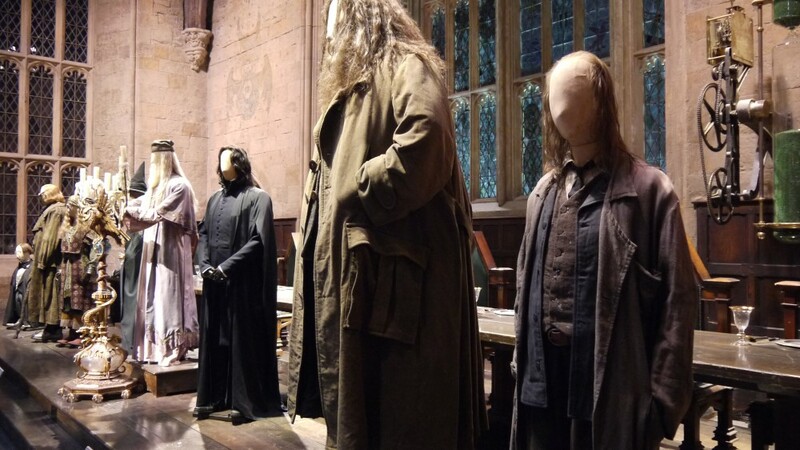 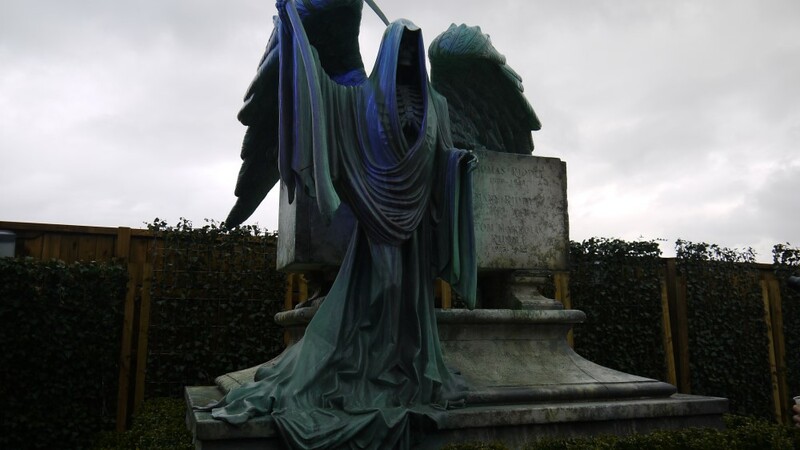 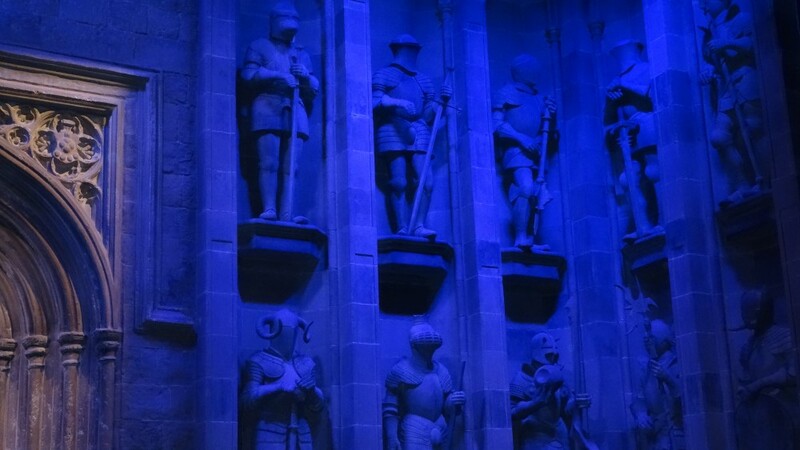 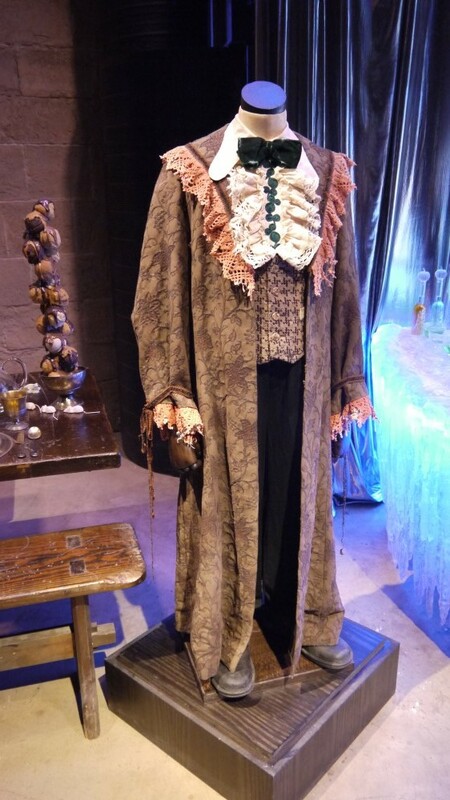 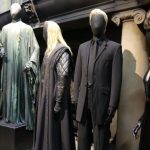 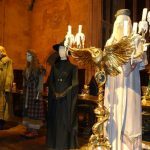 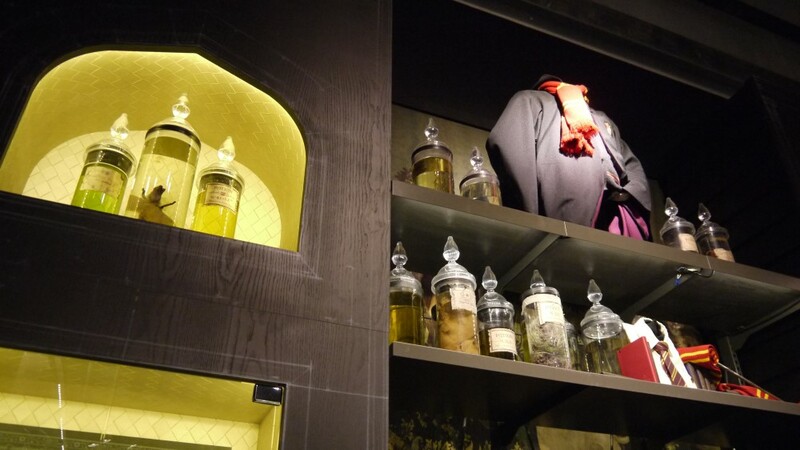 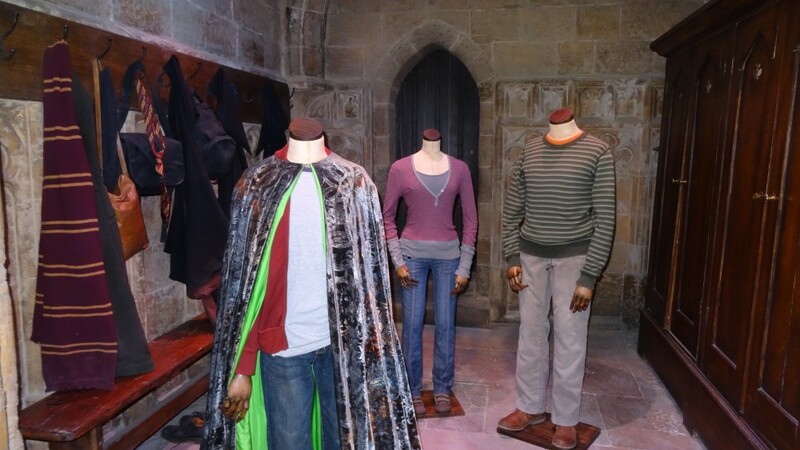 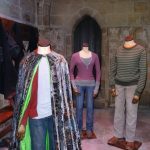 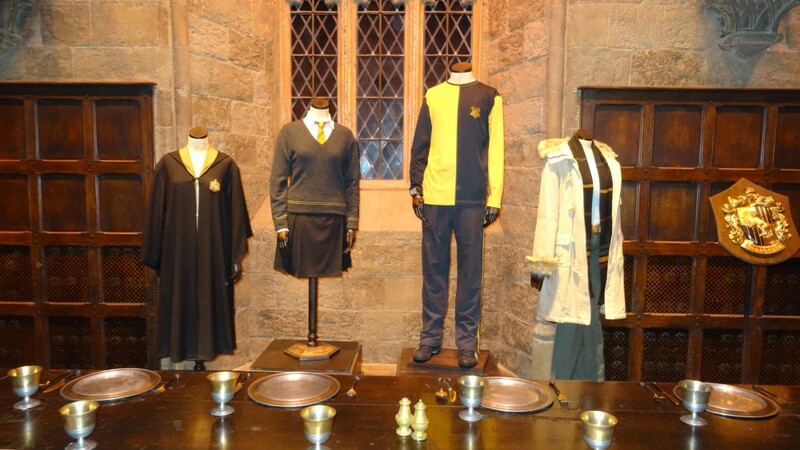 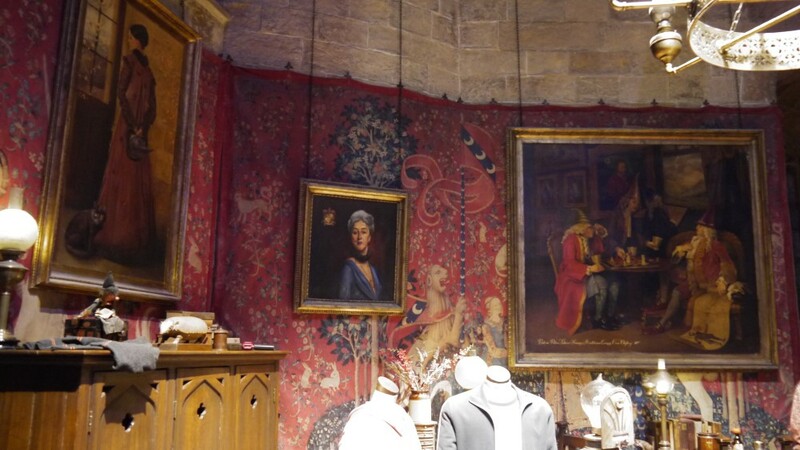 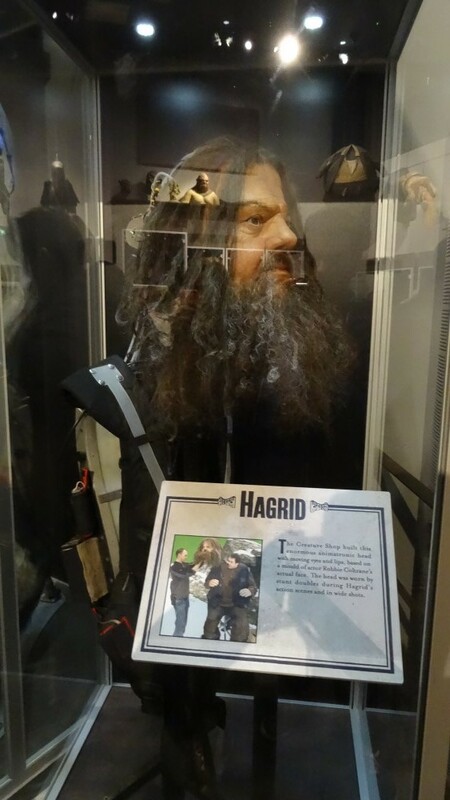 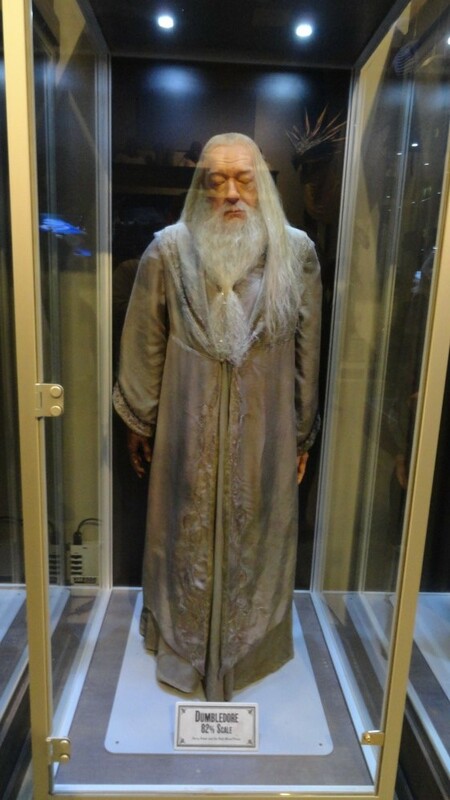 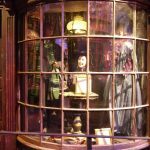 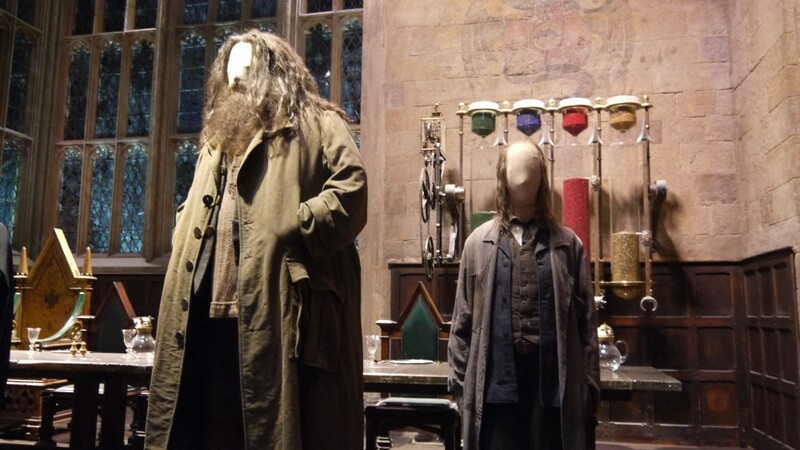 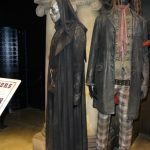 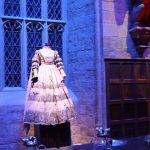 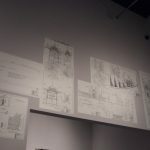 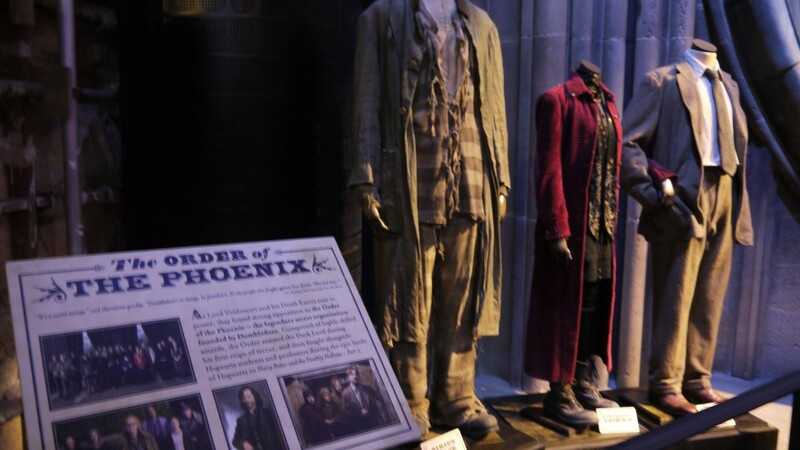 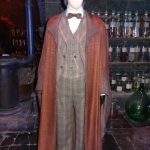 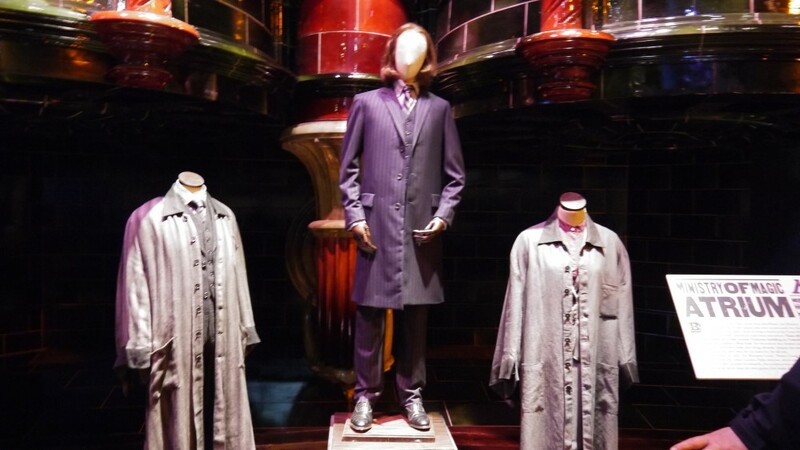 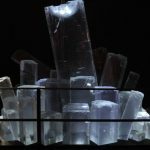 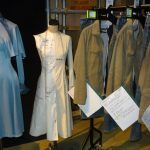 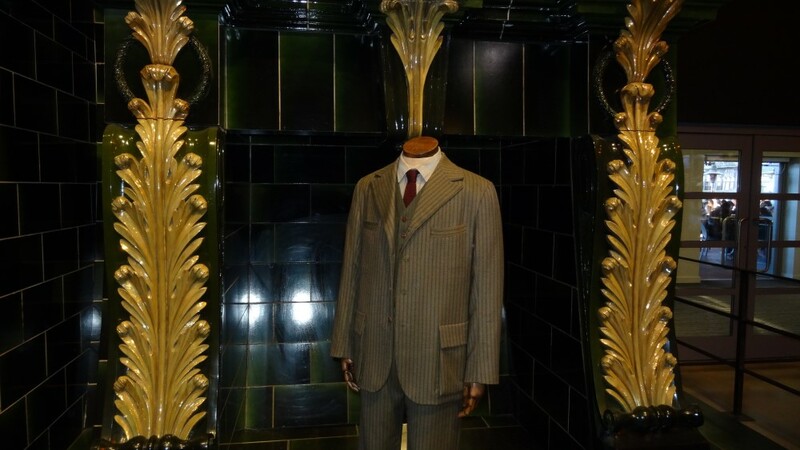 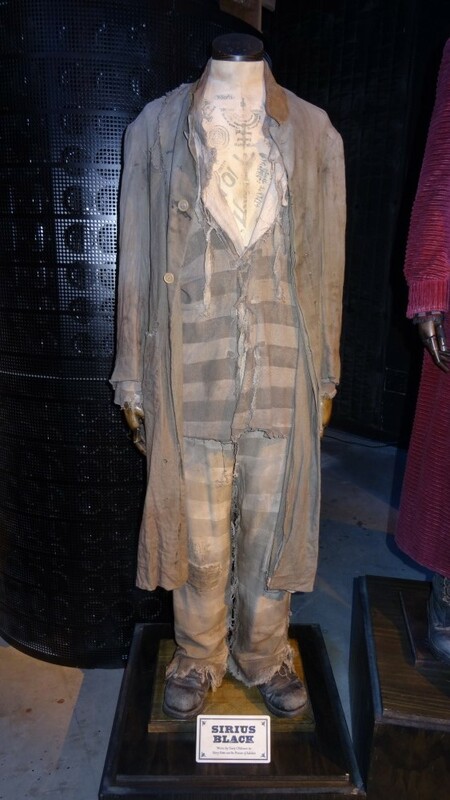 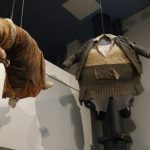 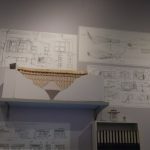 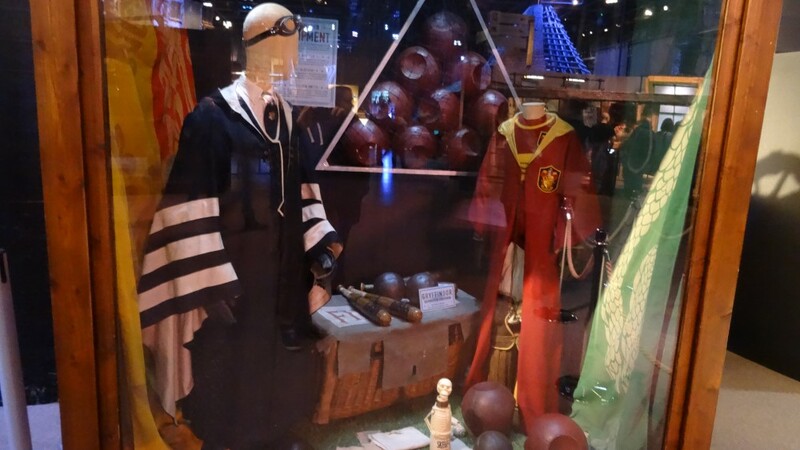 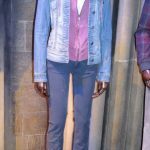 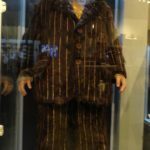 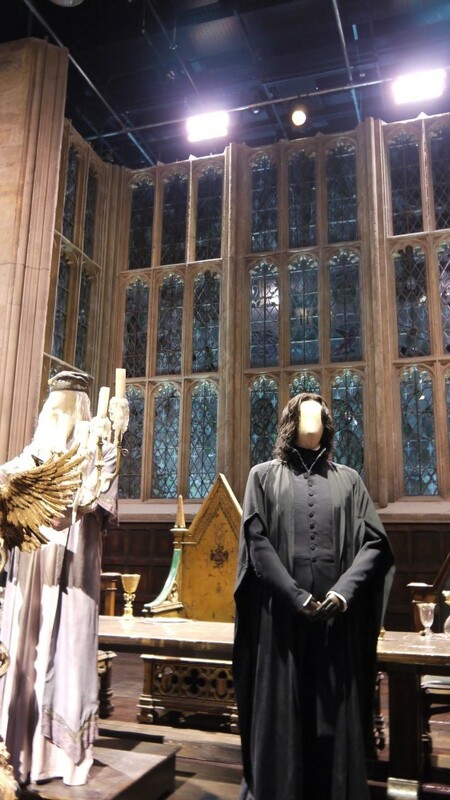 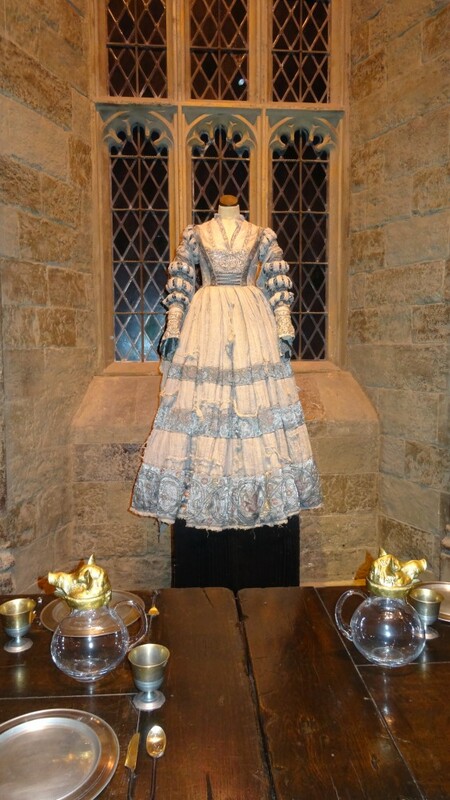 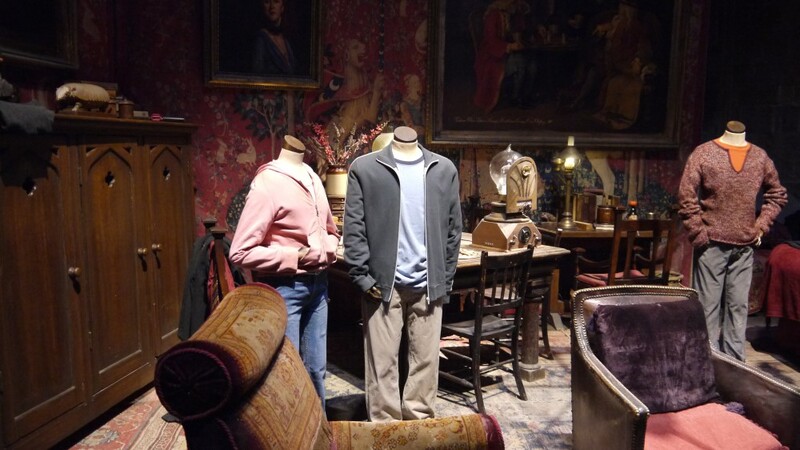 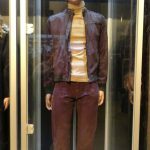 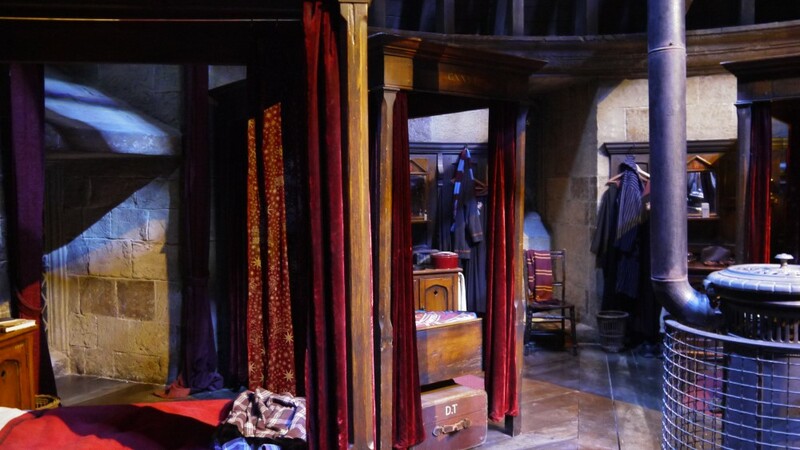 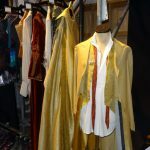 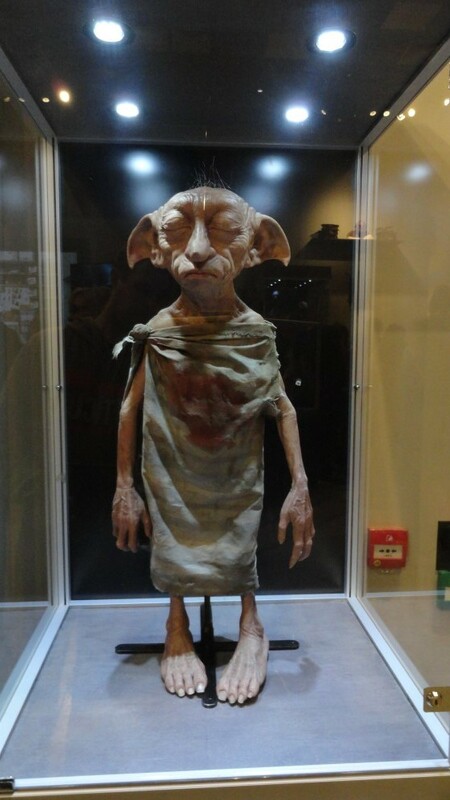 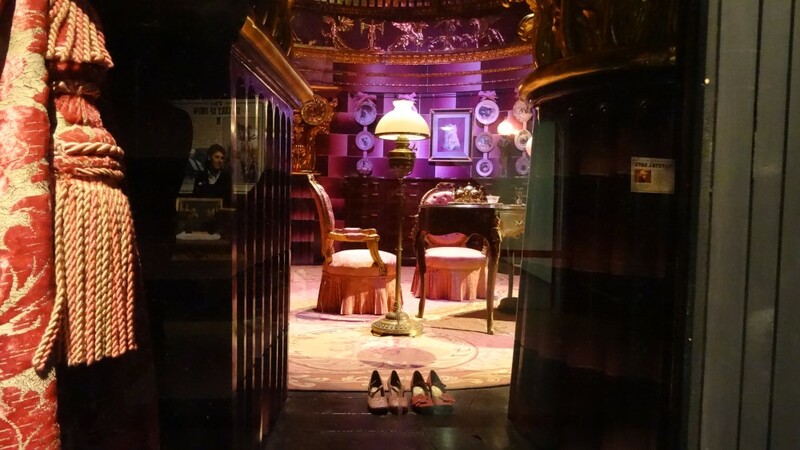 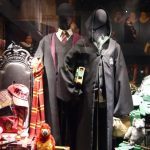 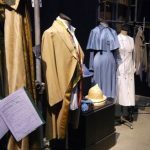 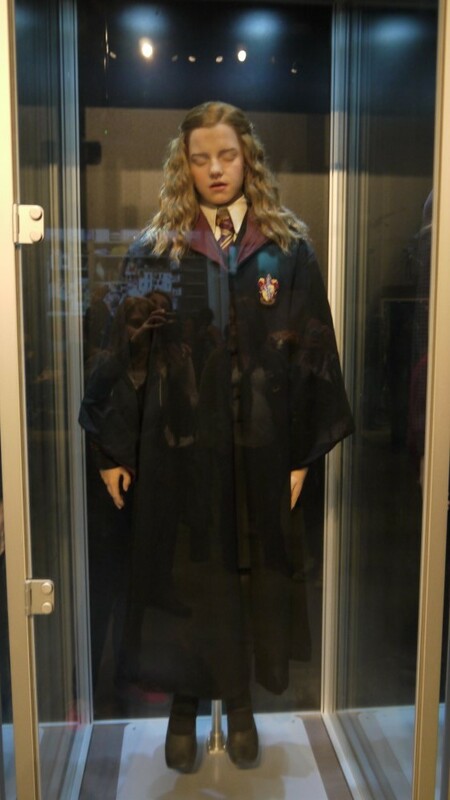 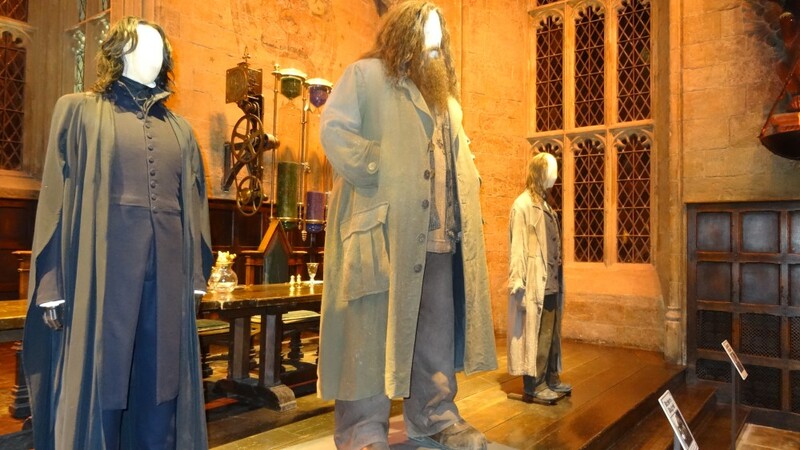 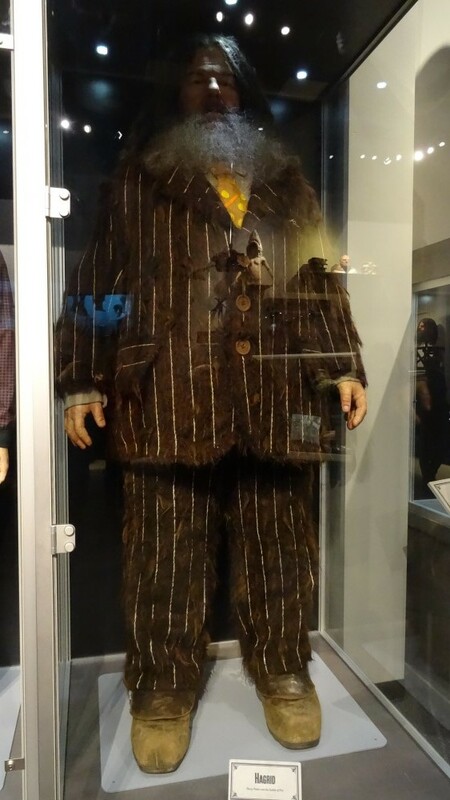 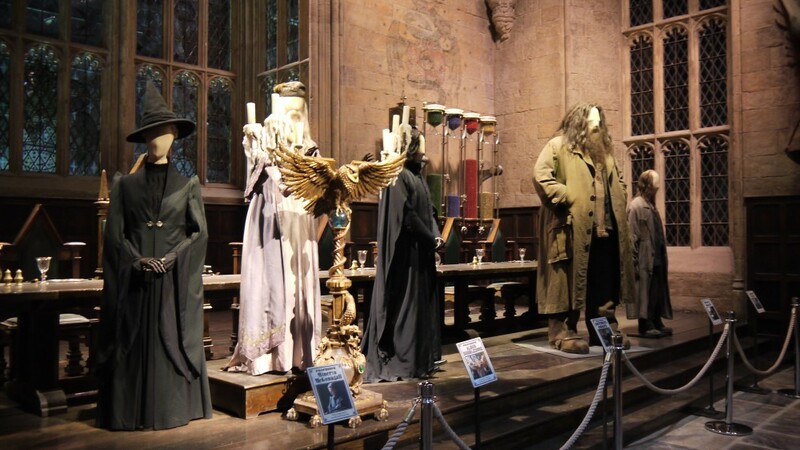 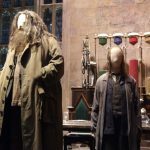 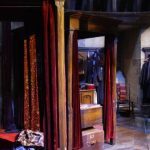 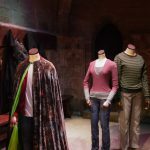 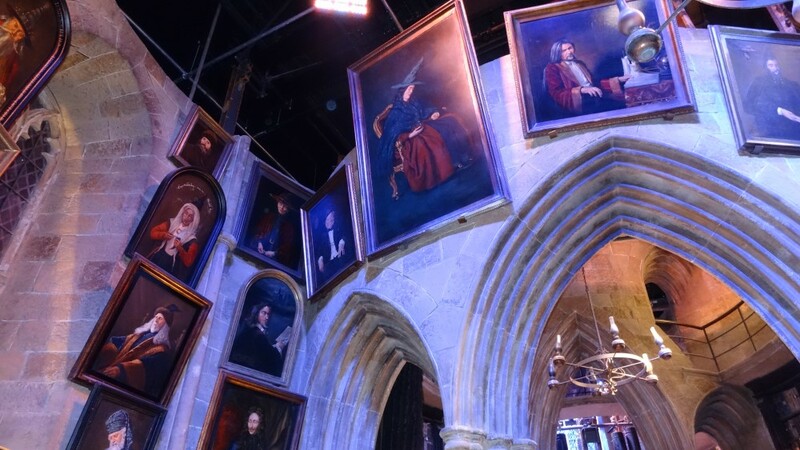 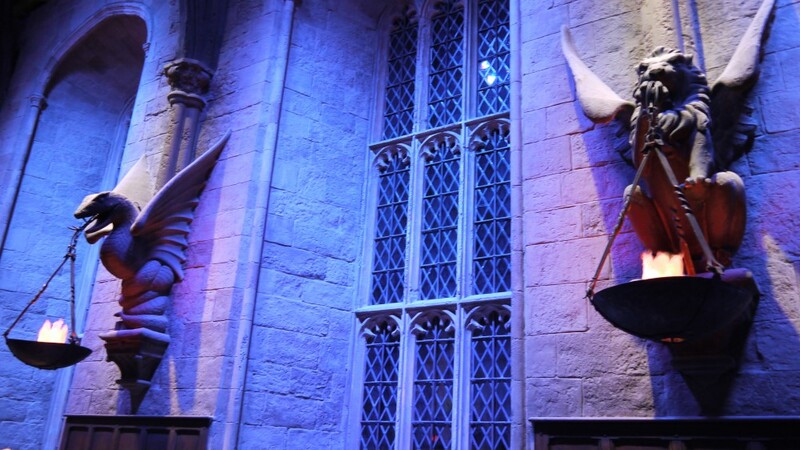 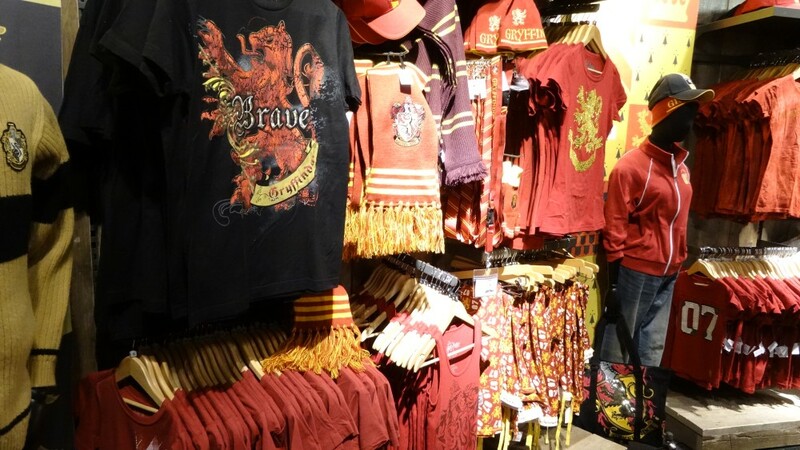 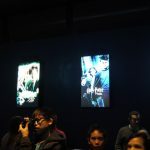 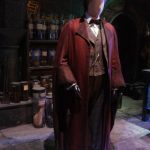 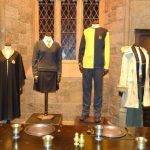 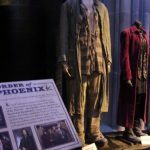 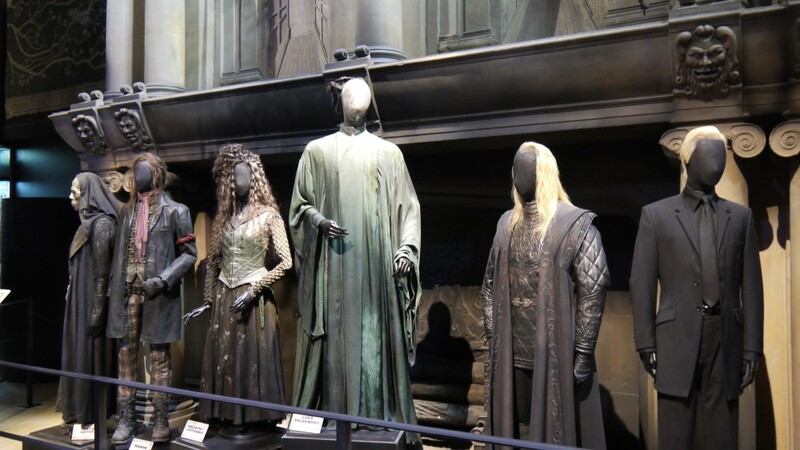 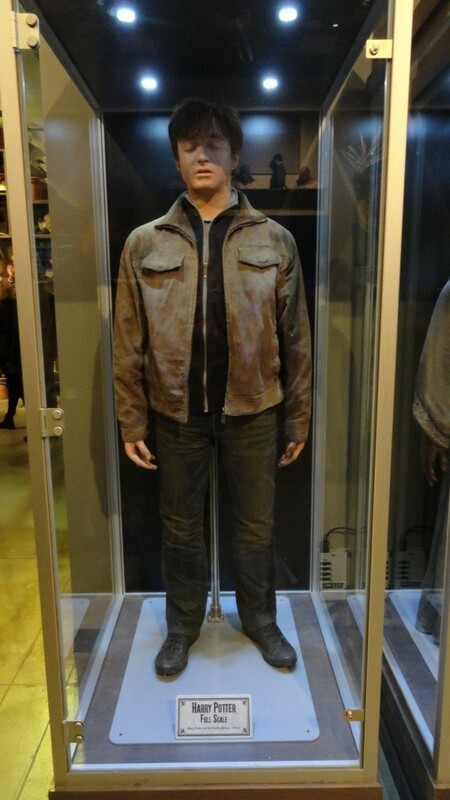 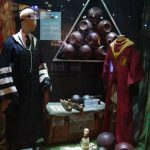 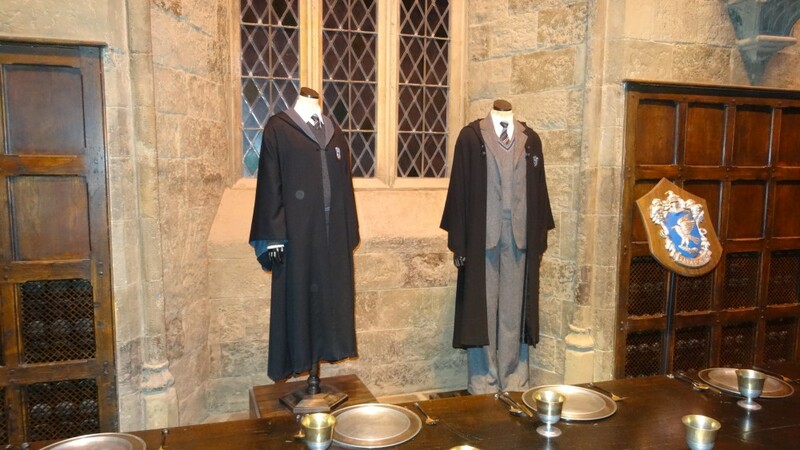 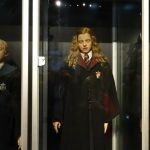 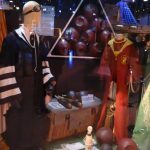 Thousands of costumes were created throughout all eight films, including hundreds of Hogwarts school robes (Daniel Radcliffe’s very first set is here at the Studio Tour), Hermione’s beautiful Yule Ball gown and several spooky ghost costumes. 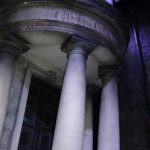 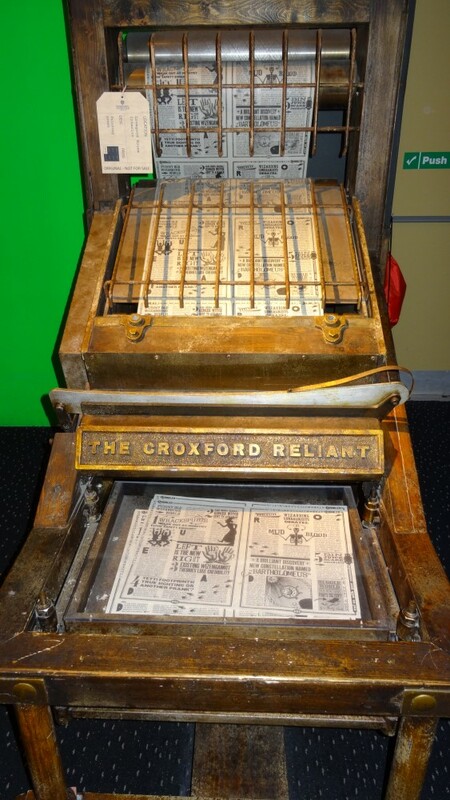 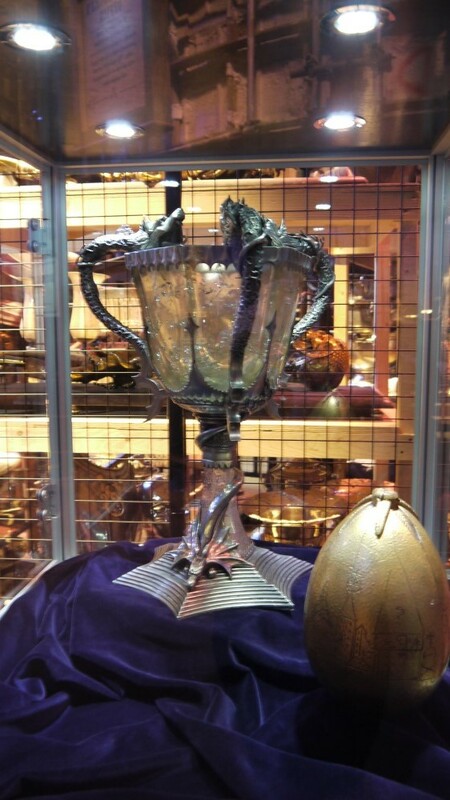 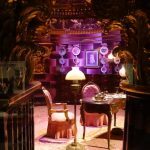 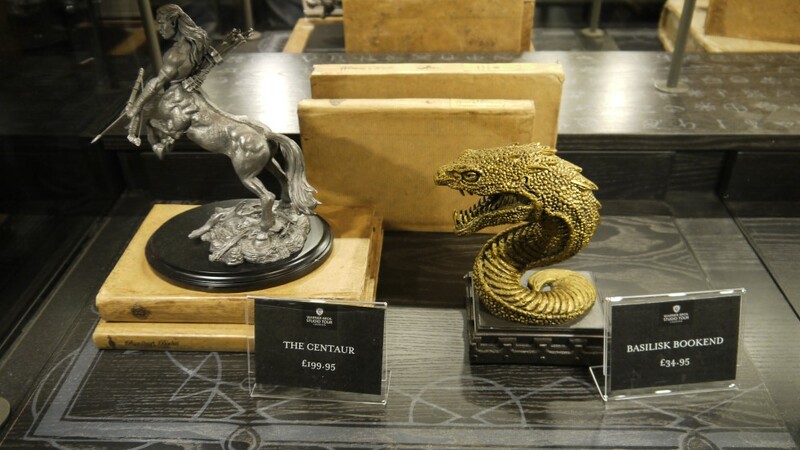 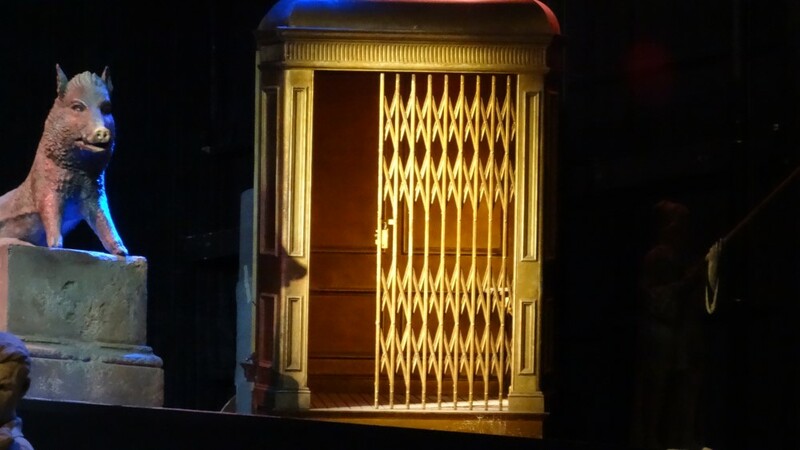 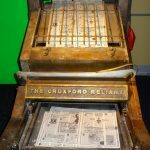 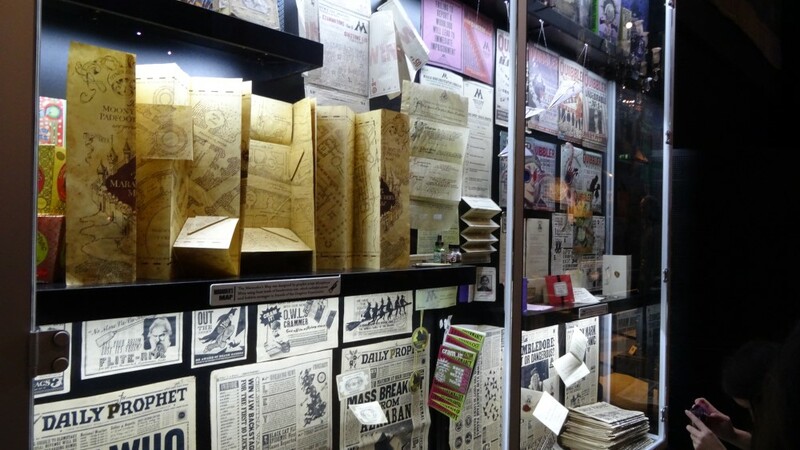 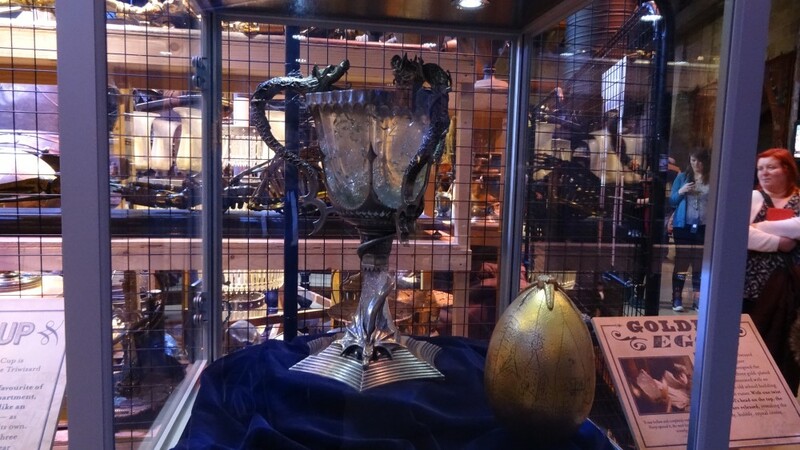 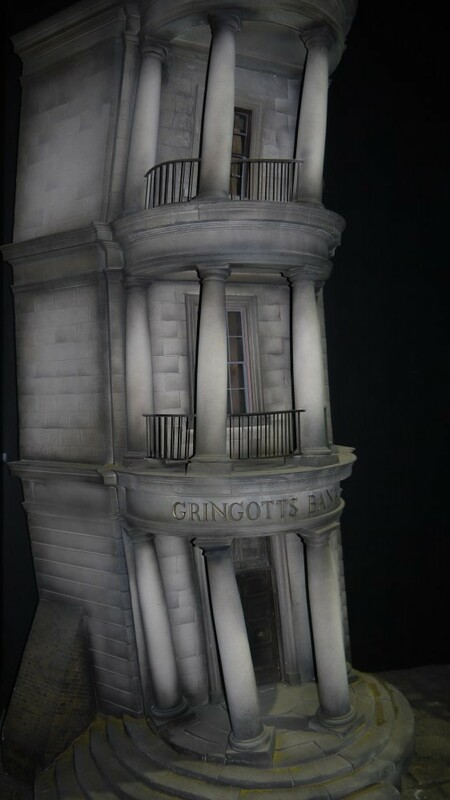 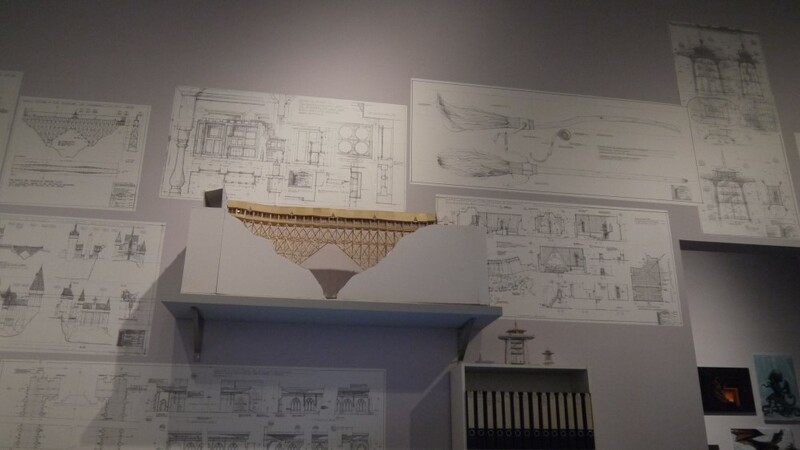 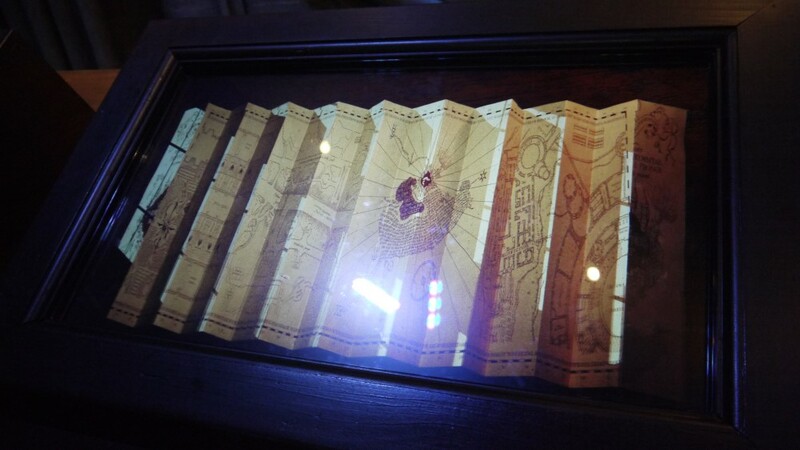 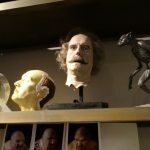 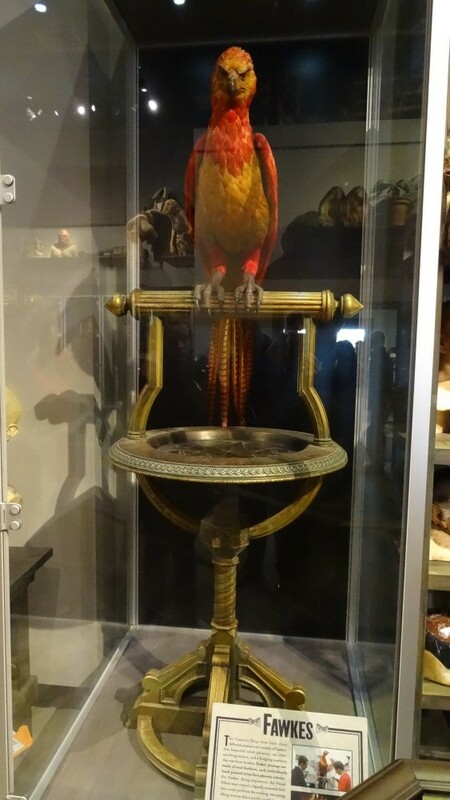 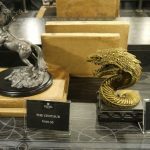 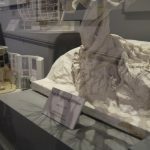 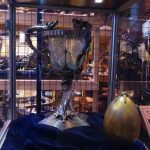 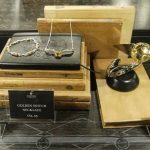 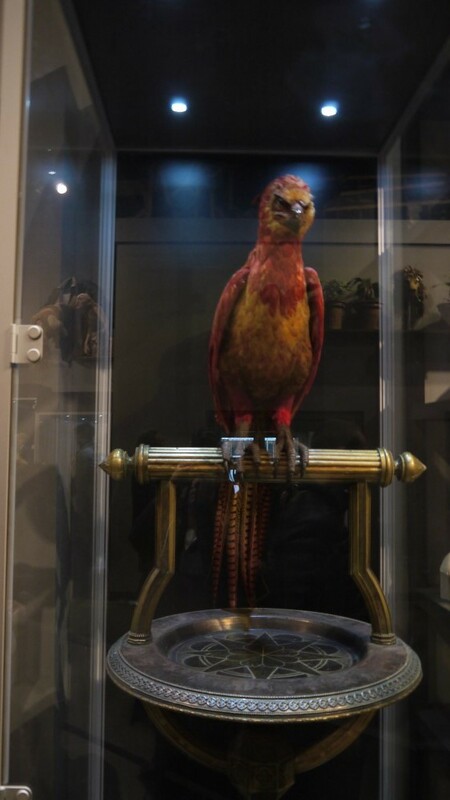 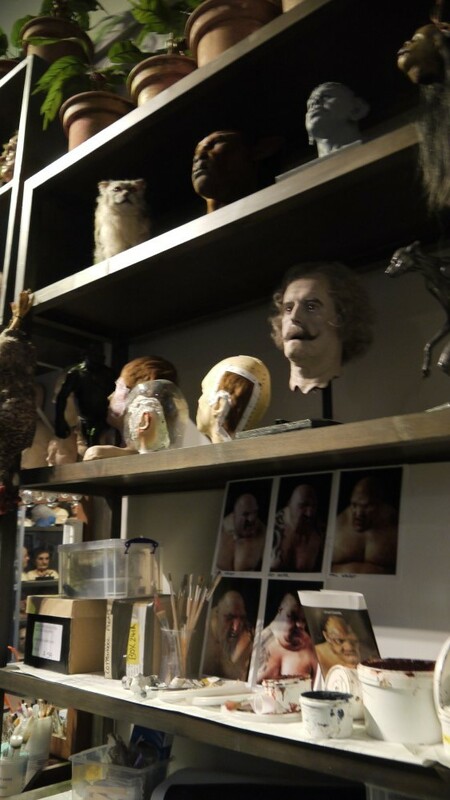 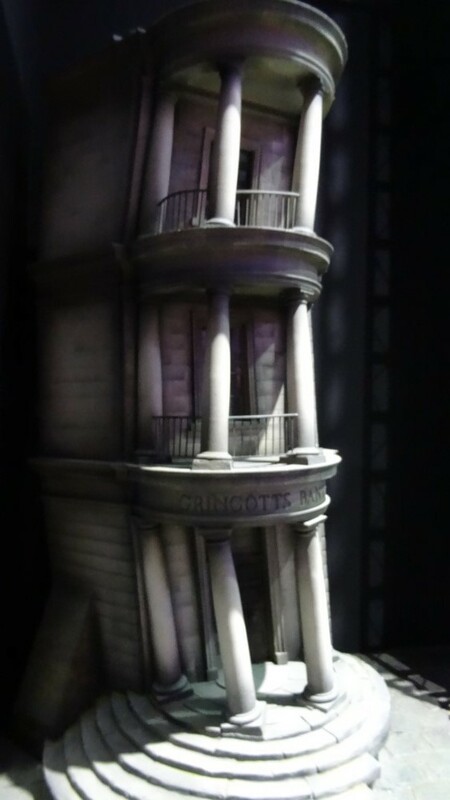 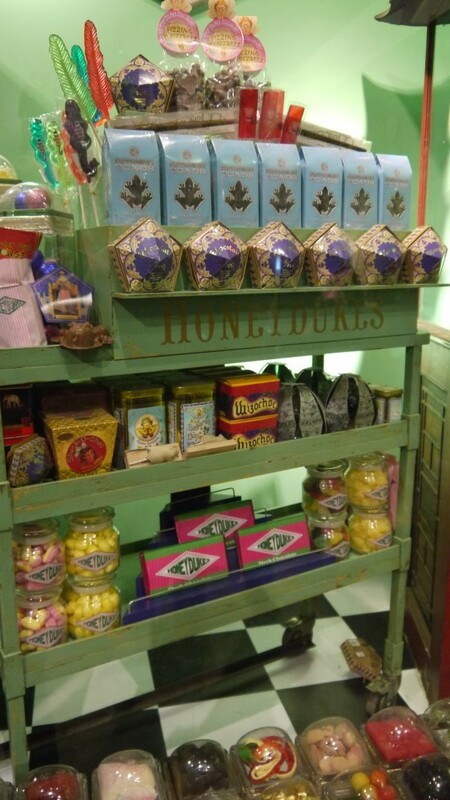 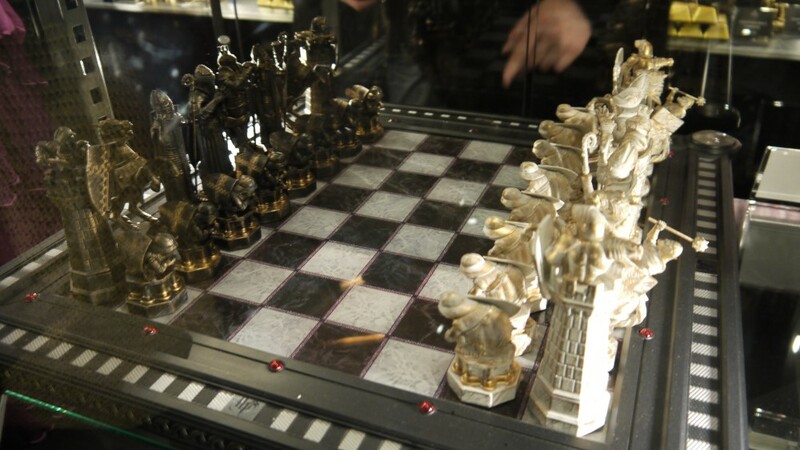 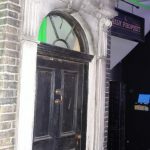 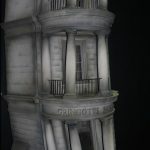 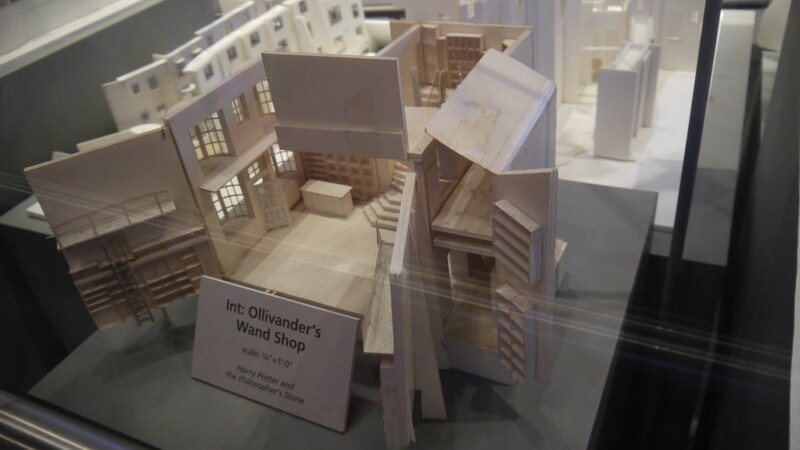 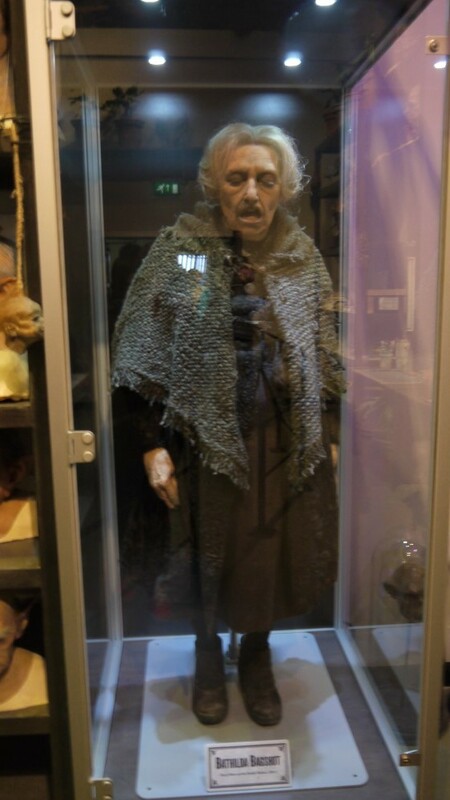 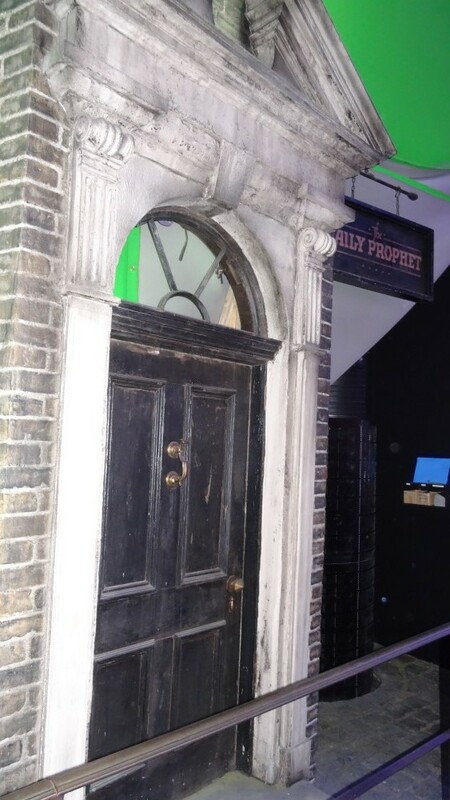 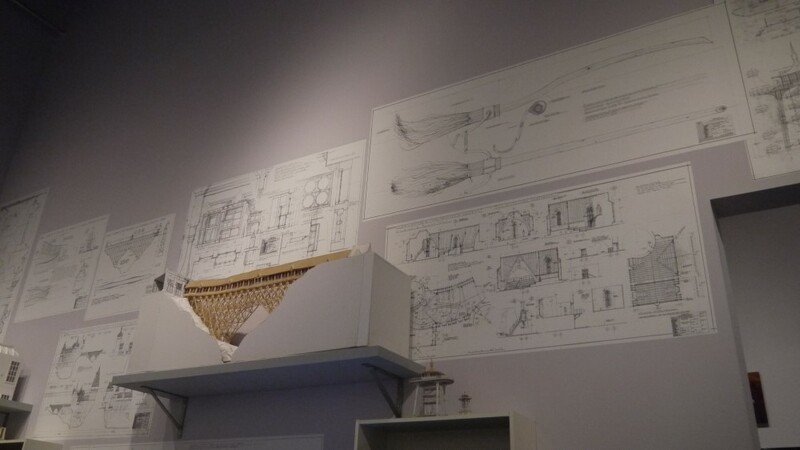 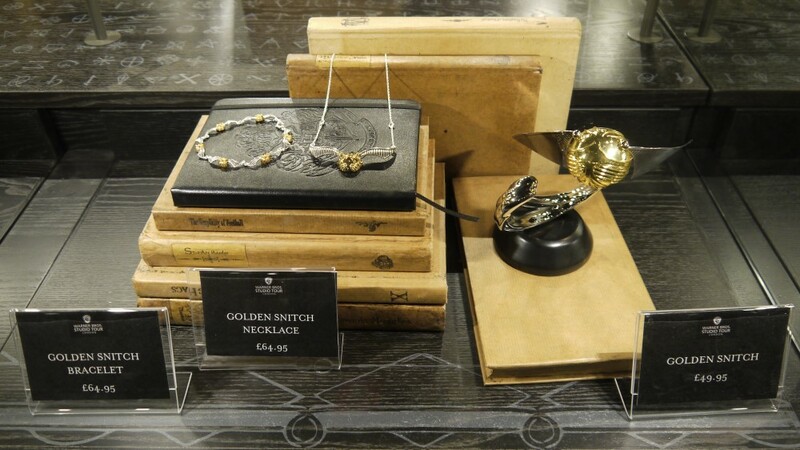 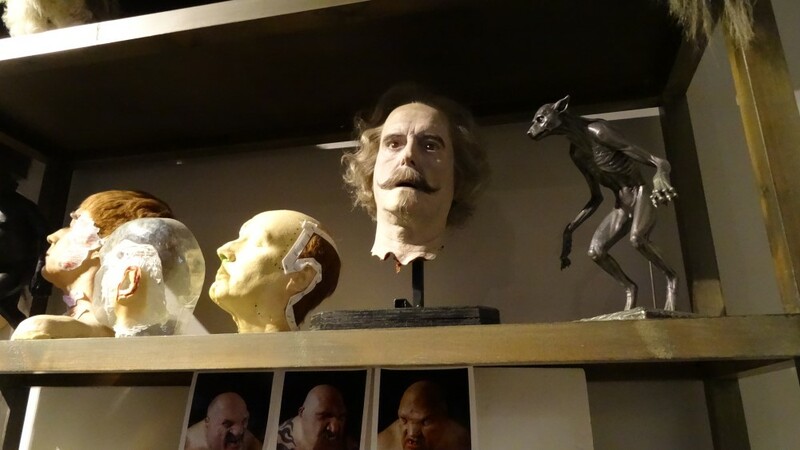 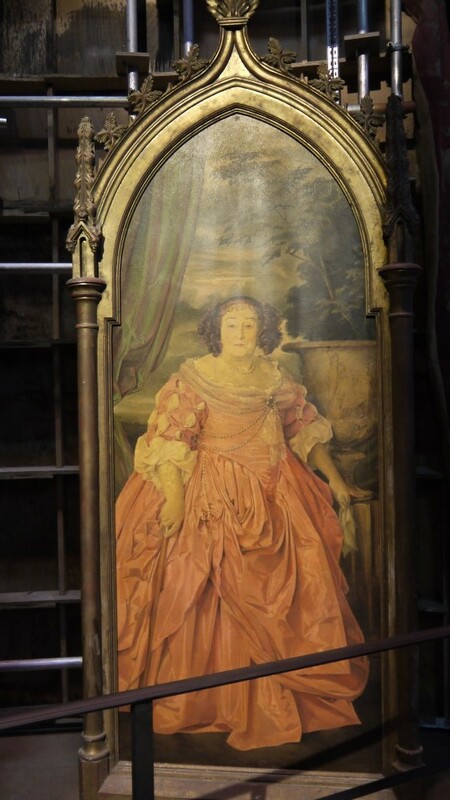 Our Studio Shop features original props from the Harry Potter film series – even the display cabinet of the cash desk is inspired by the Gringott’s Bank set! 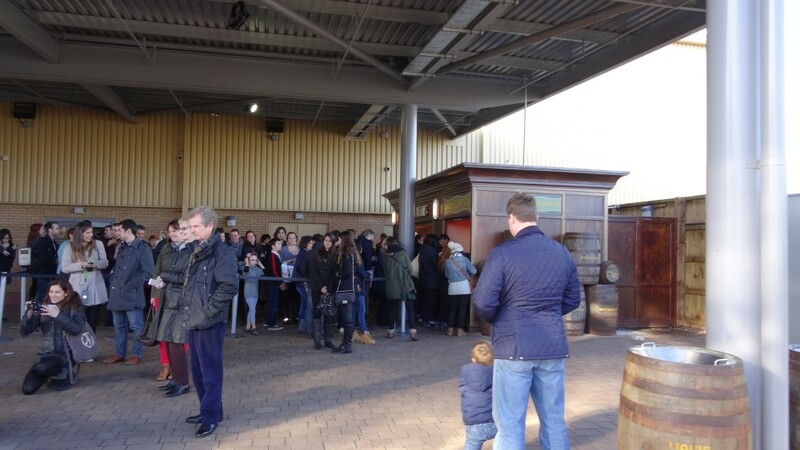 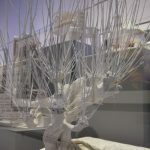 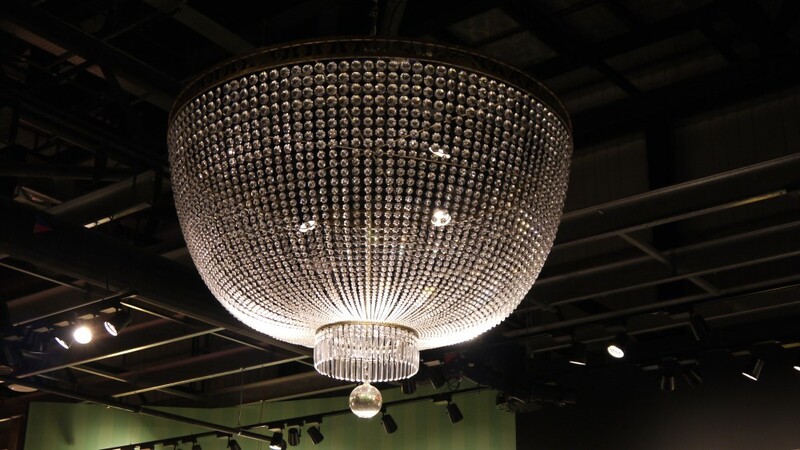 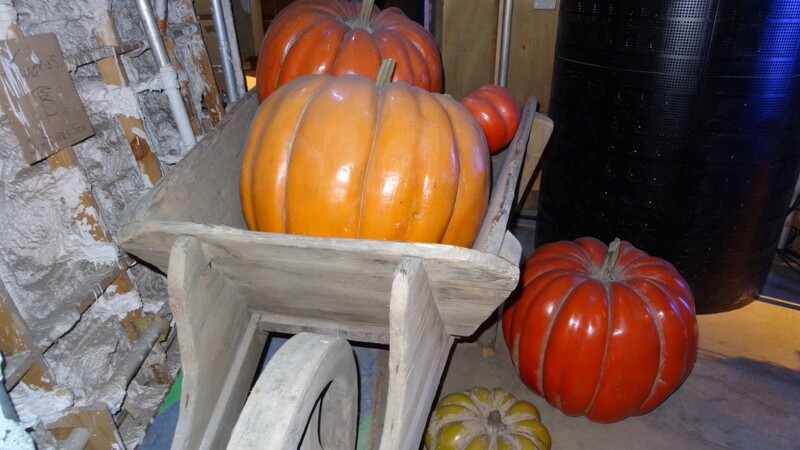 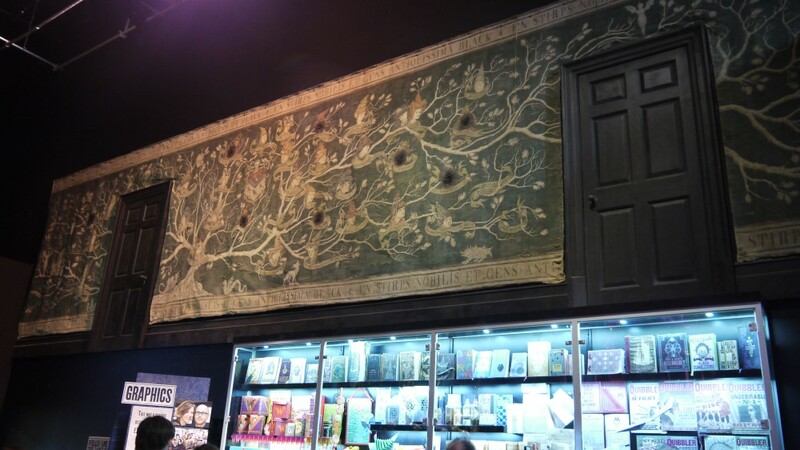 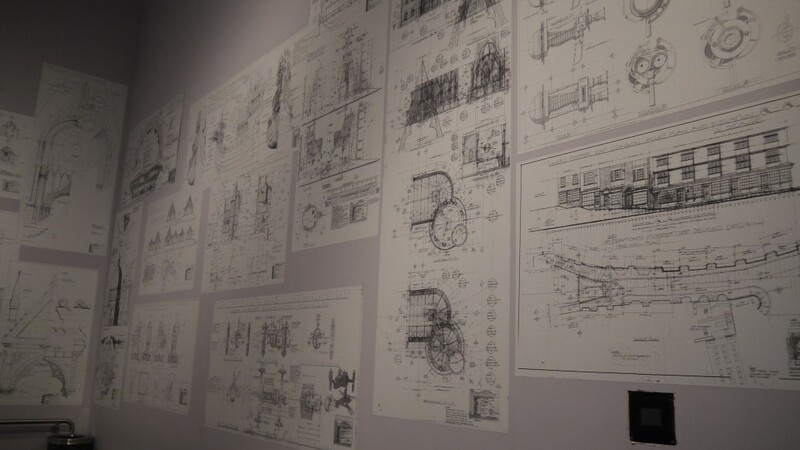 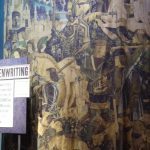 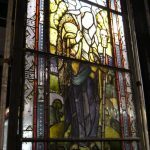 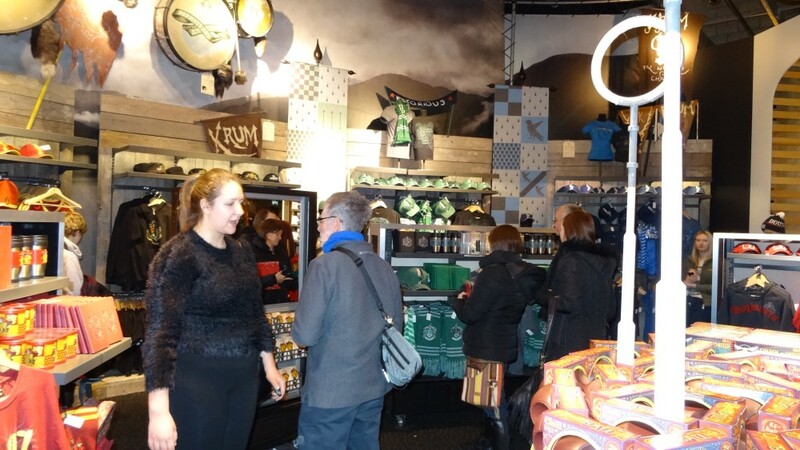 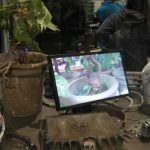 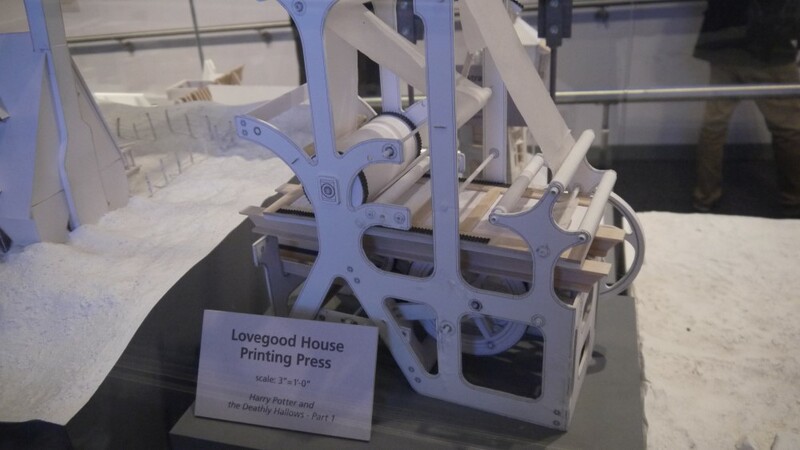 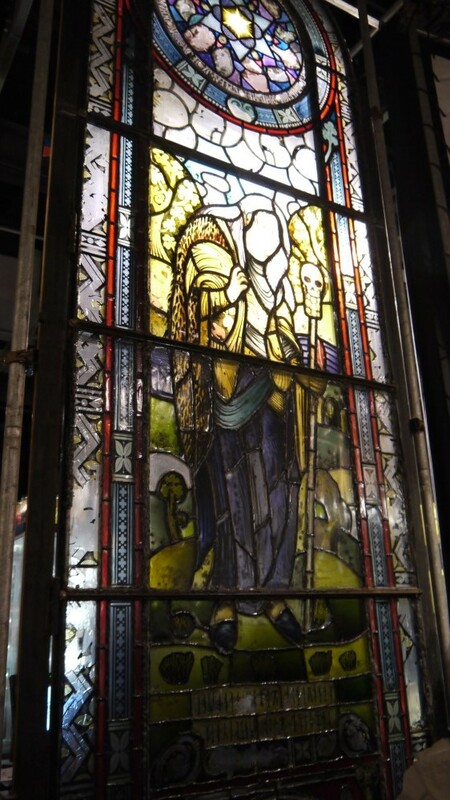 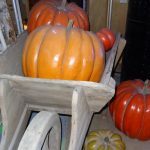 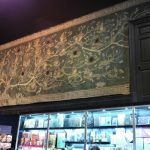 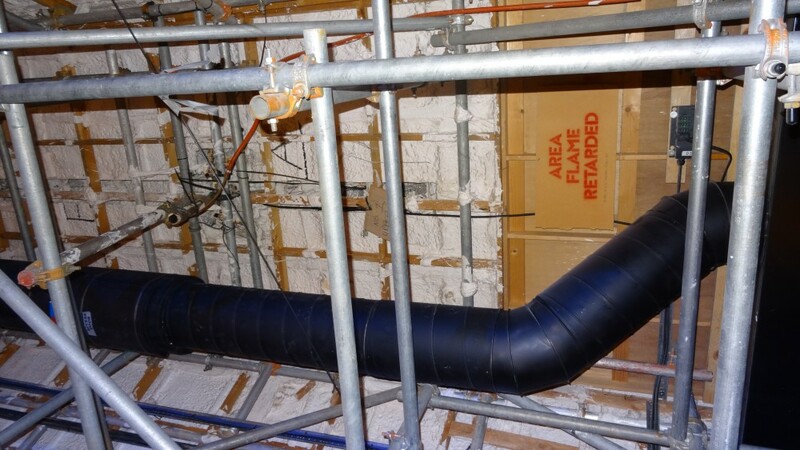 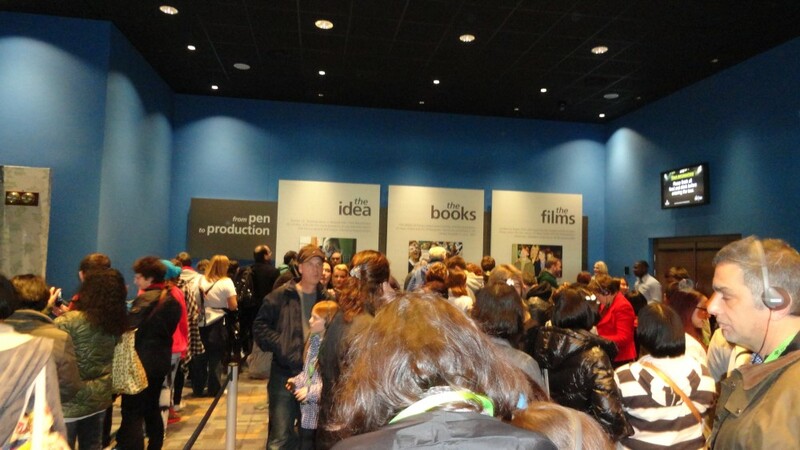 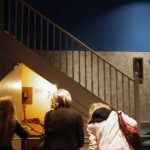 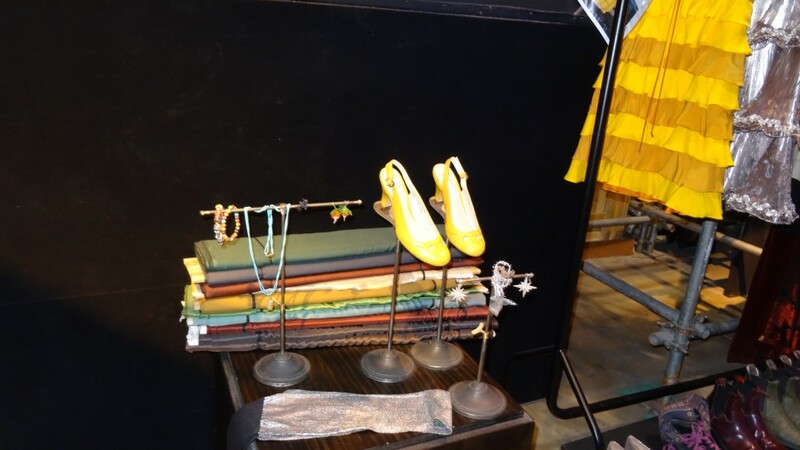 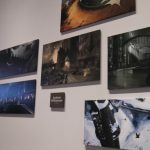 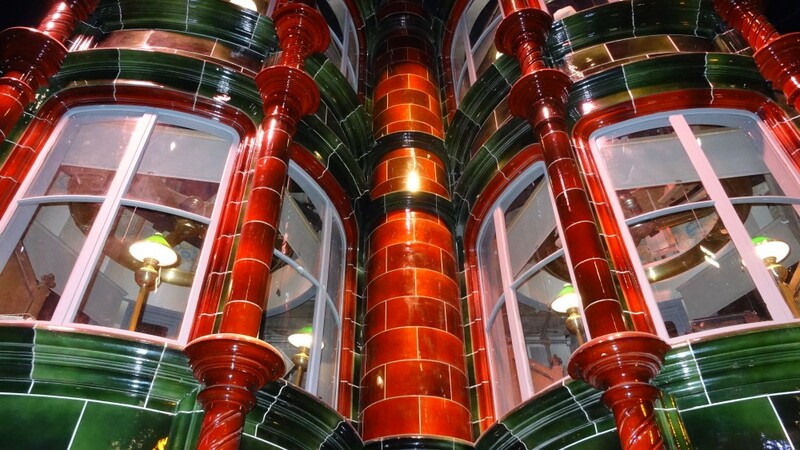 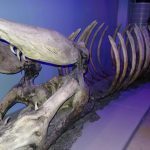 Situated in the entrance lobby, the shop is accessible before or after your tour.